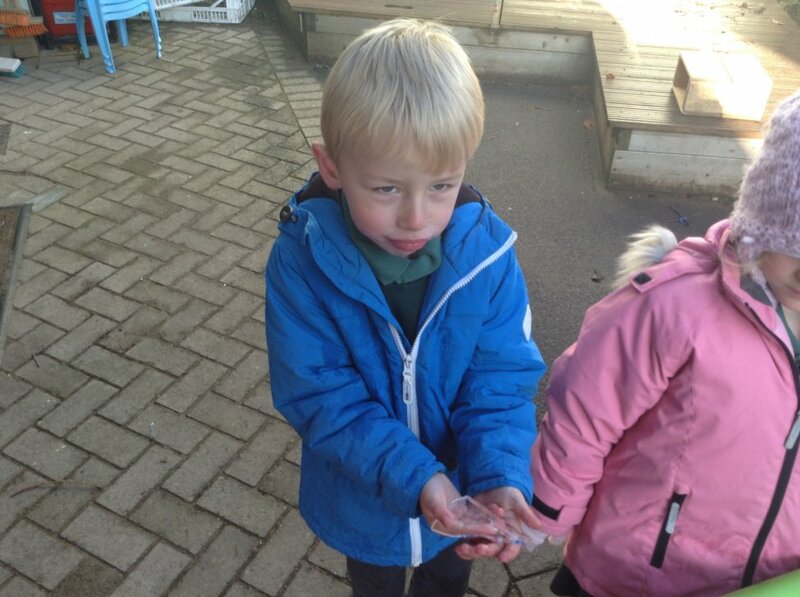 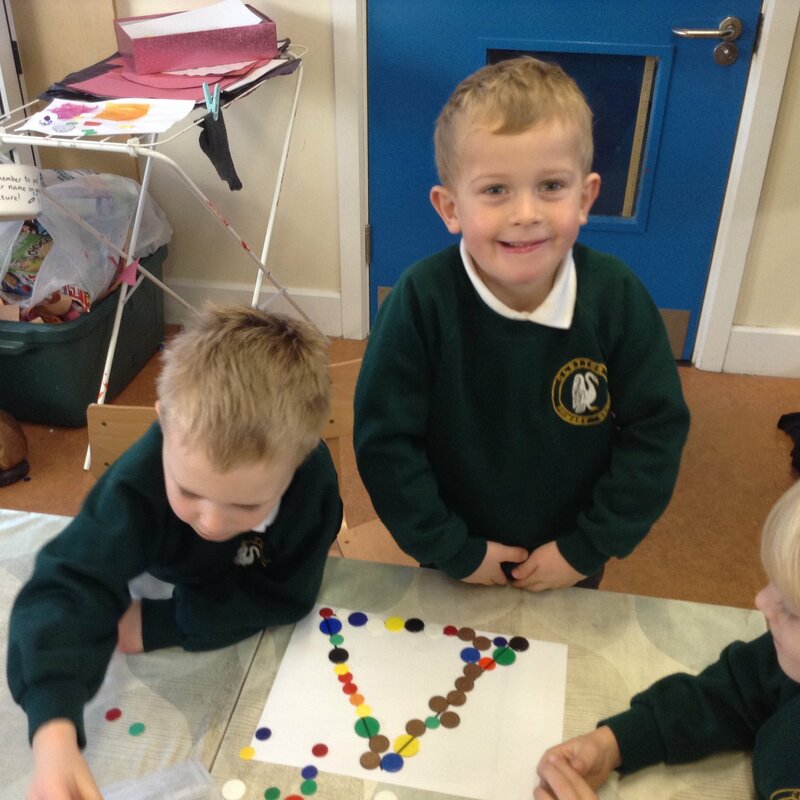 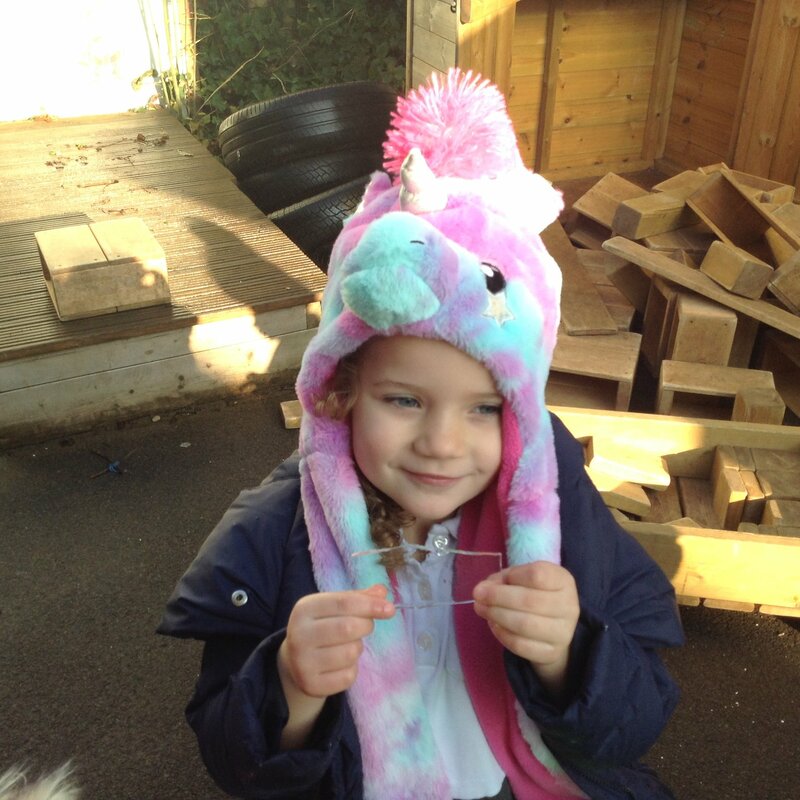 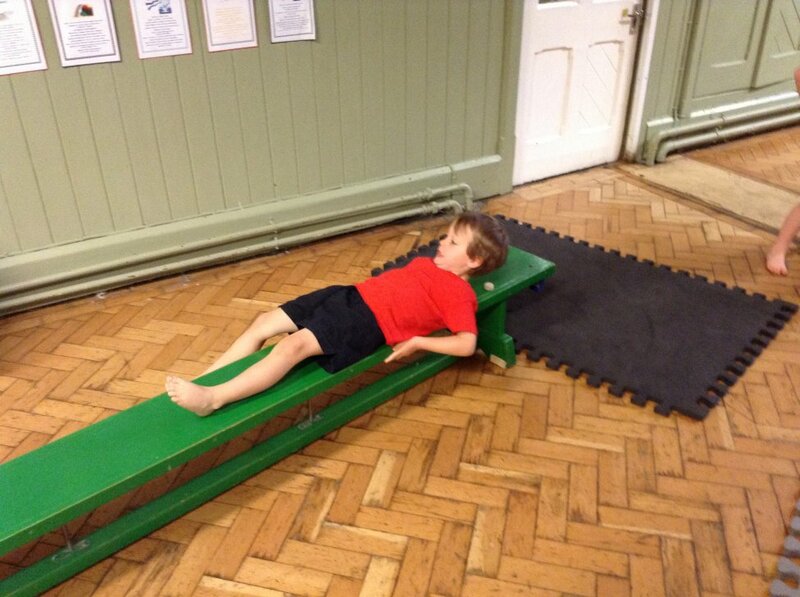 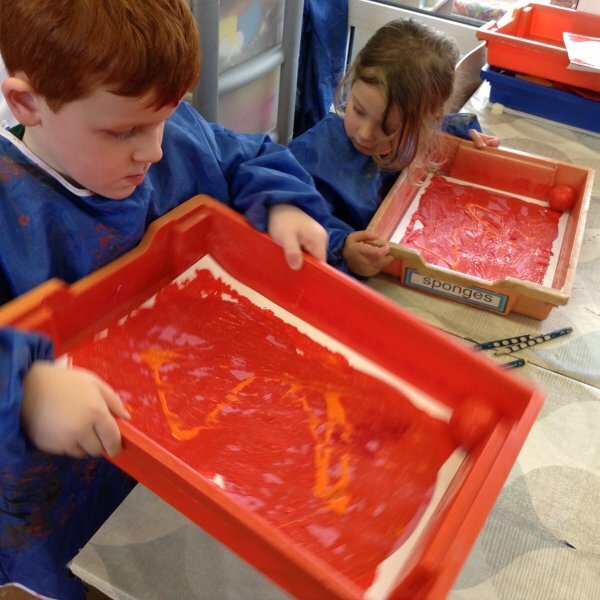 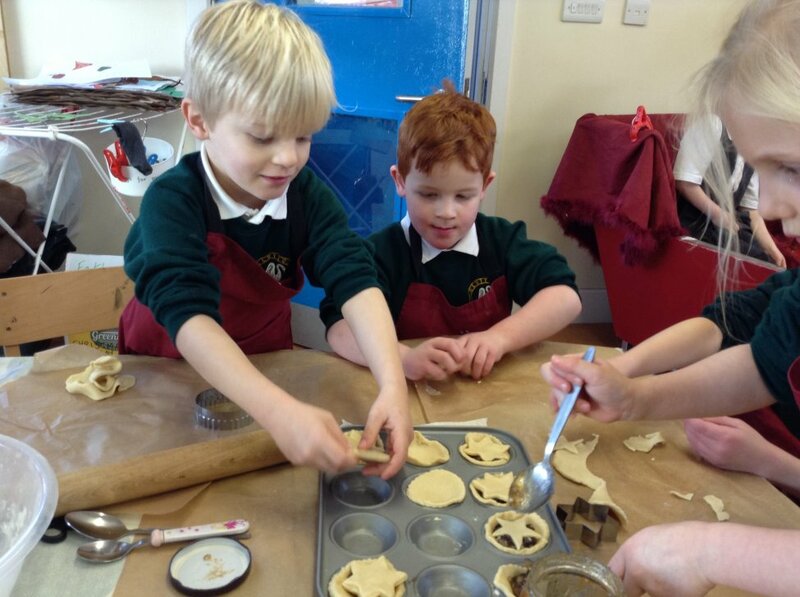 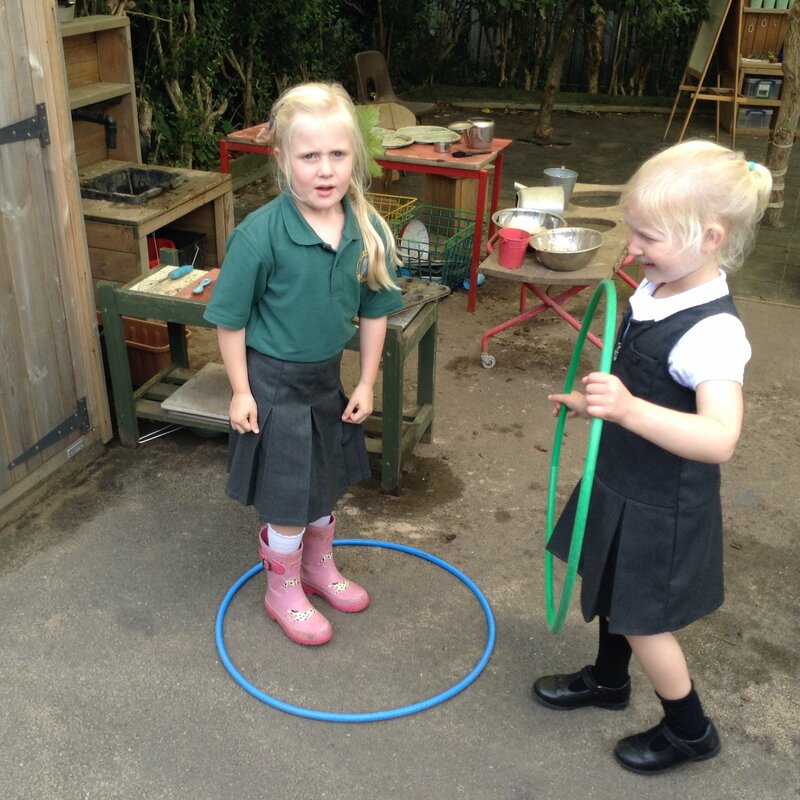 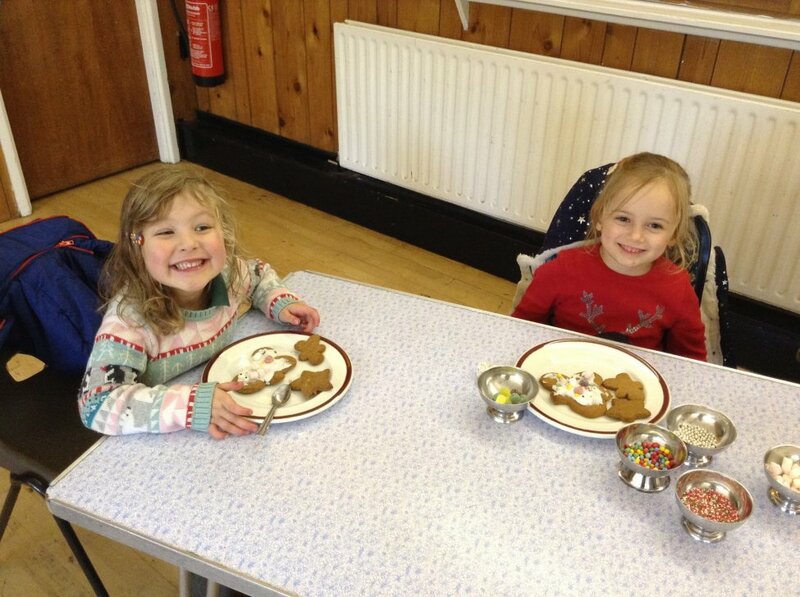 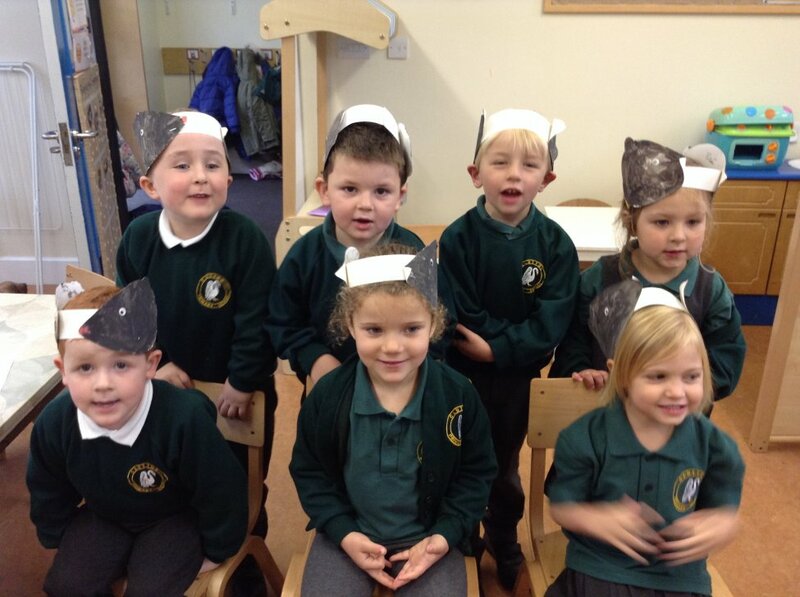 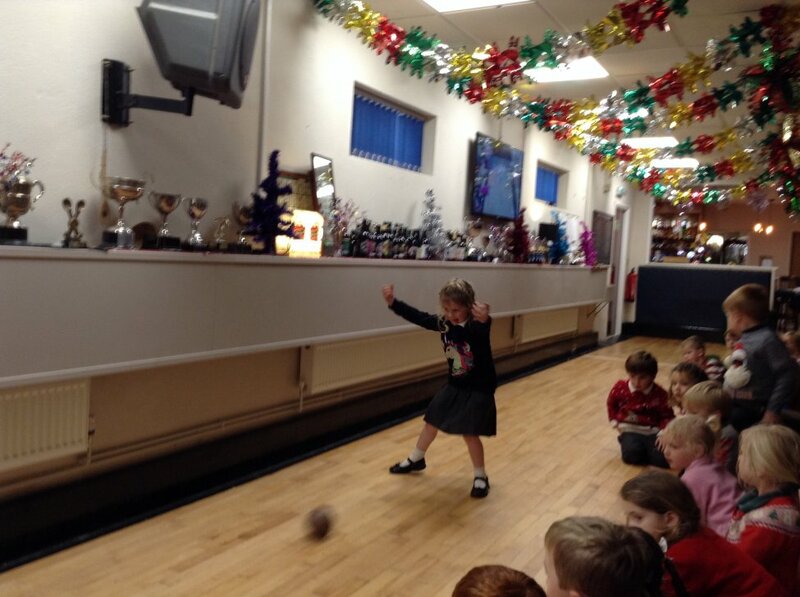 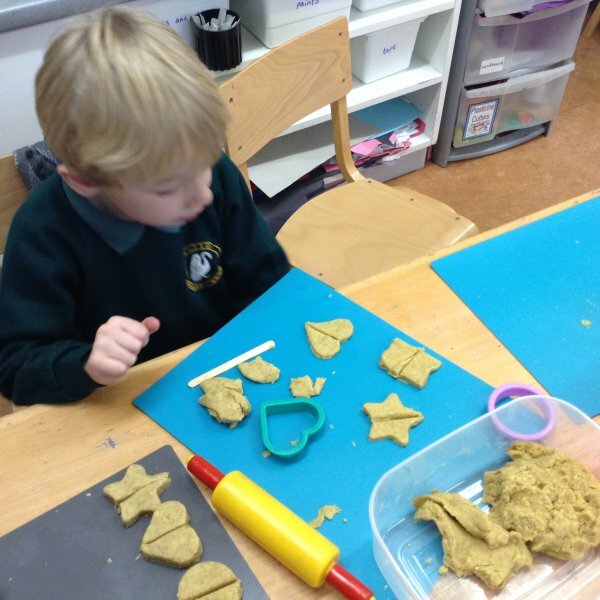 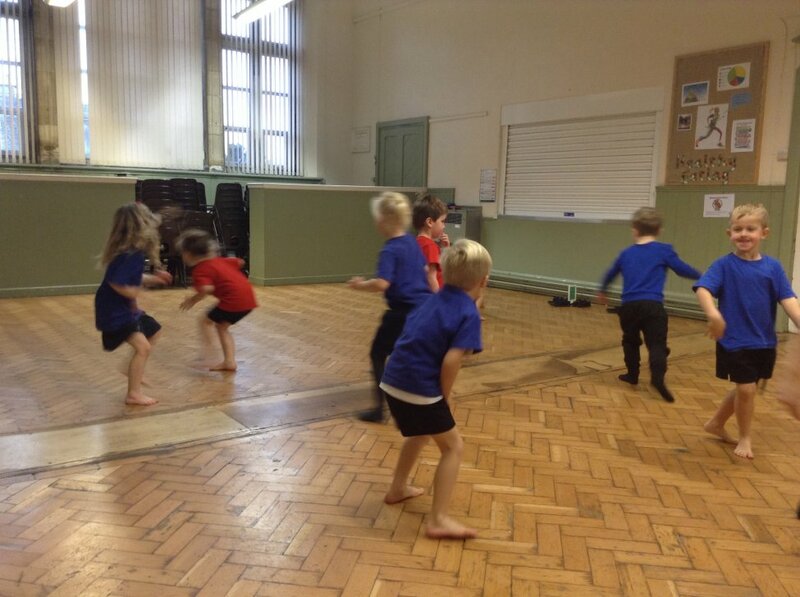 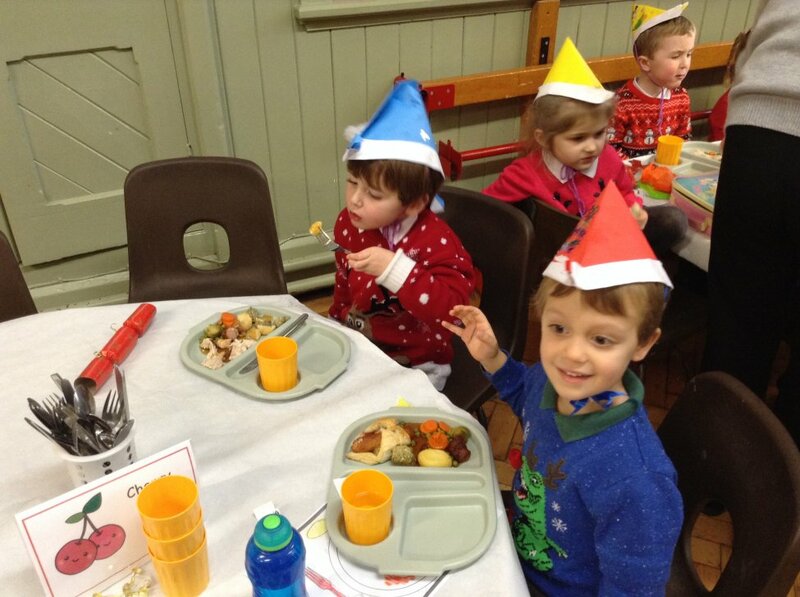 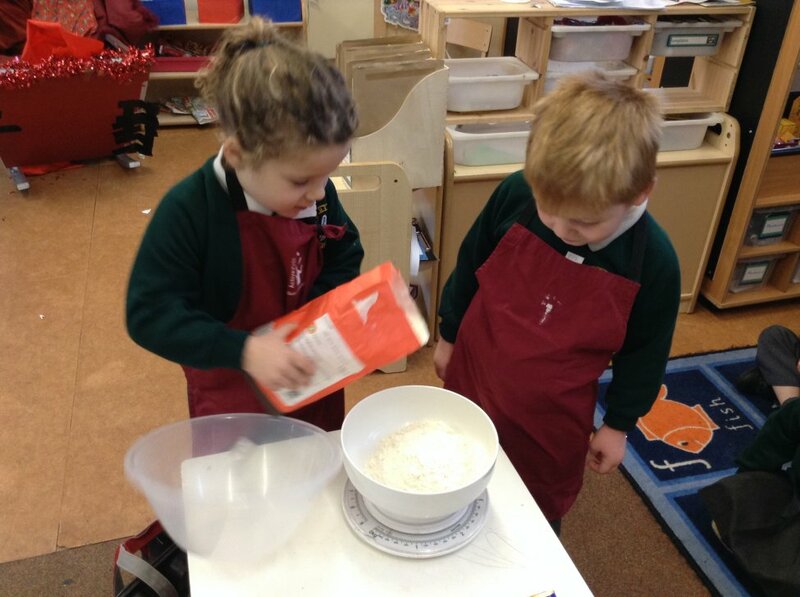 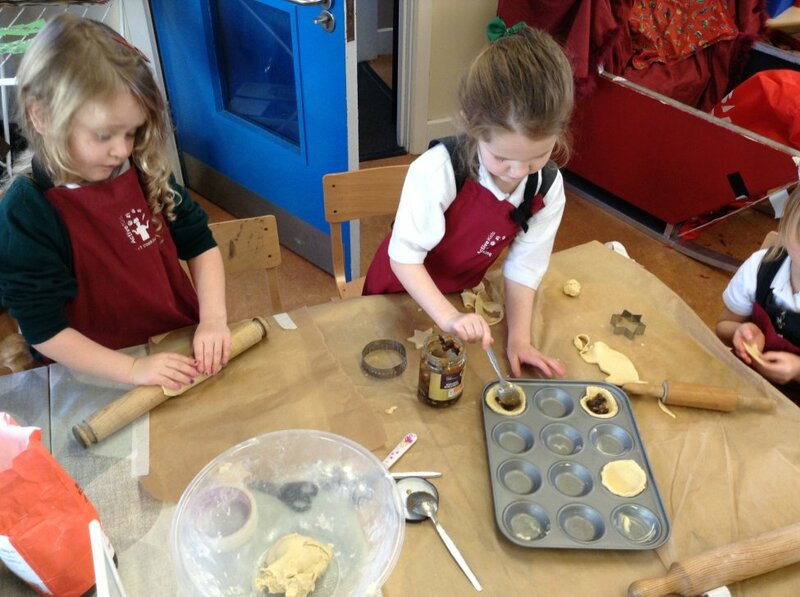 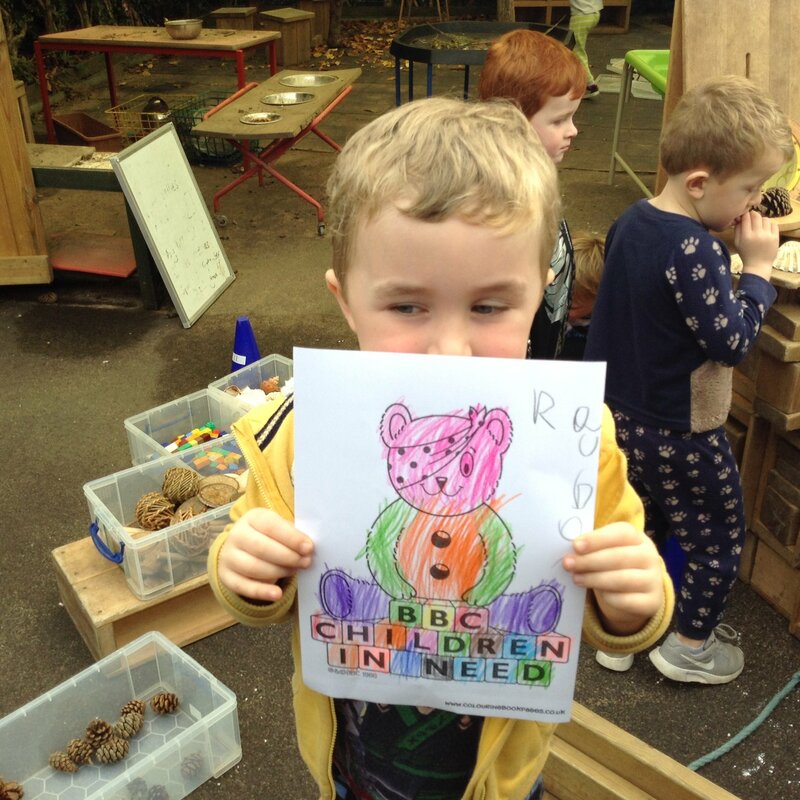 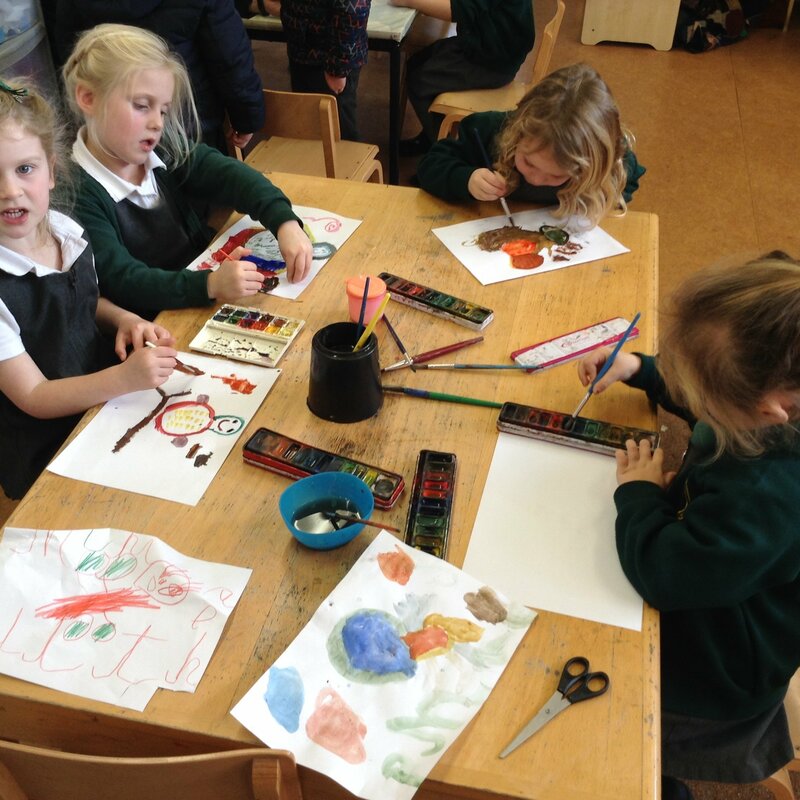 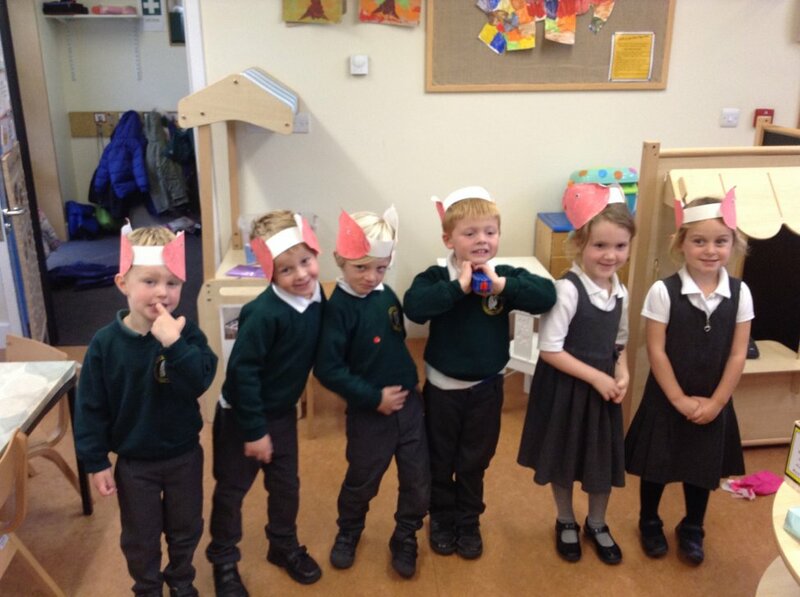 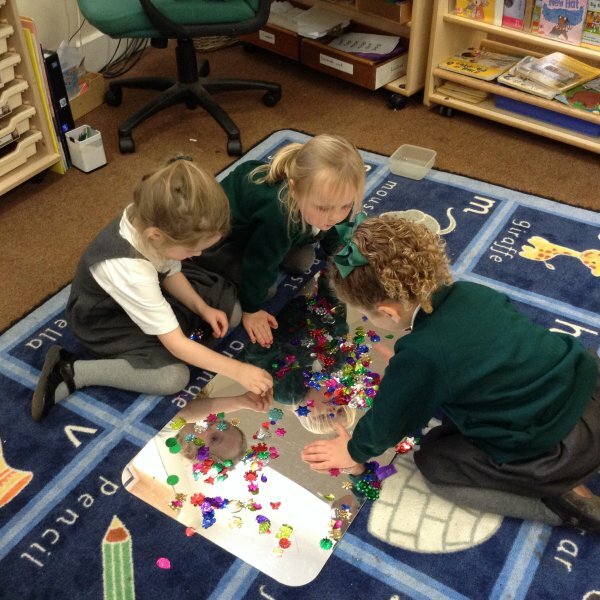 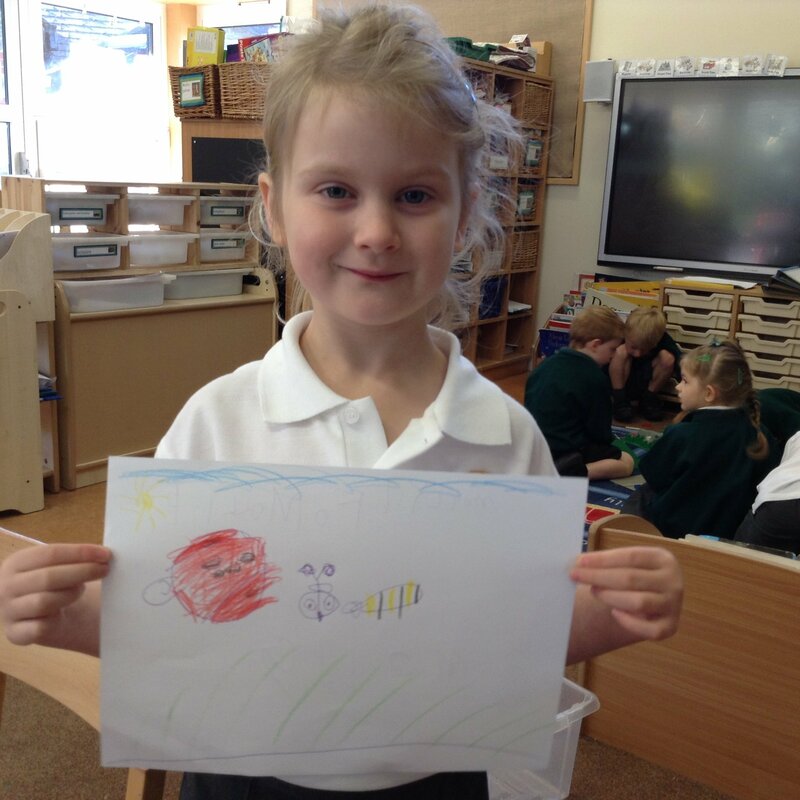 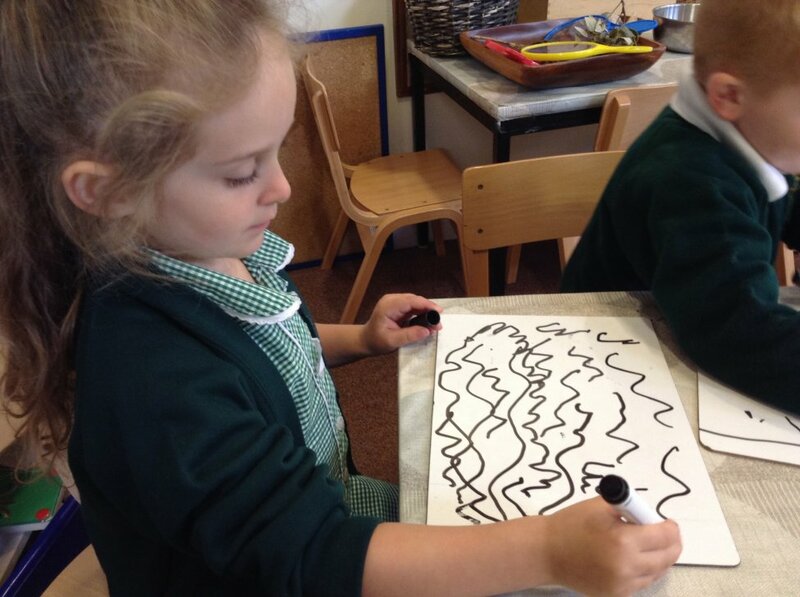 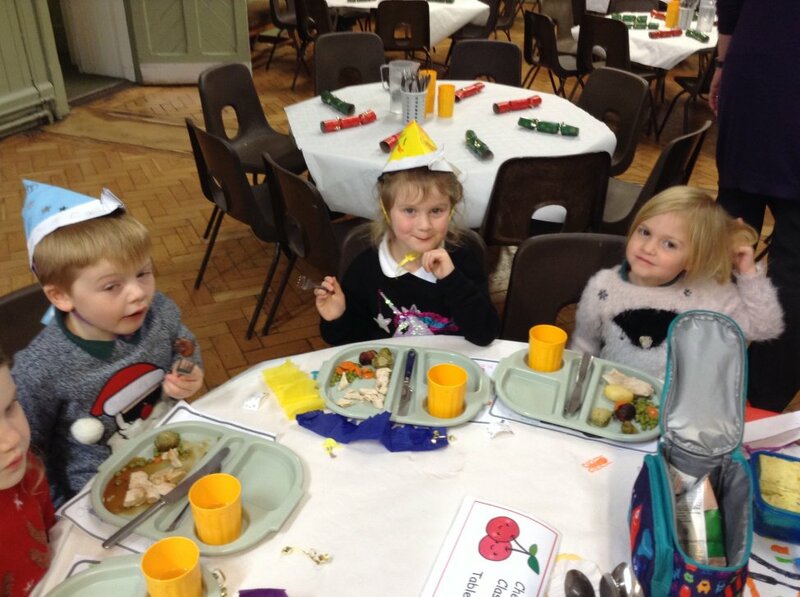 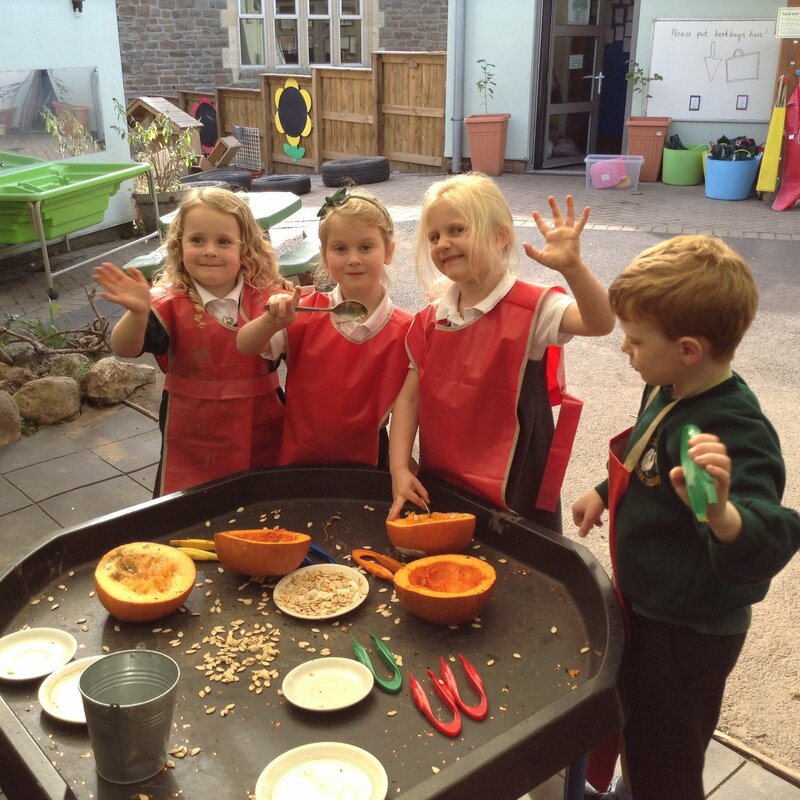 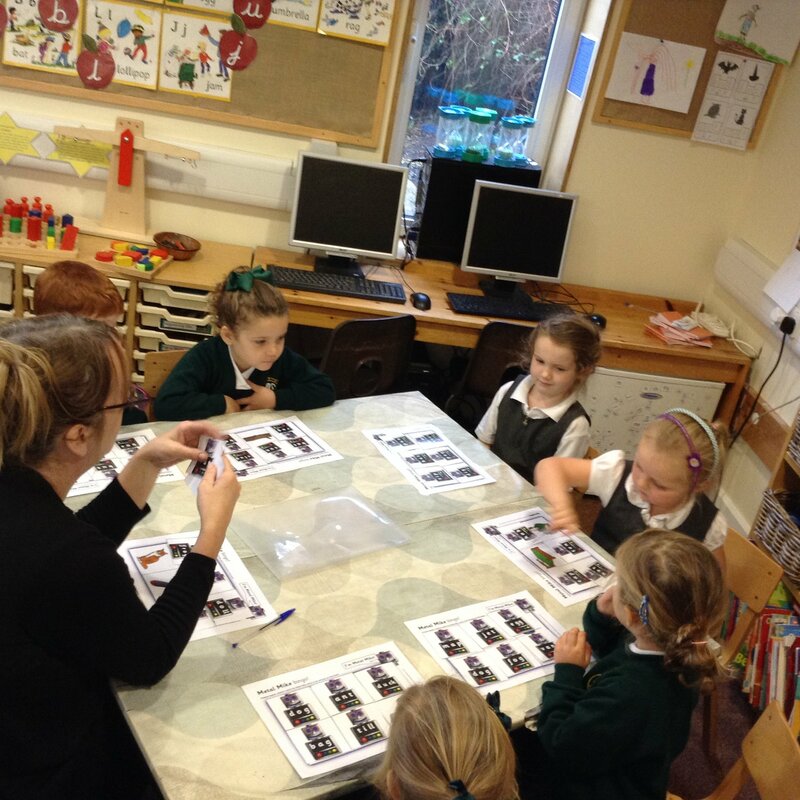 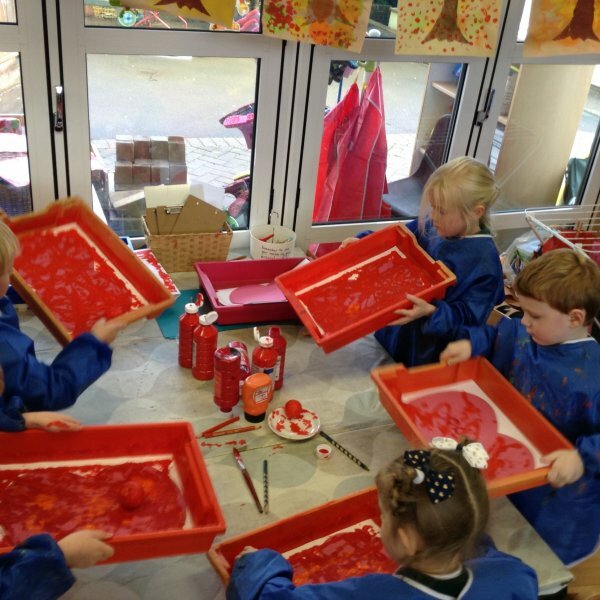 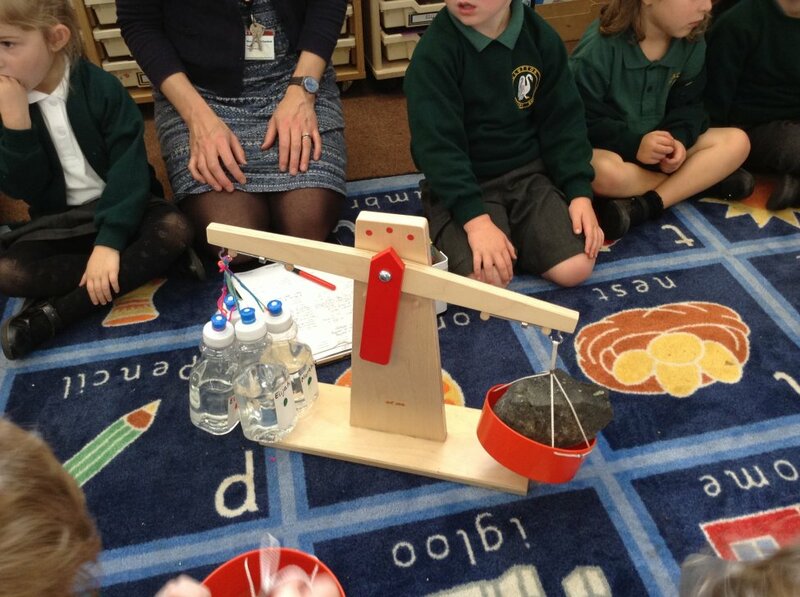 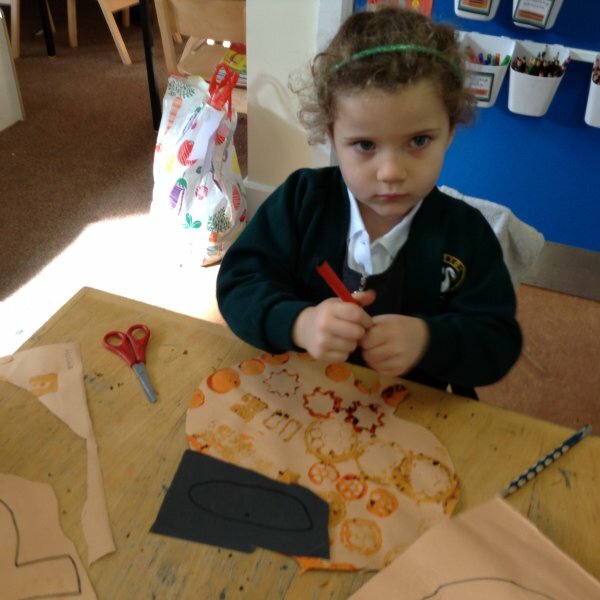 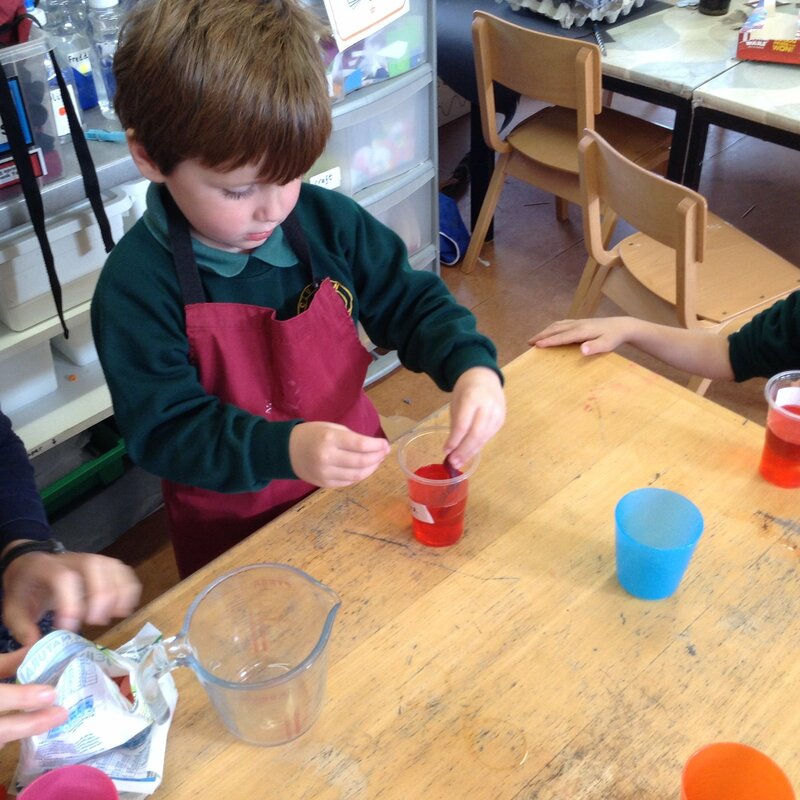 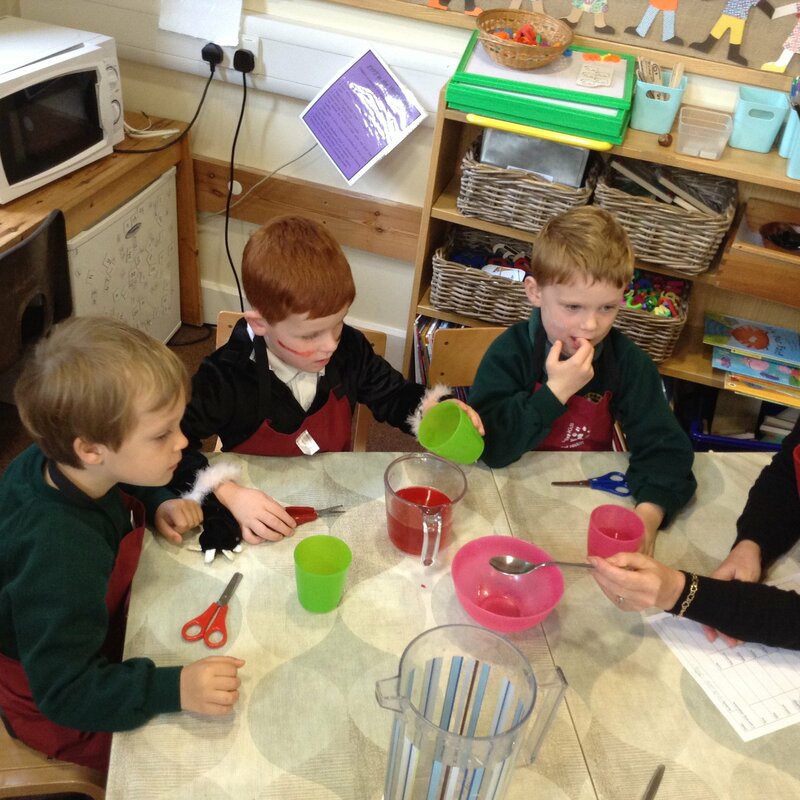 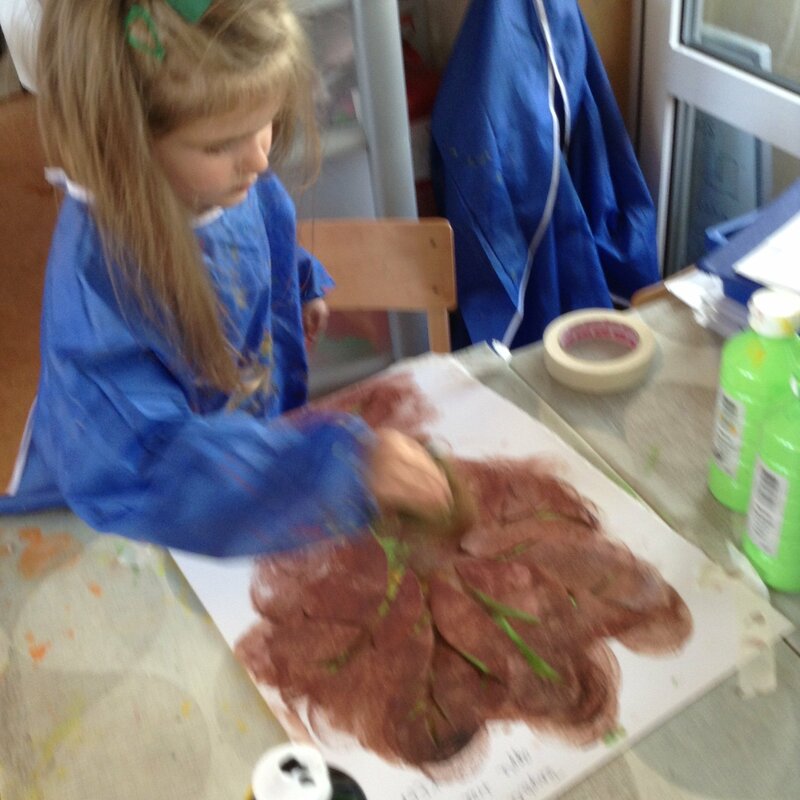 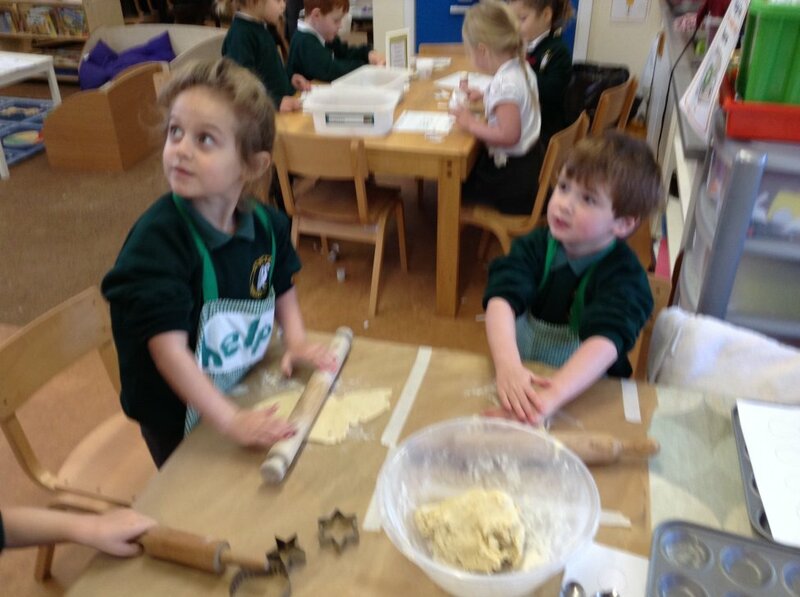 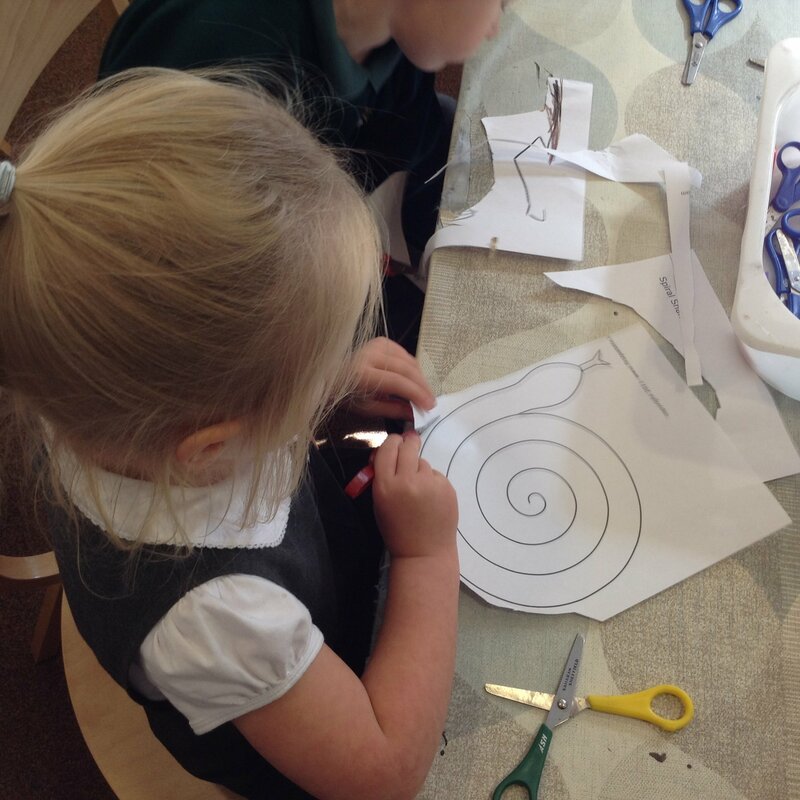 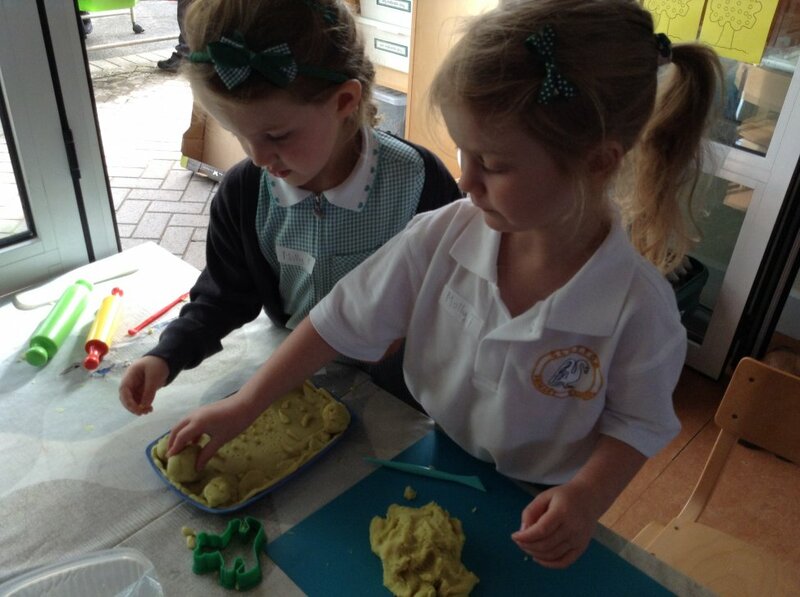 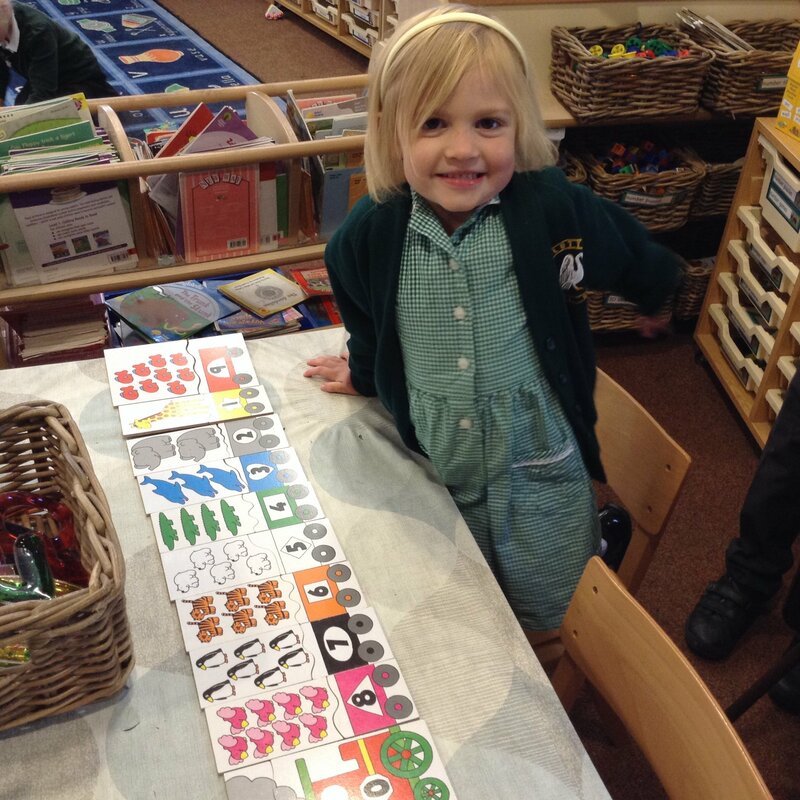 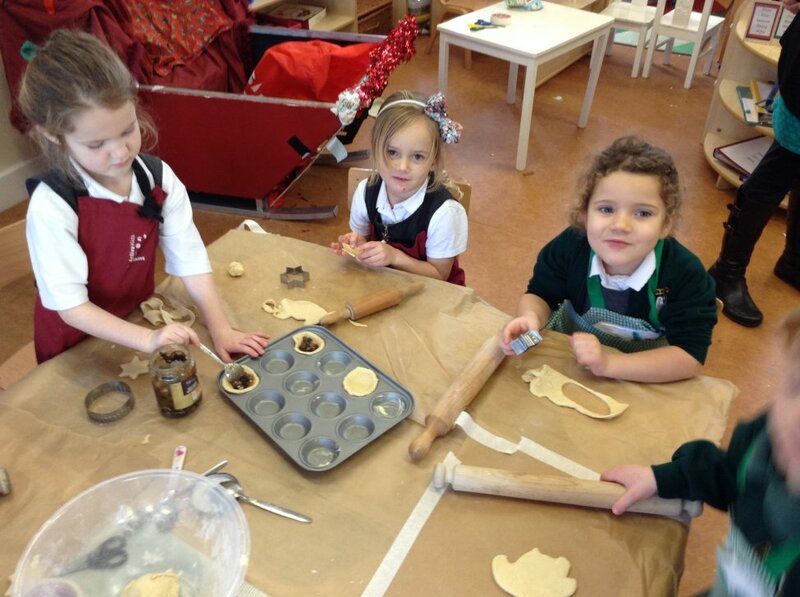 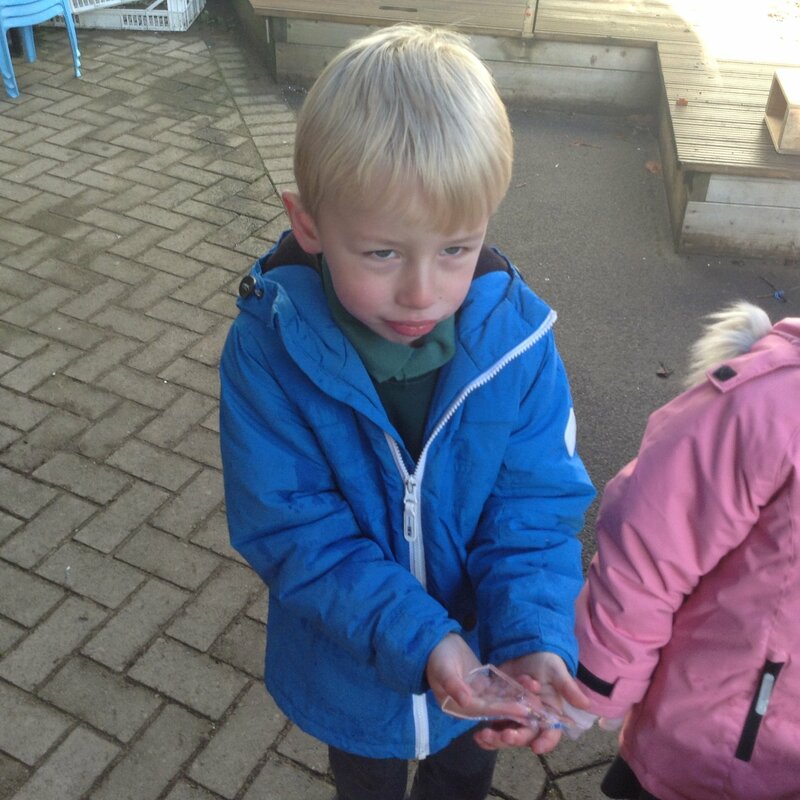 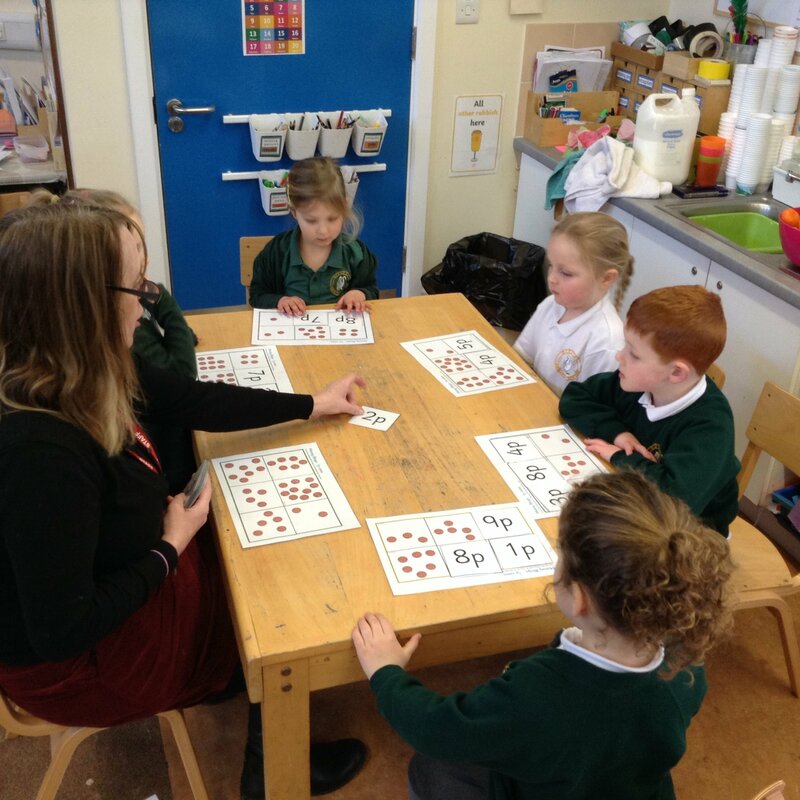 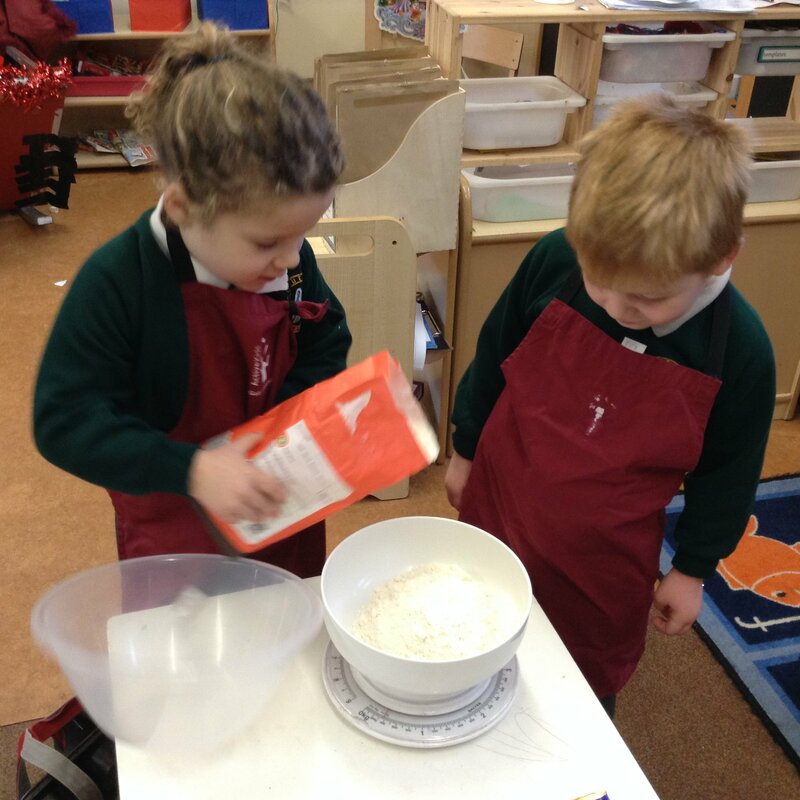 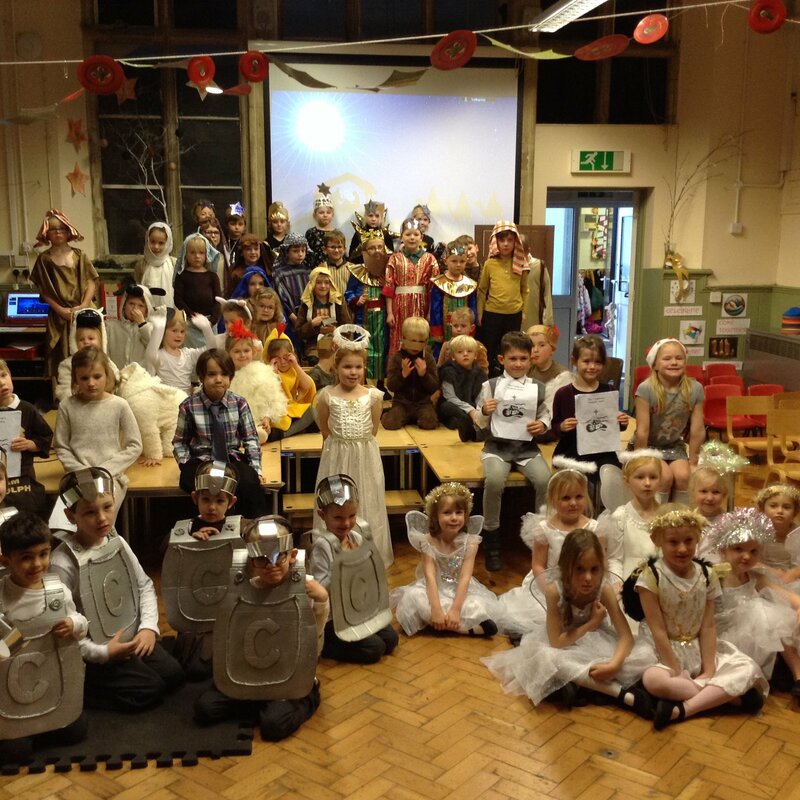 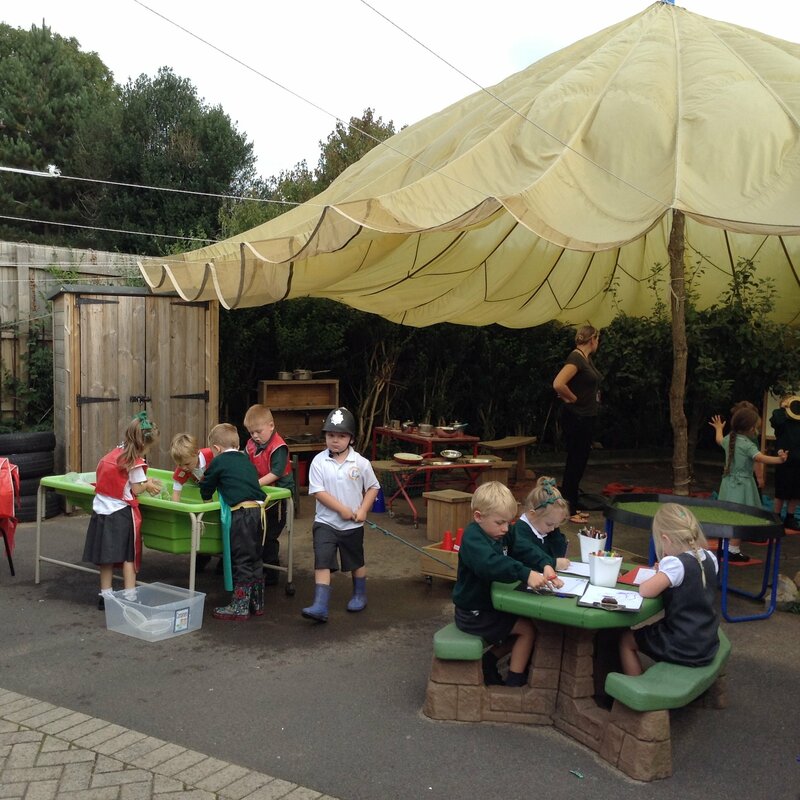 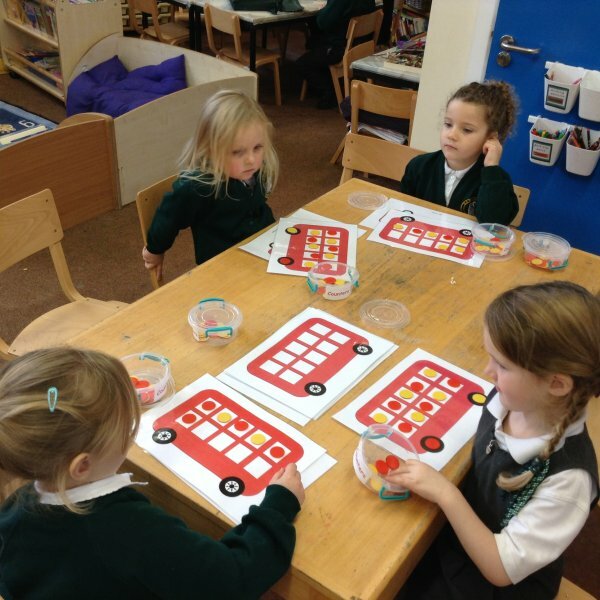 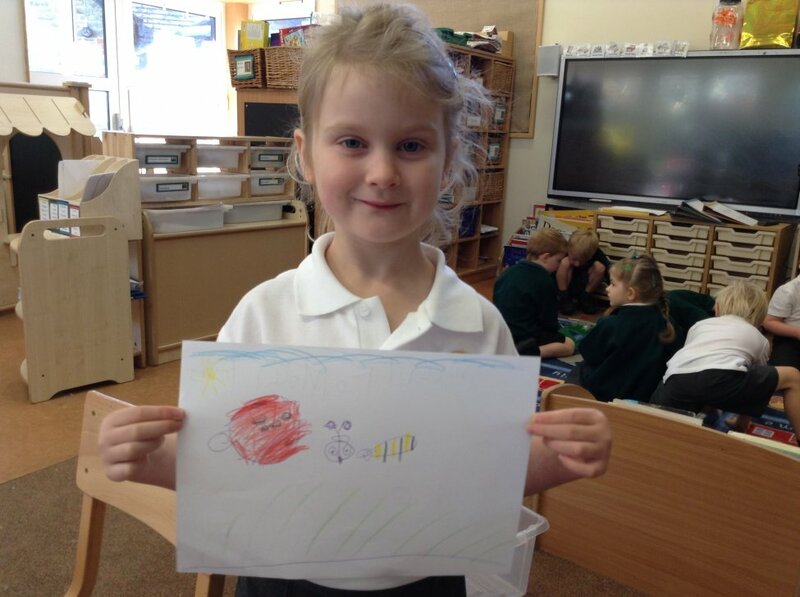 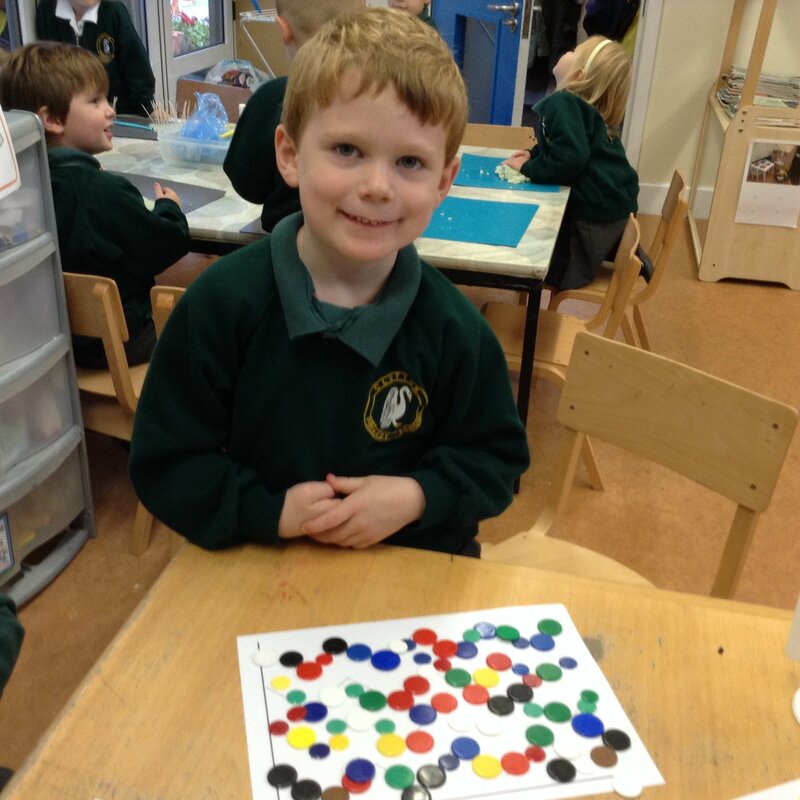 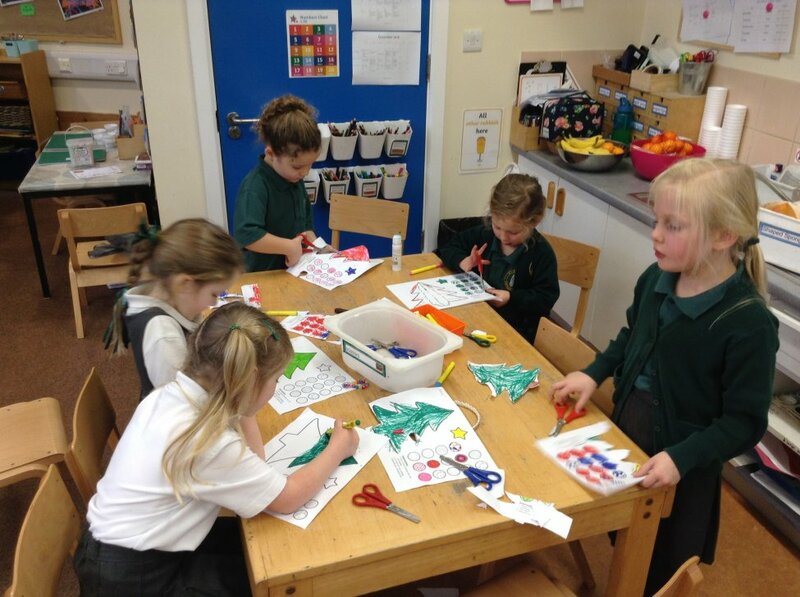 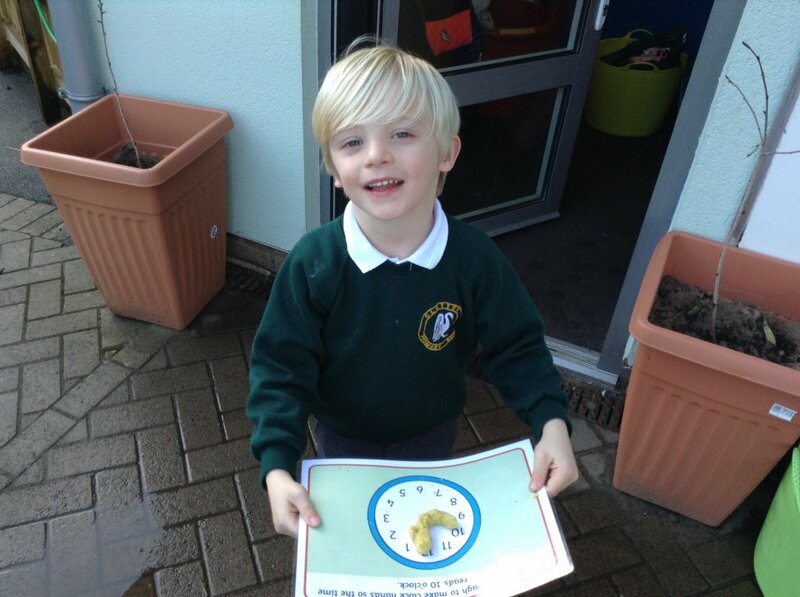 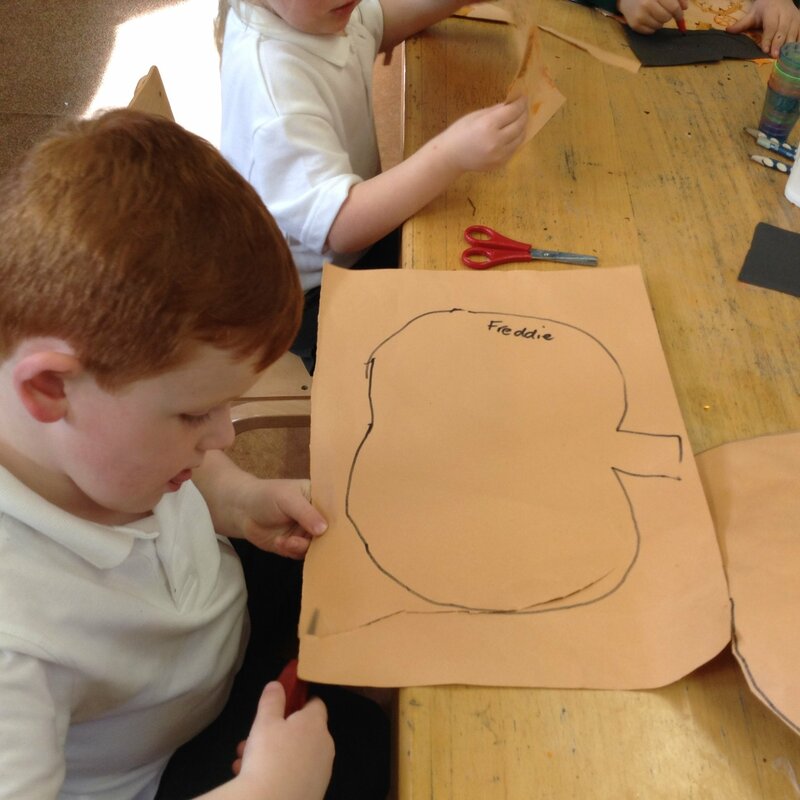 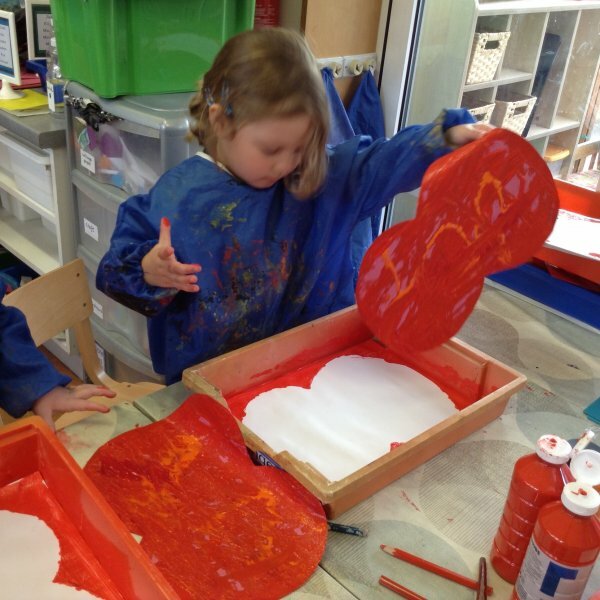 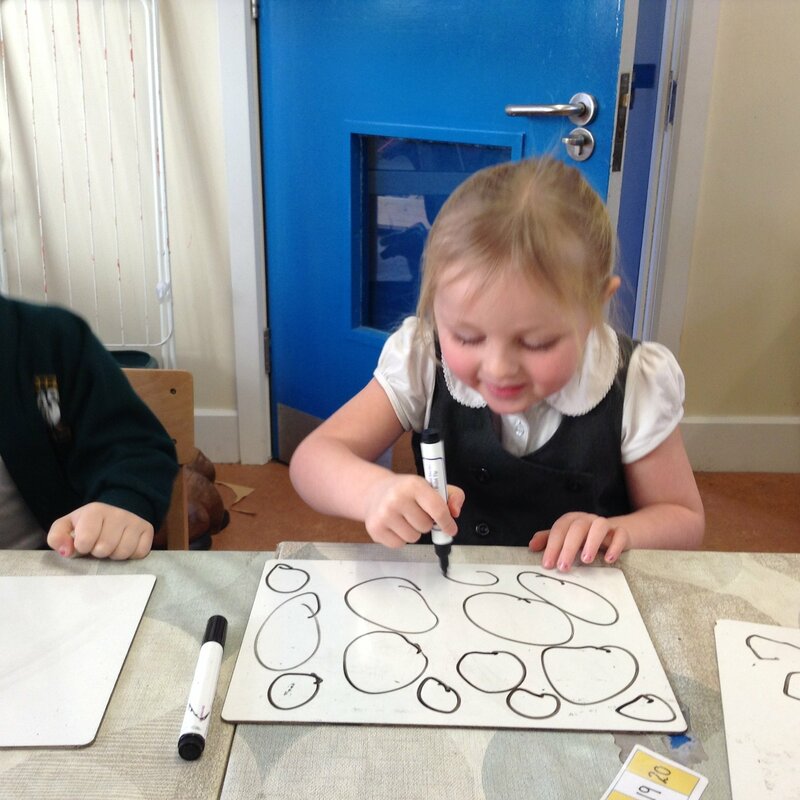 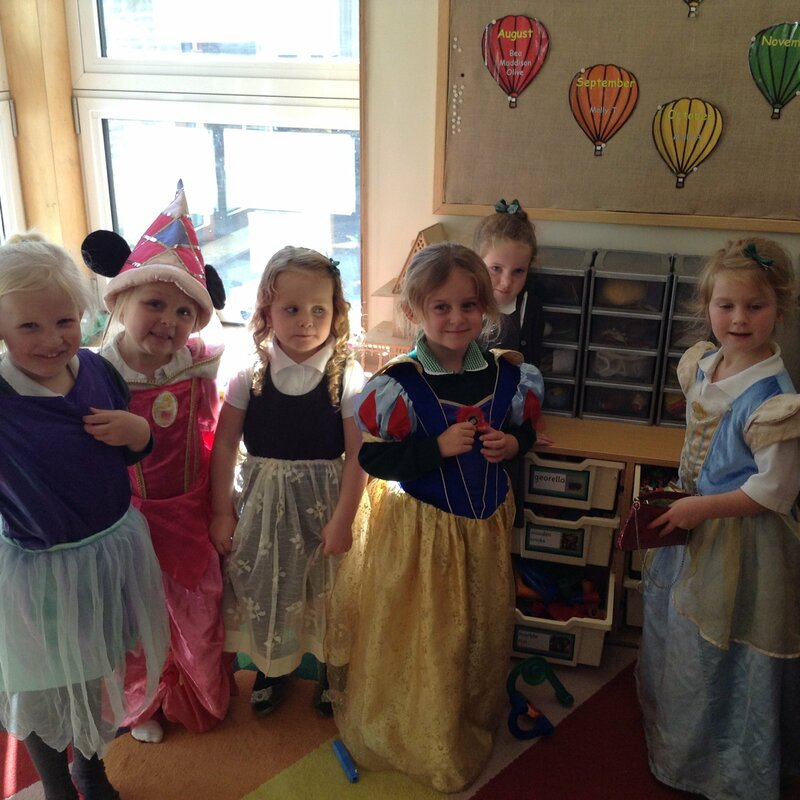 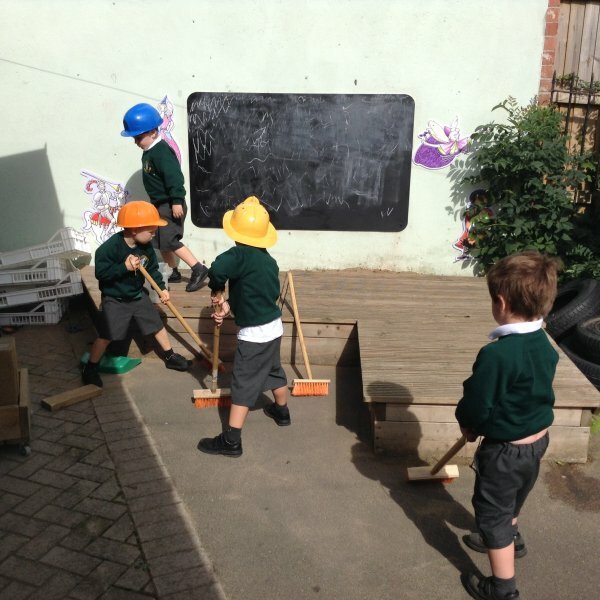 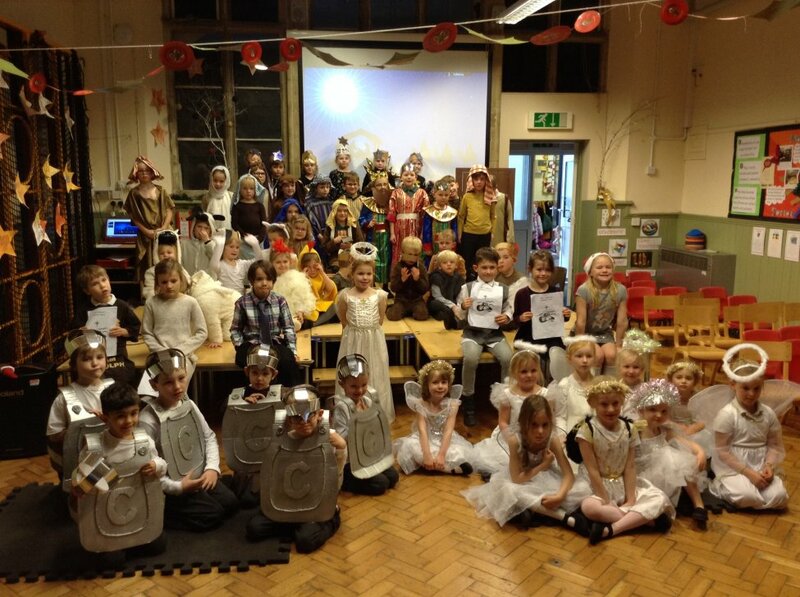 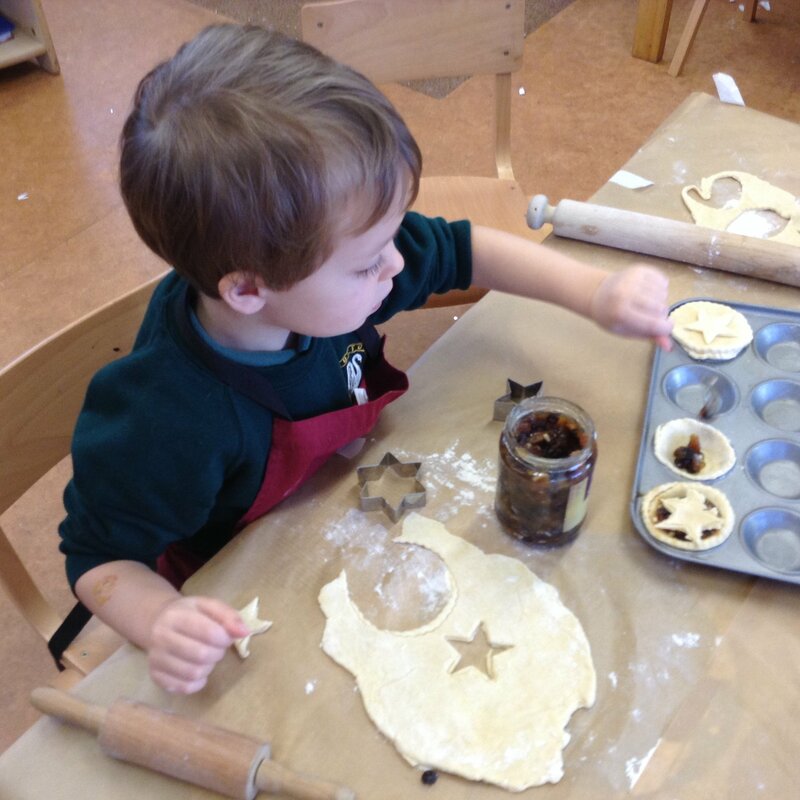 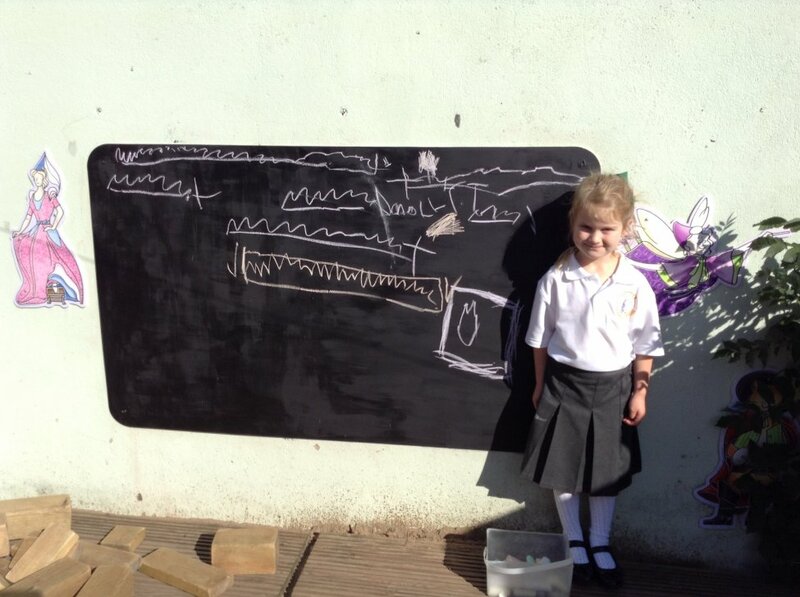 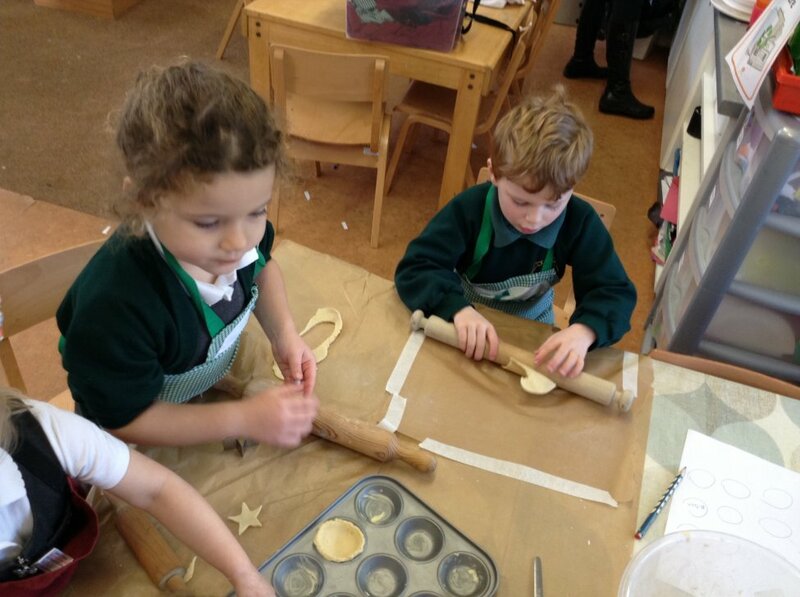 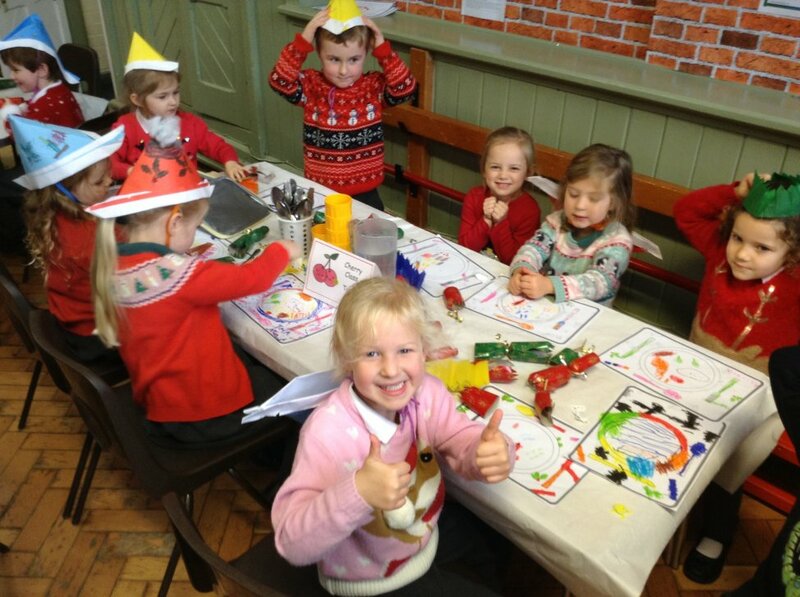 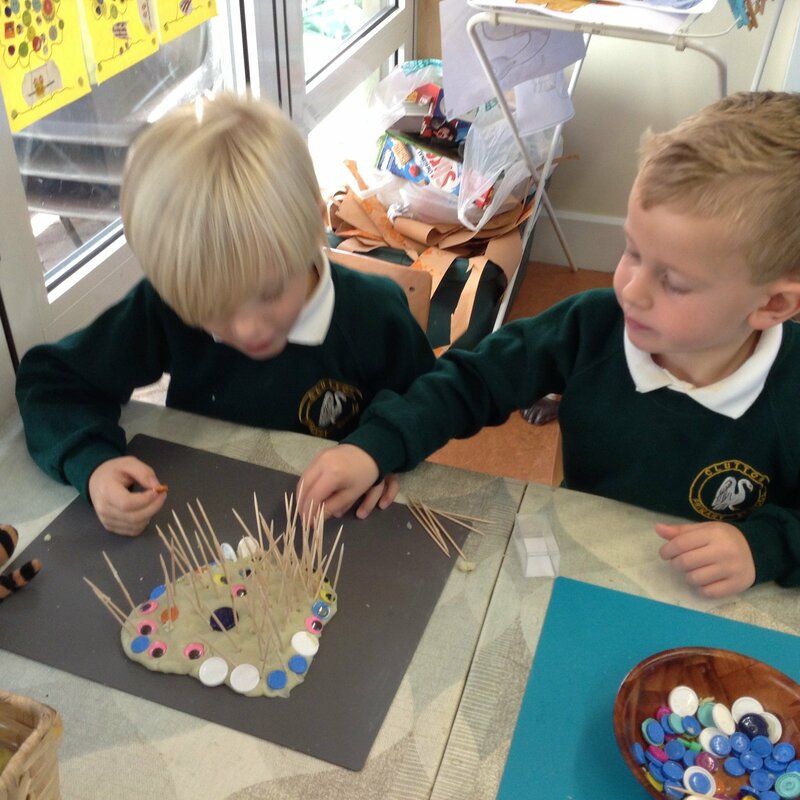 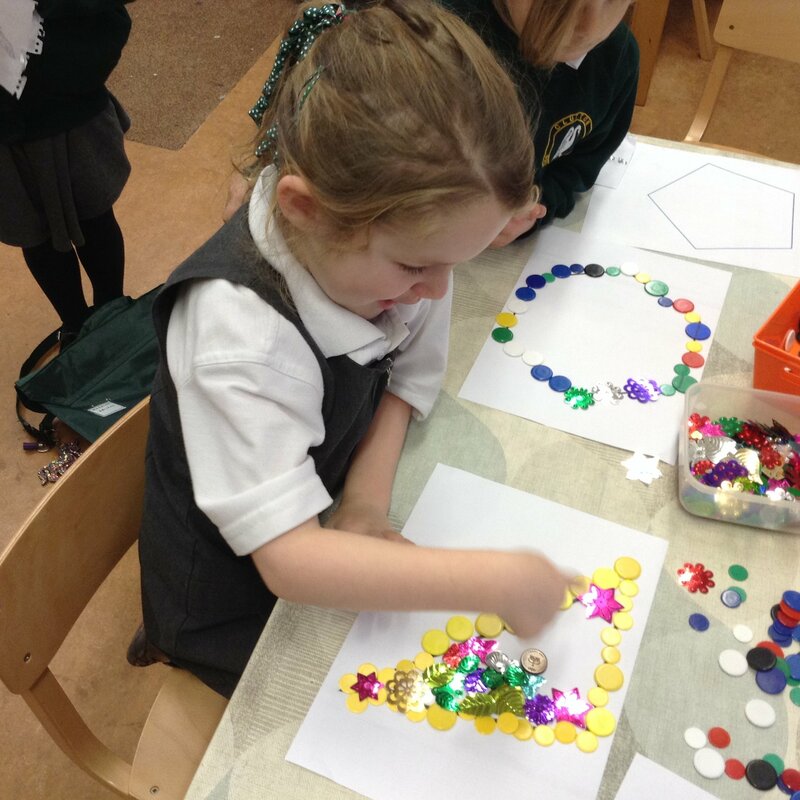 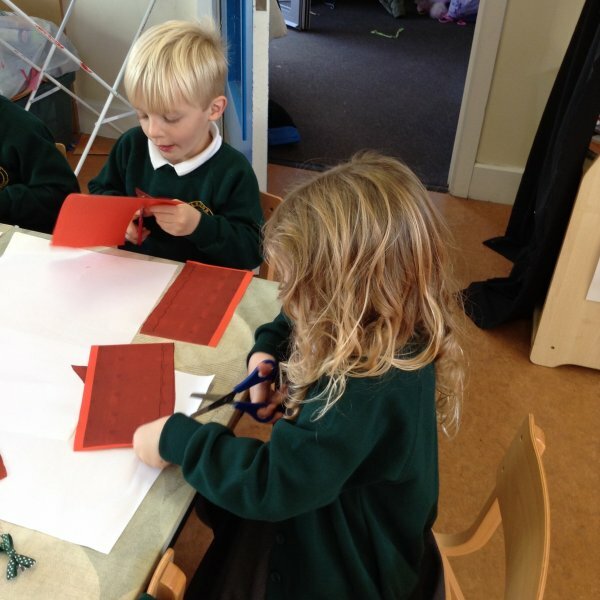 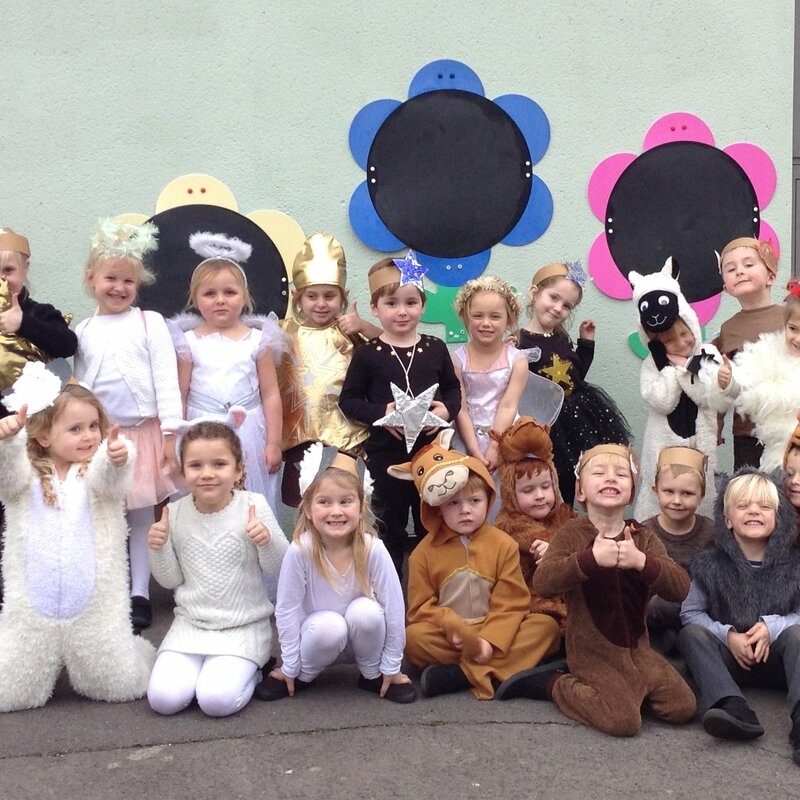 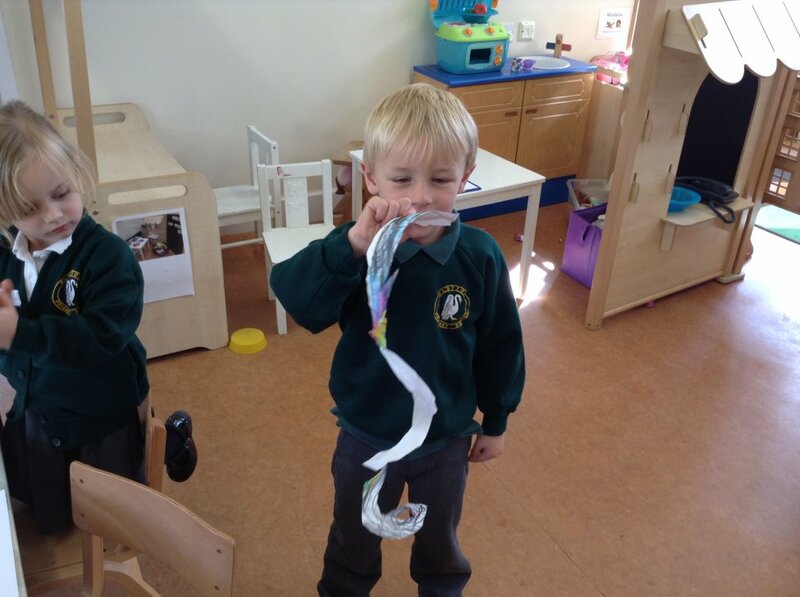 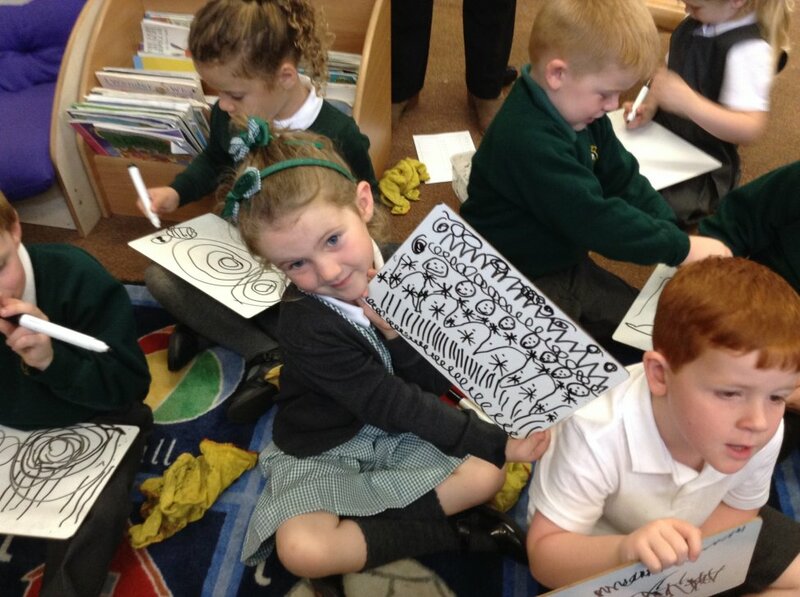 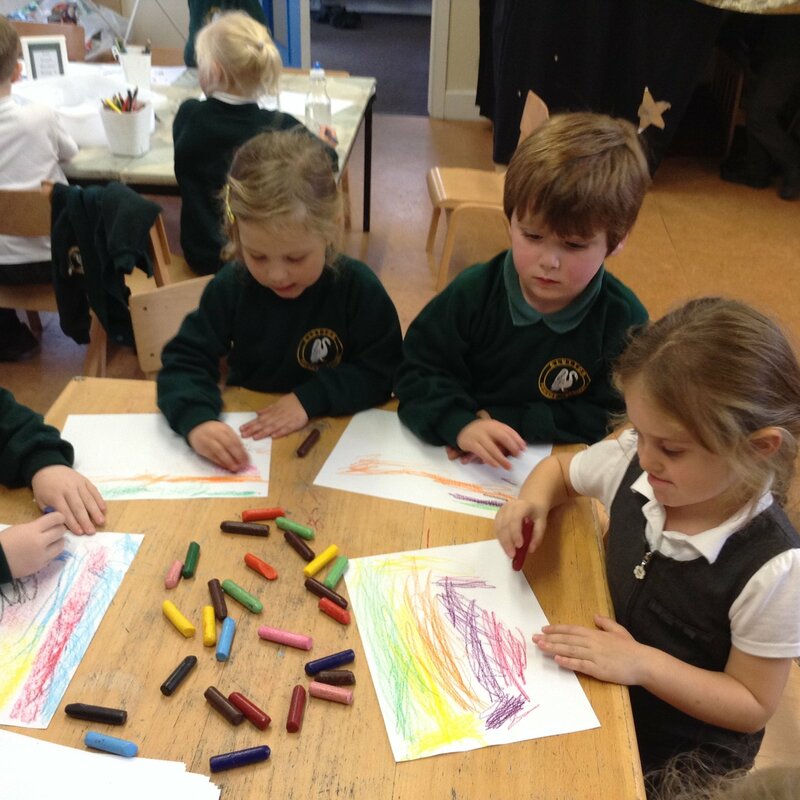 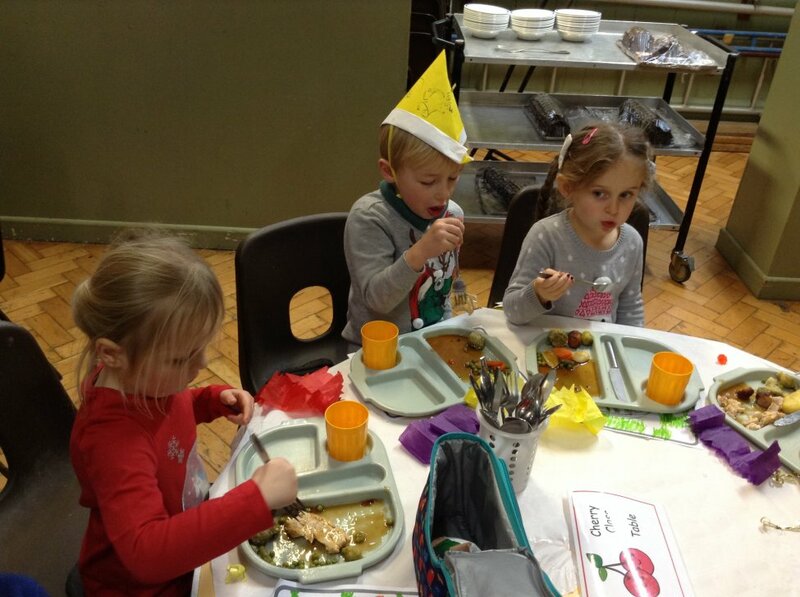 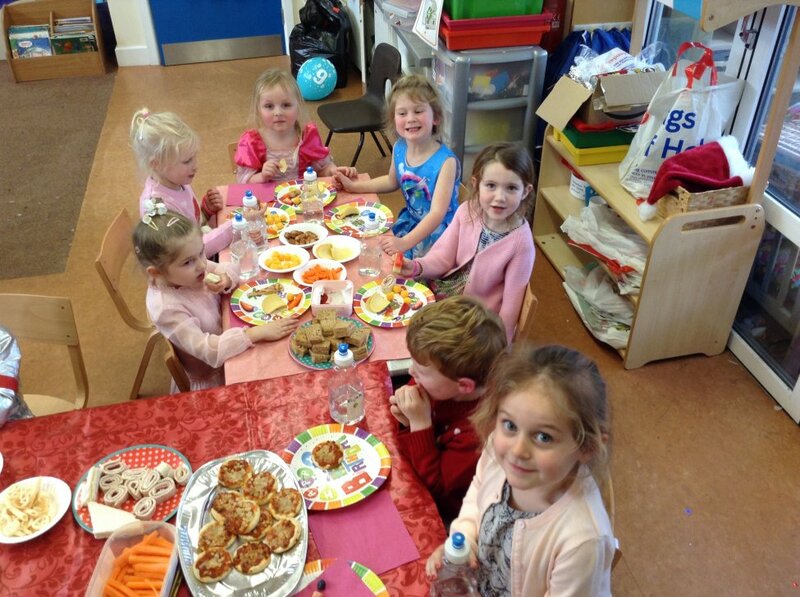 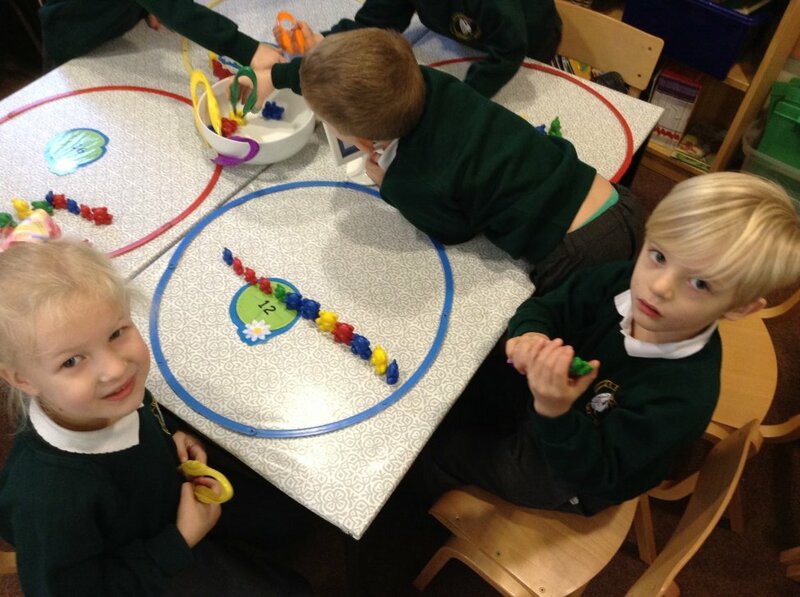 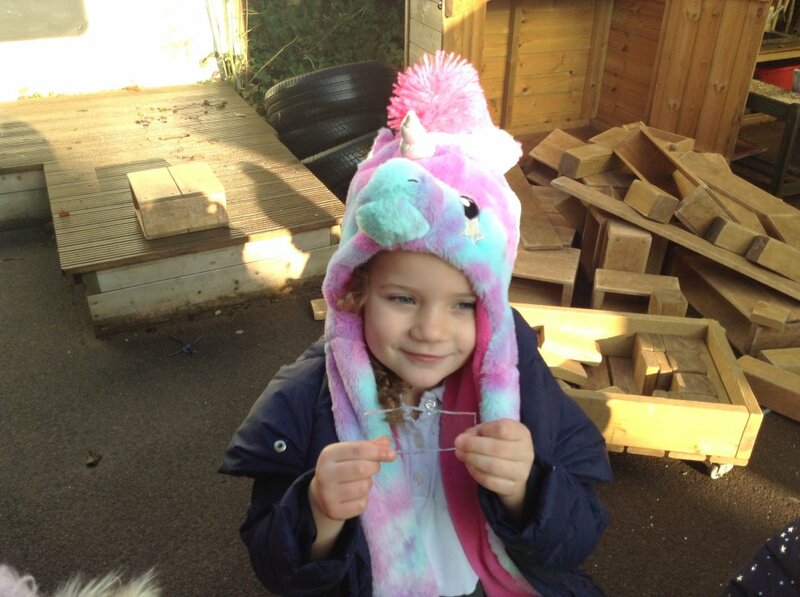 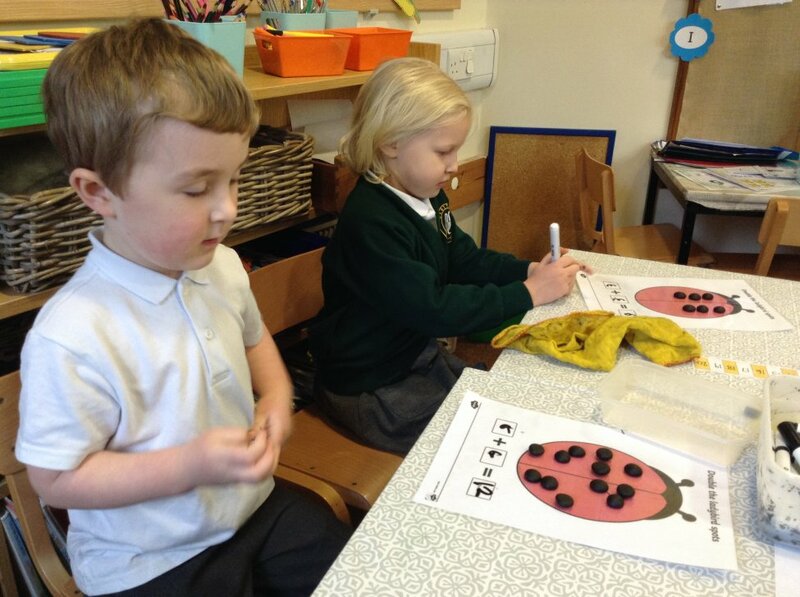 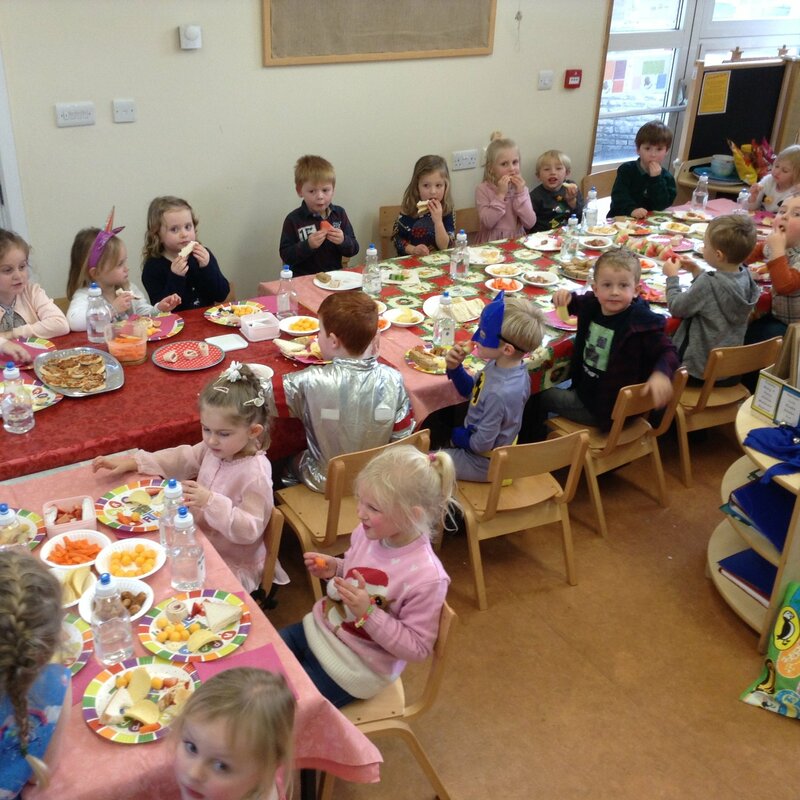 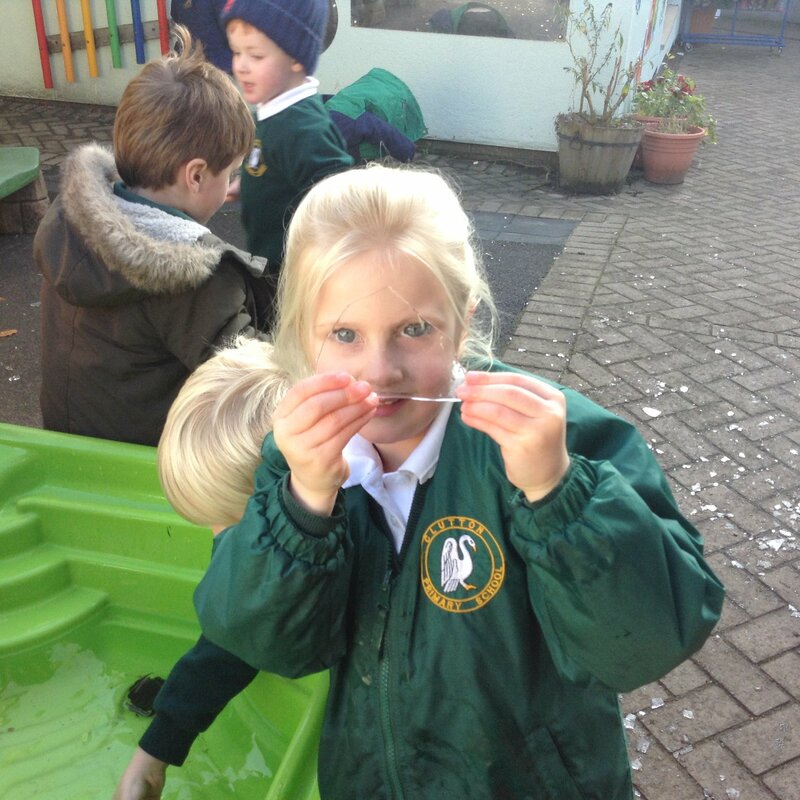 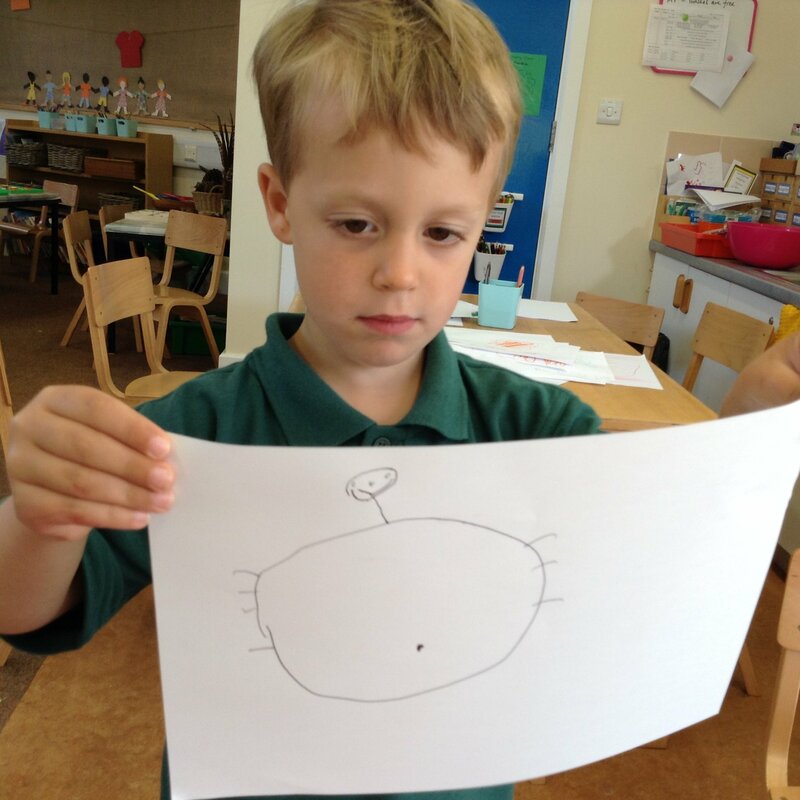 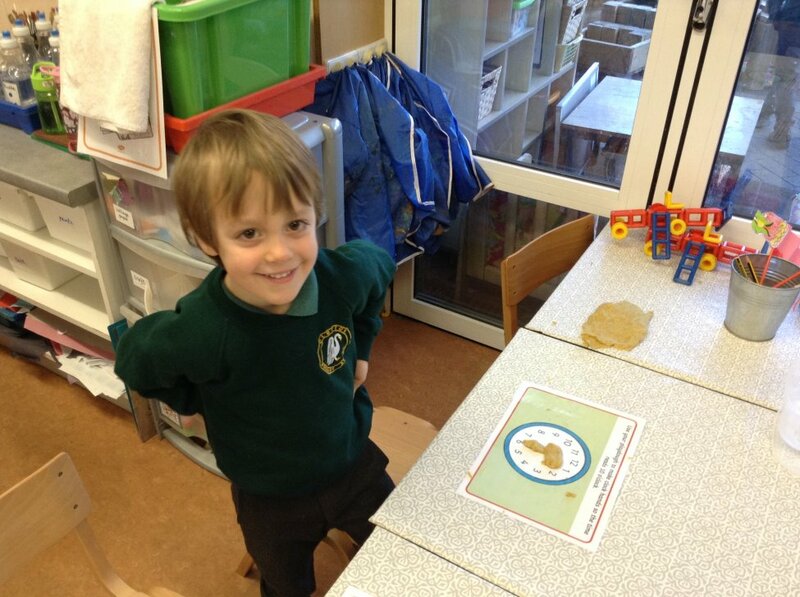 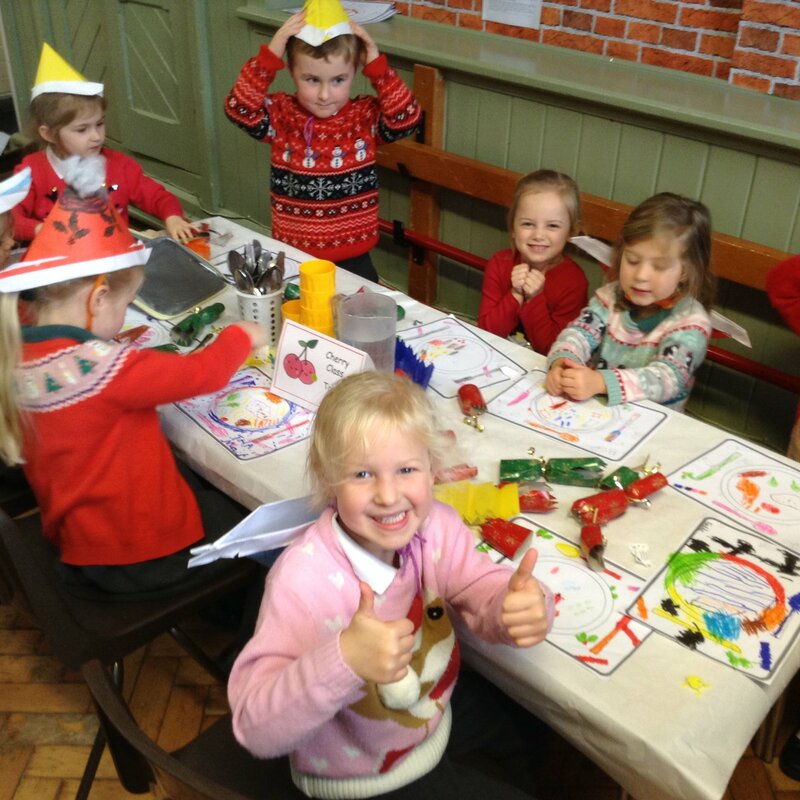 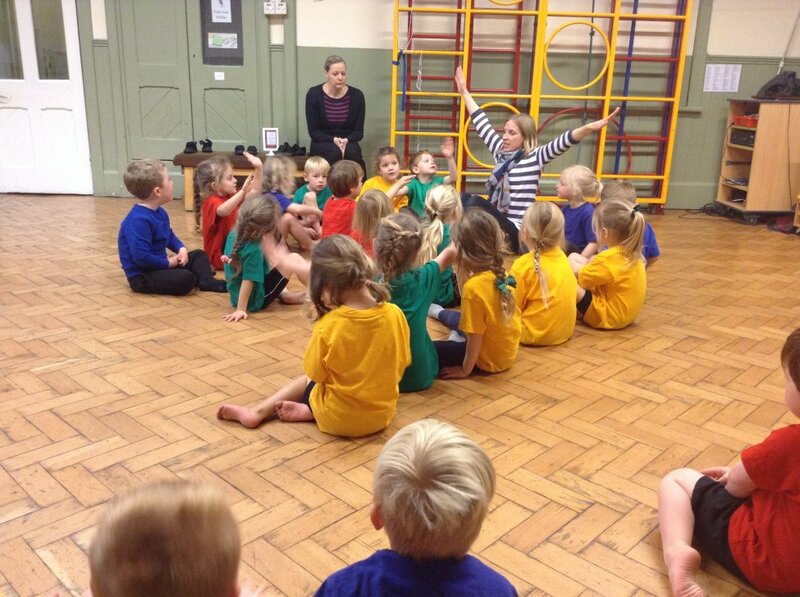 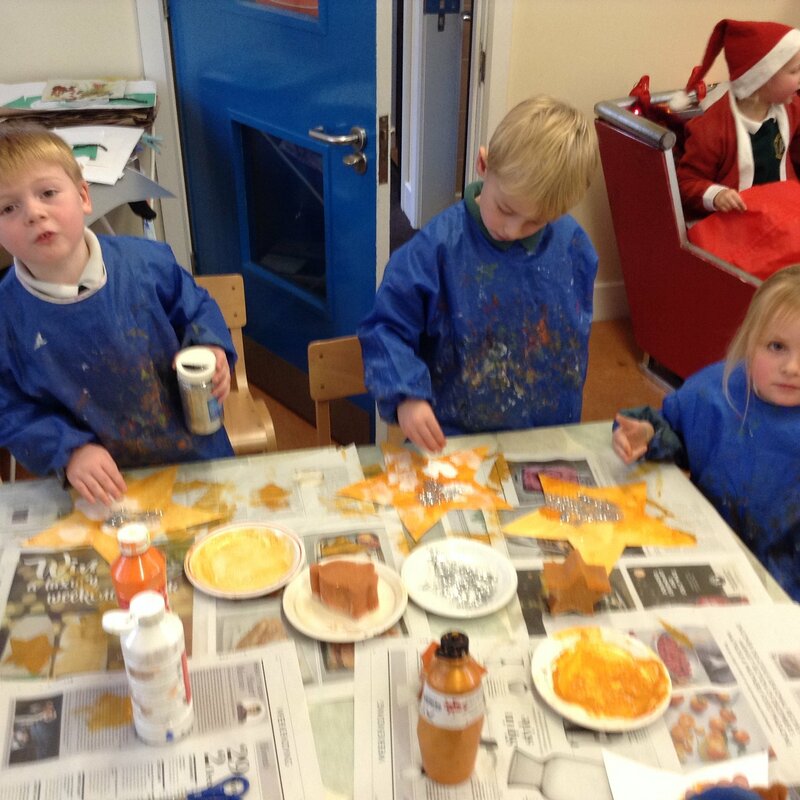 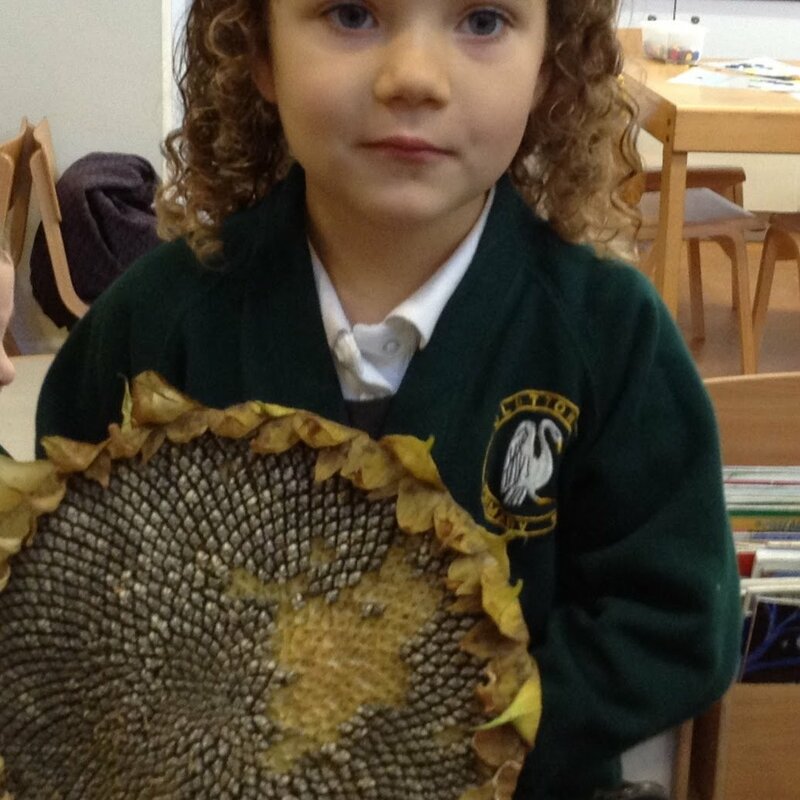 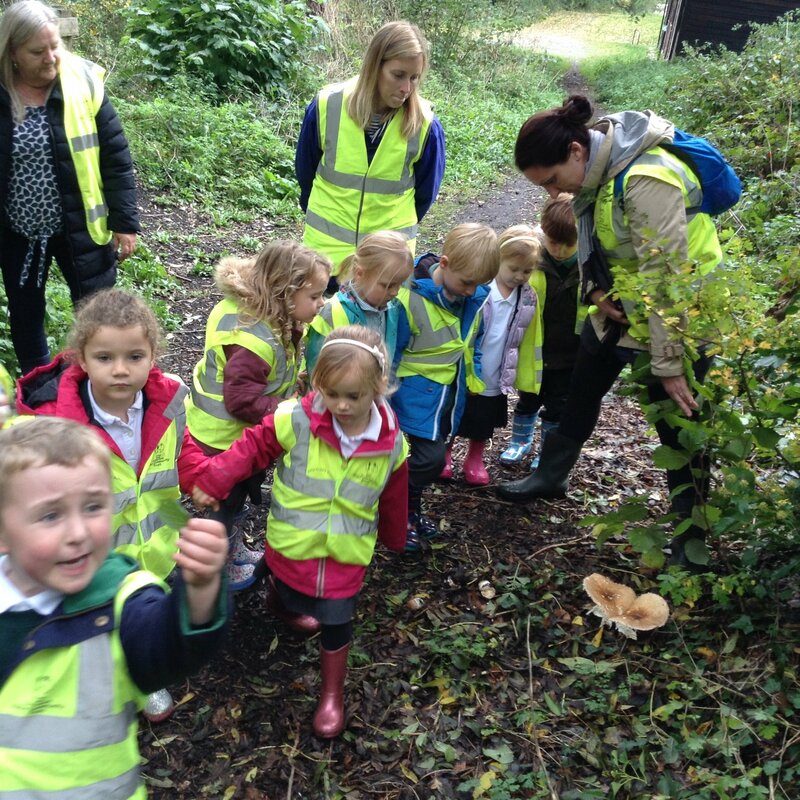 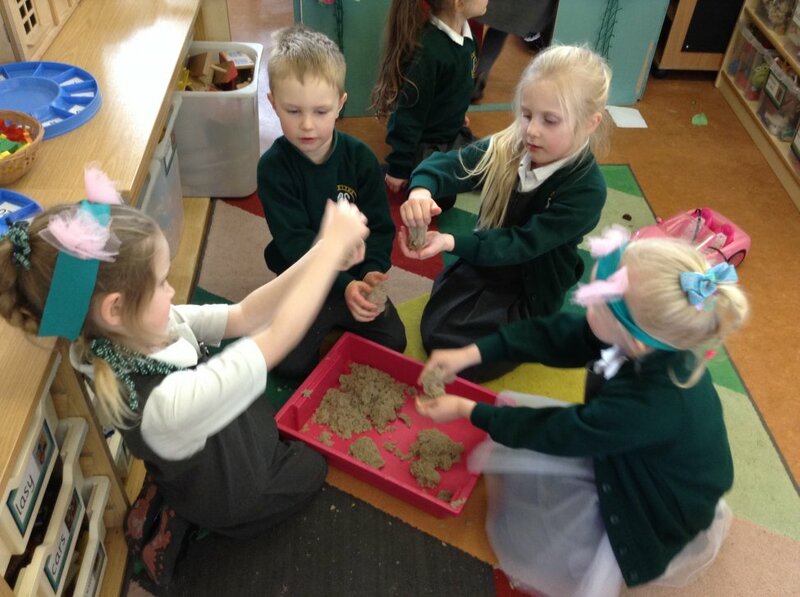 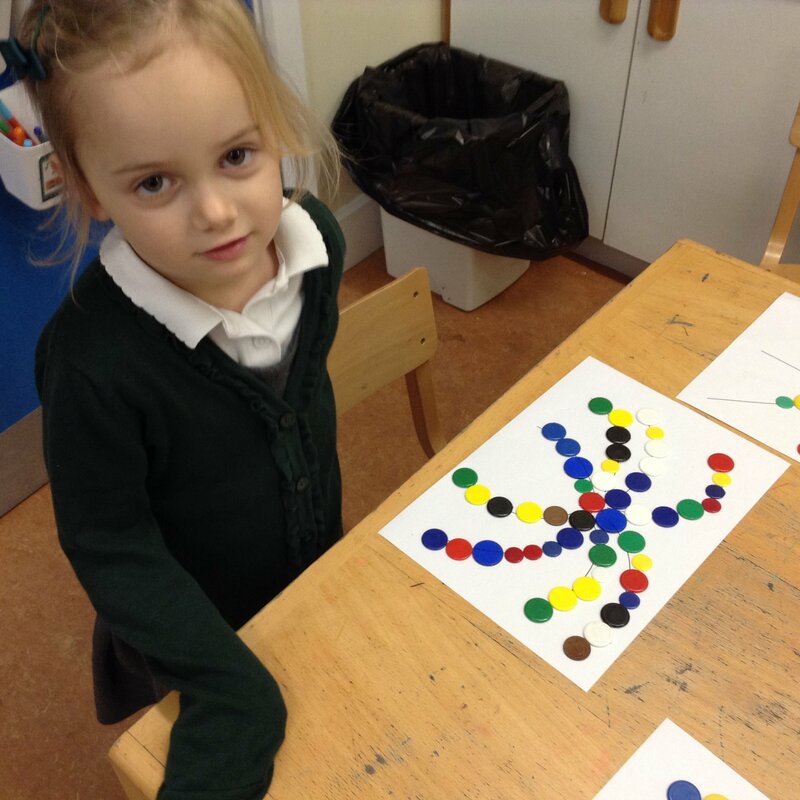 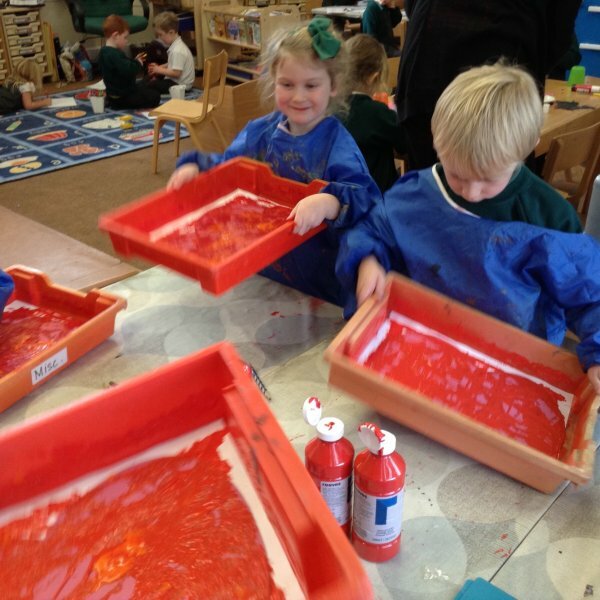 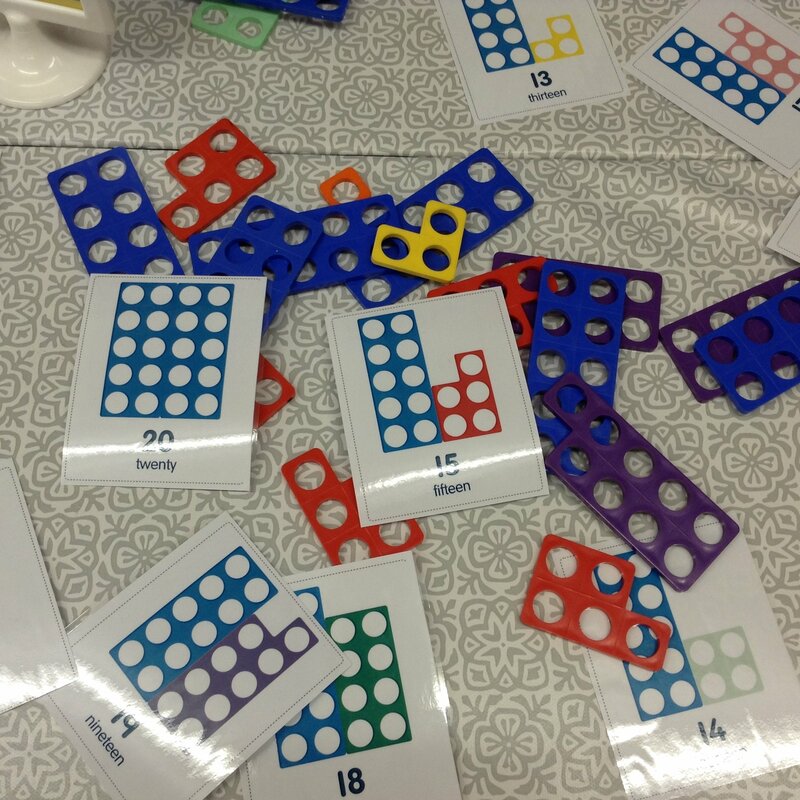 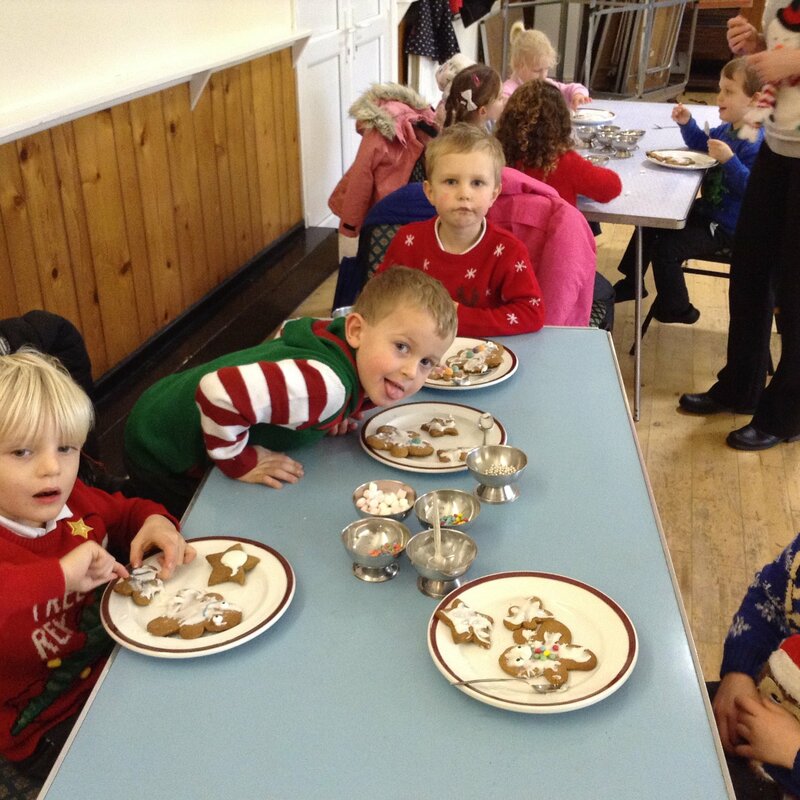 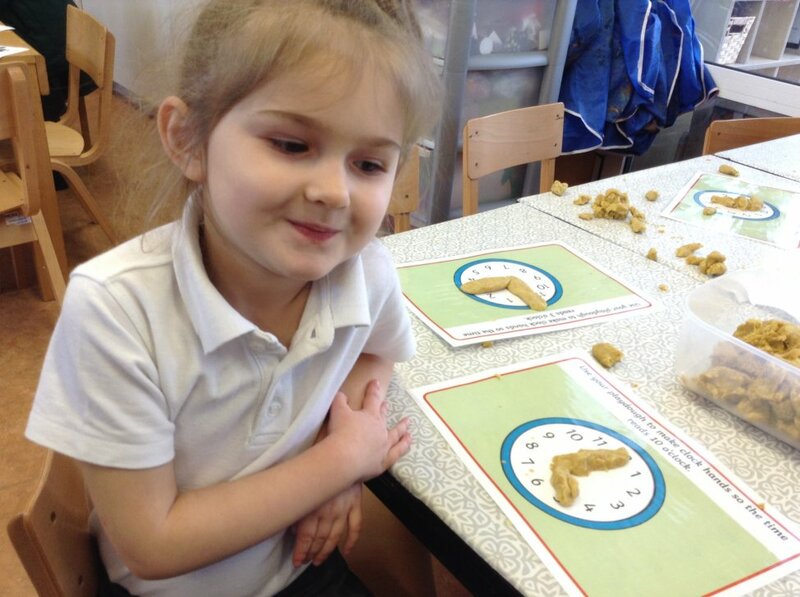 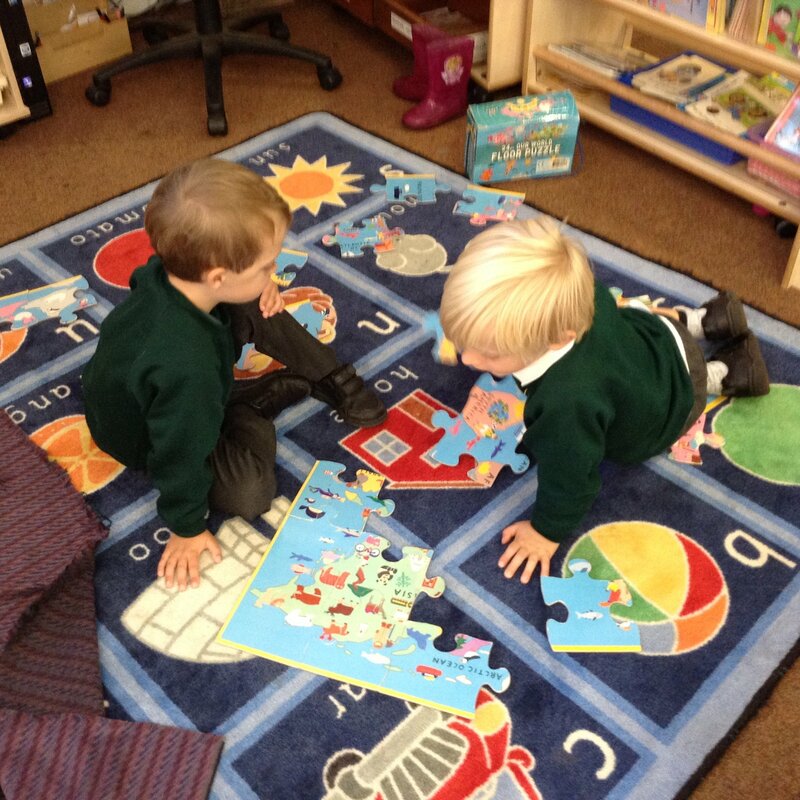 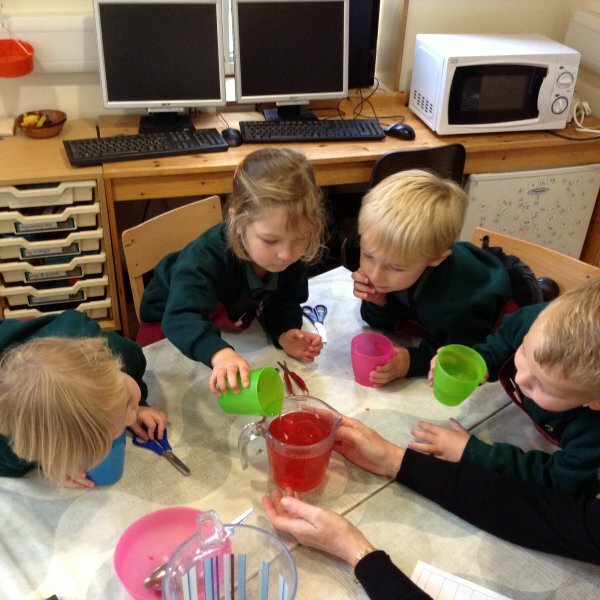 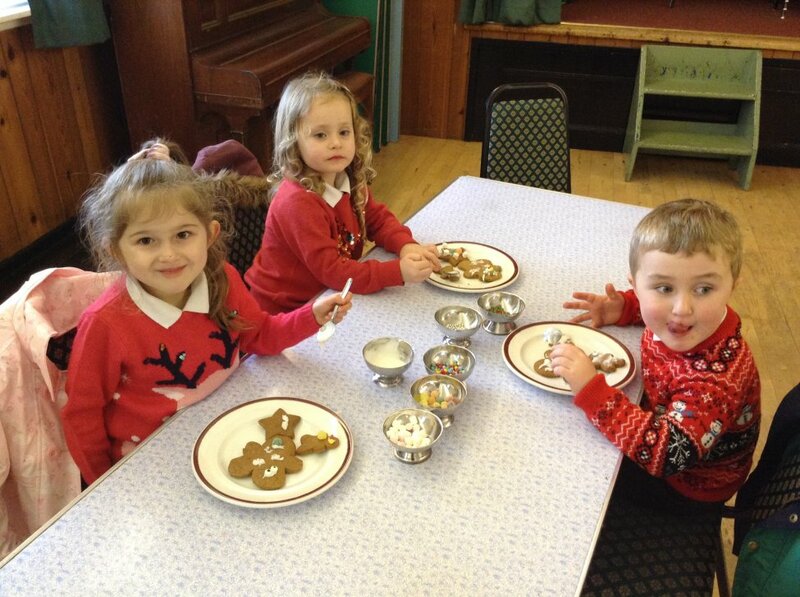 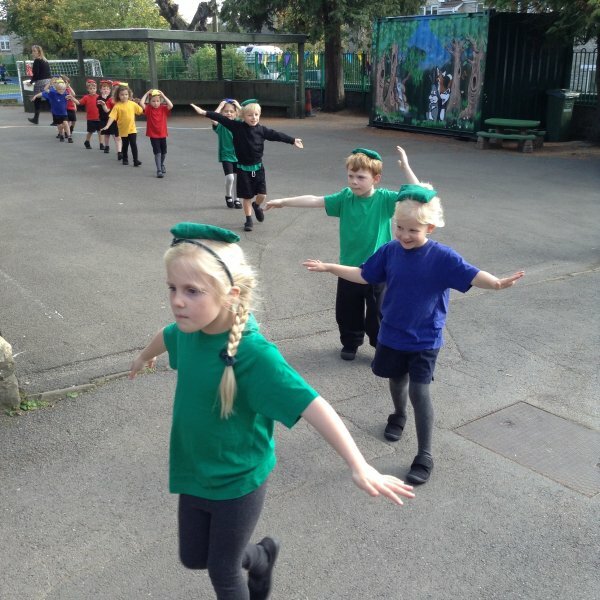 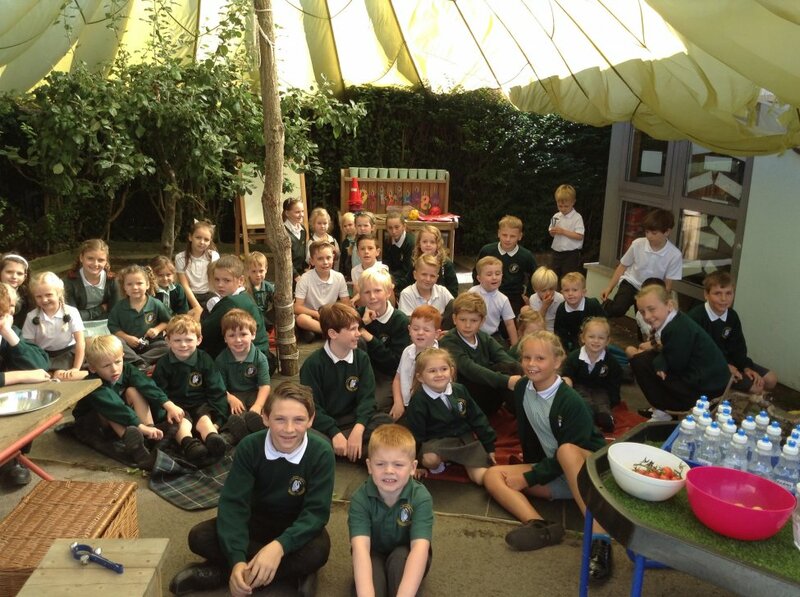 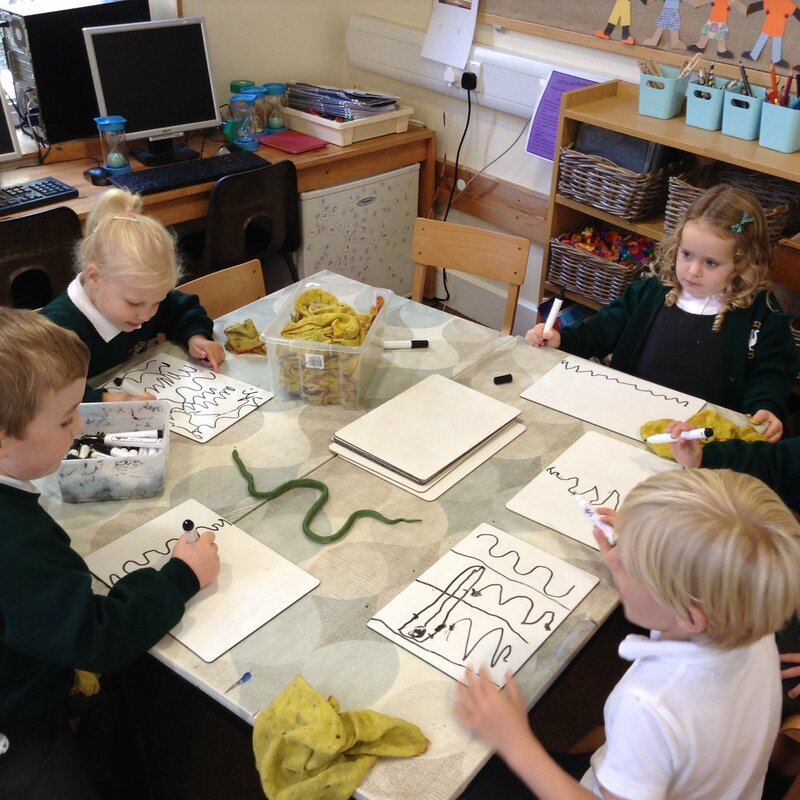 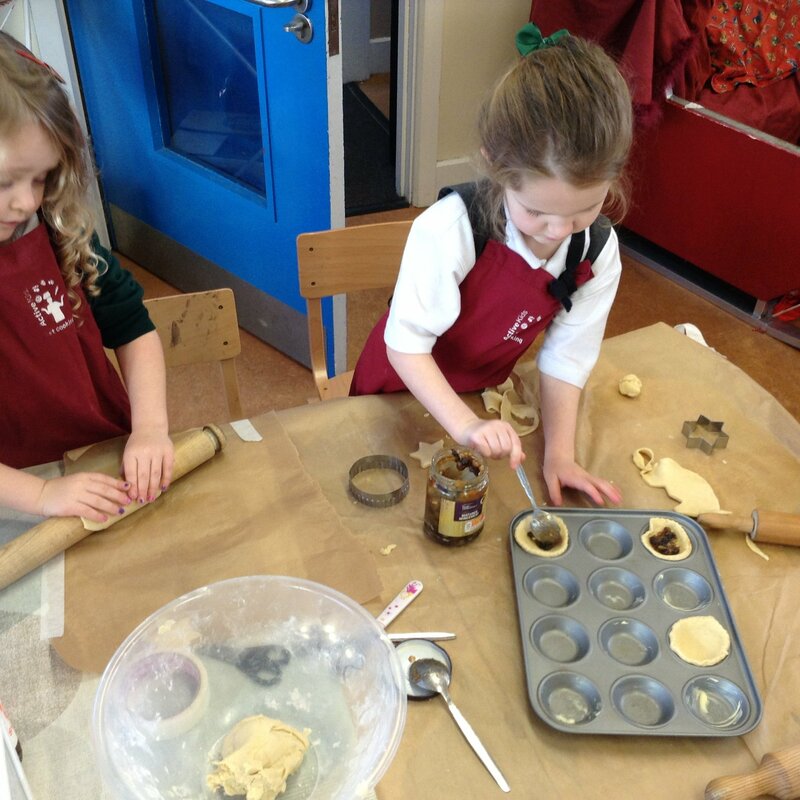 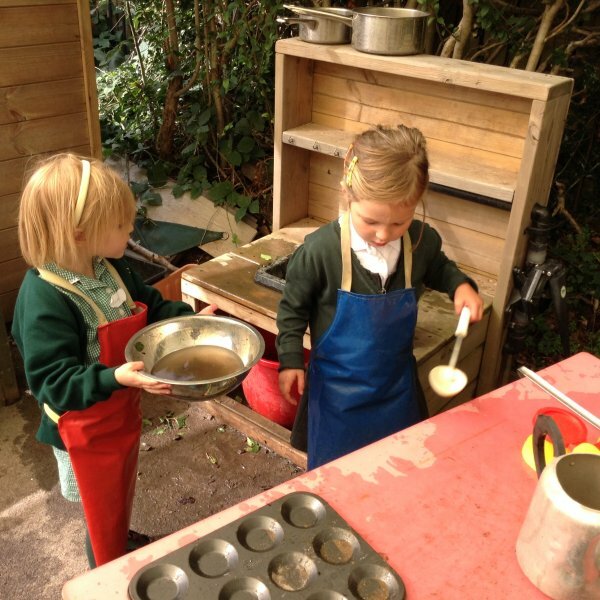 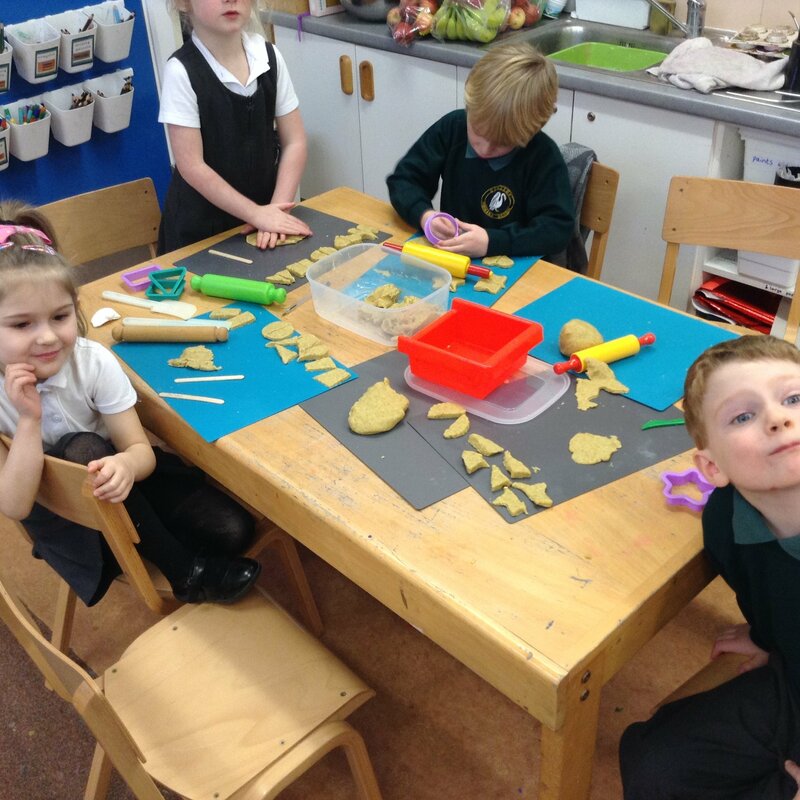 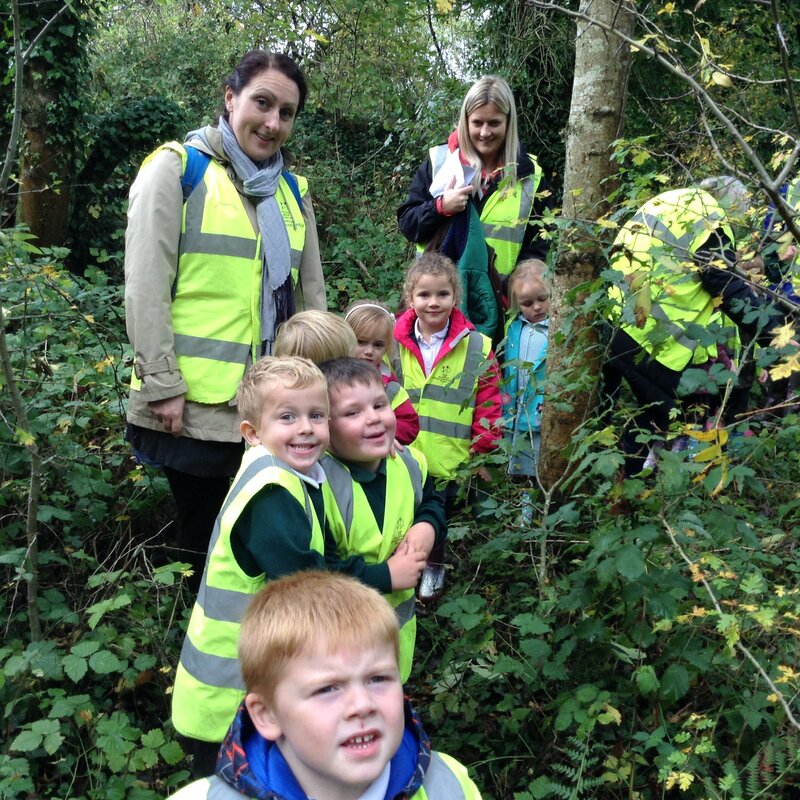 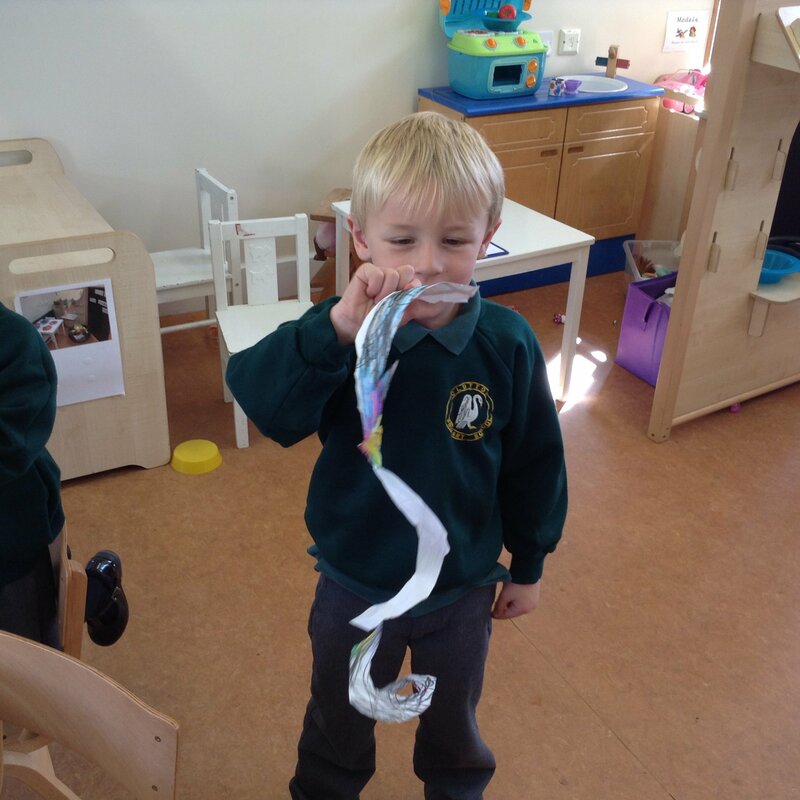 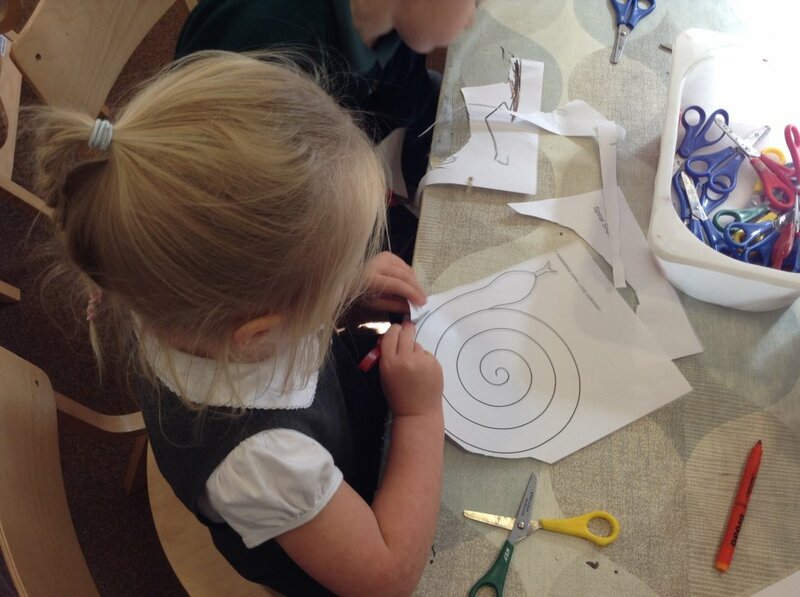 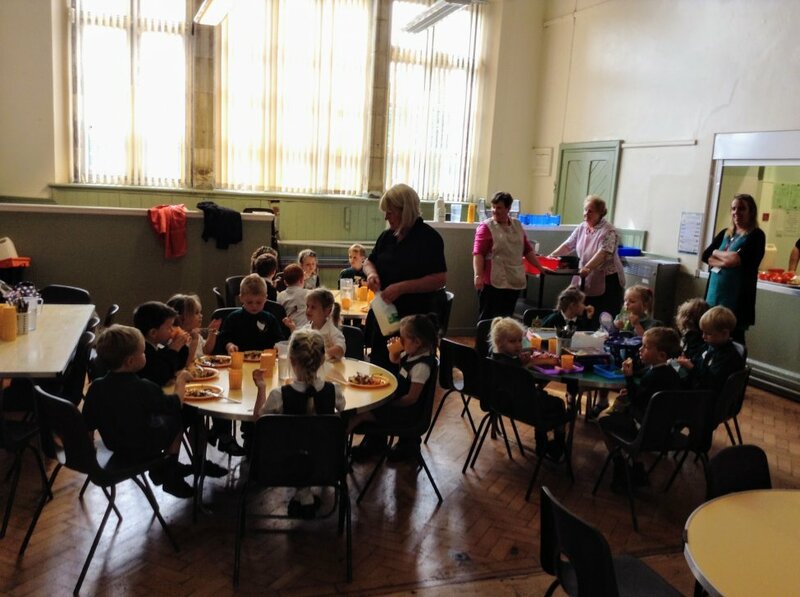 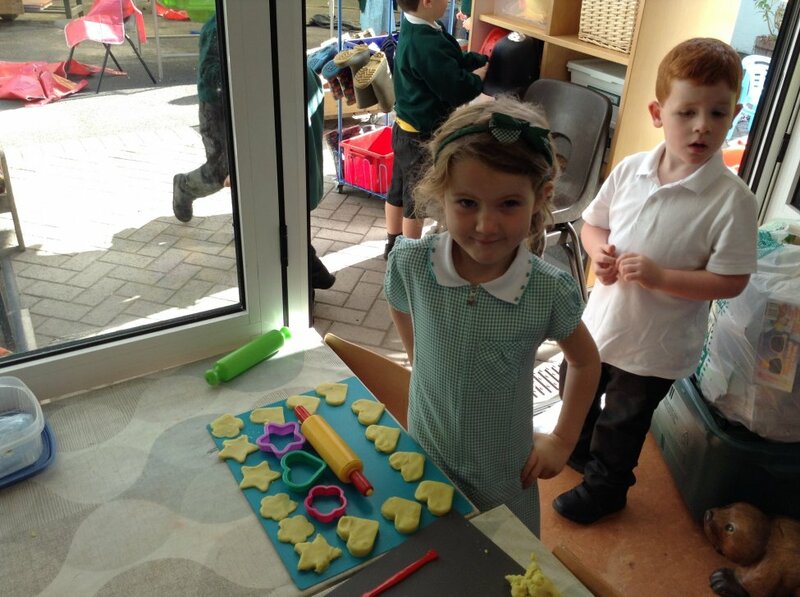 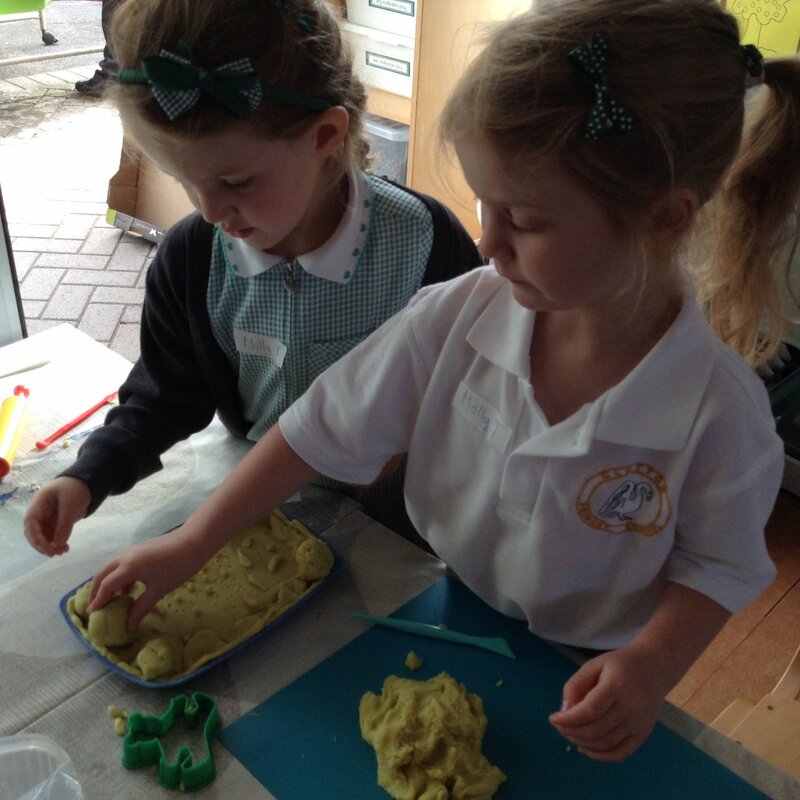 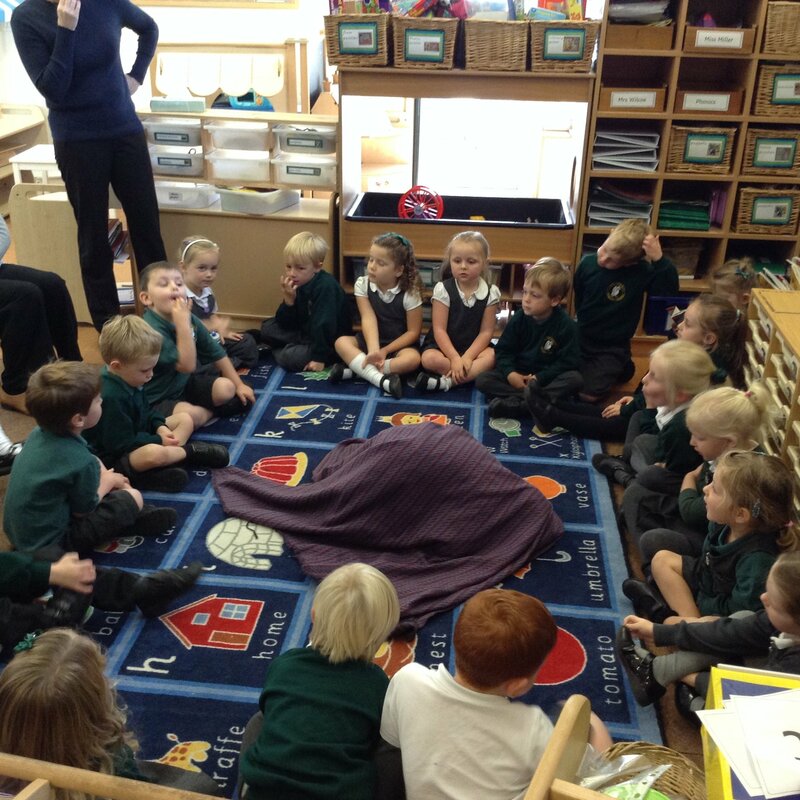 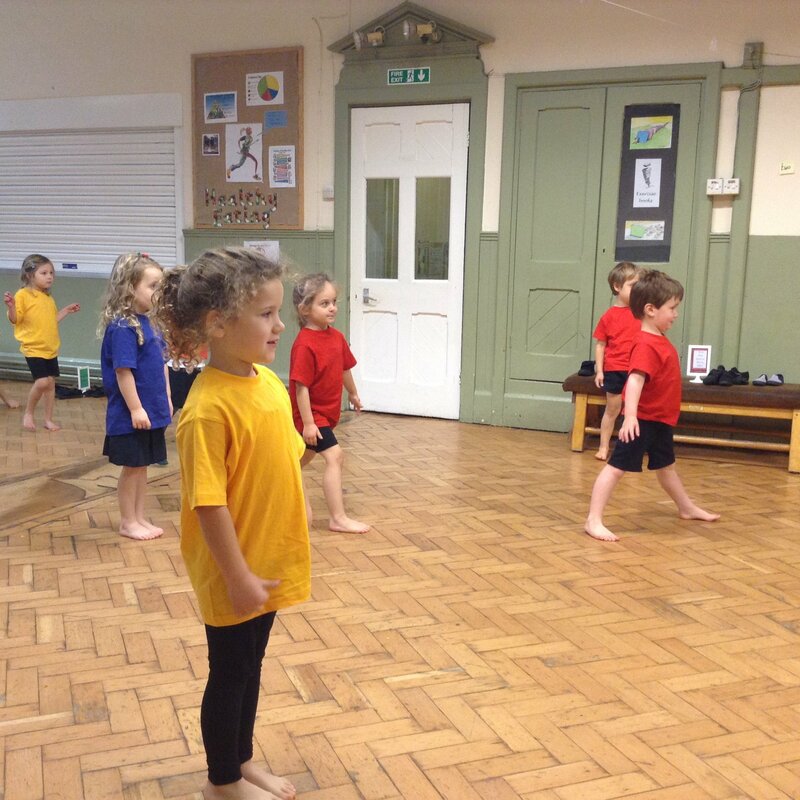 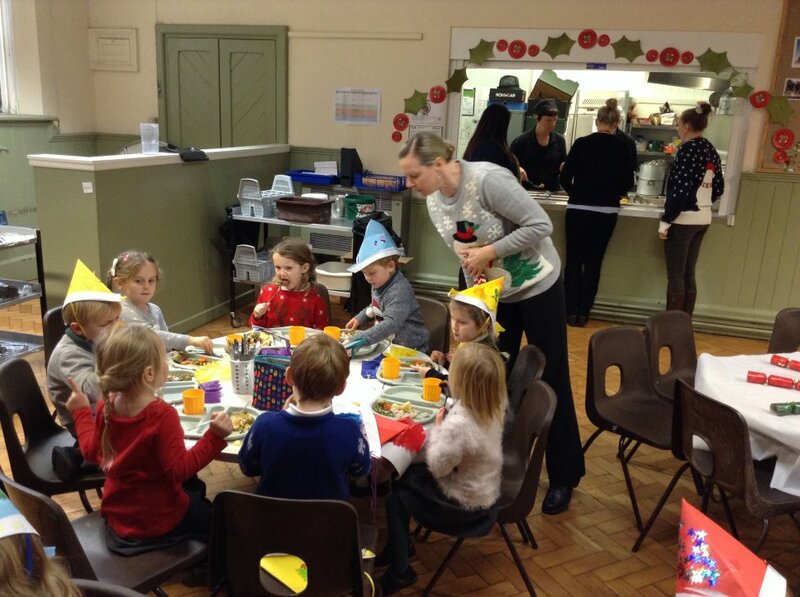 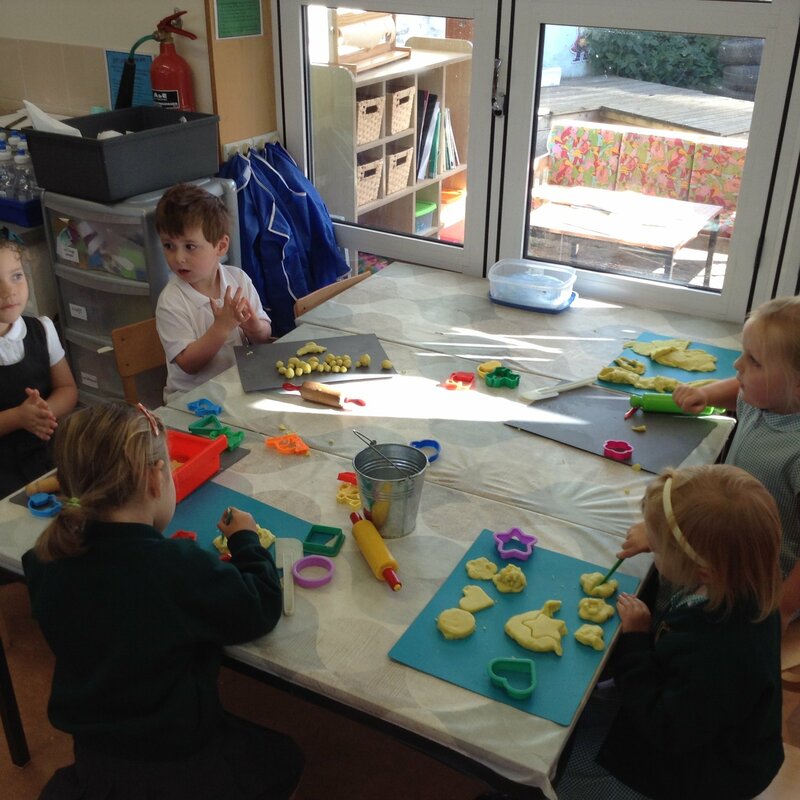 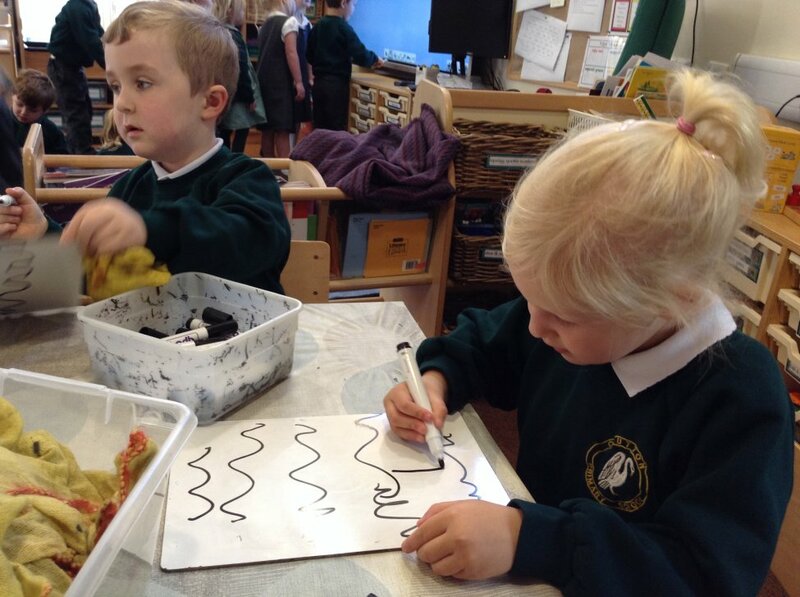 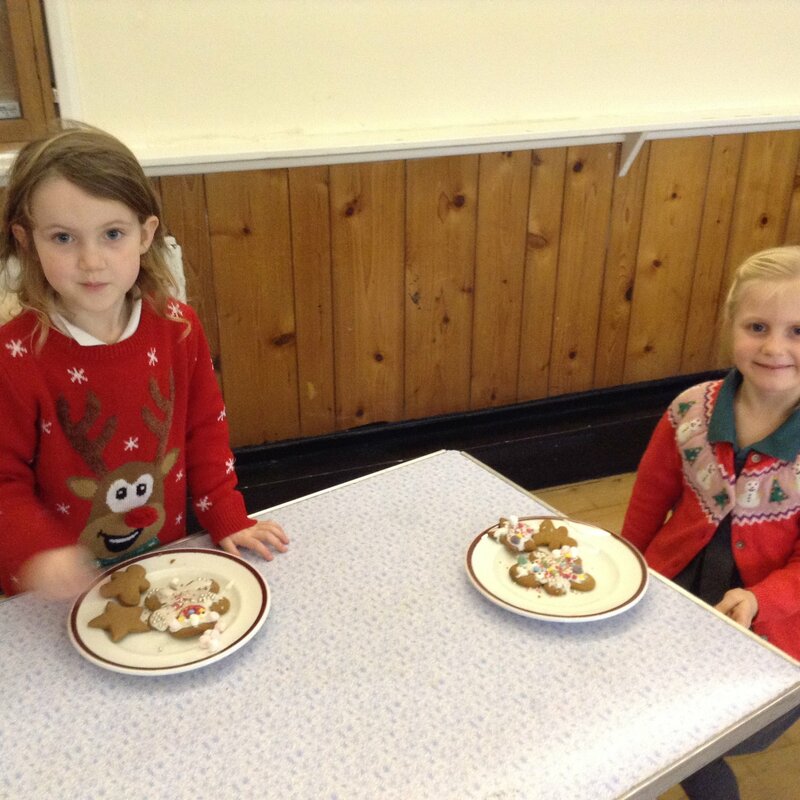 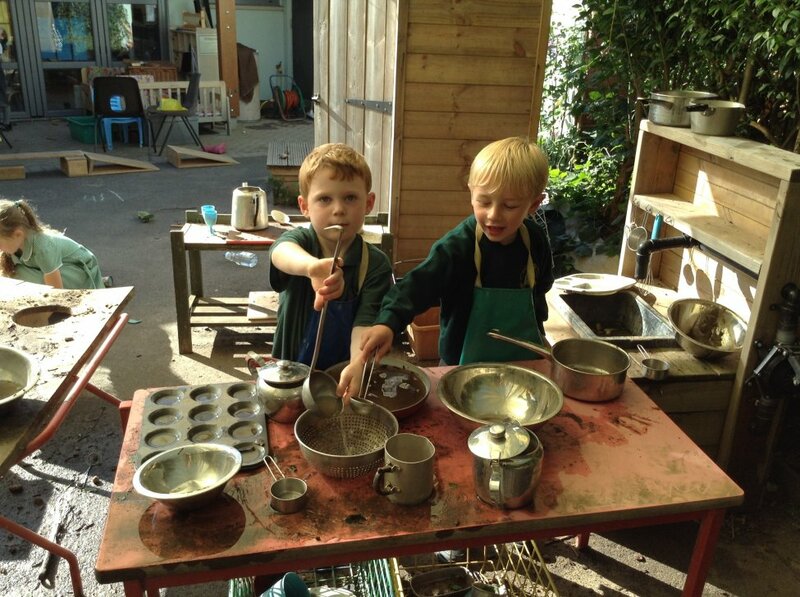 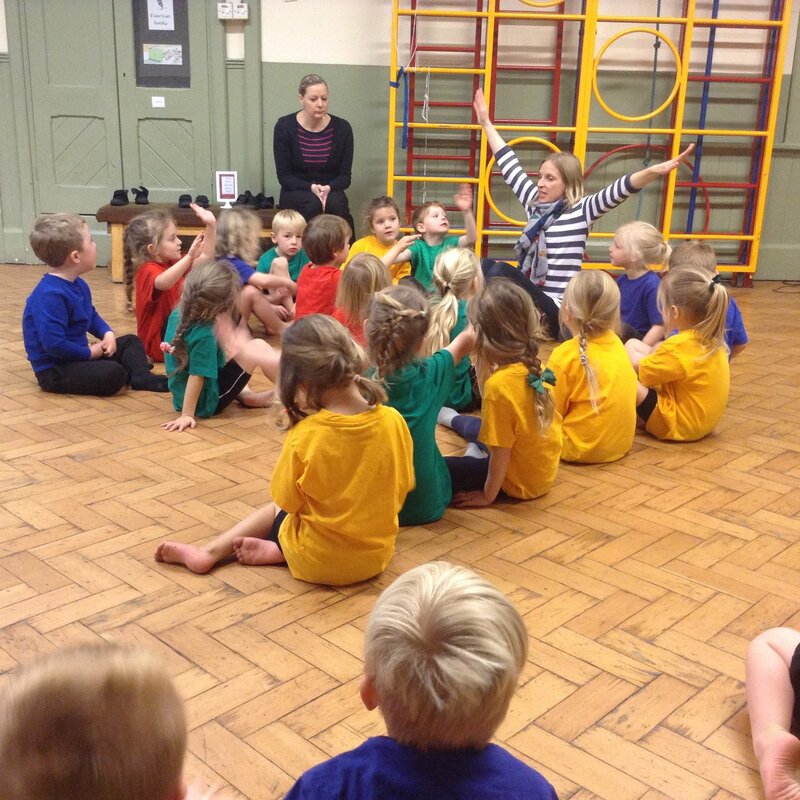 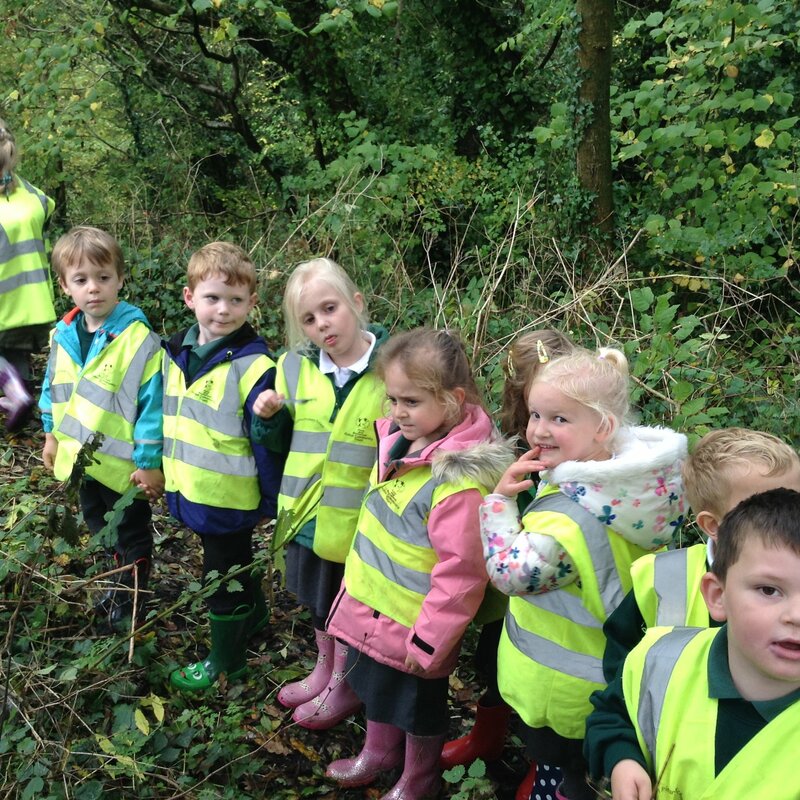 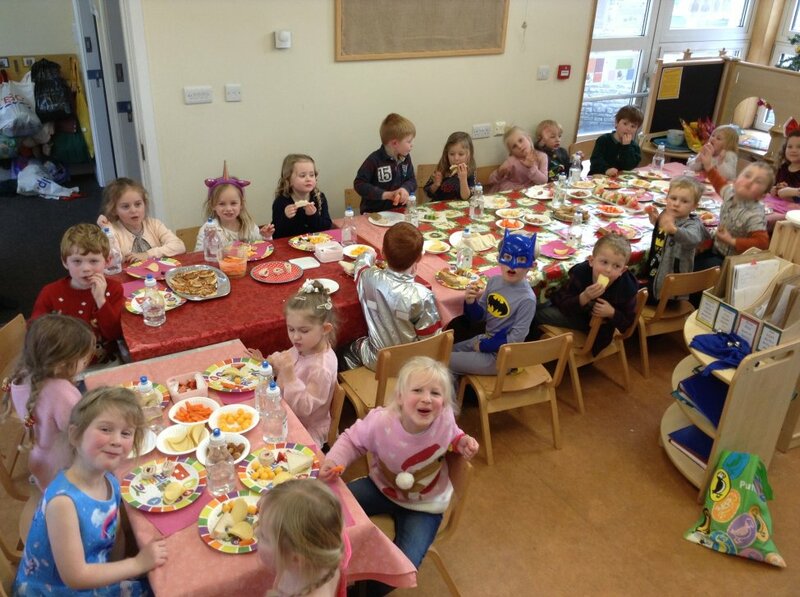 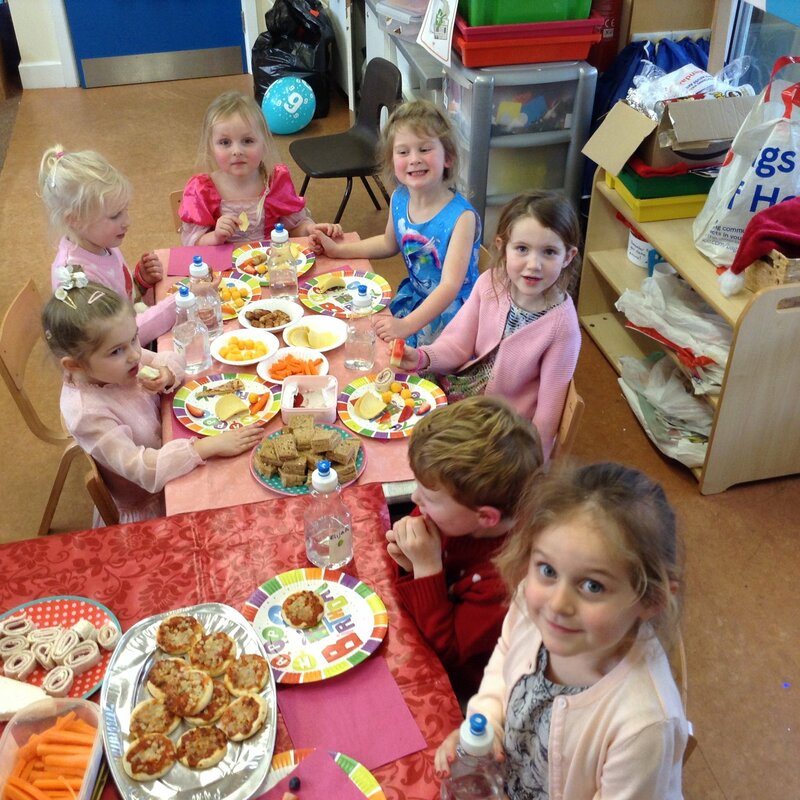 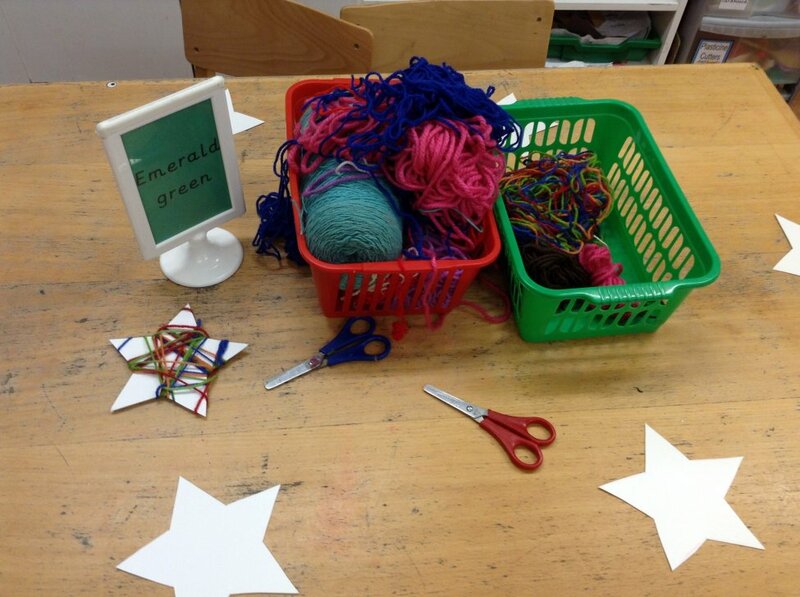 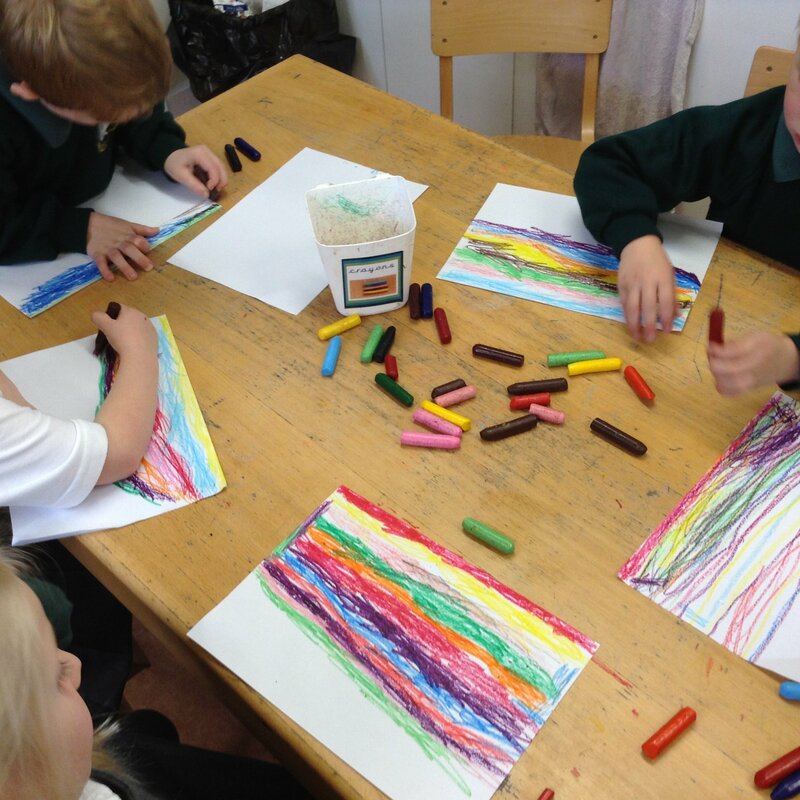 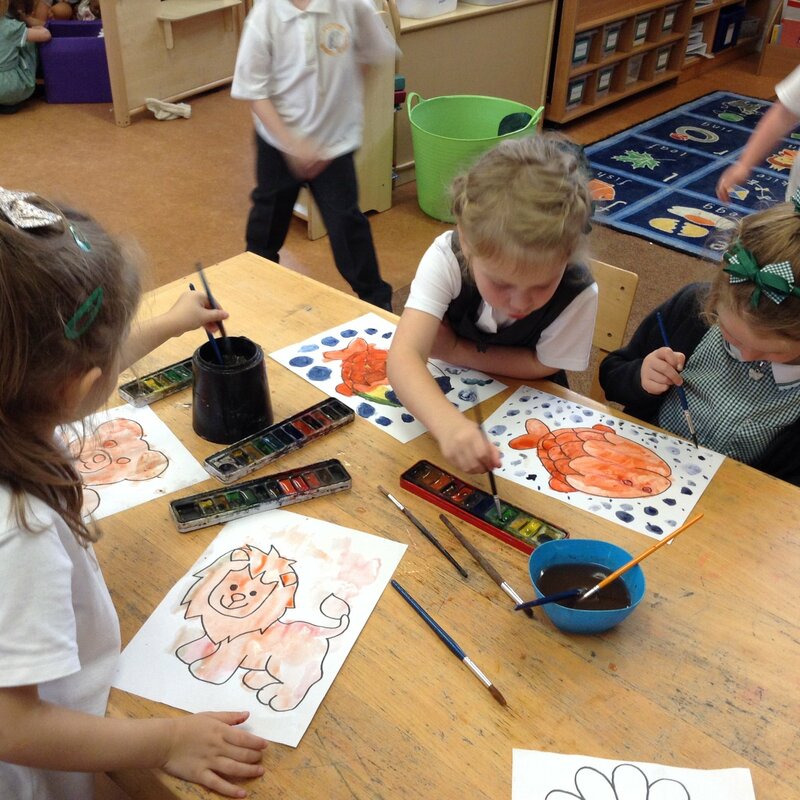 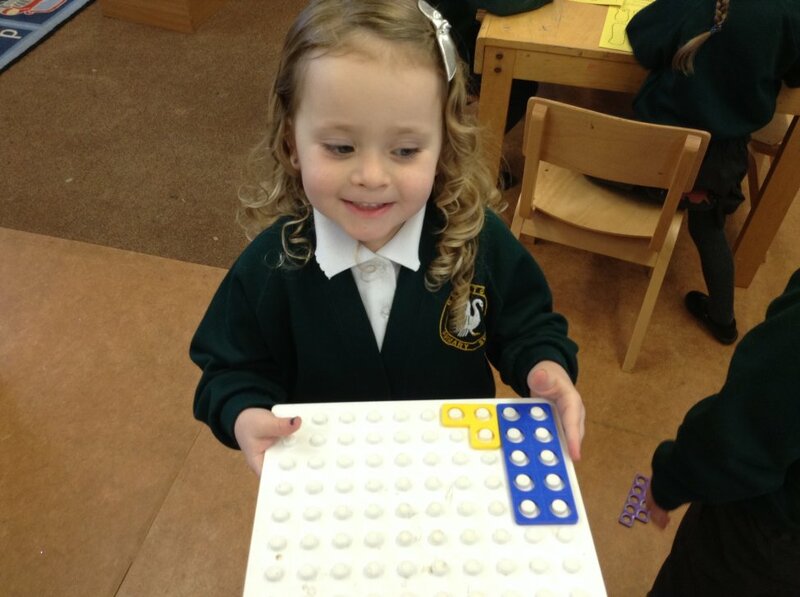 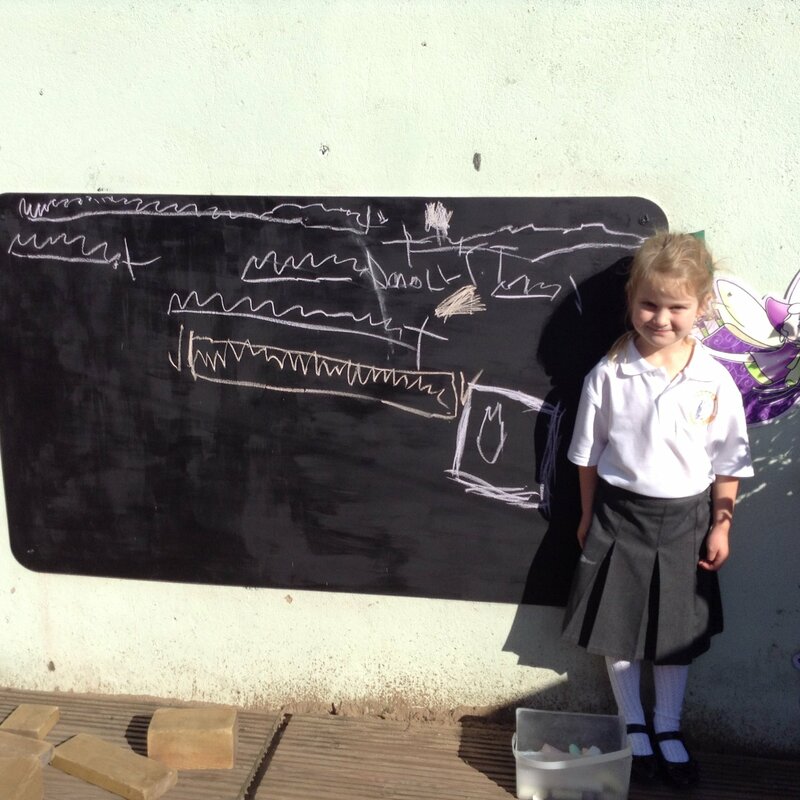 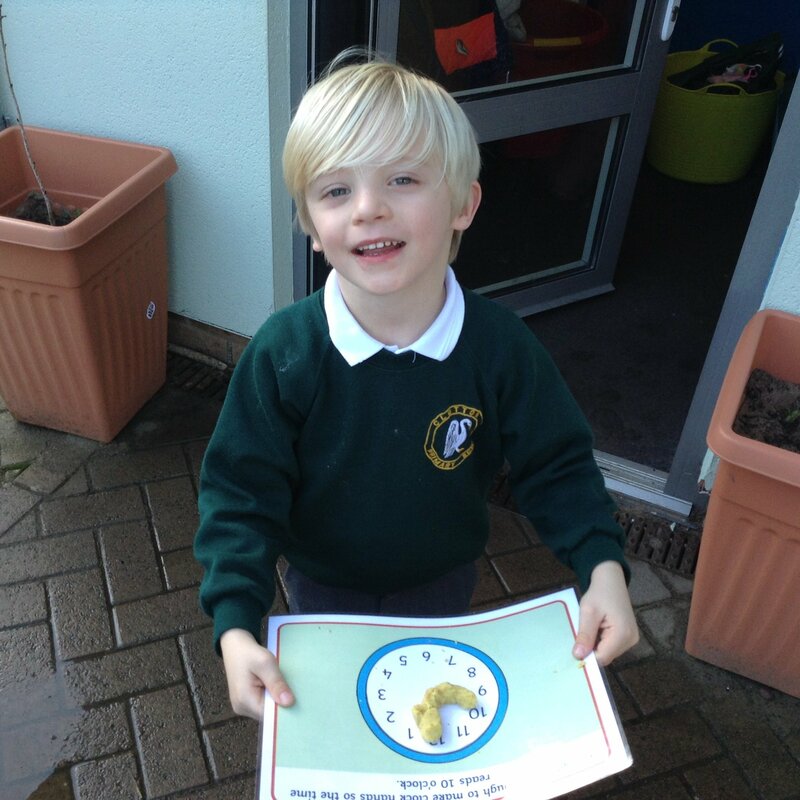 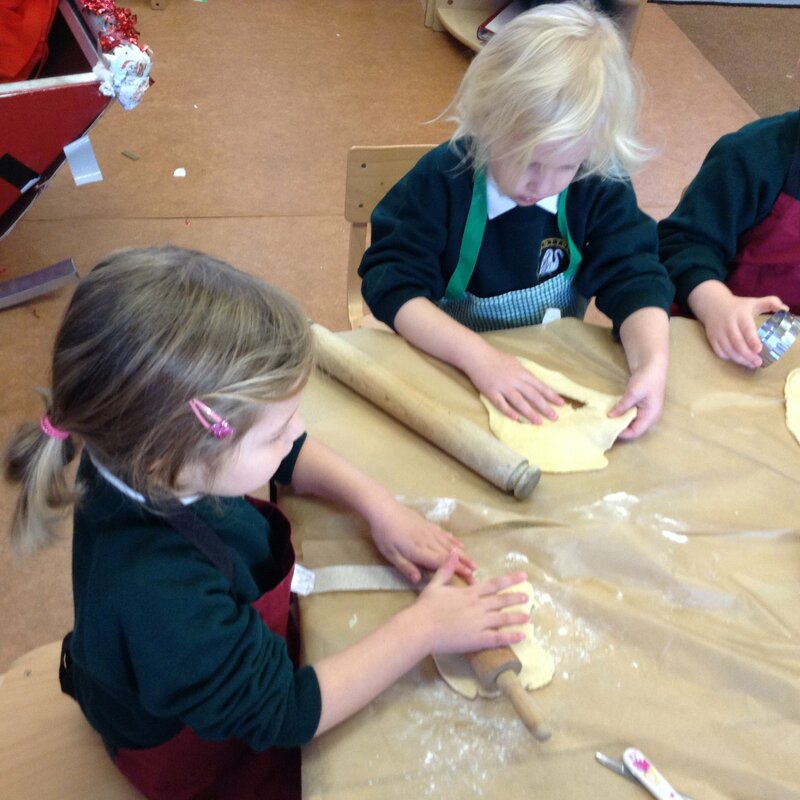 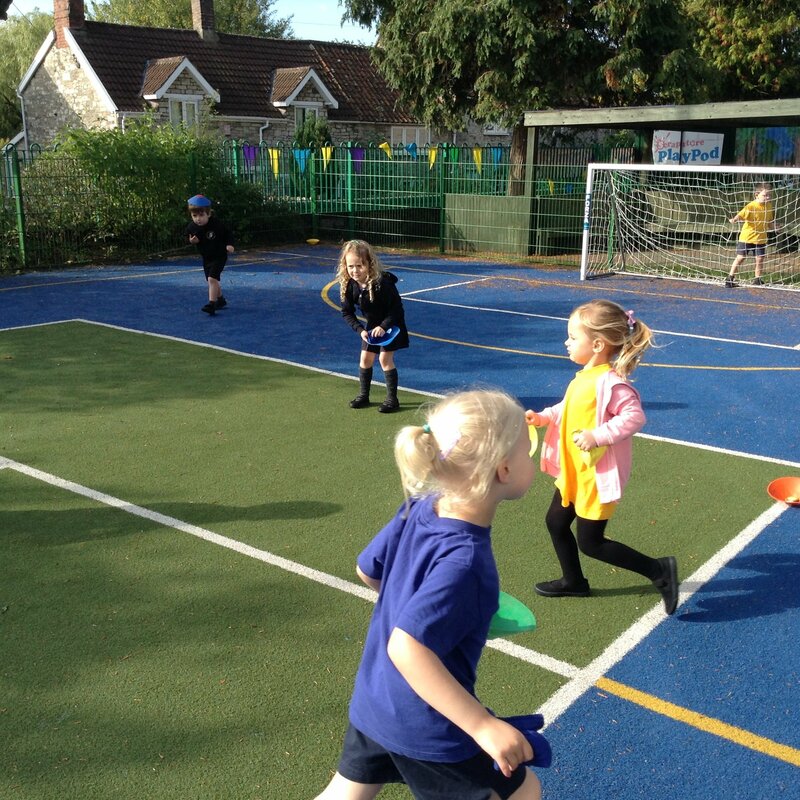 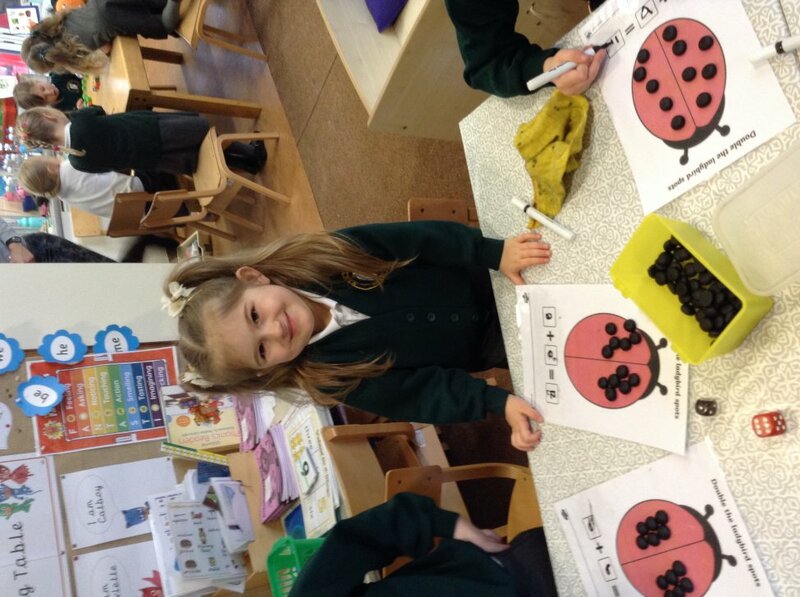 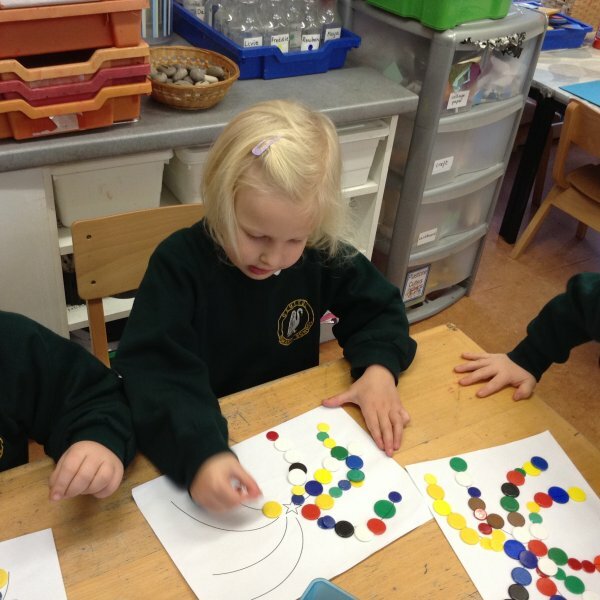 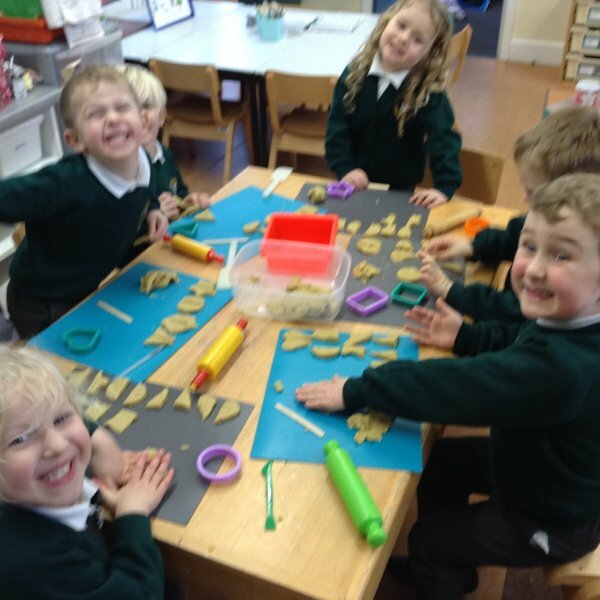 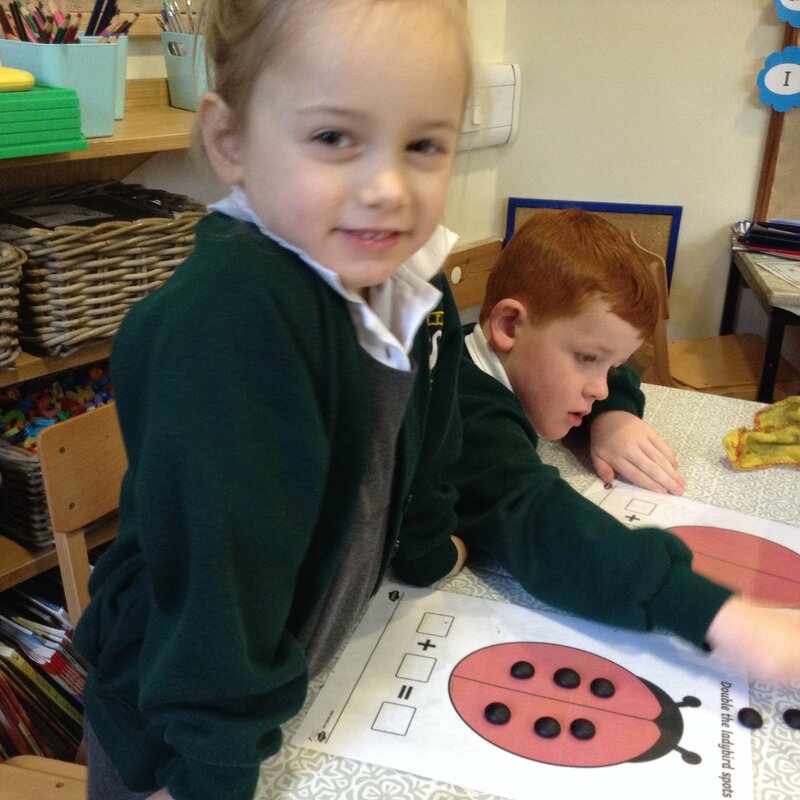 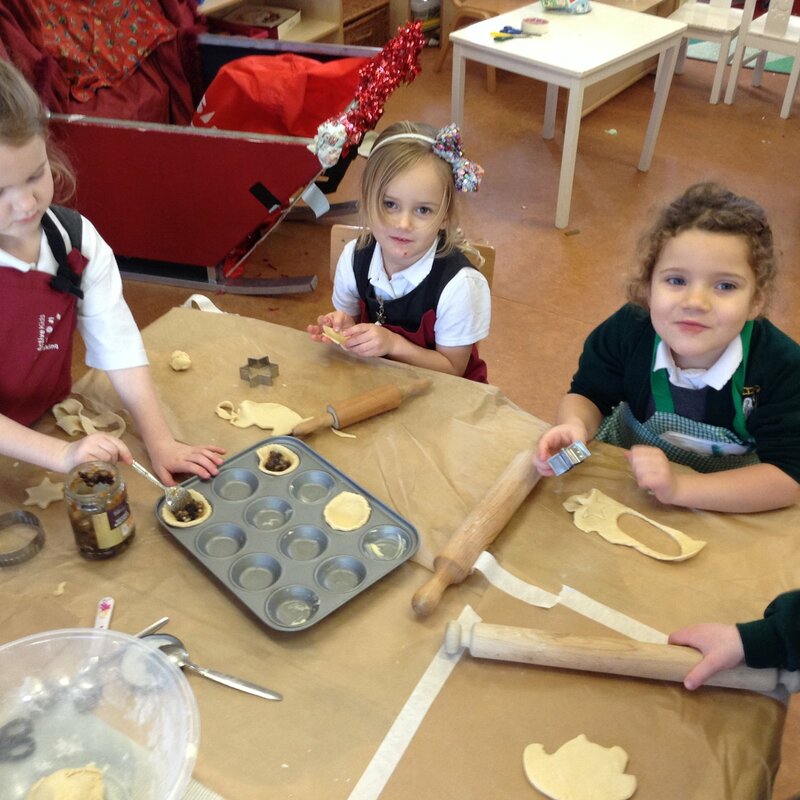 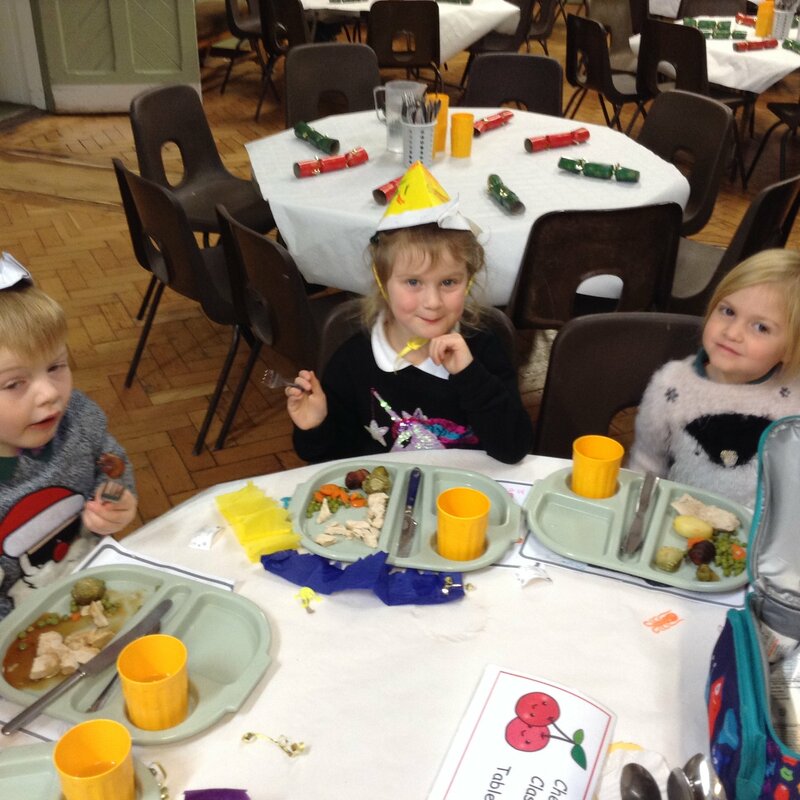 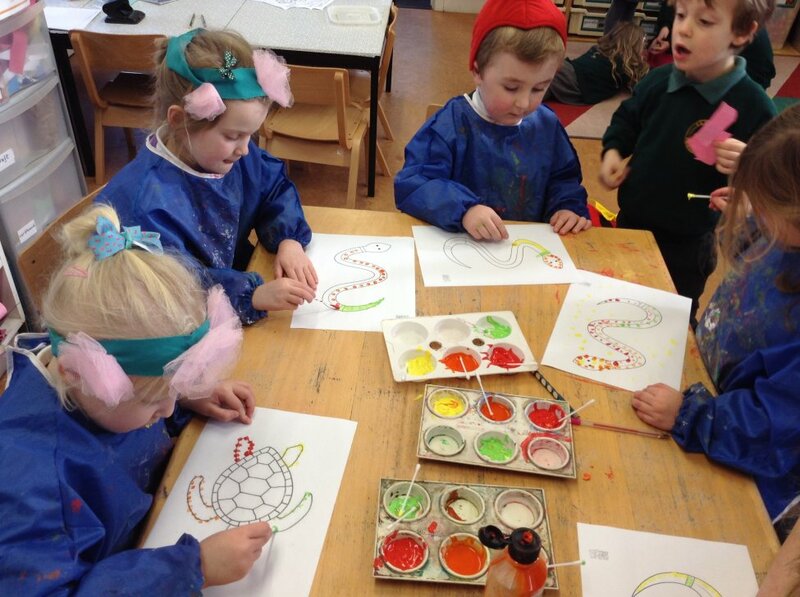 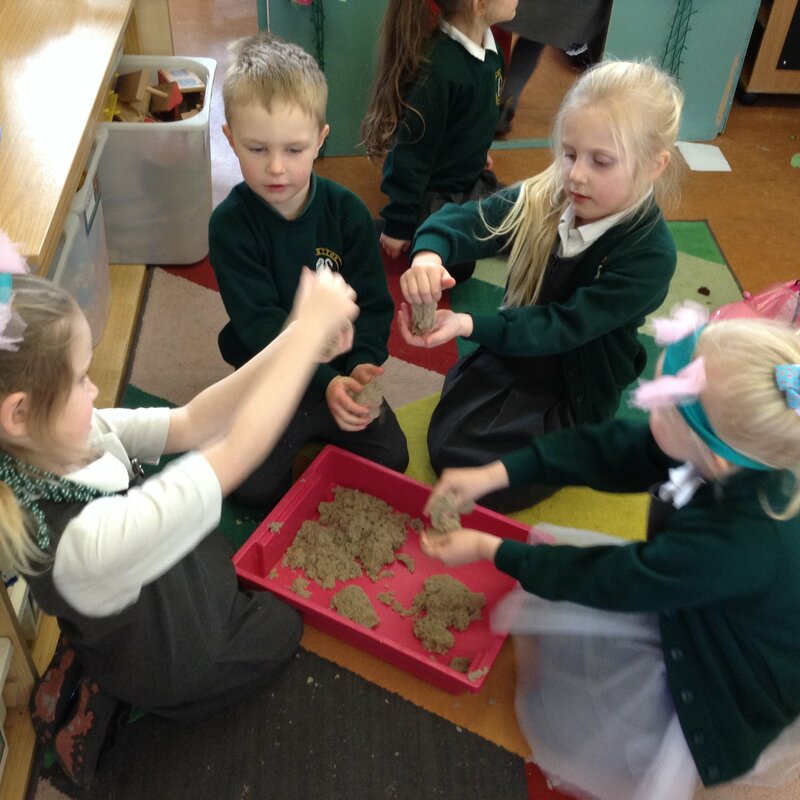 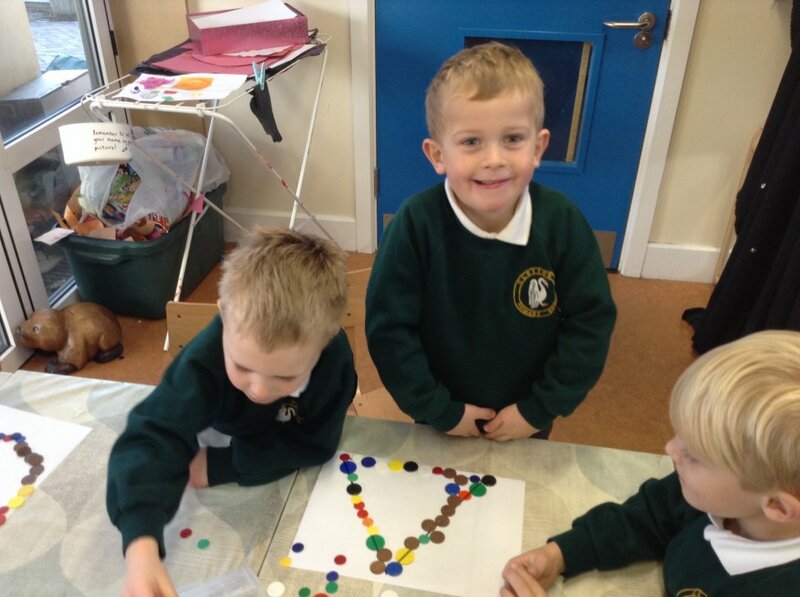 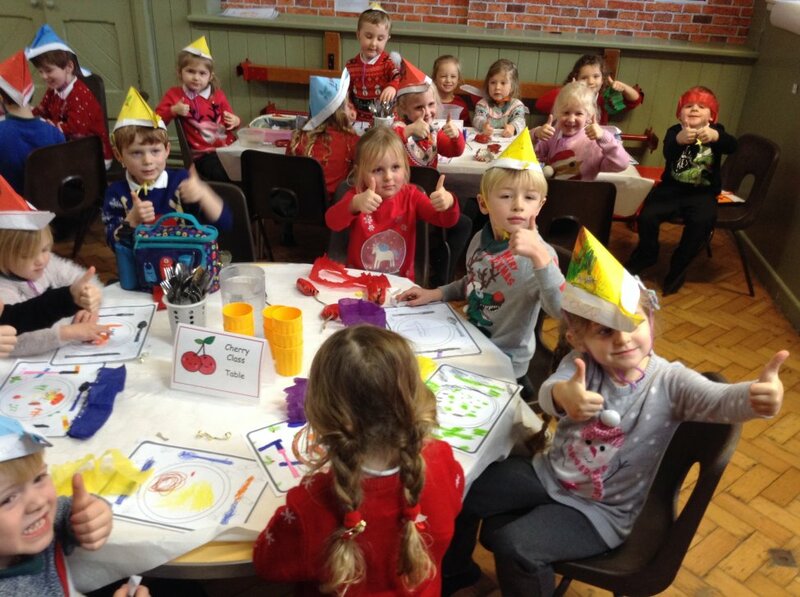 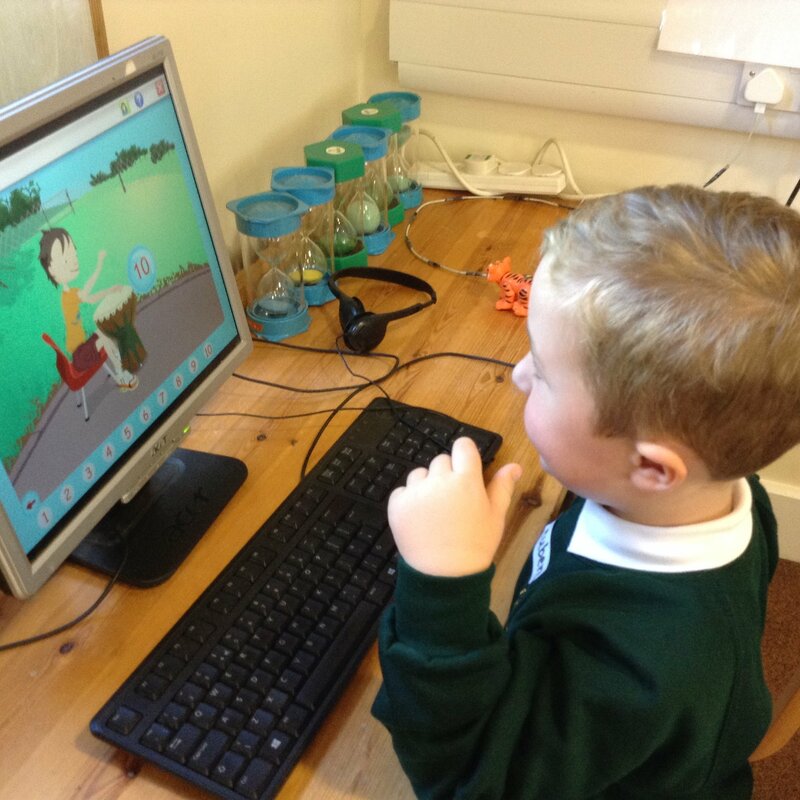 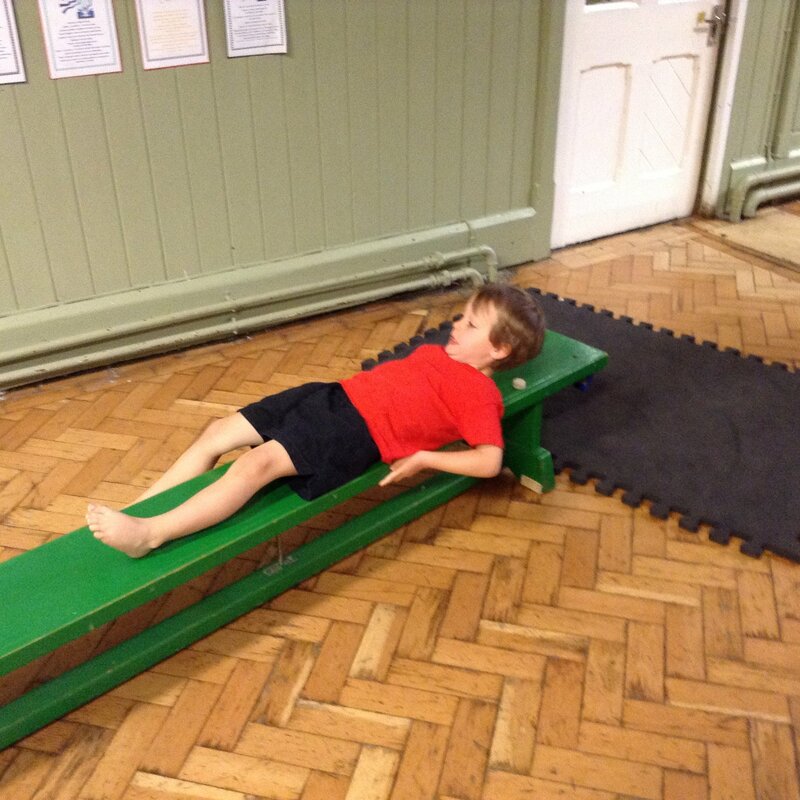 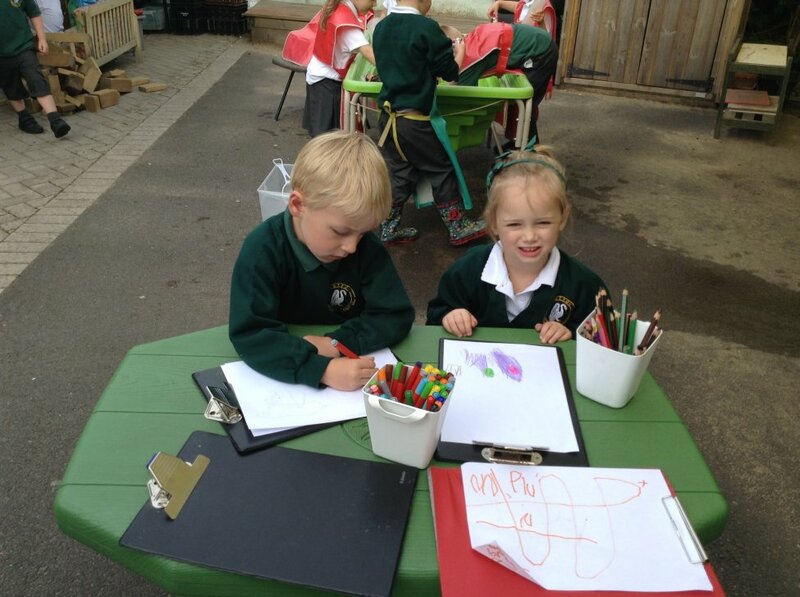 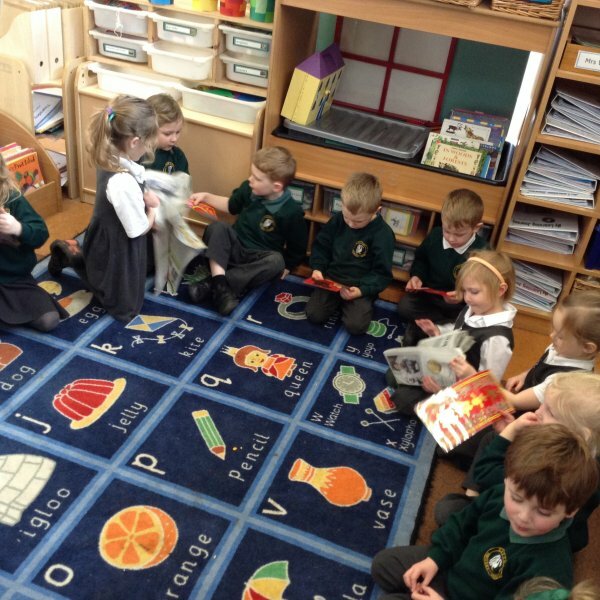 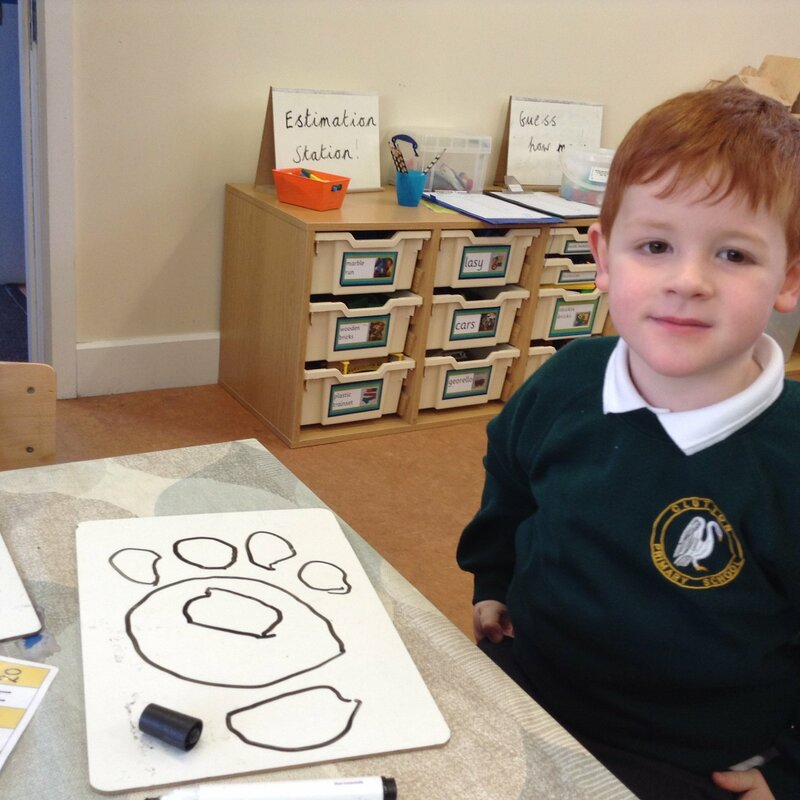 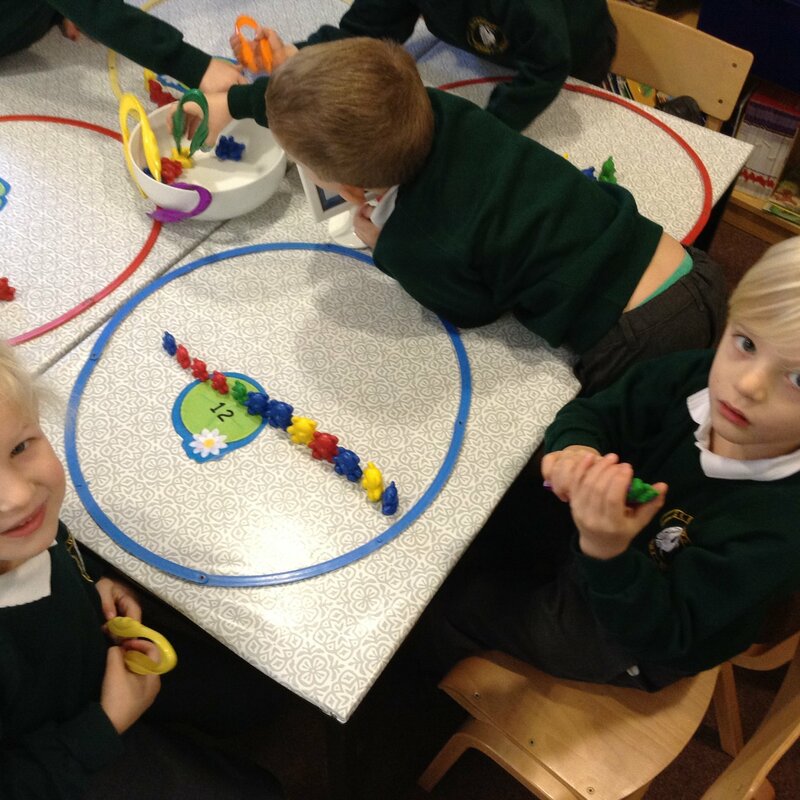 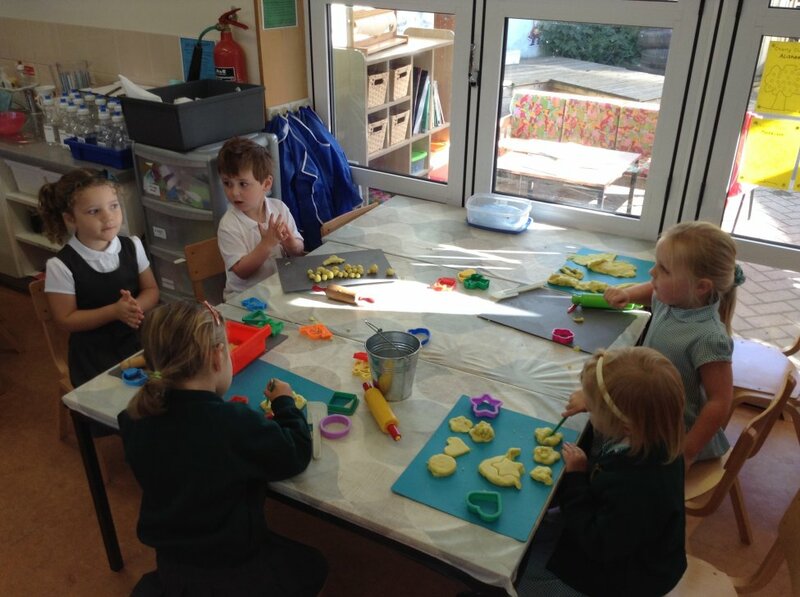 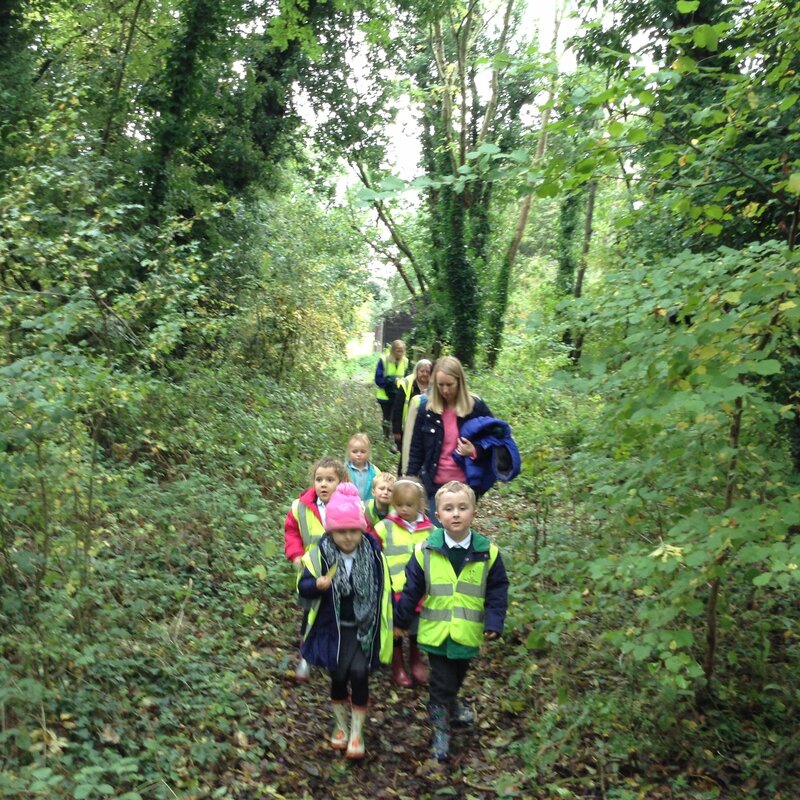 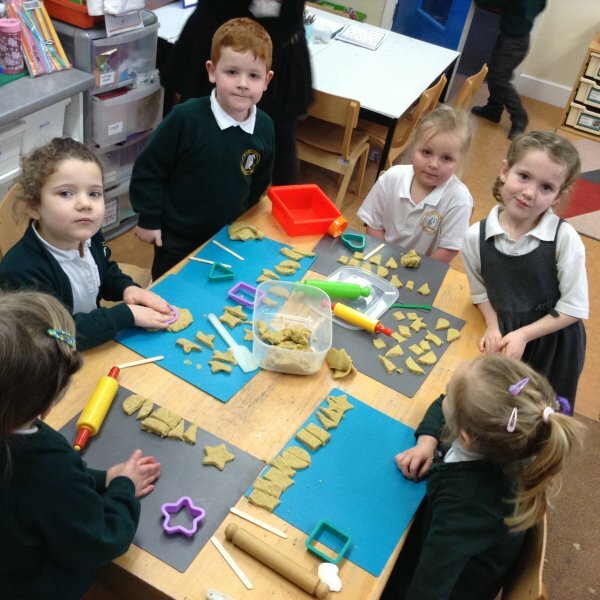 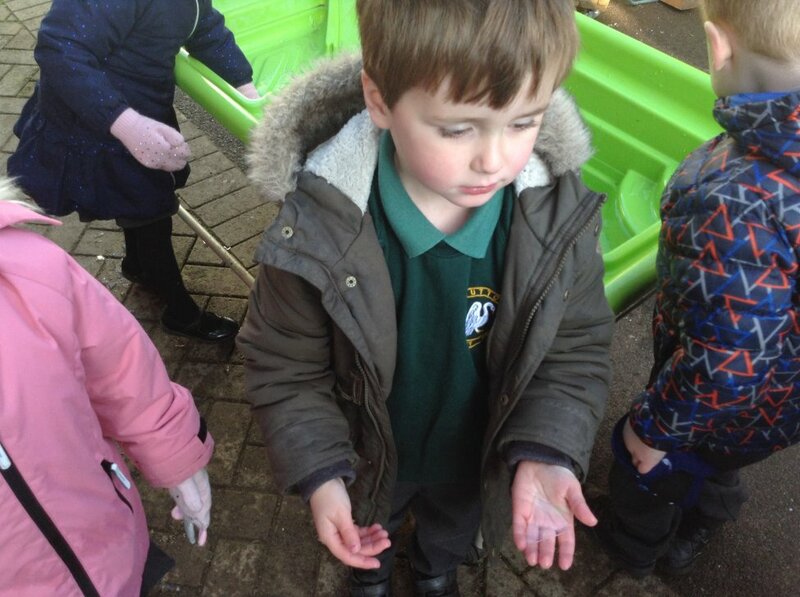 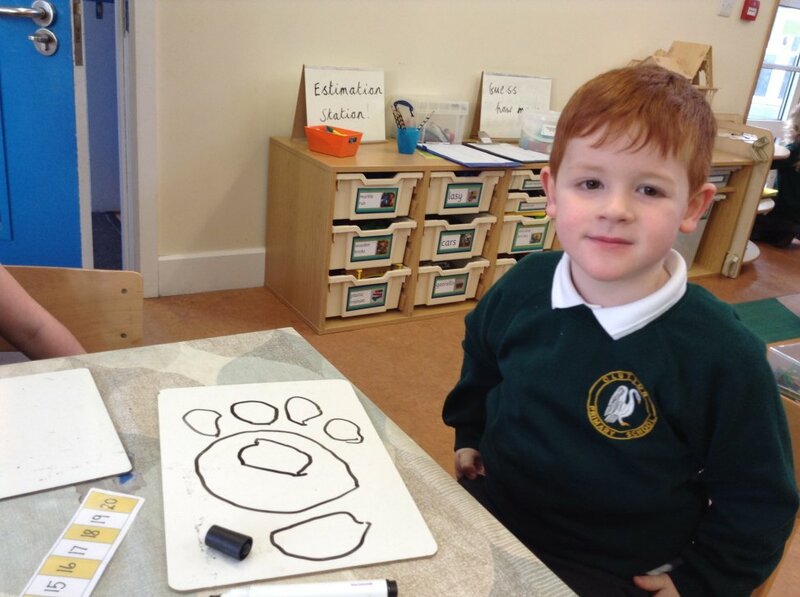 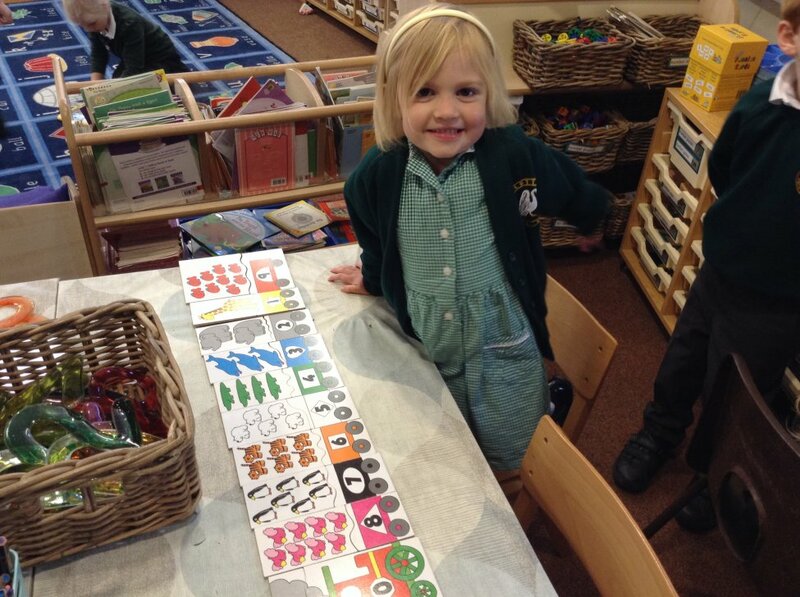 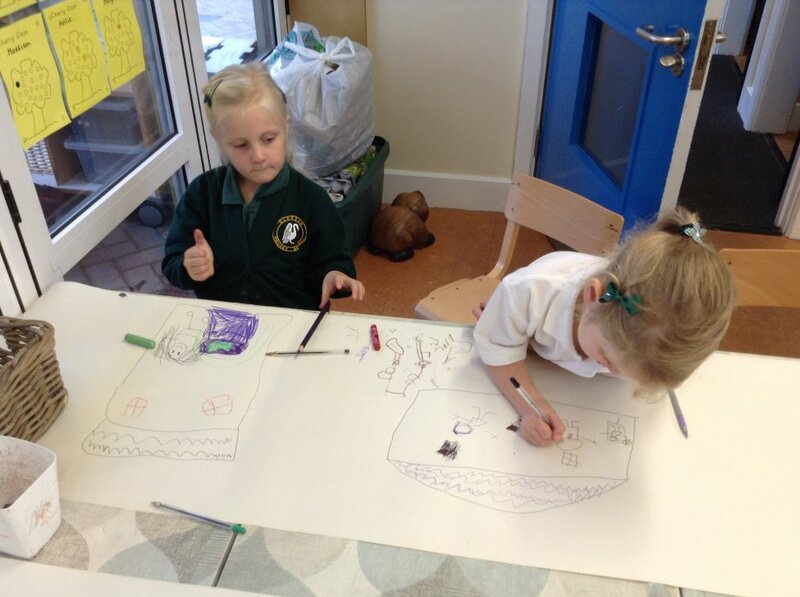 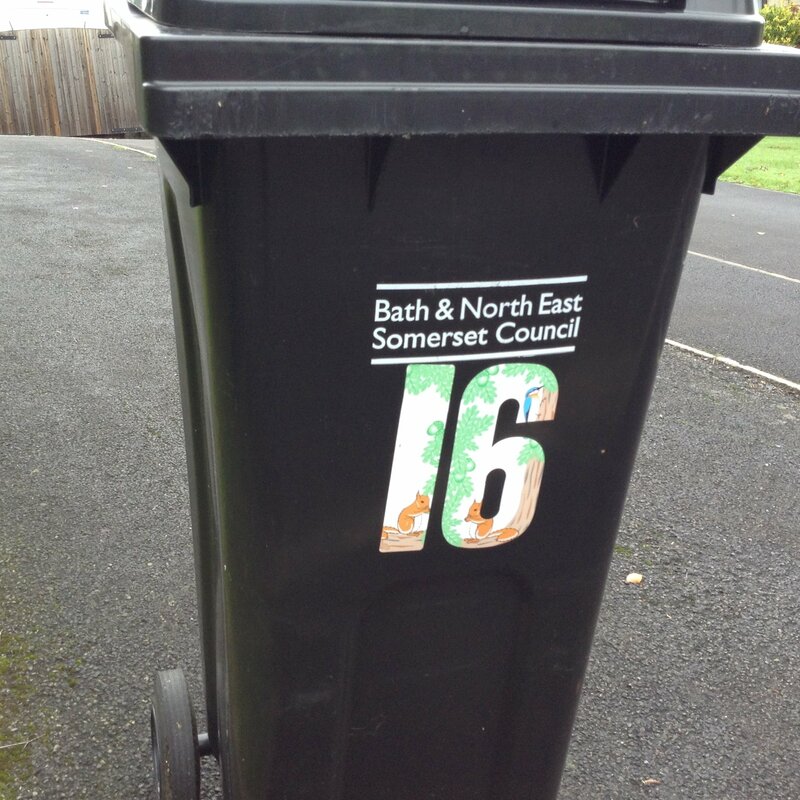 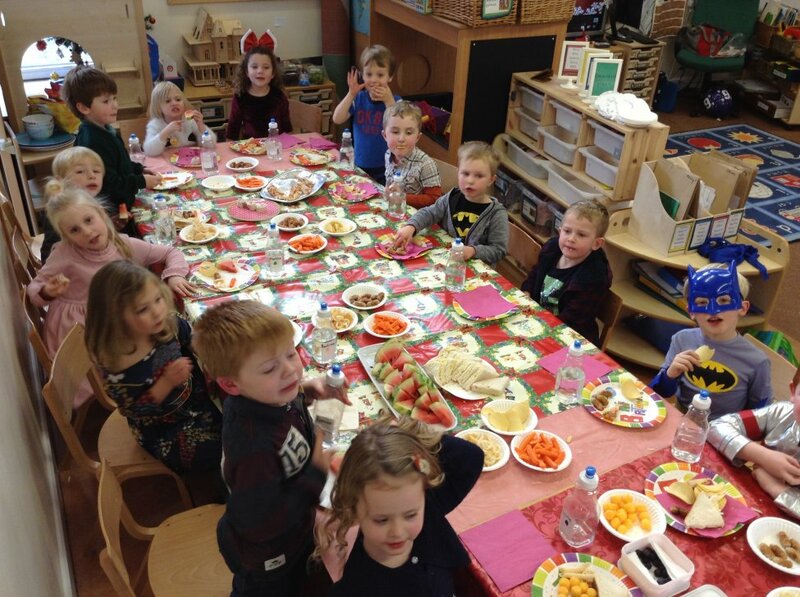 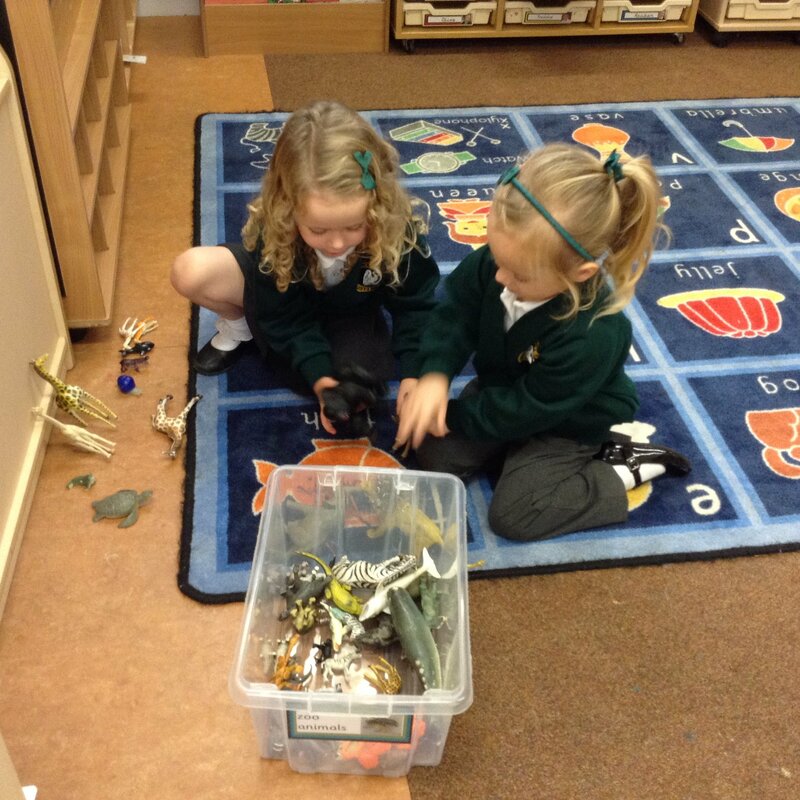 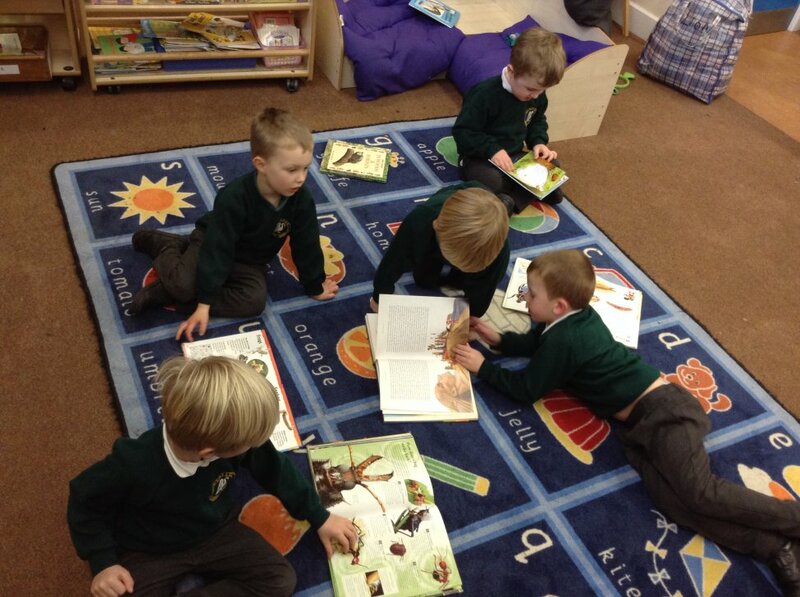 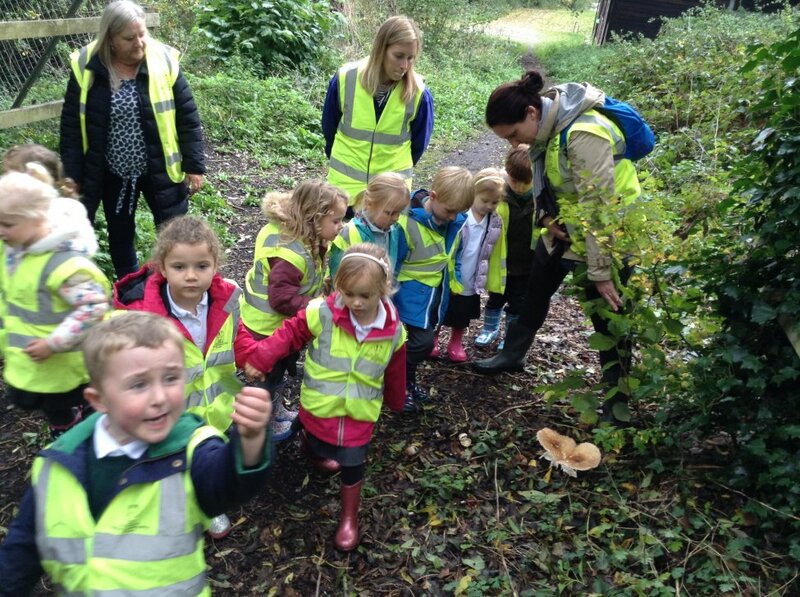 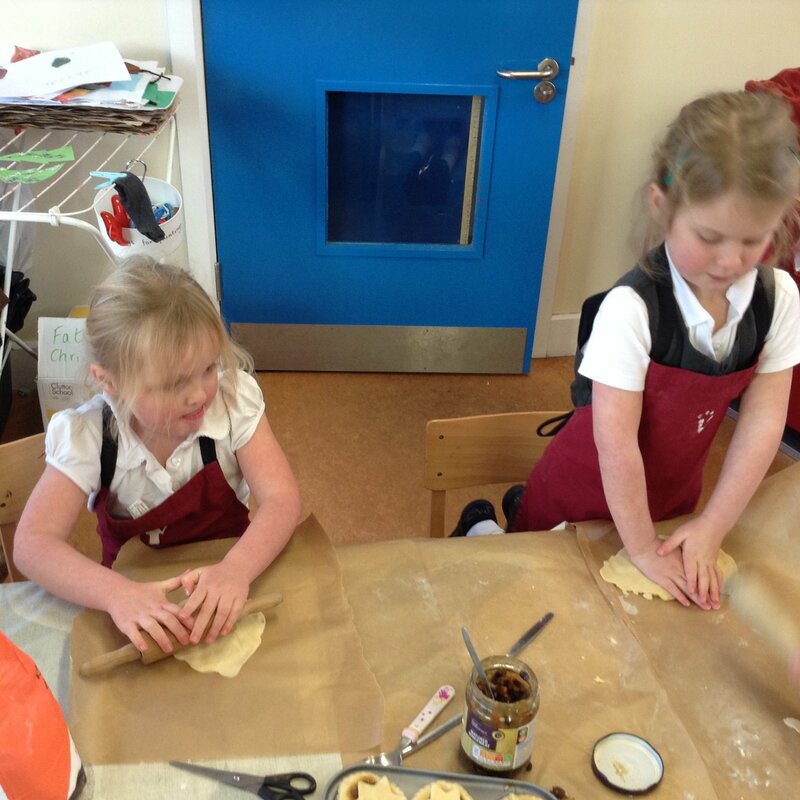 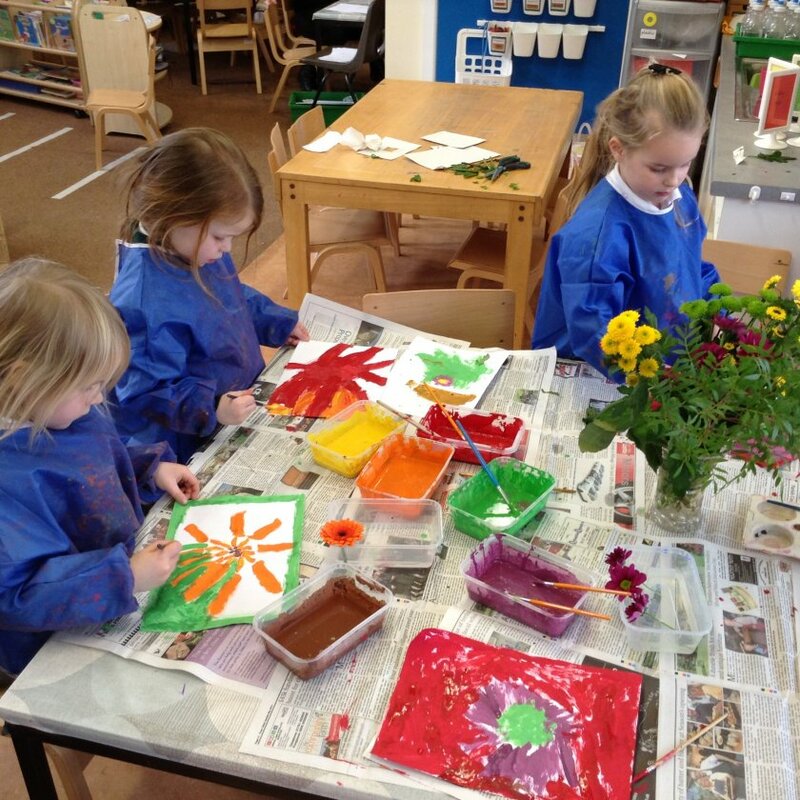 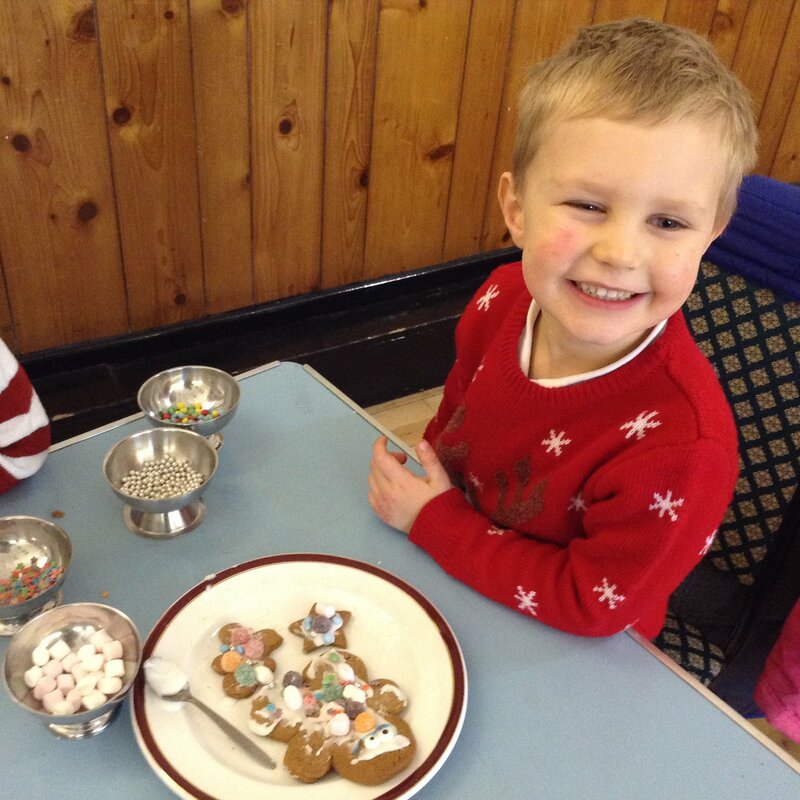 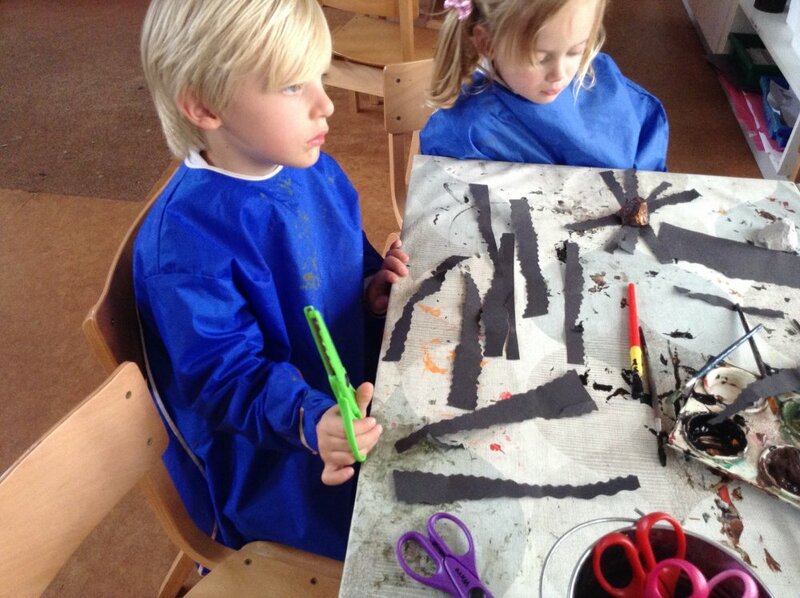 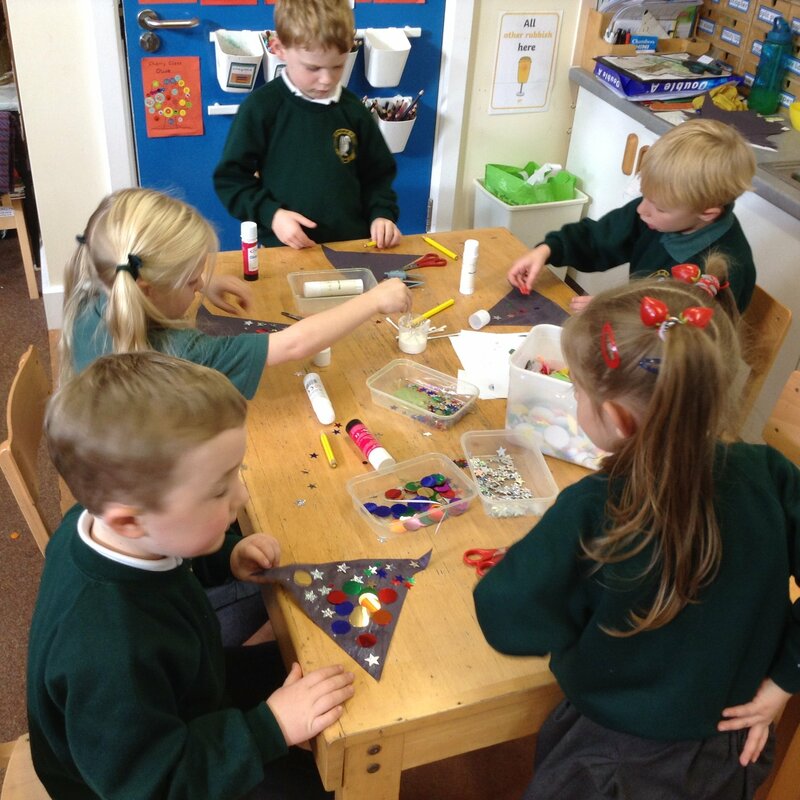 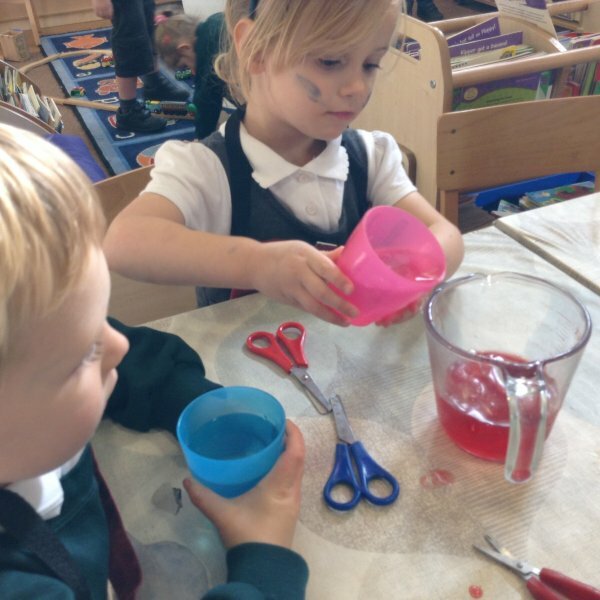 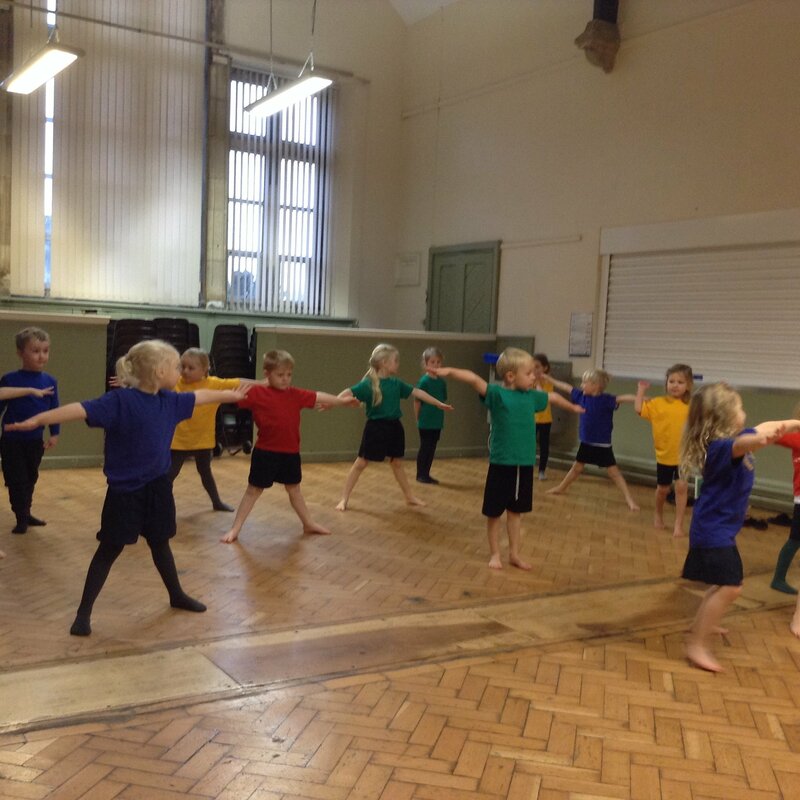 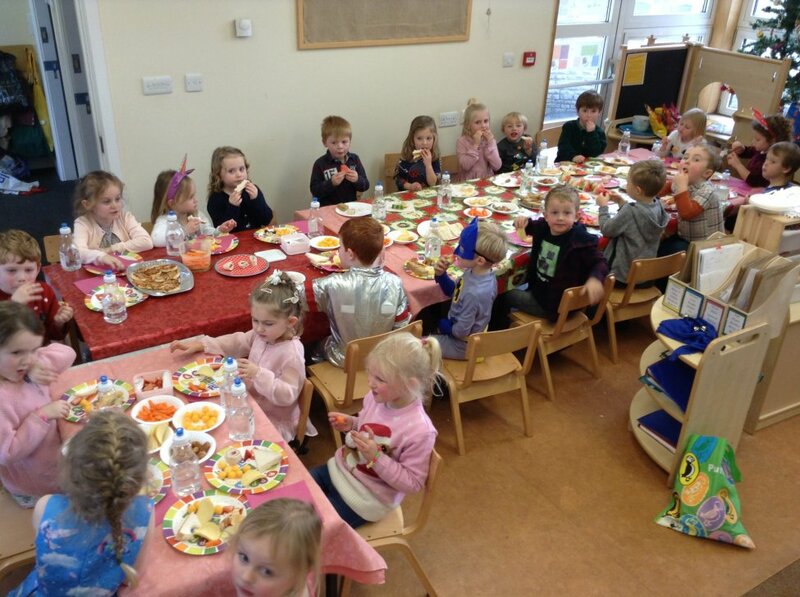 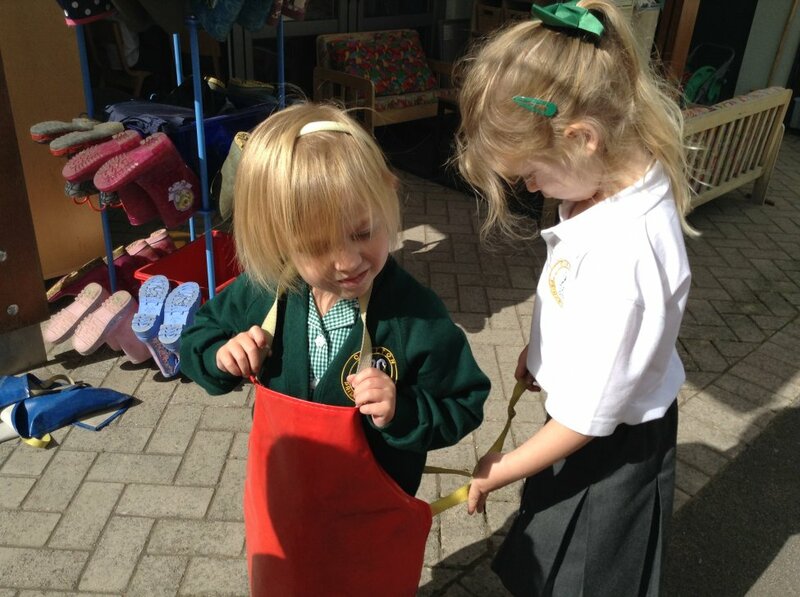 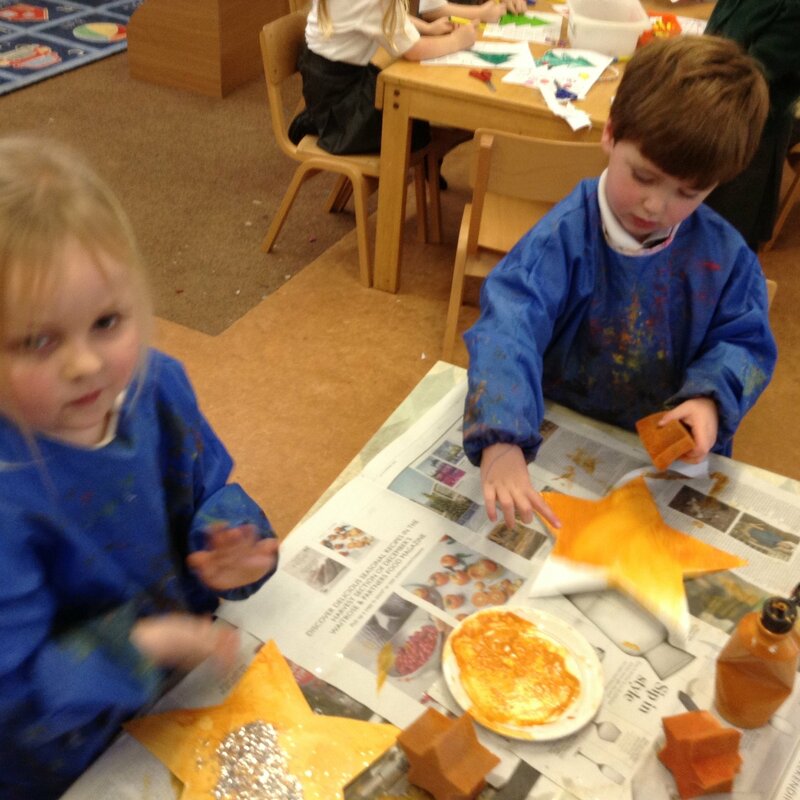 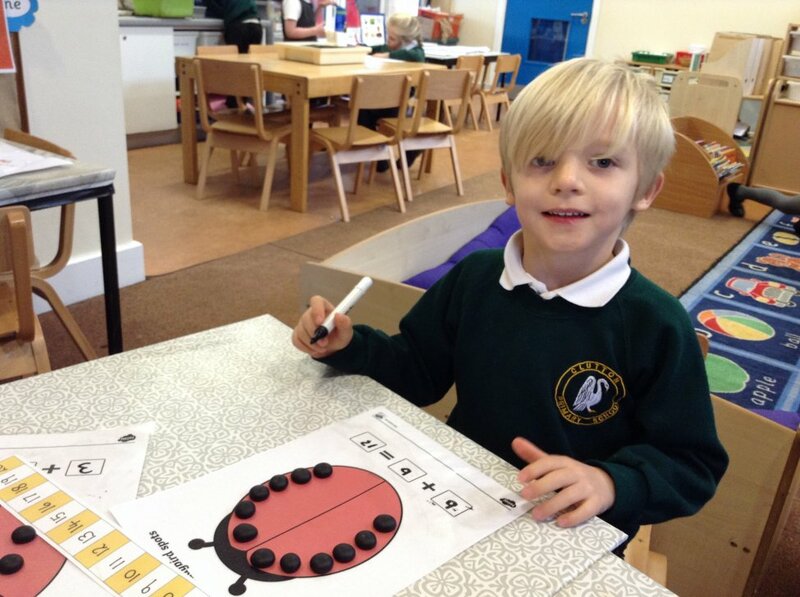 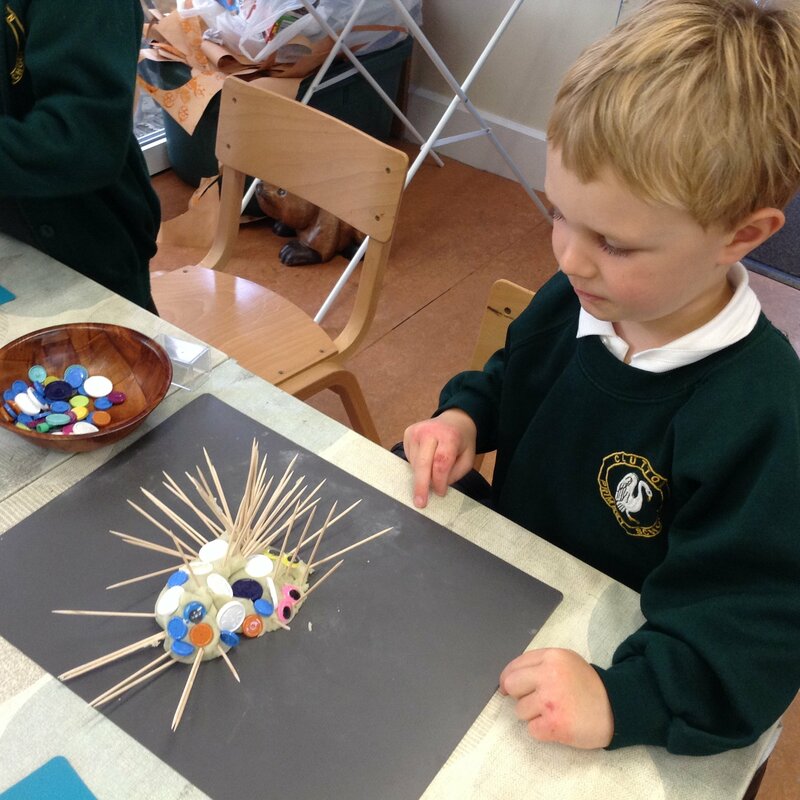 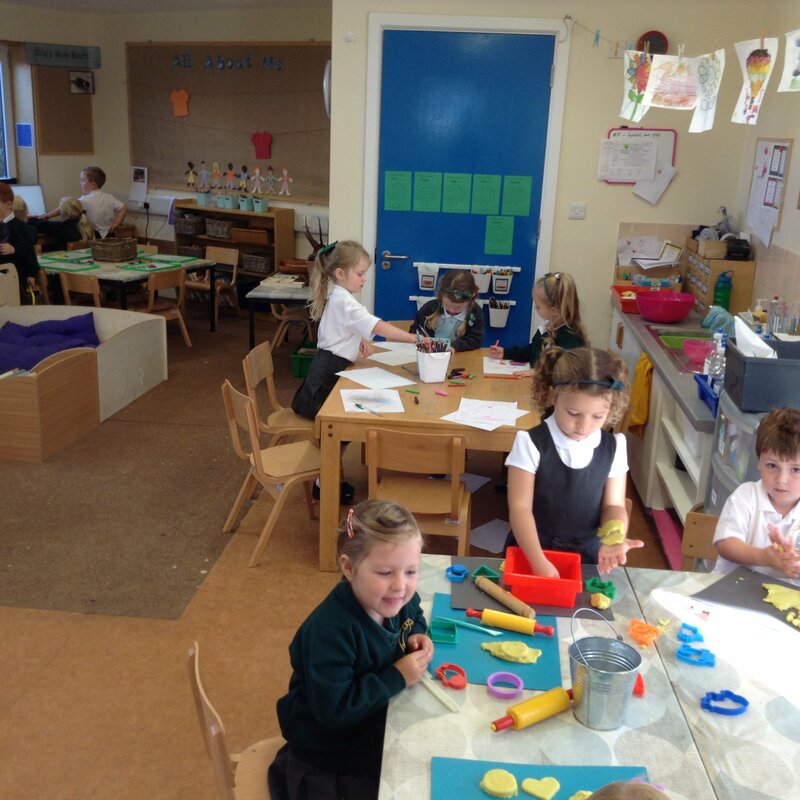 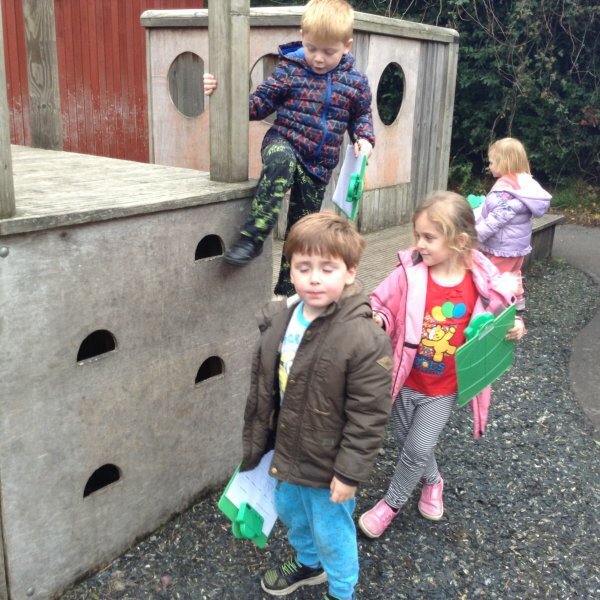 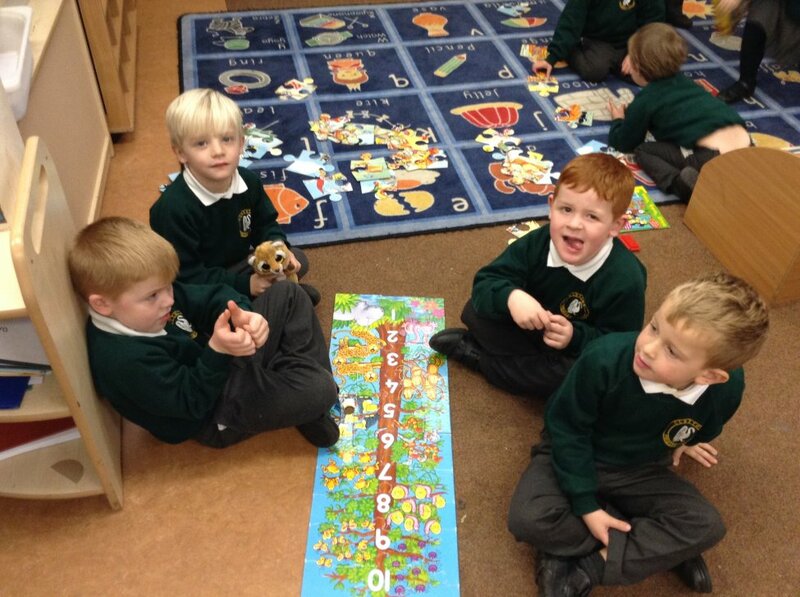 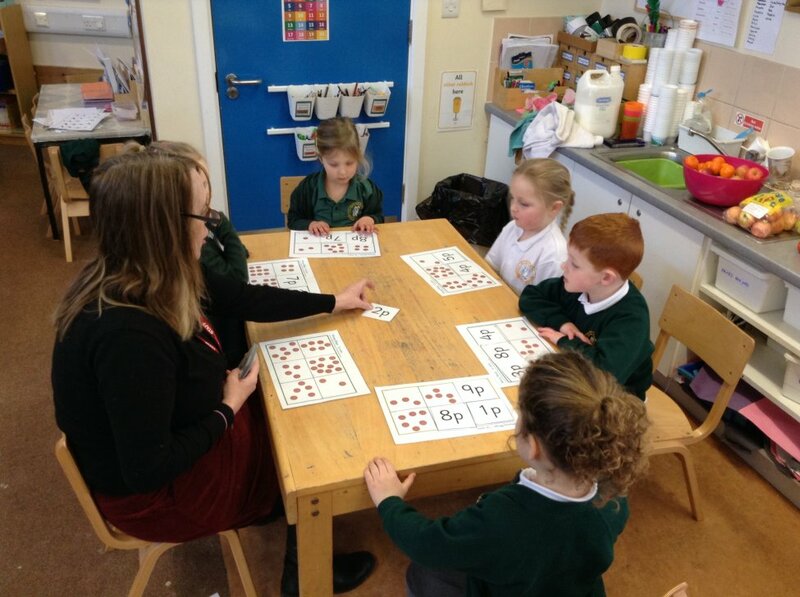 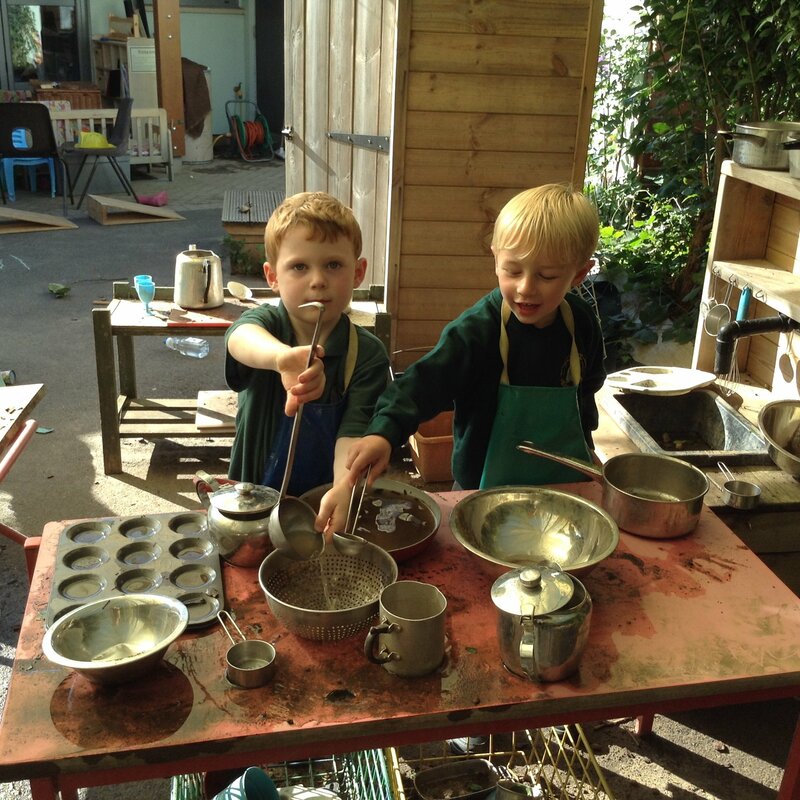 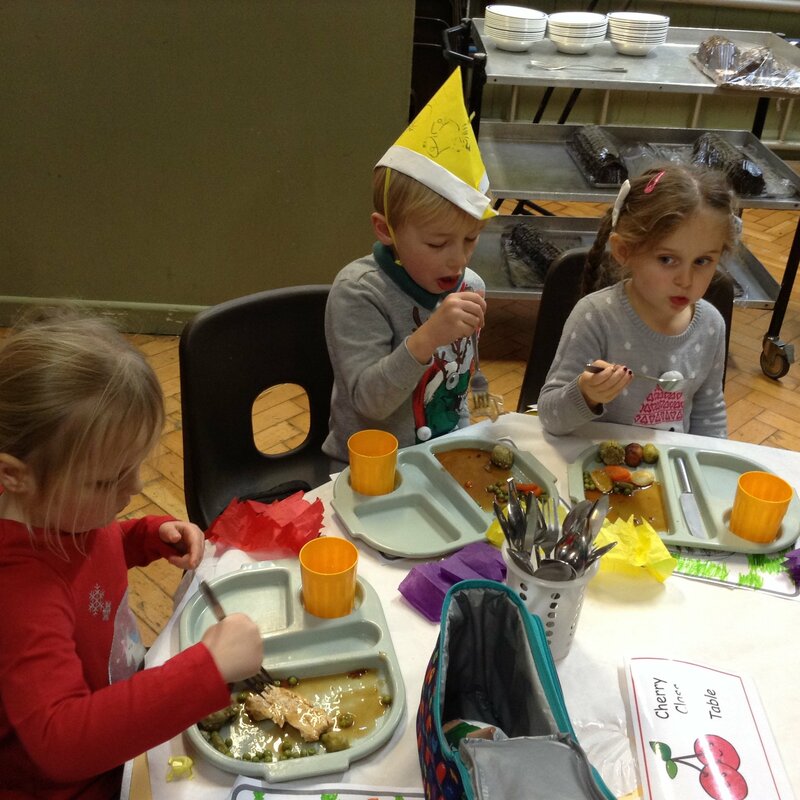 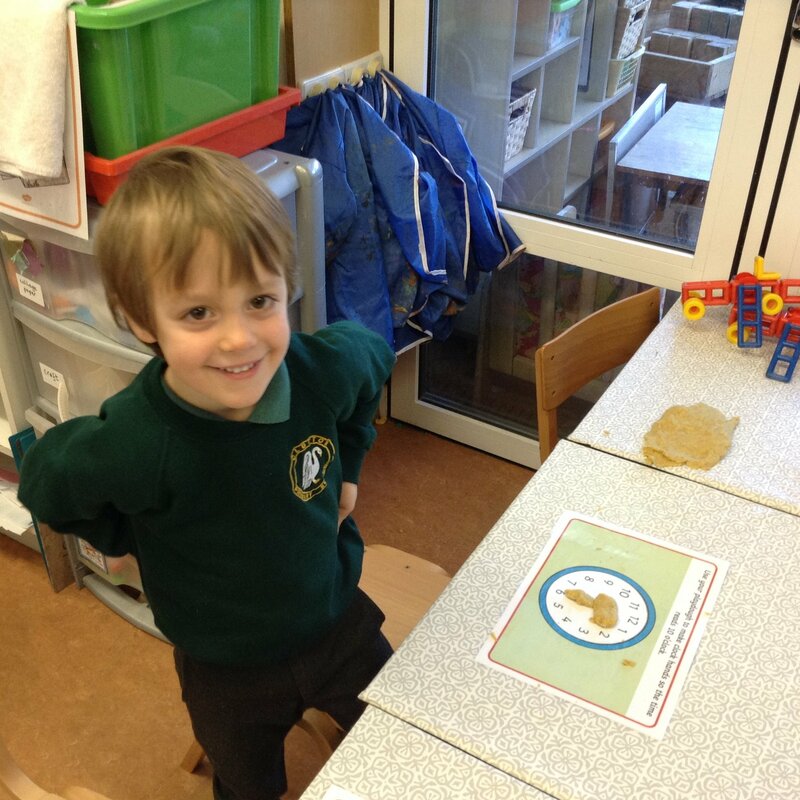 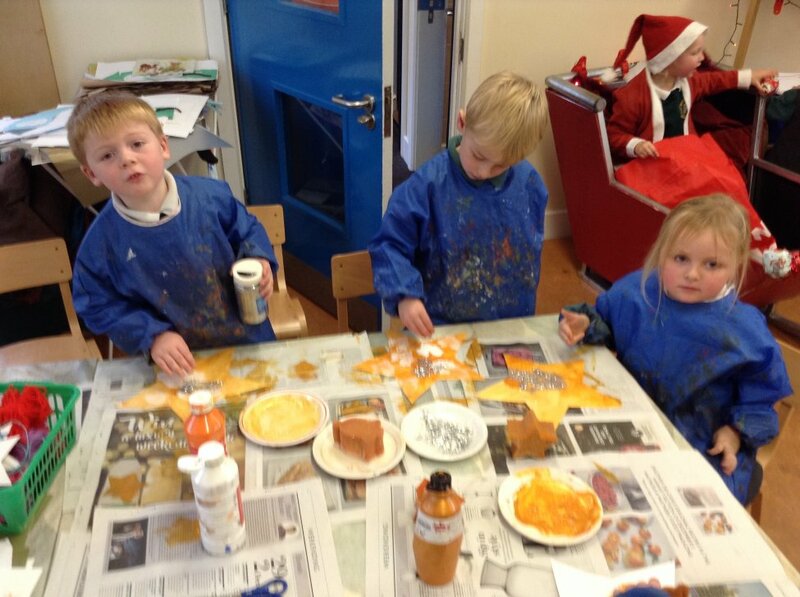 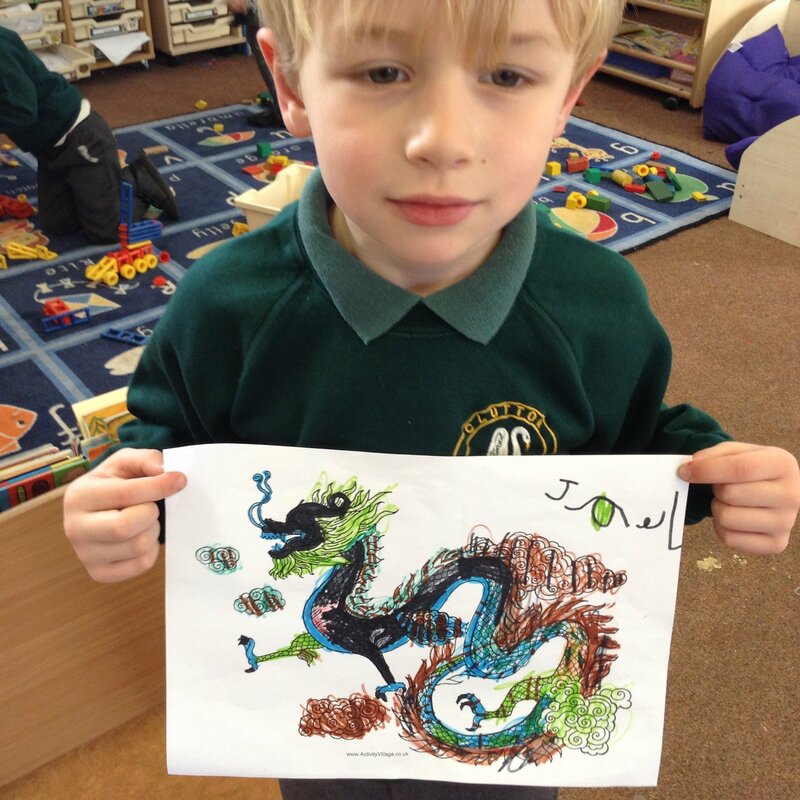 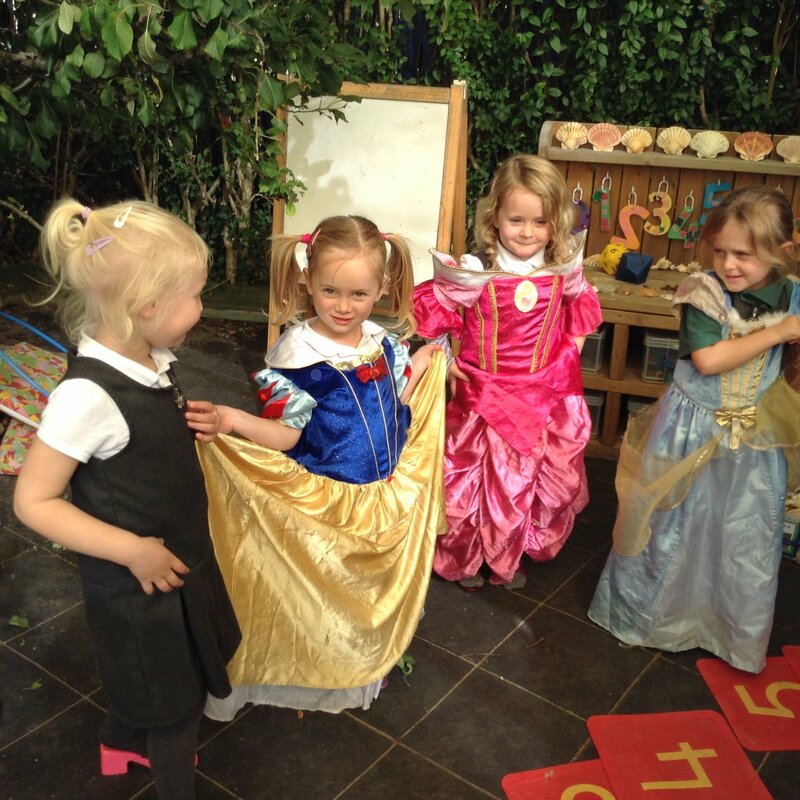 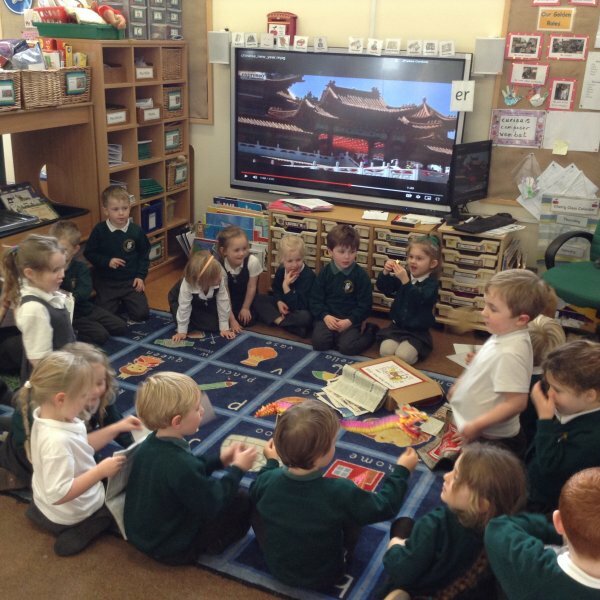 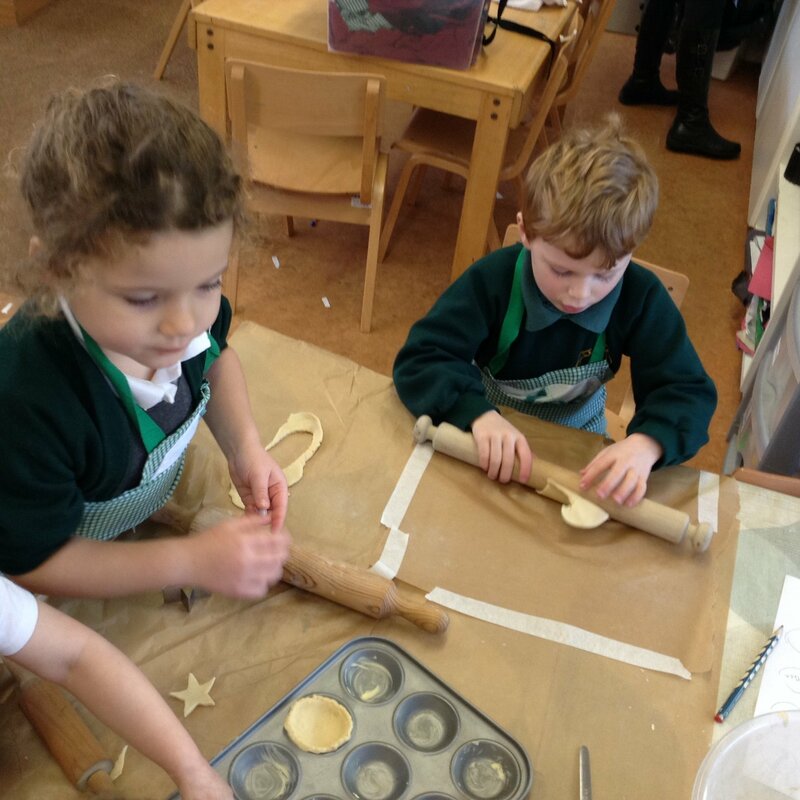 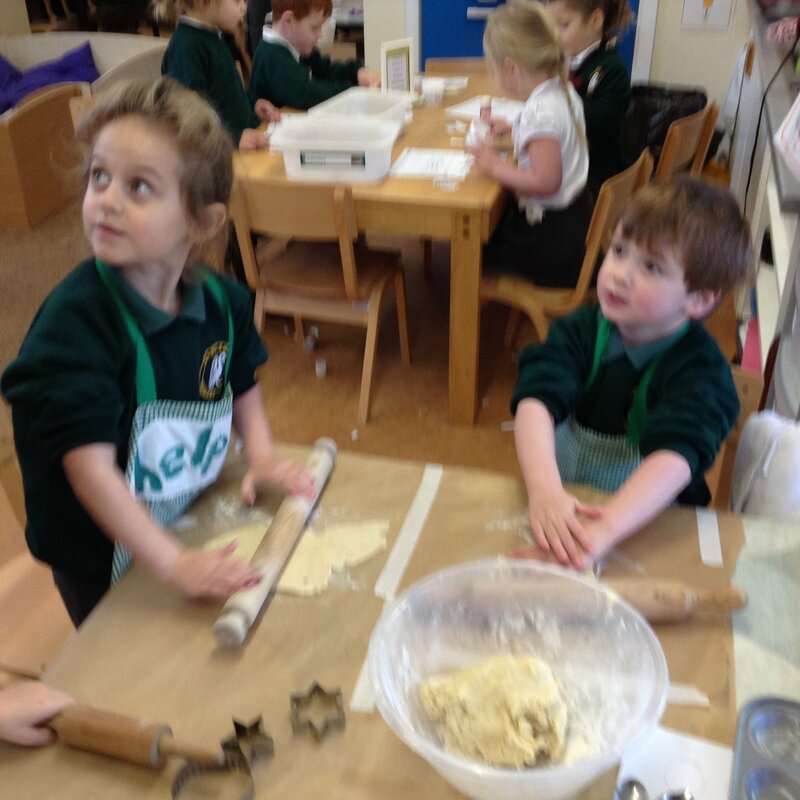 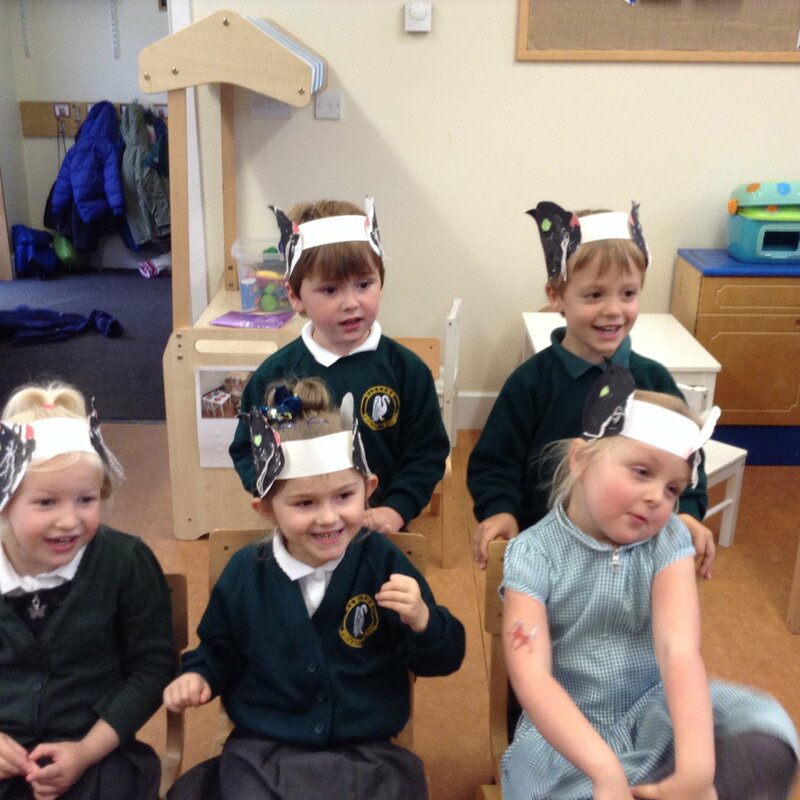 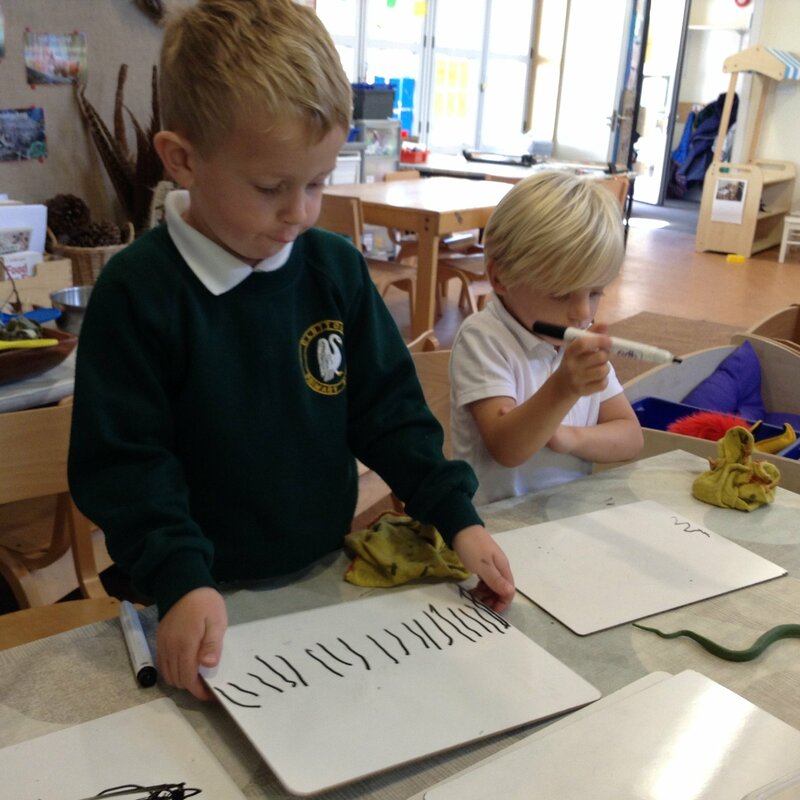 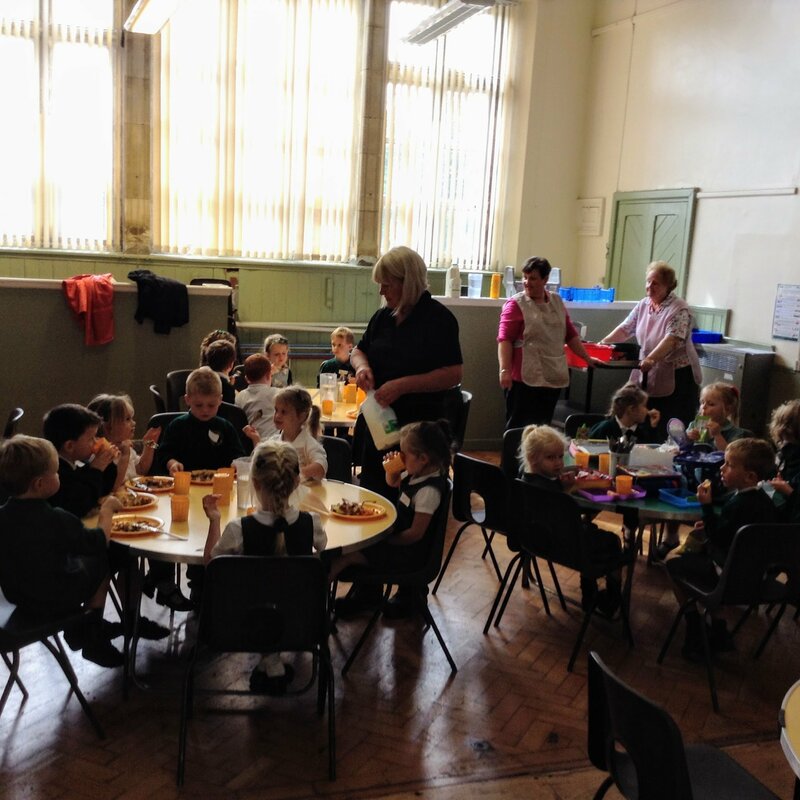 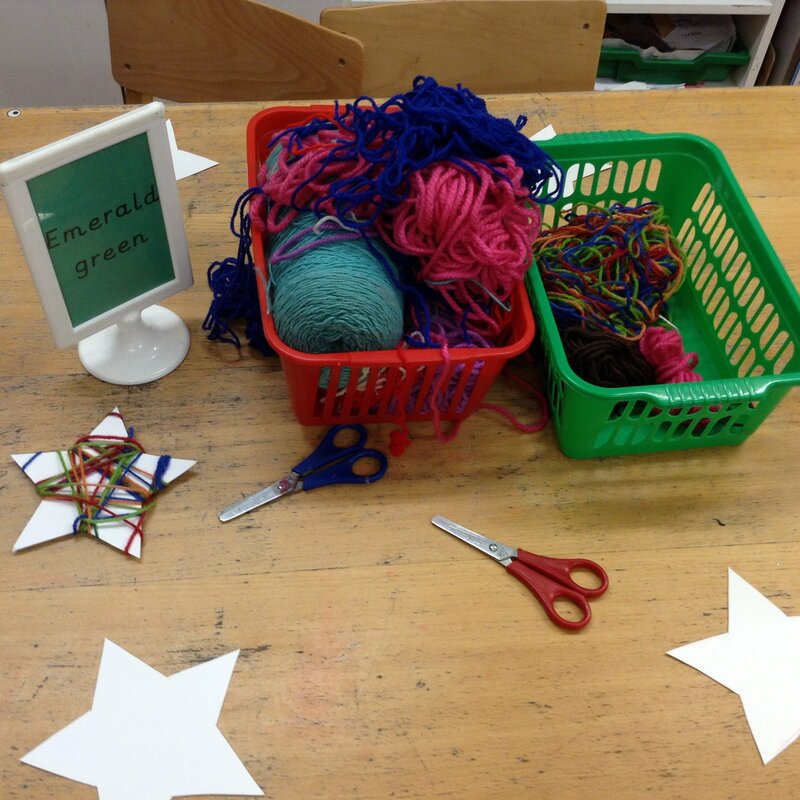 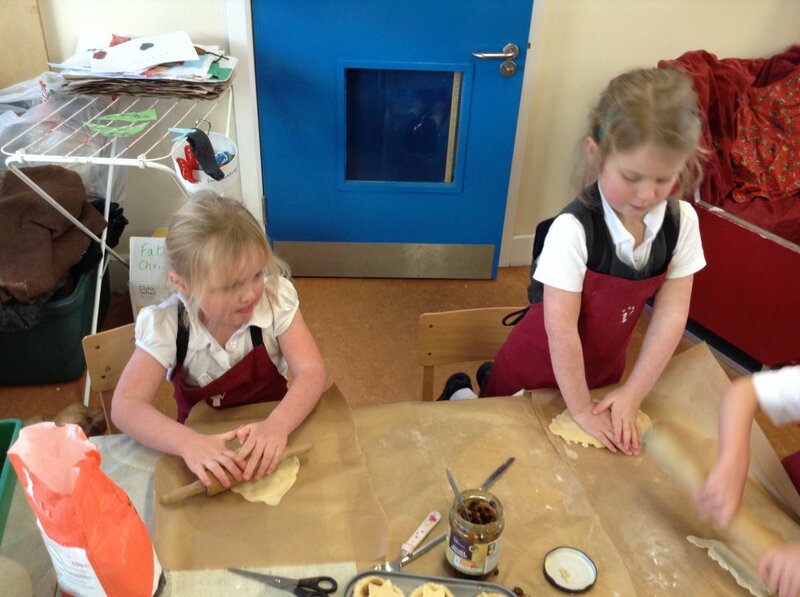 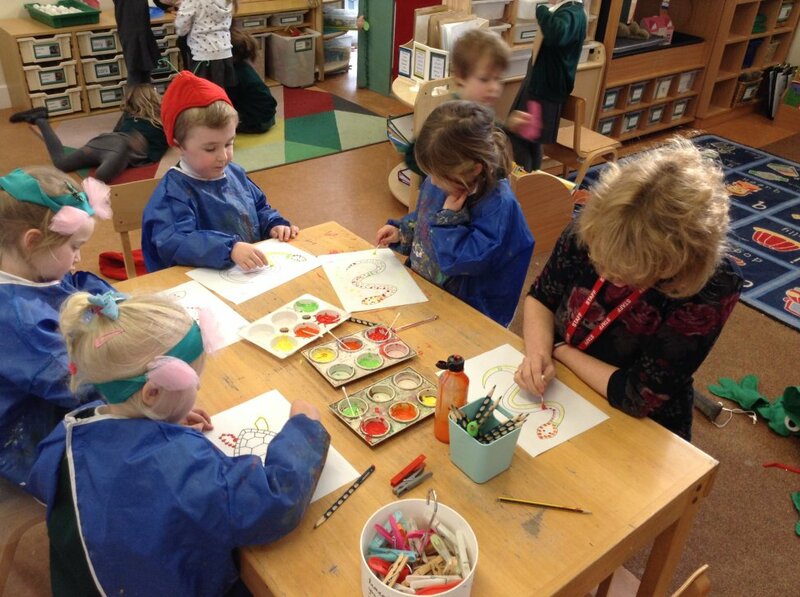 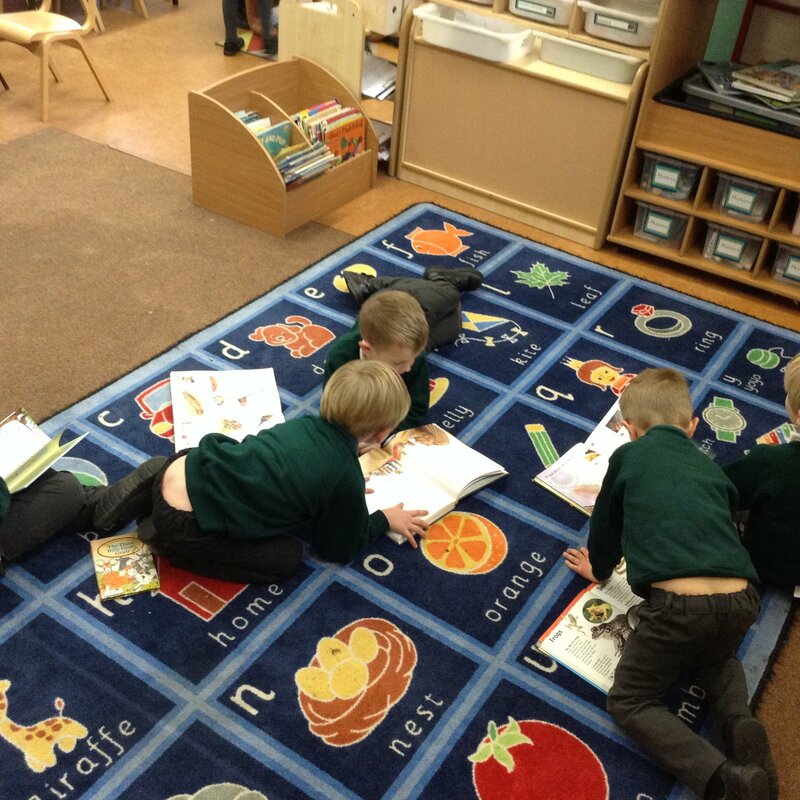 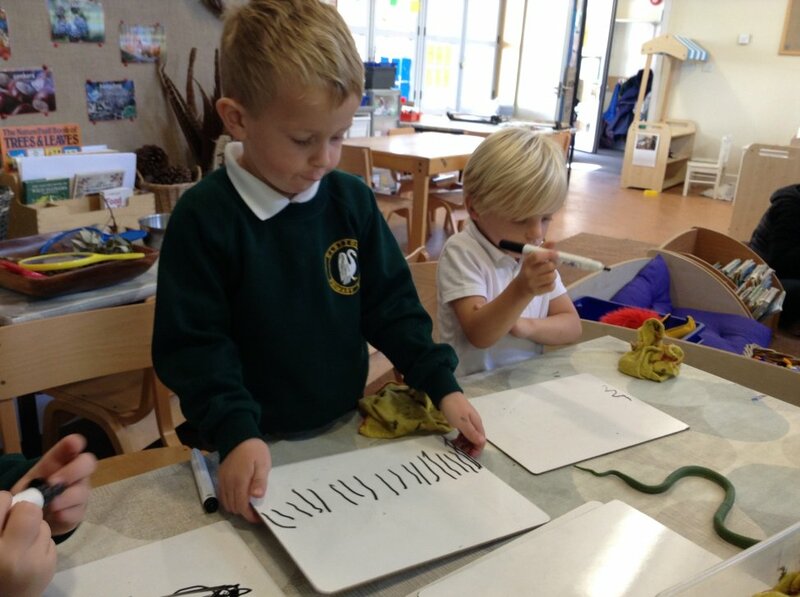 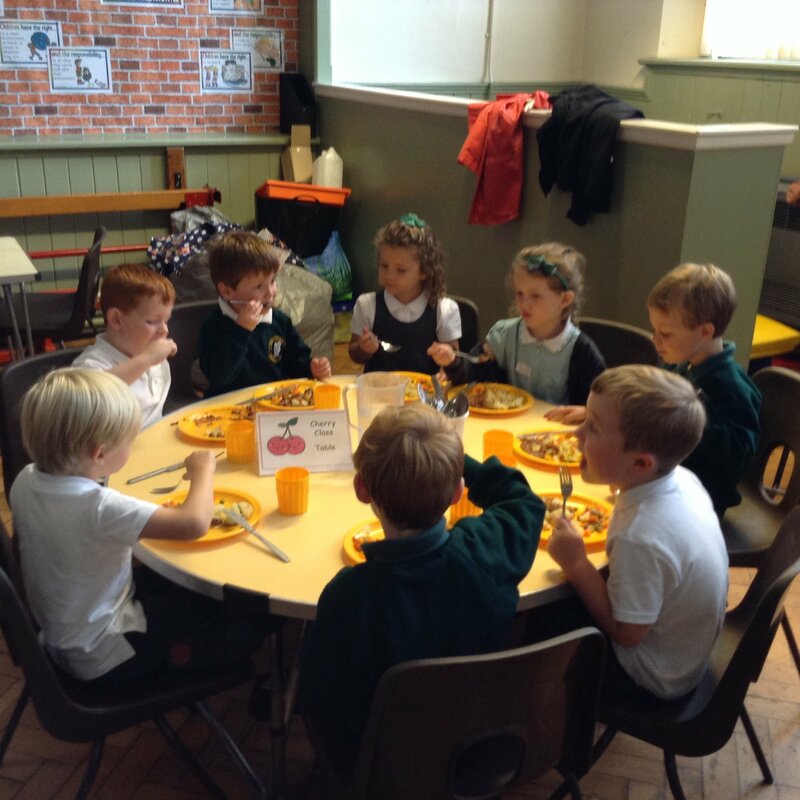 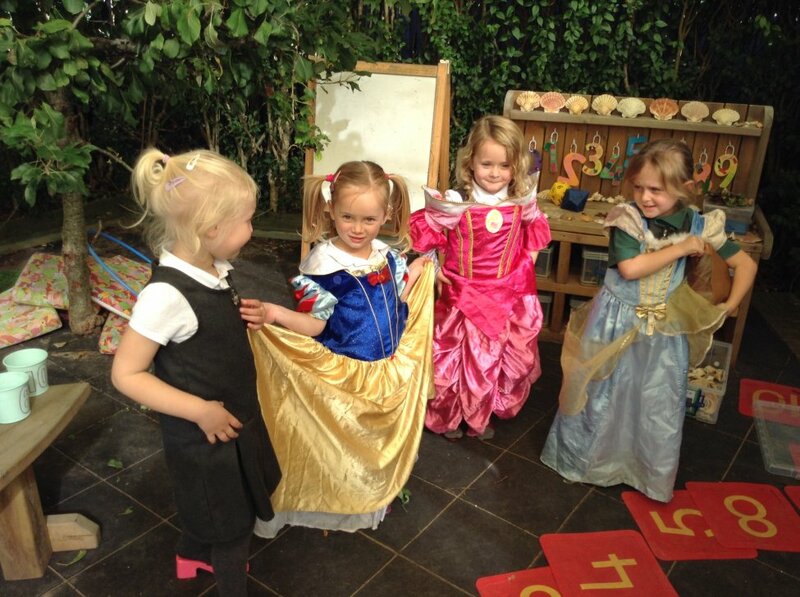 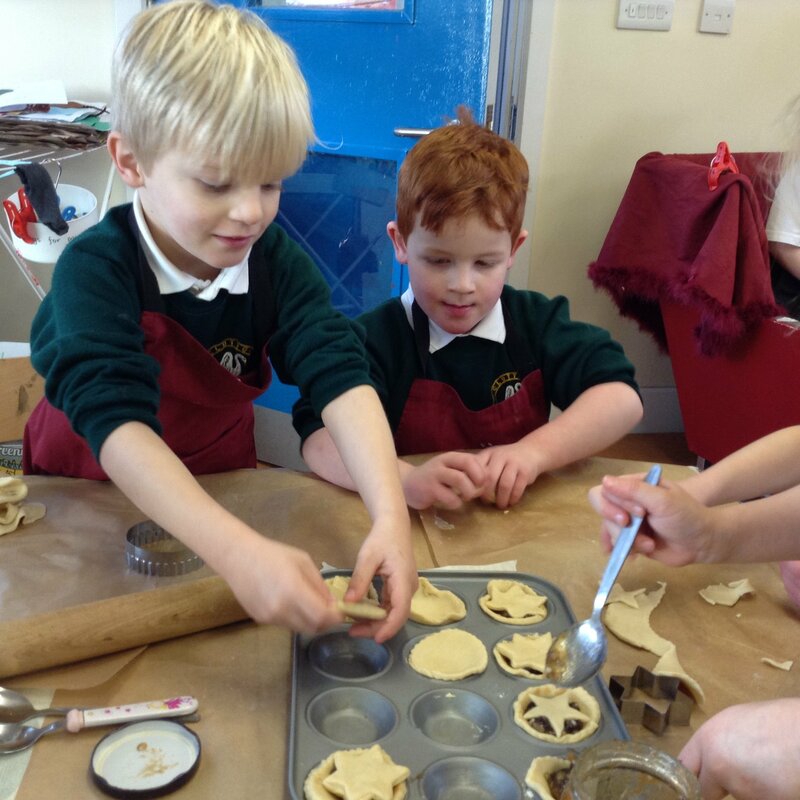 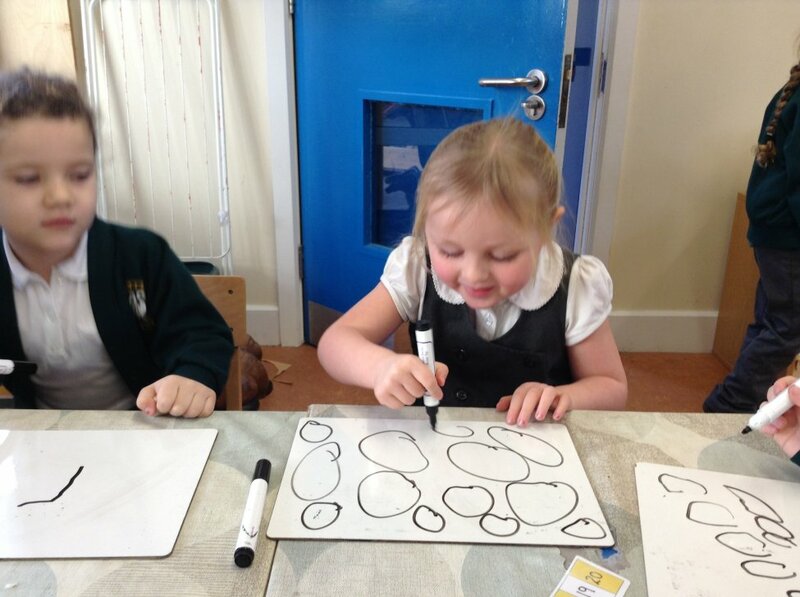 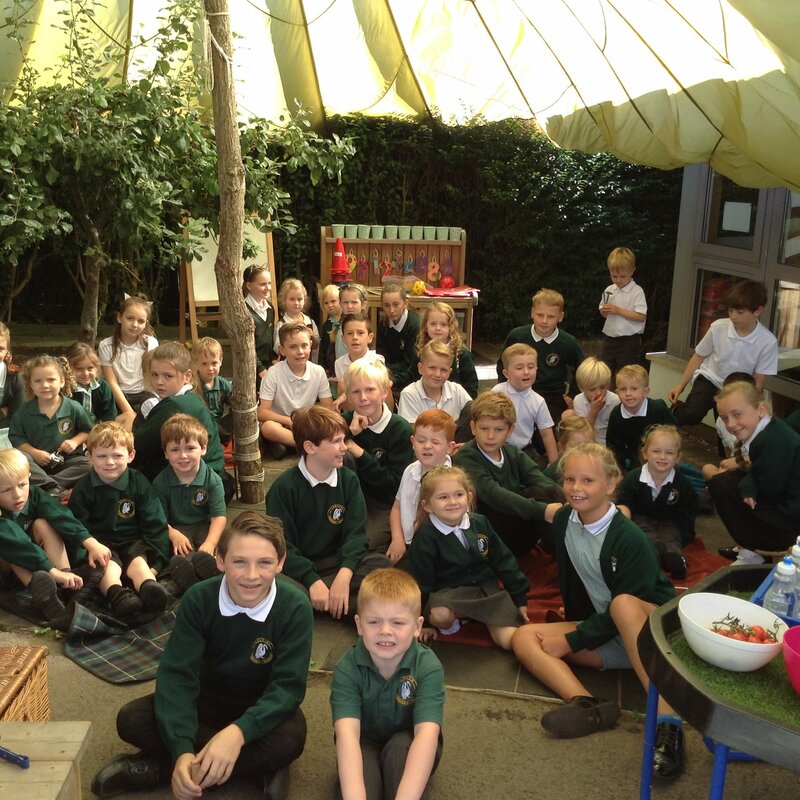 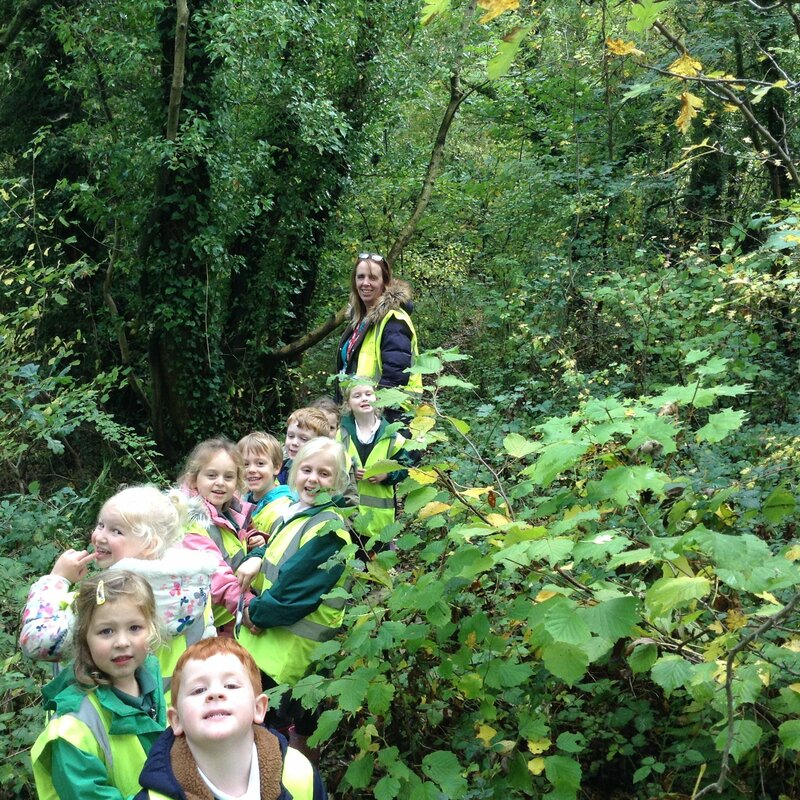 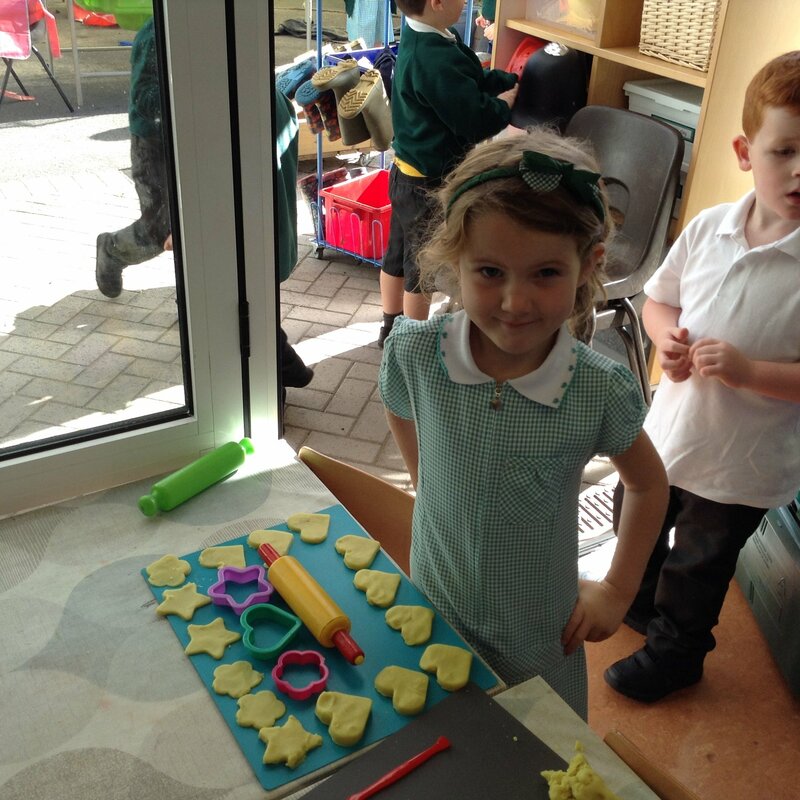 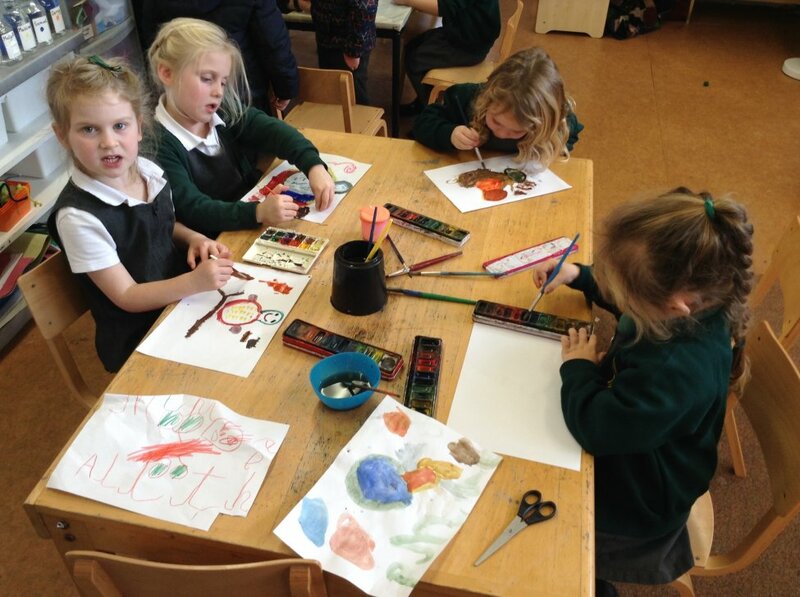 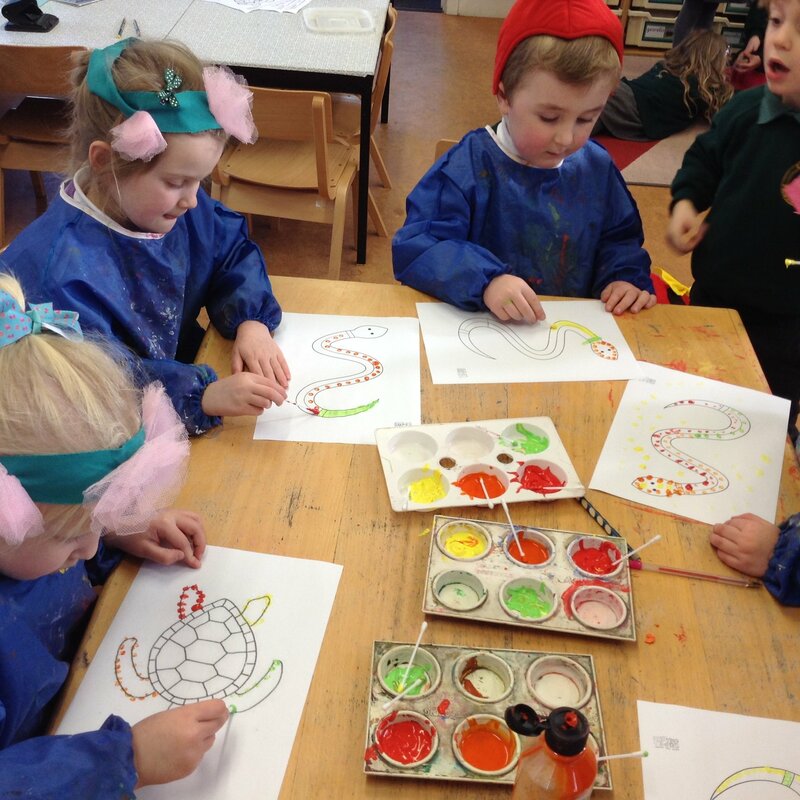 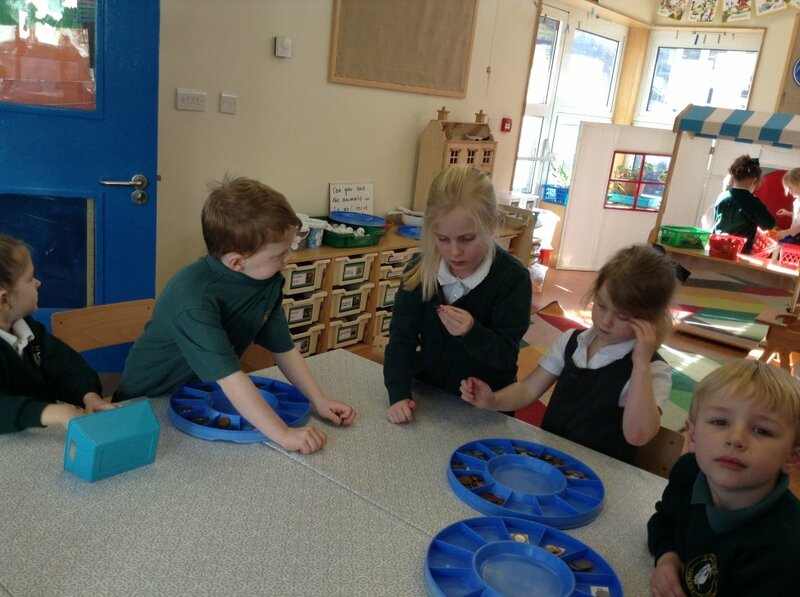 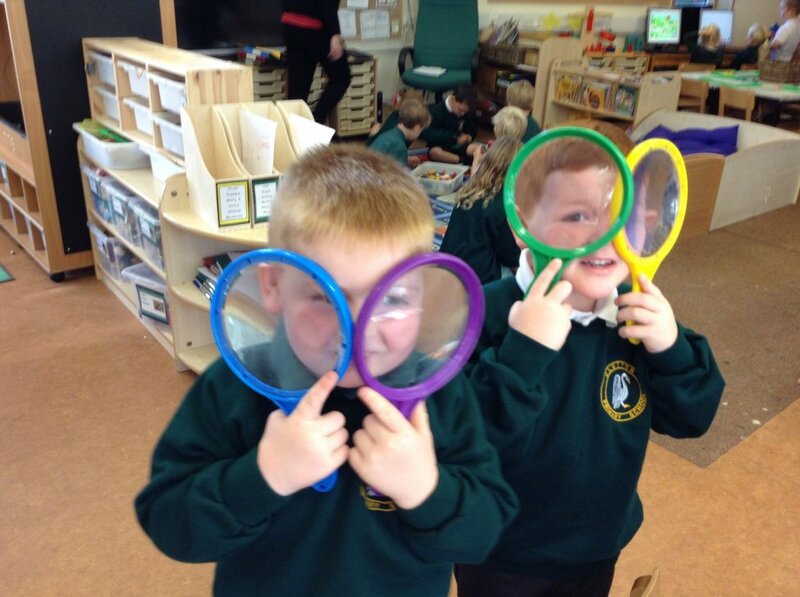 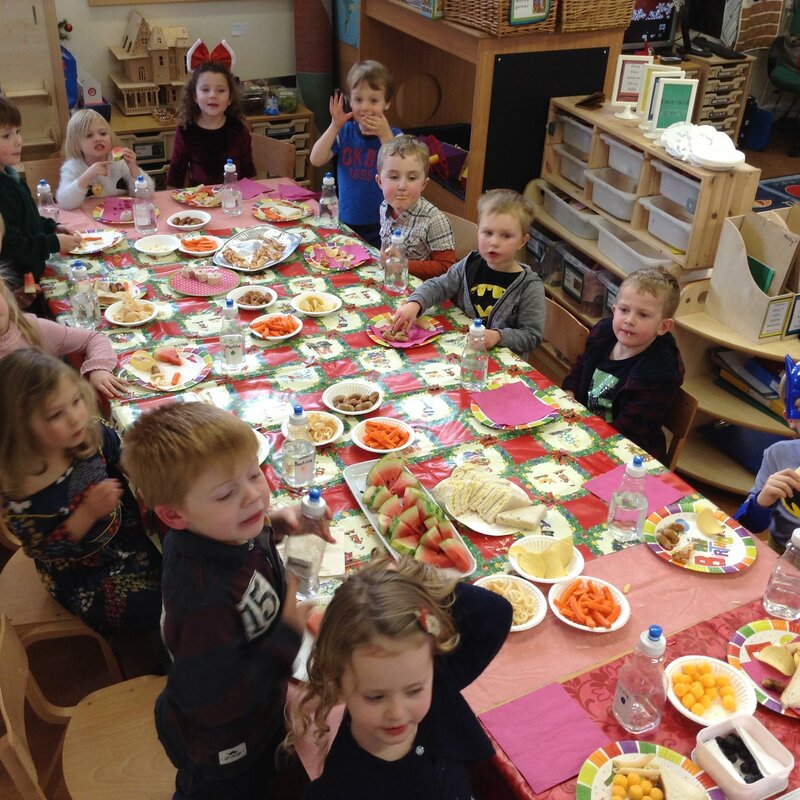 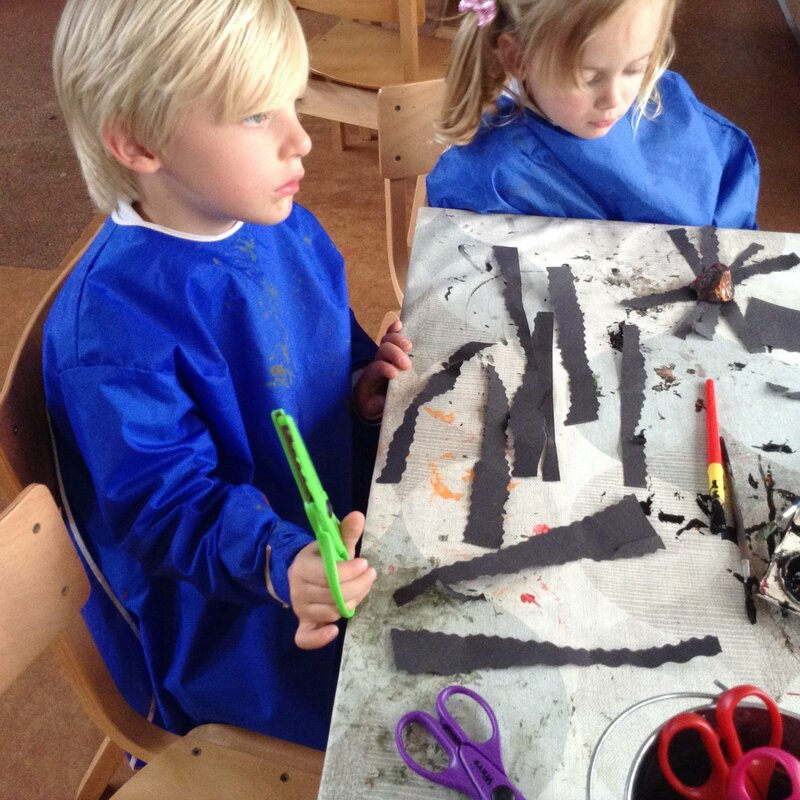 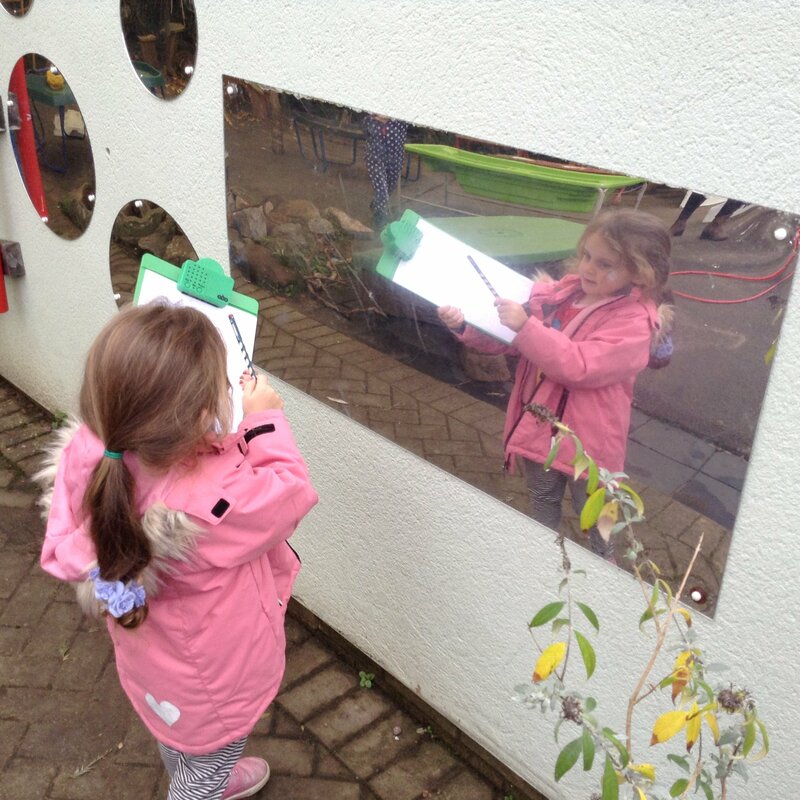 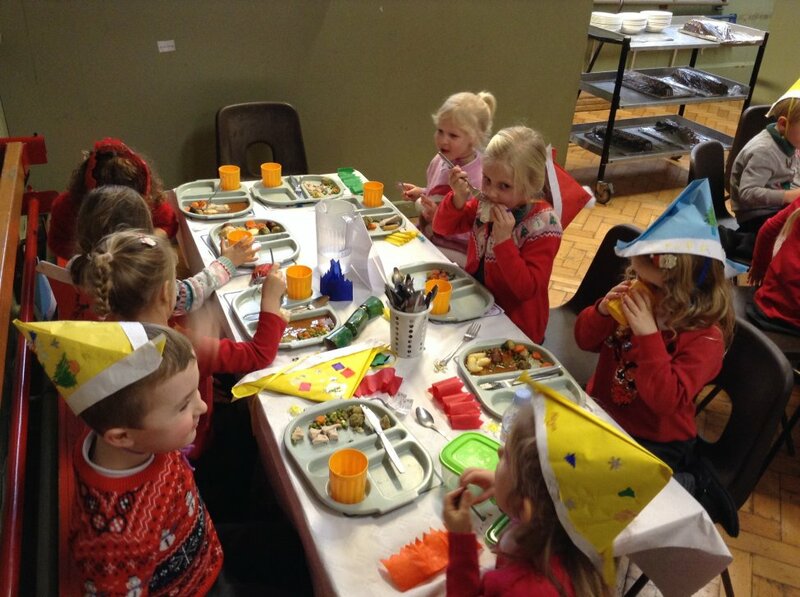 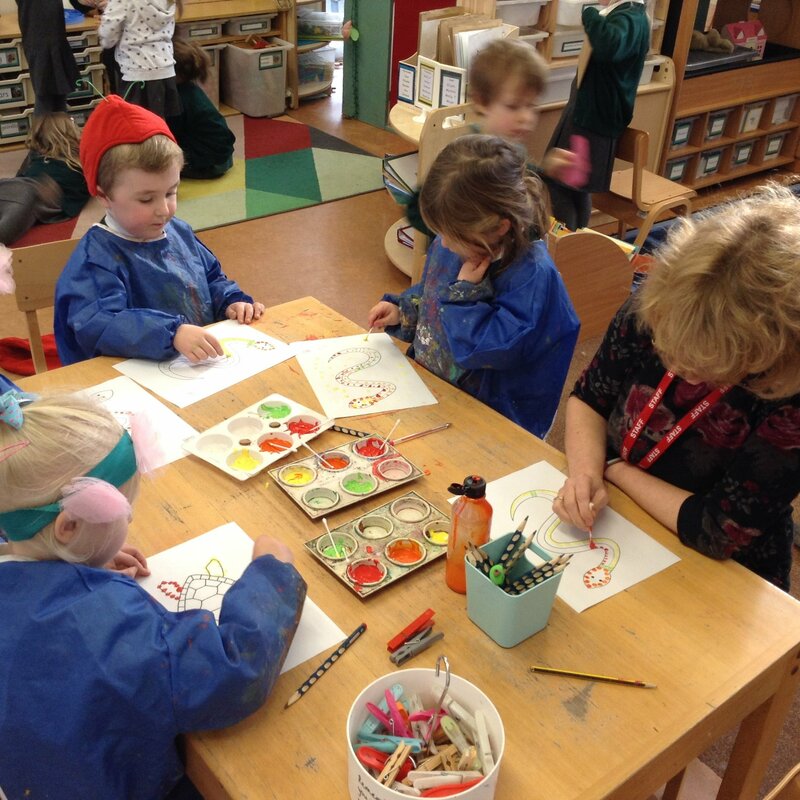 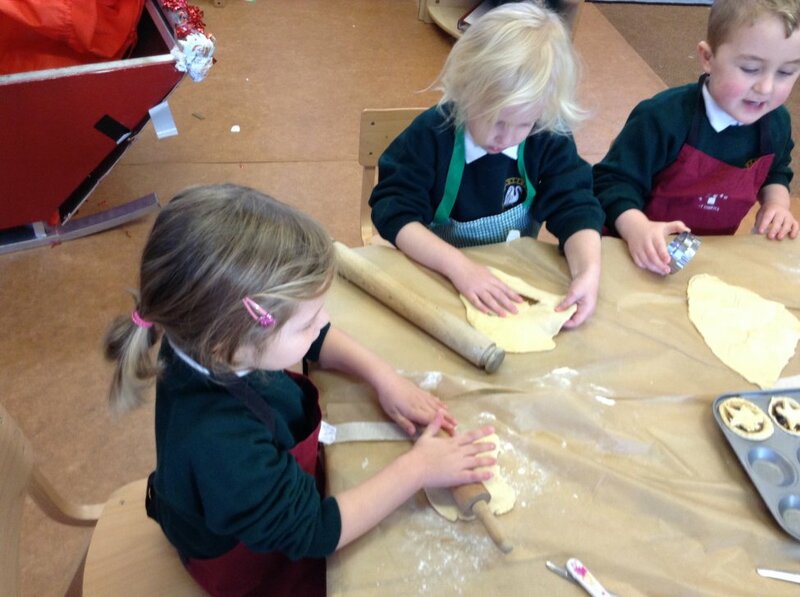 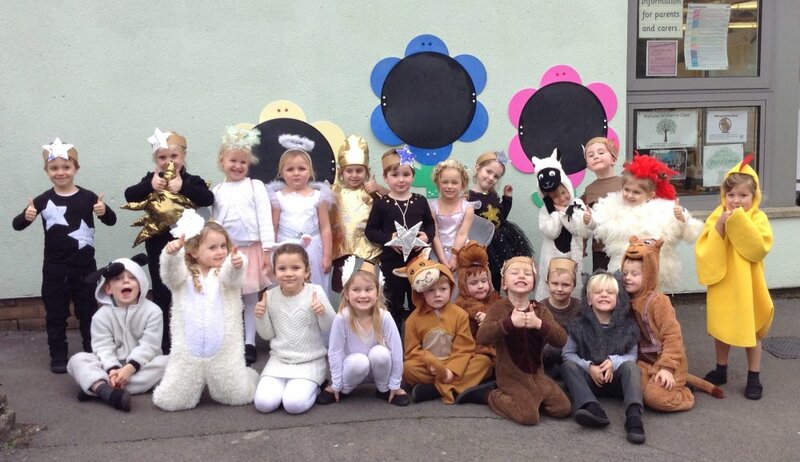 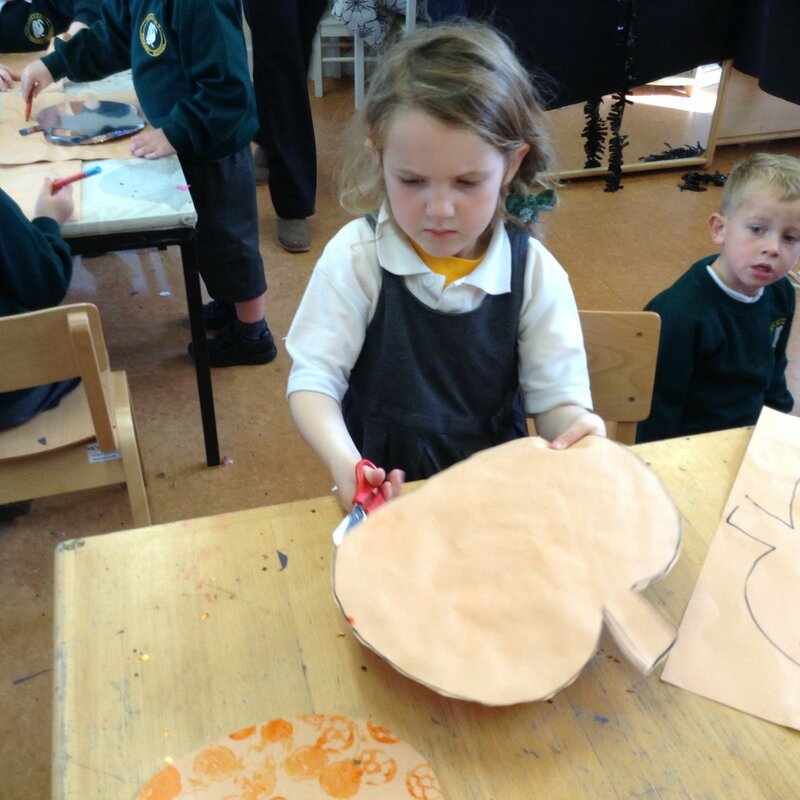 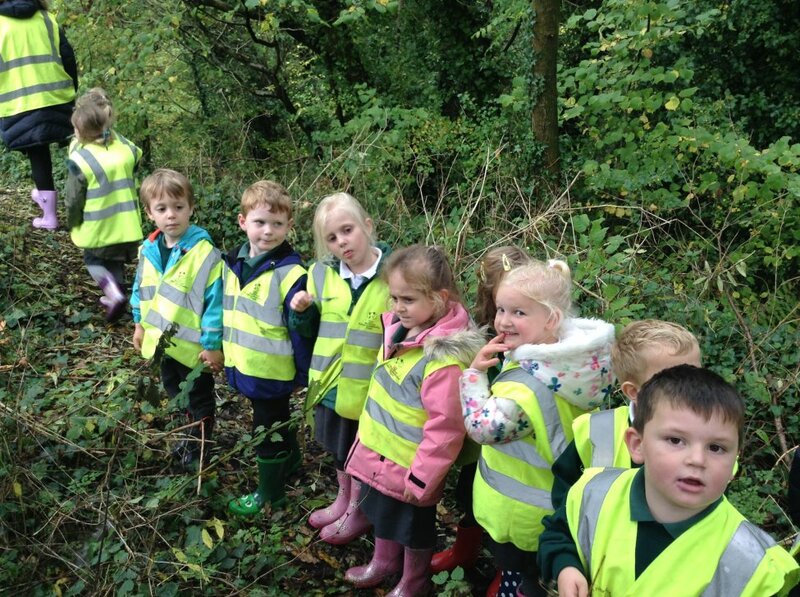 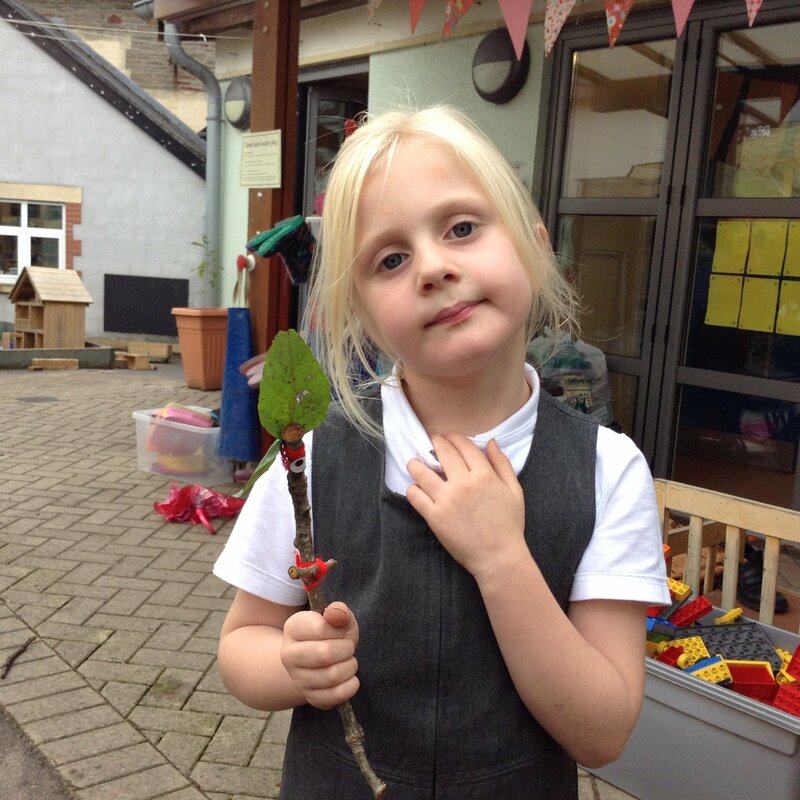 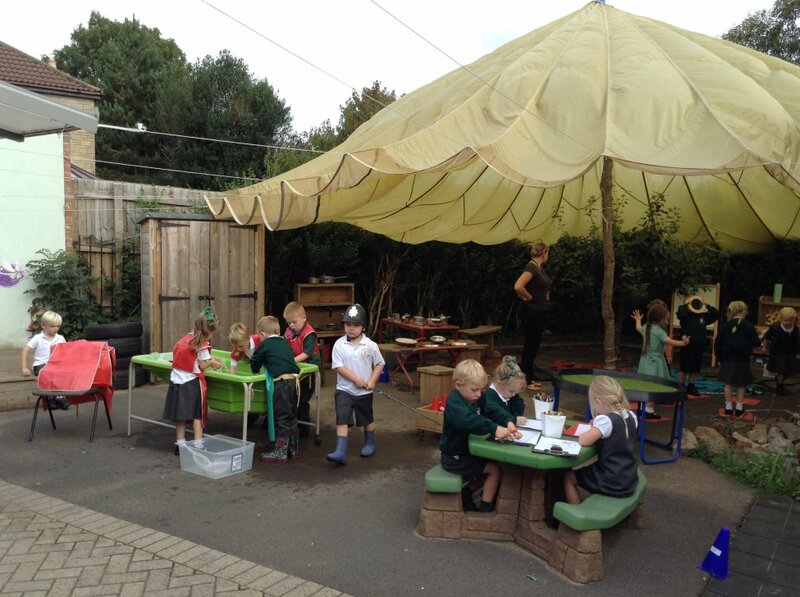 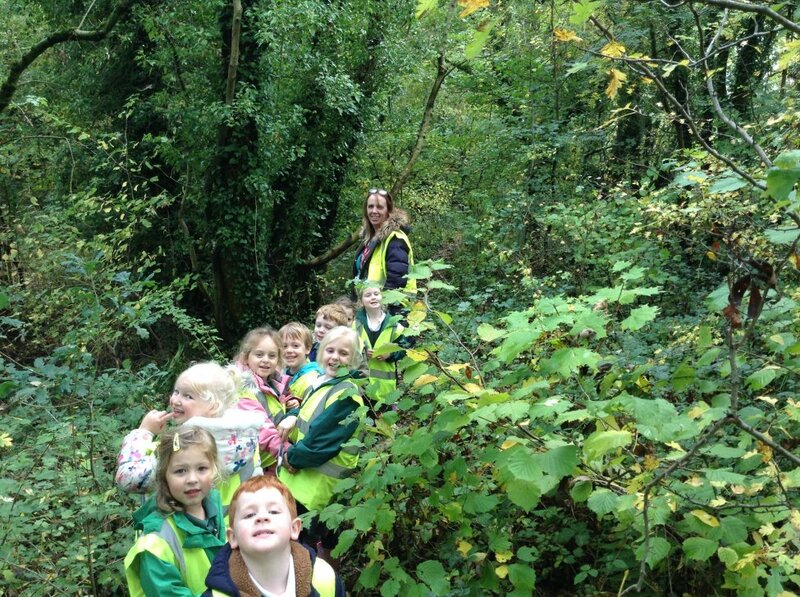 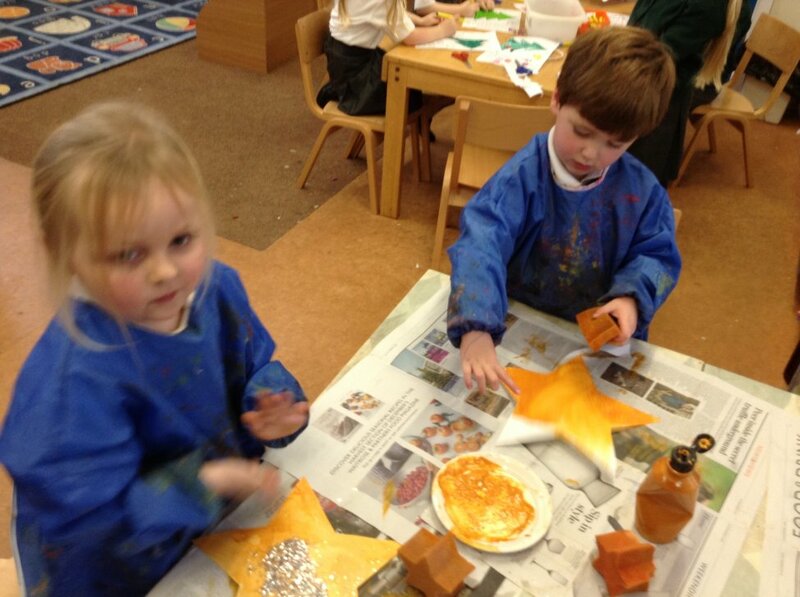 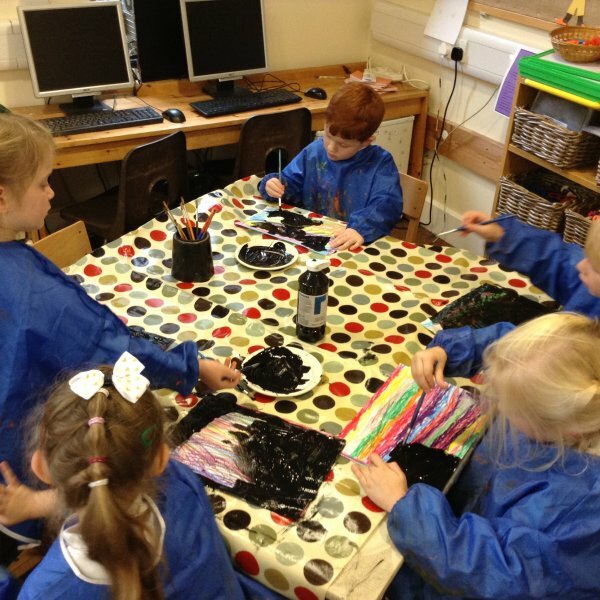 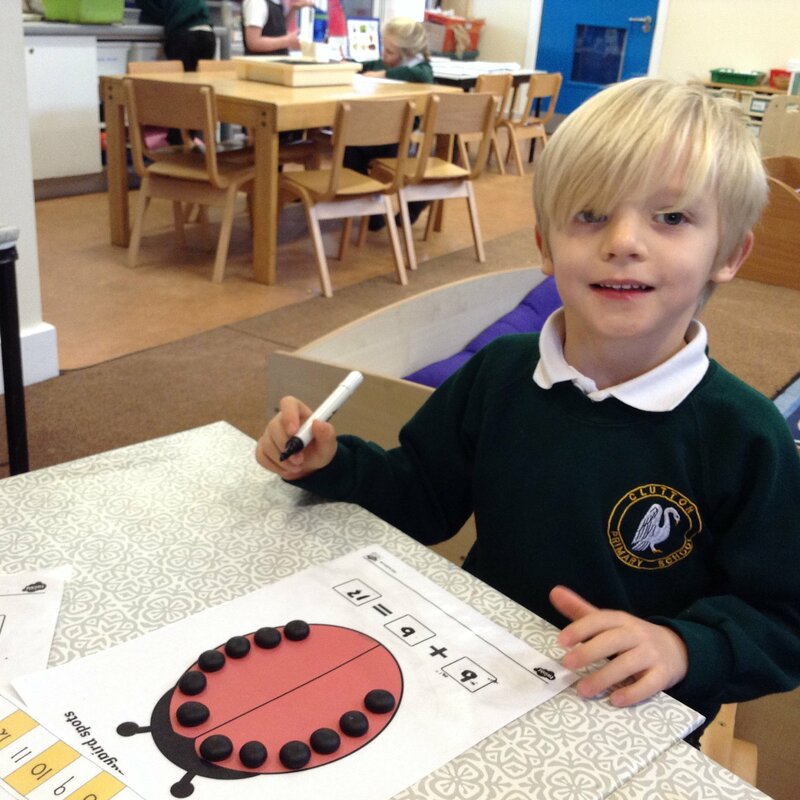 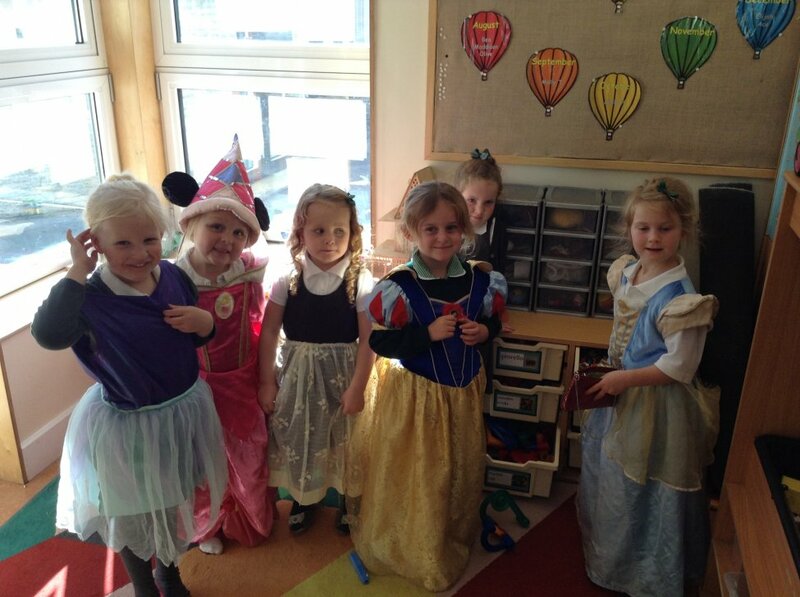 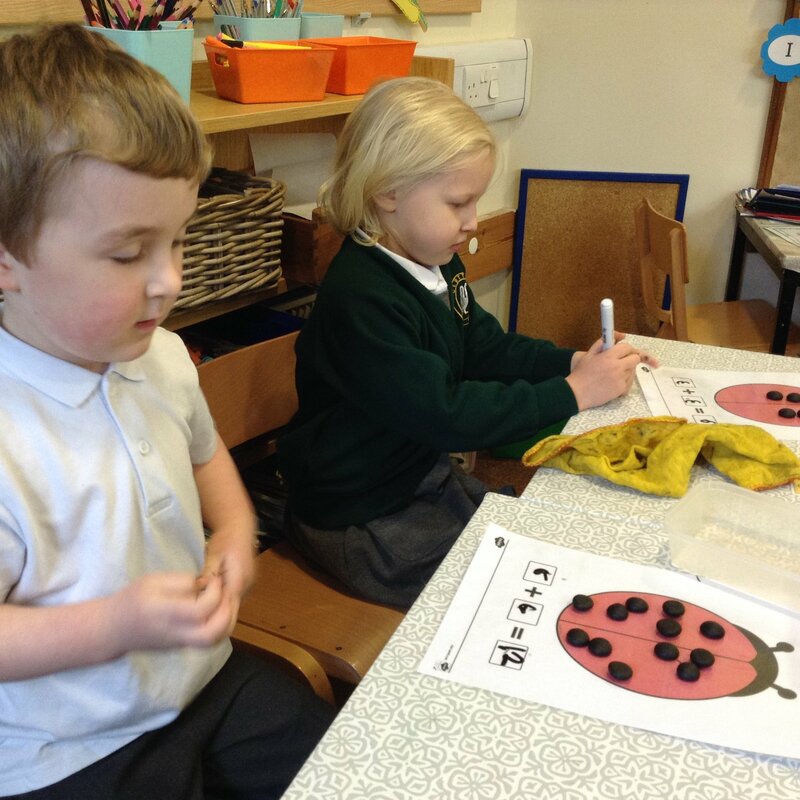 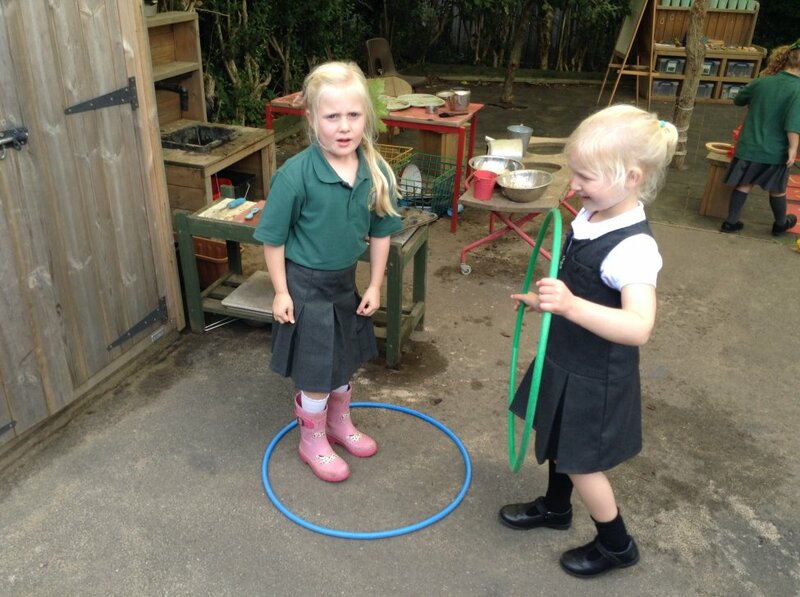 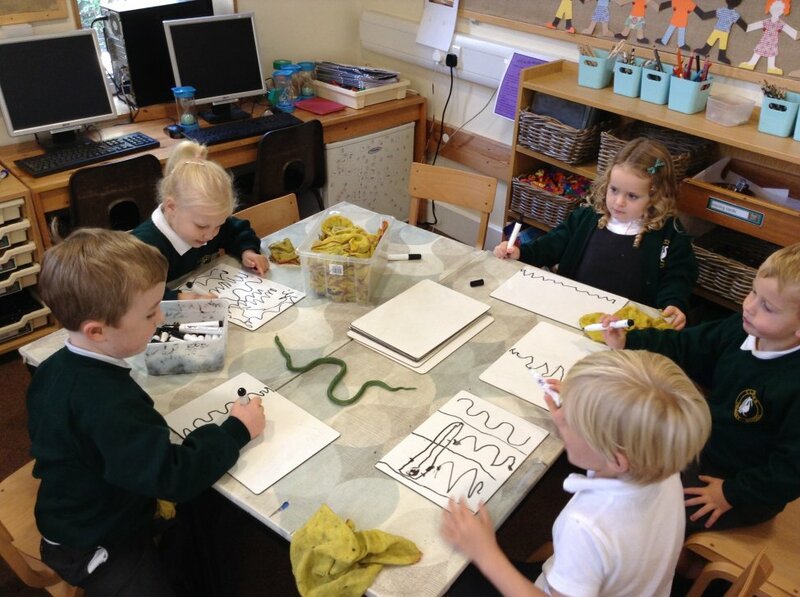 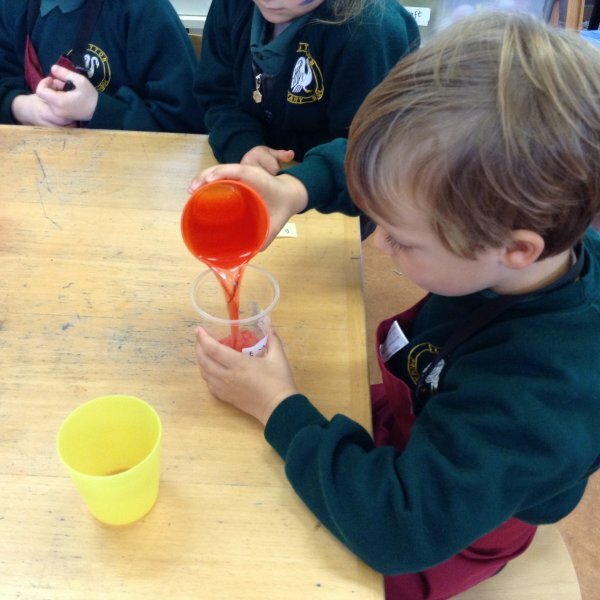 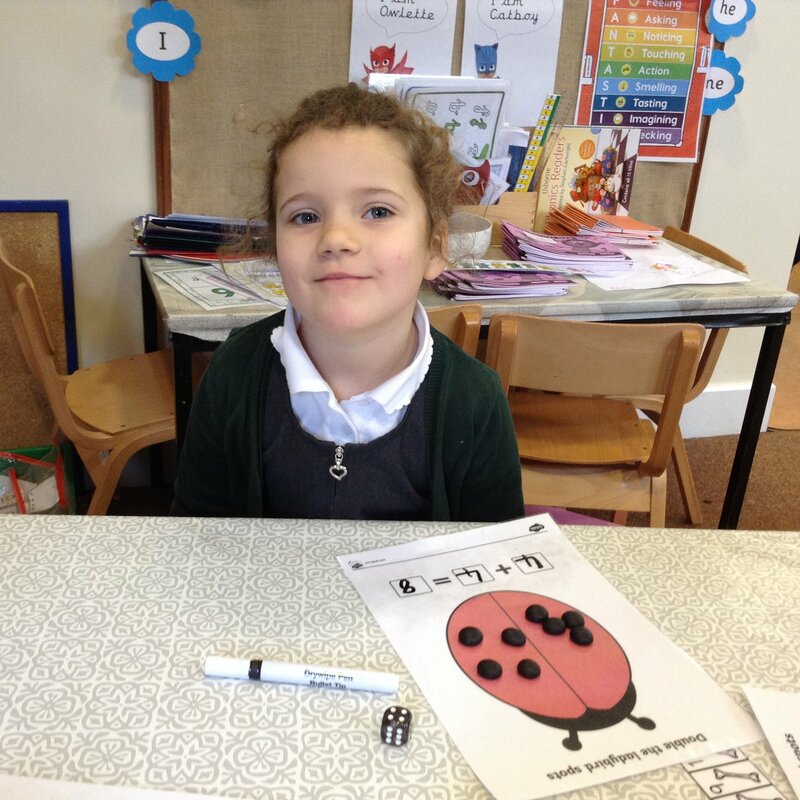 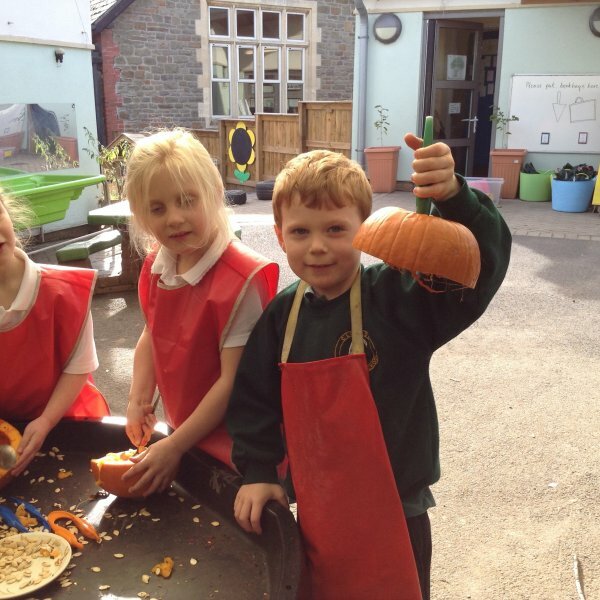 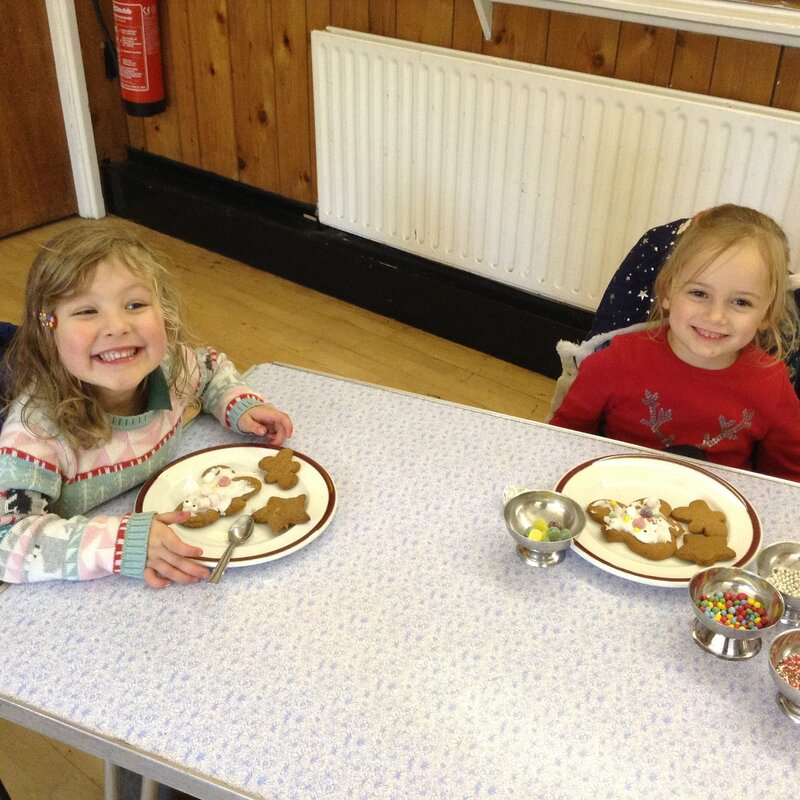 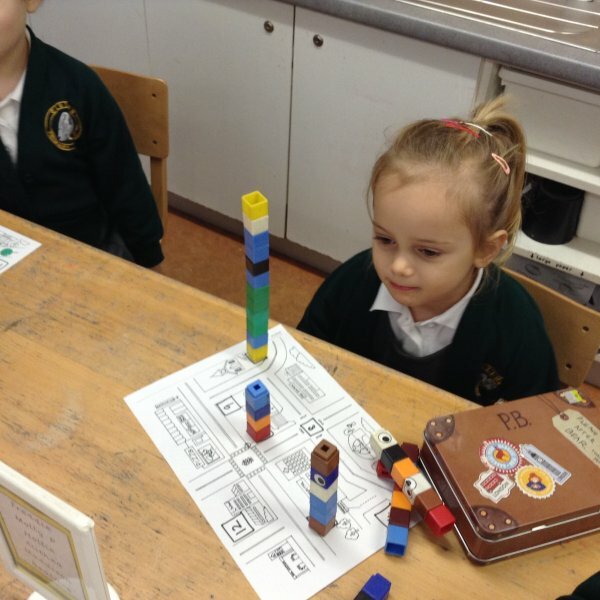 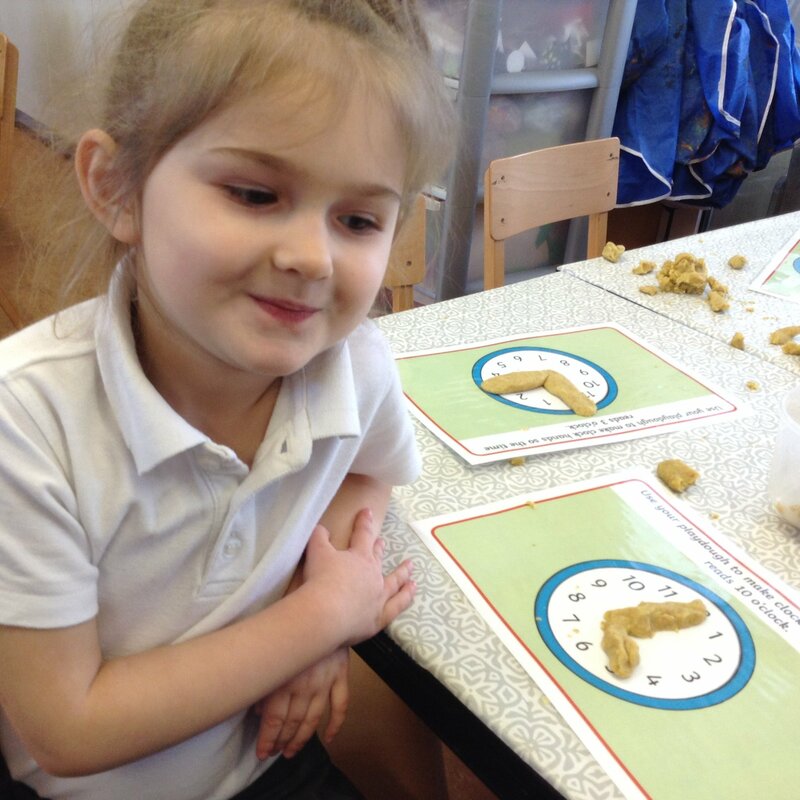 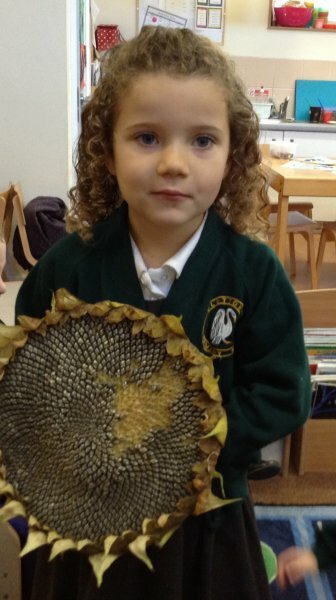 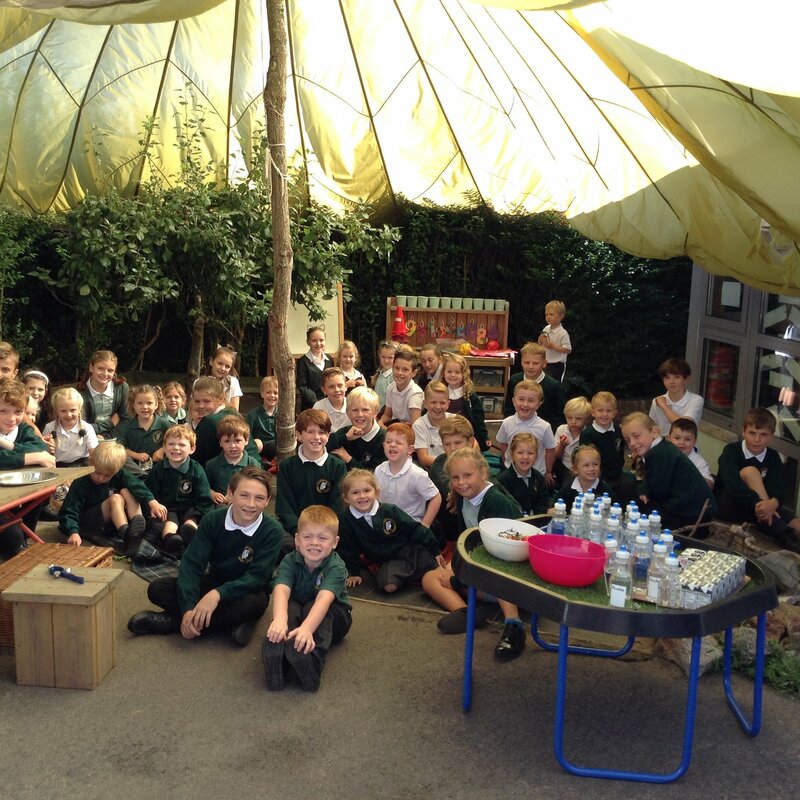 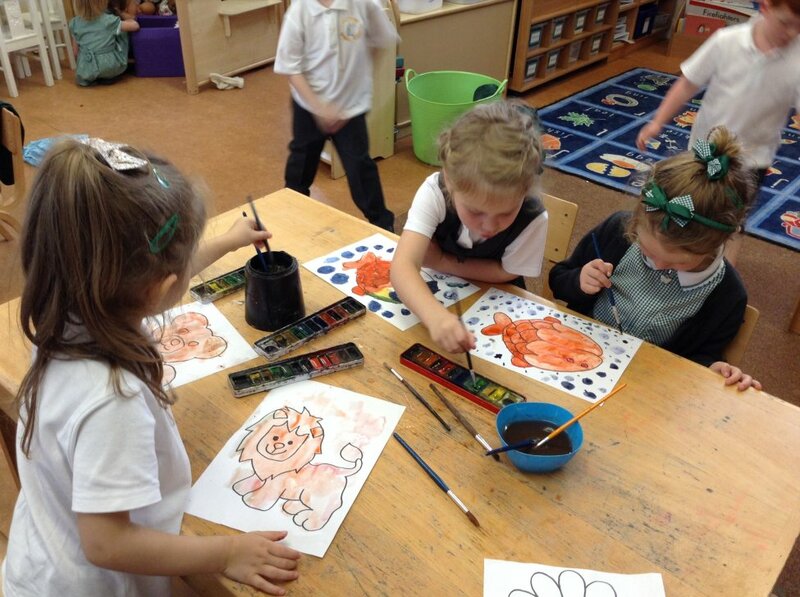 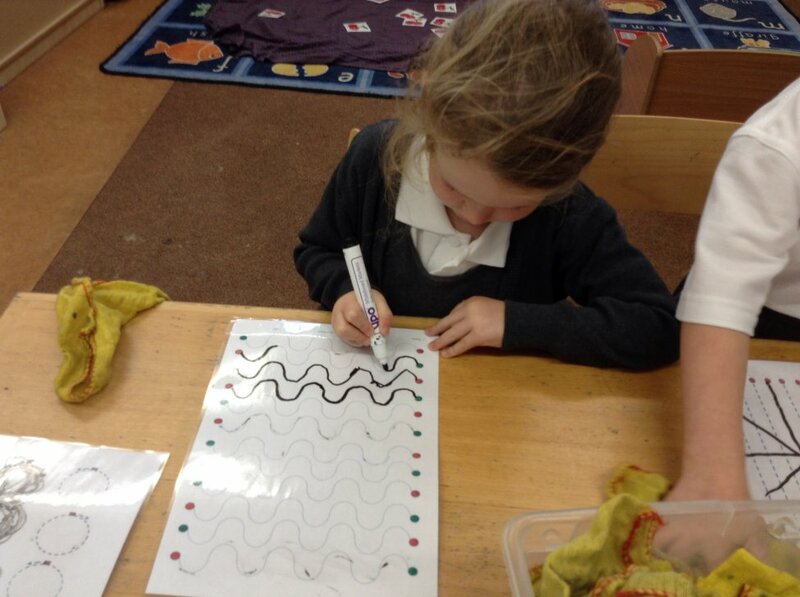 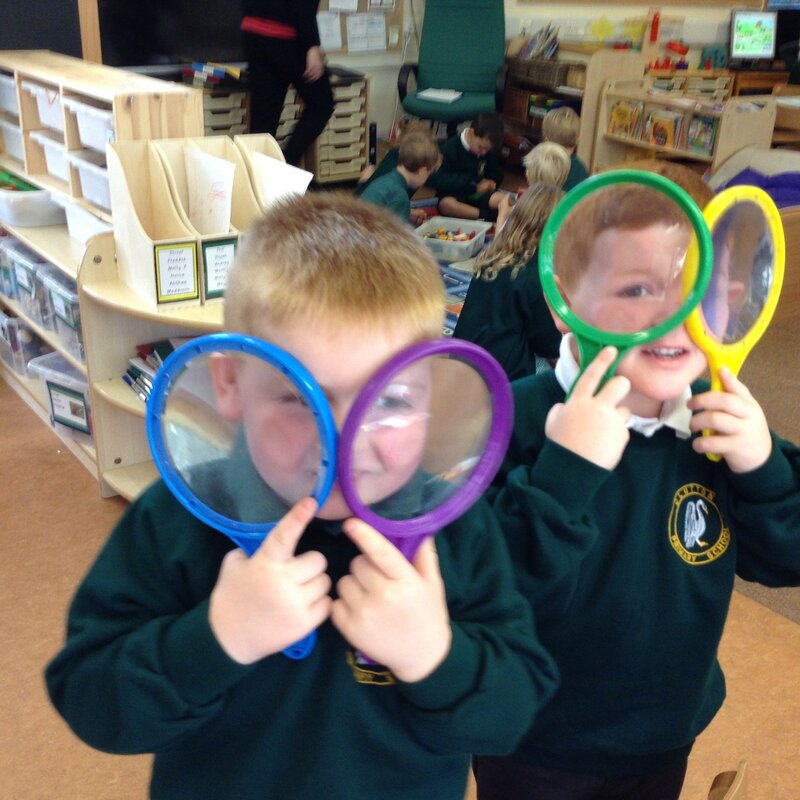 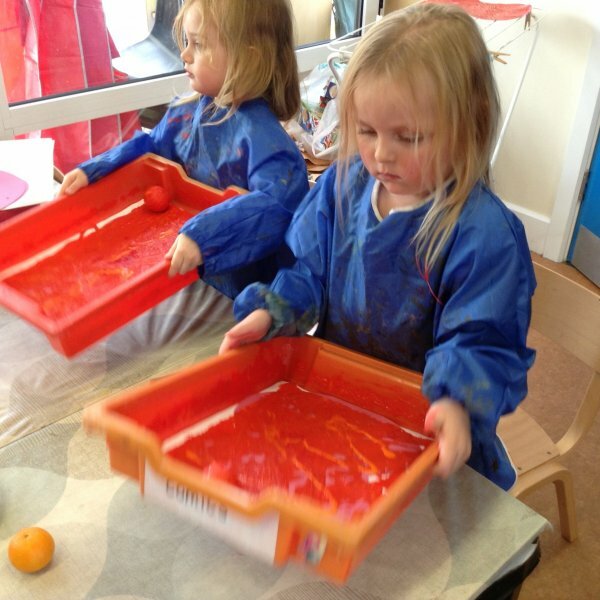 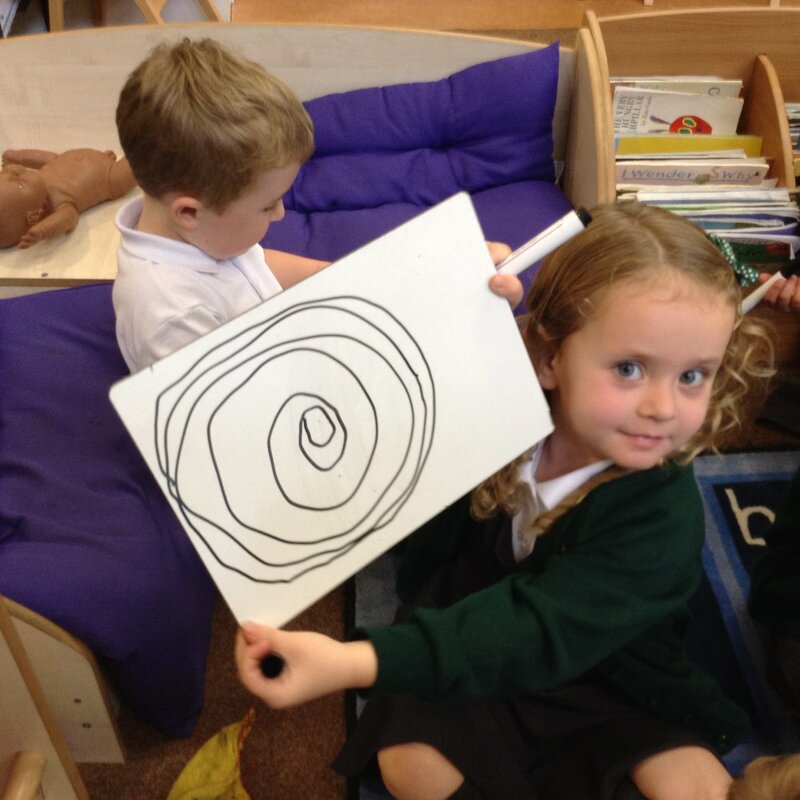 Please >> click here << to see the latest news and photos from Cherry Class. 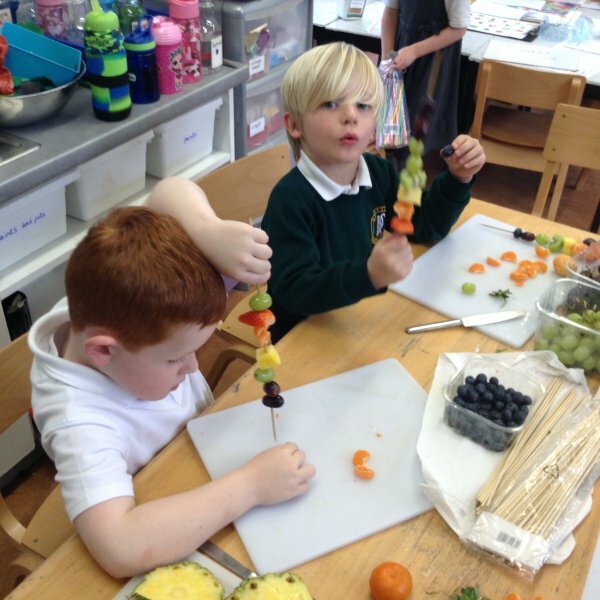 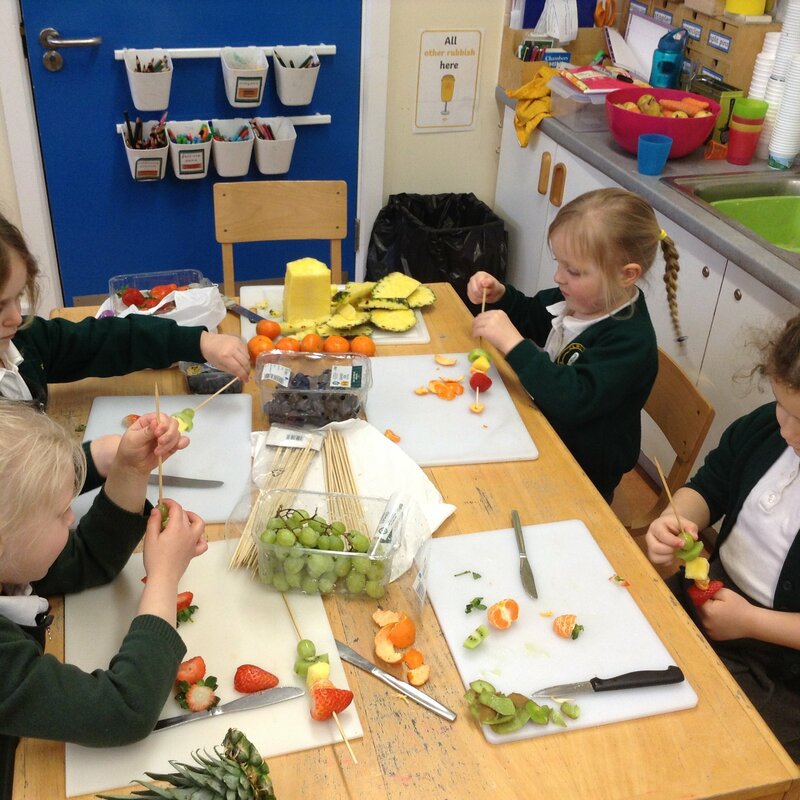 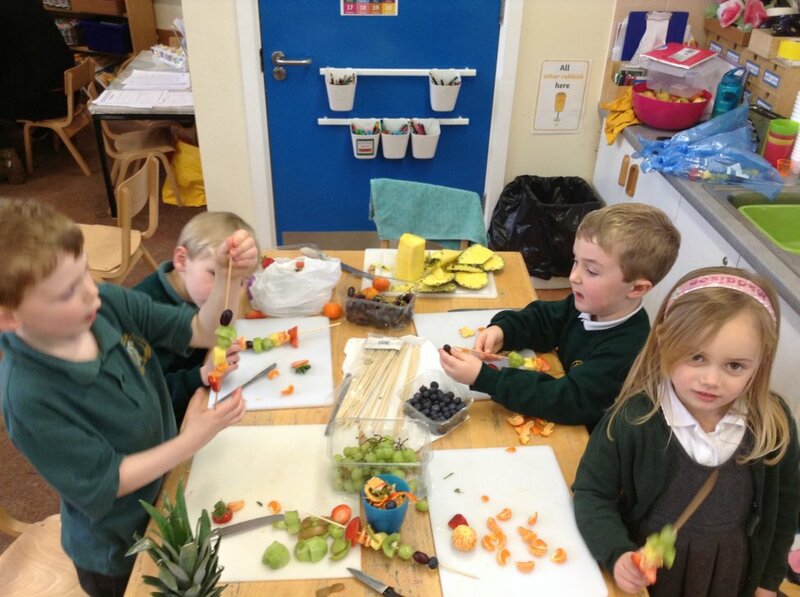 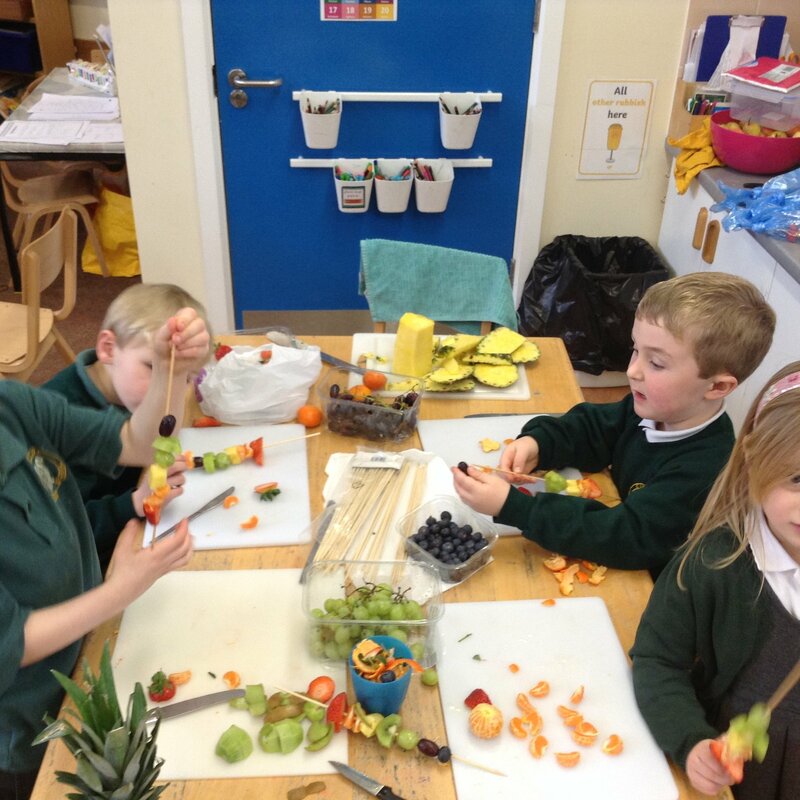 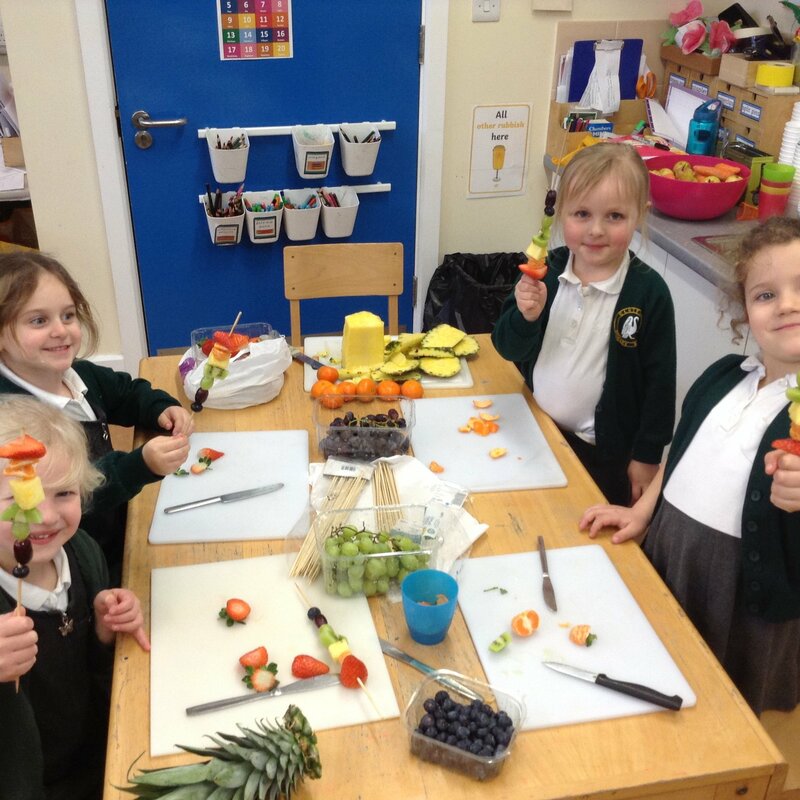 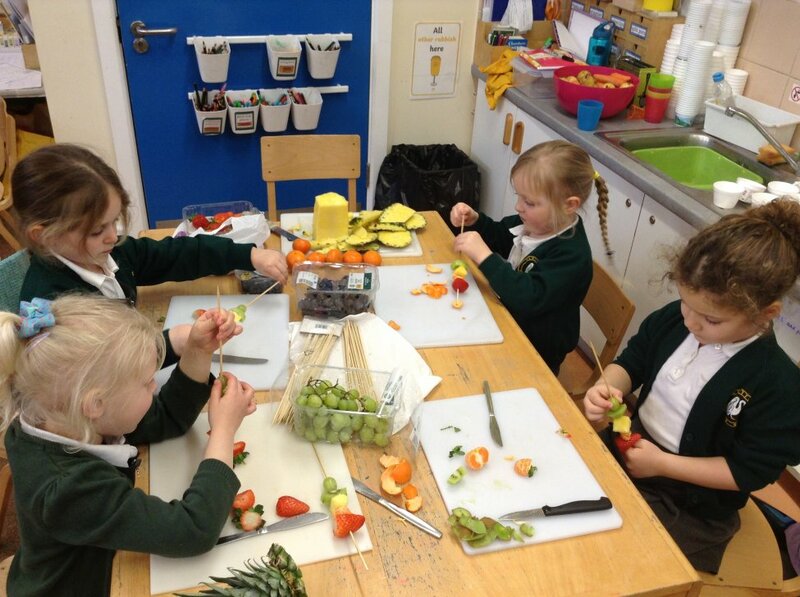 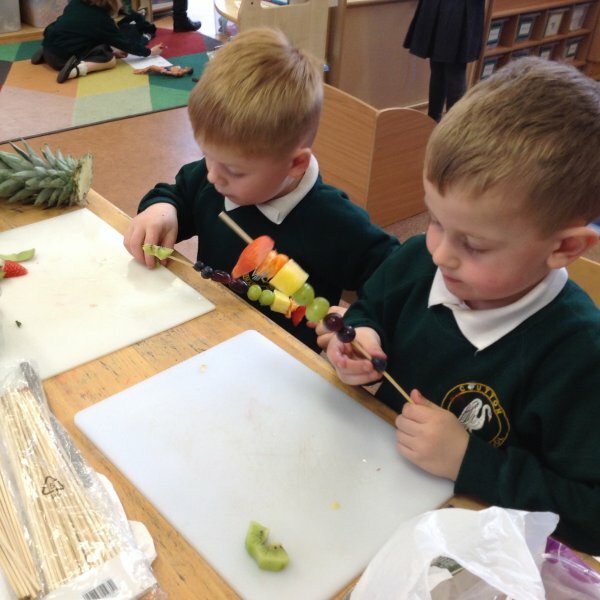 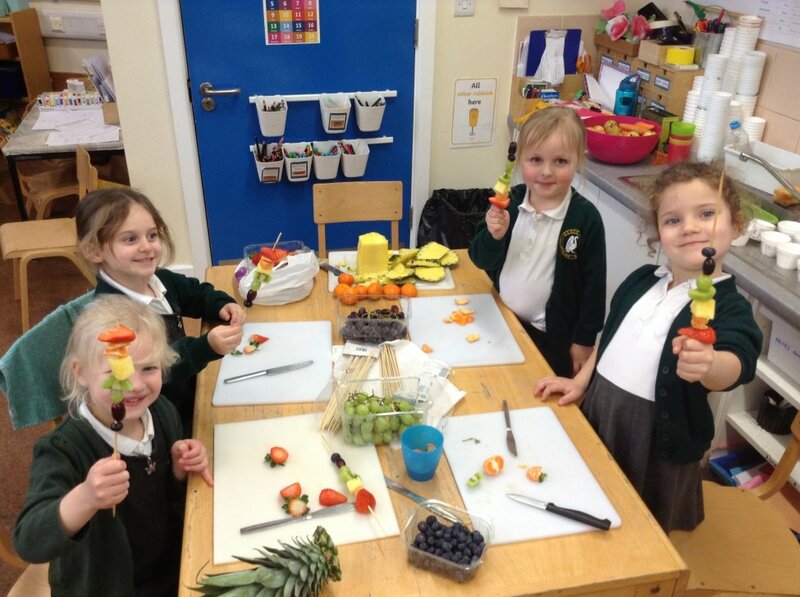 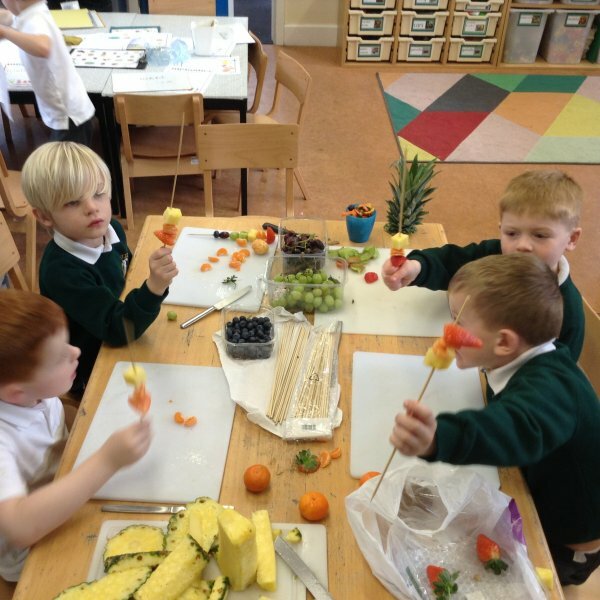 To launch our Fantastic Food topic we made healthy rainbow kebabs. 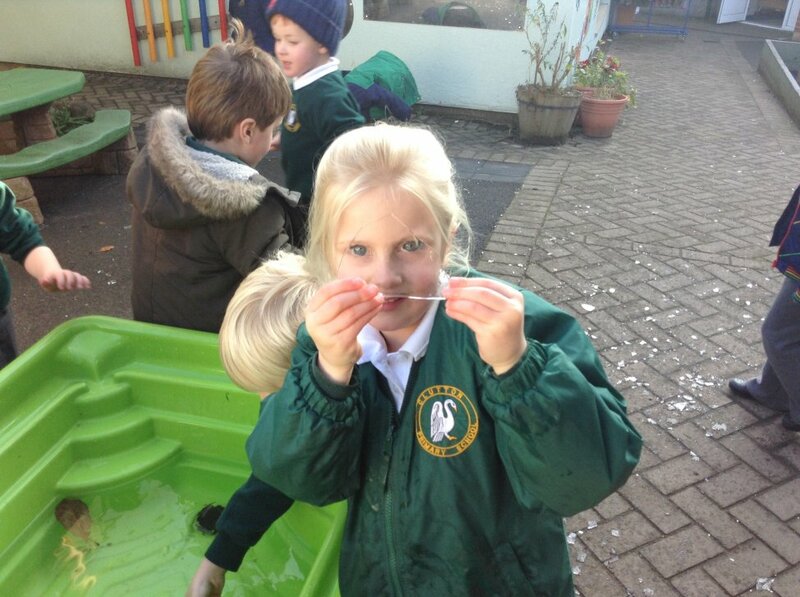 I hope your Cherry enjoyed eating theirs! 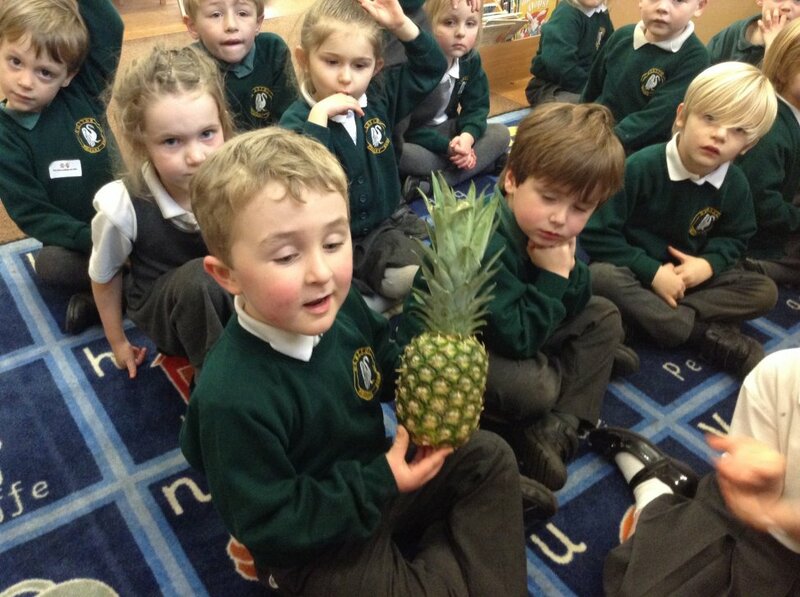 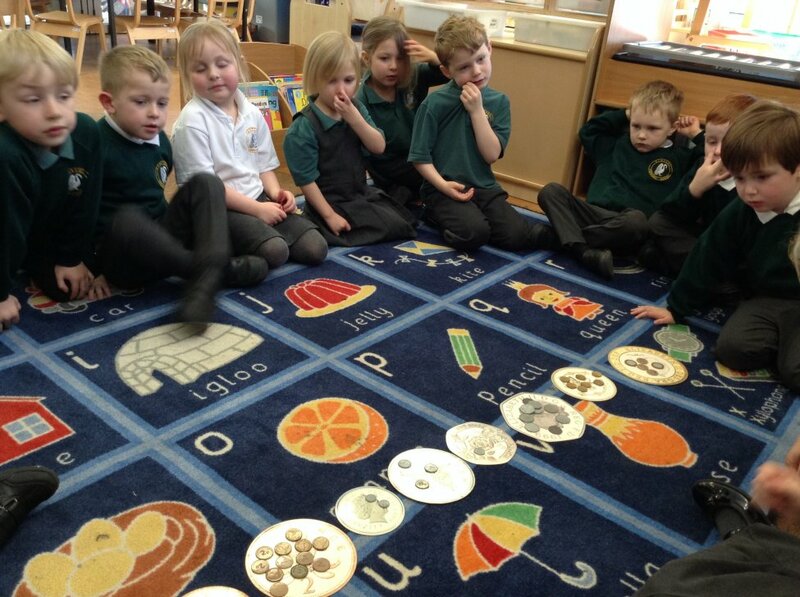 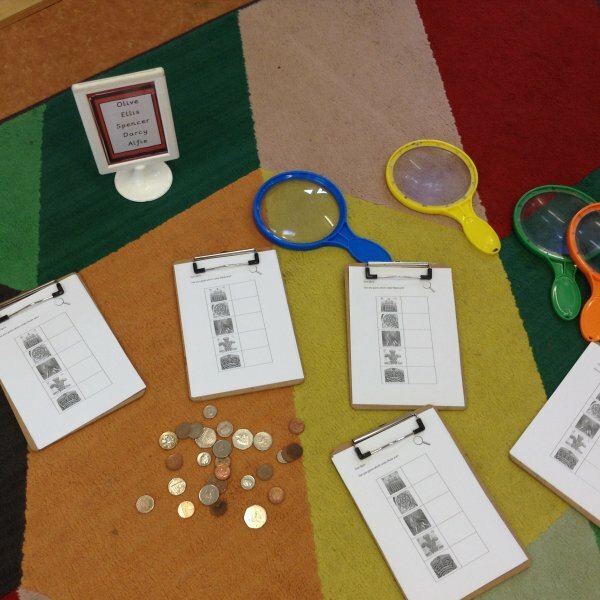 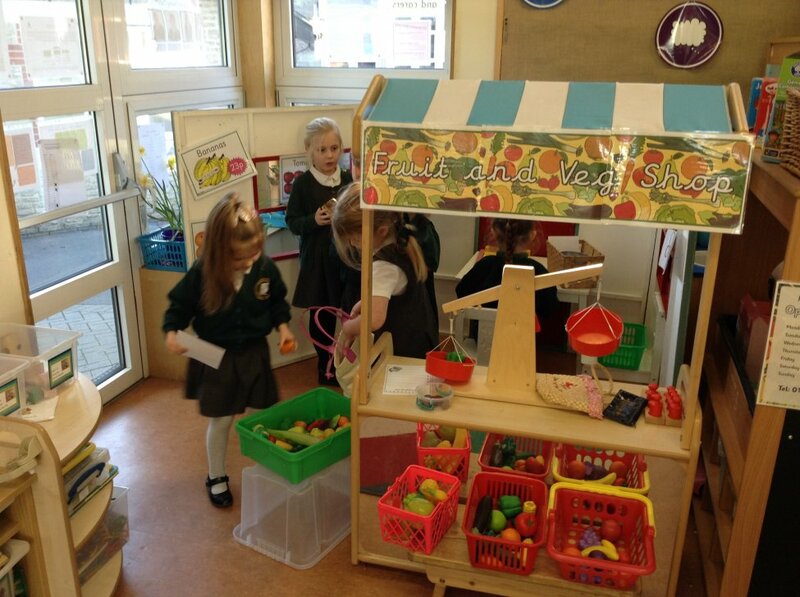 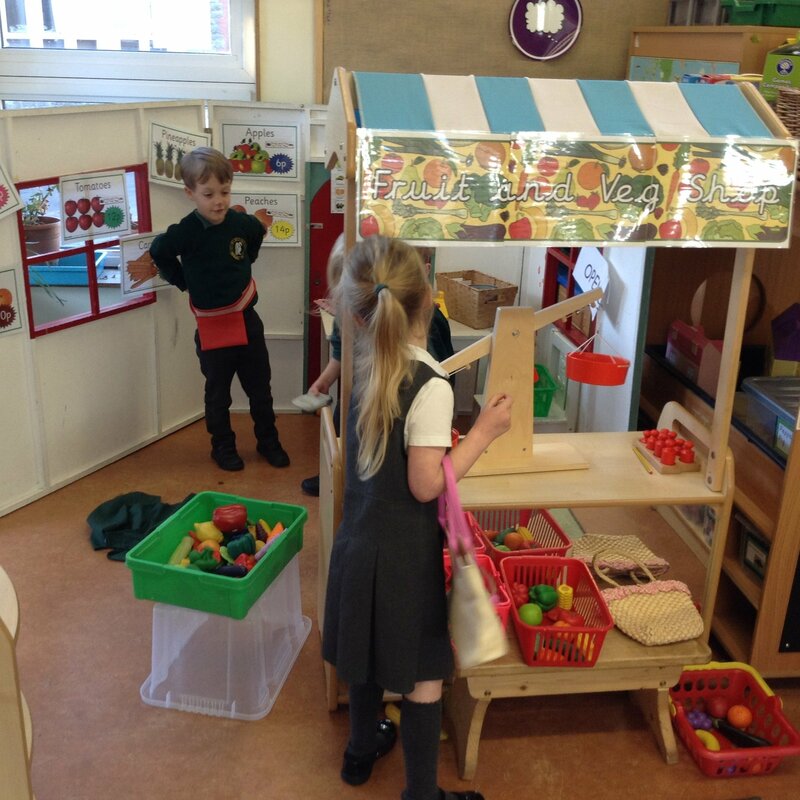 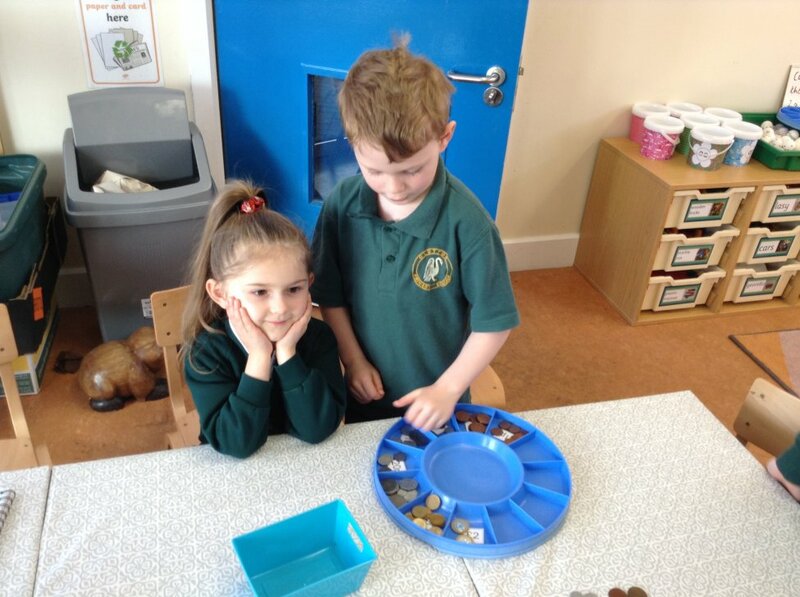 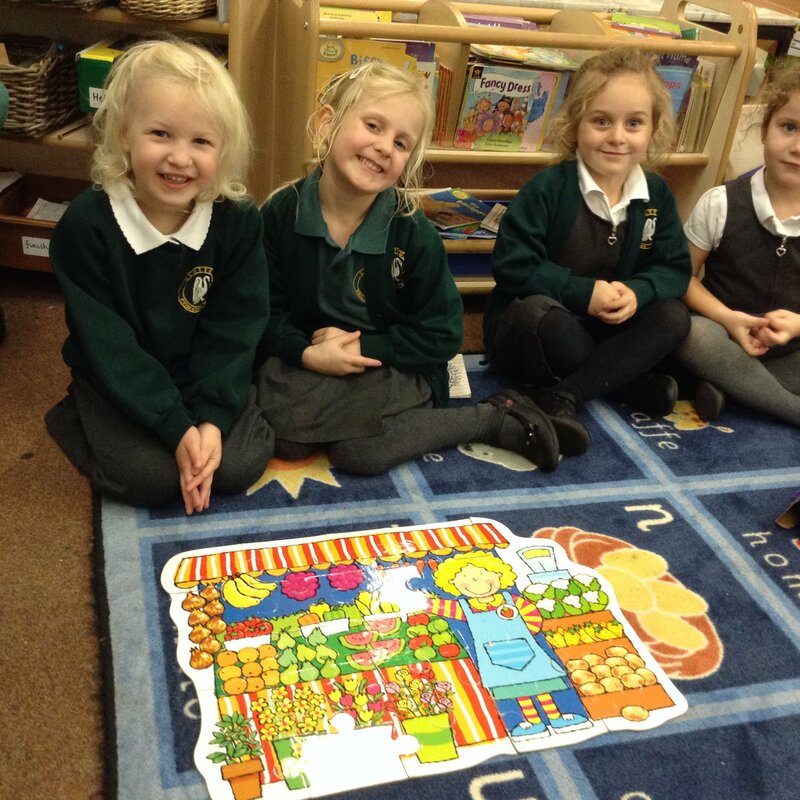 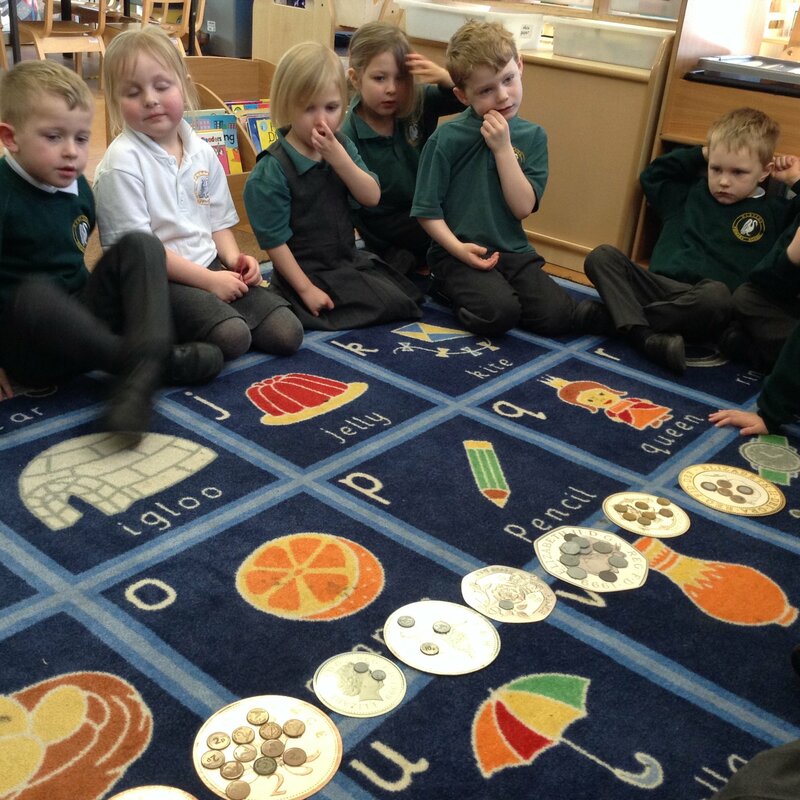 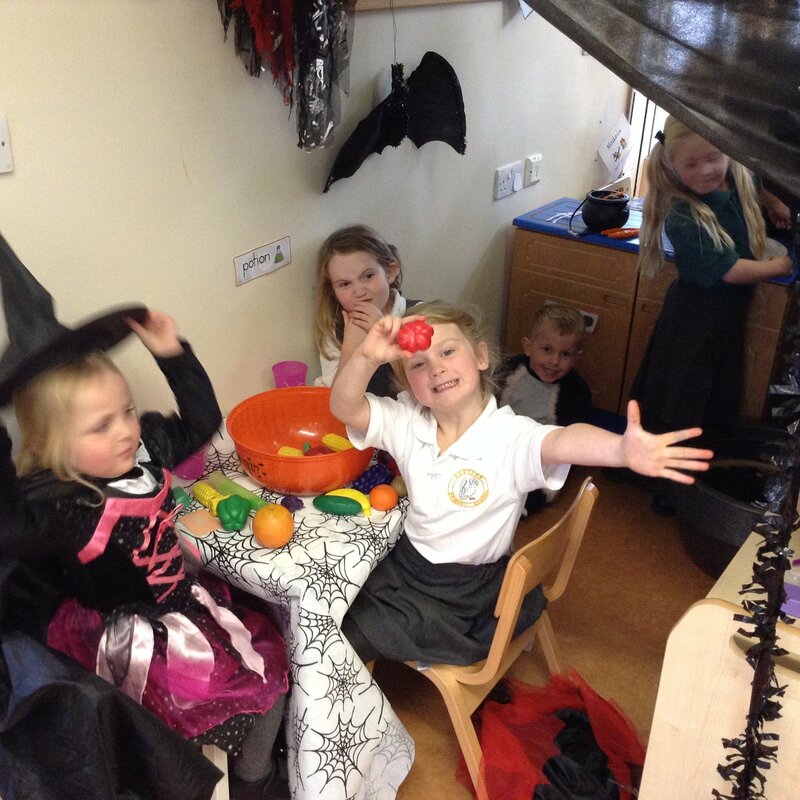 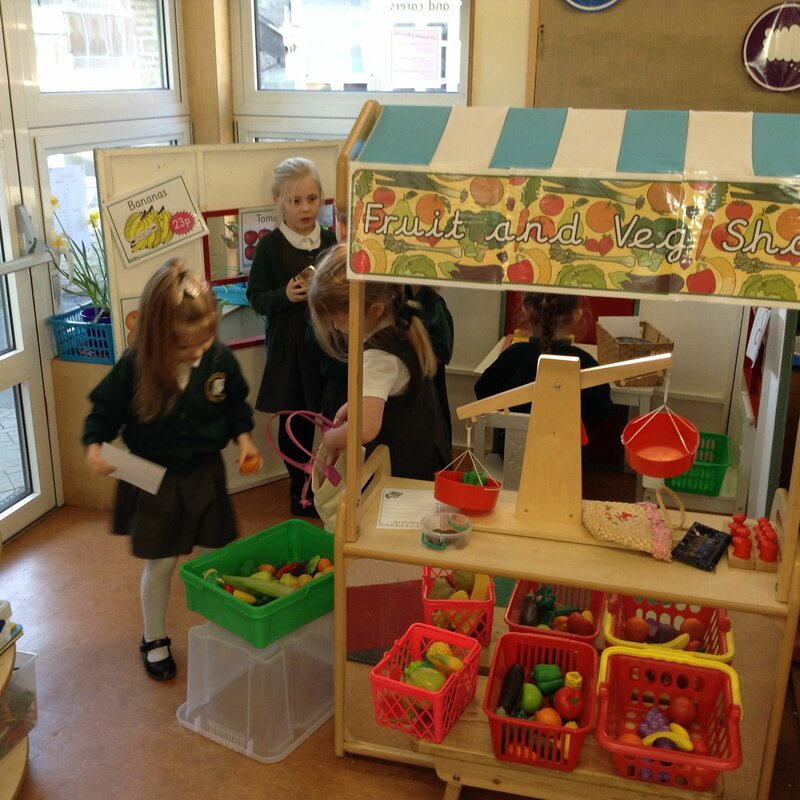 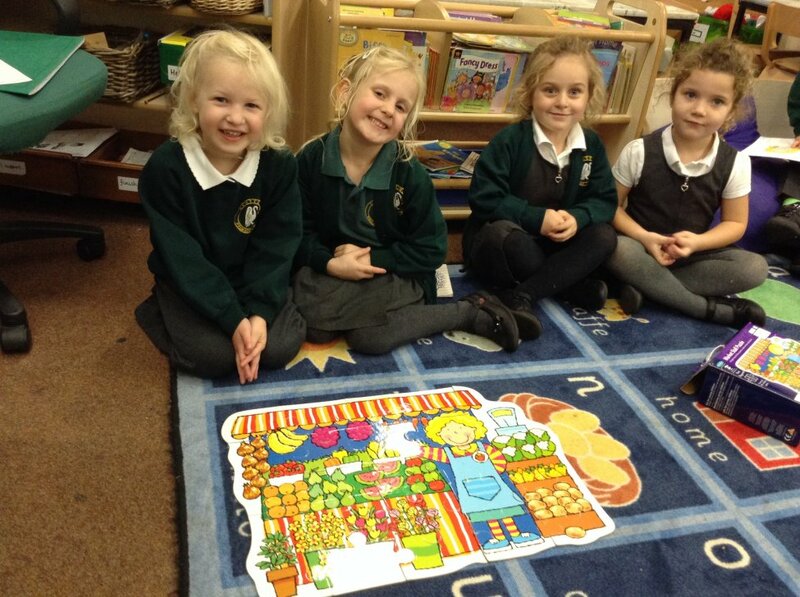 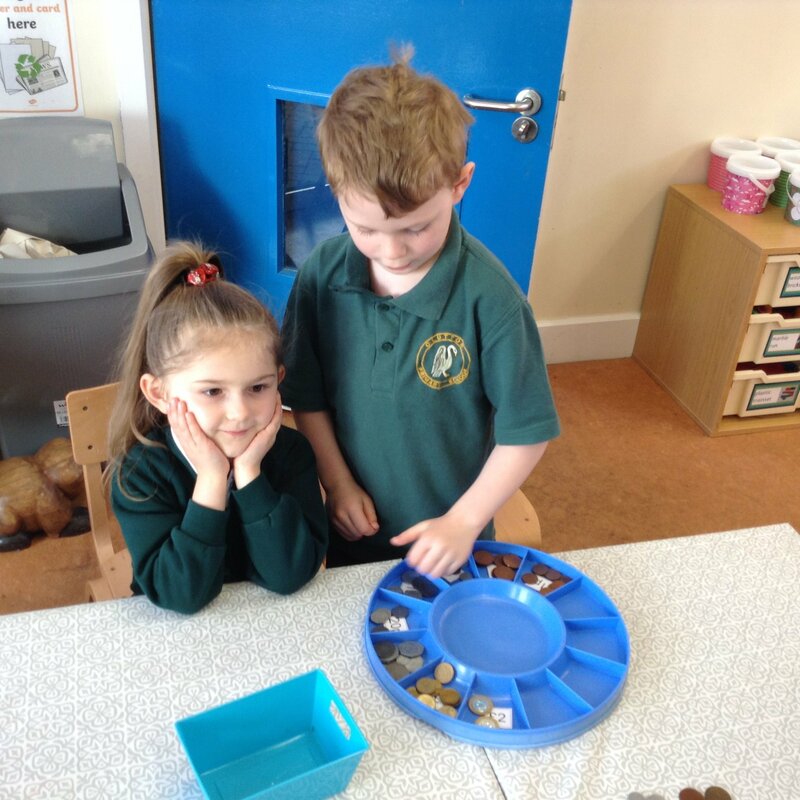 We have also been investigating coins and money and have opened our Cherry Class fruit and veg shop in the role play area which has been very popular. 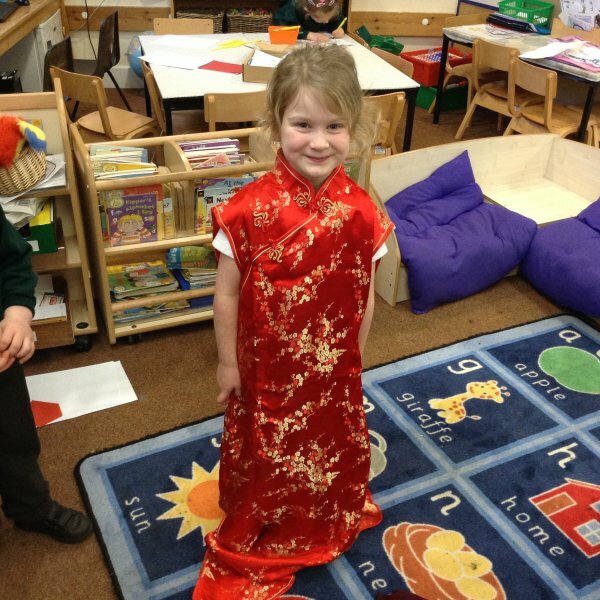 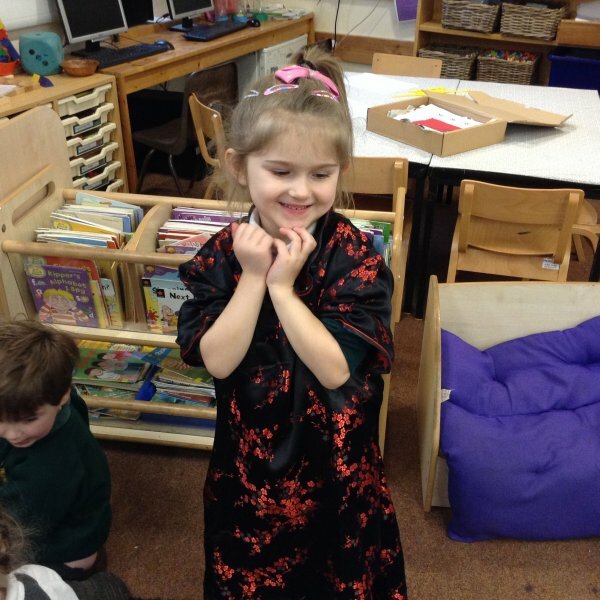 We also had fun celebrating Chinese New Year last week. 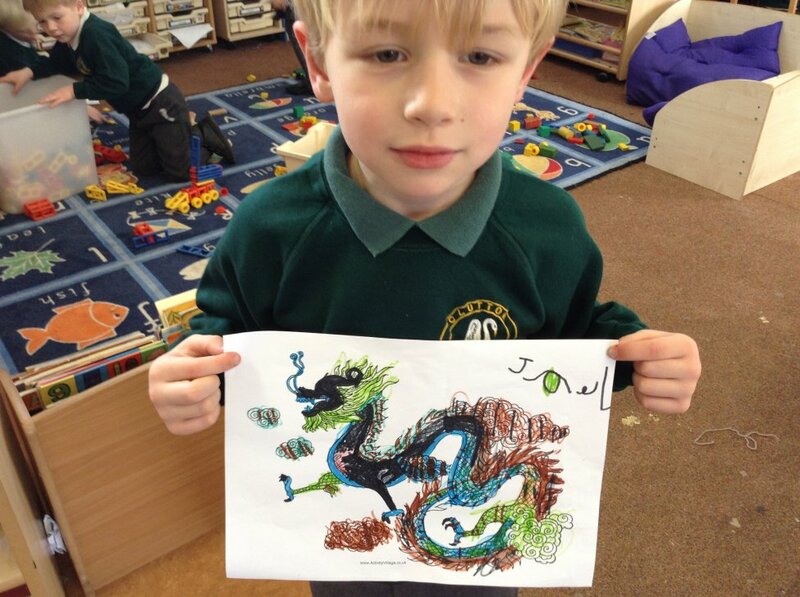 I hope your child enjoyed their dragon and zodiac medal. 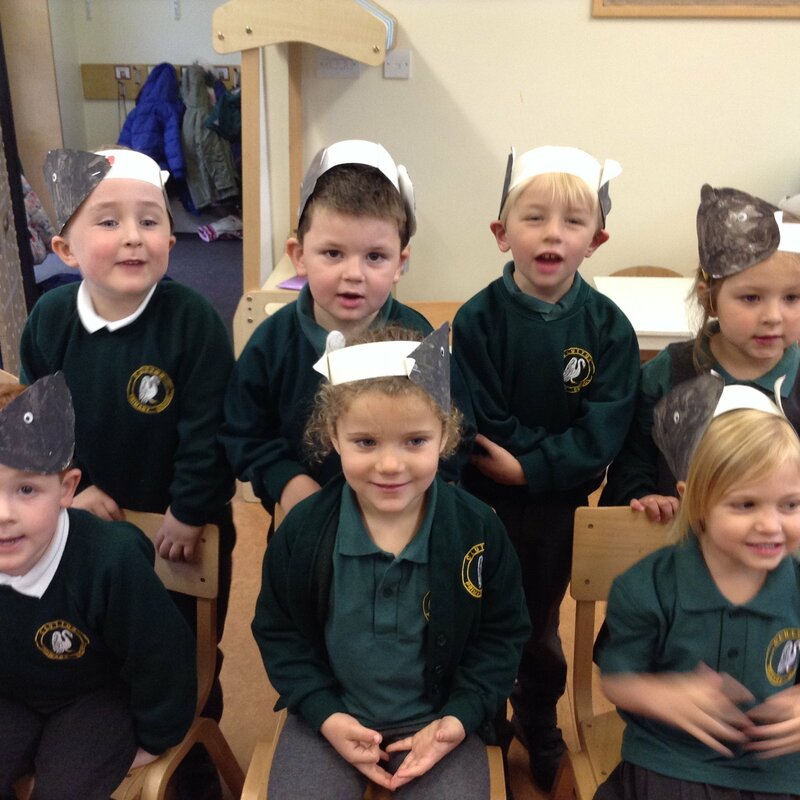 On 26th January it was Australia Day so we decided to celebrate it by learning about different Australian animals. 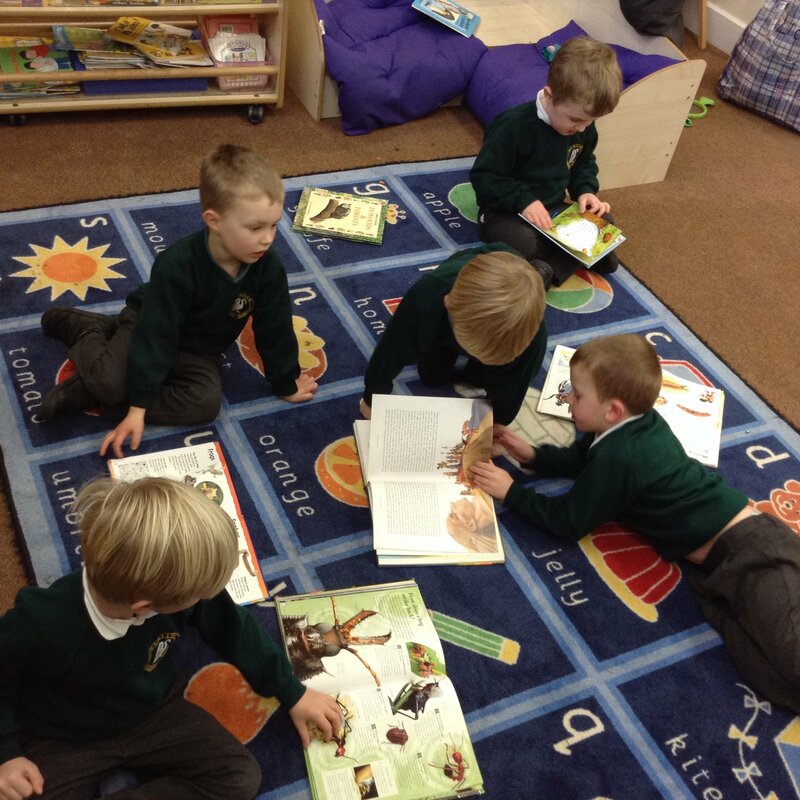 An inflatable kangaroo visited us in the classroom so we went off to the school library to see if we could find out anything about kangaroos. Then we heard an aboriginal sand story, made our own dot paintings and learnt all about kangaroos and koalas. 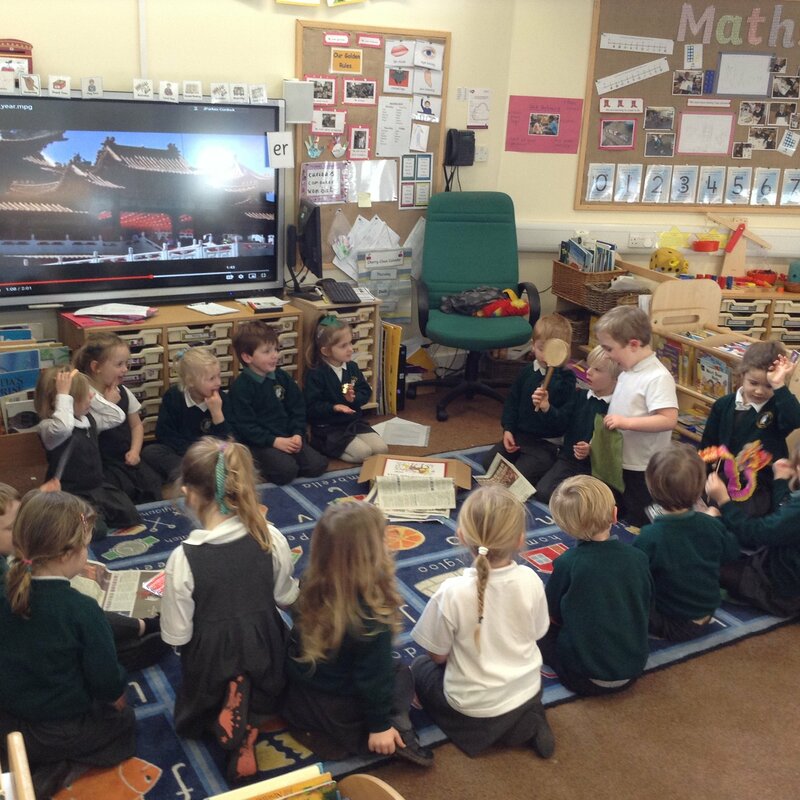 I was so impressed with the facts that the children remembered from a short video about koalas that we watched together. 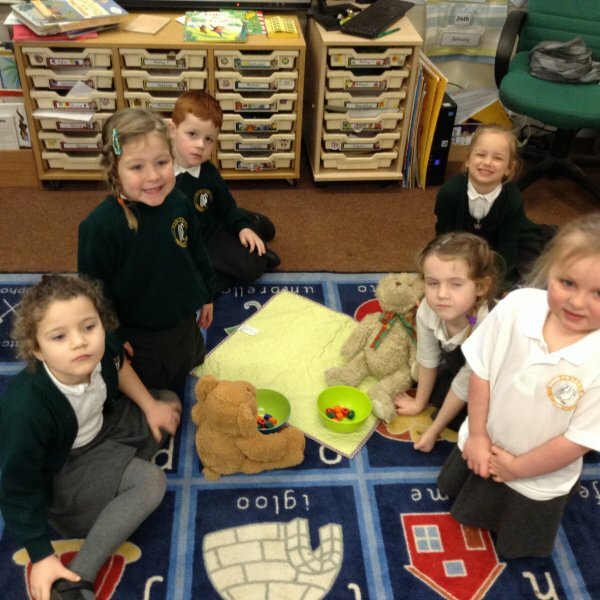 The children wrote lovely facts about koalas to 'earn' their own clippy koalas - a kind present from my sister in Australia! 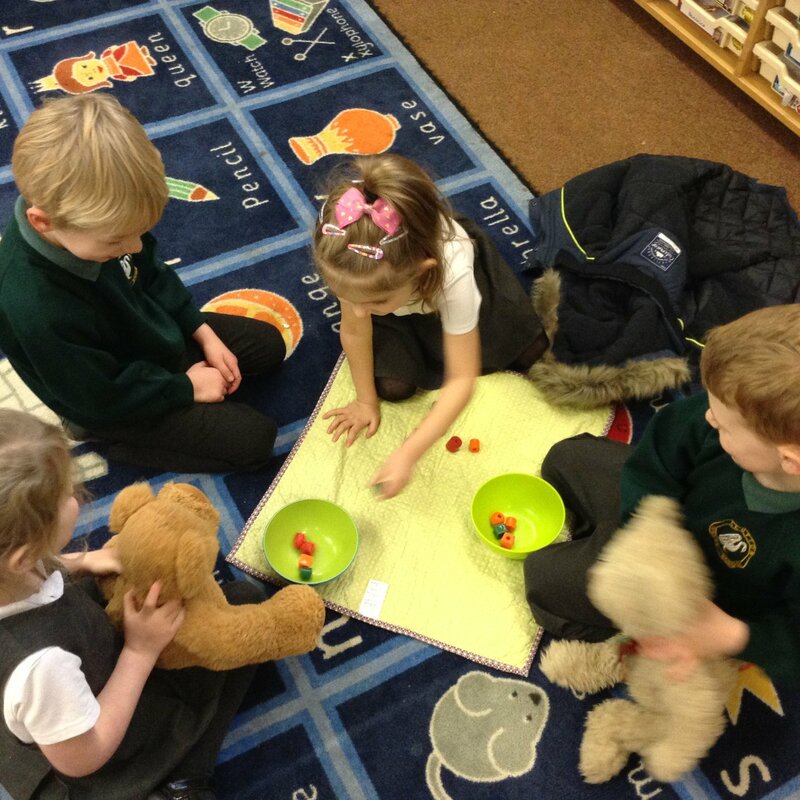 We started to look at different ways of making half: sharing food between 2 teddies, cutting different shapes in half (including hearts and stars!) 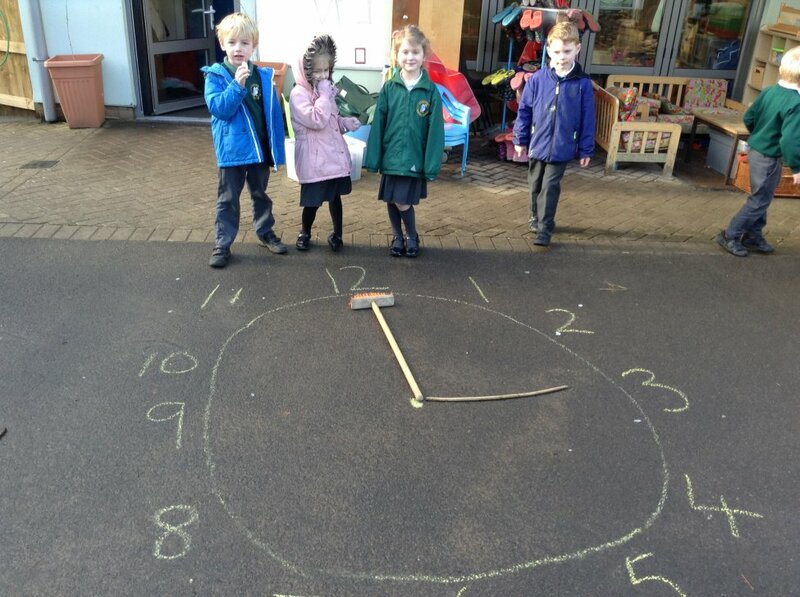 - and starting to understand half past the hour. 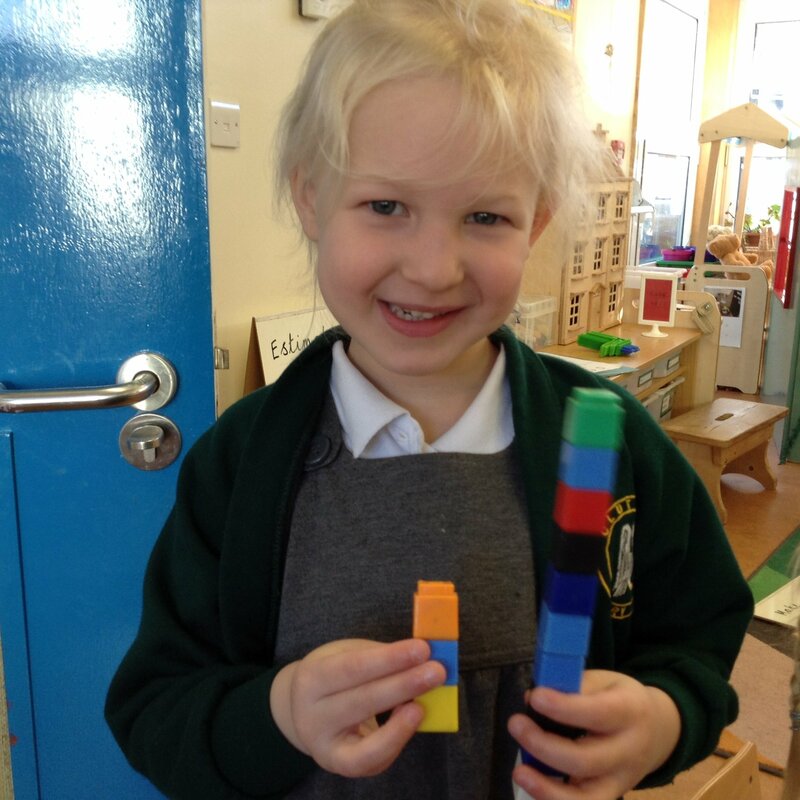 What other ways can you make half? 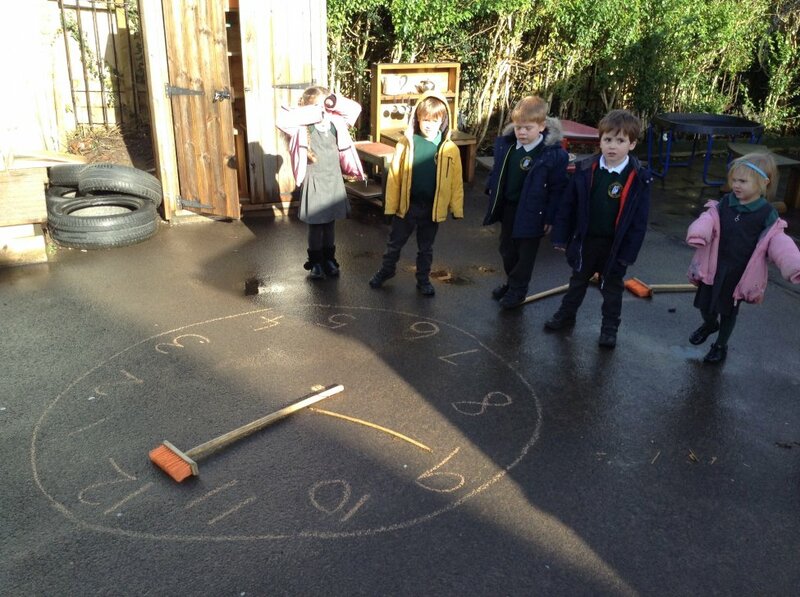 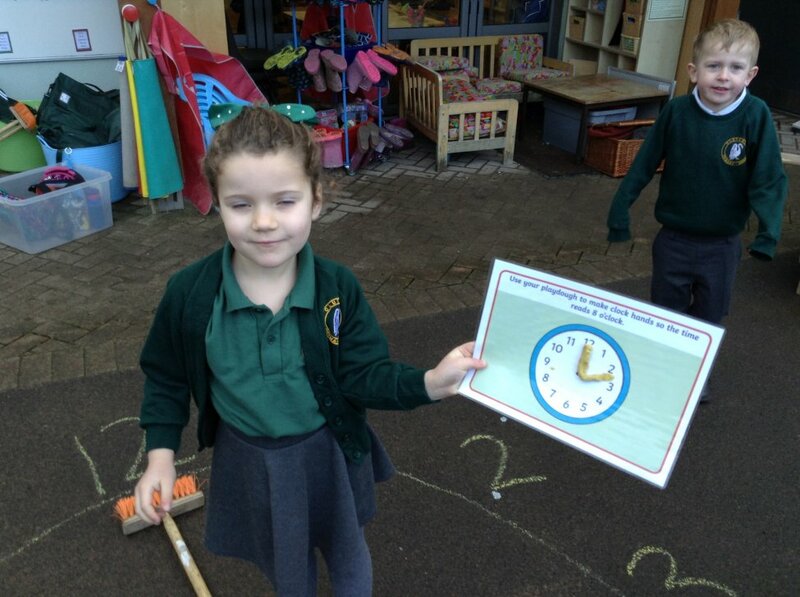 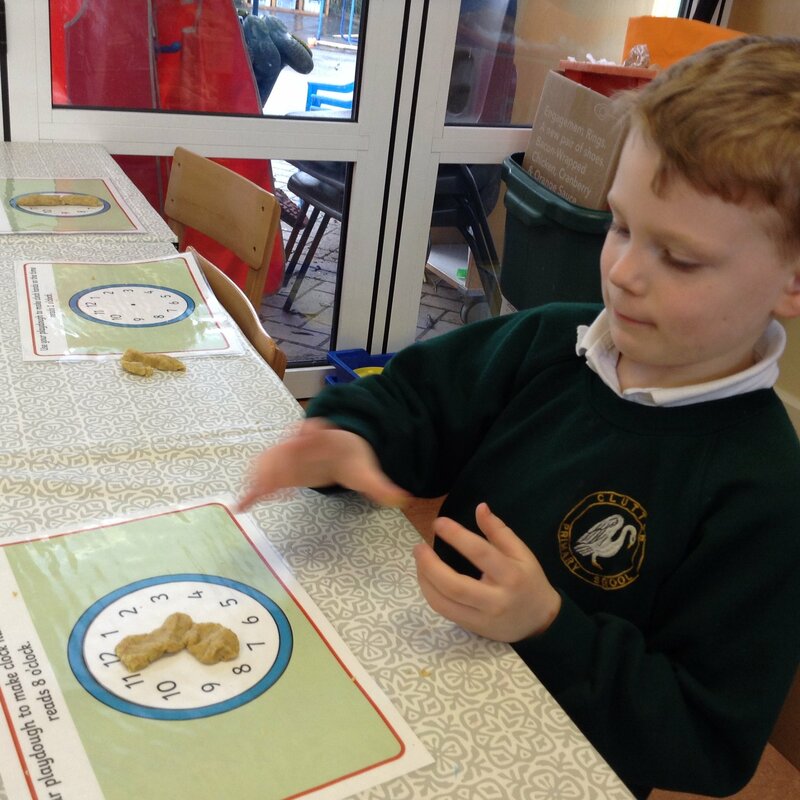 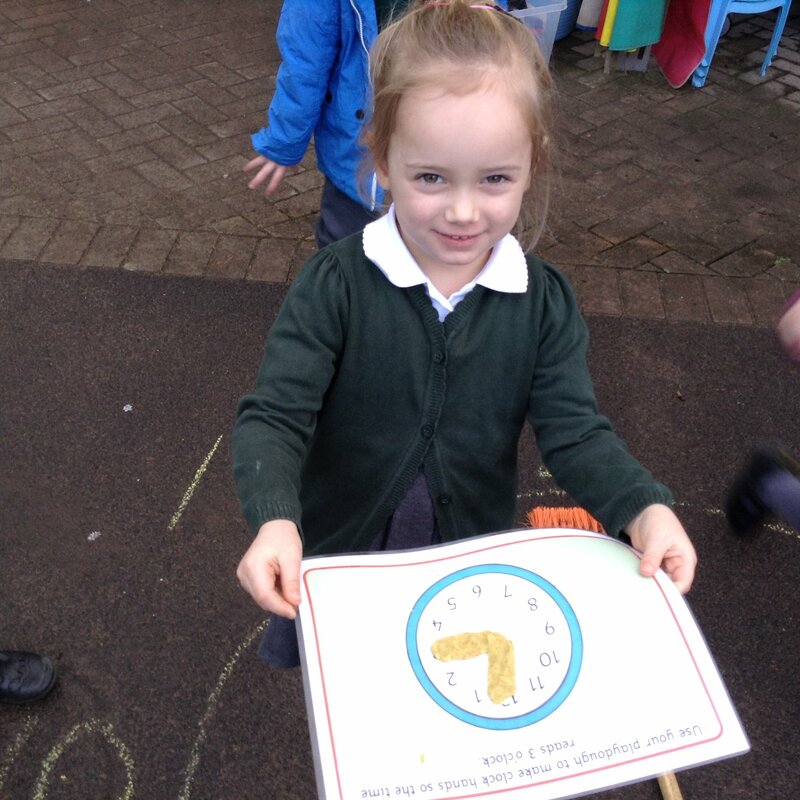 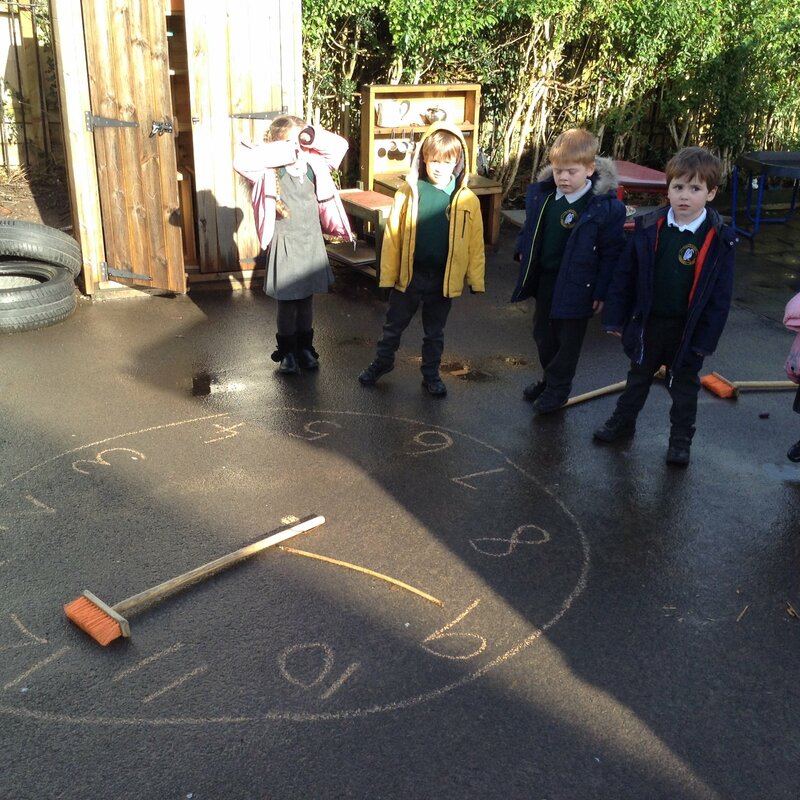 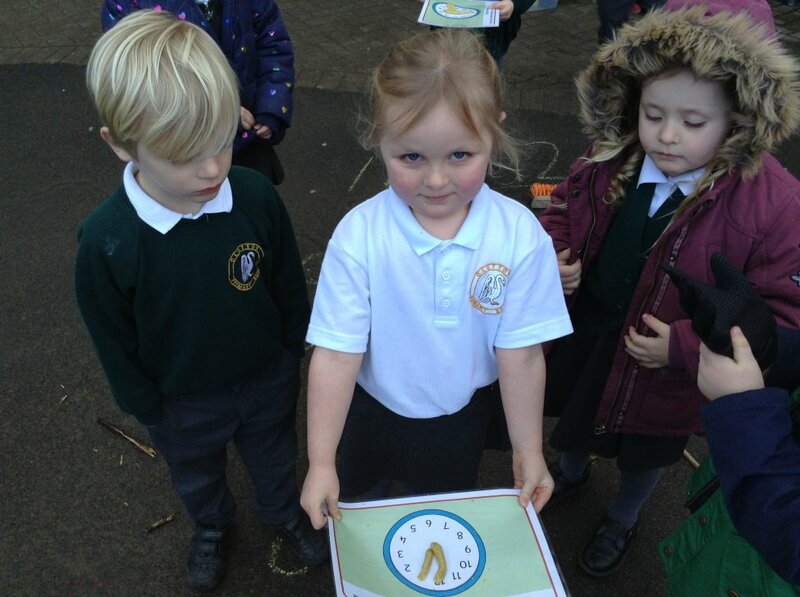 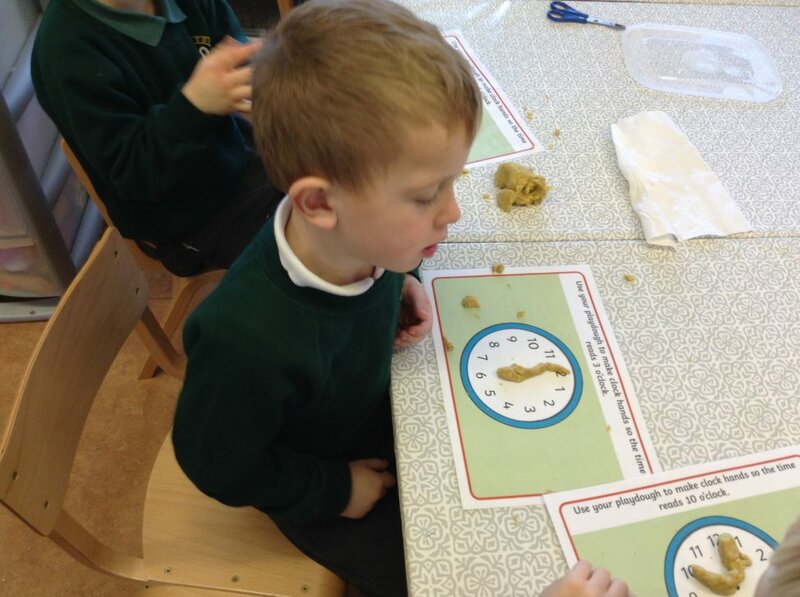 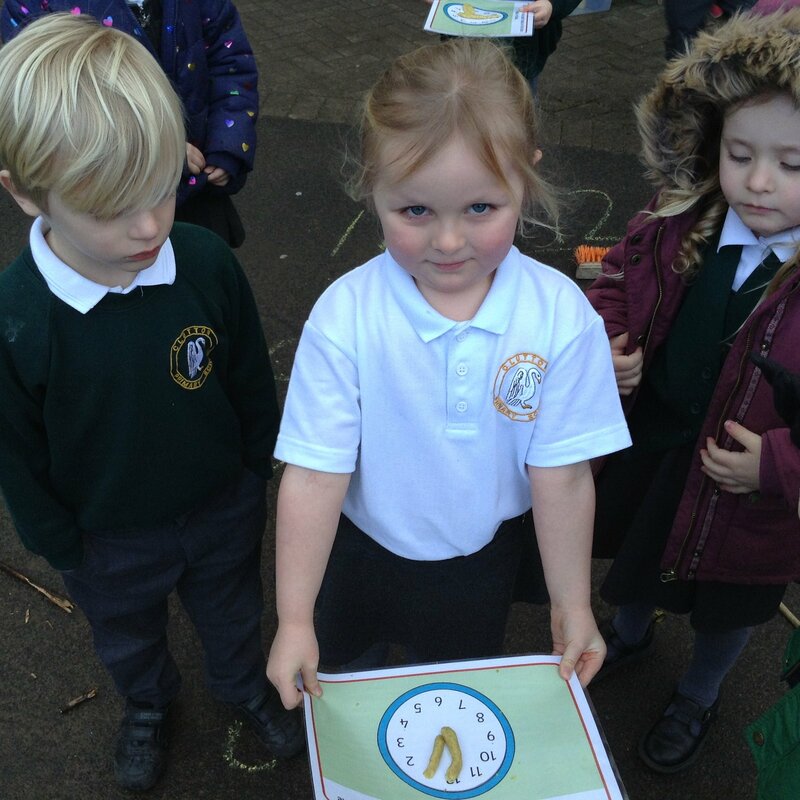 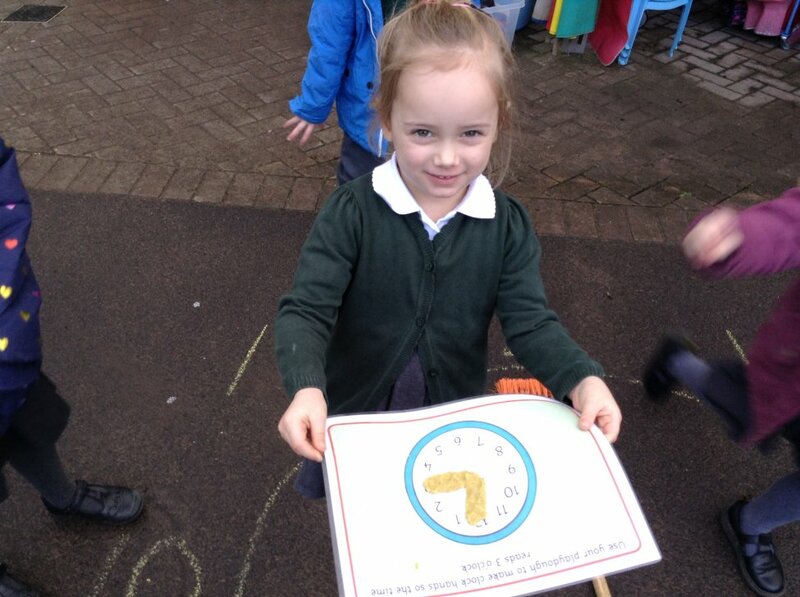 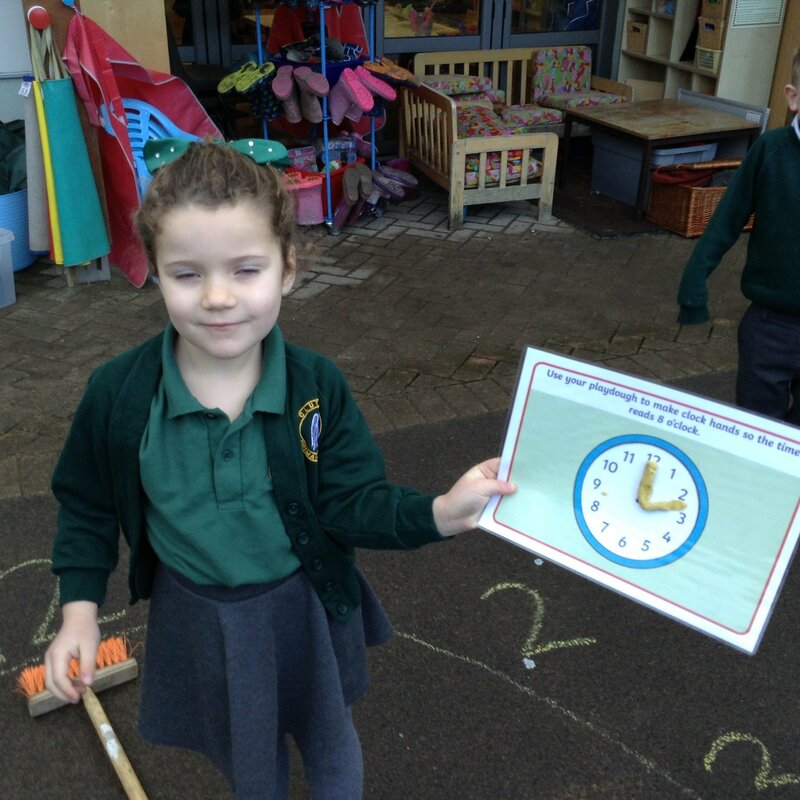 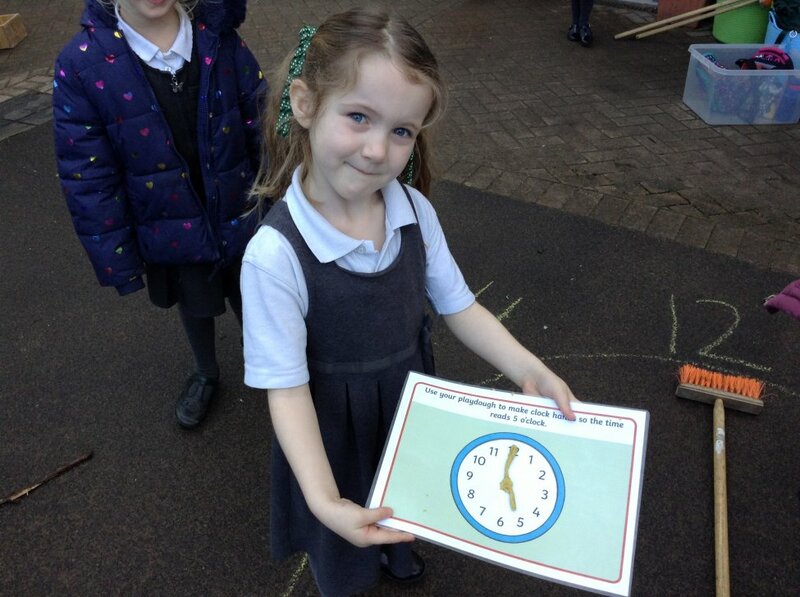 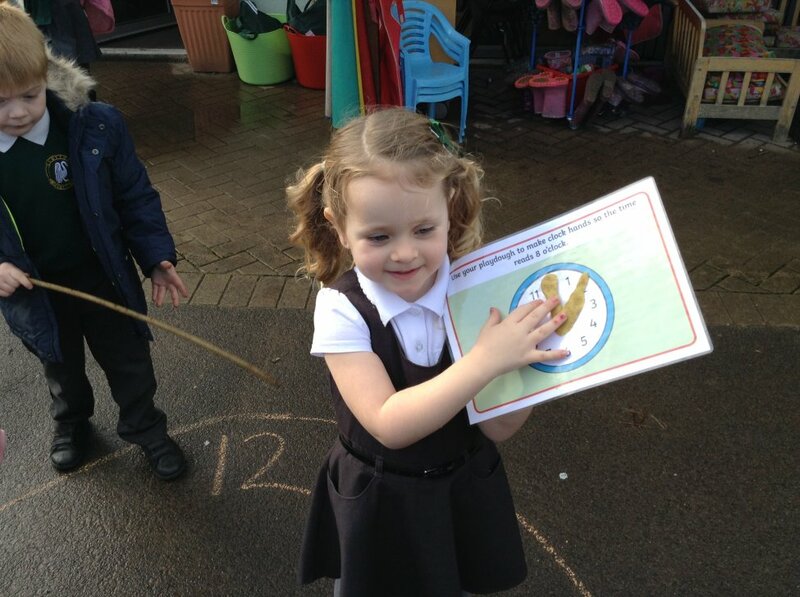 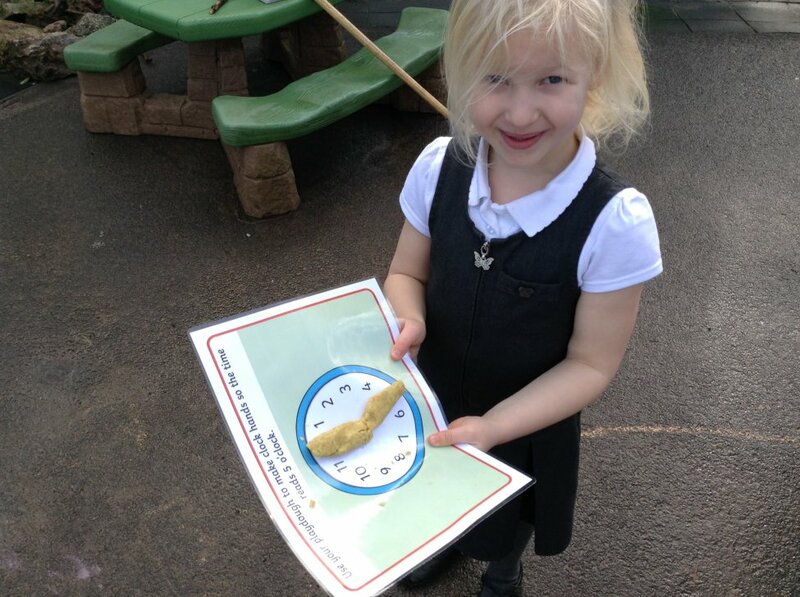 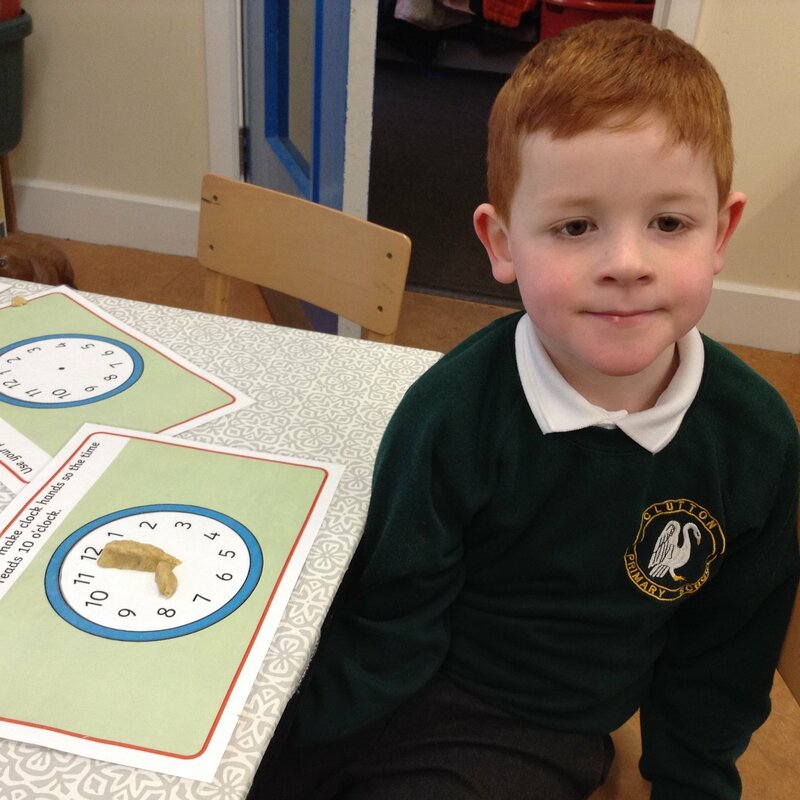 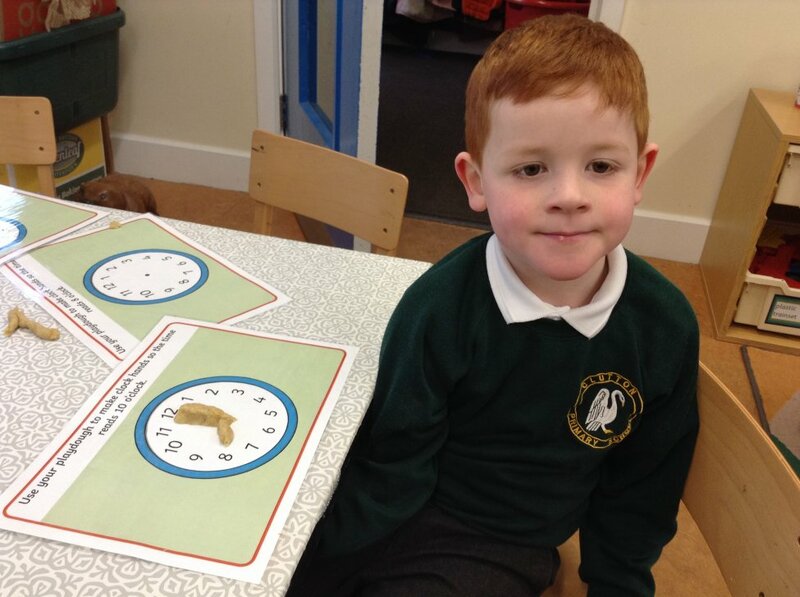 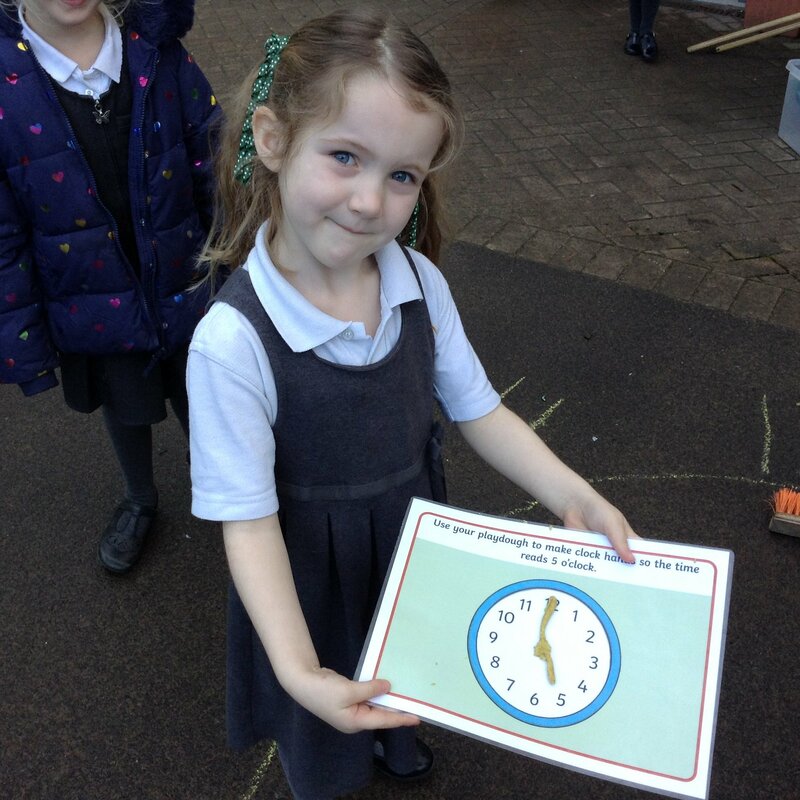 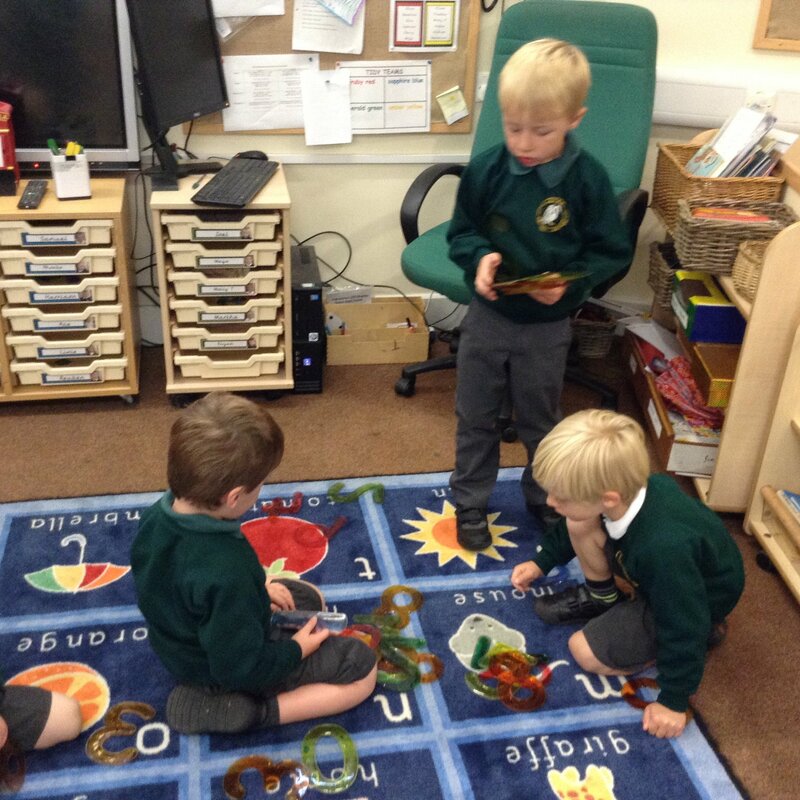 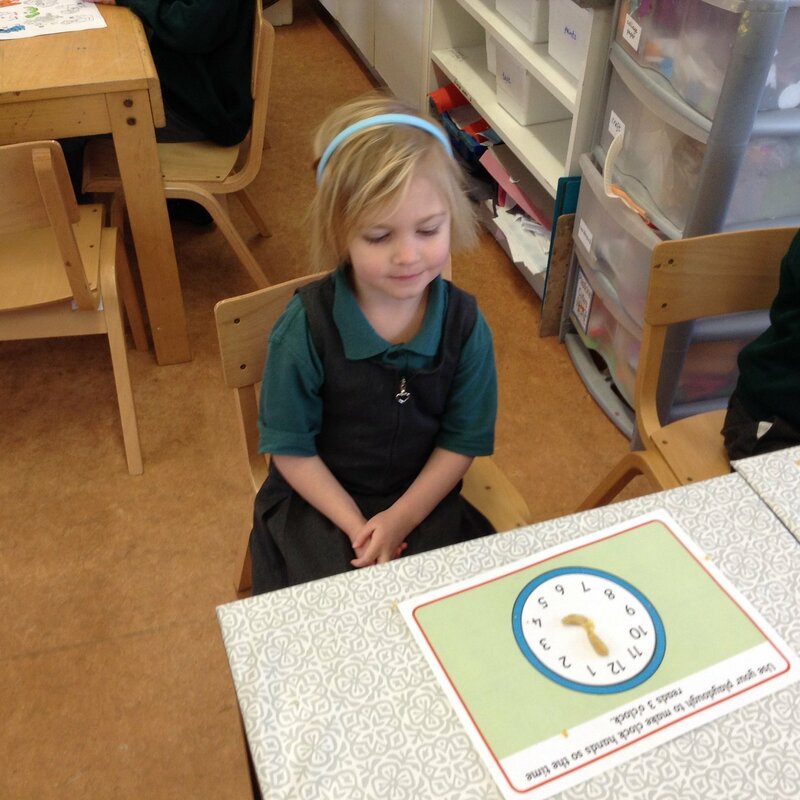 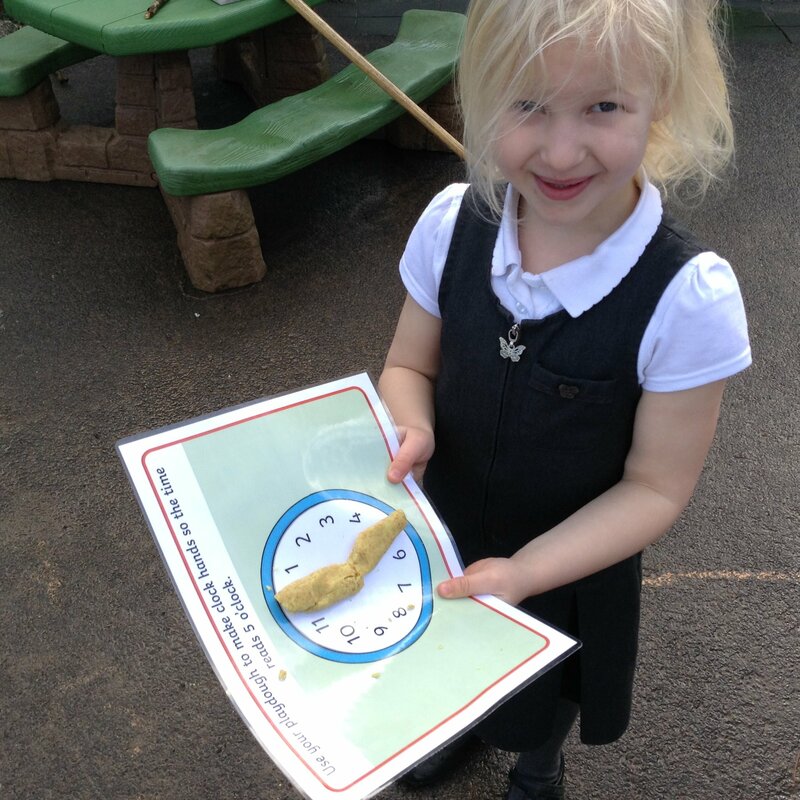 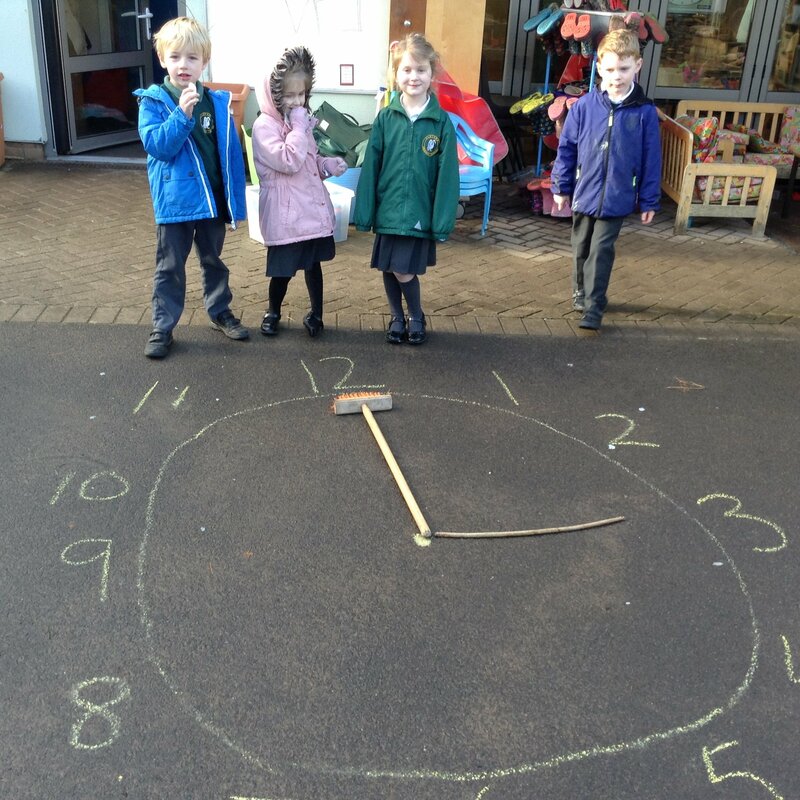 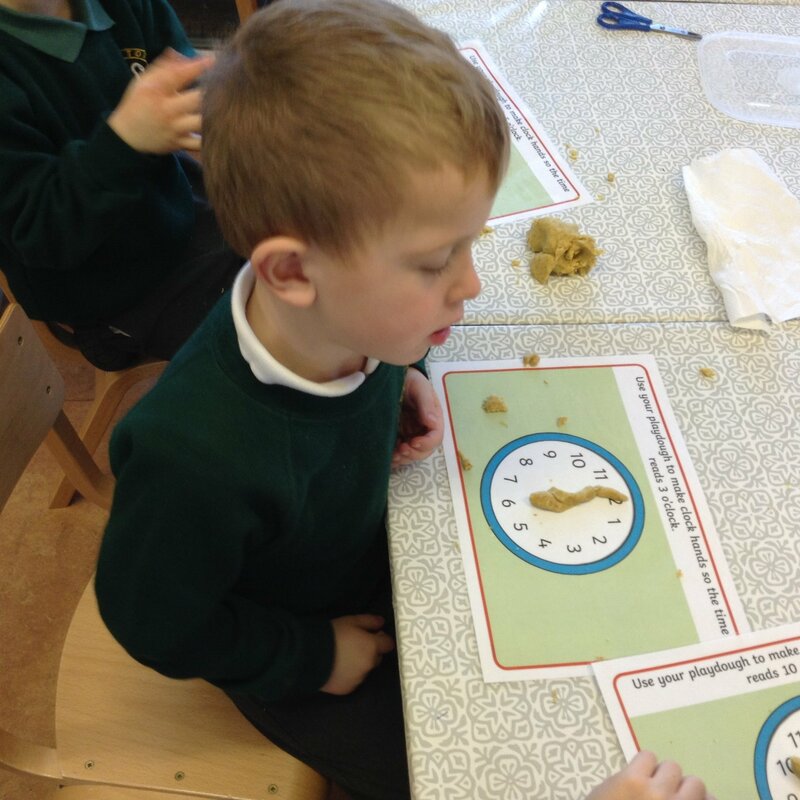 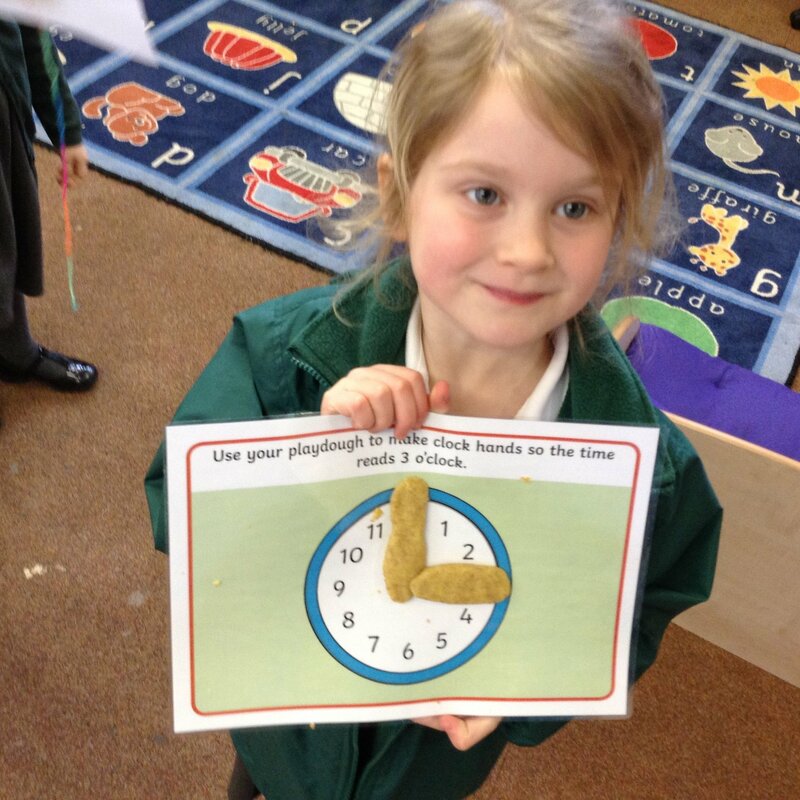 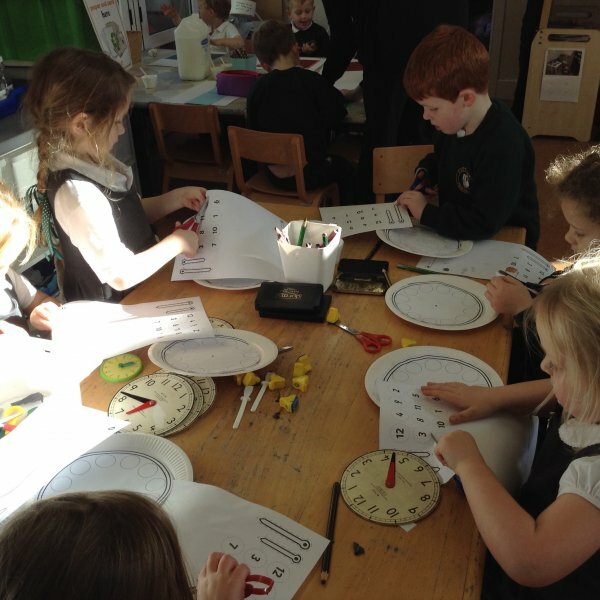 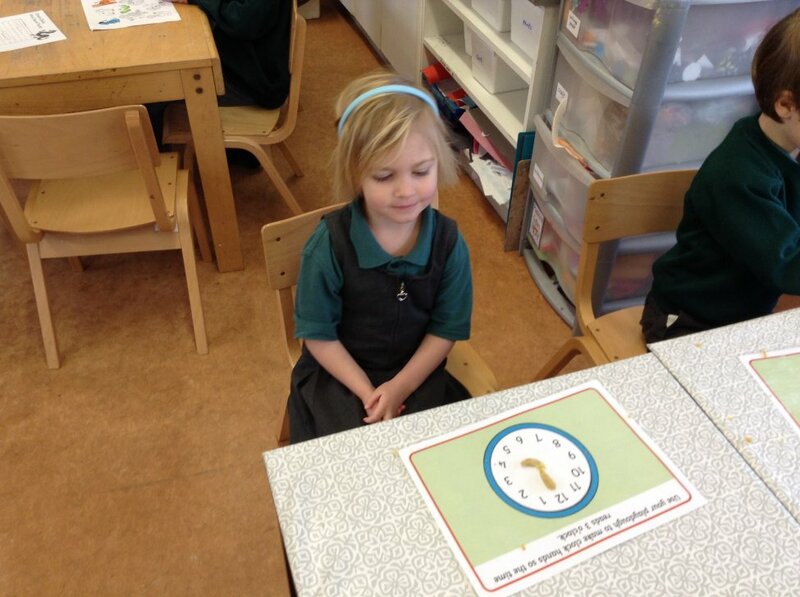 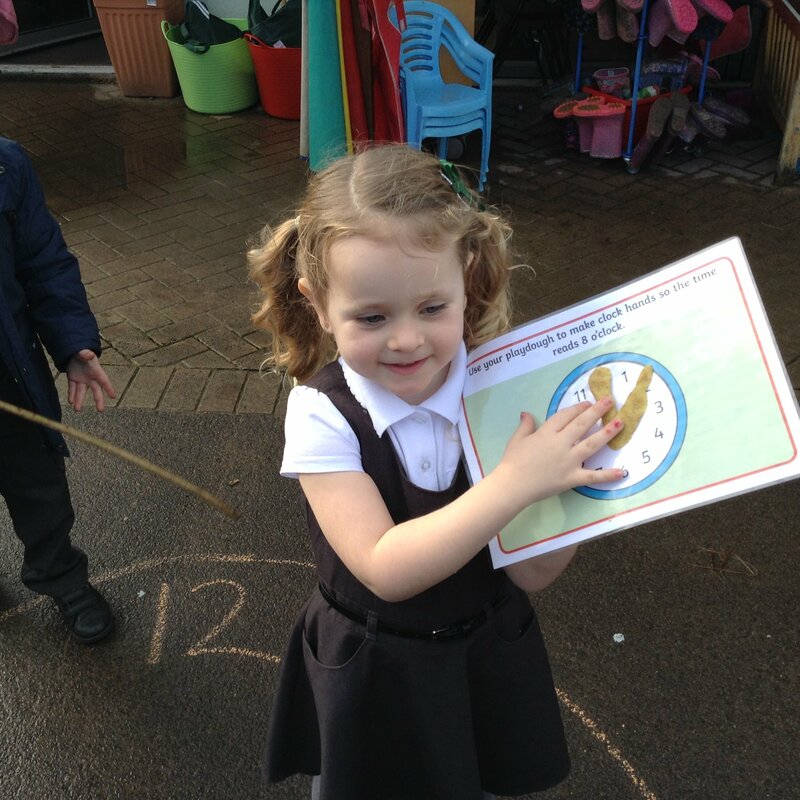 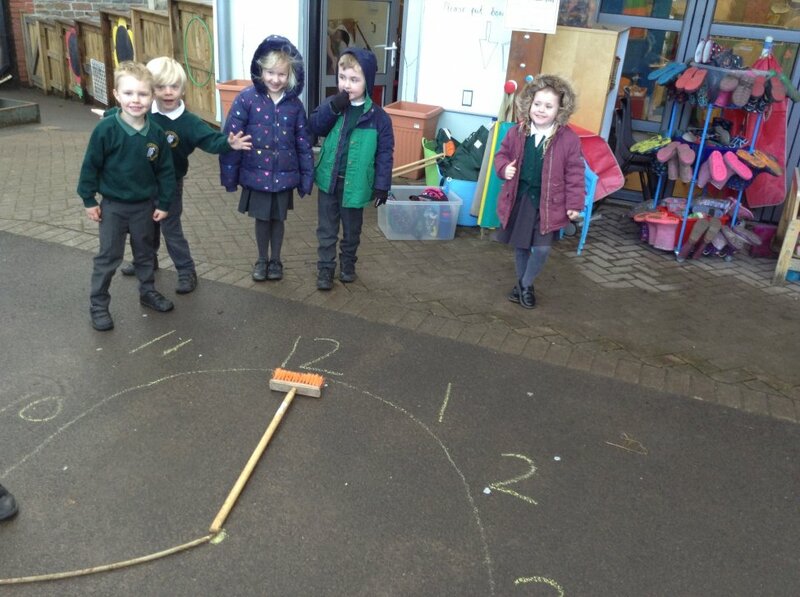 We are learning to tell the time - on the hour (o'clock) and half past. 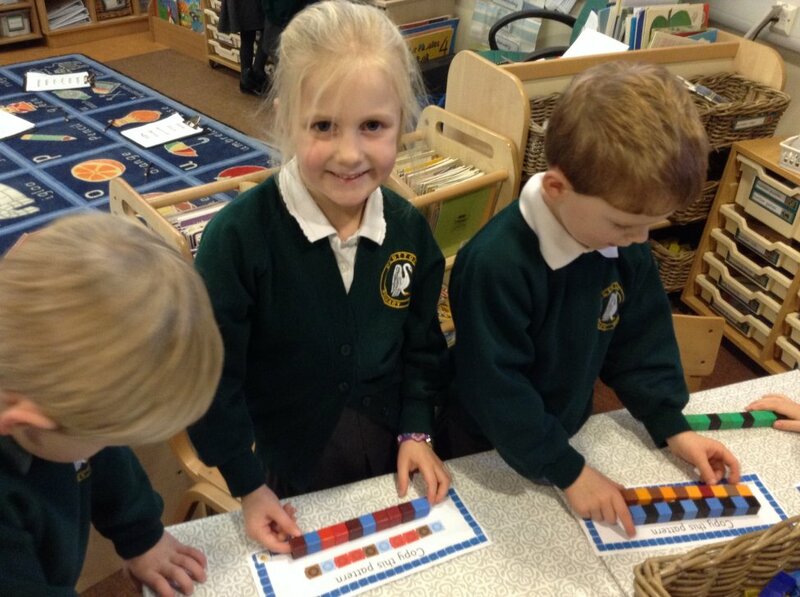 Here are some of things we have been learning about in Maths this term (starting from the most recent photos last week). 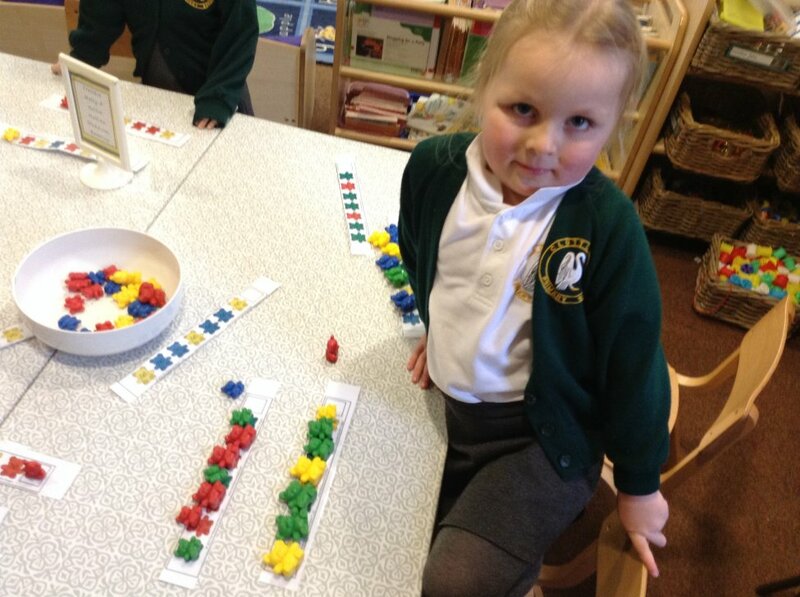 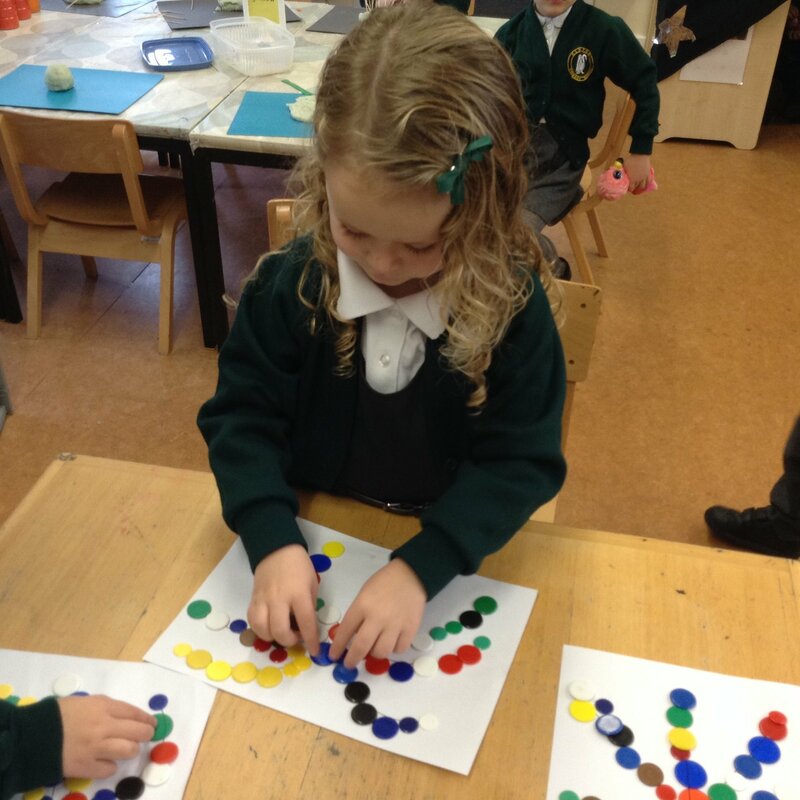 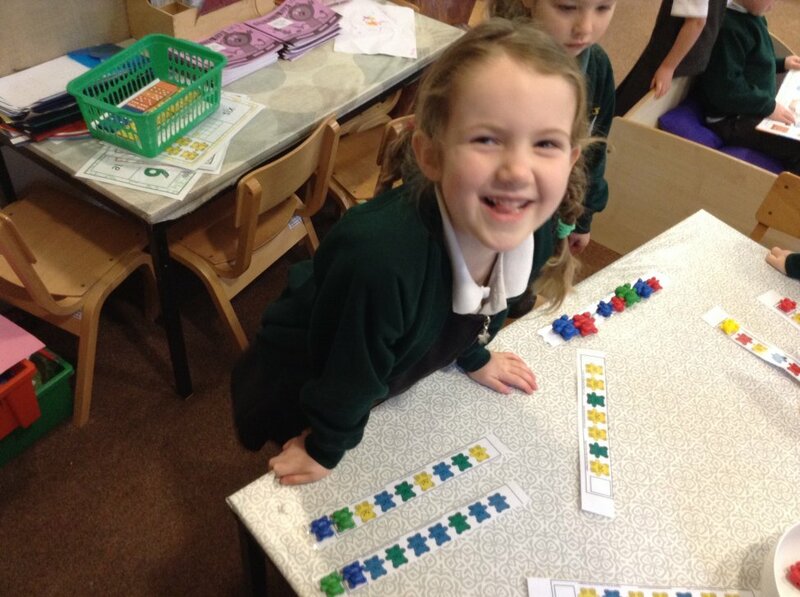 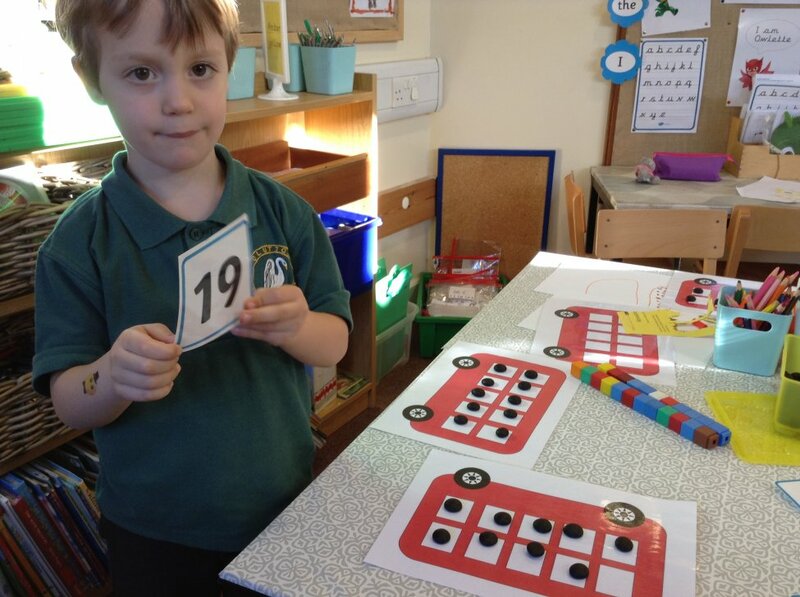 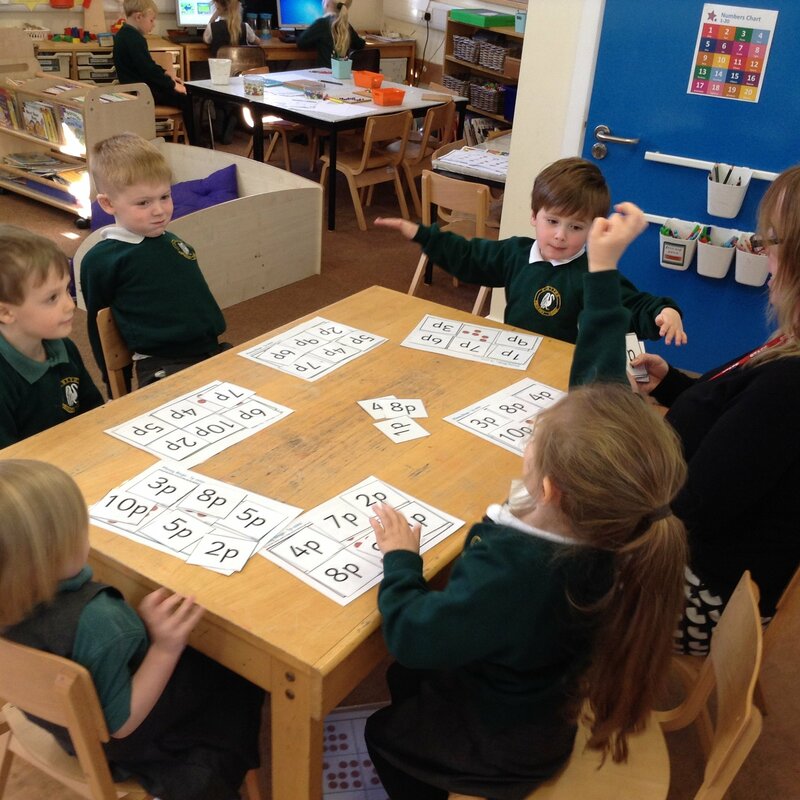 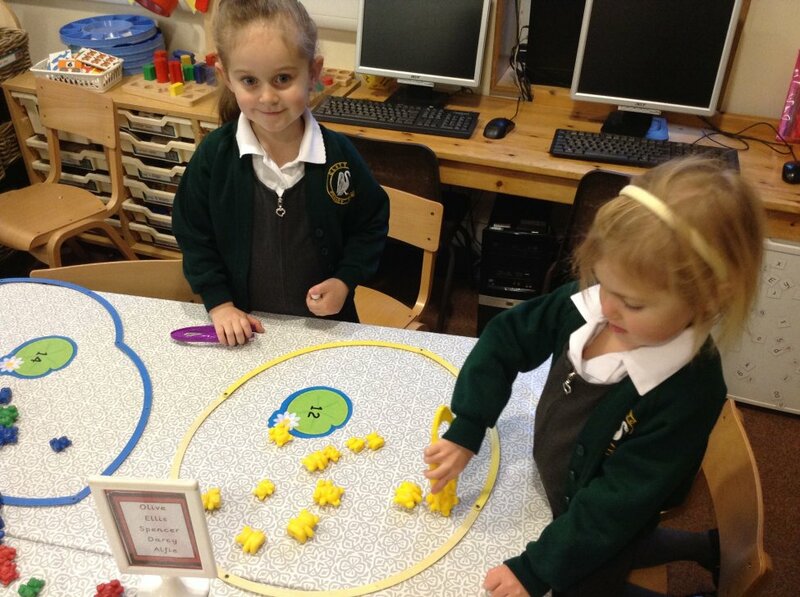 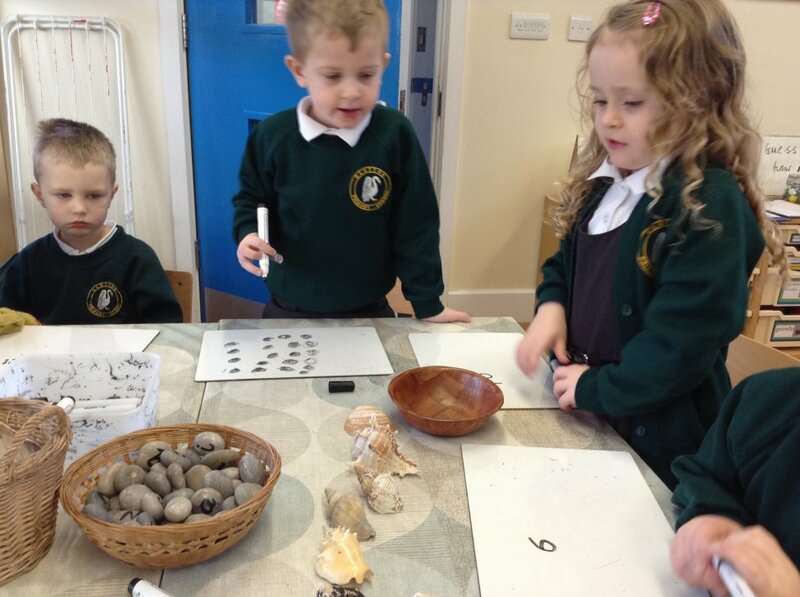 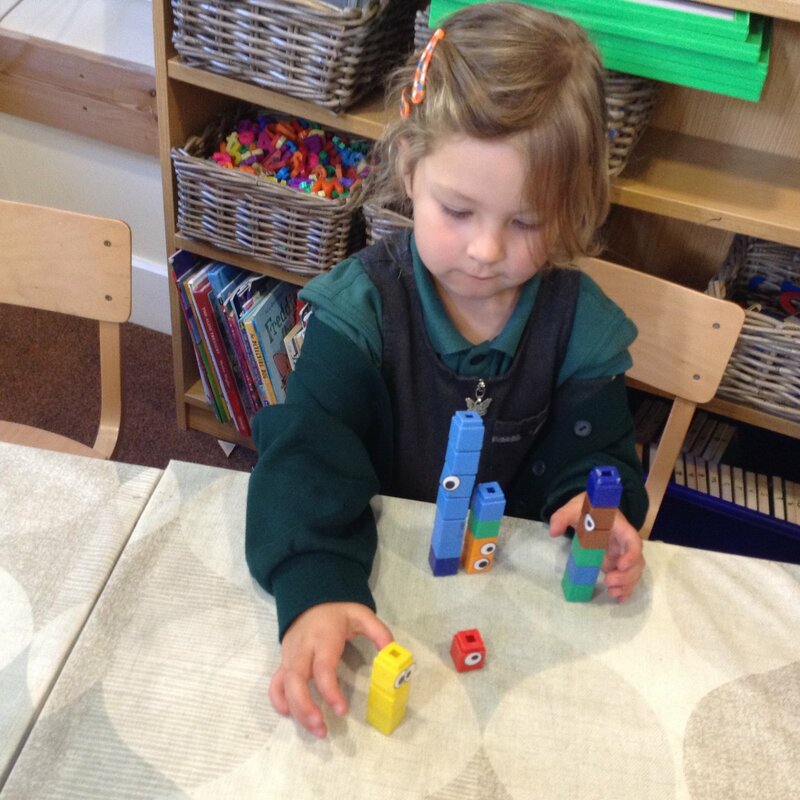 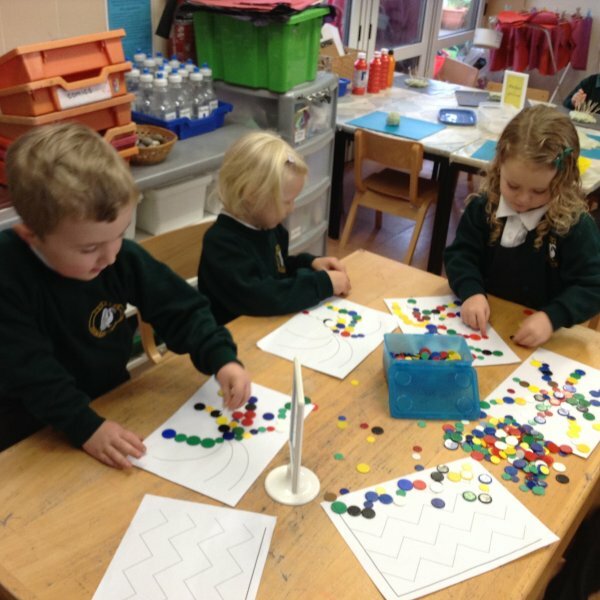 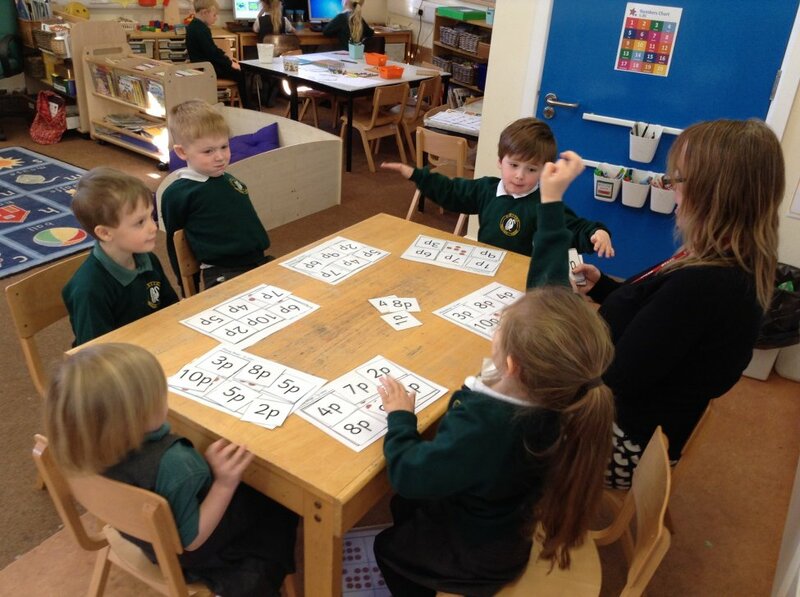 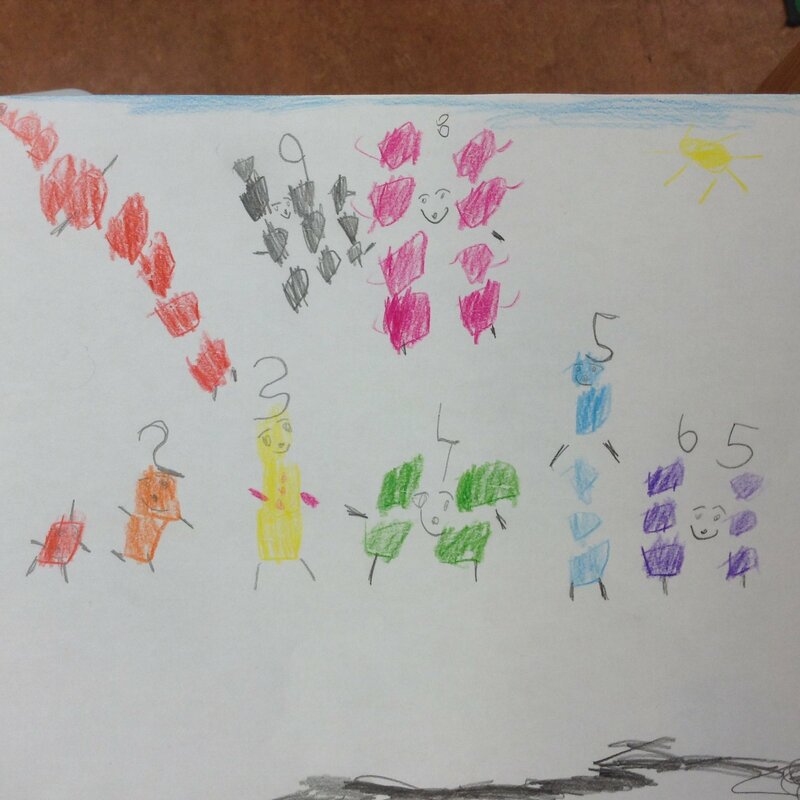 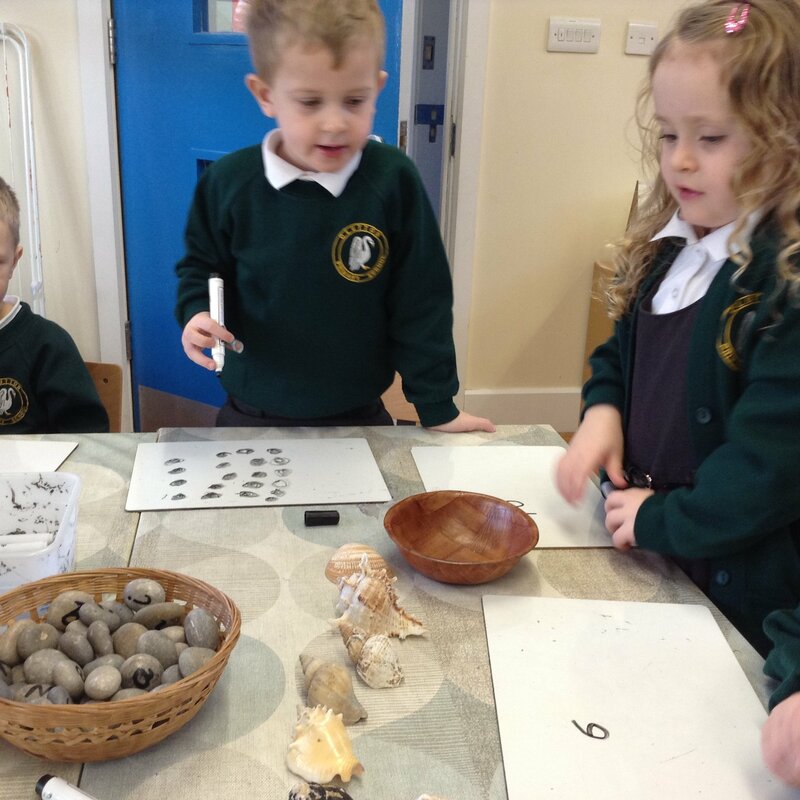 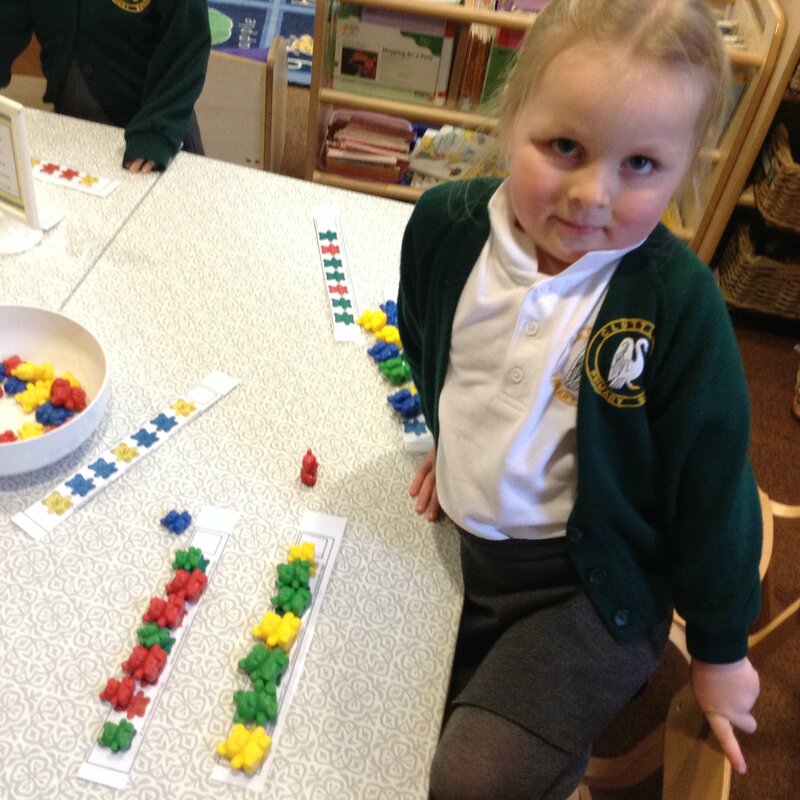 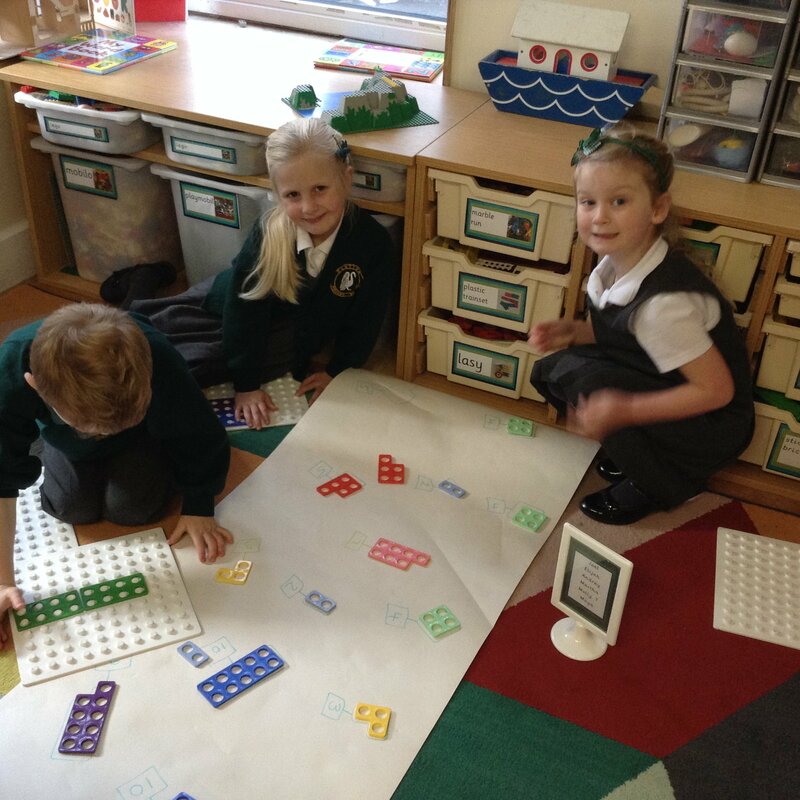 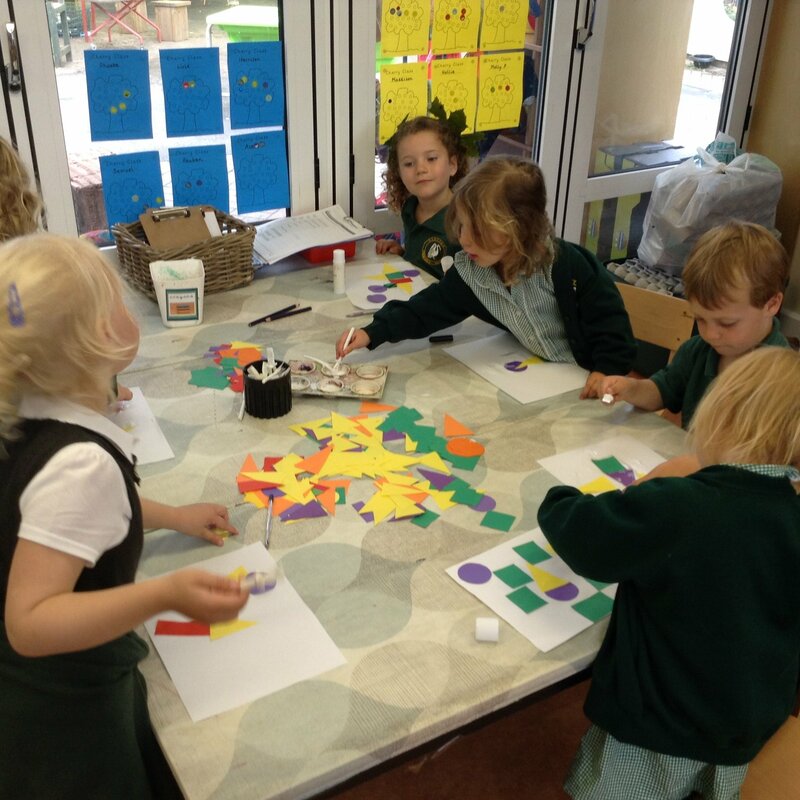 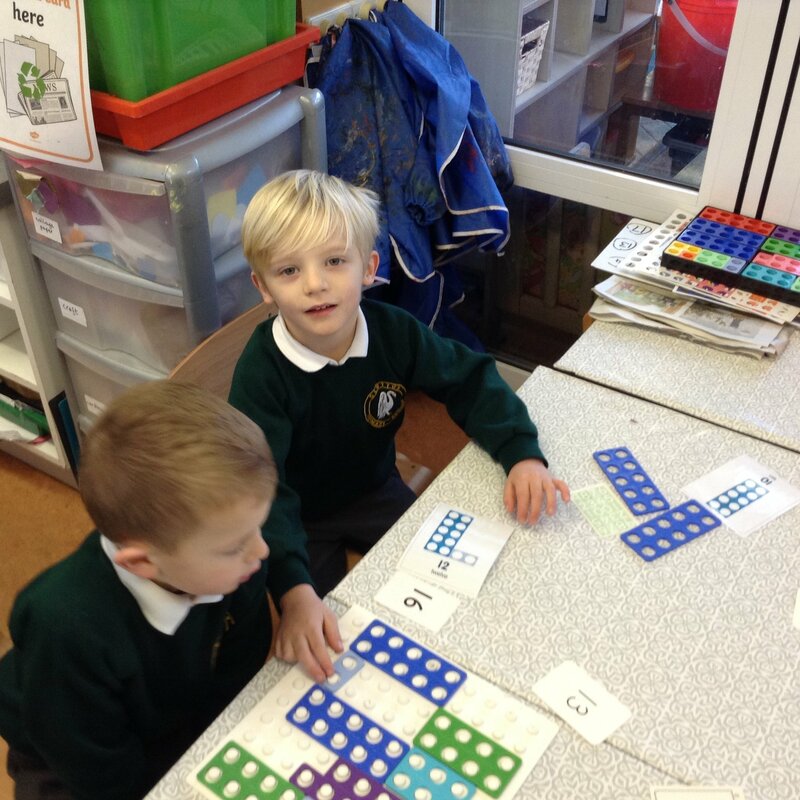 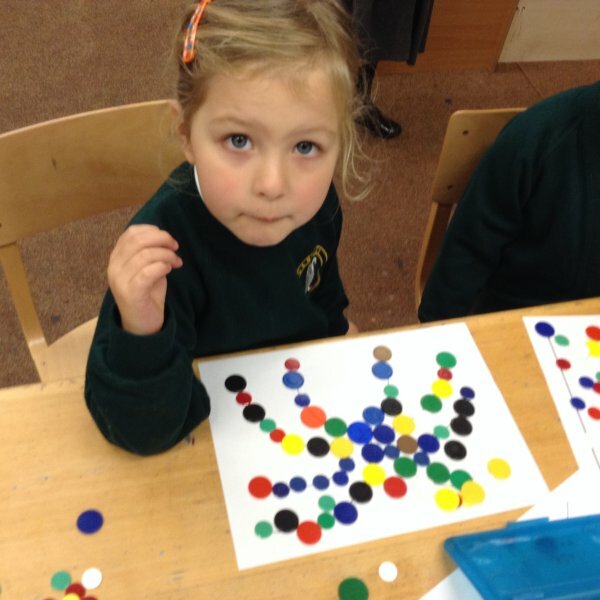 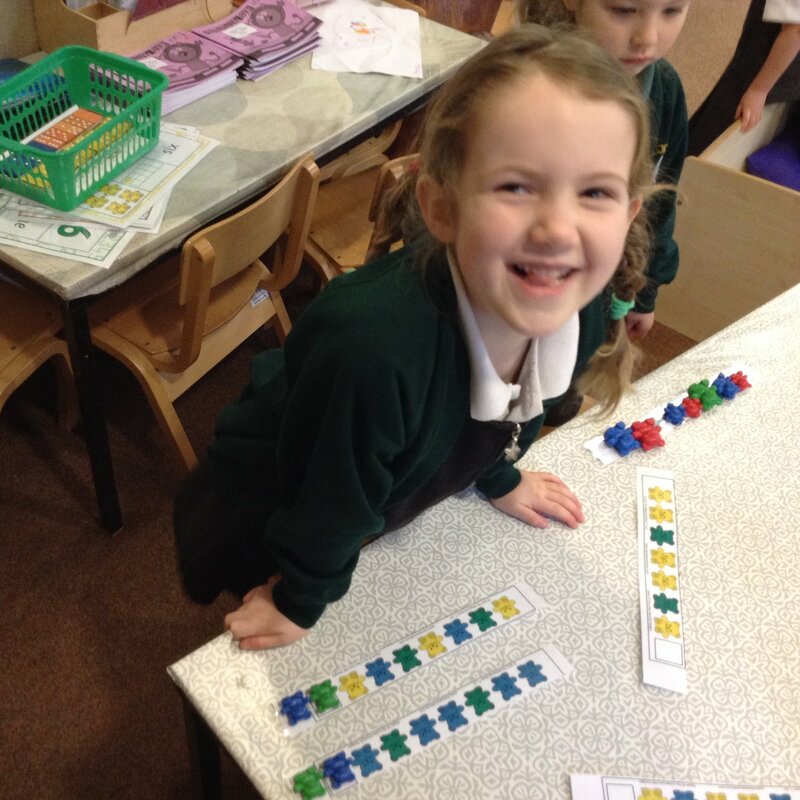 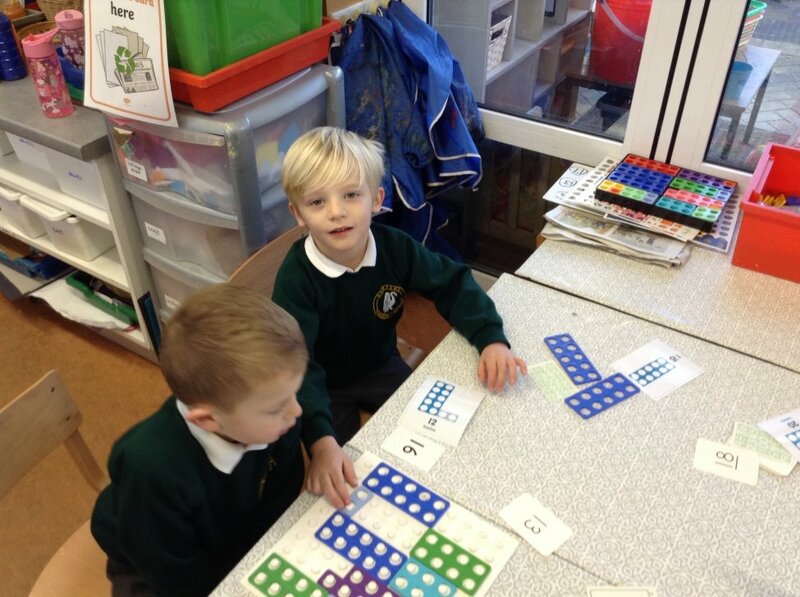 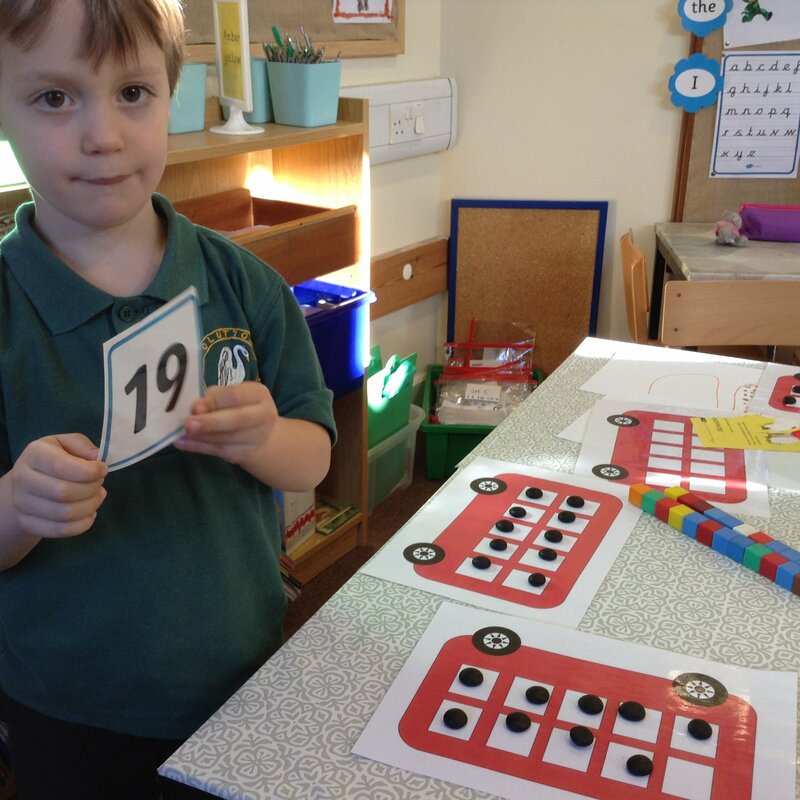 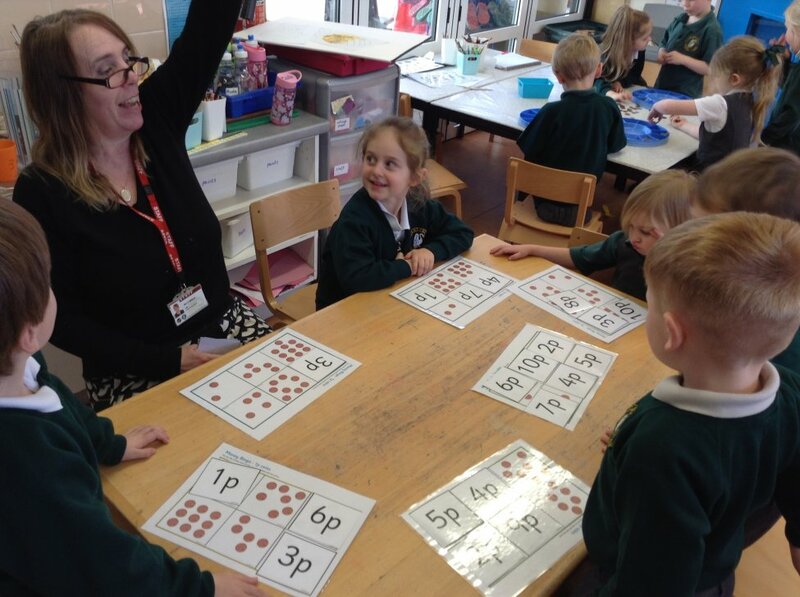 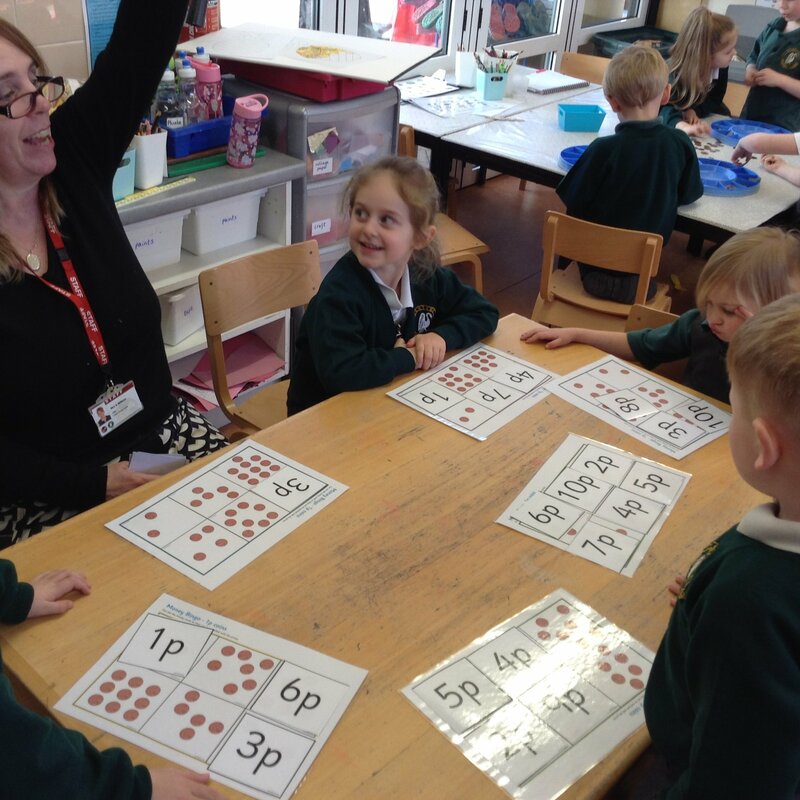 We have learnt about doubling numbers, making patterns and finding the next colour in the sequence, estimating numbers of objects, learning about teen numbers (10 and a little bit more) - and counting in 2s. 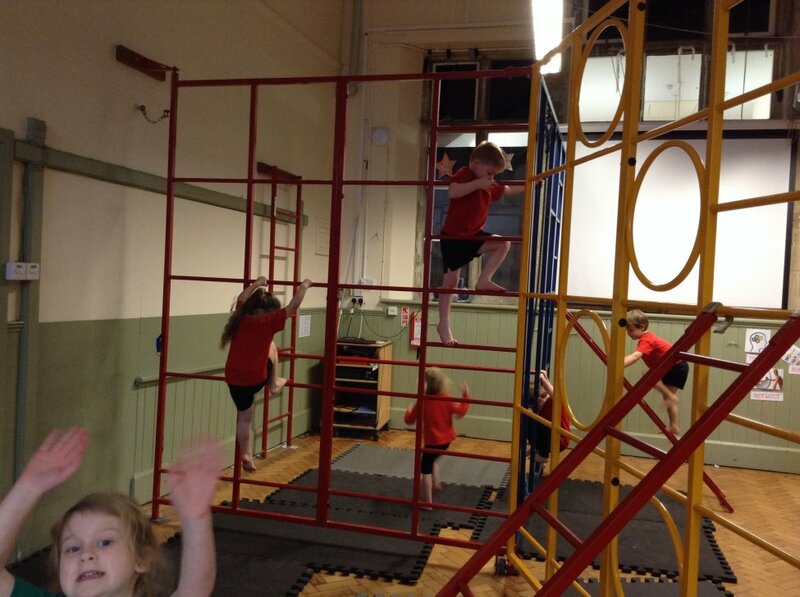 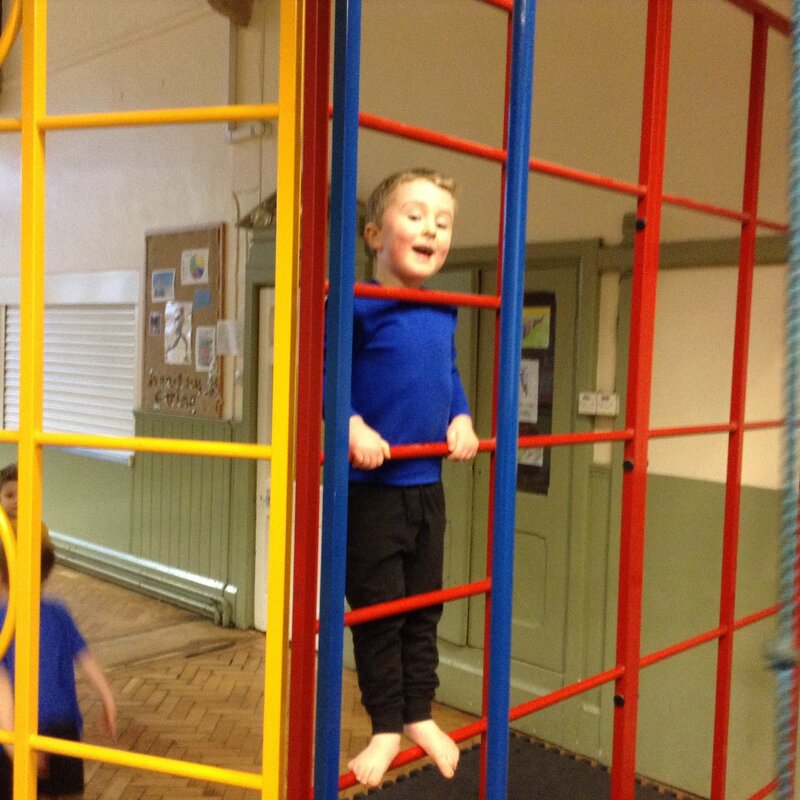 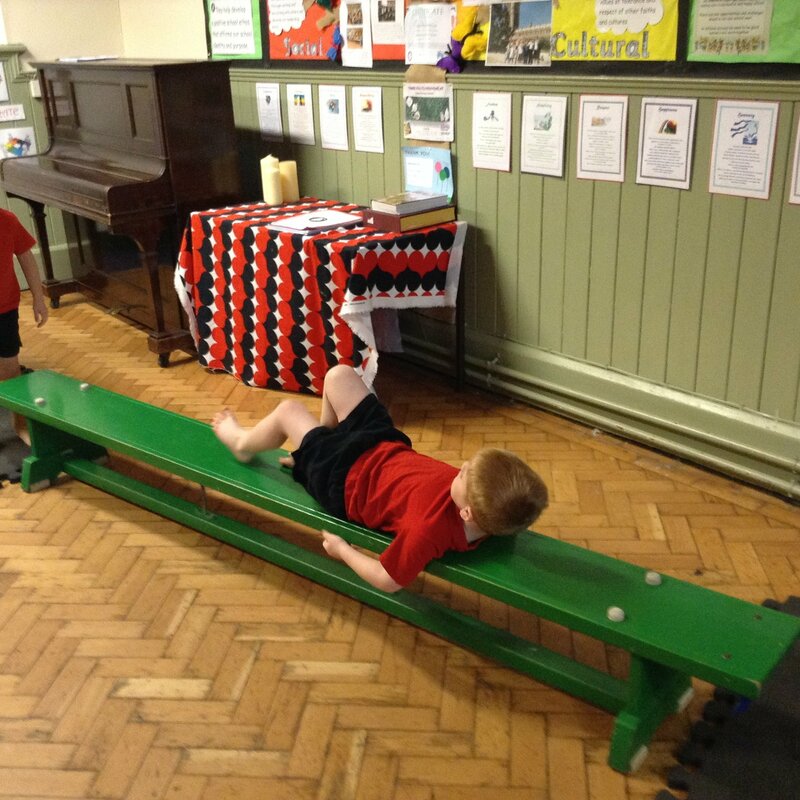 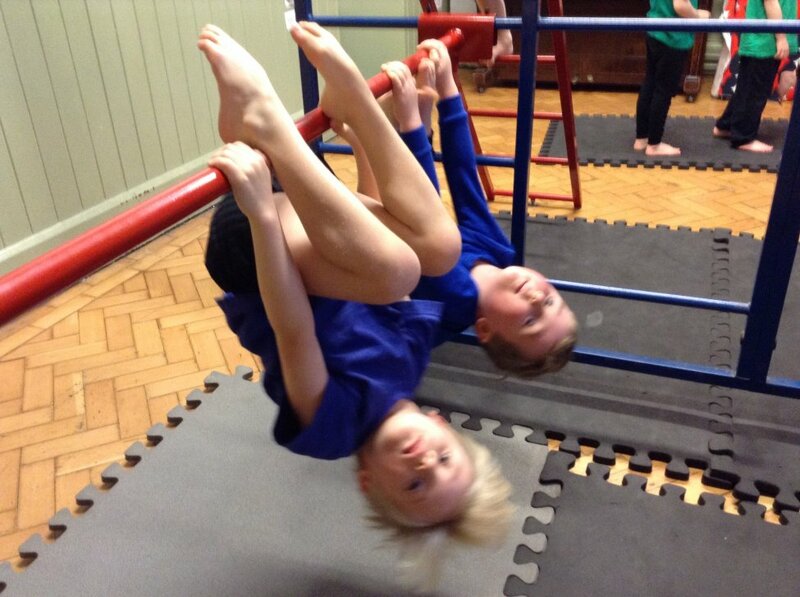 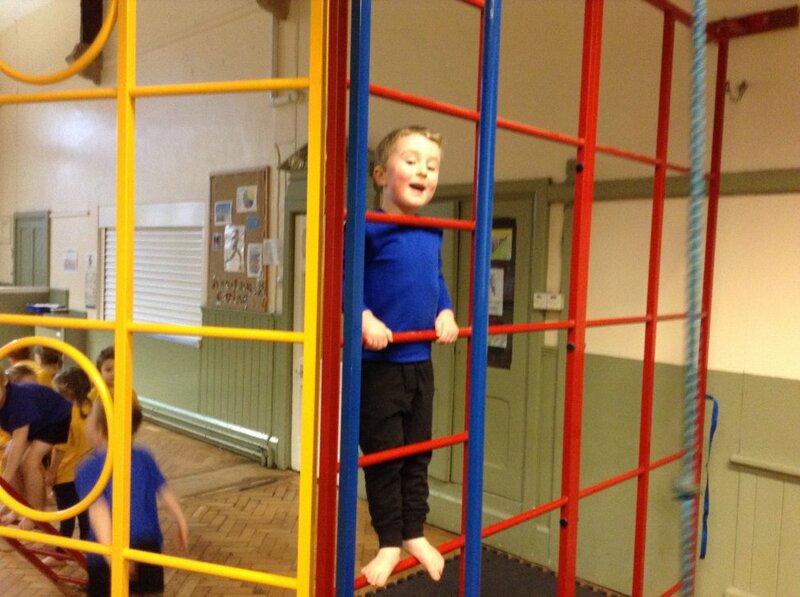 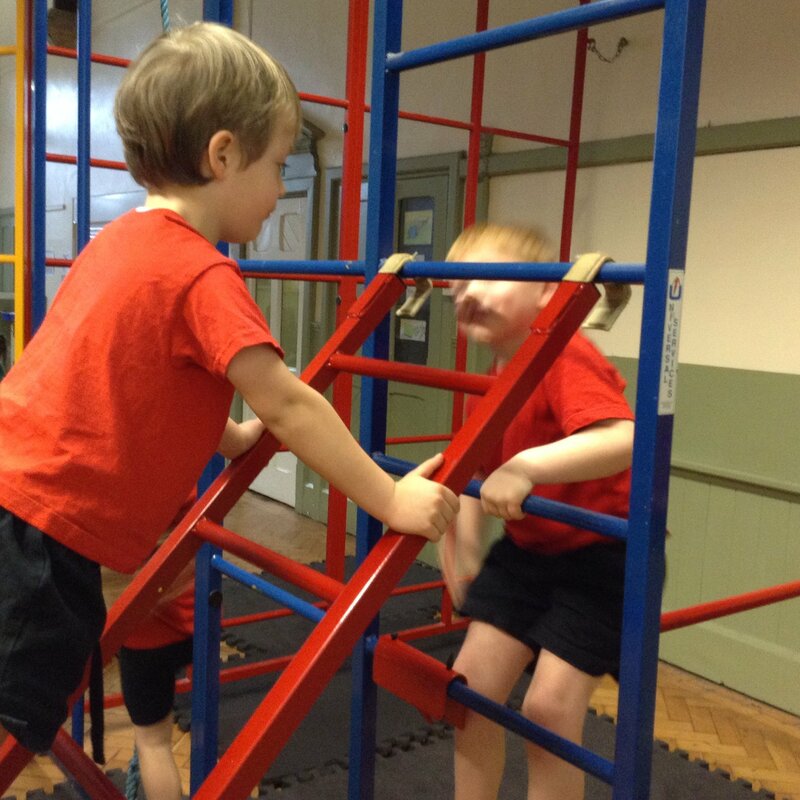 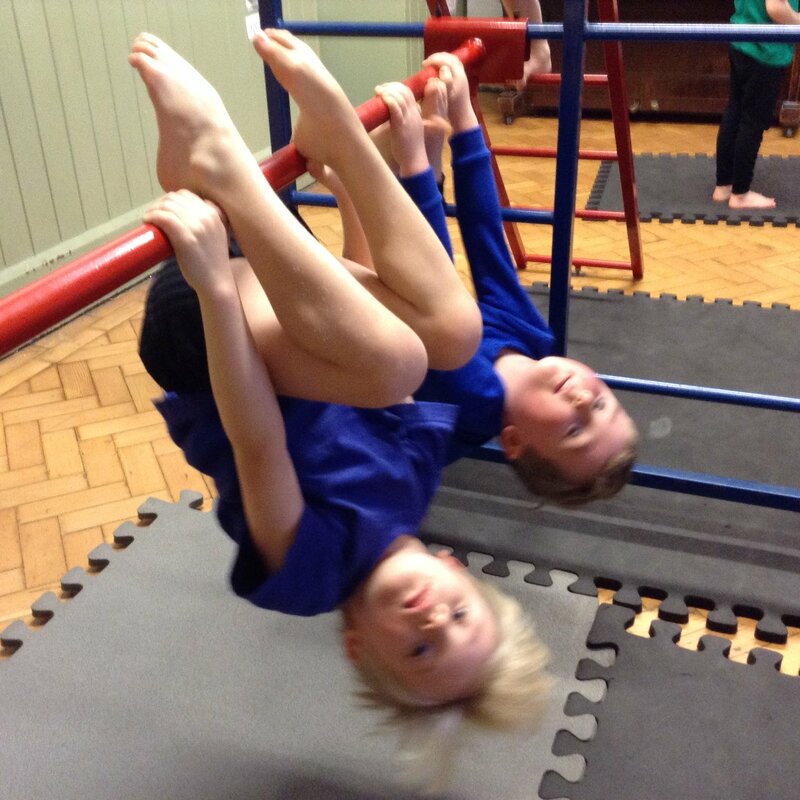 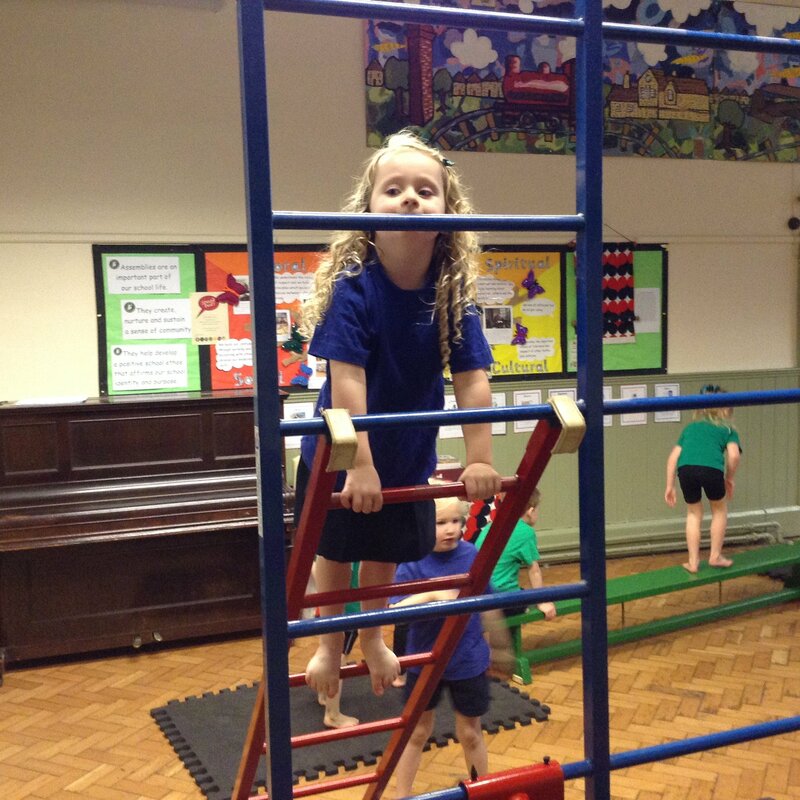 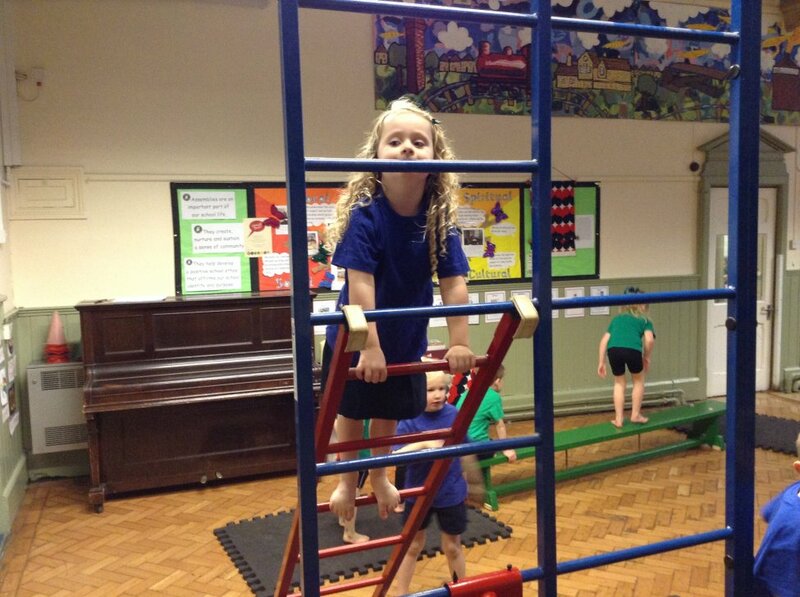 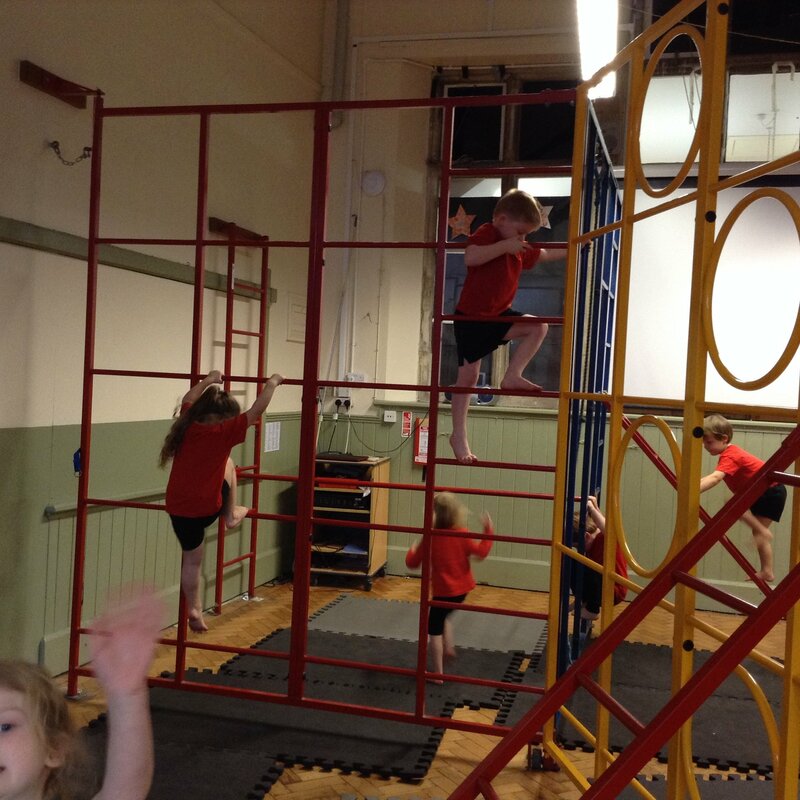 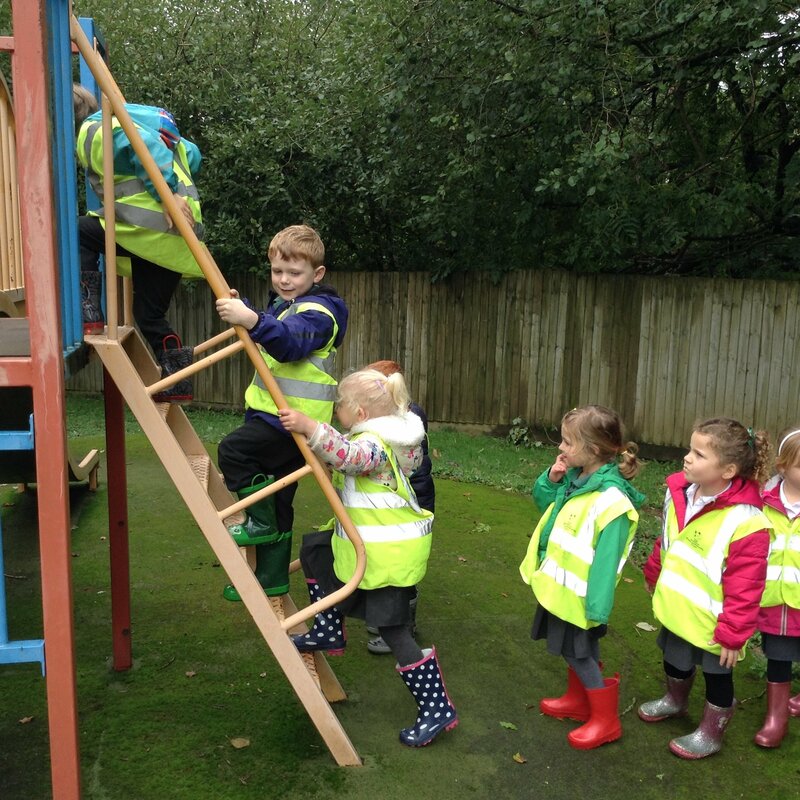 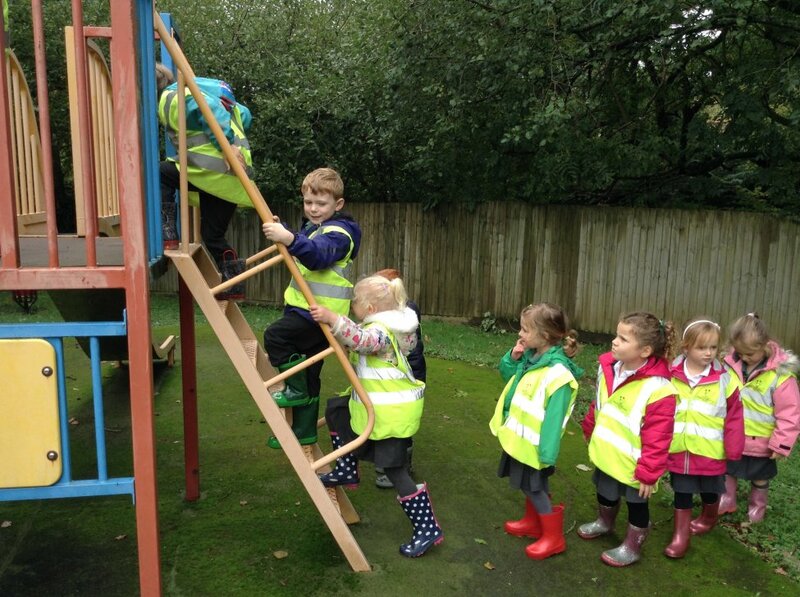 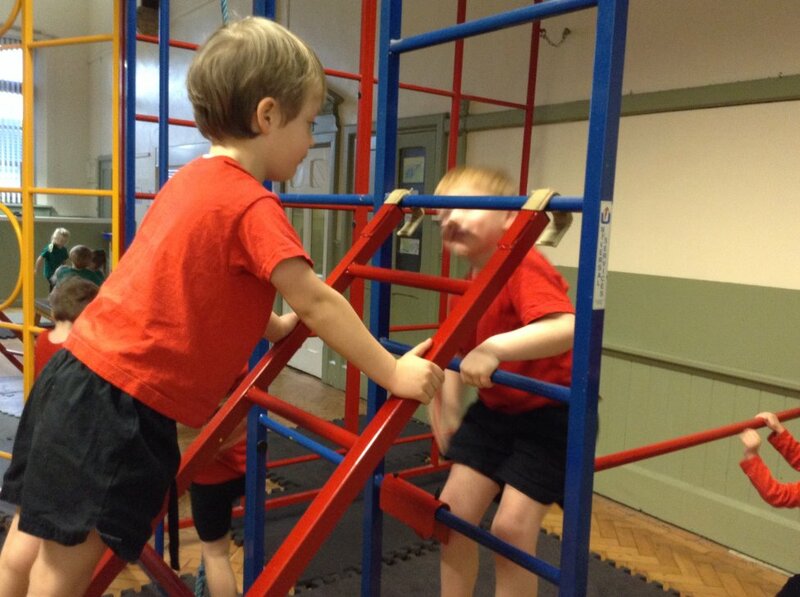 There was great excitement in Cherry Class when Mrs Morris and Miss Miller set up the climbing apparatus in P.E.! 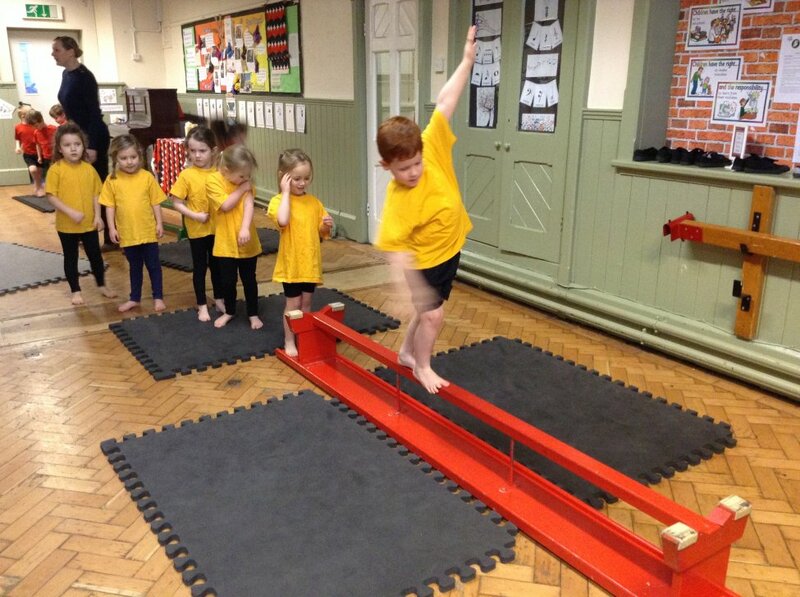 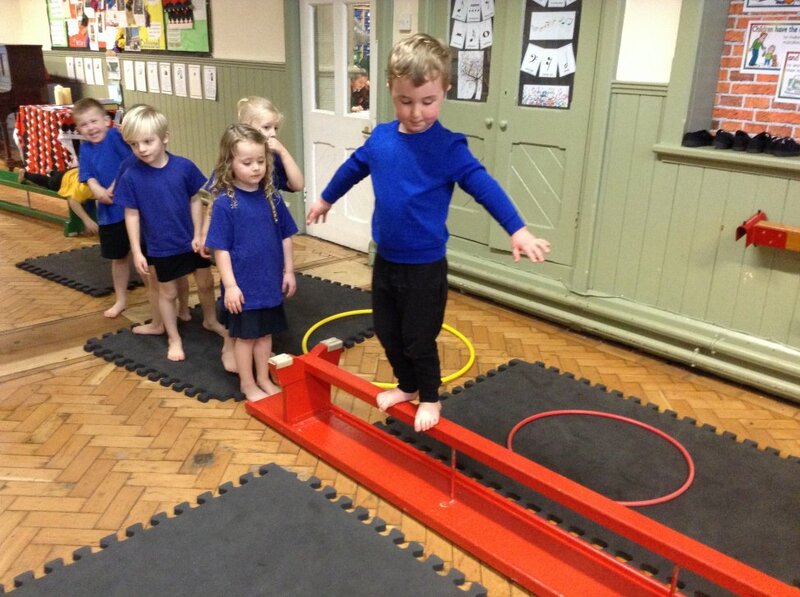 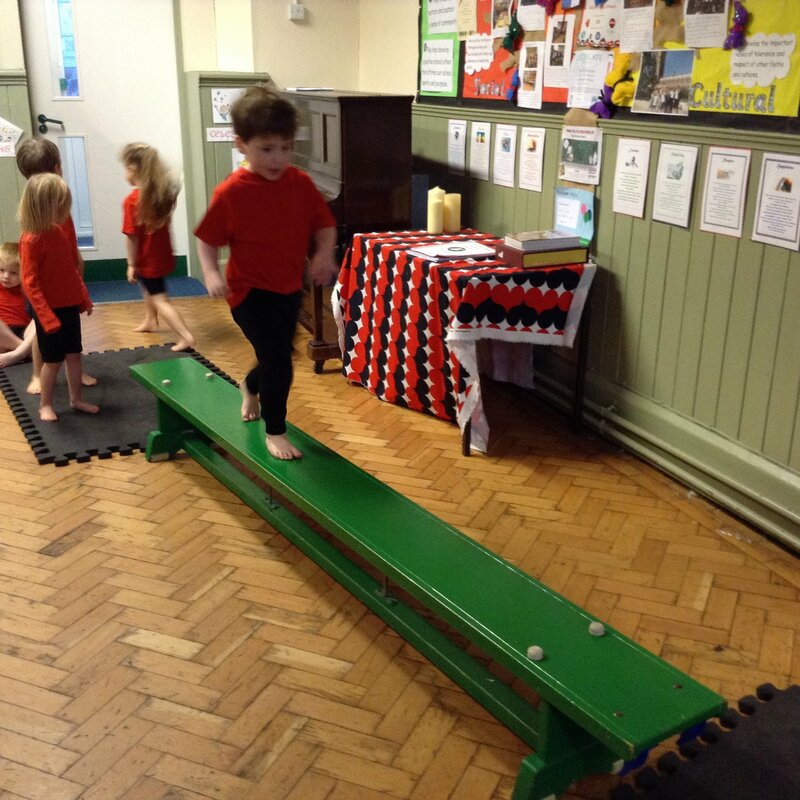 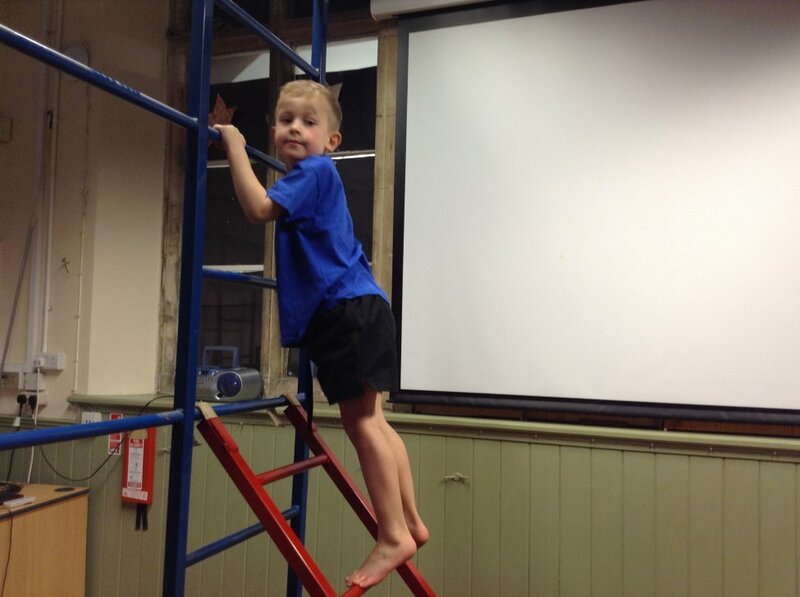 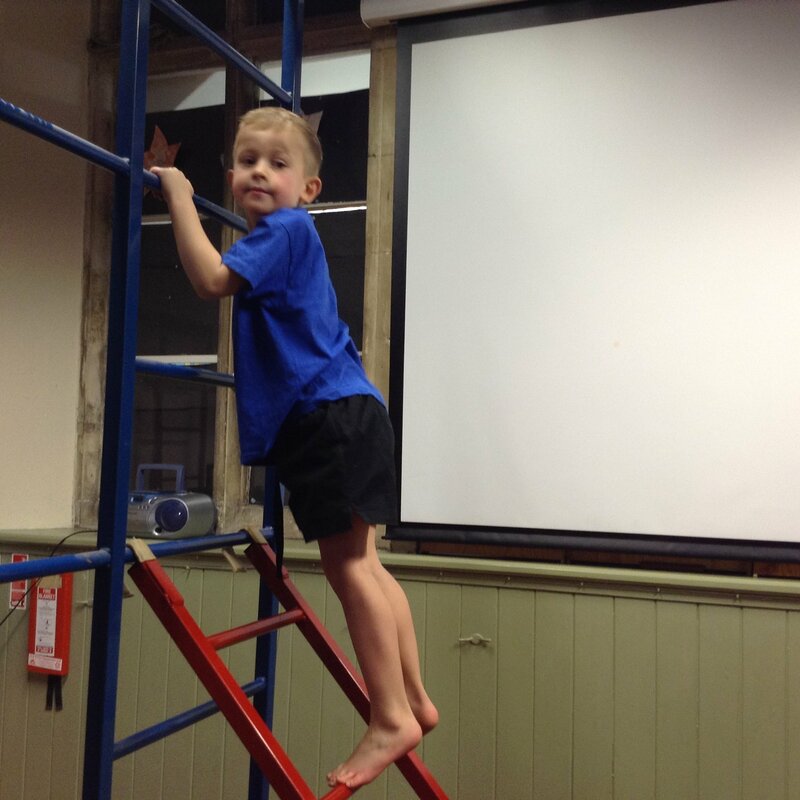 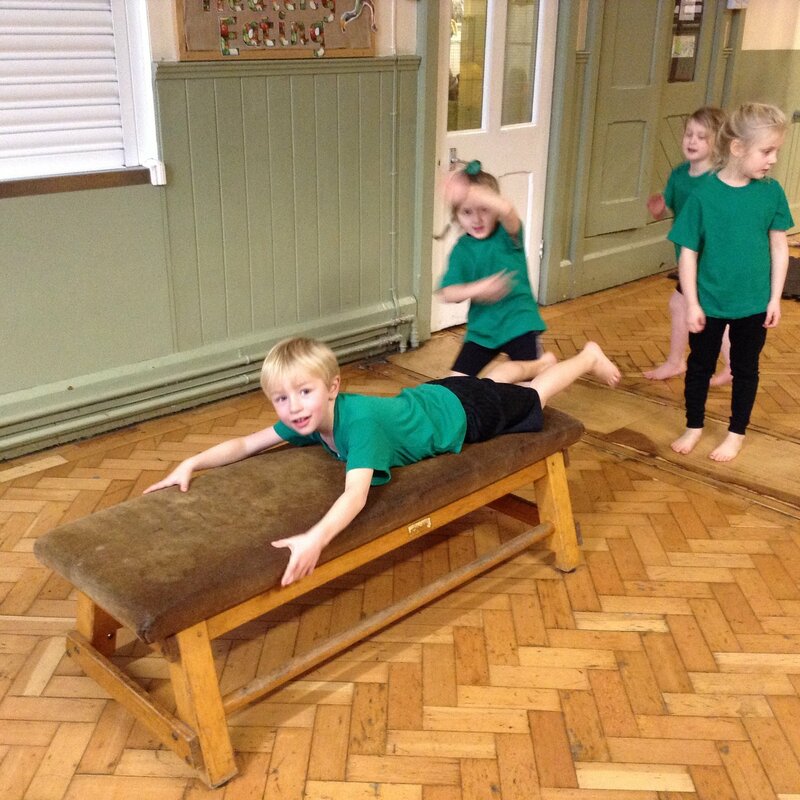 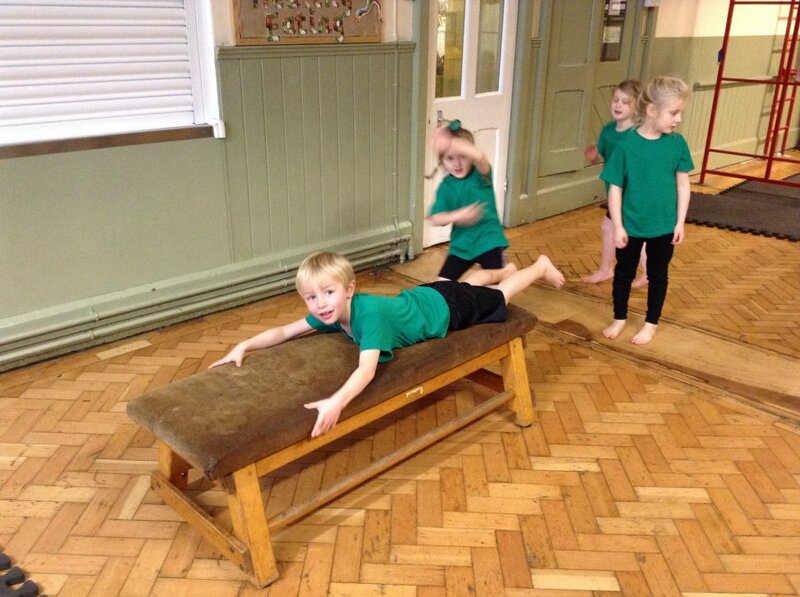 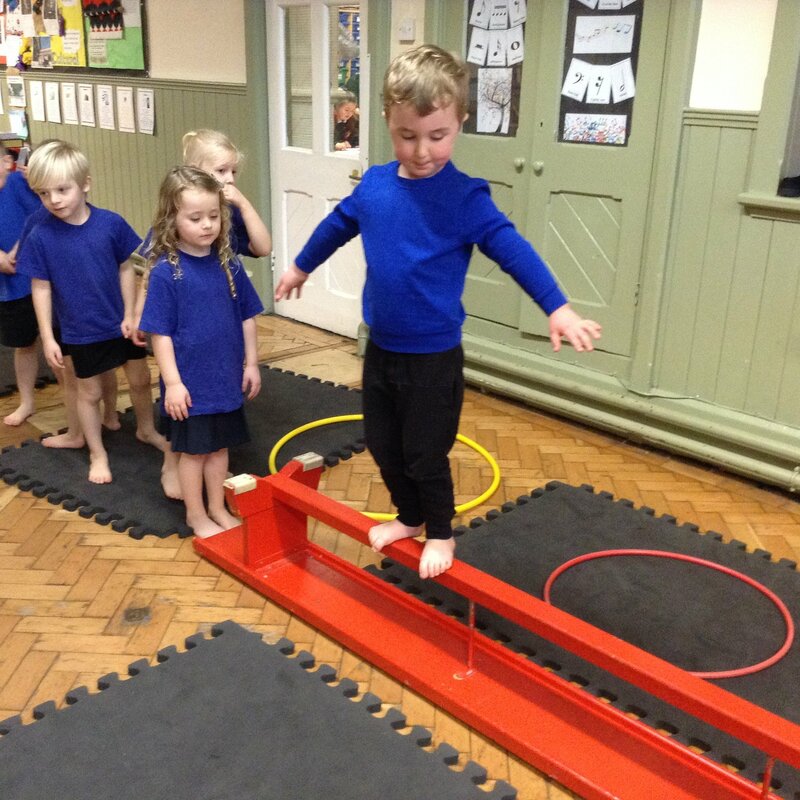 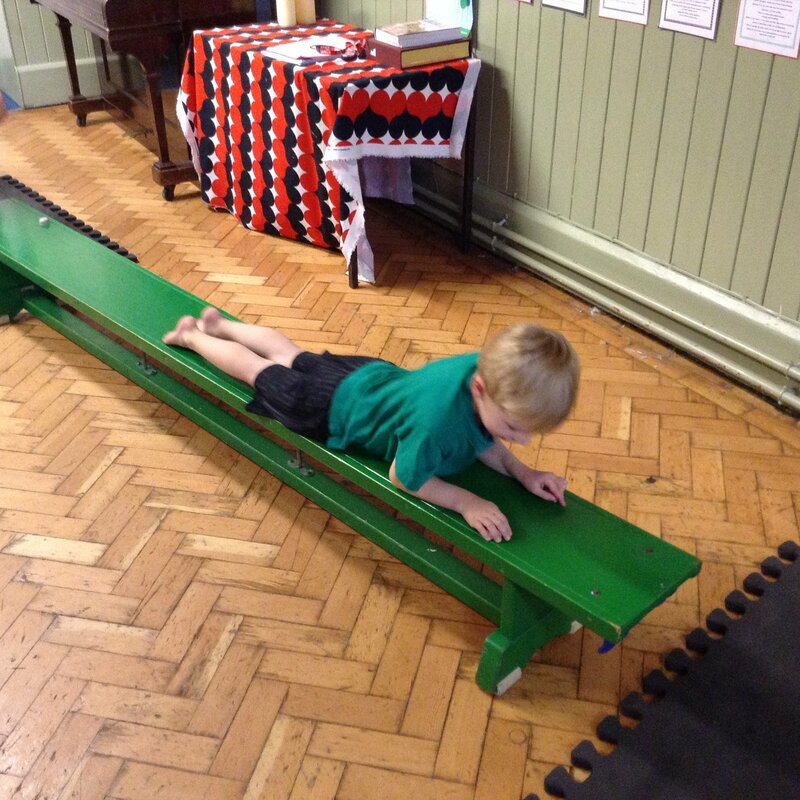 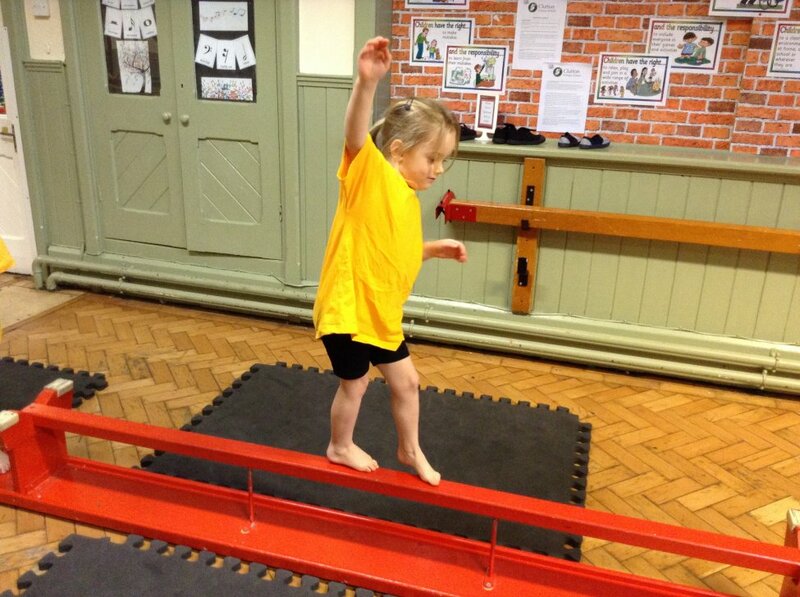 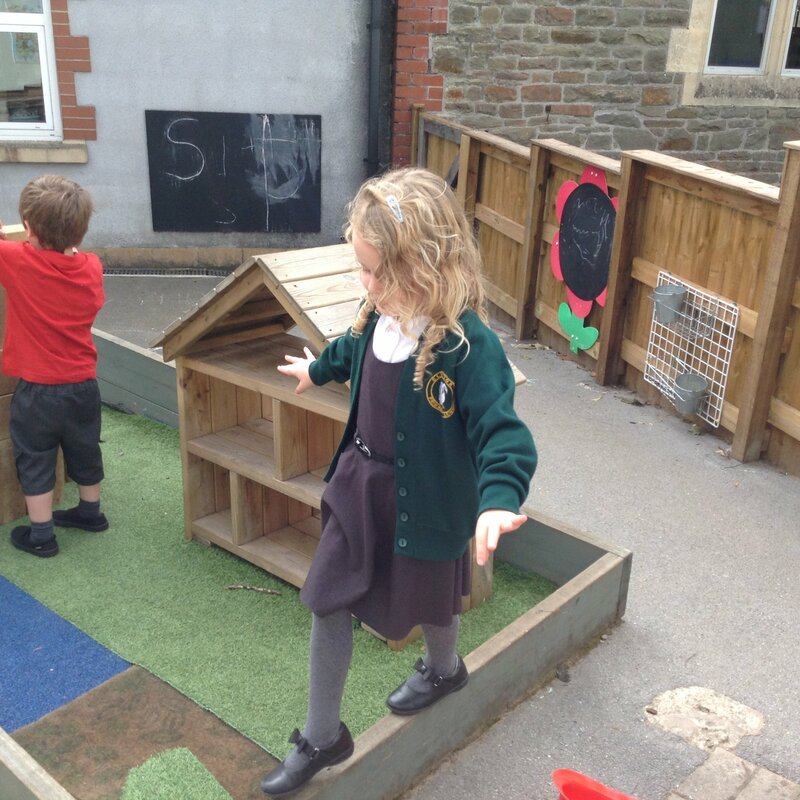 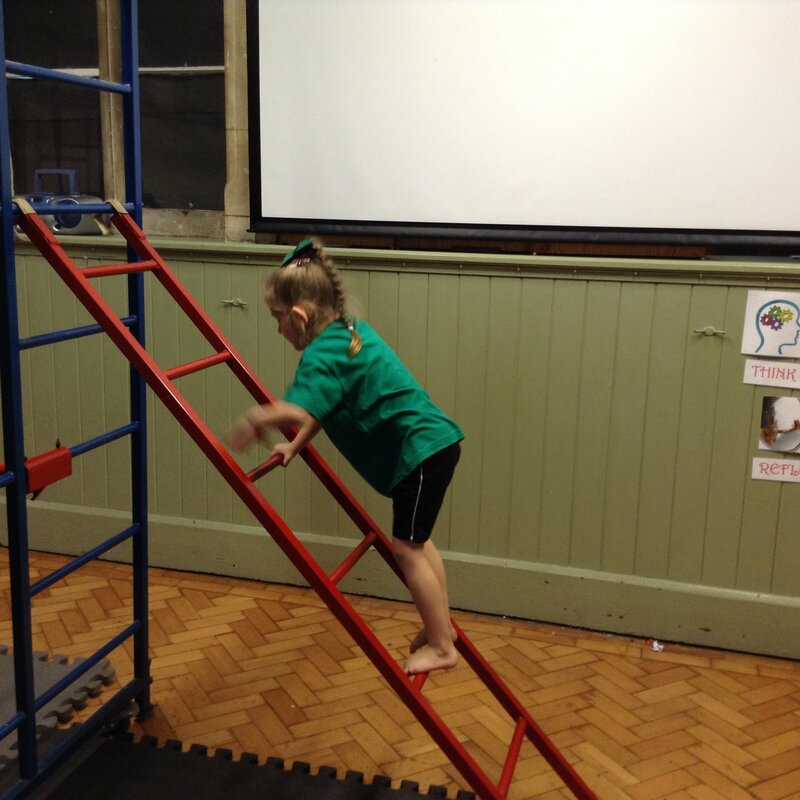 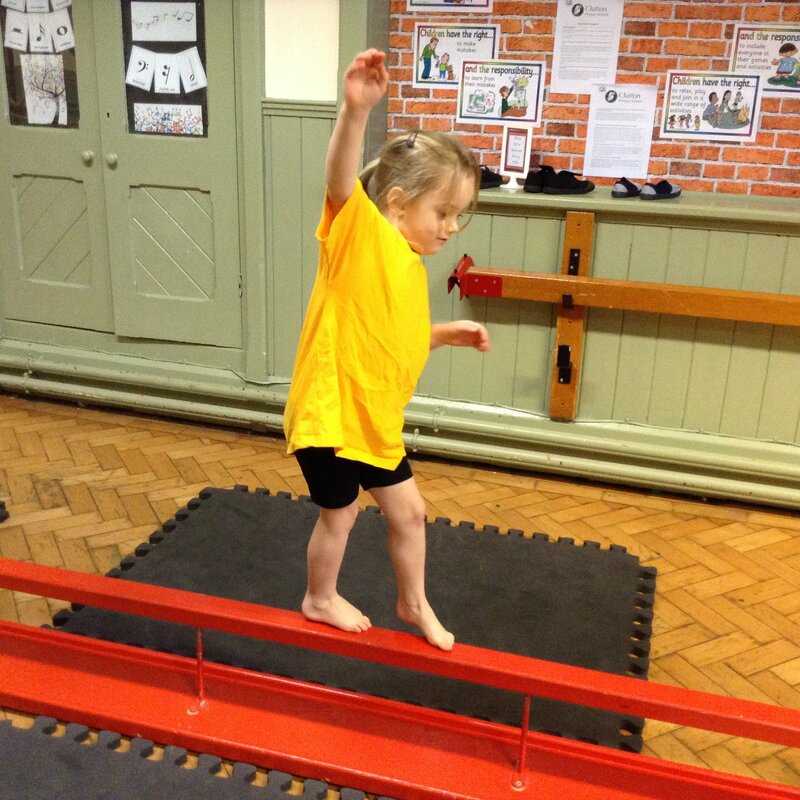 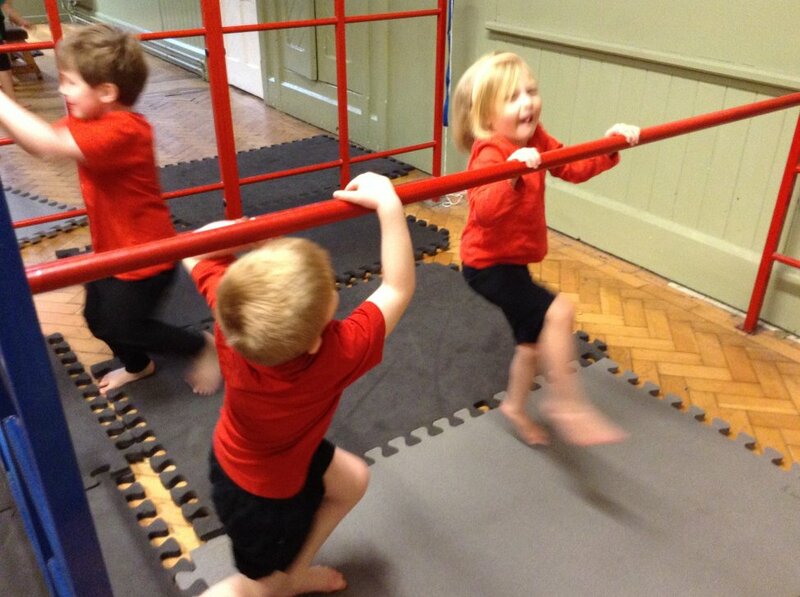 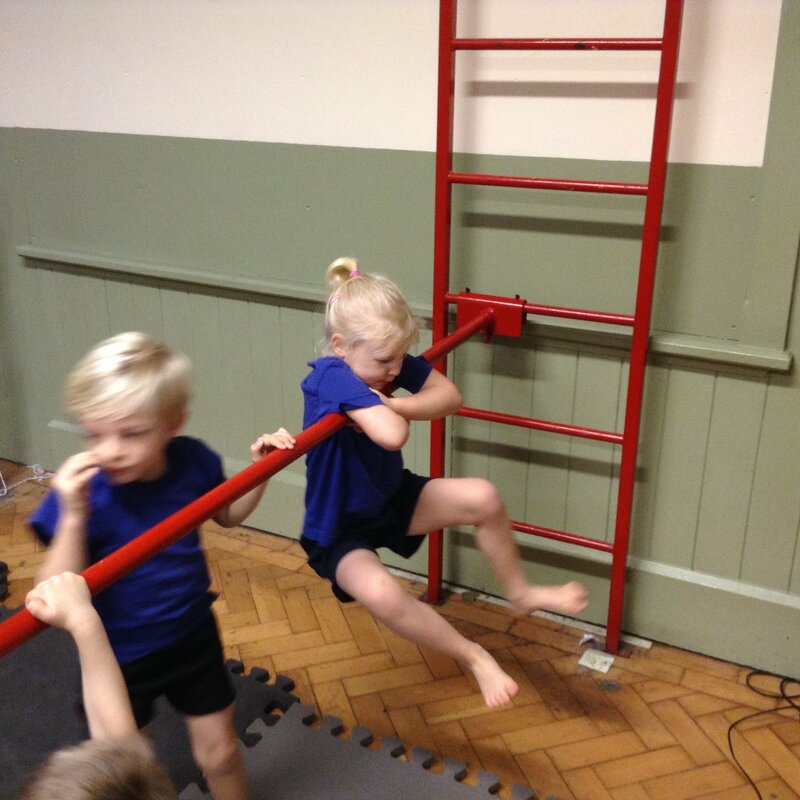 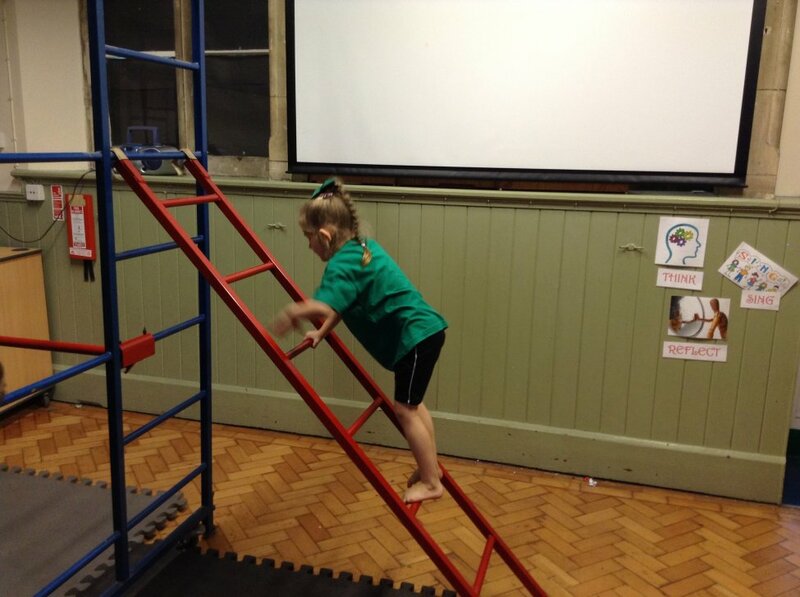 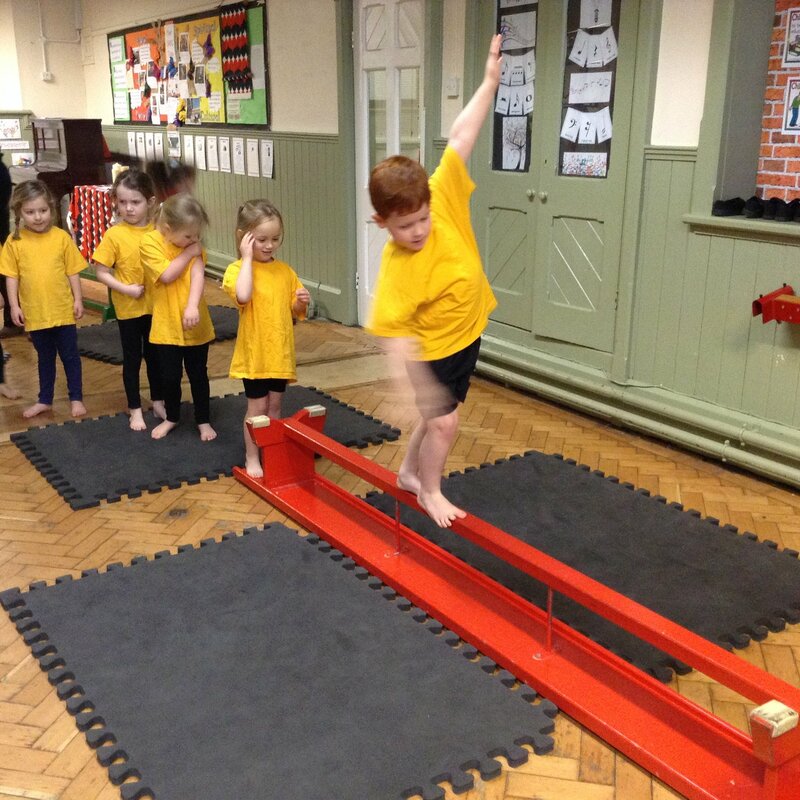 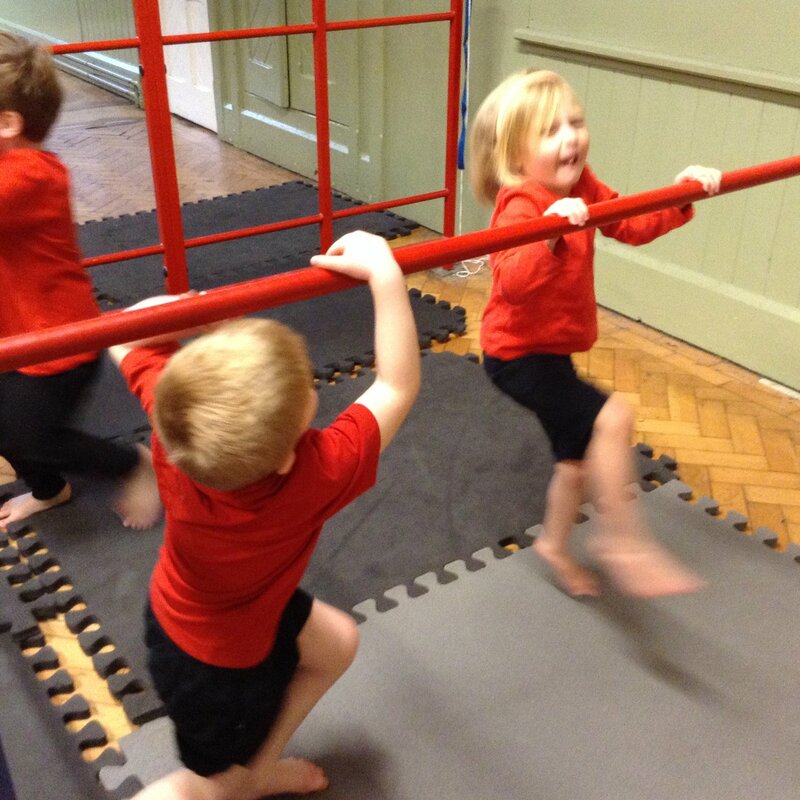 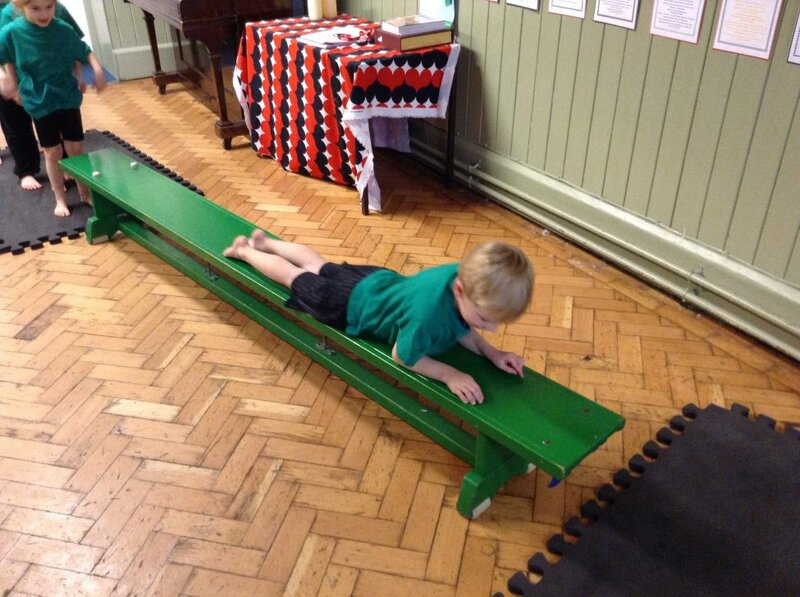 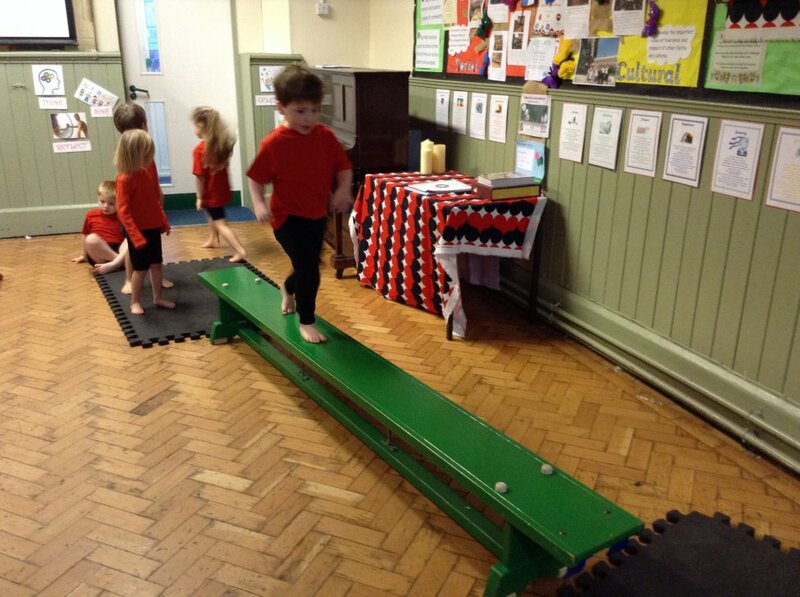 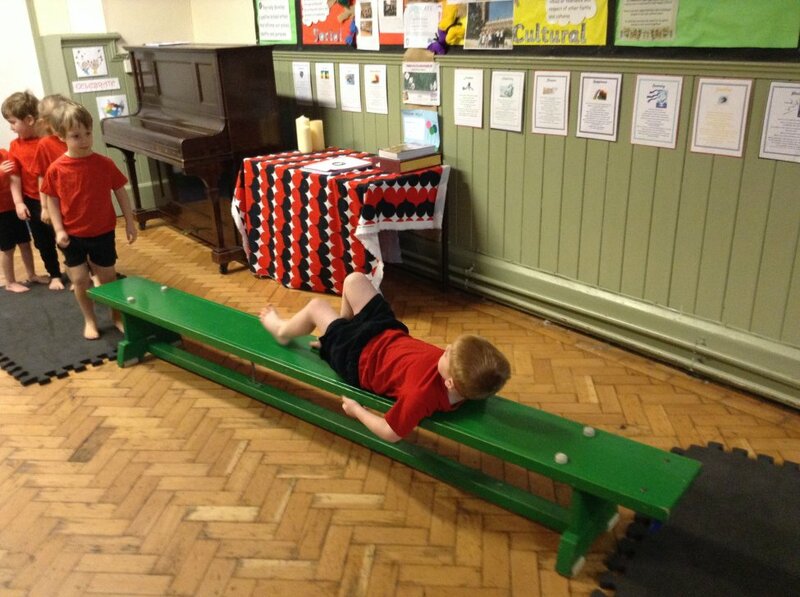 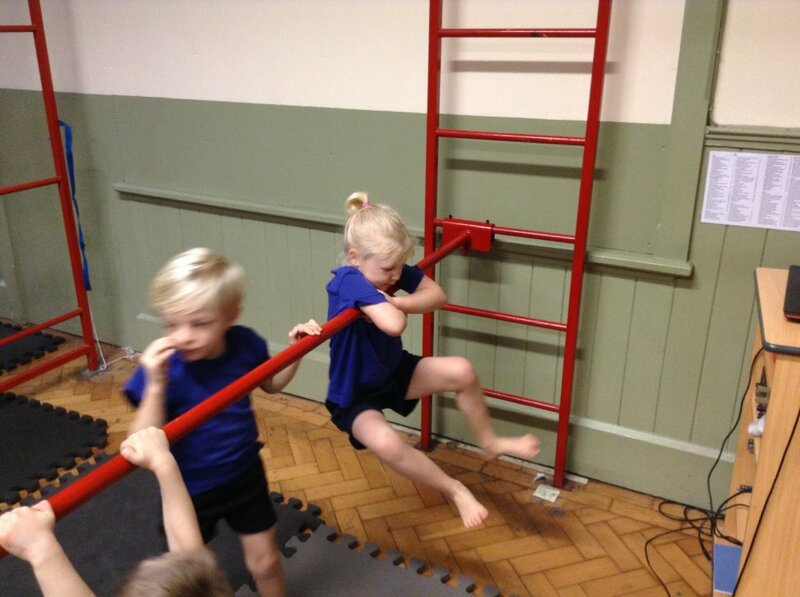 Several children managed to climb to the very top which was very brave, and many were able to balance along the balance beam all on their own. 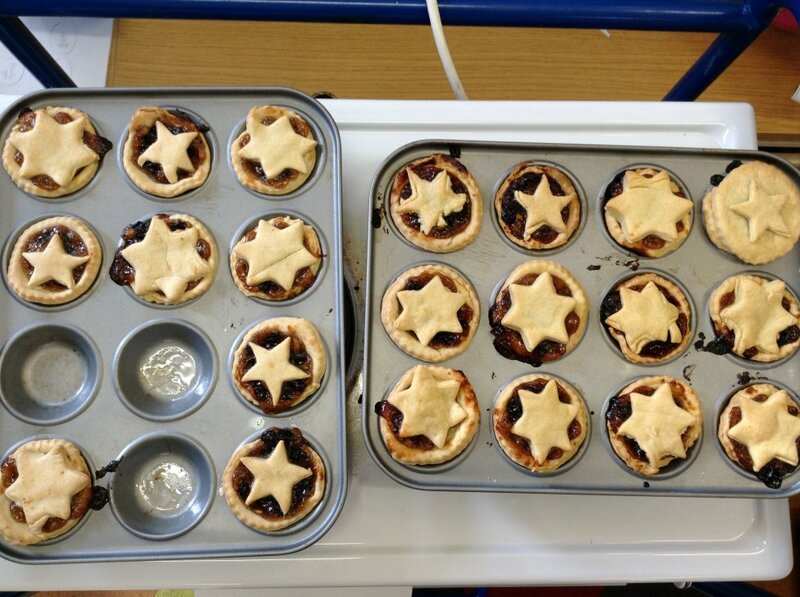 Well done Cherries. 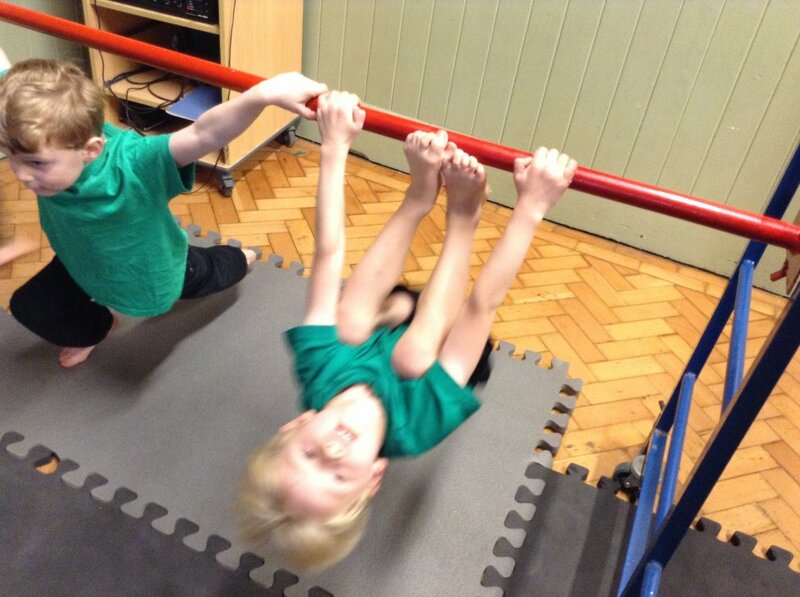 The apparatus will be out every Wednesday this term. 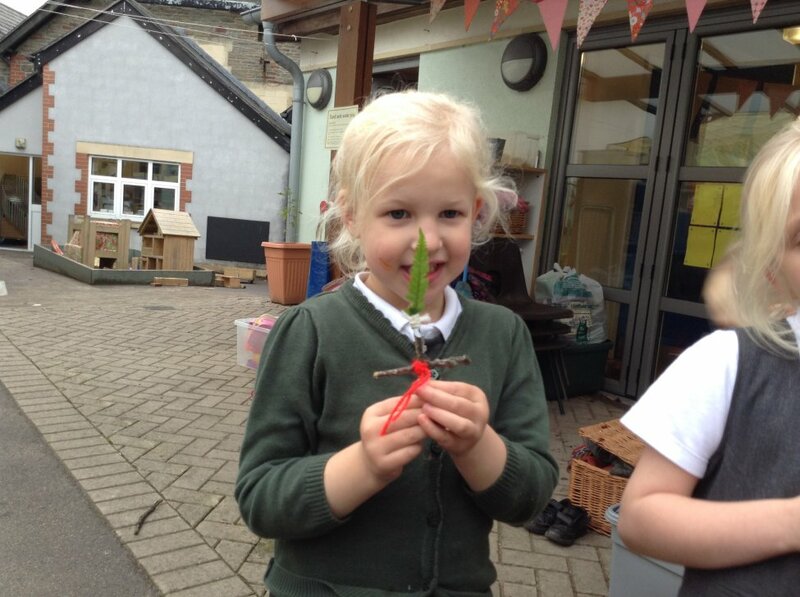 You may have heard that we had a mystery visitor this week... She left a trail of porridge and her hair ribbon was caught in the bushes by the lane. 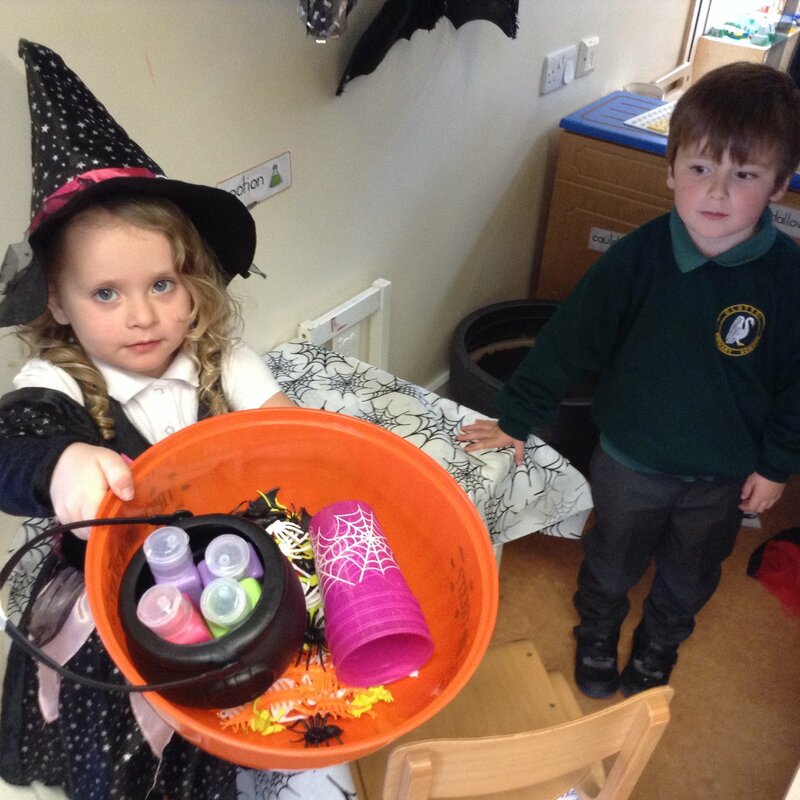 She also left her basket with a picture of a cottage in, a hairbrush and some porridge. 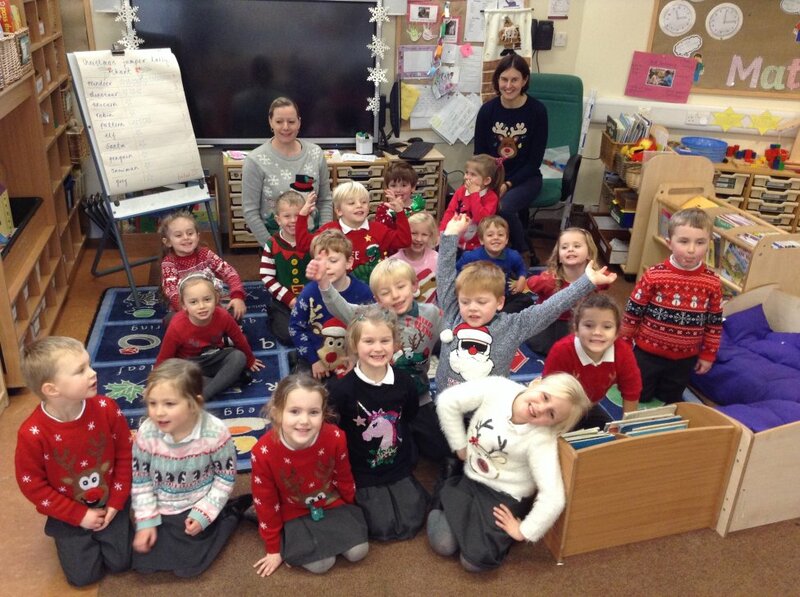 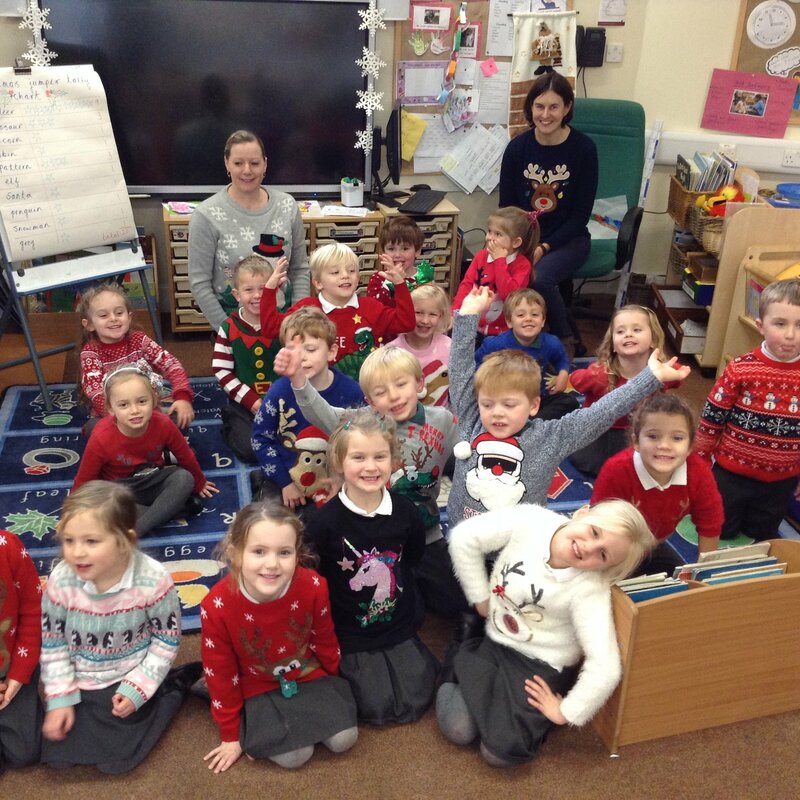 Then we discovered she had left a letter too, signed G.
What a fantastic end to the term - starting with Christmas Jumper Day and a tally chart of our different Christmas jumper designs. 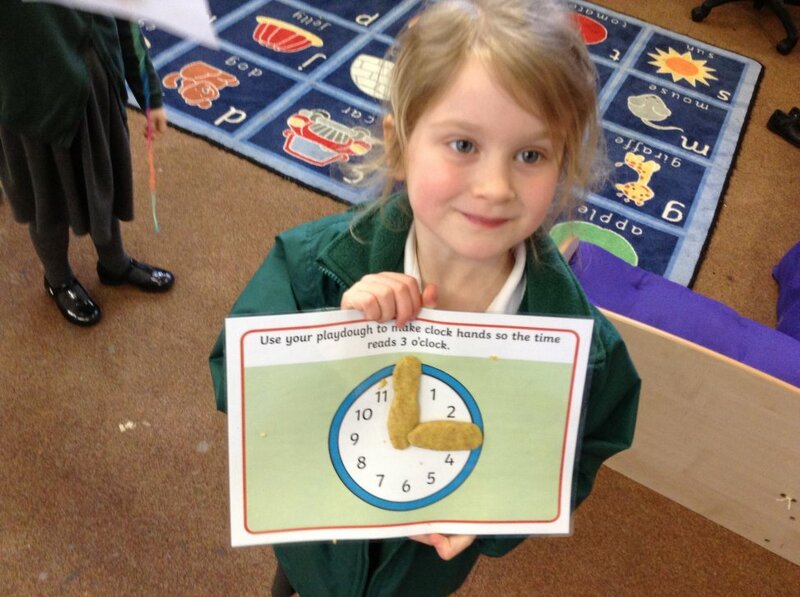 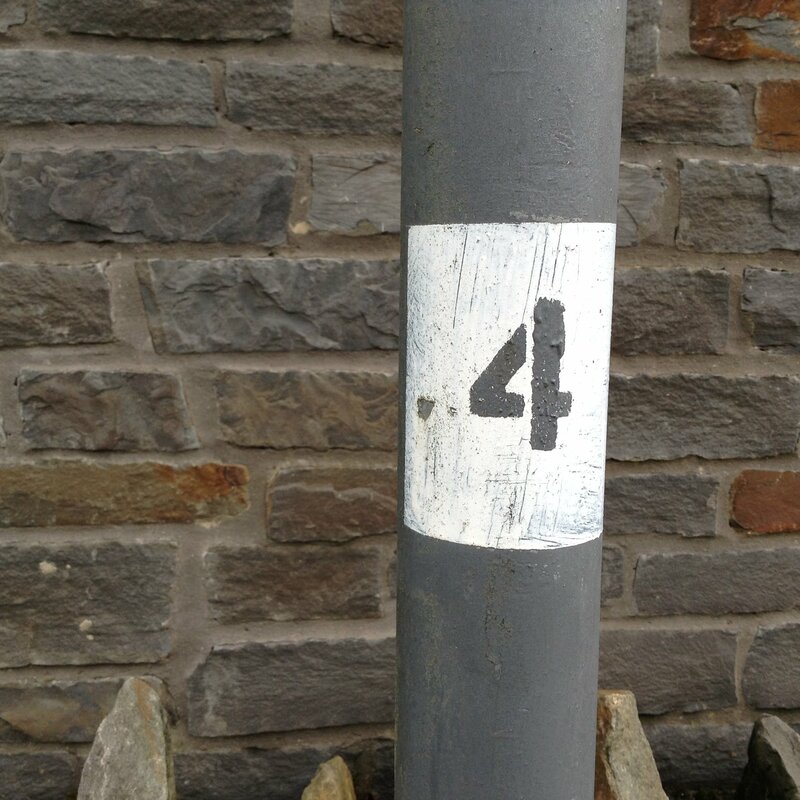 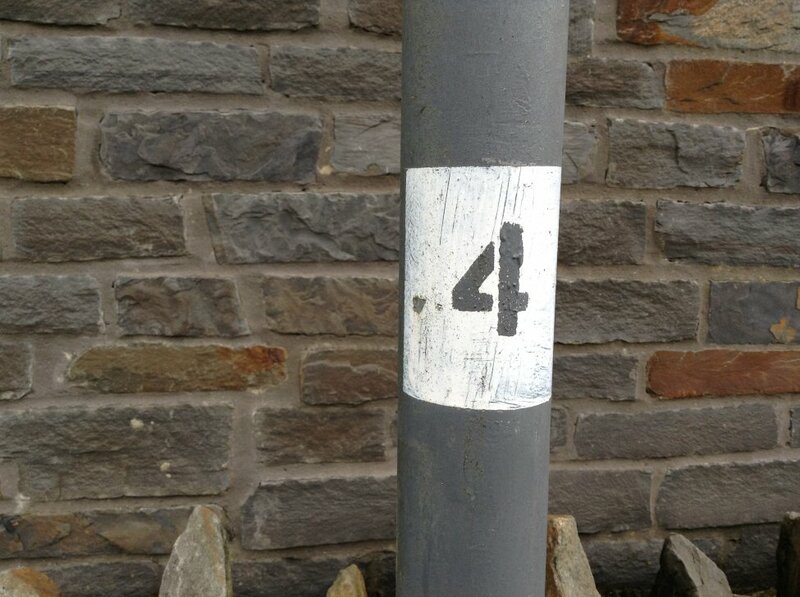 (We had to squeeze in some Maths this week!). 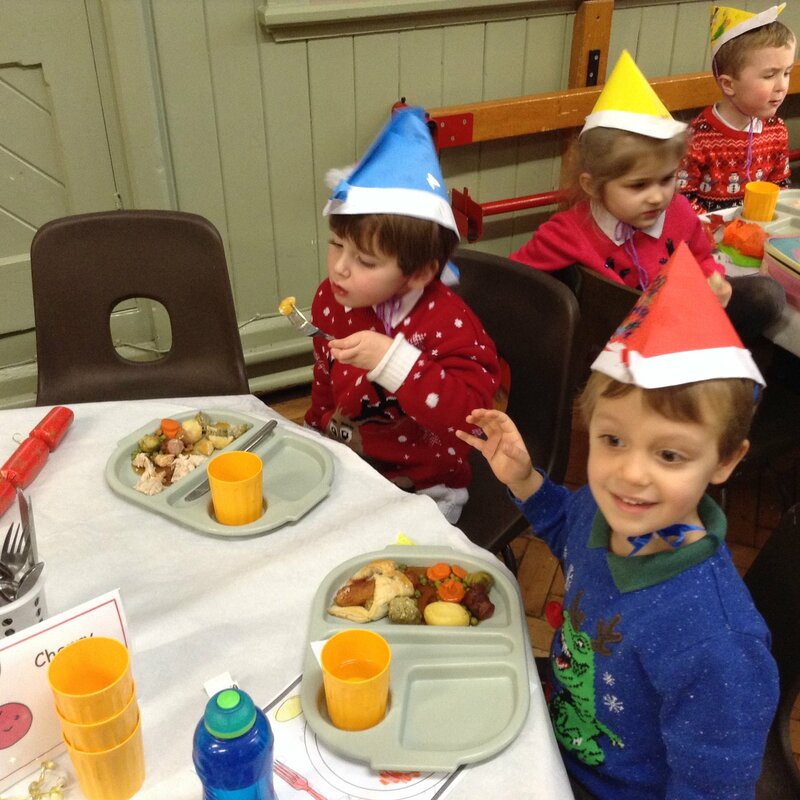 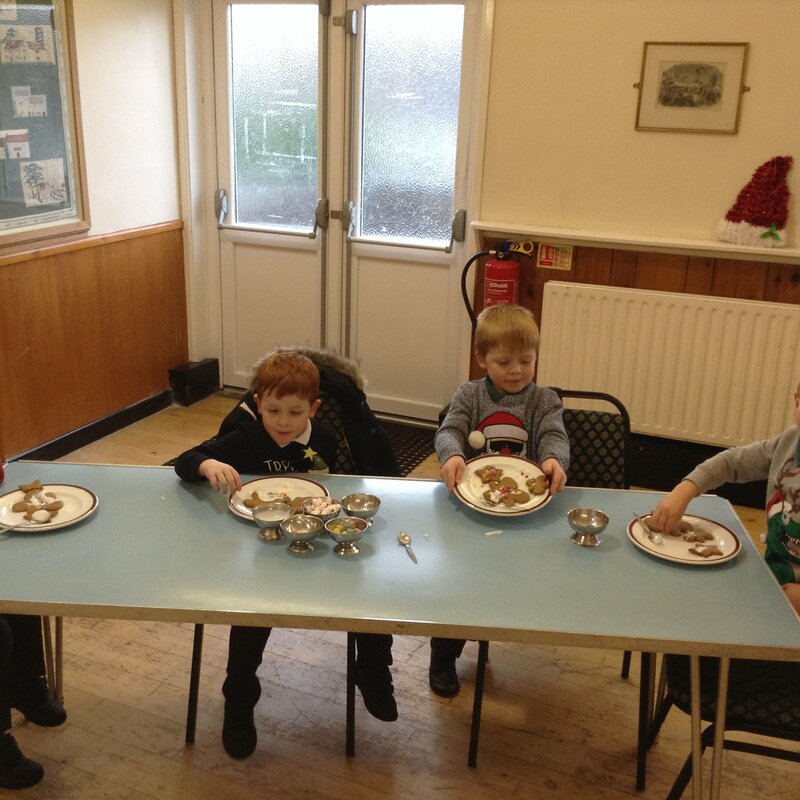 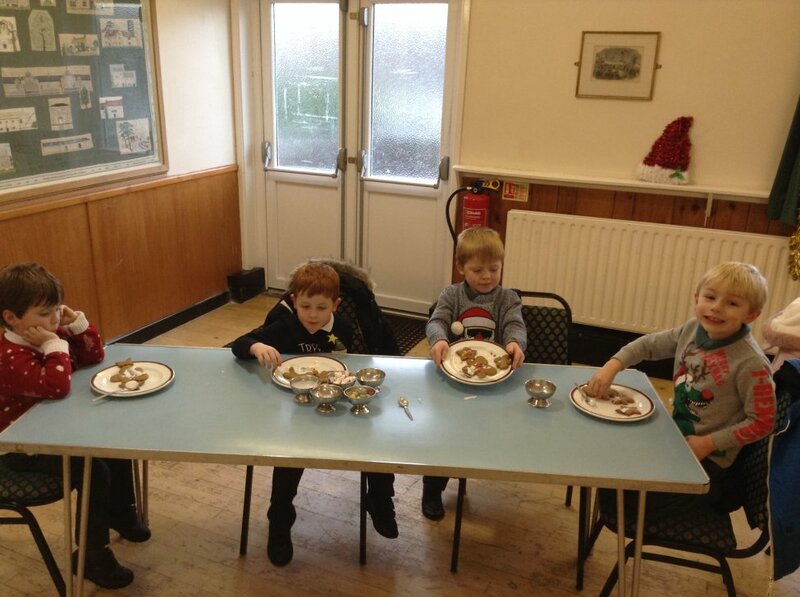 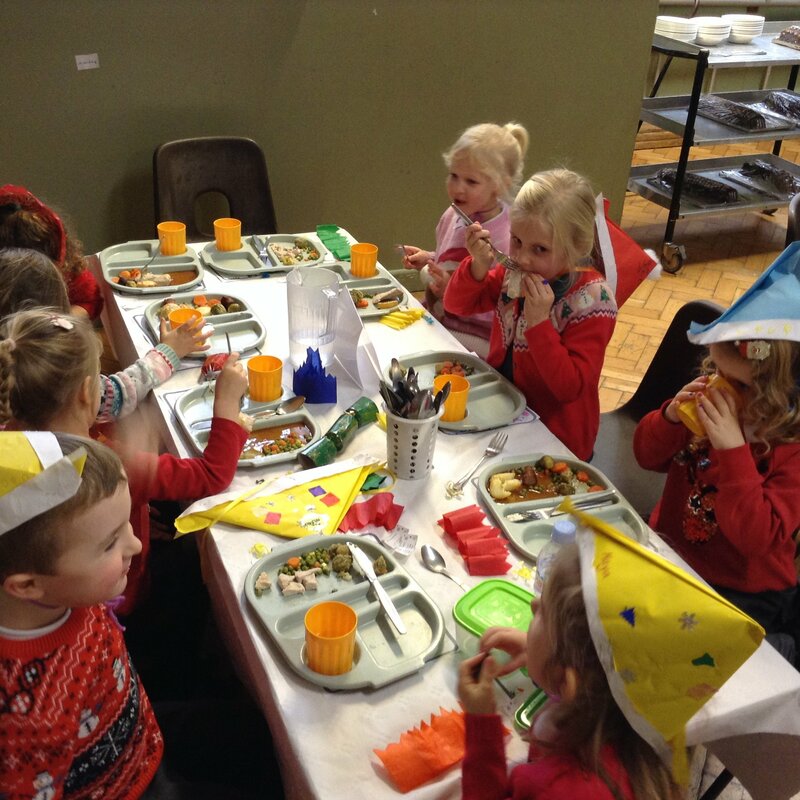 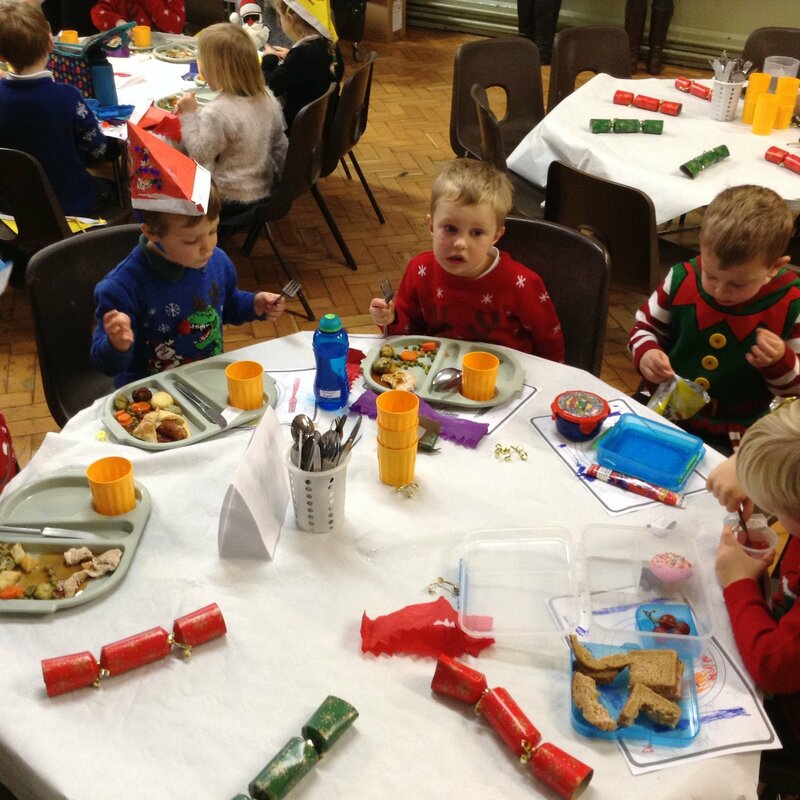 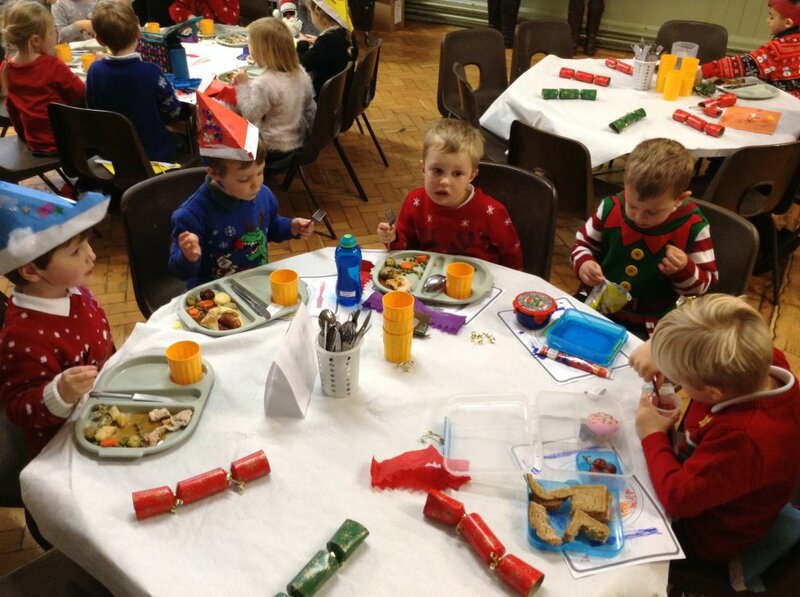 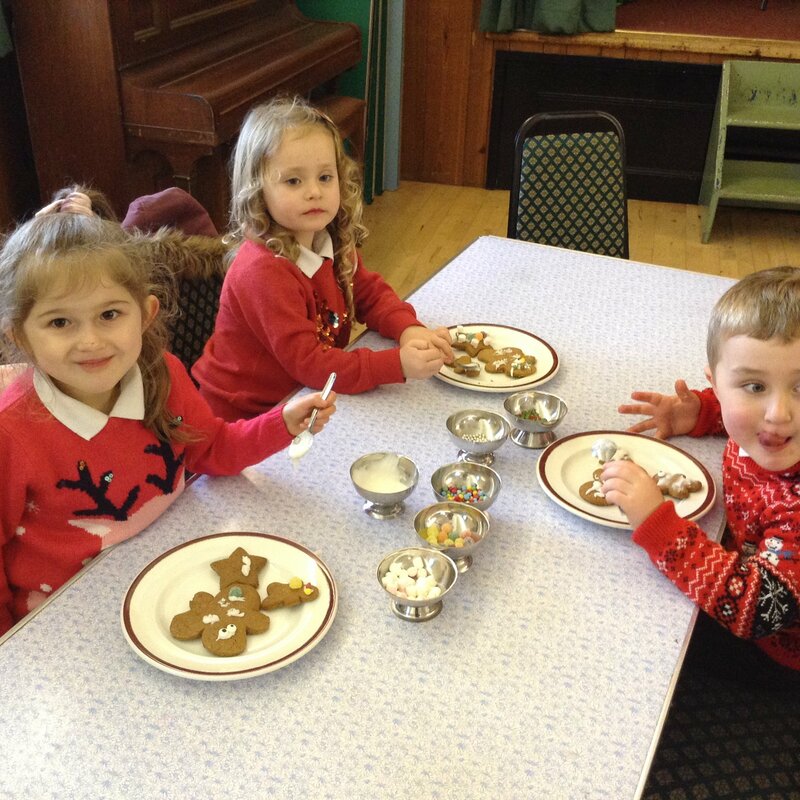 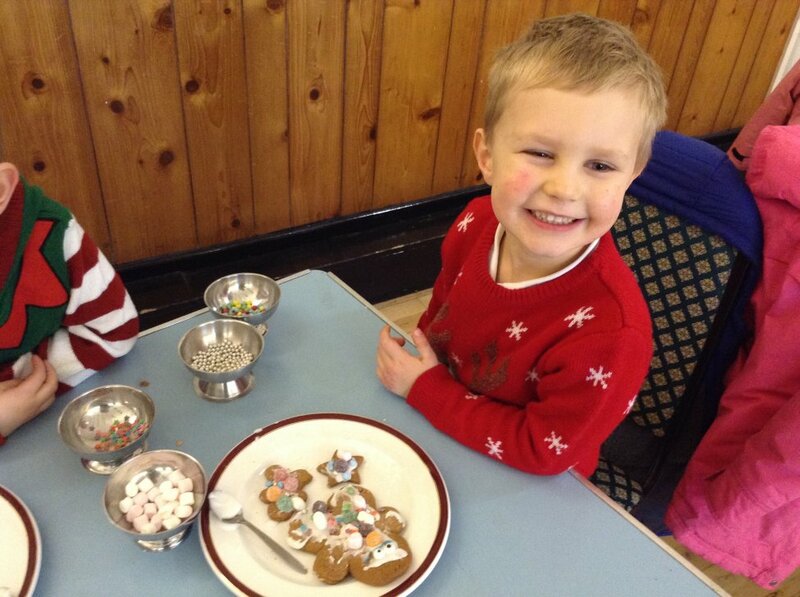 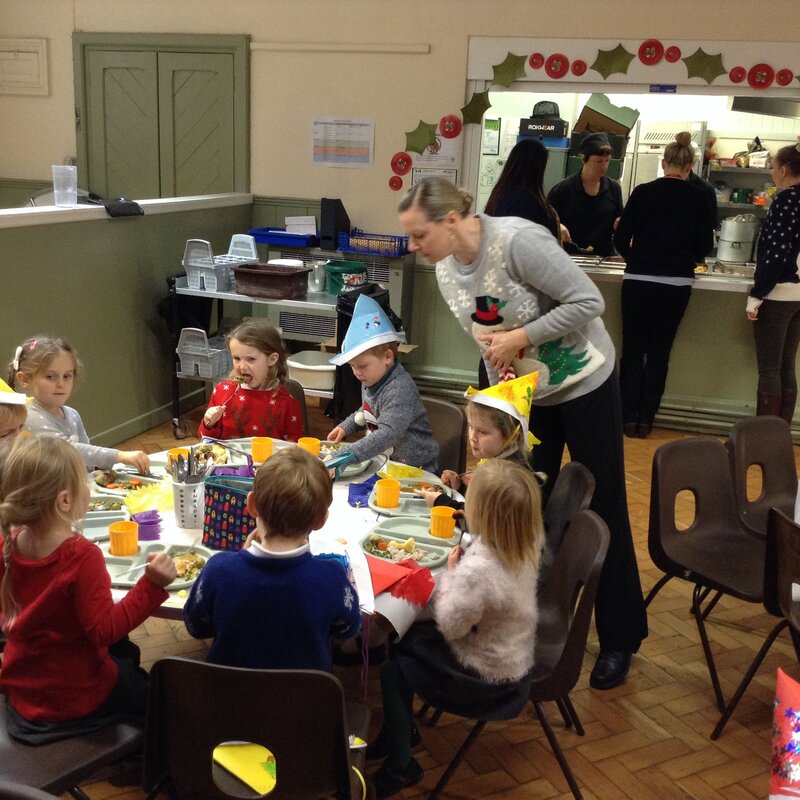 We made mince pies, had a story-telling visit from Mrs M and her harp, had our Christmas lunch and decorated gingerbread biscuits at the village hall - with some skittles too. 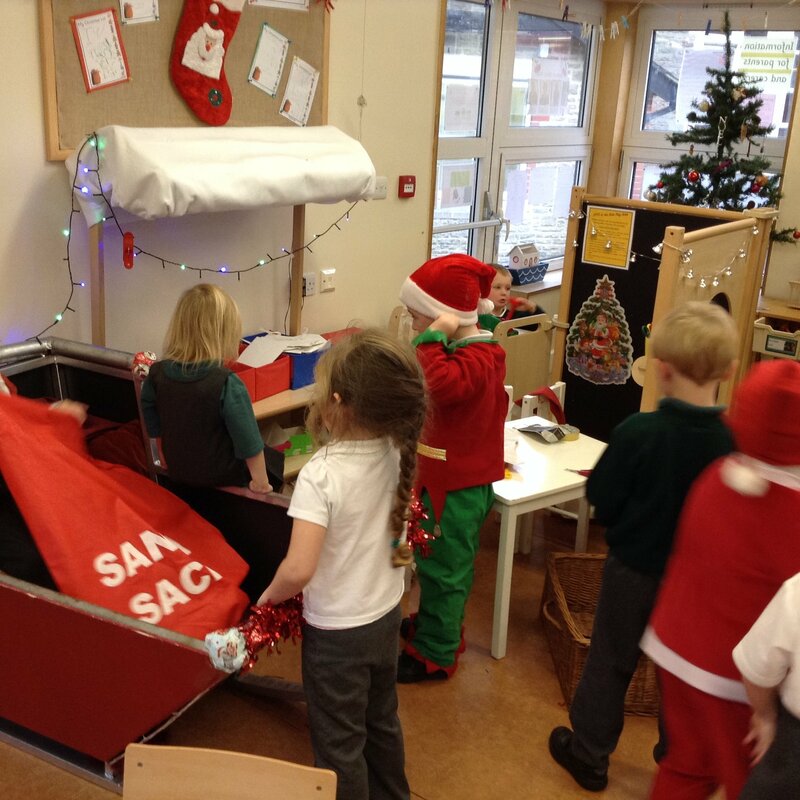 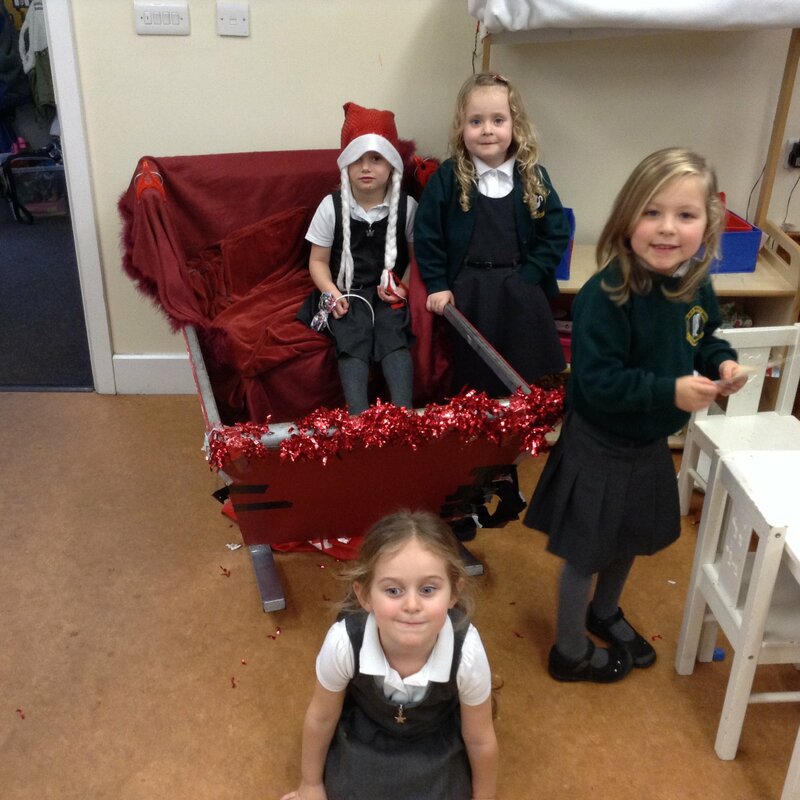 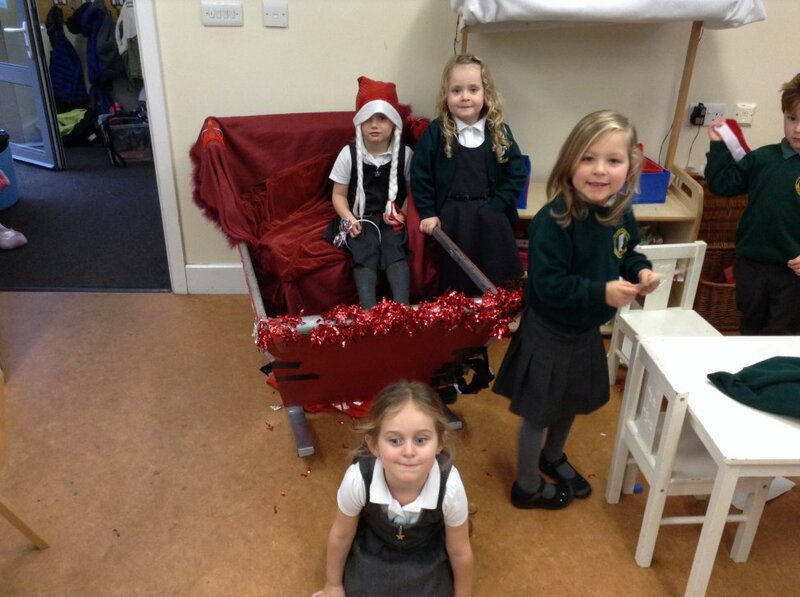 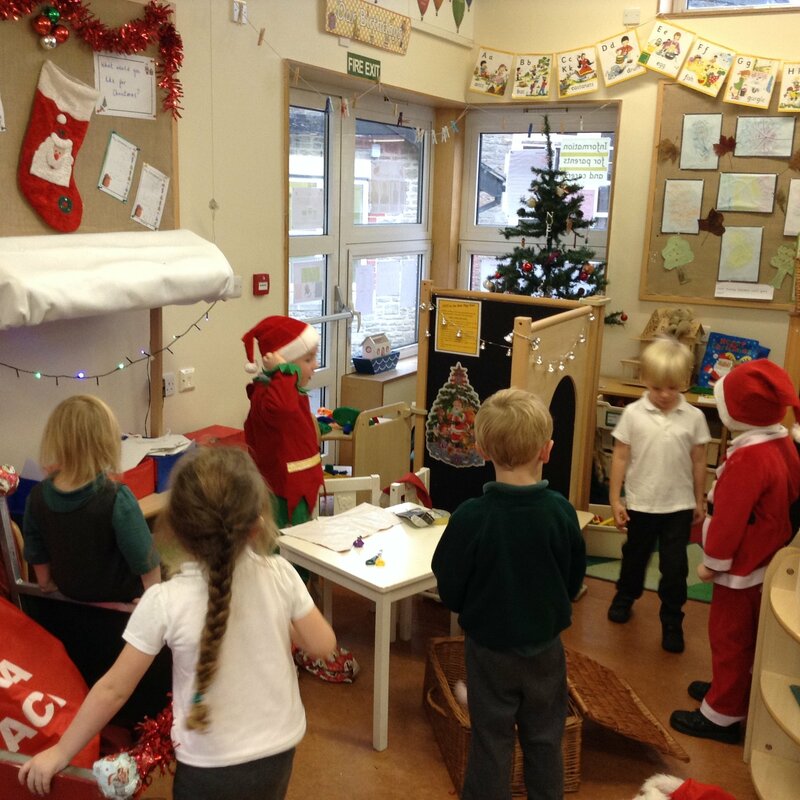 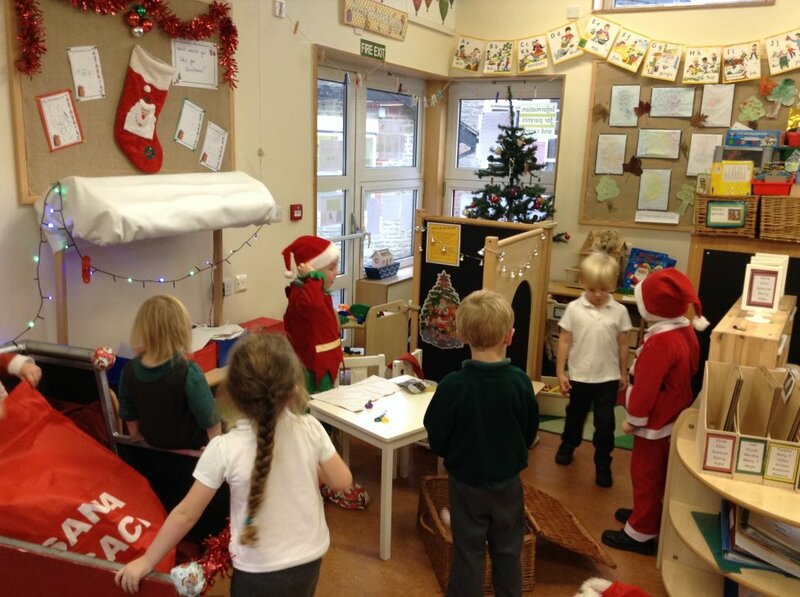 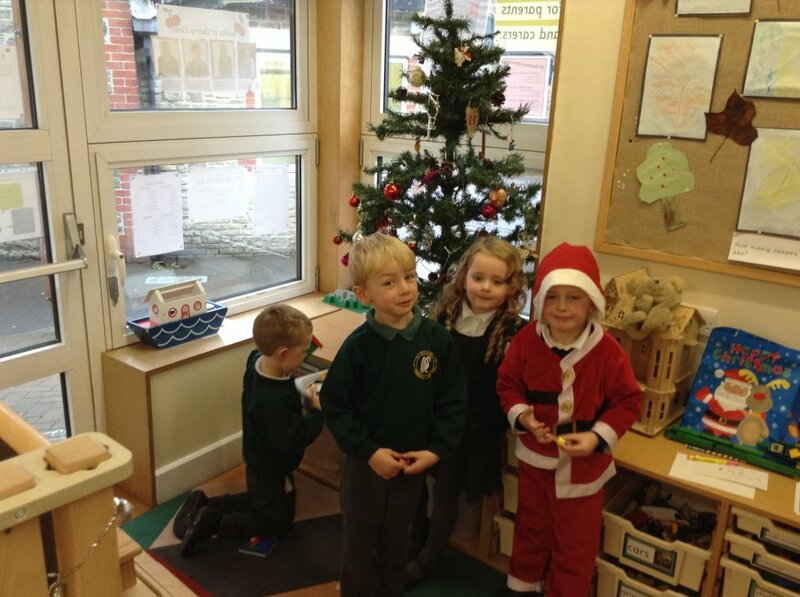 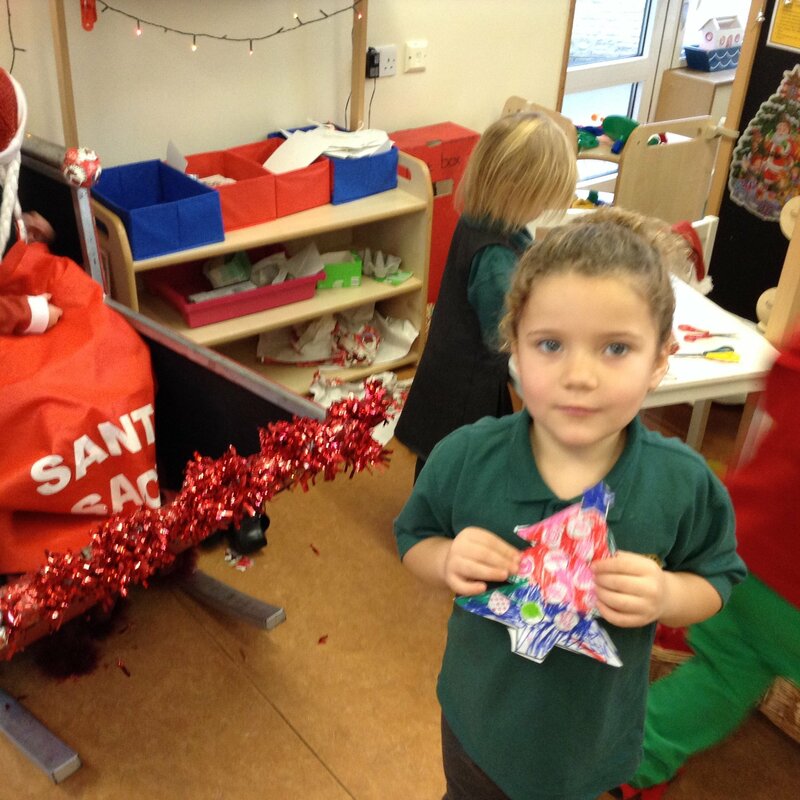 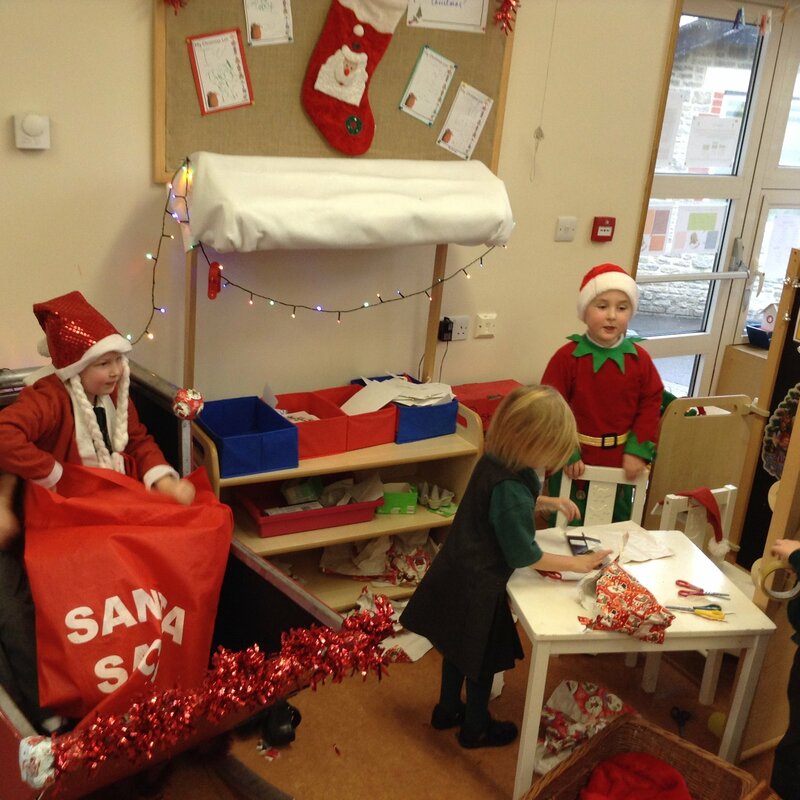 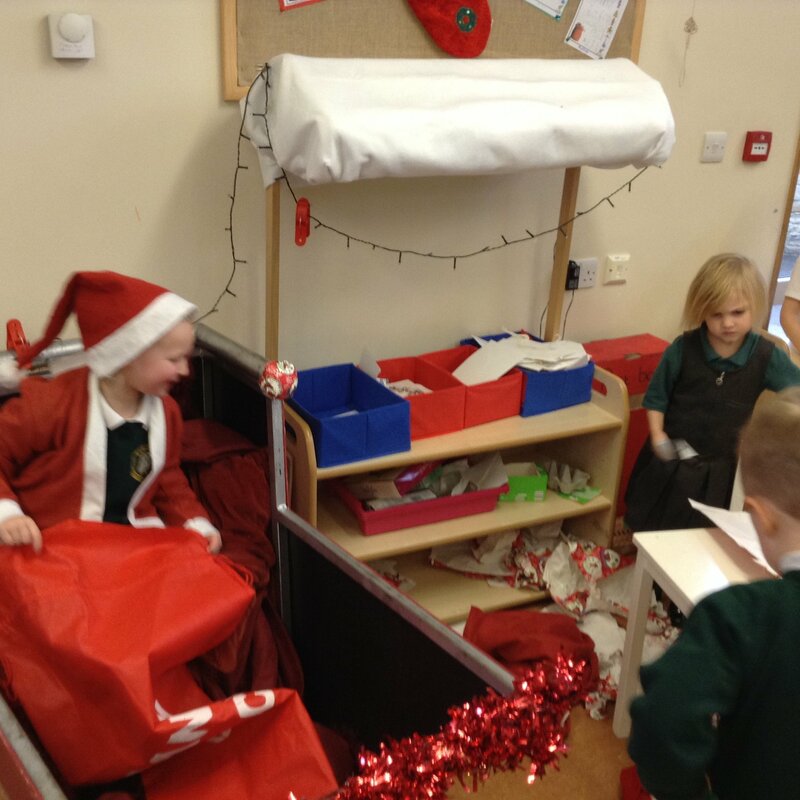 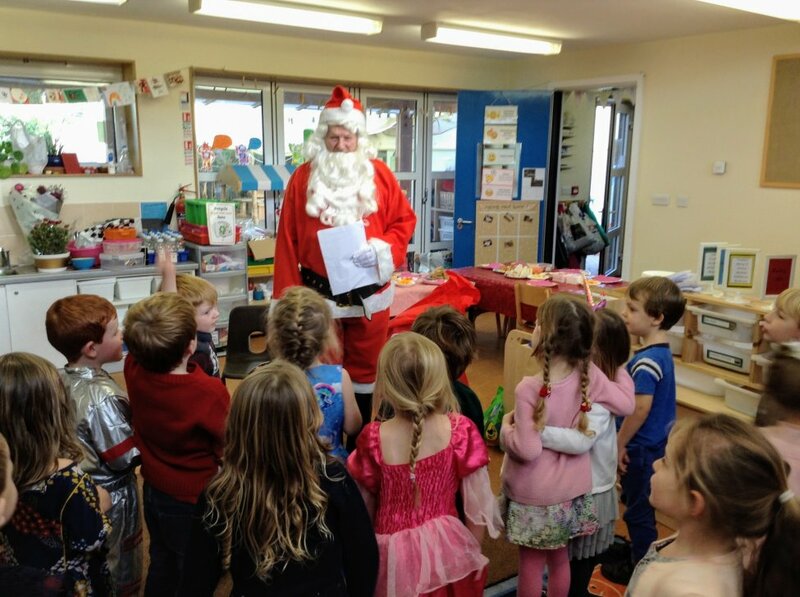 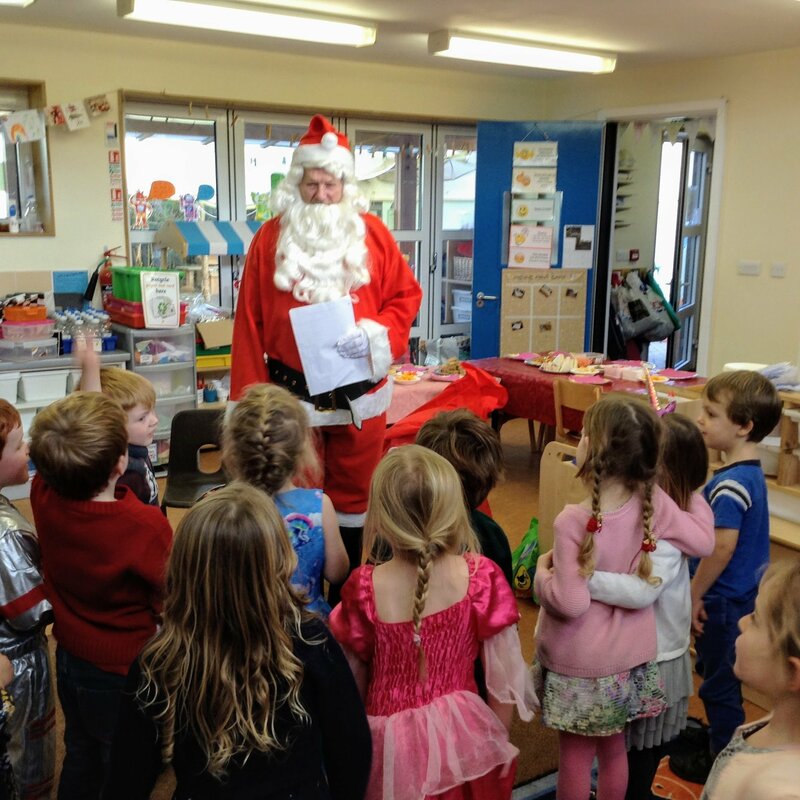 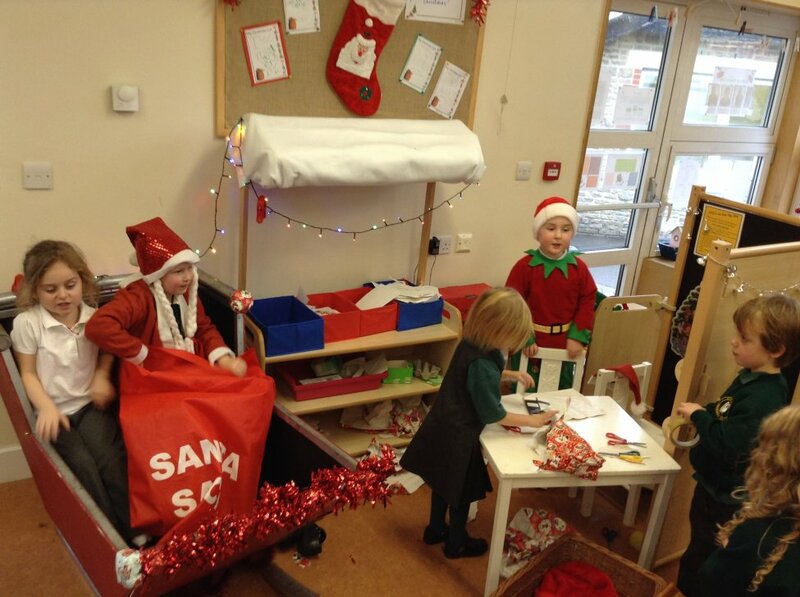 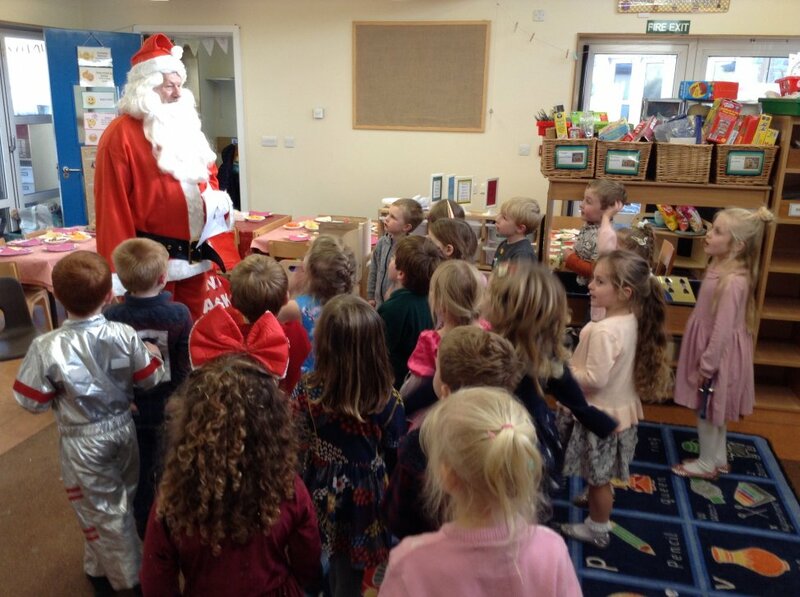 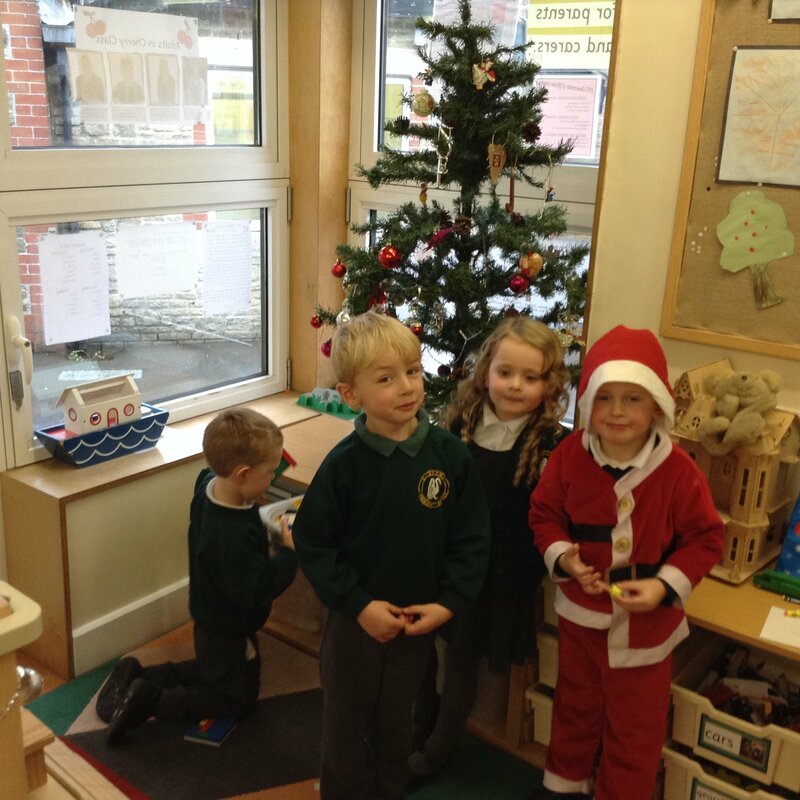 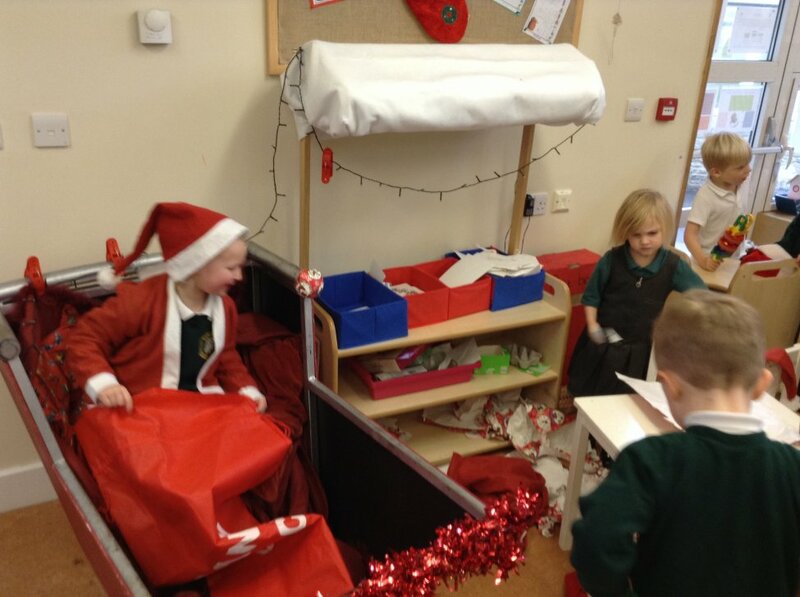 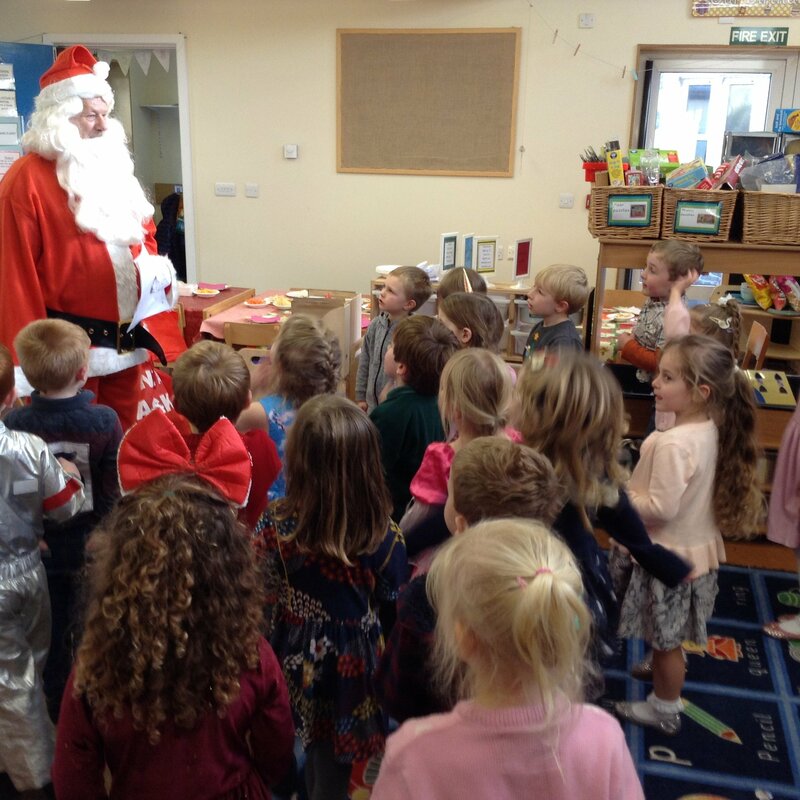 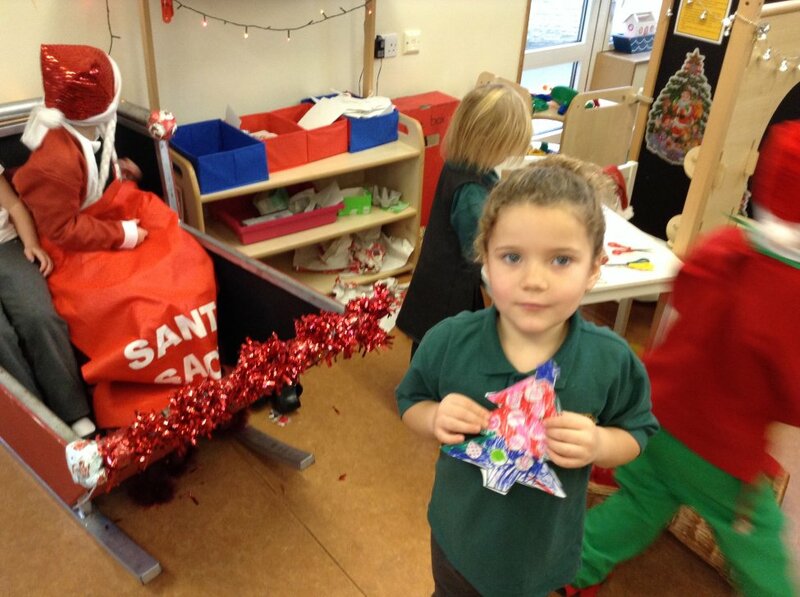 We ended the term with a visit from Father Christmas and a very happy class Christmas party. 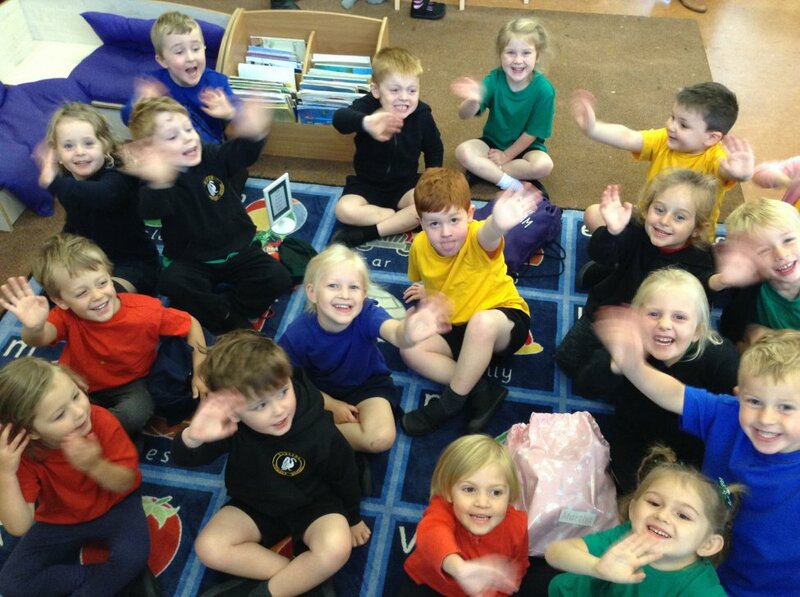 Thank you for all your generous presents and kind words. 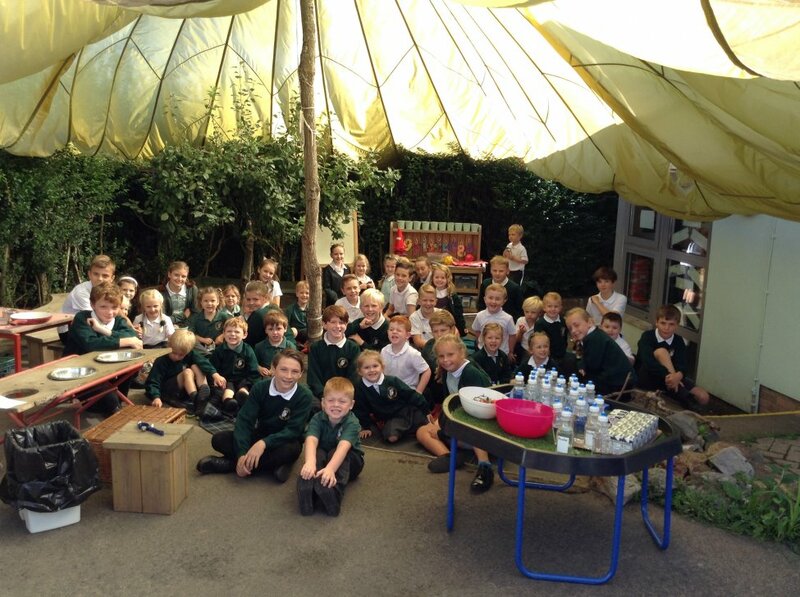 We all felt very overwhelmed by your kindness and generosity. 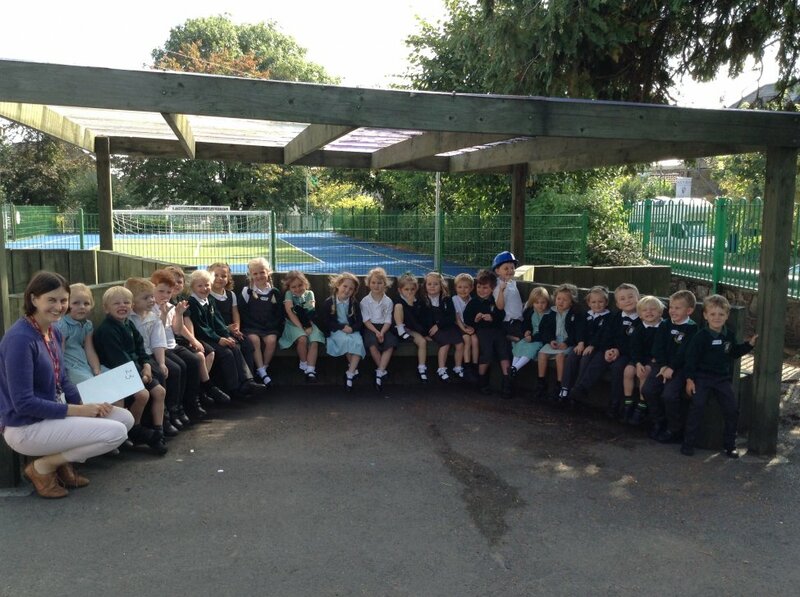 The past couple of weeks have flown by! 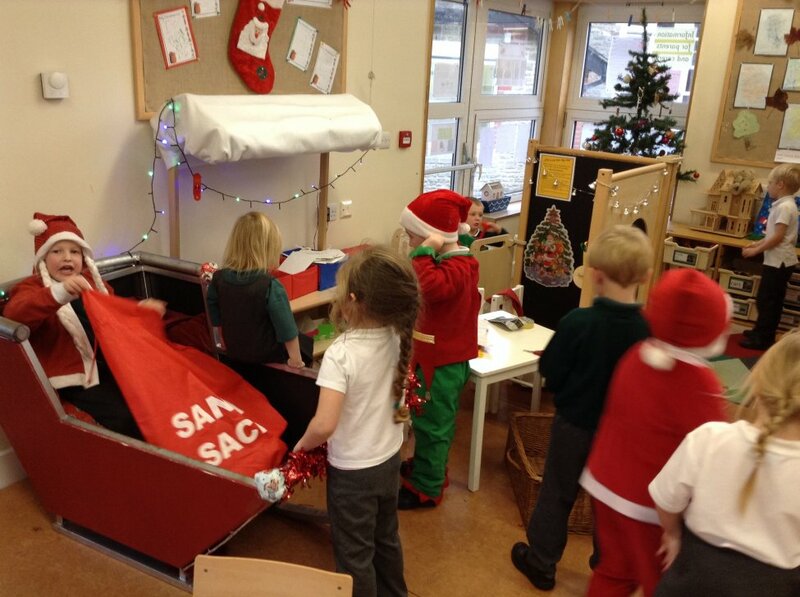 Our highlights were: a visit from Mrs V who told us all about bats, making dens for nocturnal animals outside, changing the role play into Santa's Post Office, preparing for our Nativity performance and learning our Christmas songs. 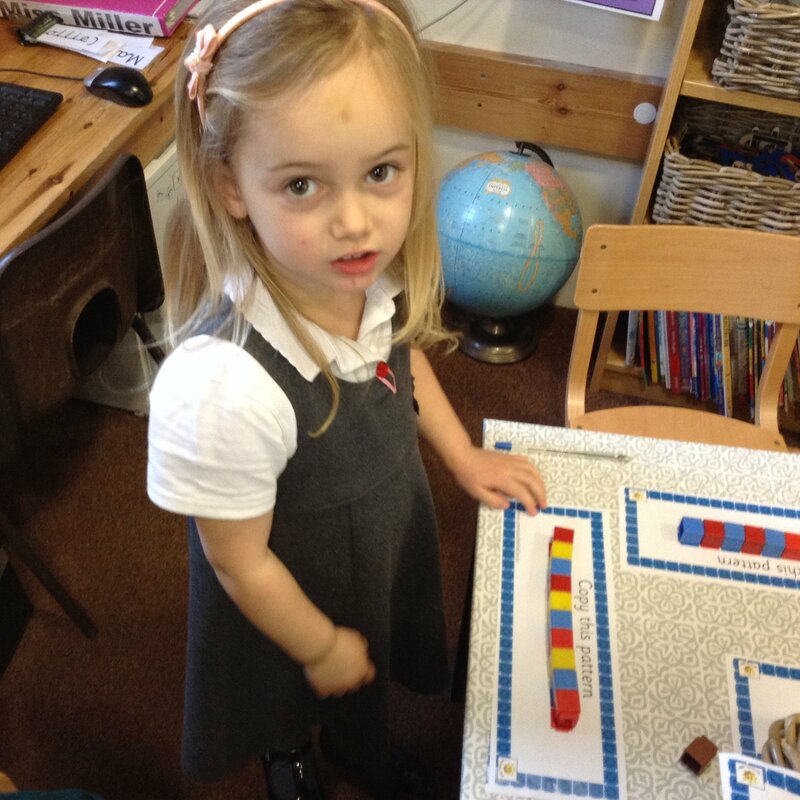 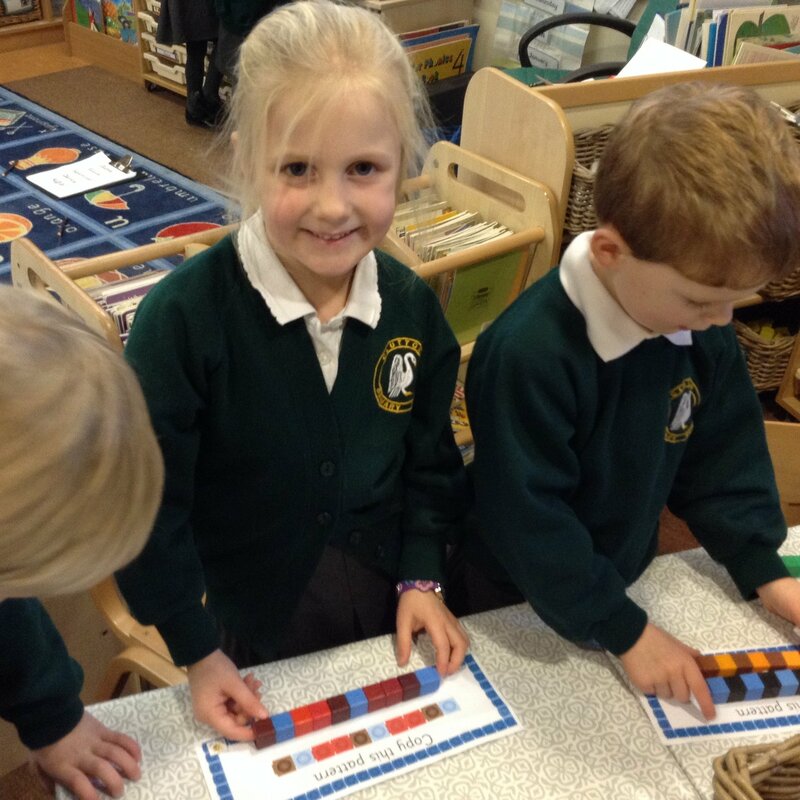 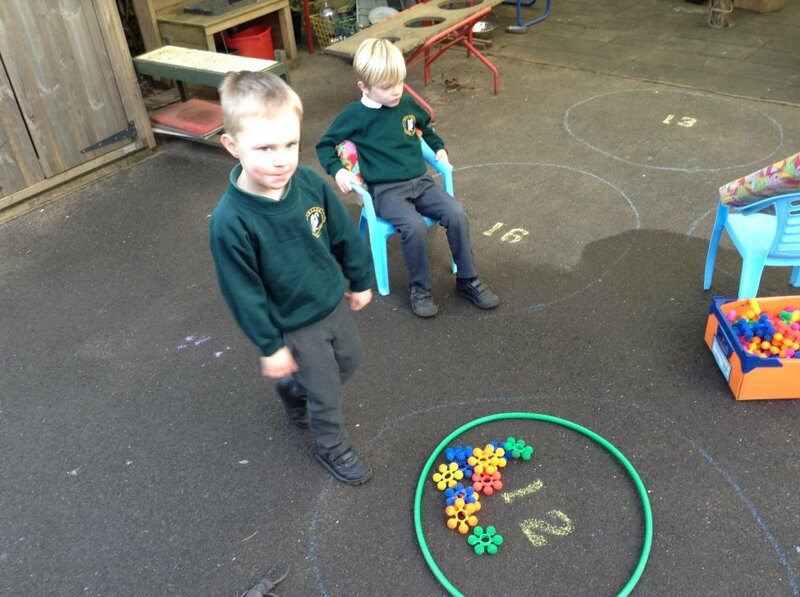 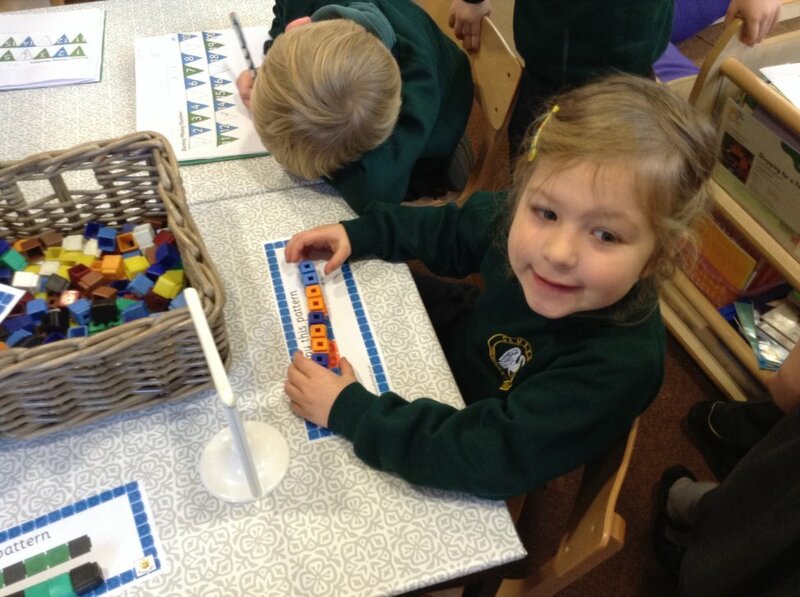 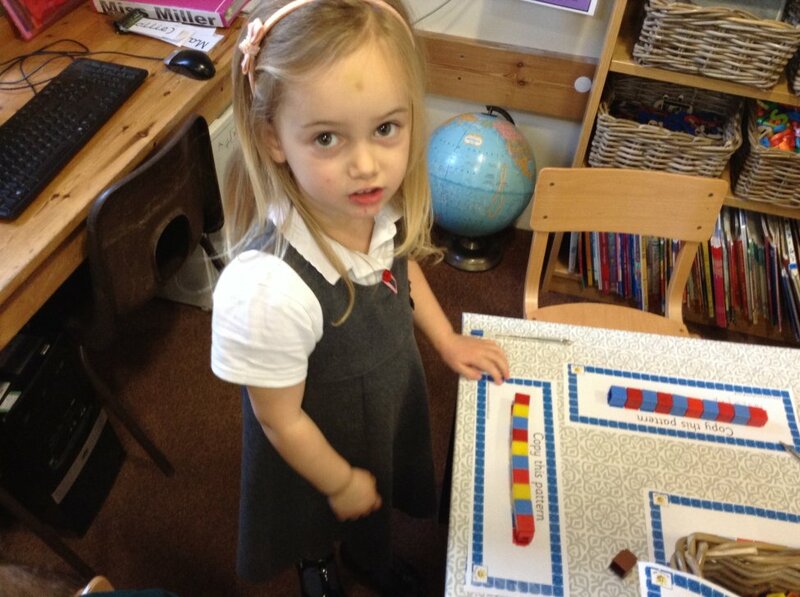 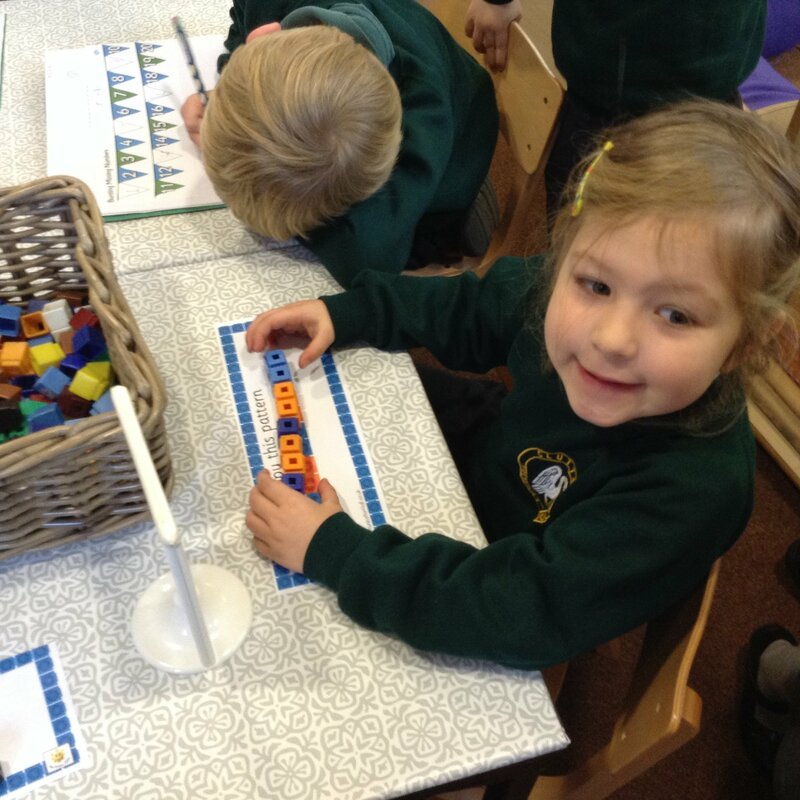 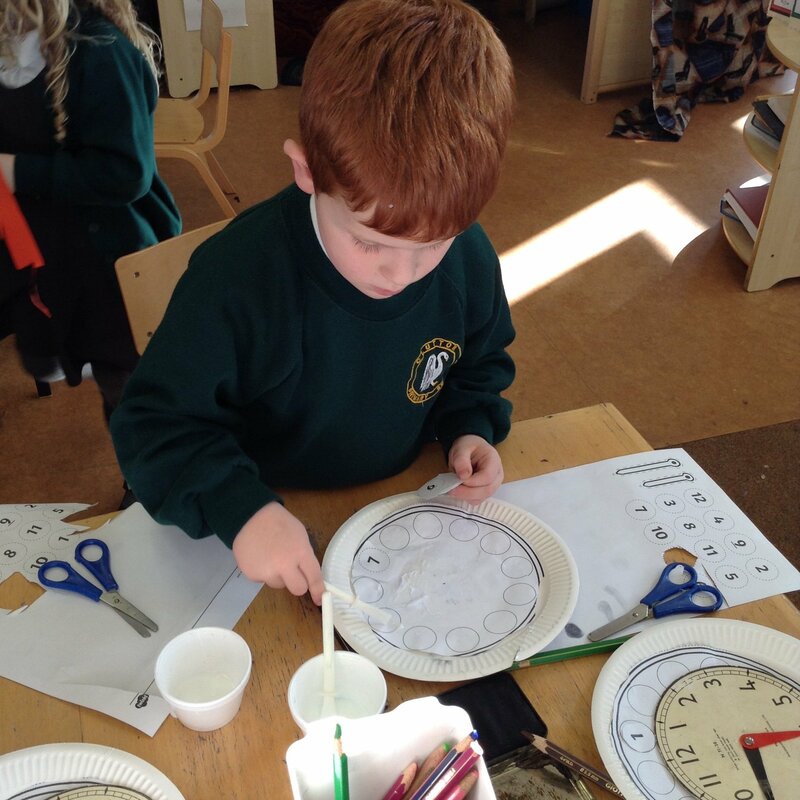 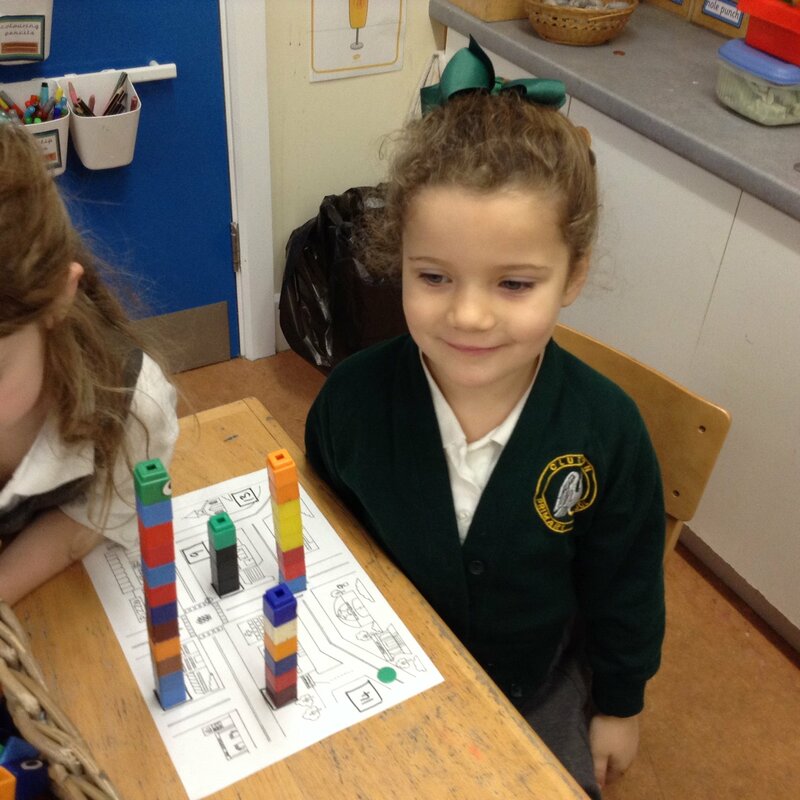 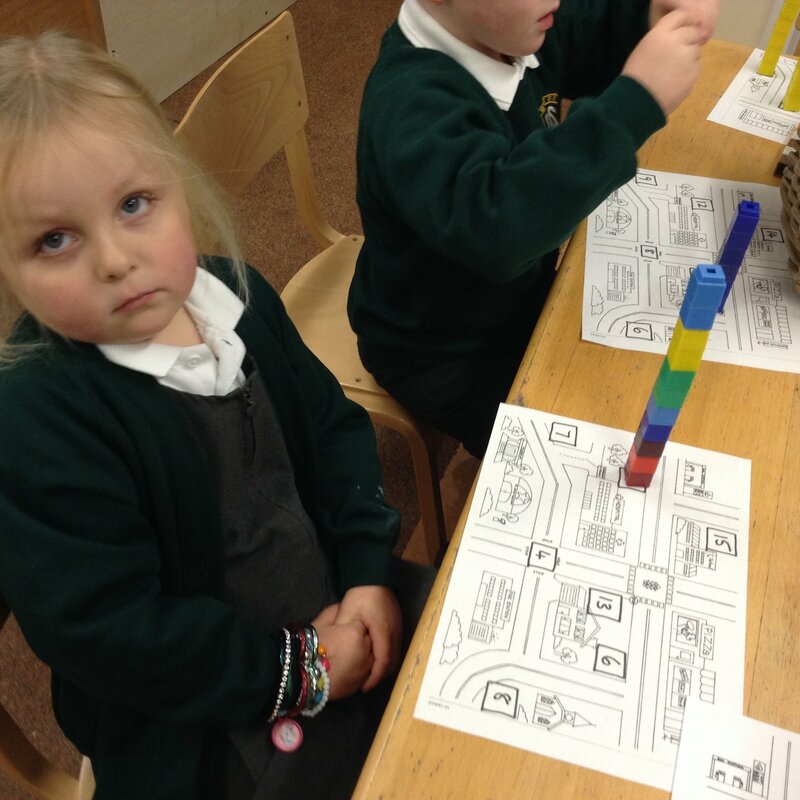 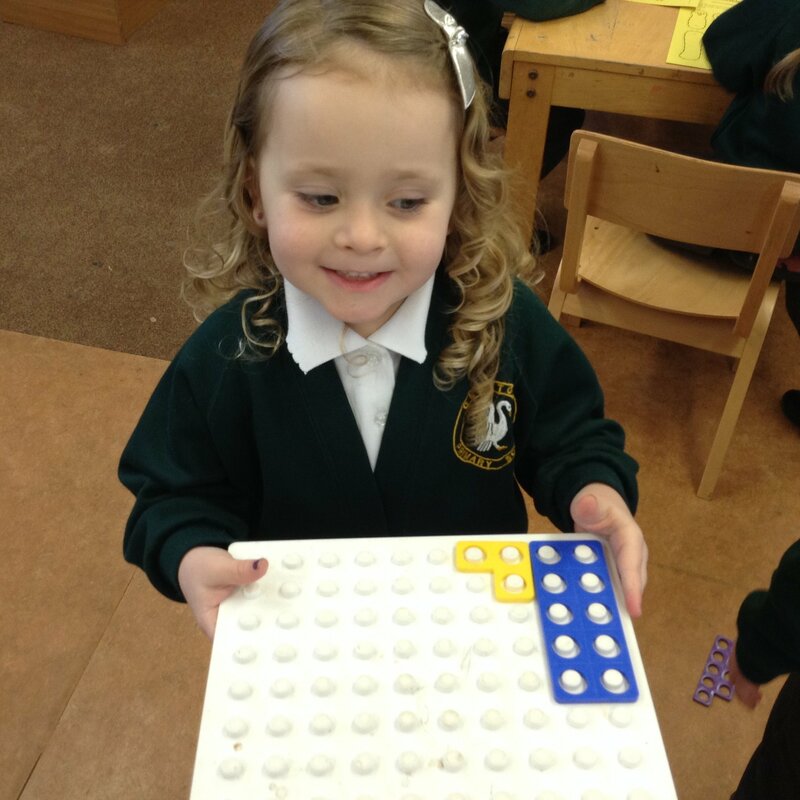 In maths we have been learning to measure (using cubes), ordering numbers on a clock face and starting to tell the time. 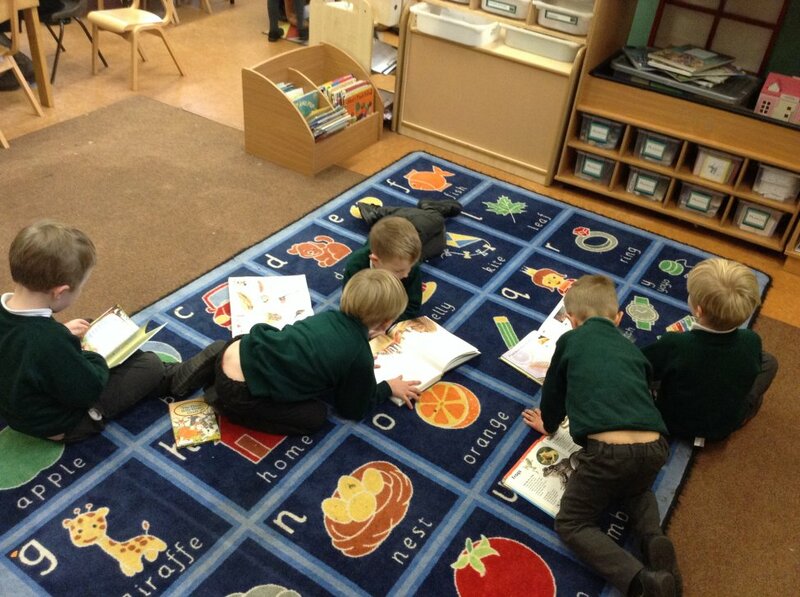 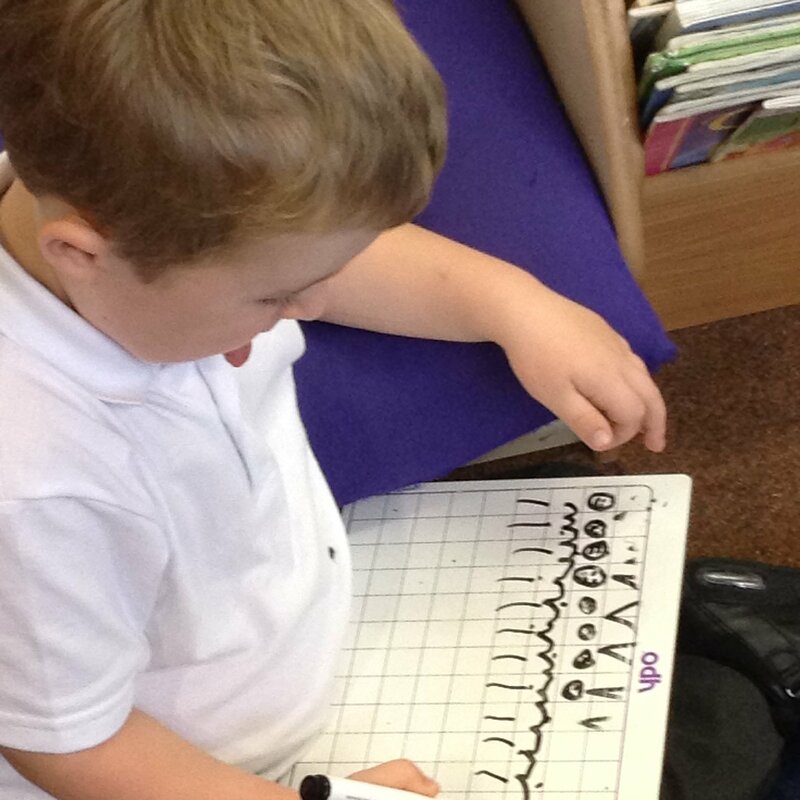 In phonics we have learnt sh, th, ch and ng and have been pratising using all our sounds in our reading and writing. 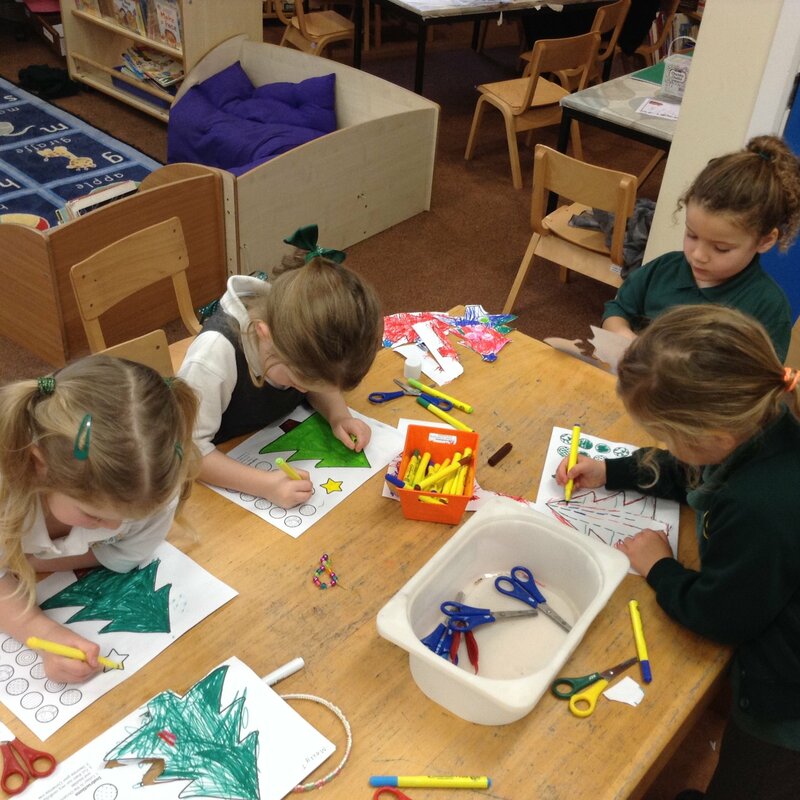 We have had two house activities too: in our house groups we made Christmas decorations for the school Christmas tree which looks gorgeous - come and see it in the school office. 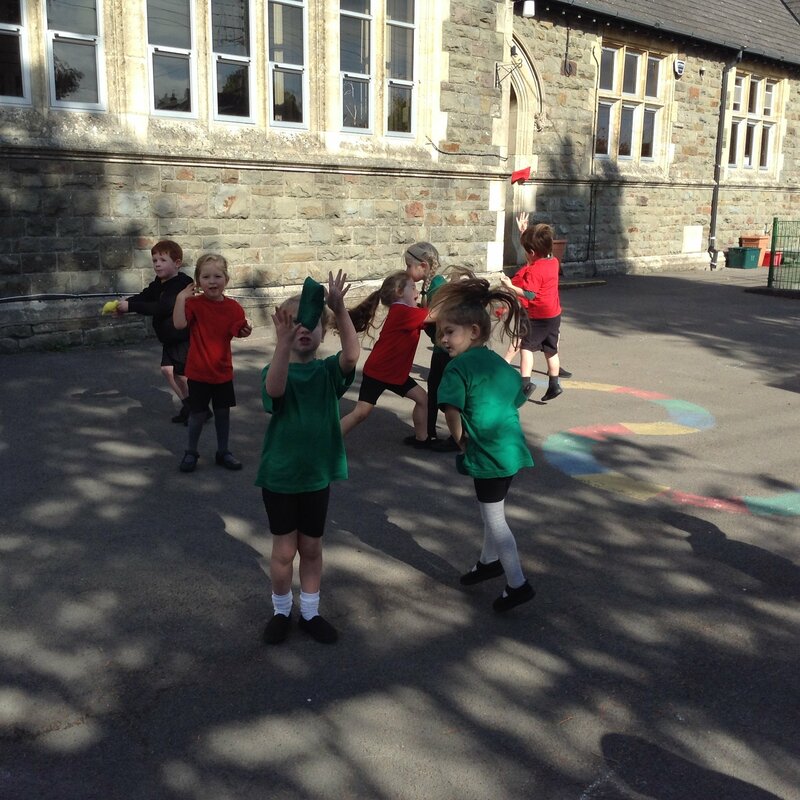 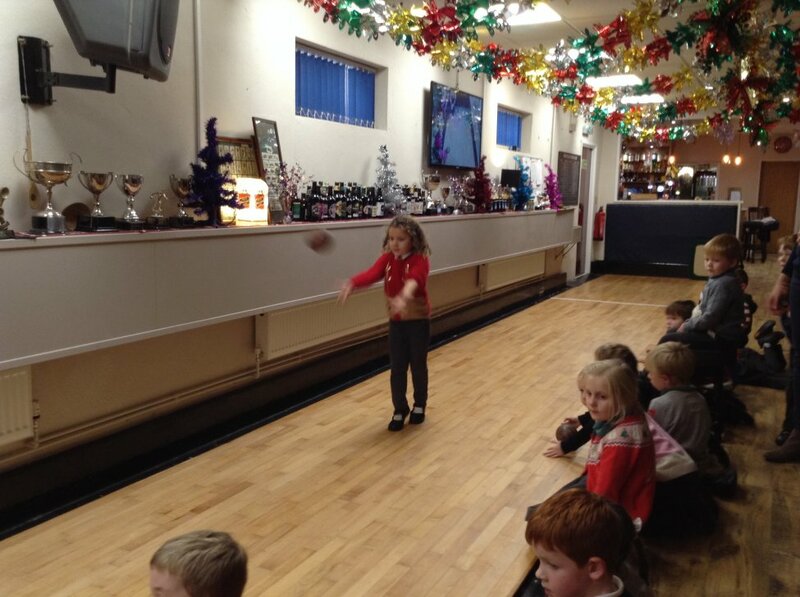 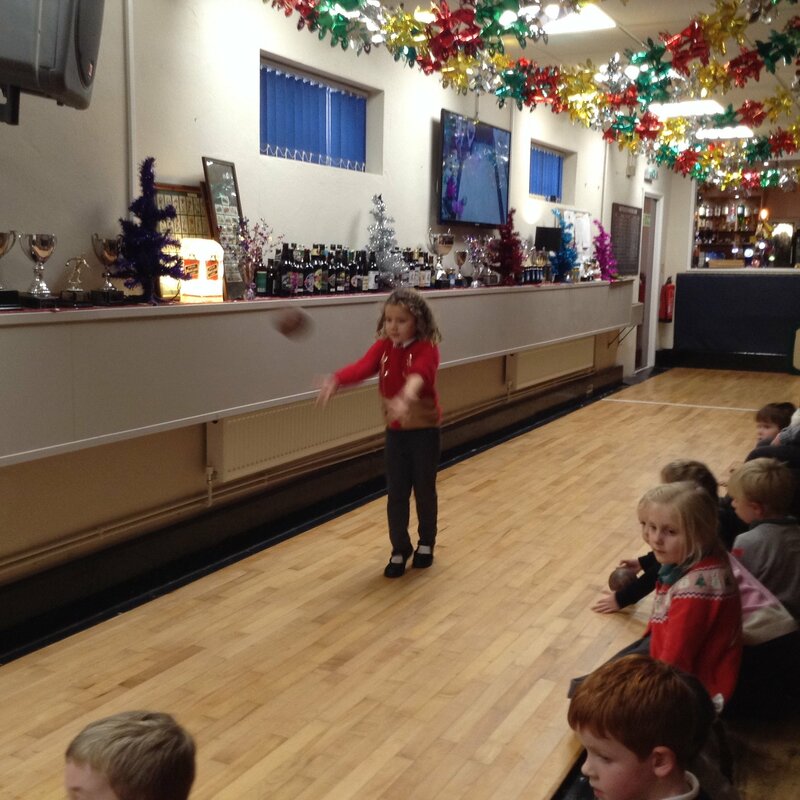 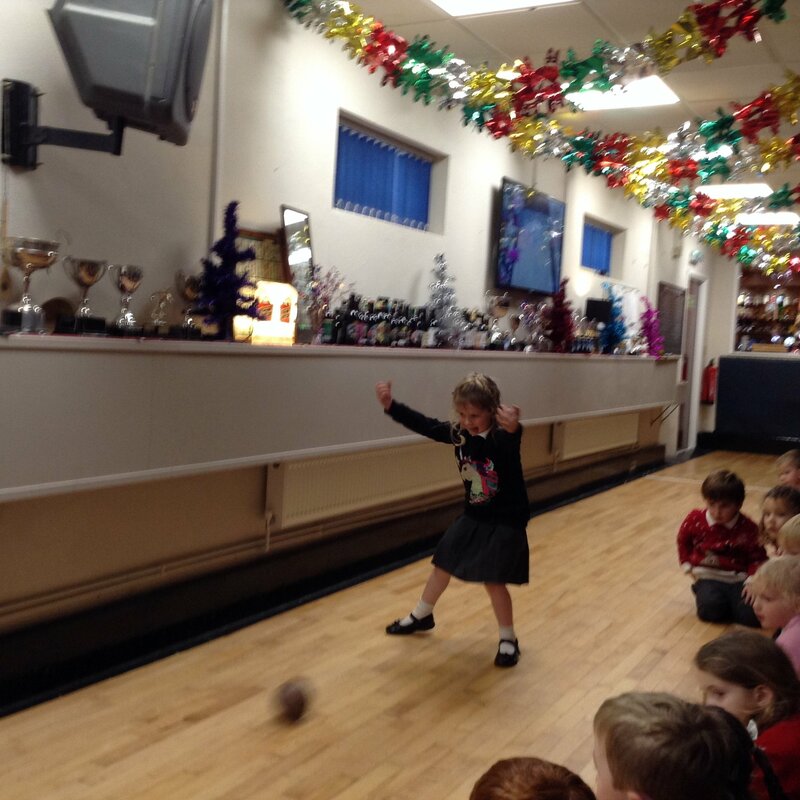 We also had a sports afternoon in our house groups raising money for the NSPCC. 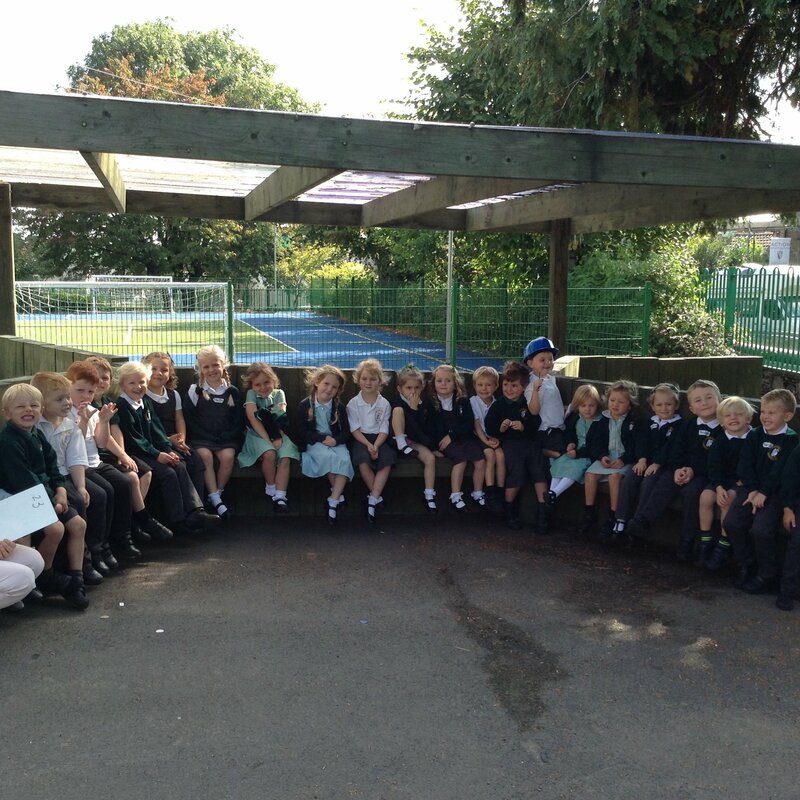 As a school we raised nearly £300 and Cherry Class were given a special certificate for returning the largest number of sponser forms. 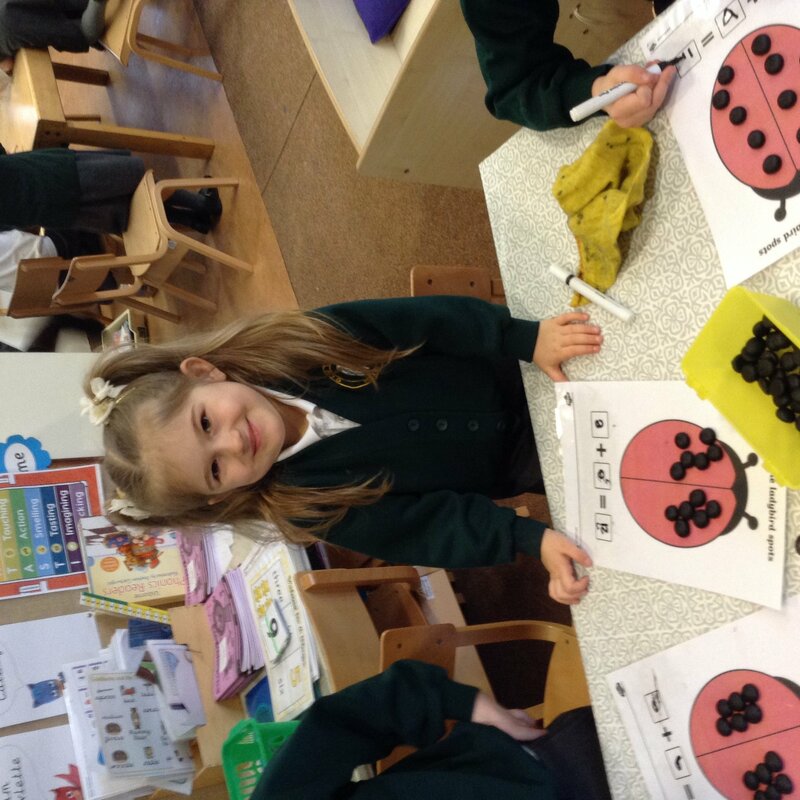 Well done Cherries! 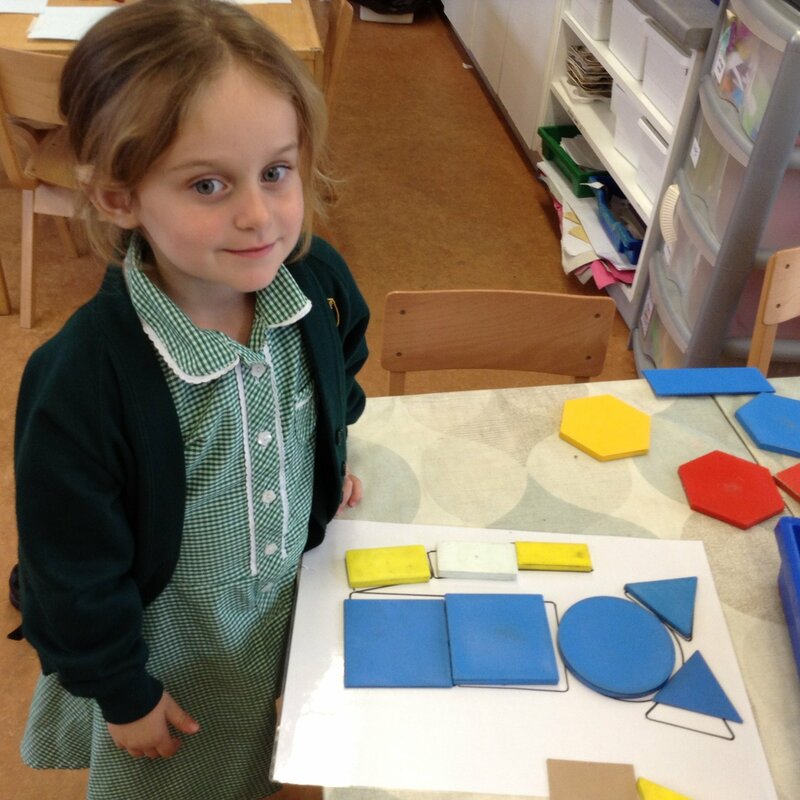 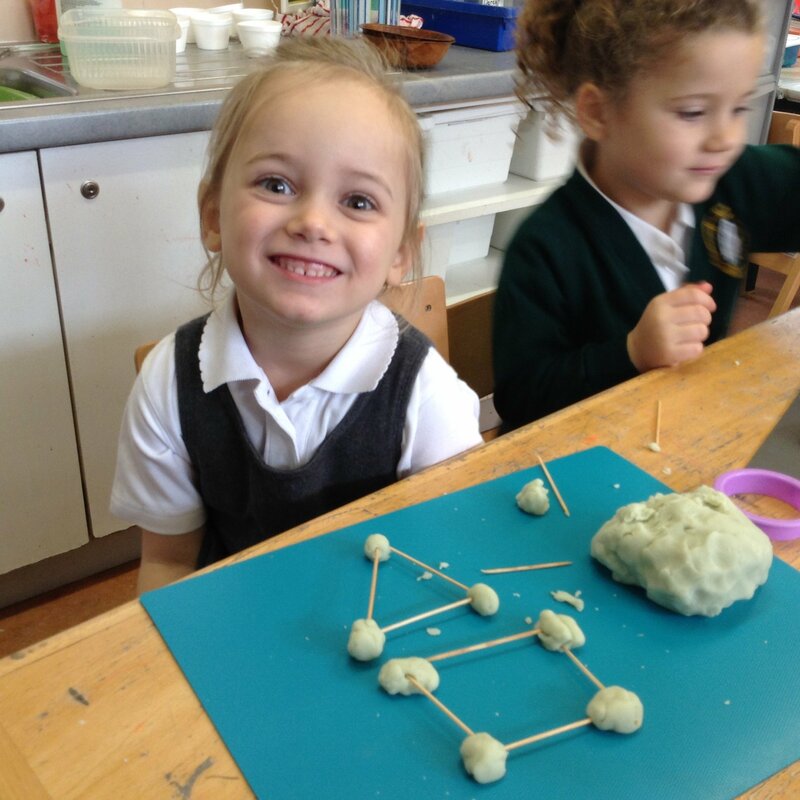 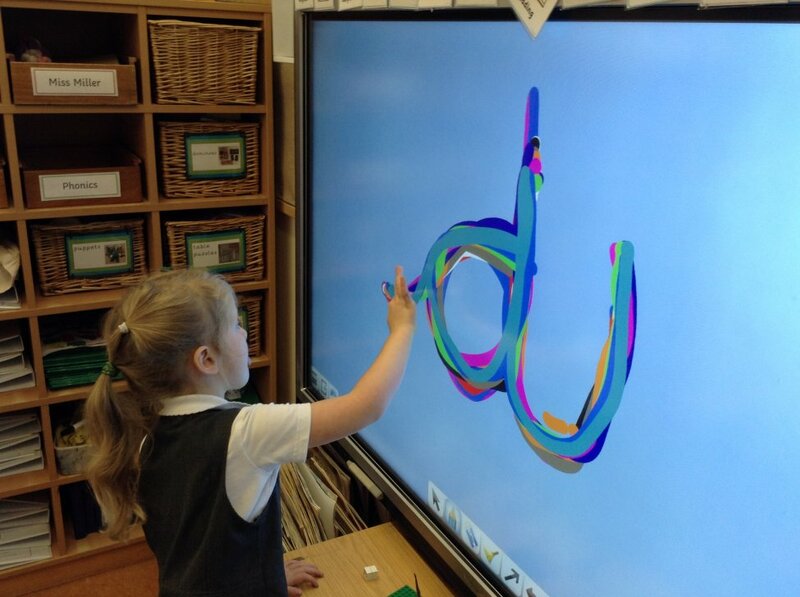 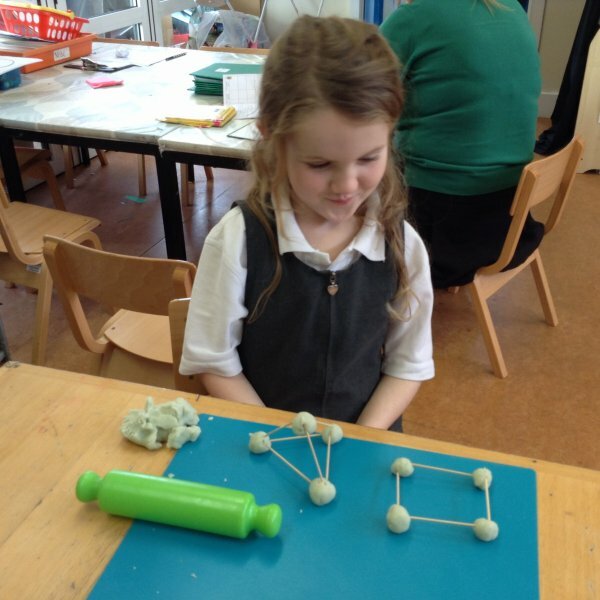 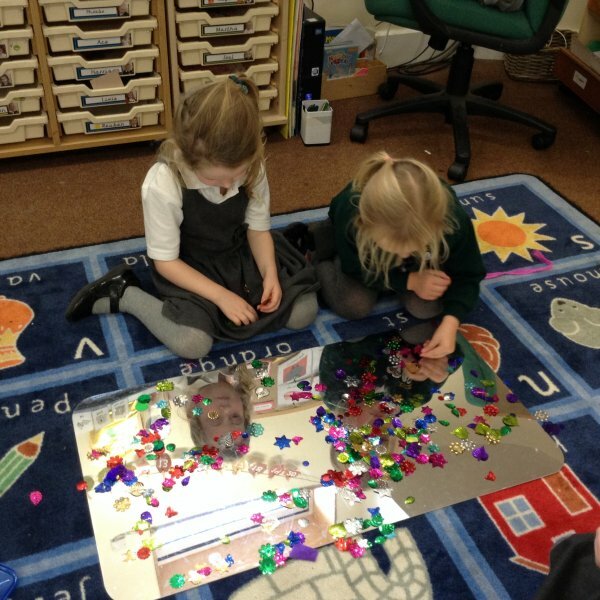 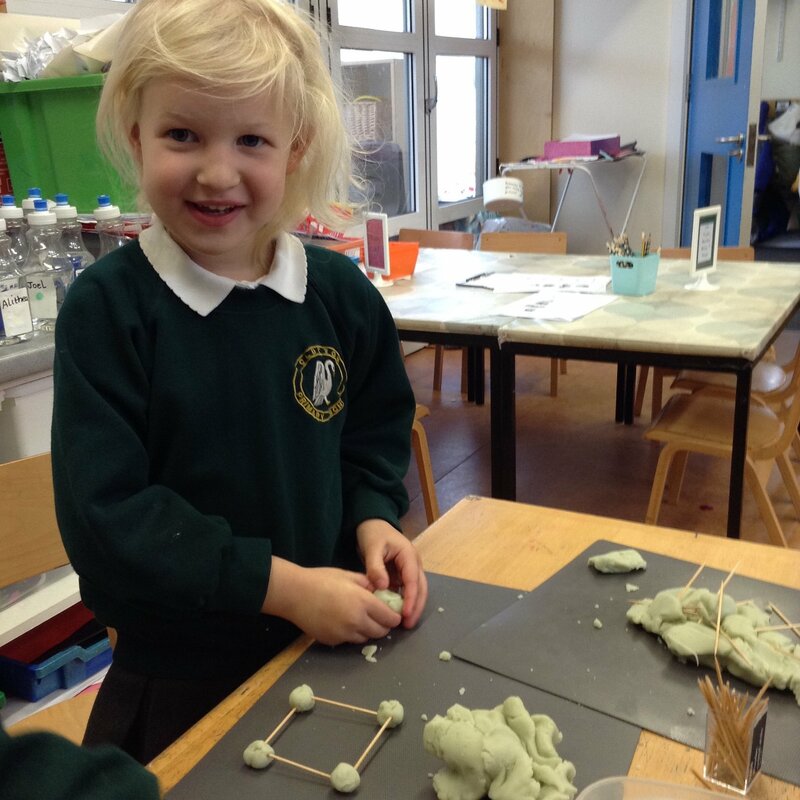 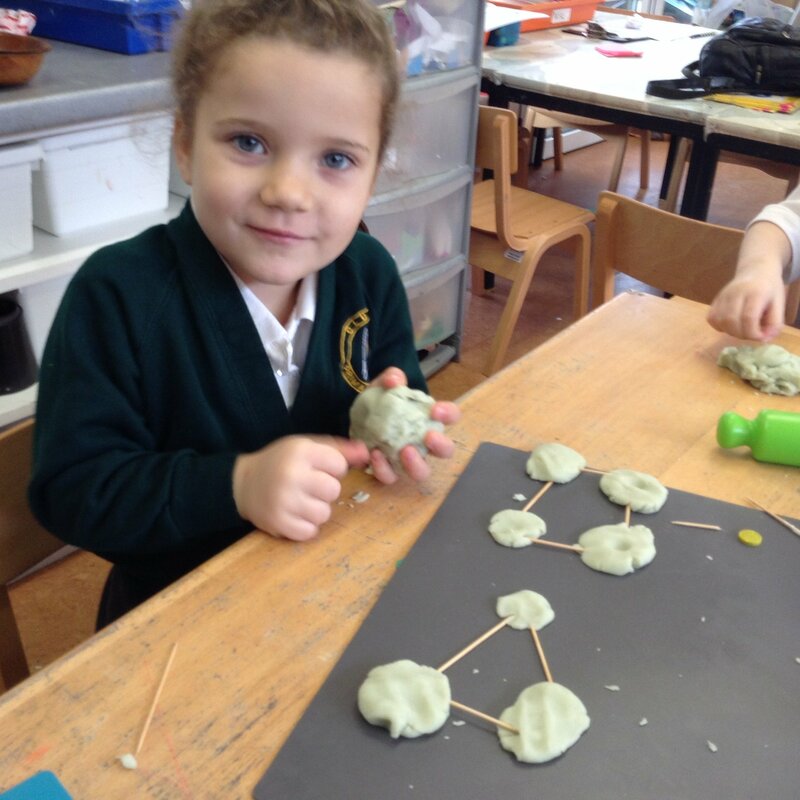 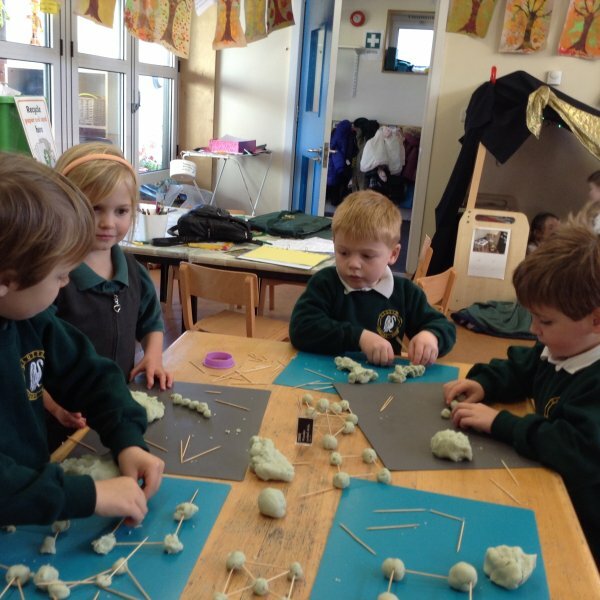 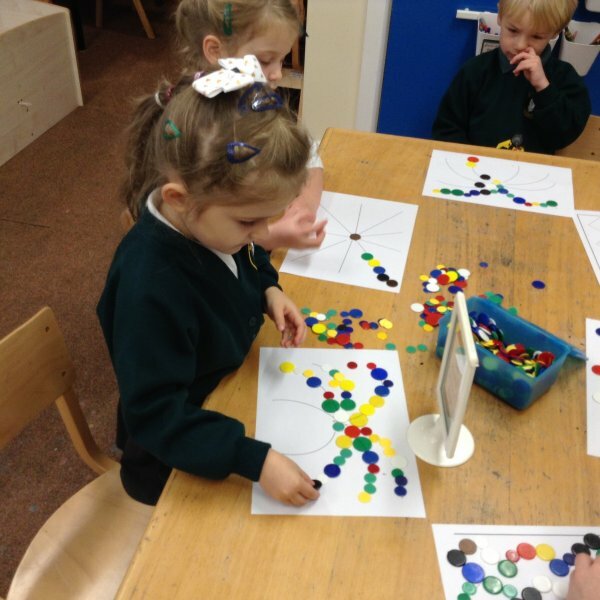 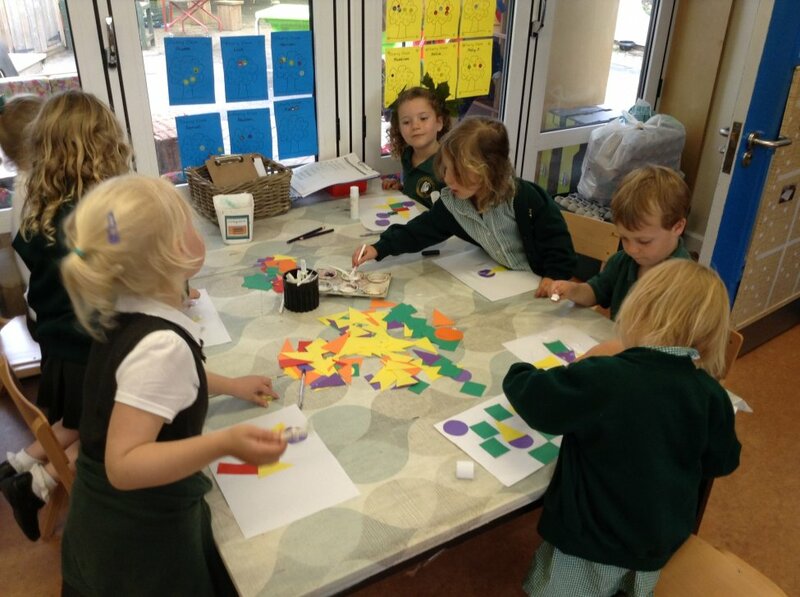 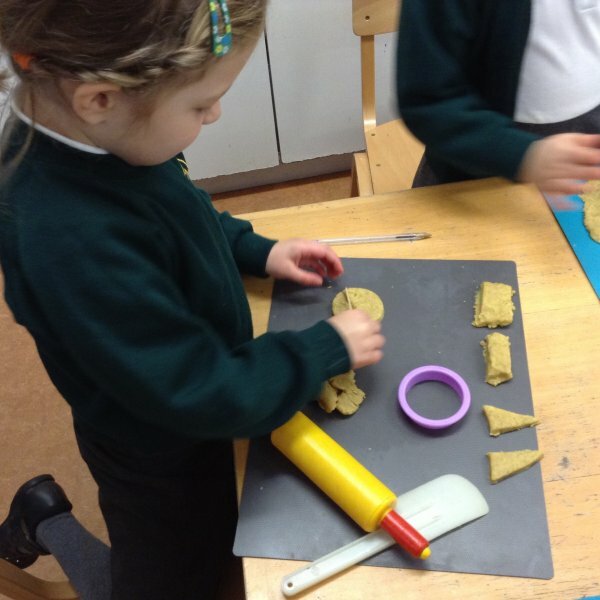 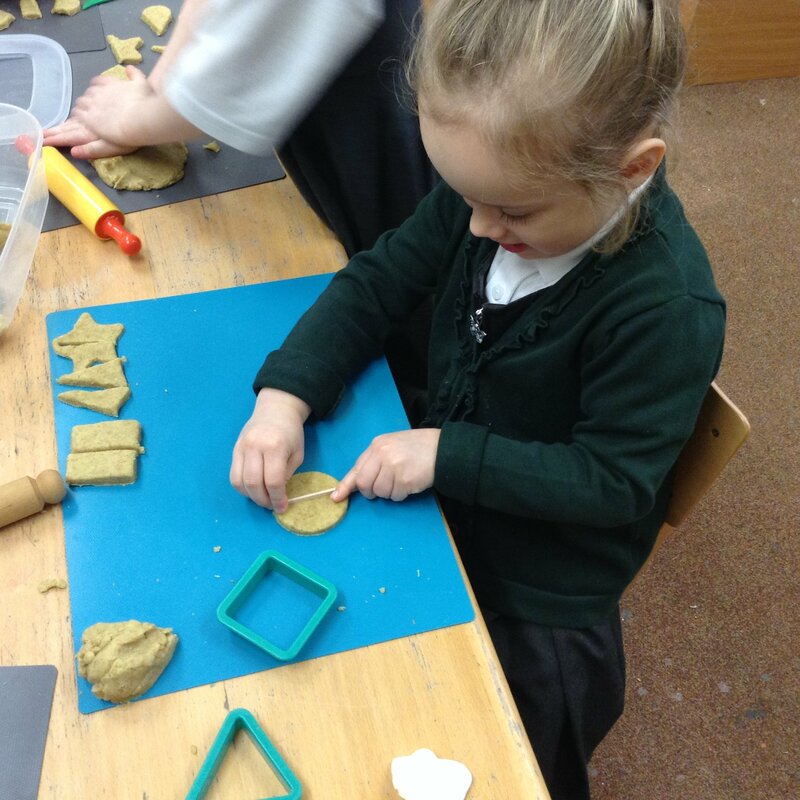 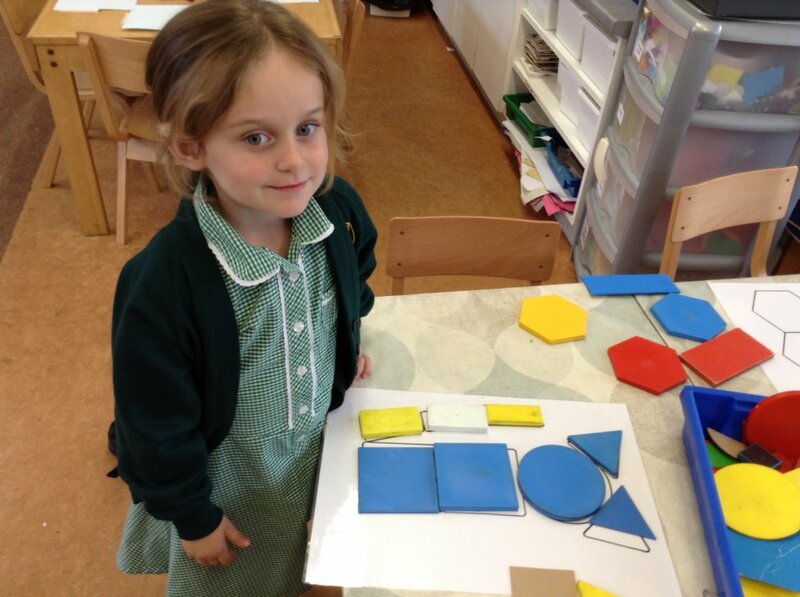 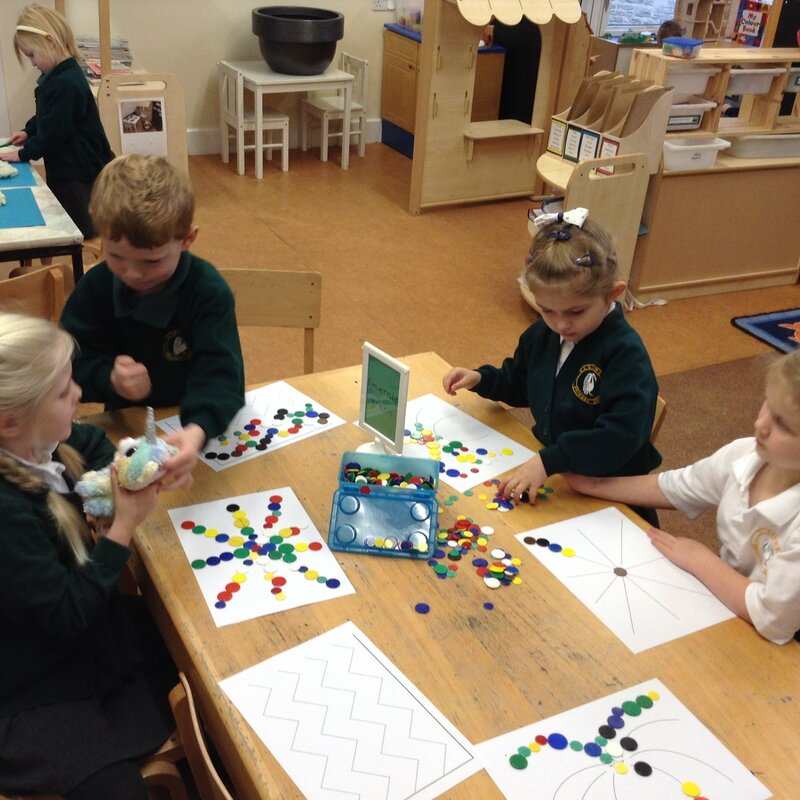 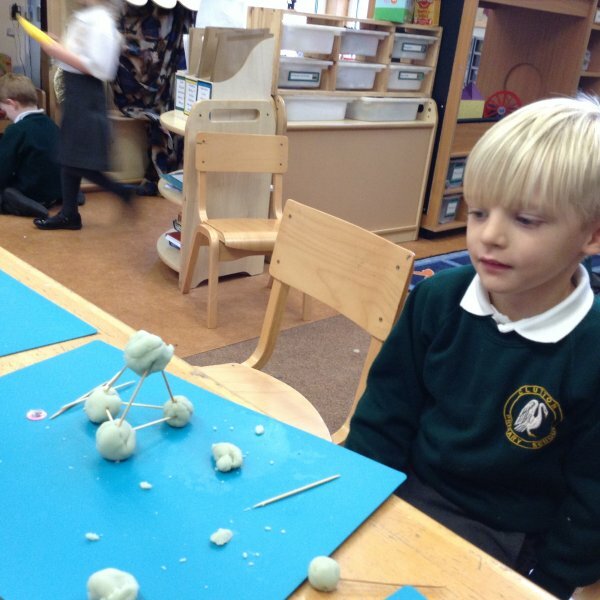 Here are a few photos from this week's learning - mostly showing our discoveries about 2D and 3D shapes. 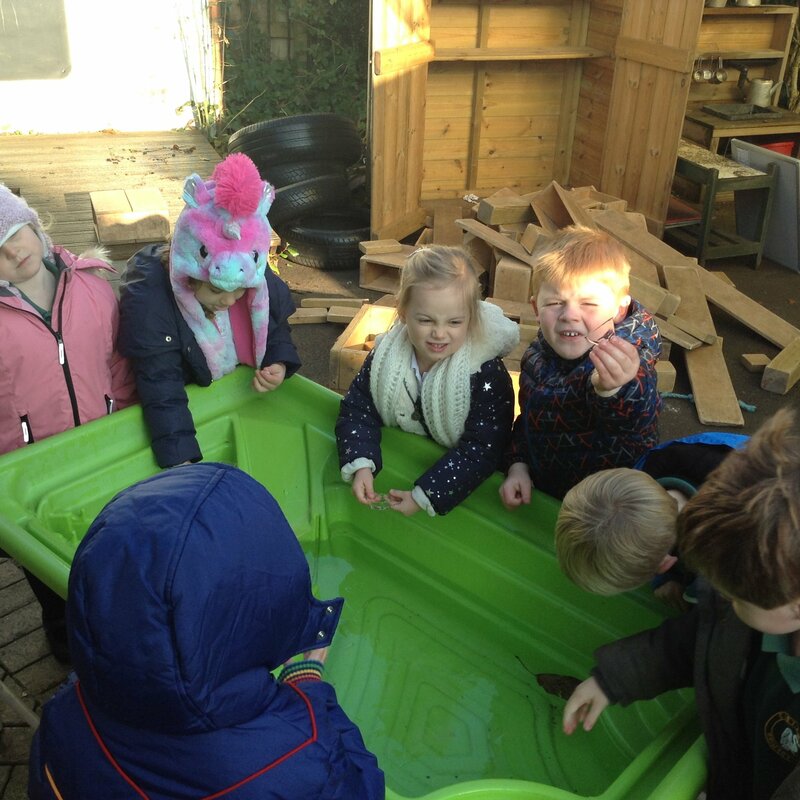 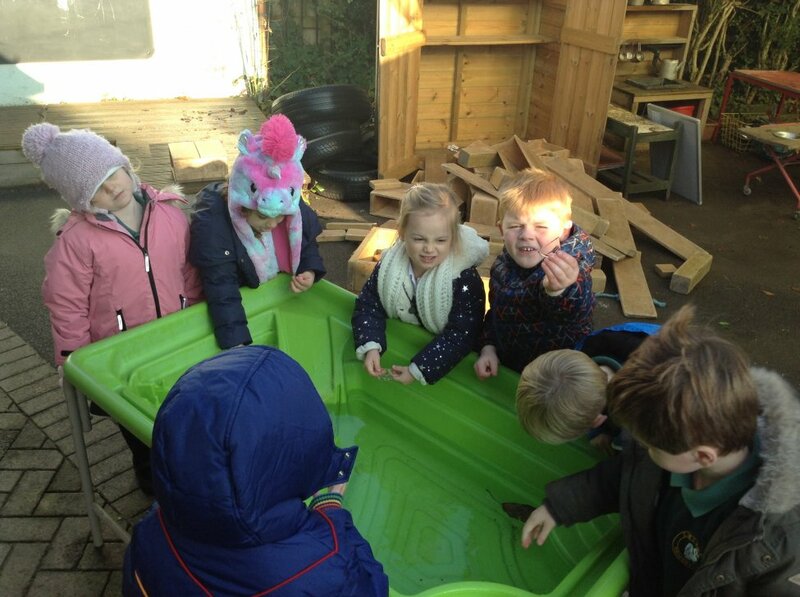 Imagine our excitement when we noticed that the ice in the water tray this morning had broken into different shapes. We found a perfect ice triangle, rectangle and even a pentagon! 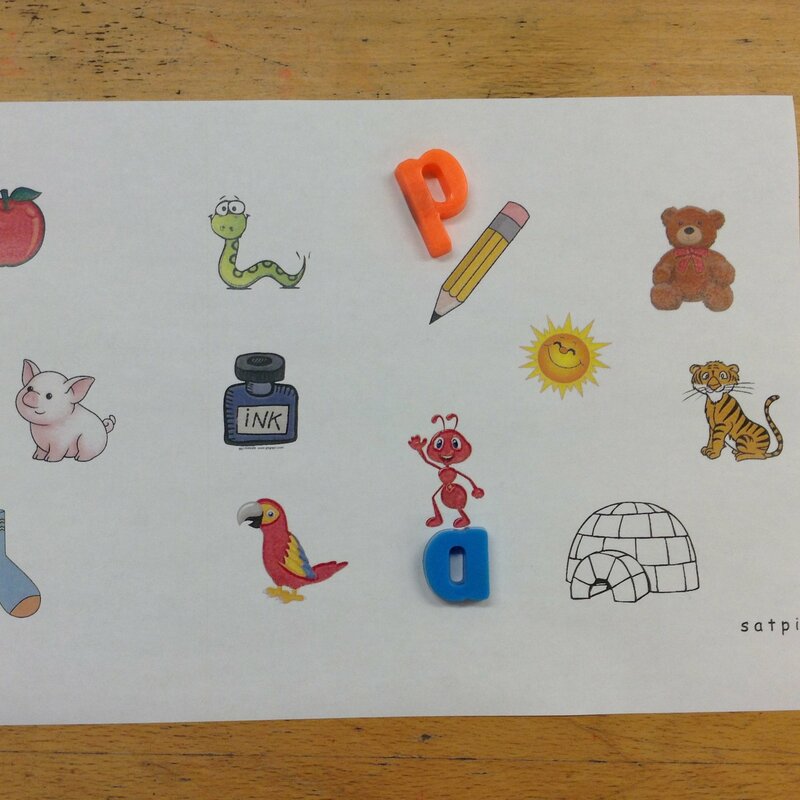 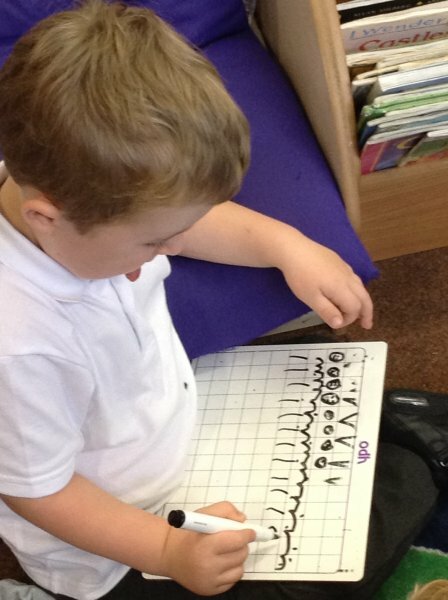 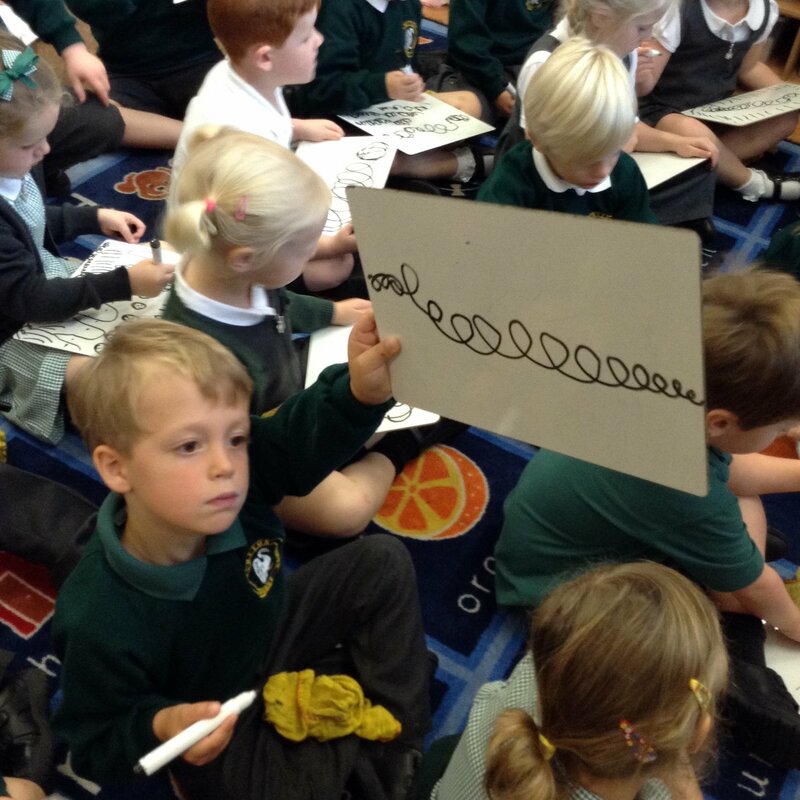 In phonics we have learnt the sounds ch, sh, th and ng (2 letters making one sound). 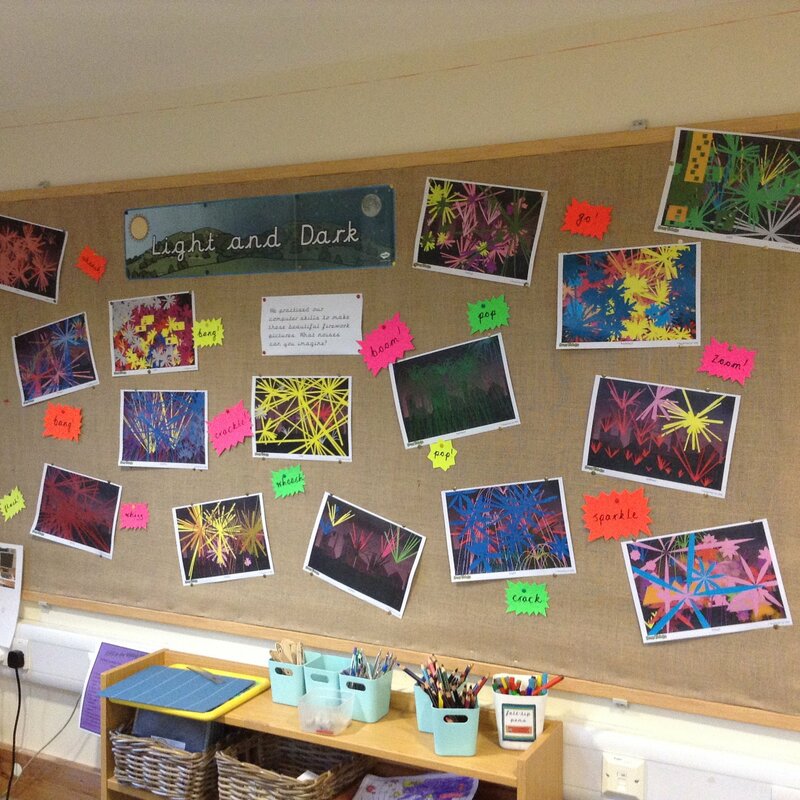 We have also been thinking about day and night and made shadow puppets to test in our dark den in the classroom (sorry no photos!). 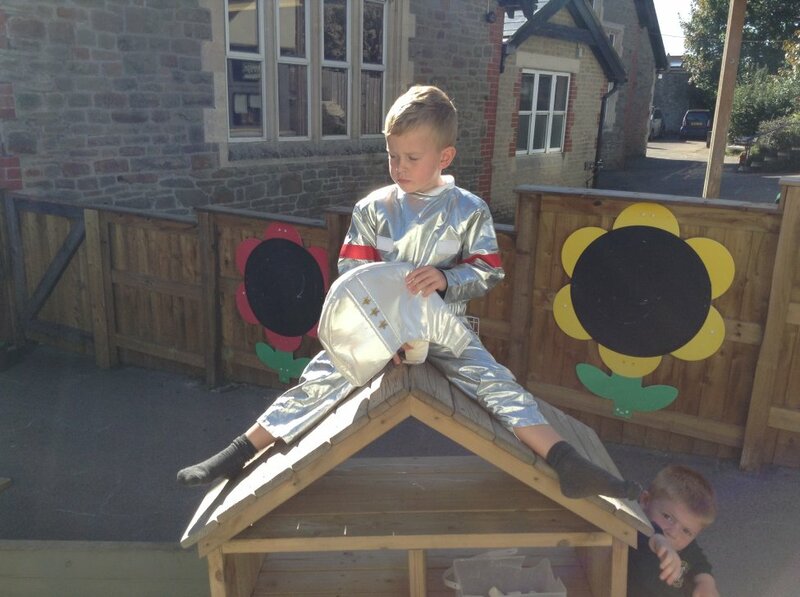 "The sun goes up to space." 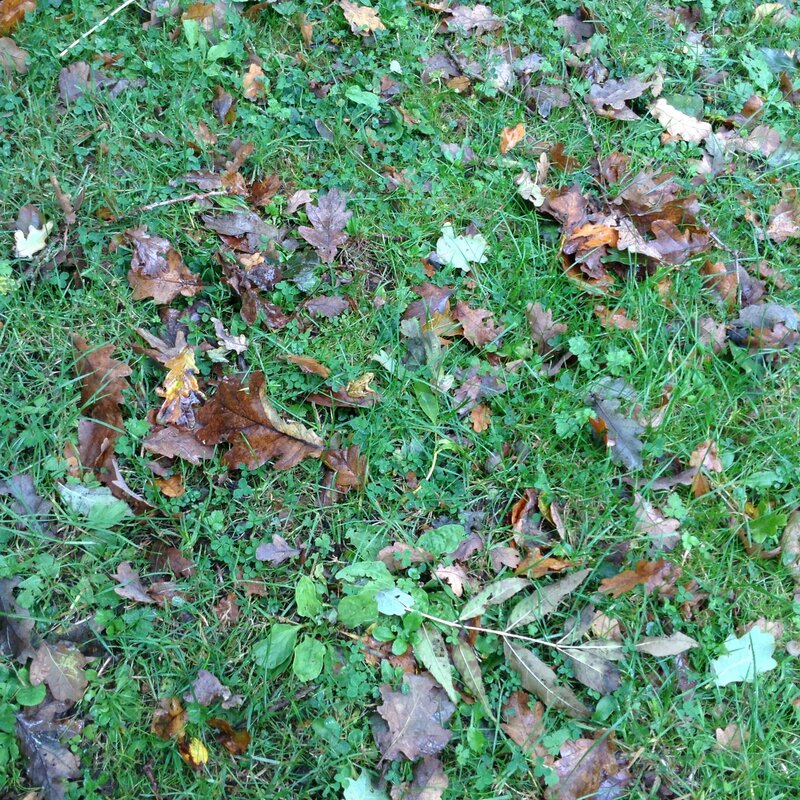 "It goes down behind the hedges." 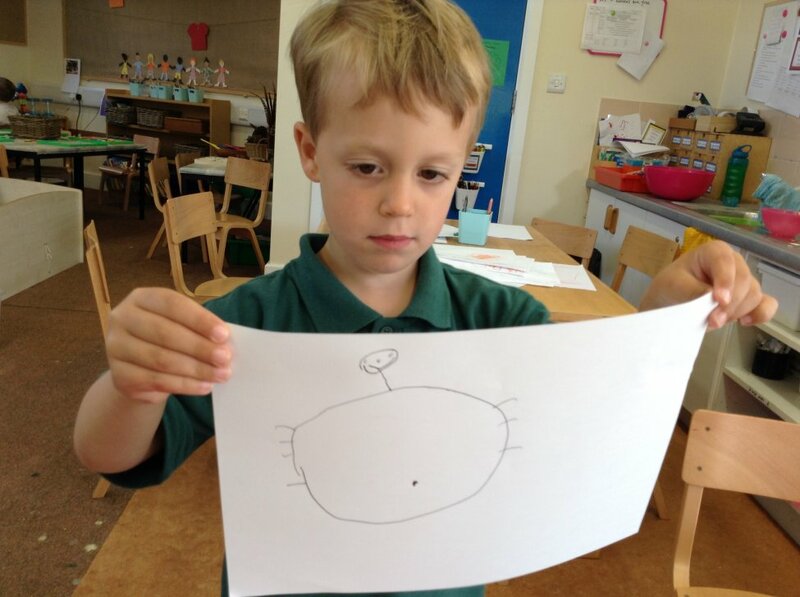 "It goes to another planet where it is summer." 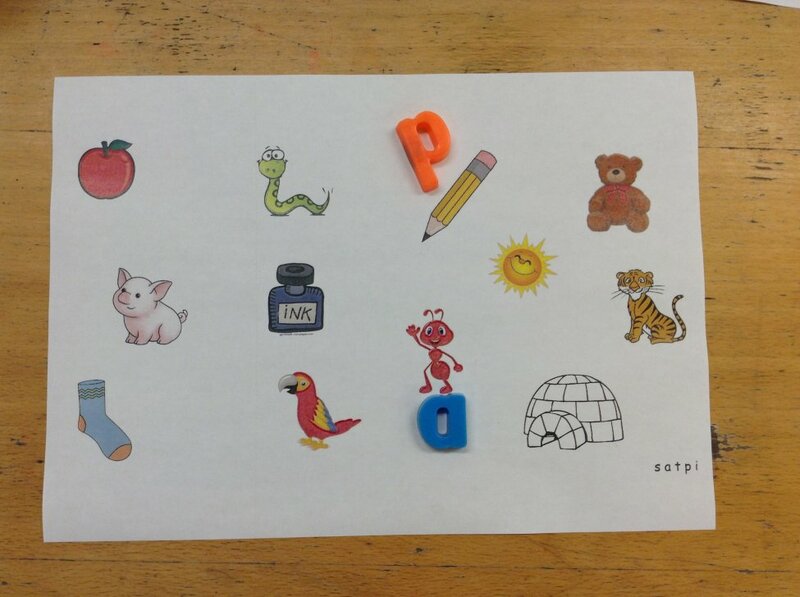 "It goes down. 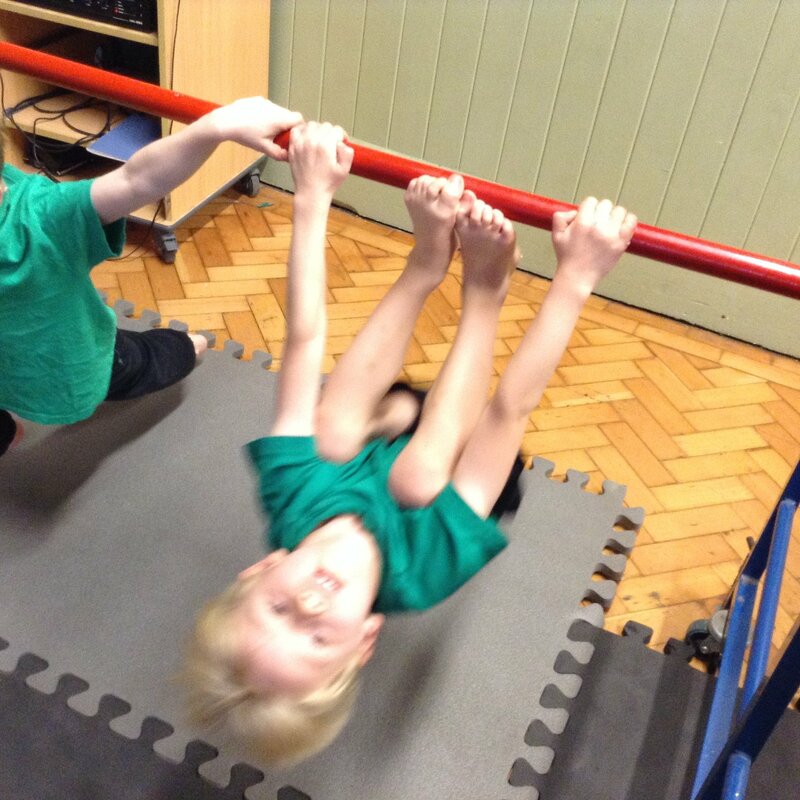 It's gravity." 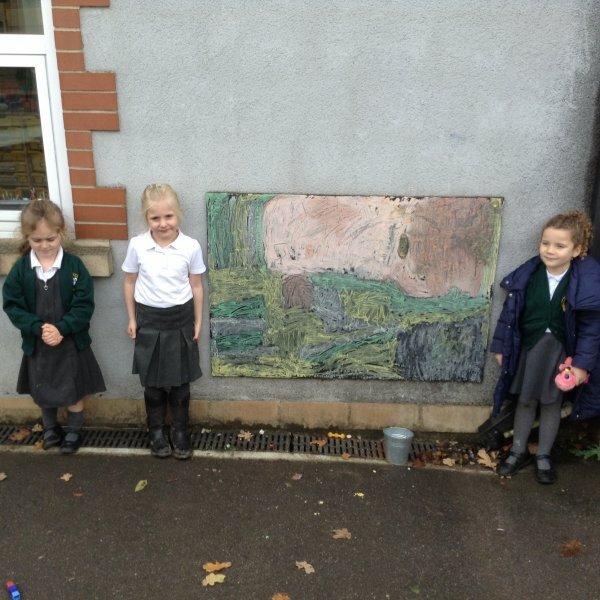 "It goes behind a cloud but it's so dark you can't see it." 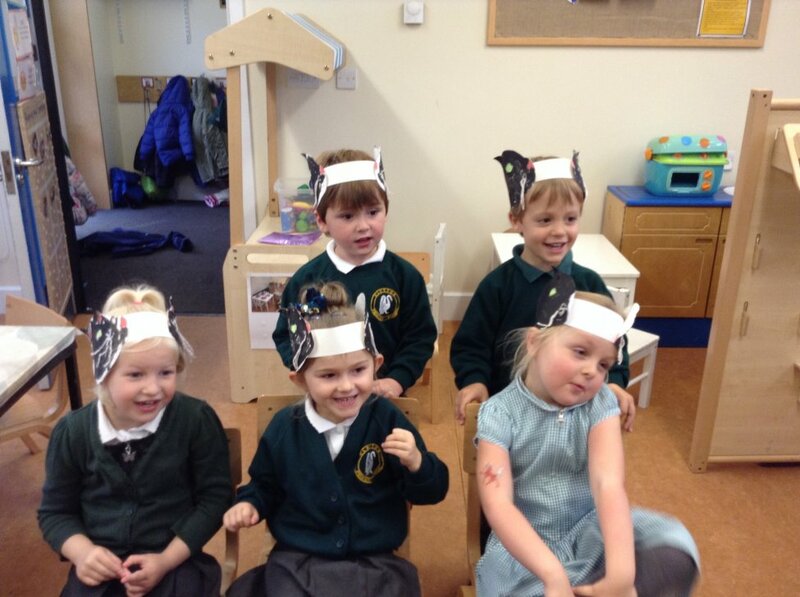 I told the children the story of the Nativity using shadow puppets so ask your Cherry to retell you the story.. 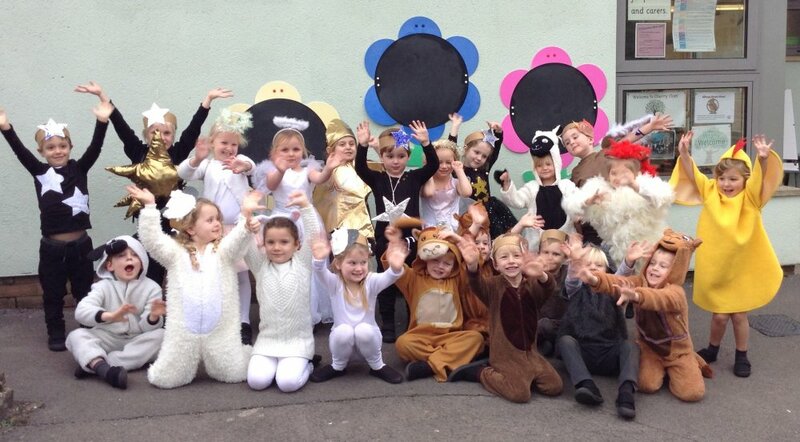 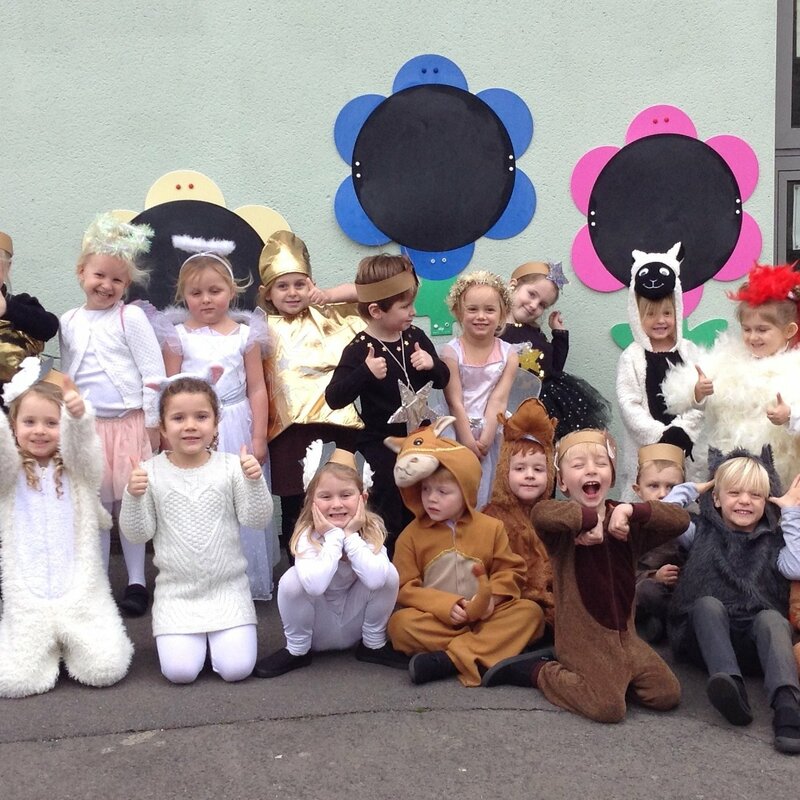 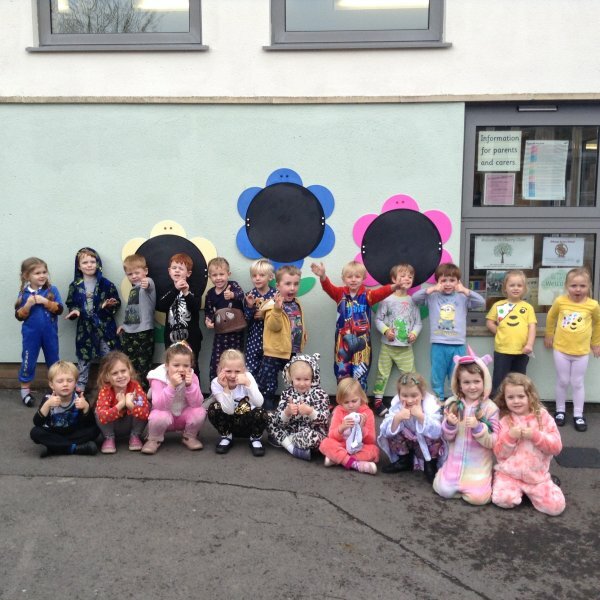 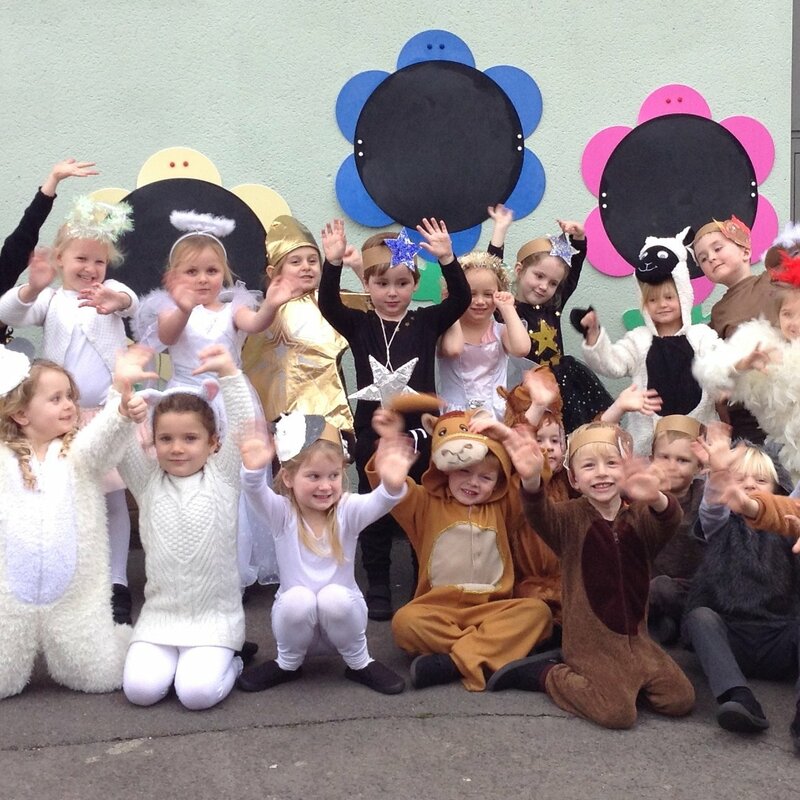 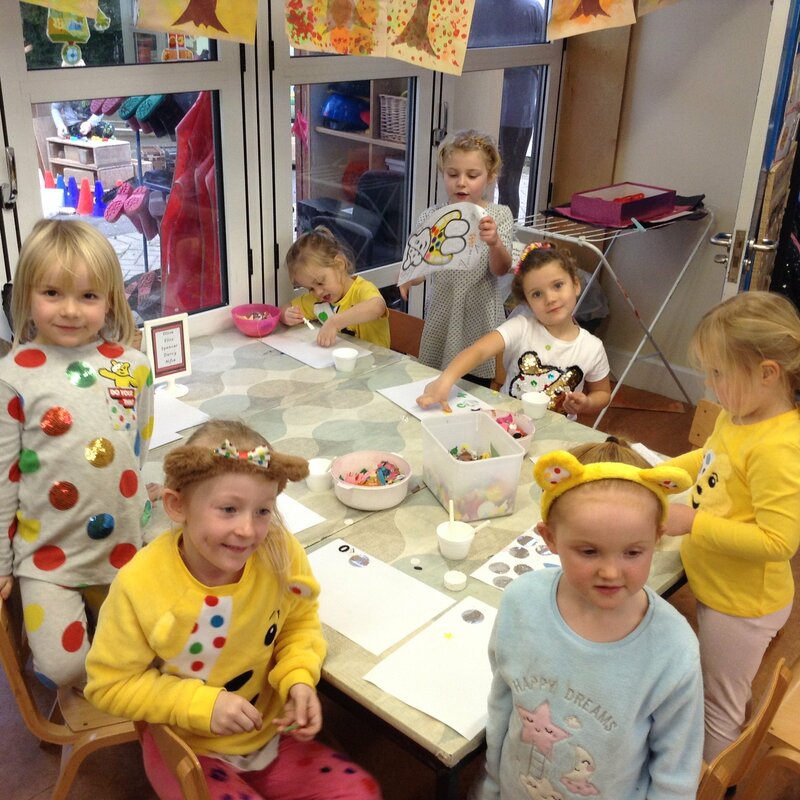 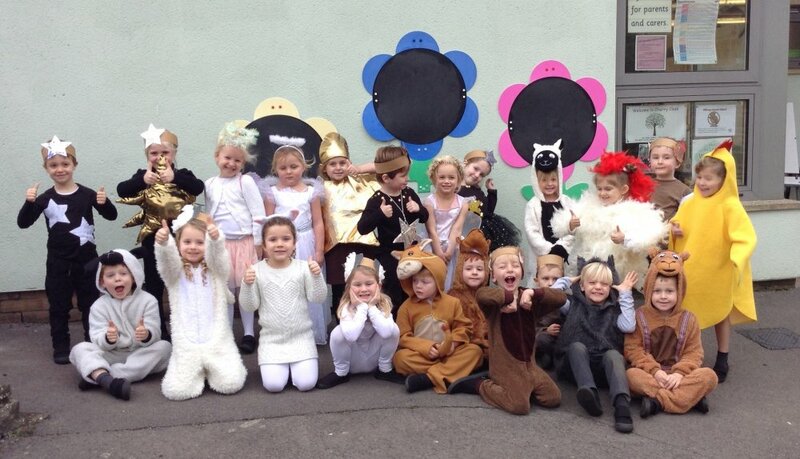 This week we supported Children In Need. 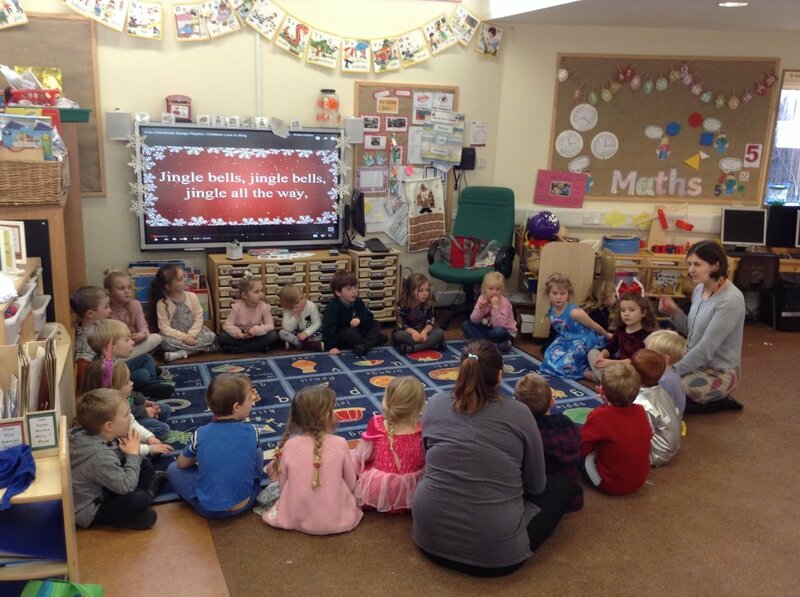 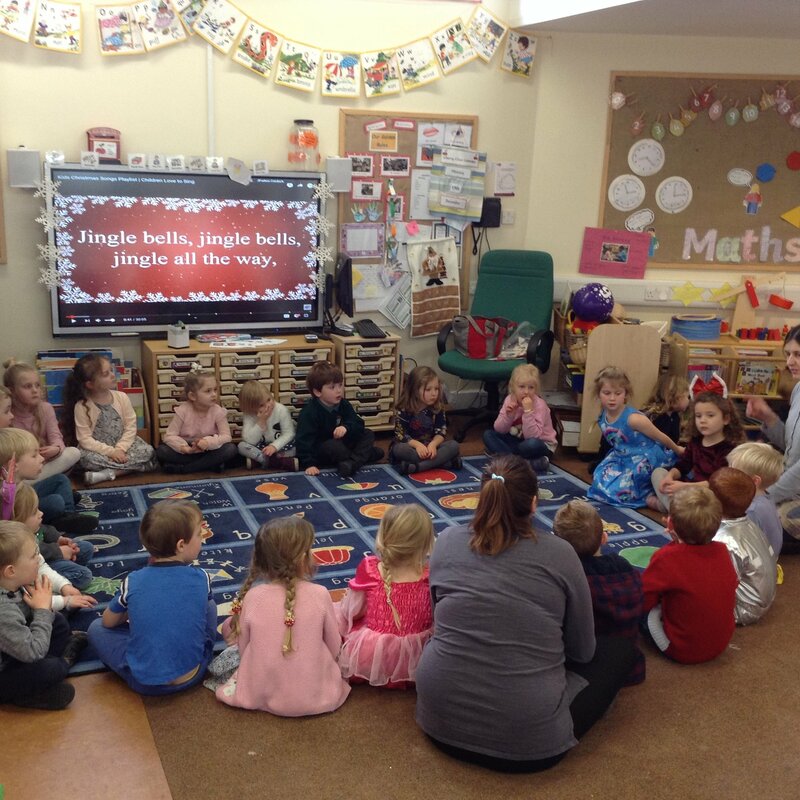 It was nice having Golden time with Maple Class in our pyjamas! 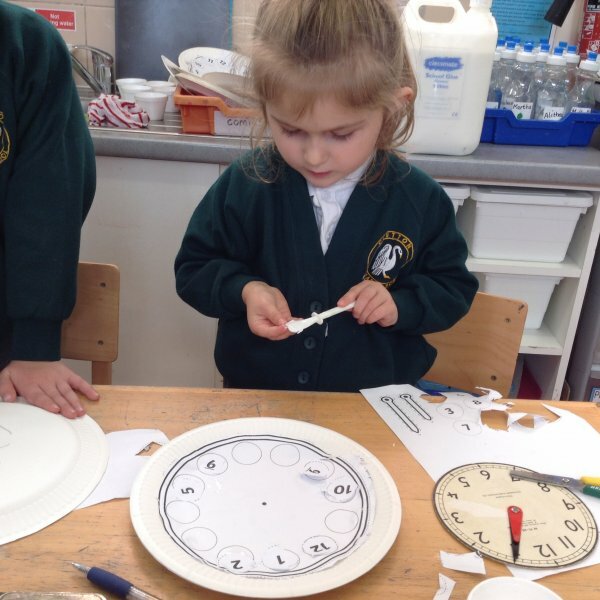 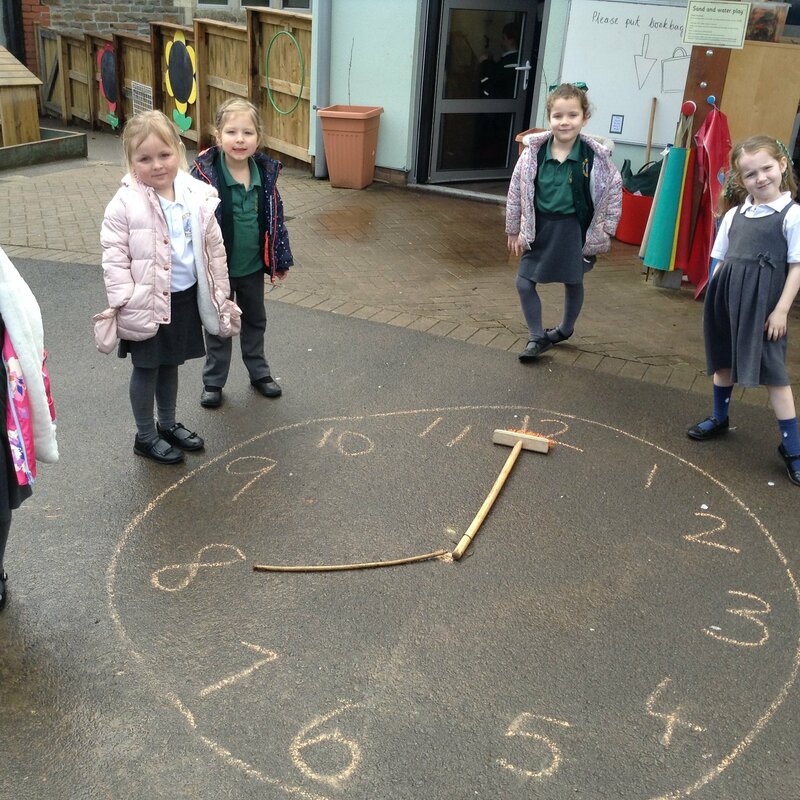 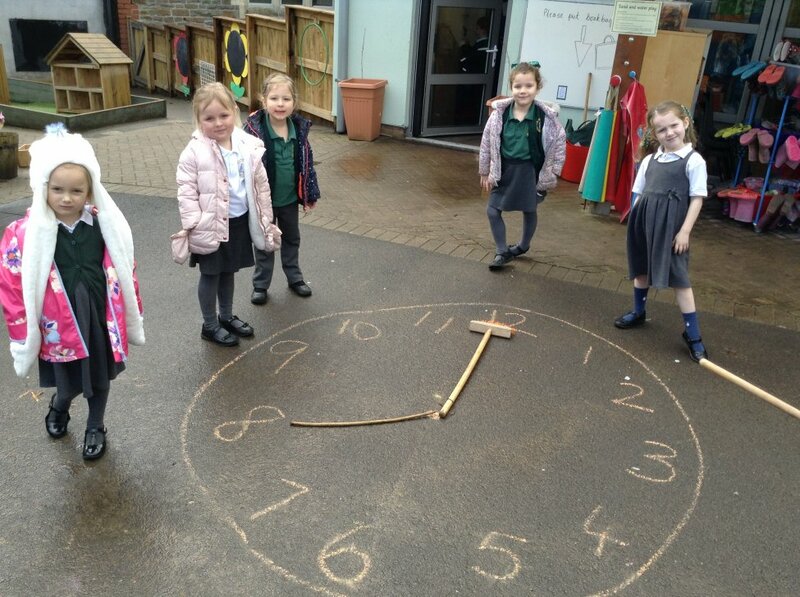 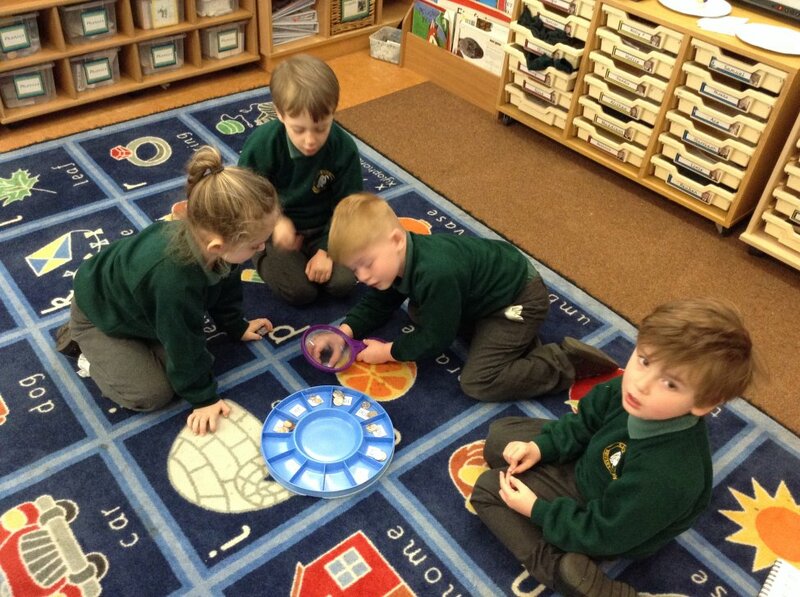 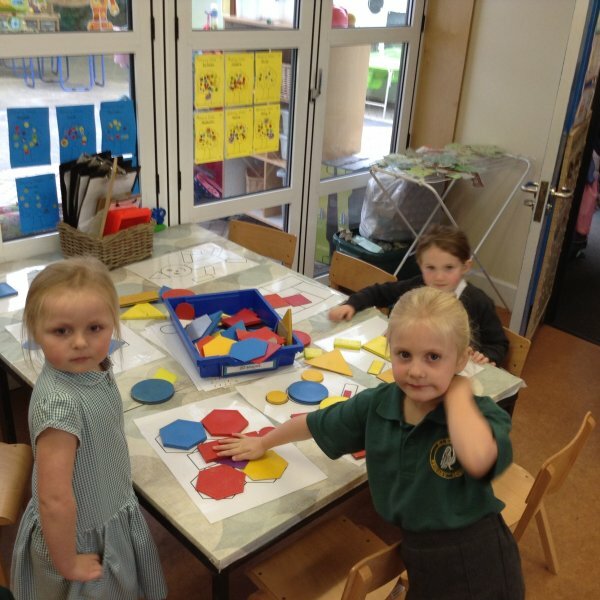 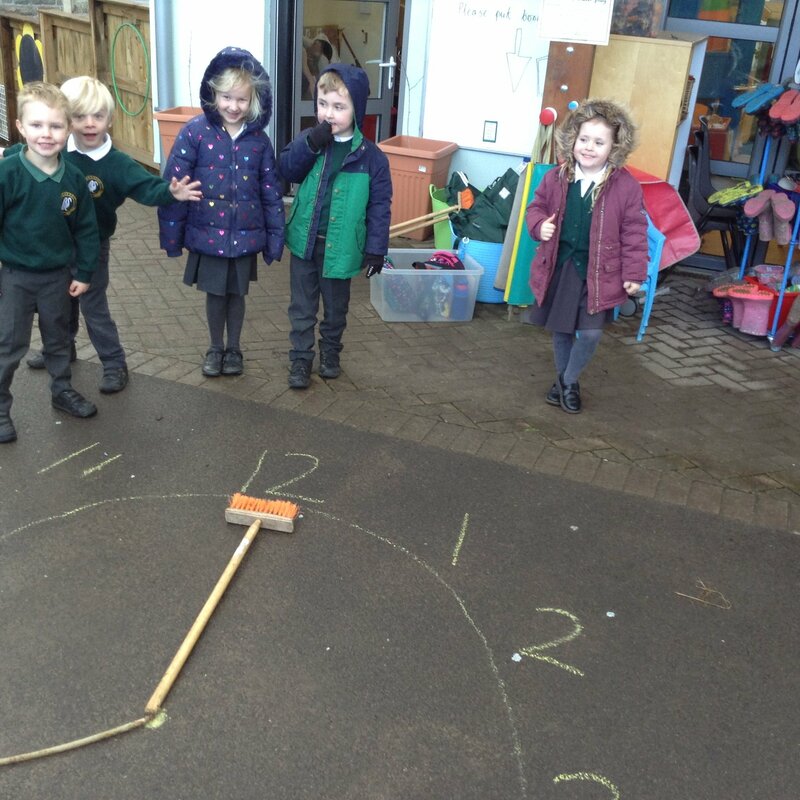 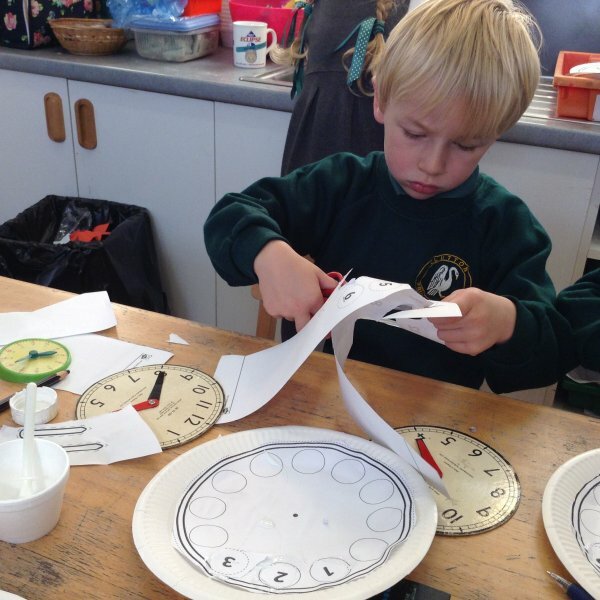 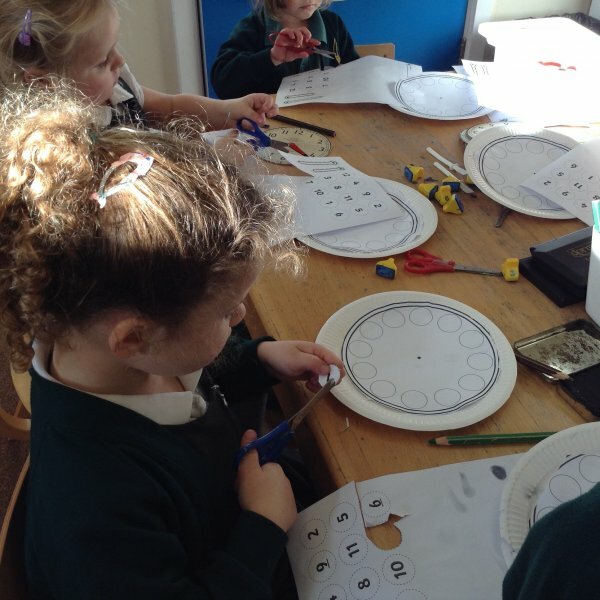 We have been busy learning about 2D shapes with a shape hunt round the school, making clocks with Mrs Morris and finding out how to tell the time. 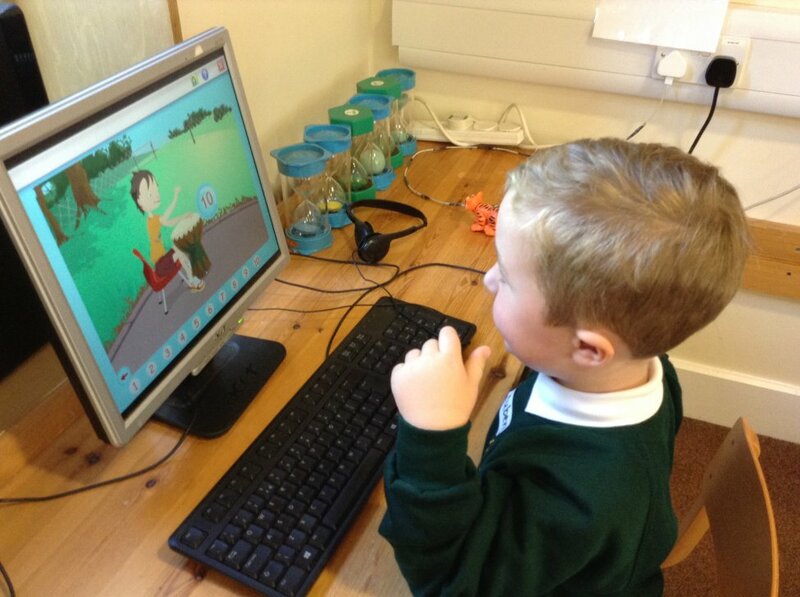 Look at our amazing firework pictures that we made on the computer! 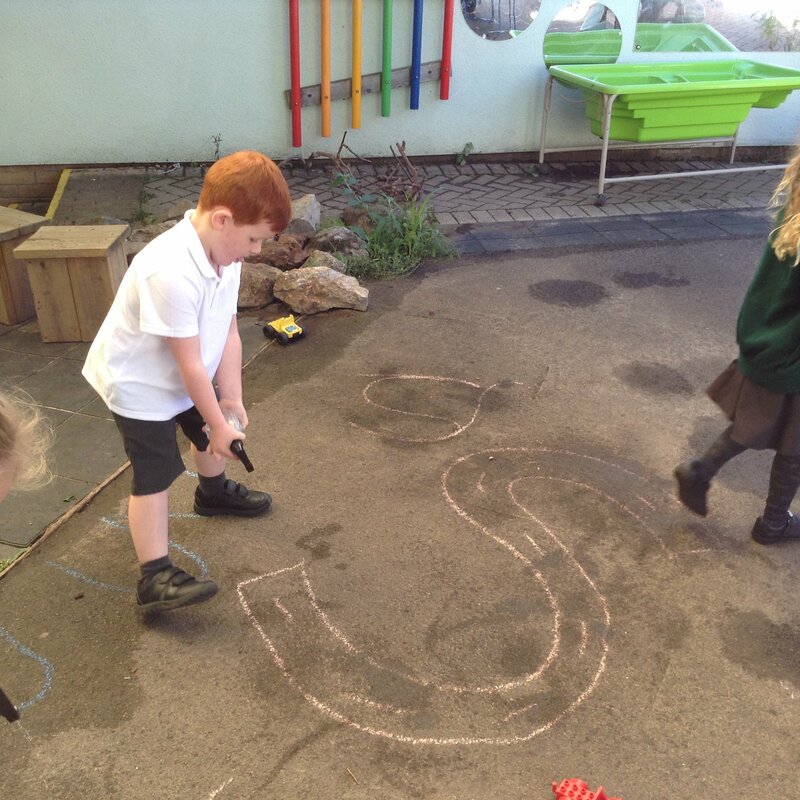 We learnt our last single letter sounds - y, z, and qu and found out all about the Robinson Family (the Biff and Chip books). 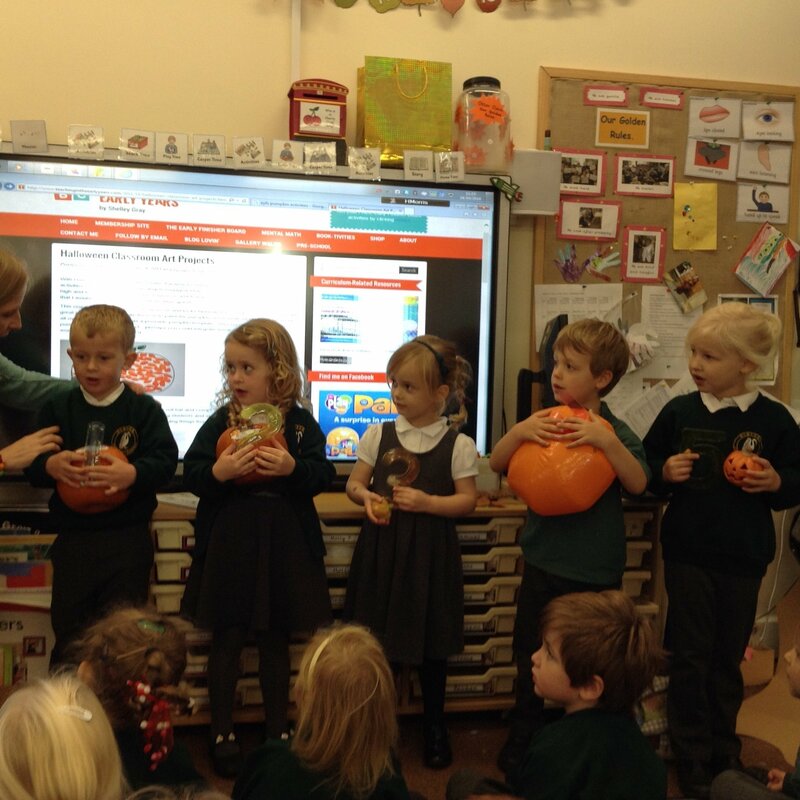 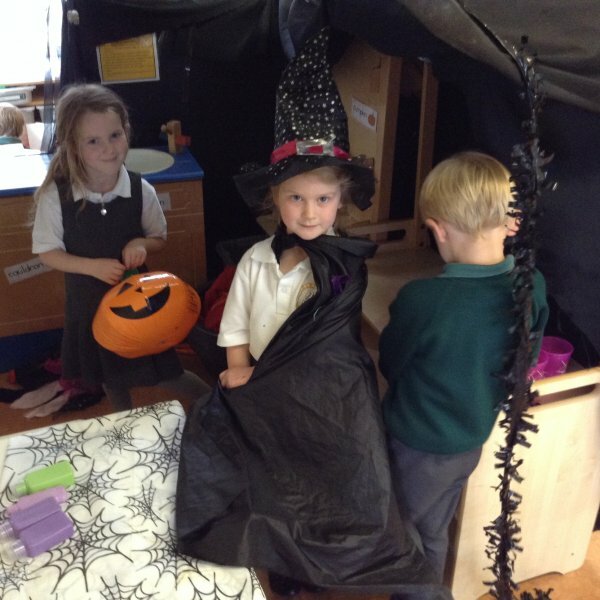 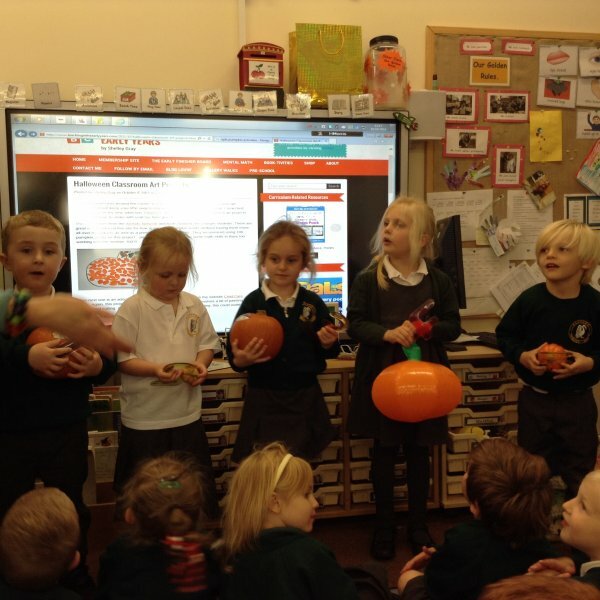 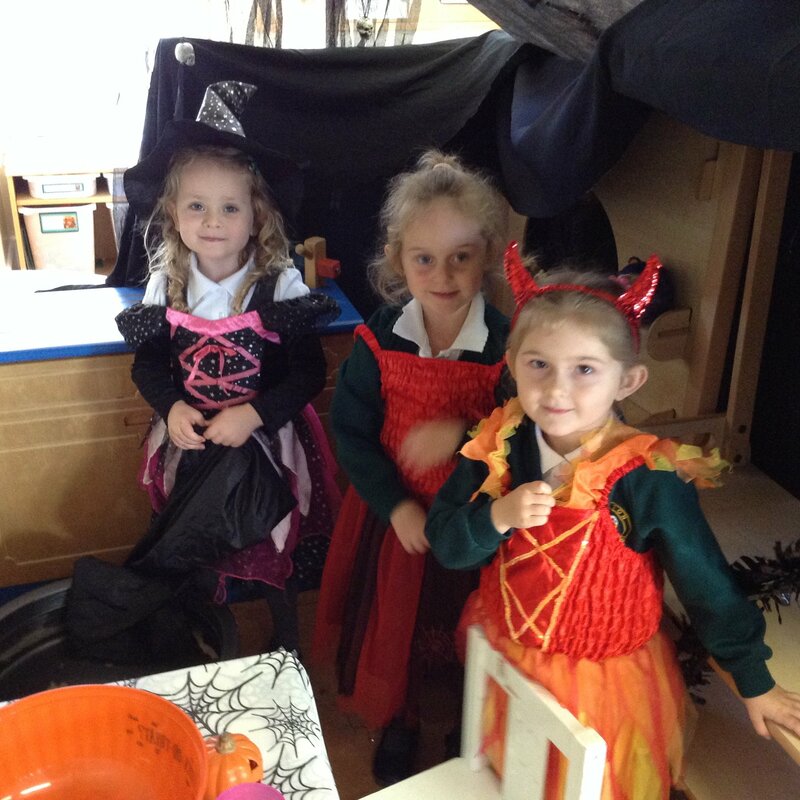 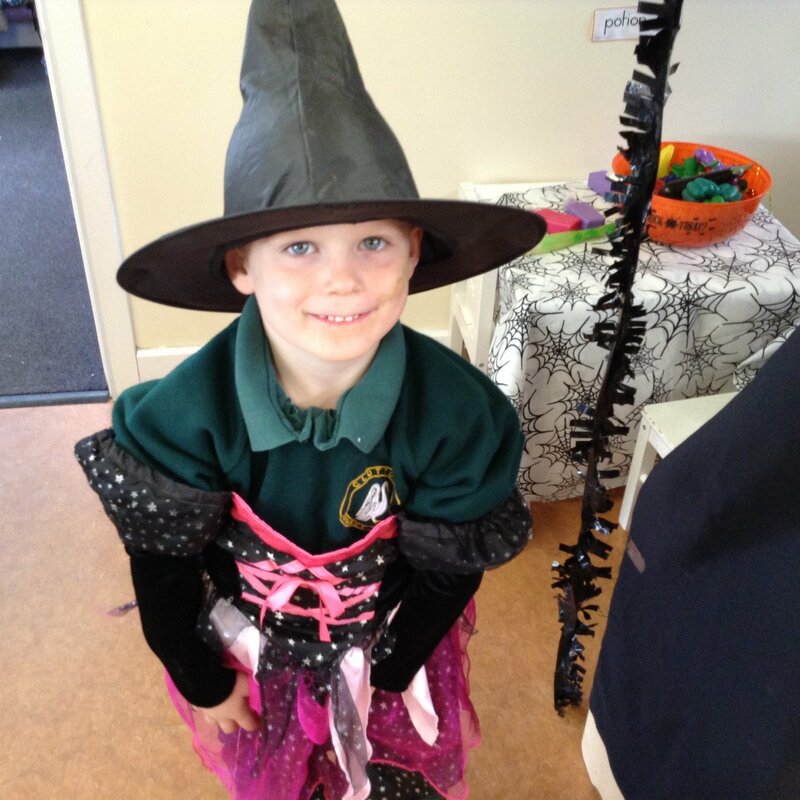 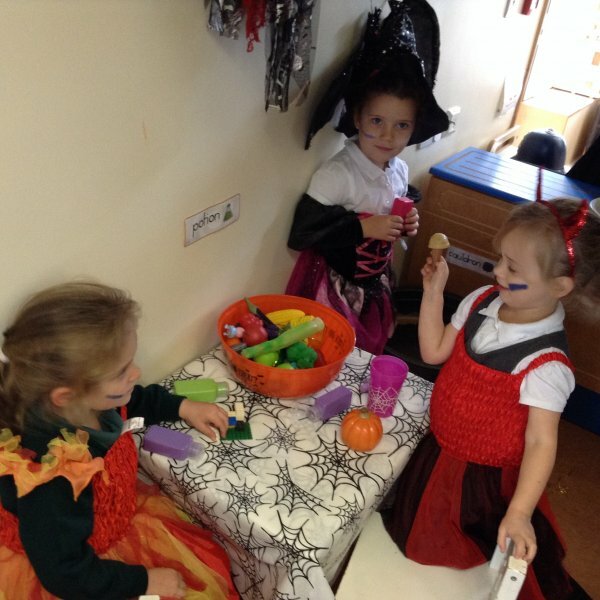 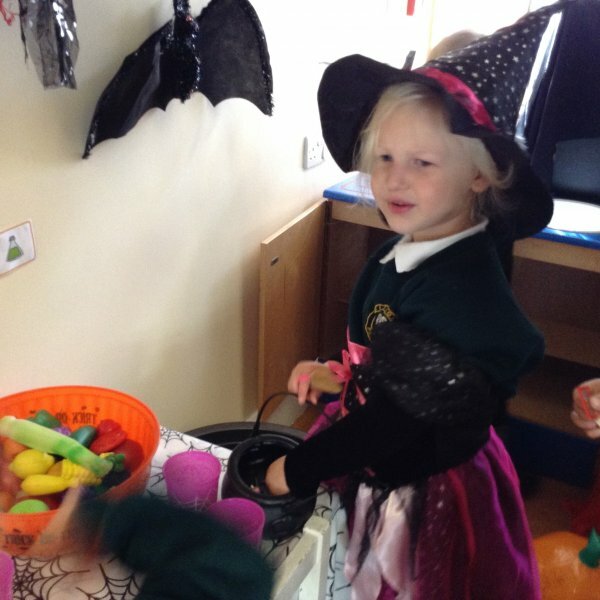 We have learnt so much this week - as well as enjoying our Halloween activities. 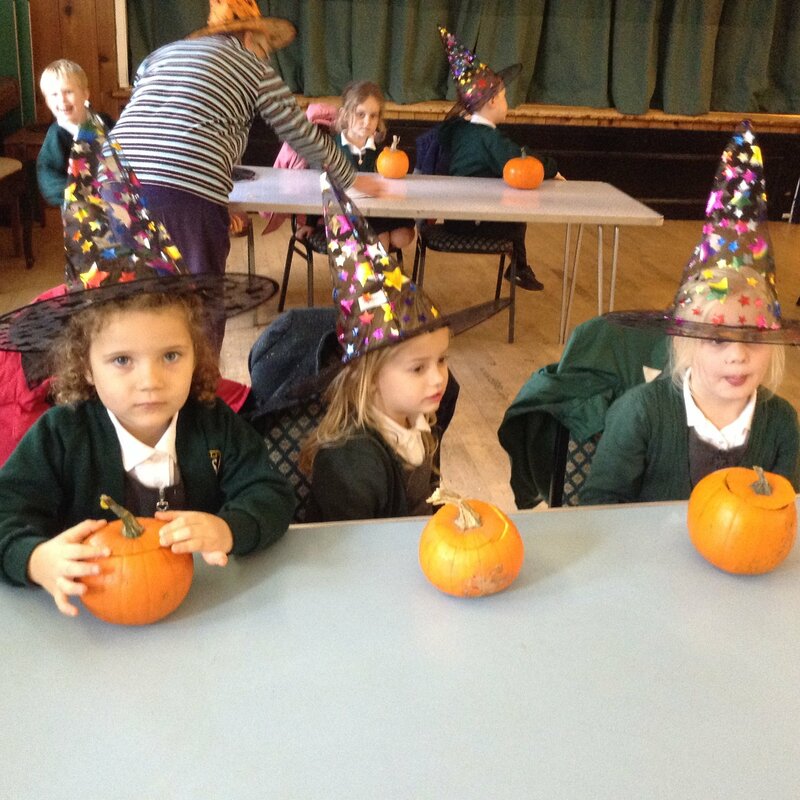 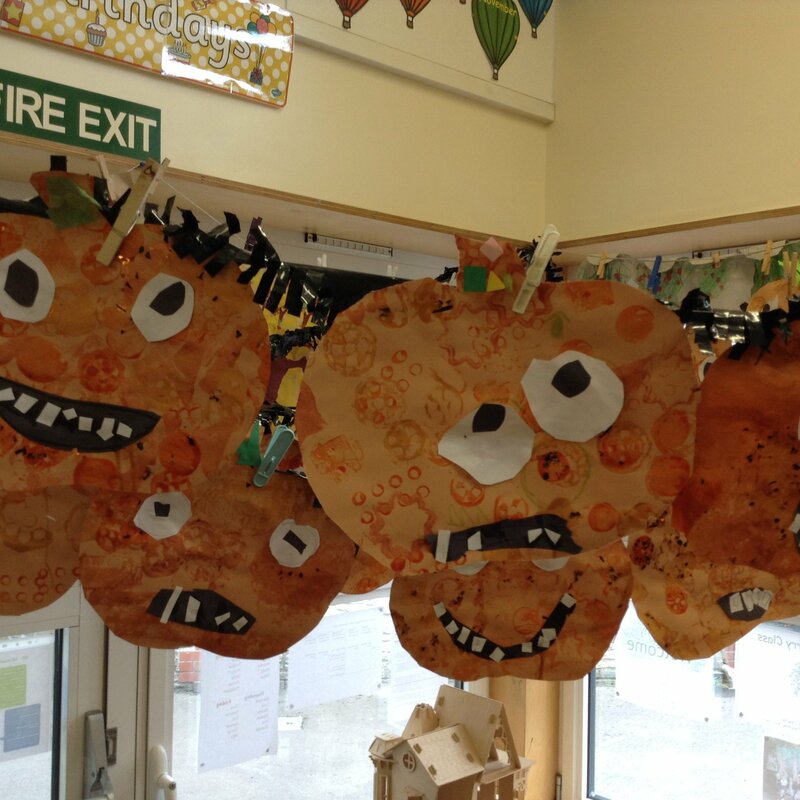 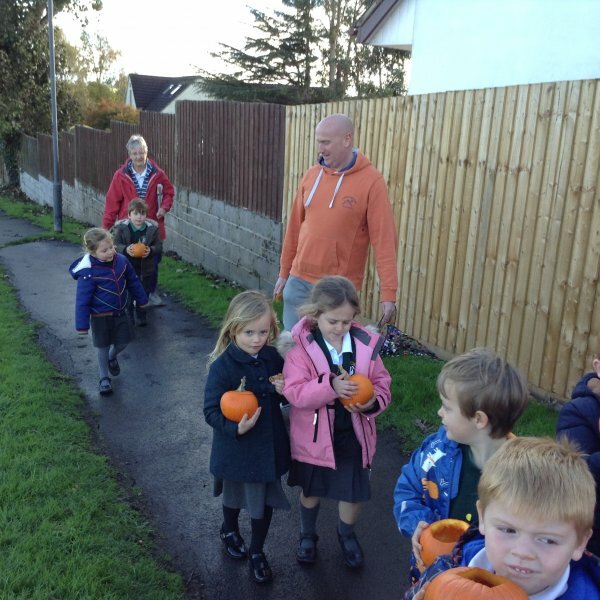 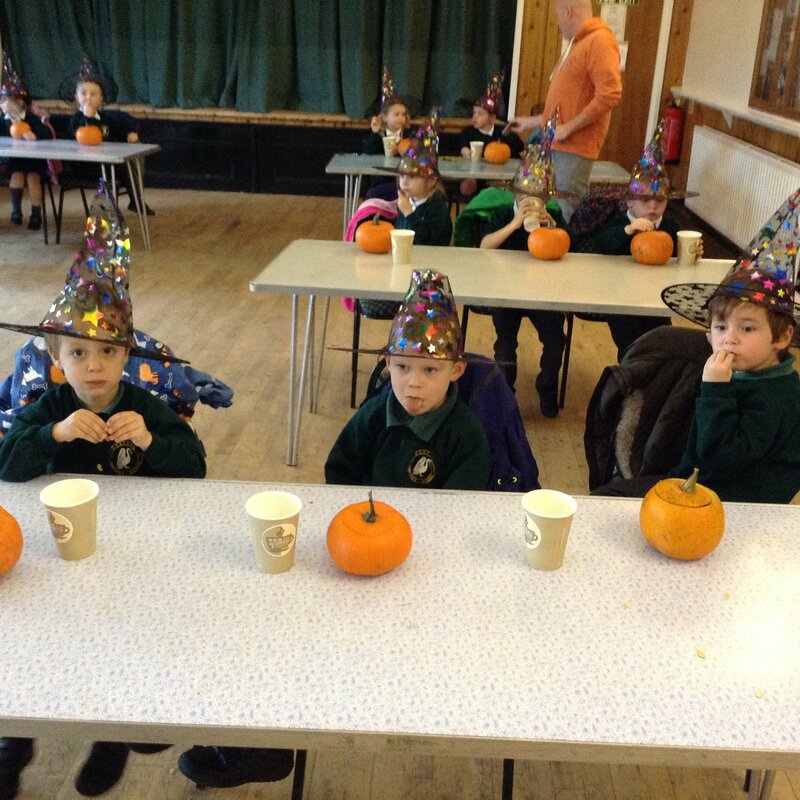 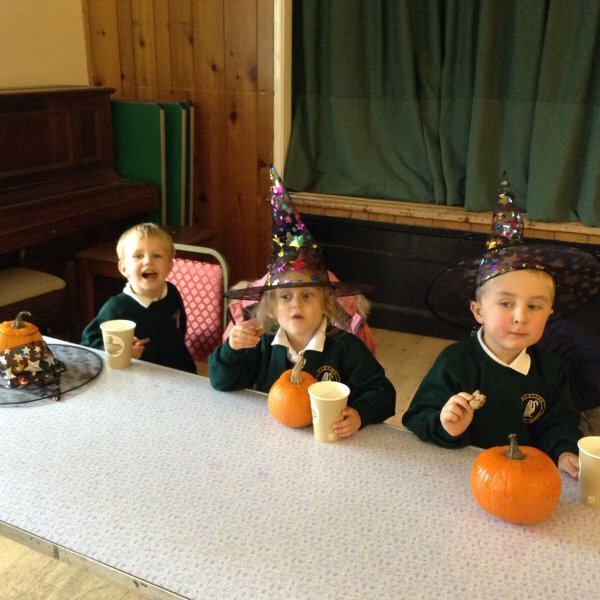 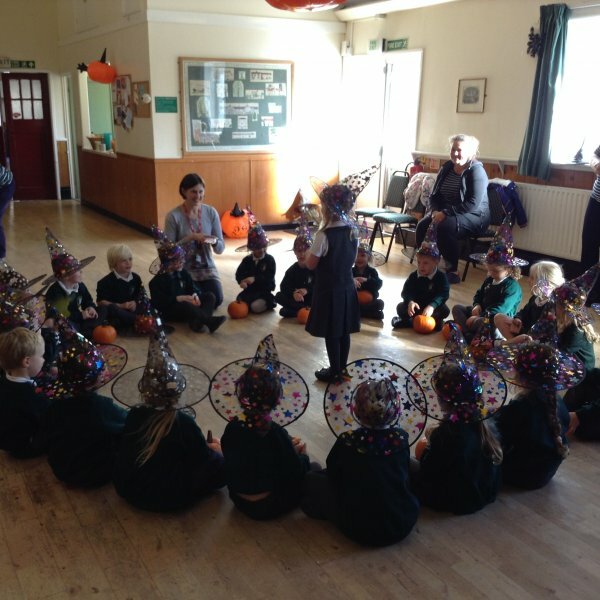 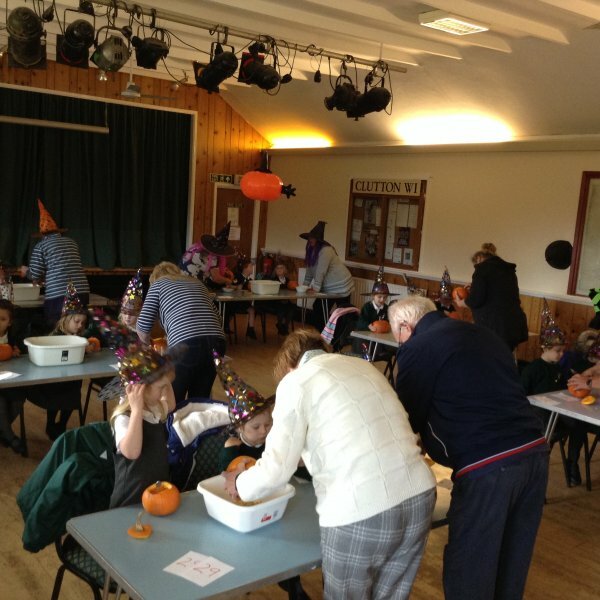 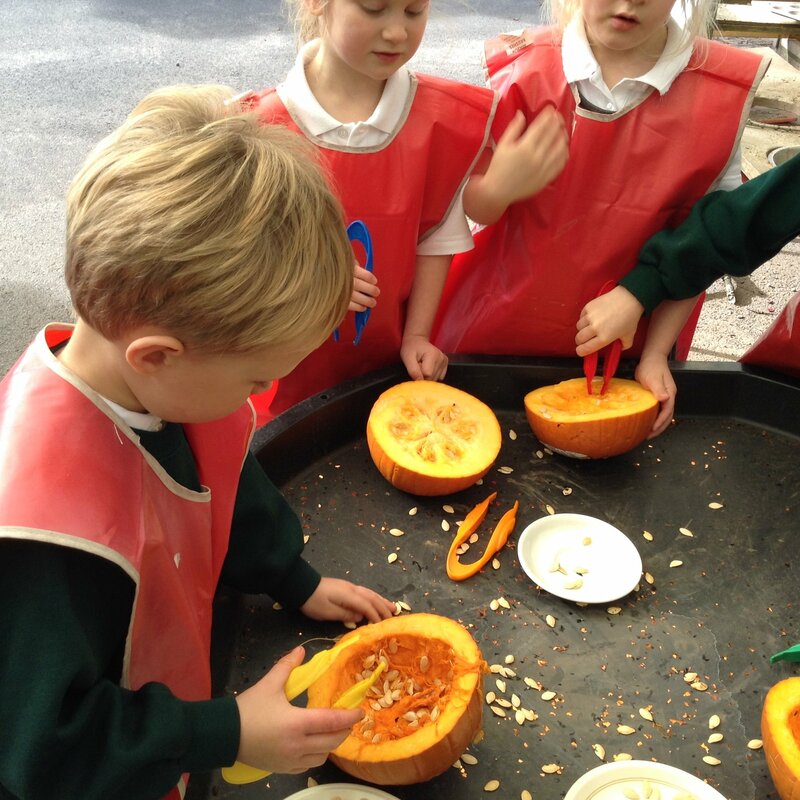 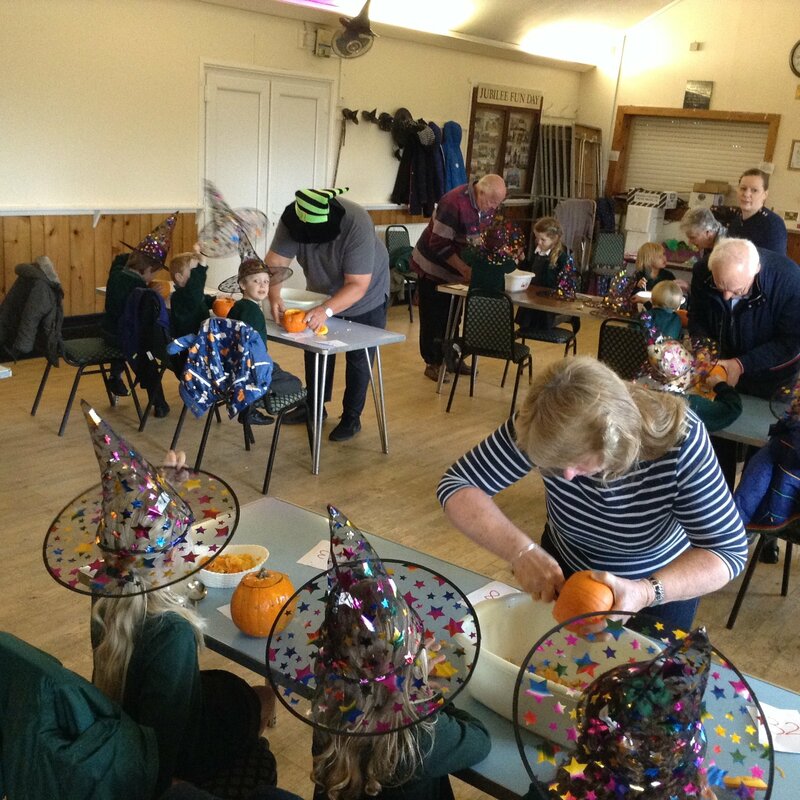 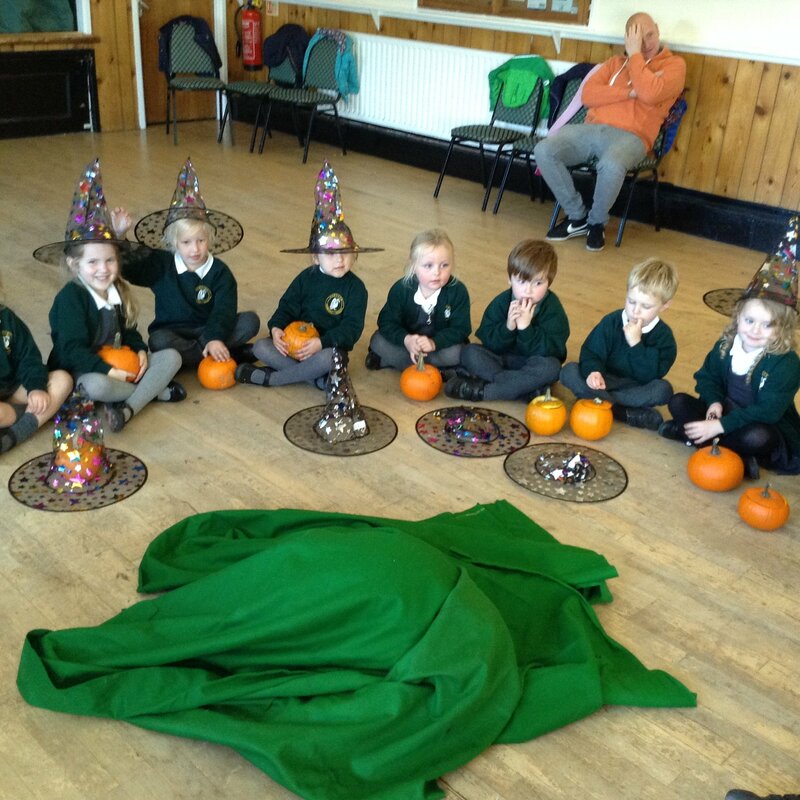 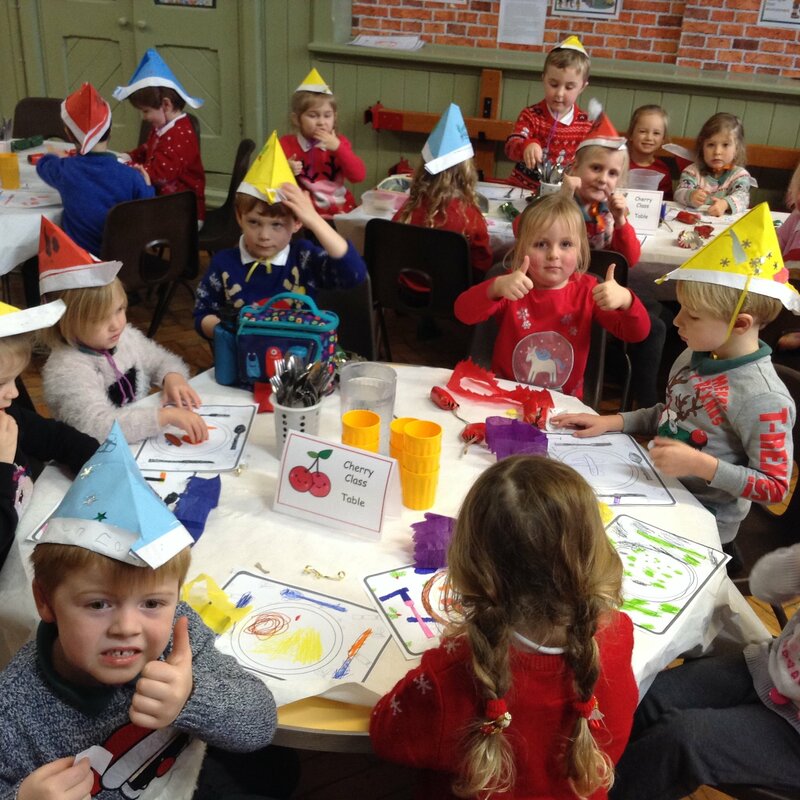 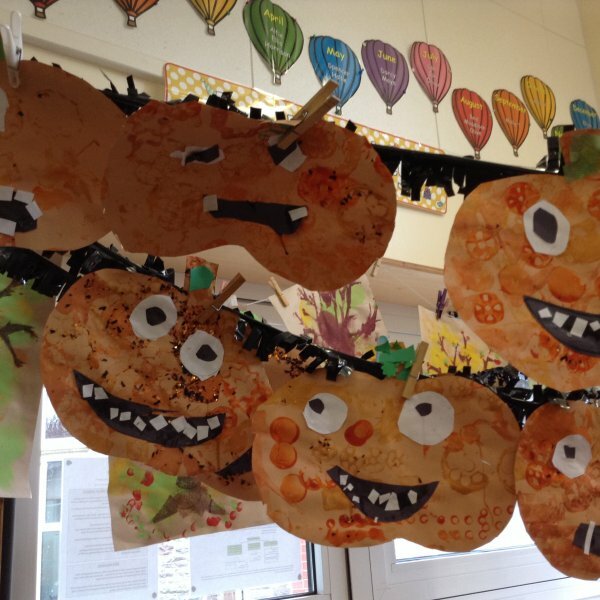 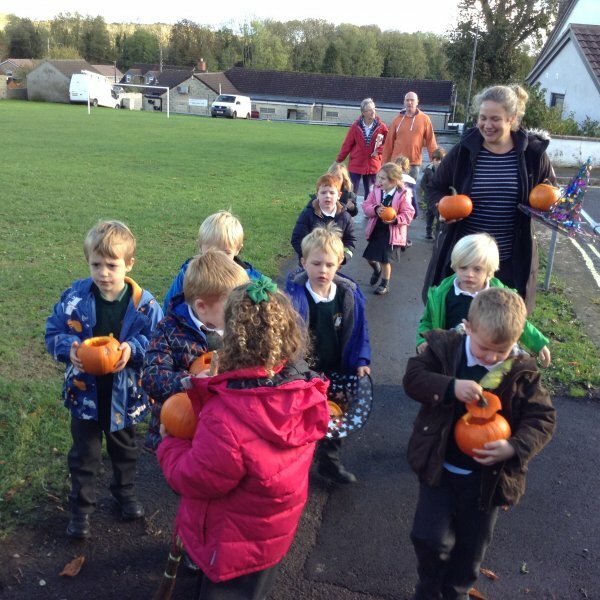 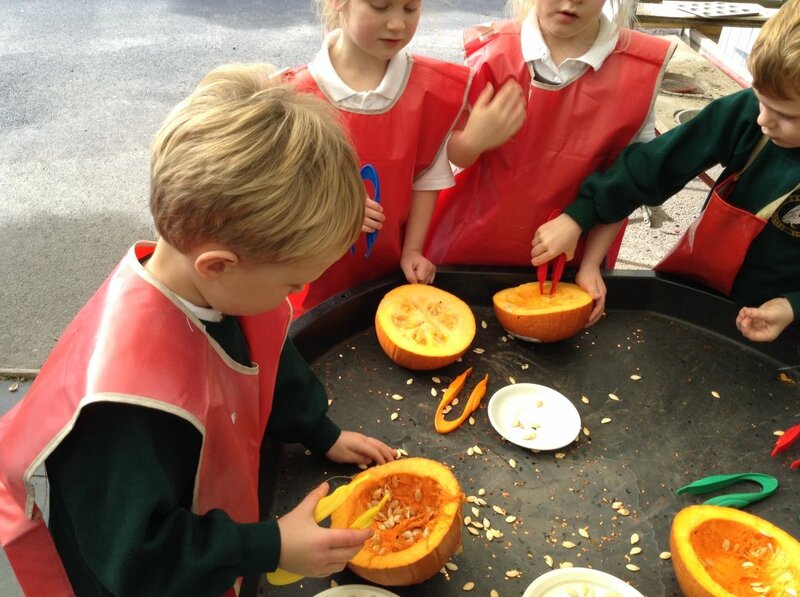 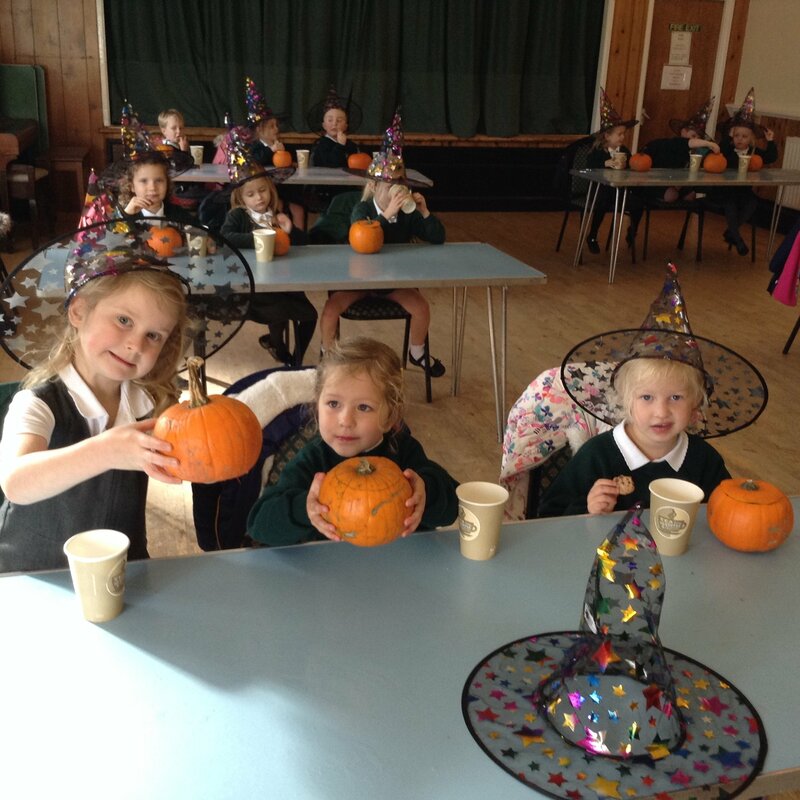 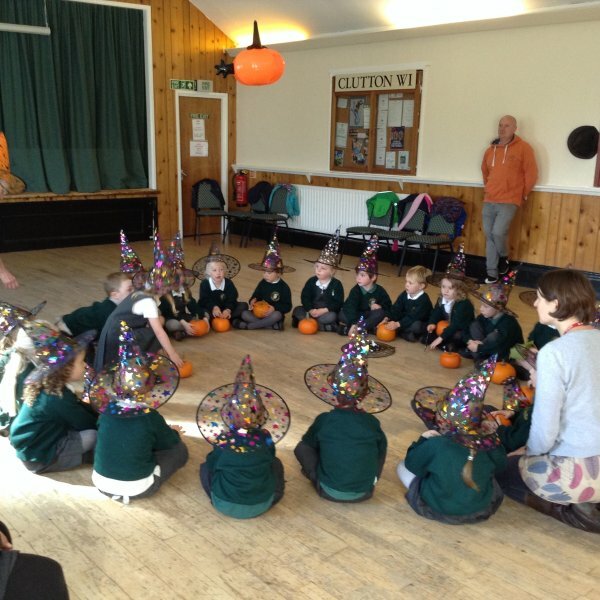 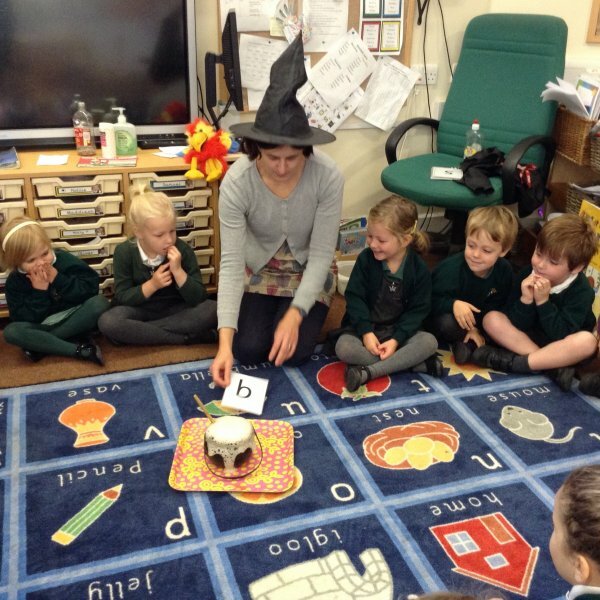 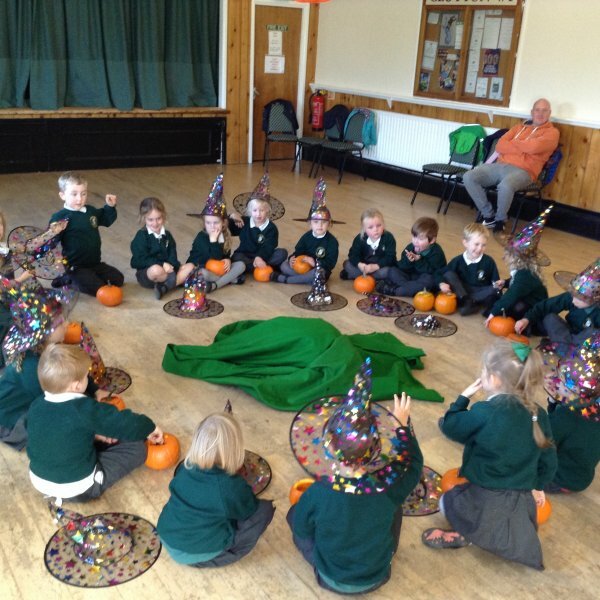 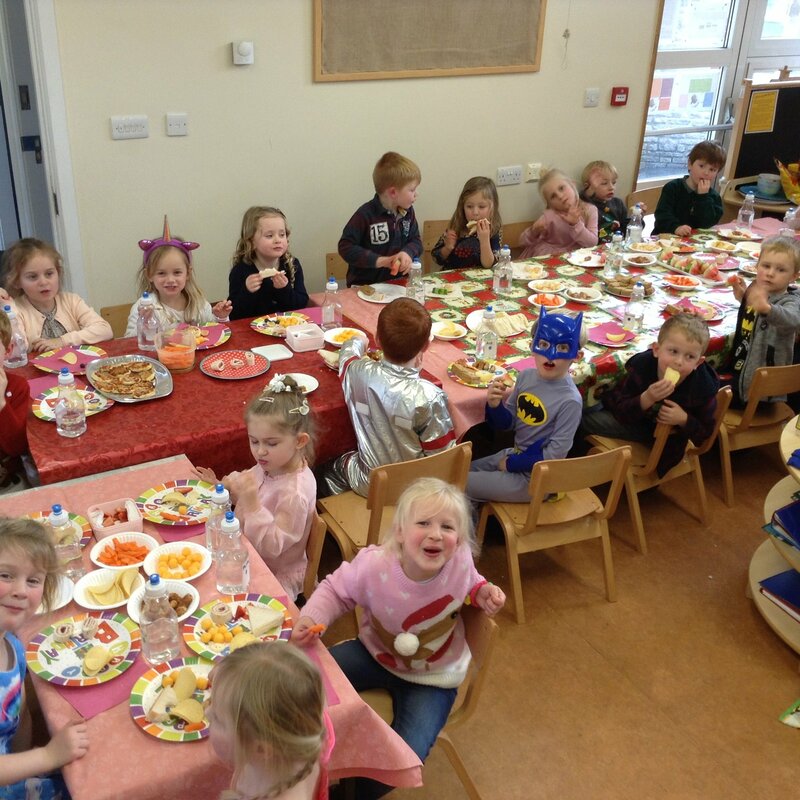 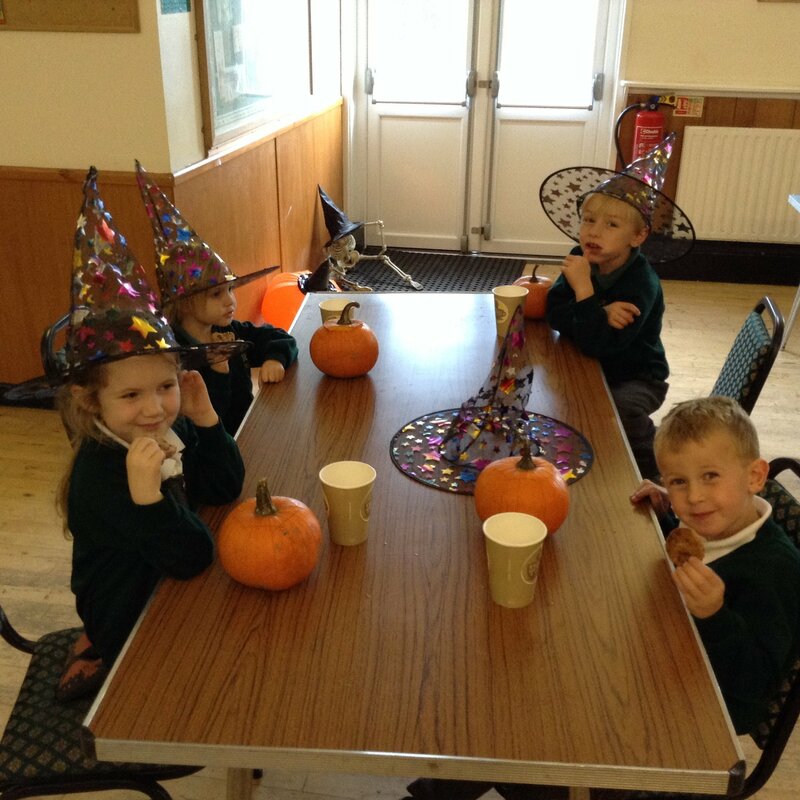 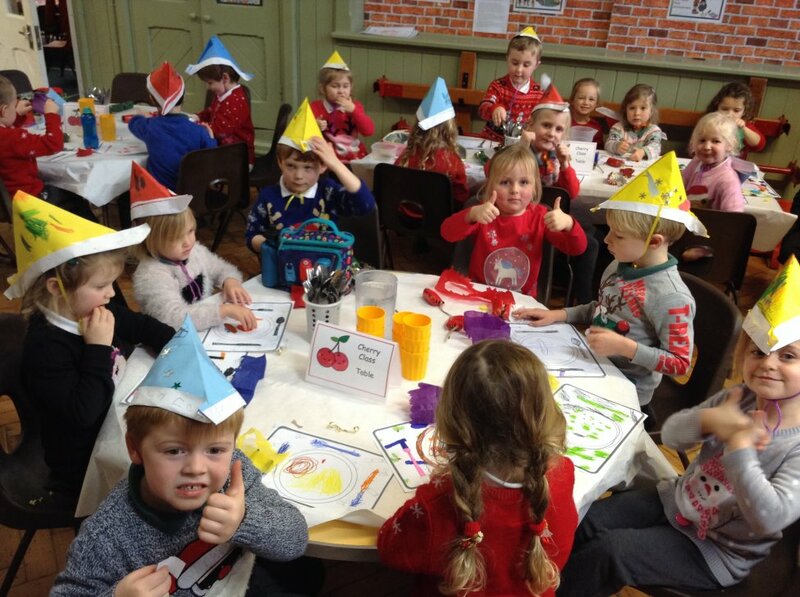 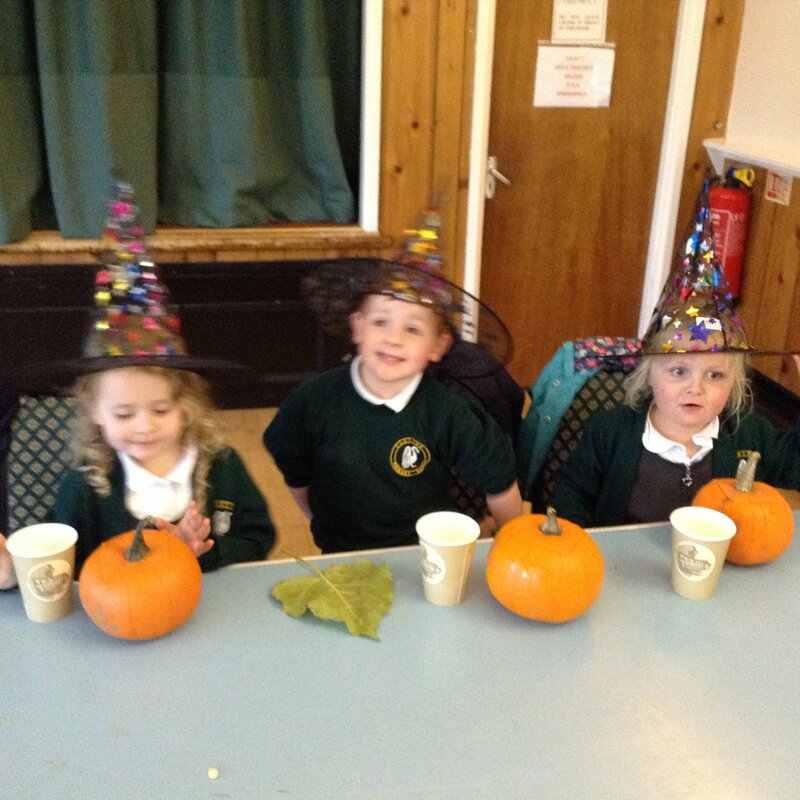 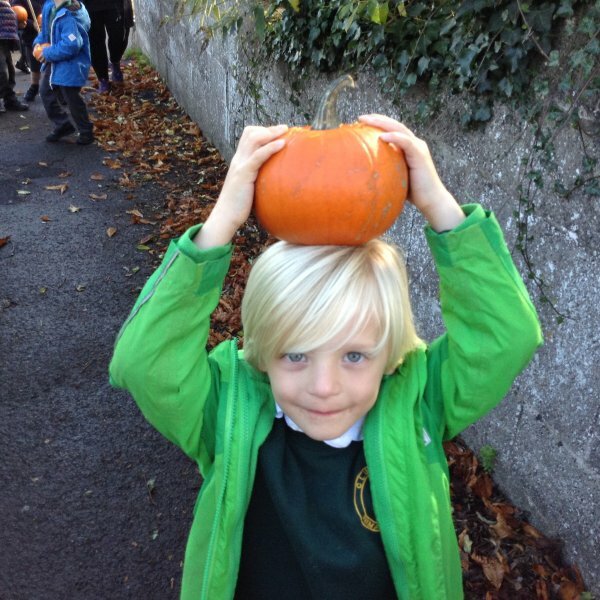 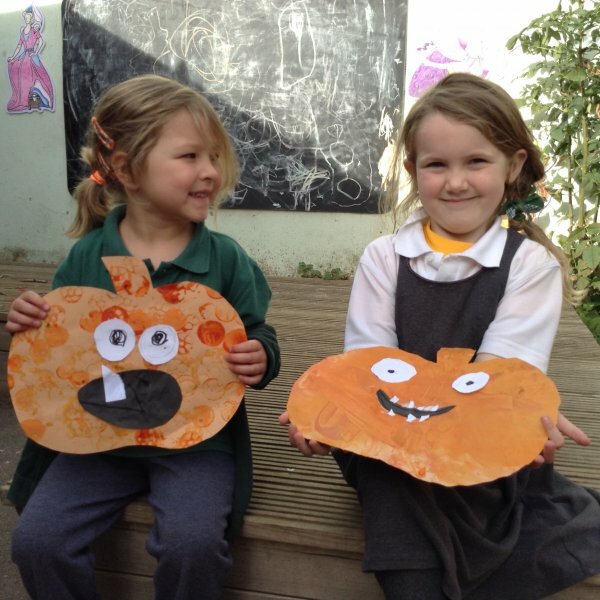 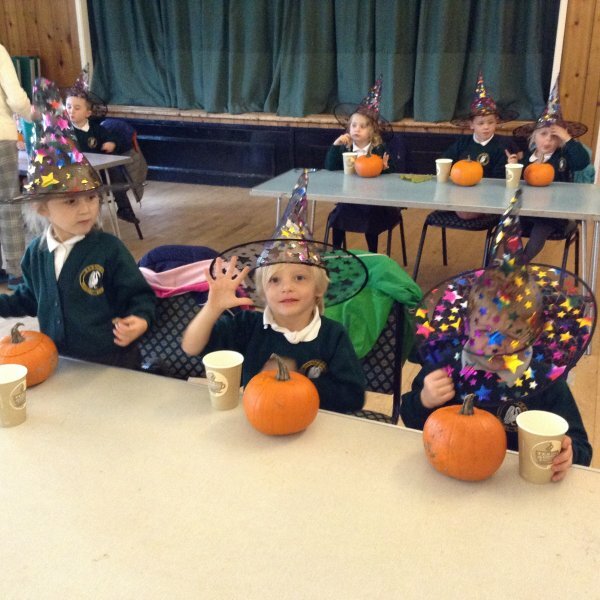 We used our maths skills to make jelly, learnt the 'b' sound with a rather scary bubbling brew, learnt the rhyme '5 little pumpkins' with Mrs Morris, enjoyed role-playing as witches and wizards, made collage pumpkins and witches hats and then finished the week with pumpkin carving at the village hall. 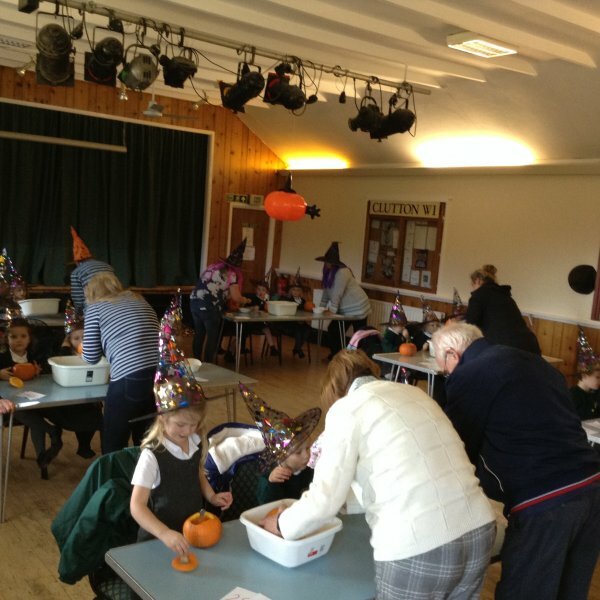 Thank you so much to all the kind volunteers at the village hall who gave us such a happy afternoon. 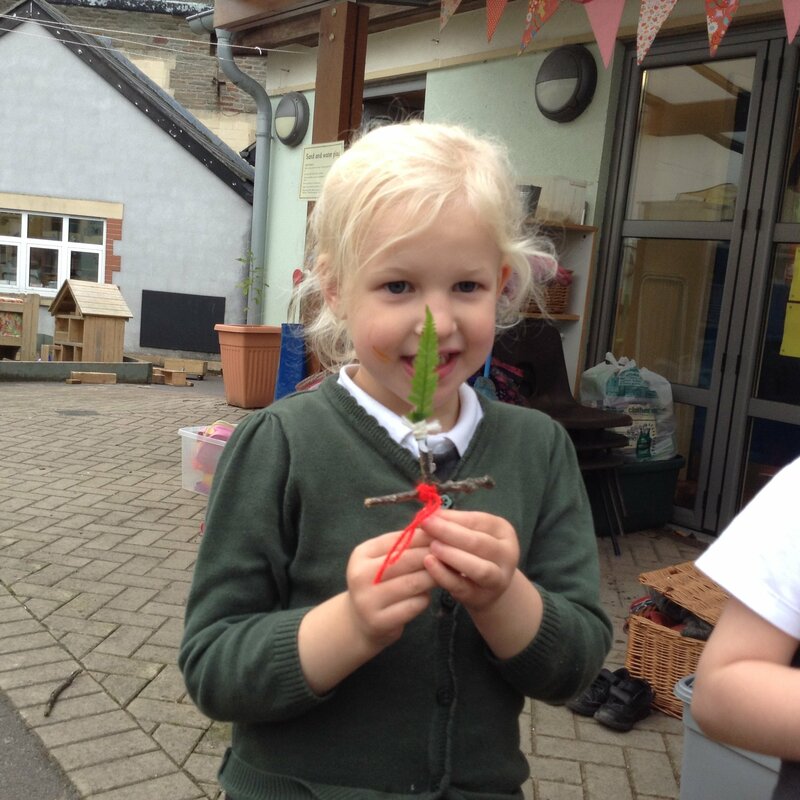 We are so lucky to be part of such a supportive village community. 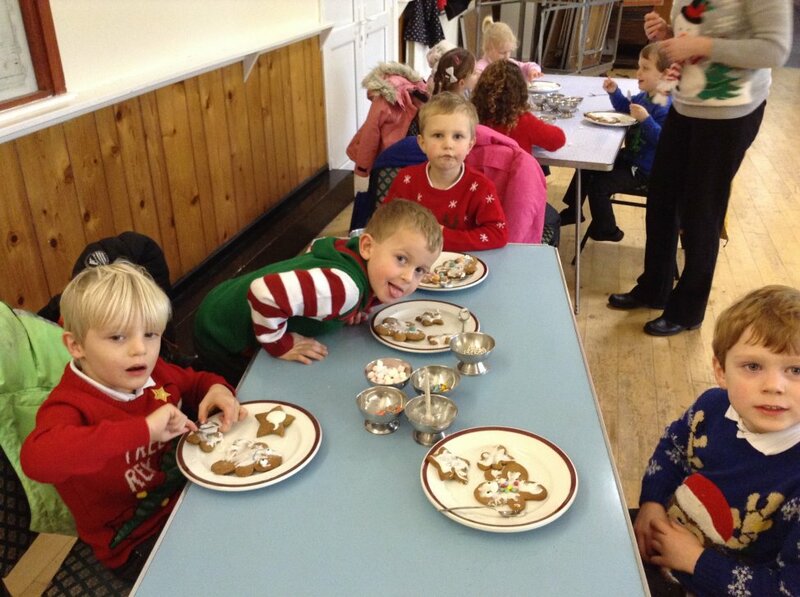 What a lovely end to our first term! 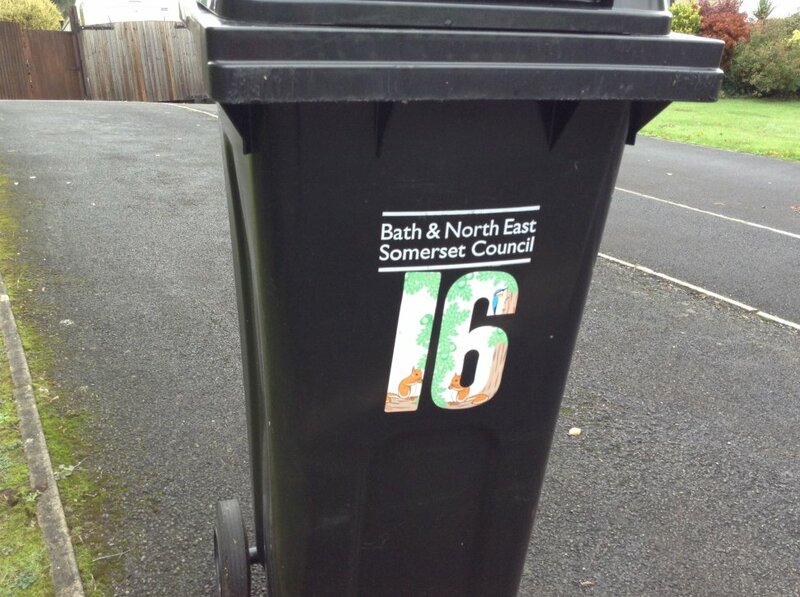 How did we get to Week 7 already? 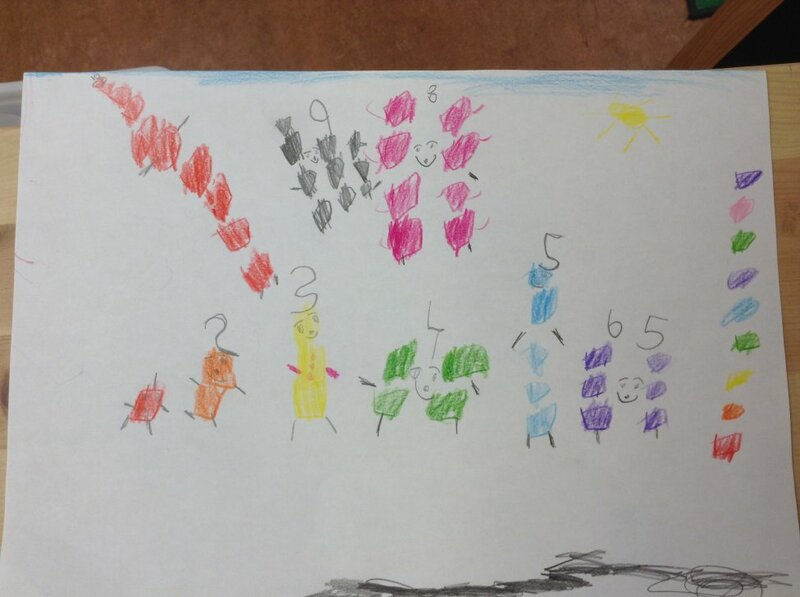 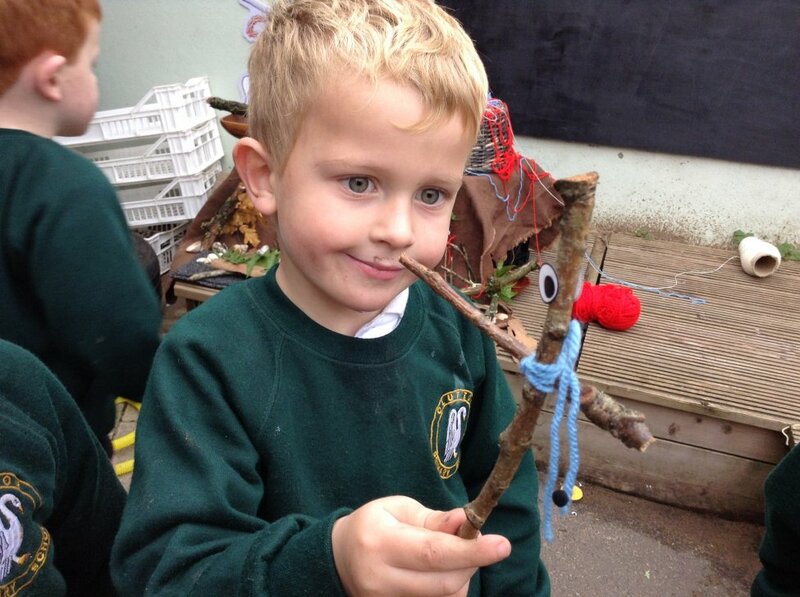 This week was all about Stick Man. 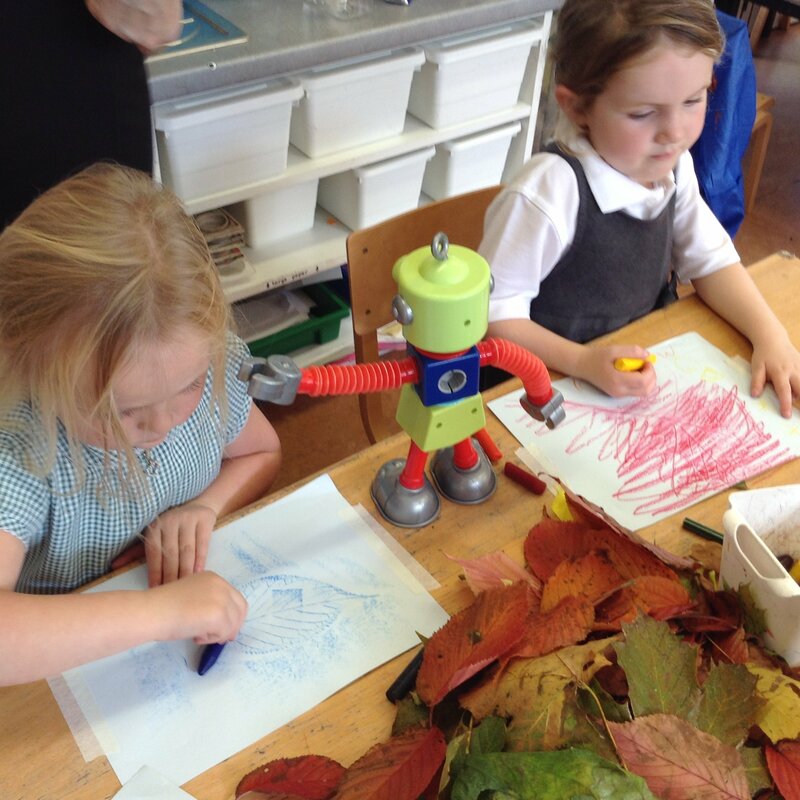 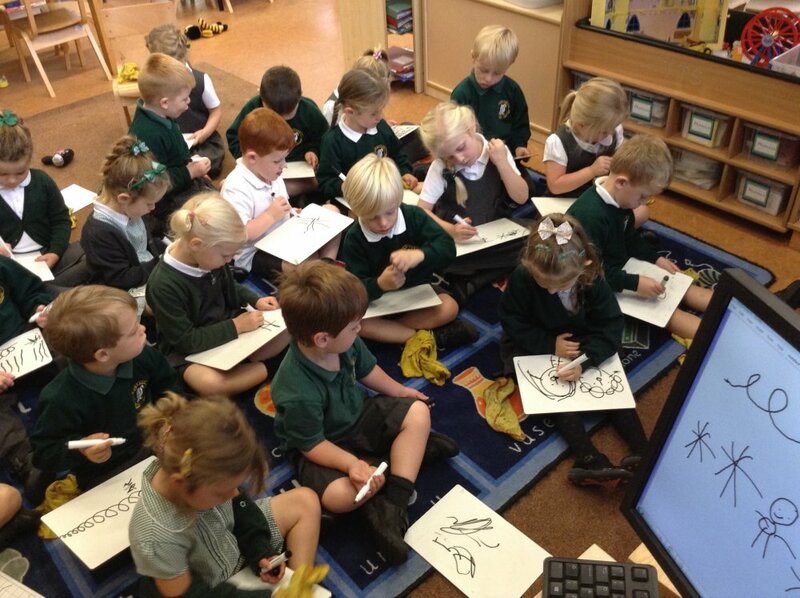 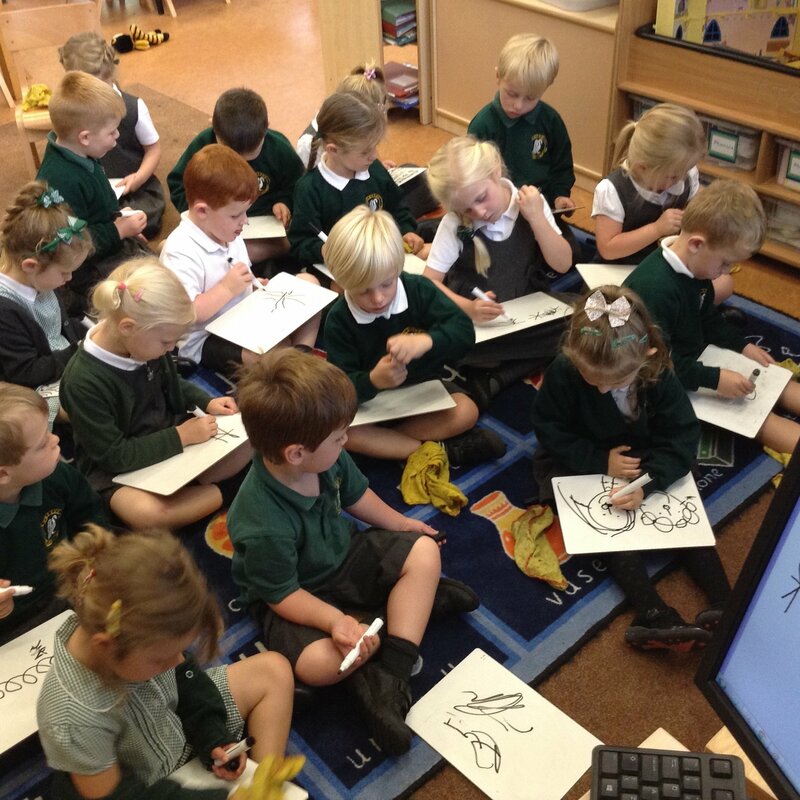 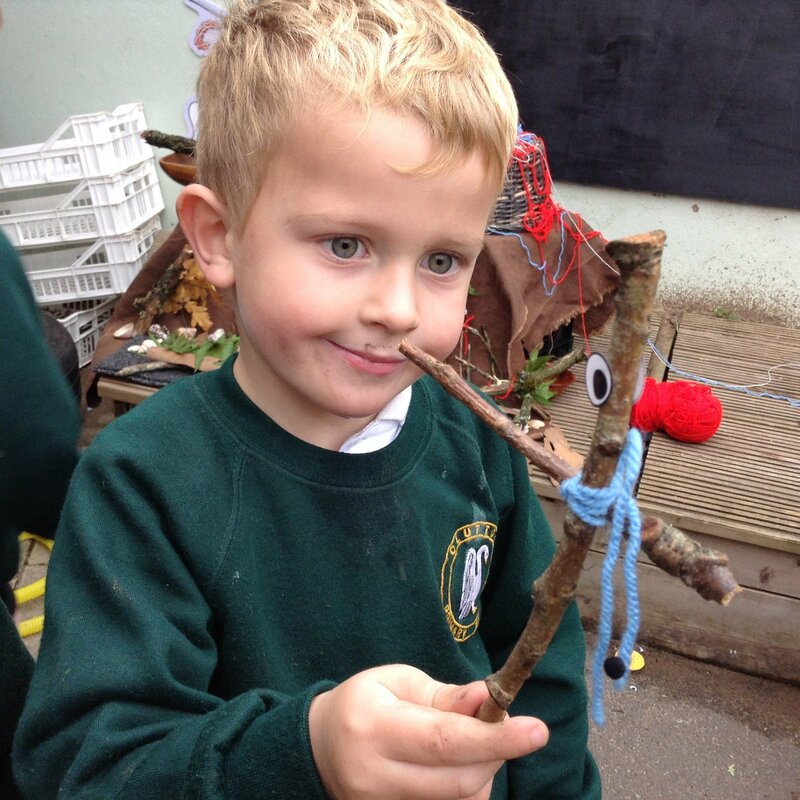 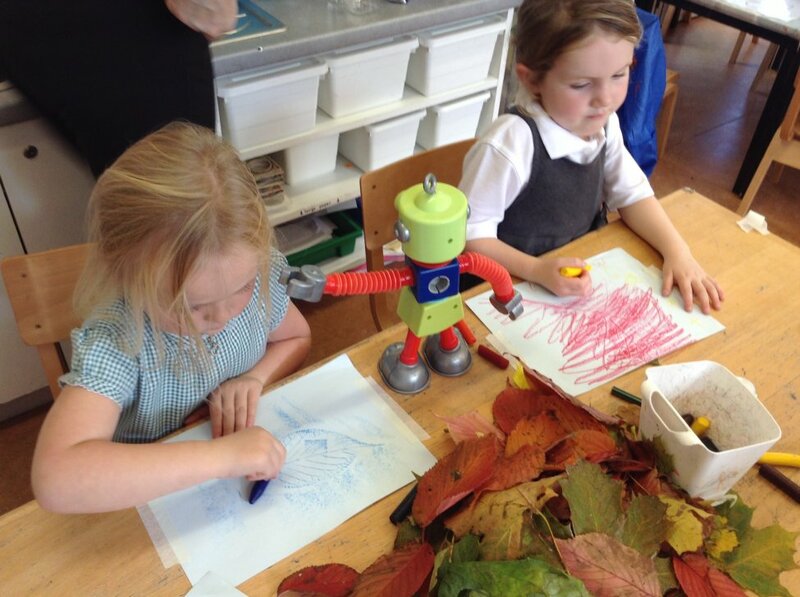 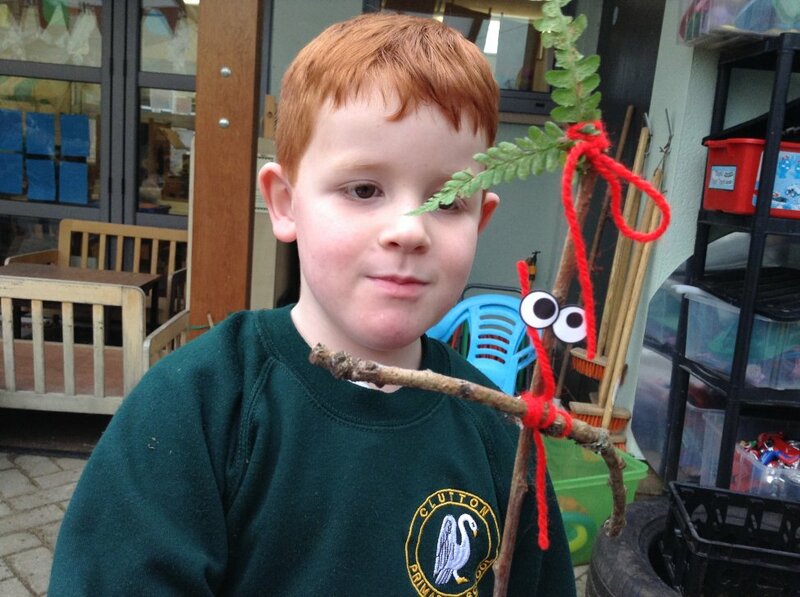 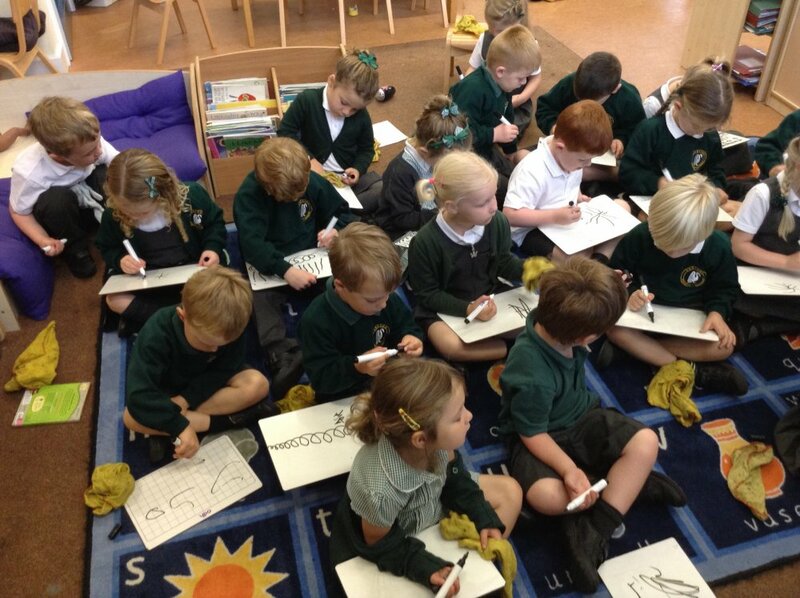 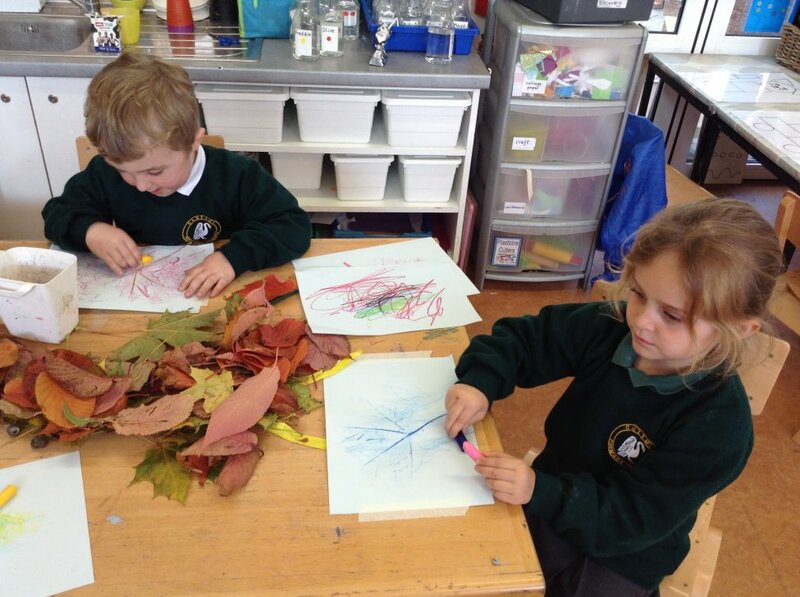 We read the book, made our own Stick Men using sticks we collected on our woodland walk and then drew Stick Man. 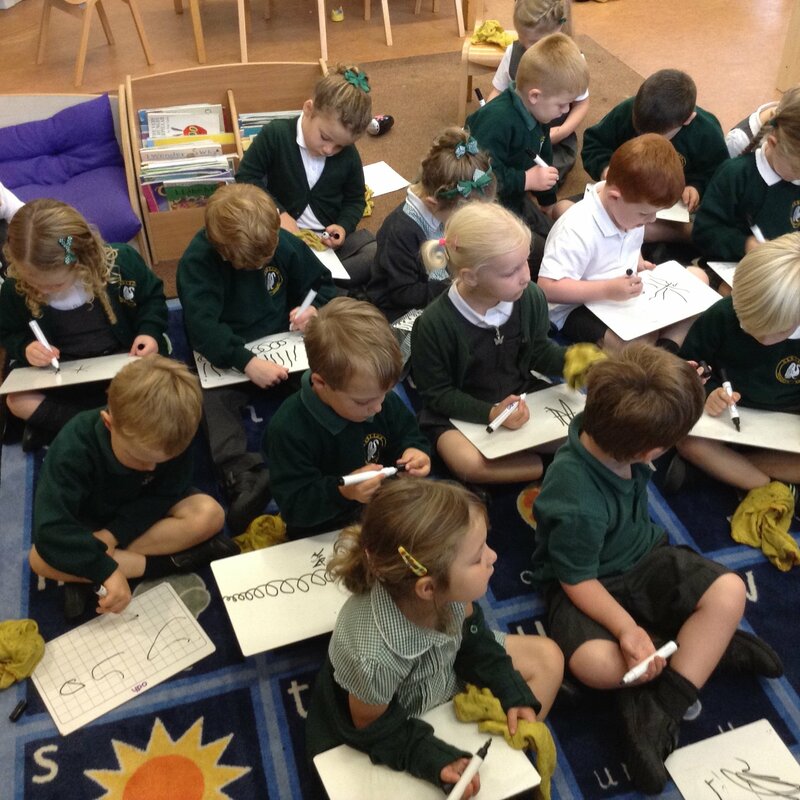 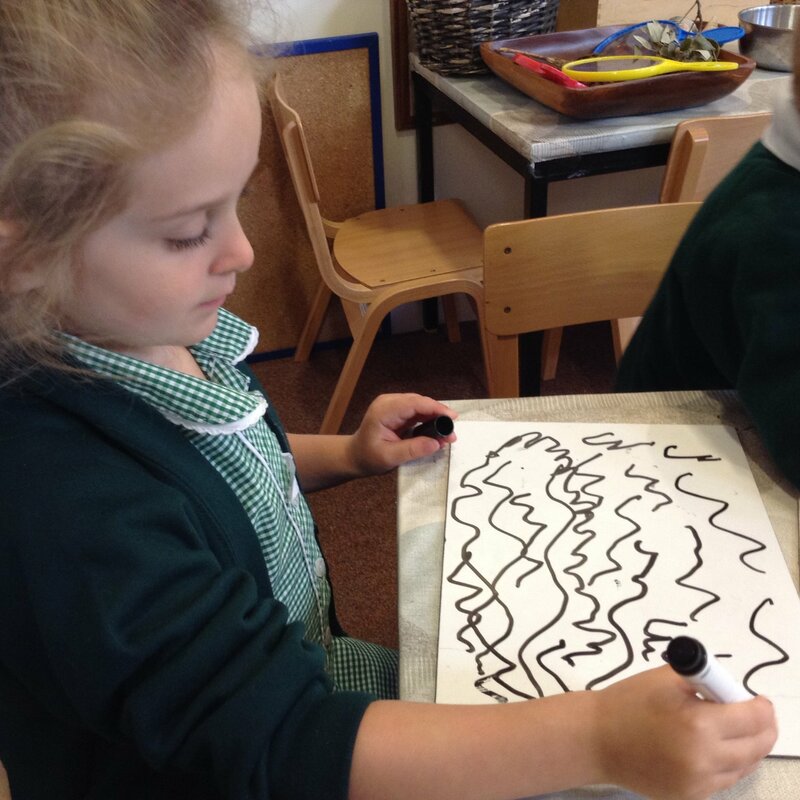 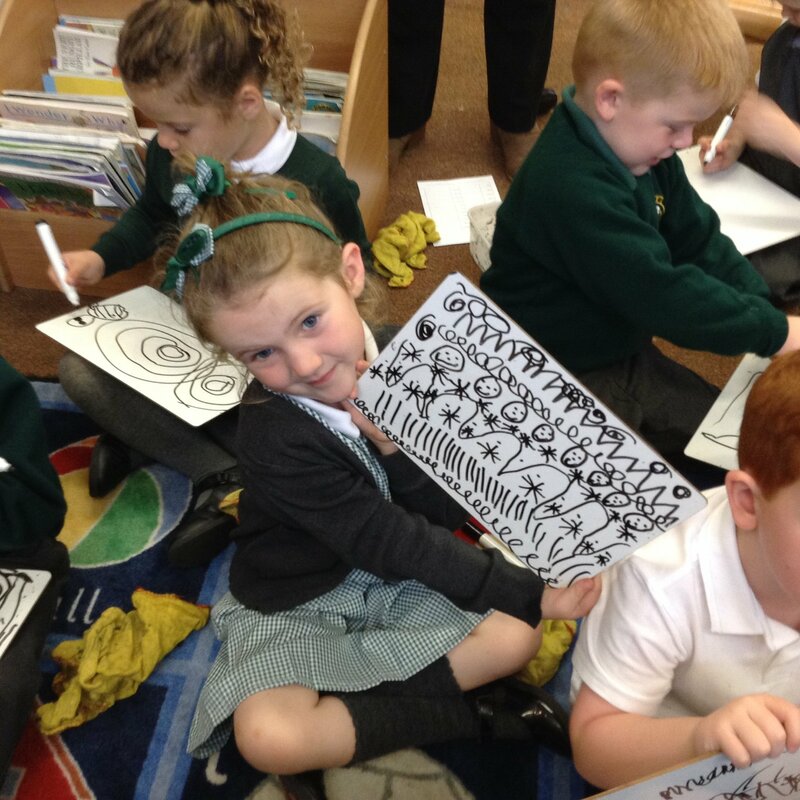 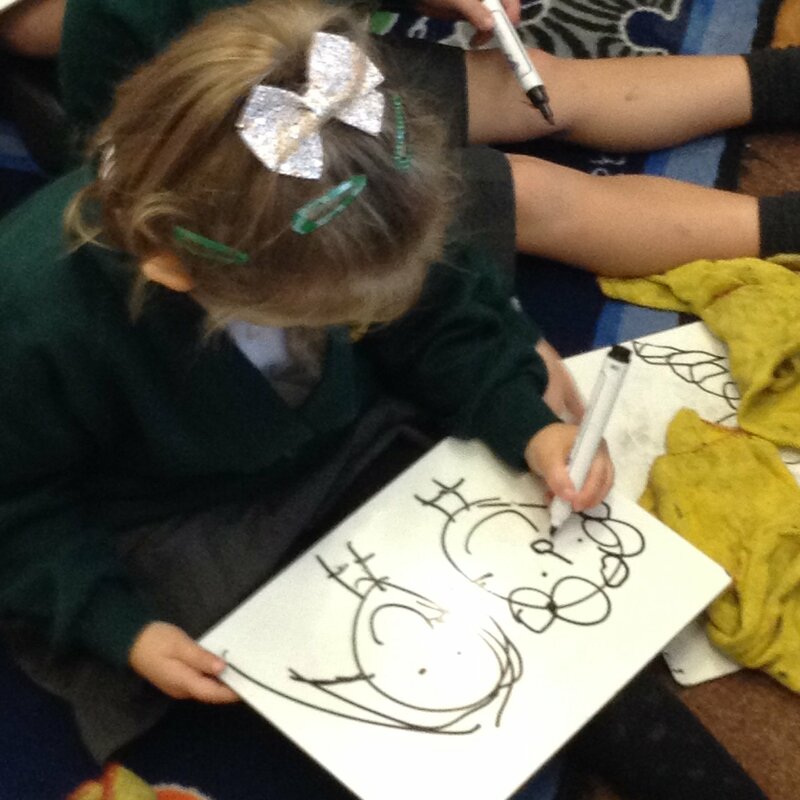 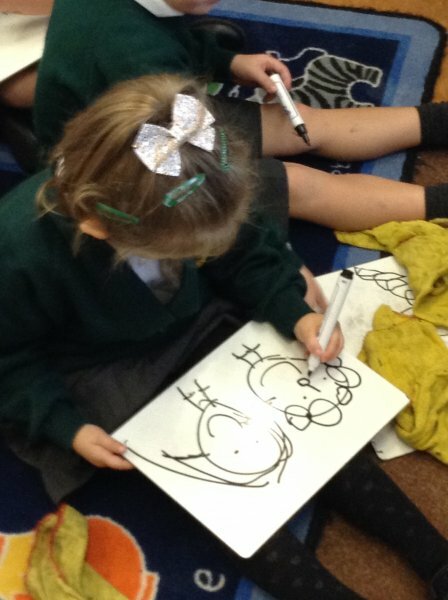 We discovered (much to Mrs P.C's excitement) that we have learnt all the sounds in 'stick man' so we had a go at writing it too, to label our drawings. 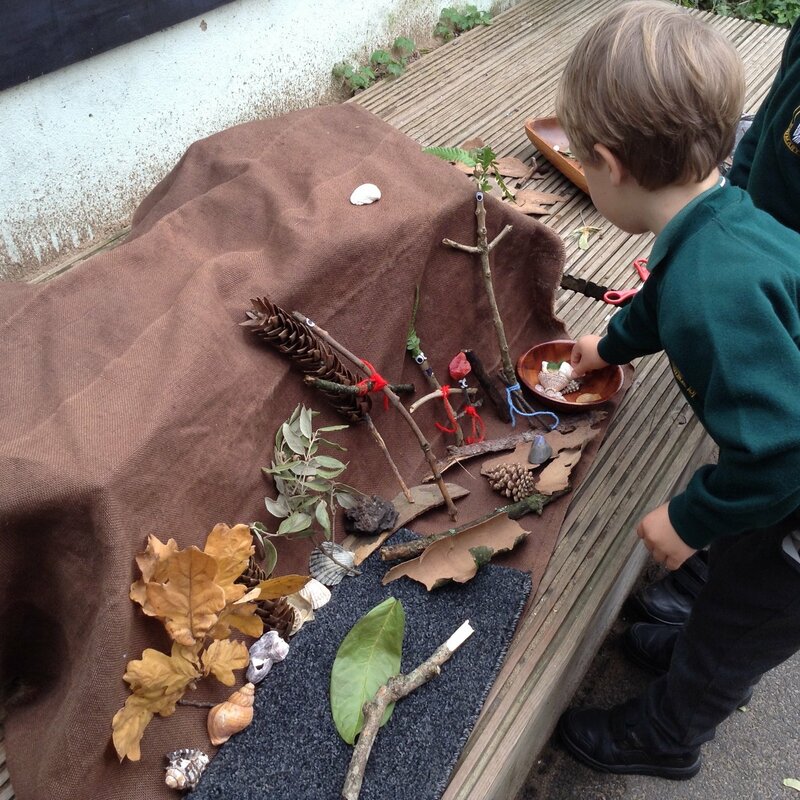 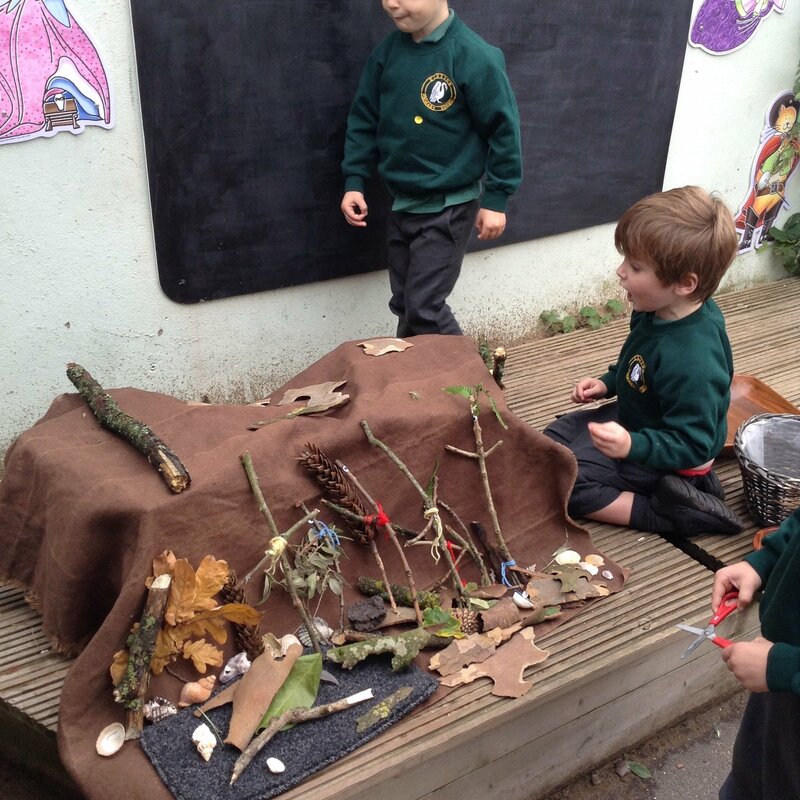 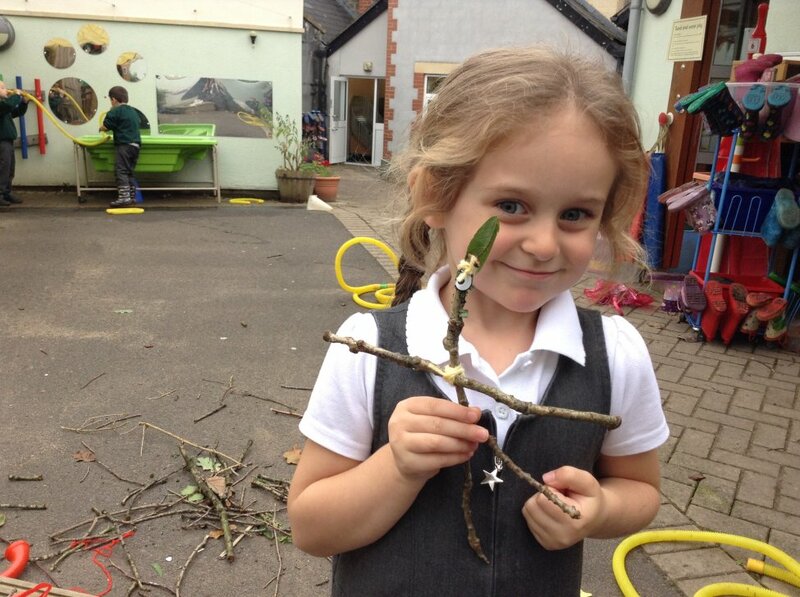 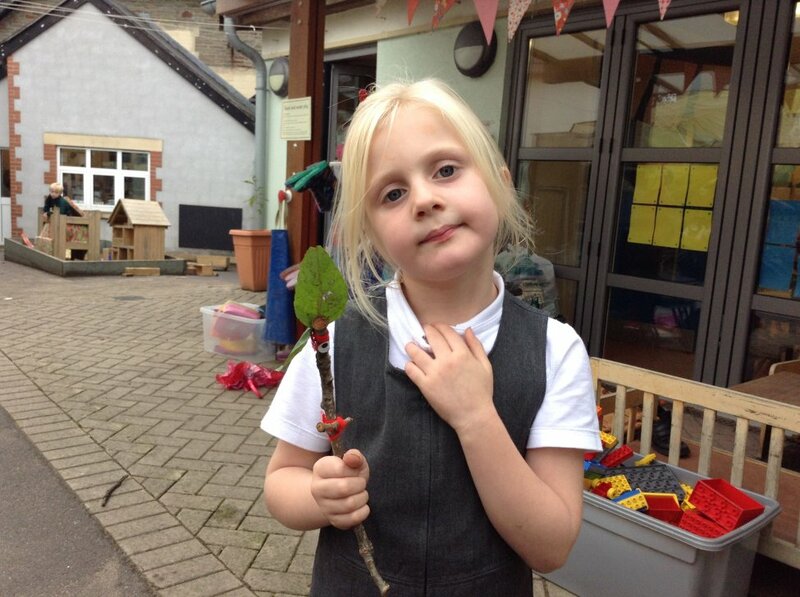 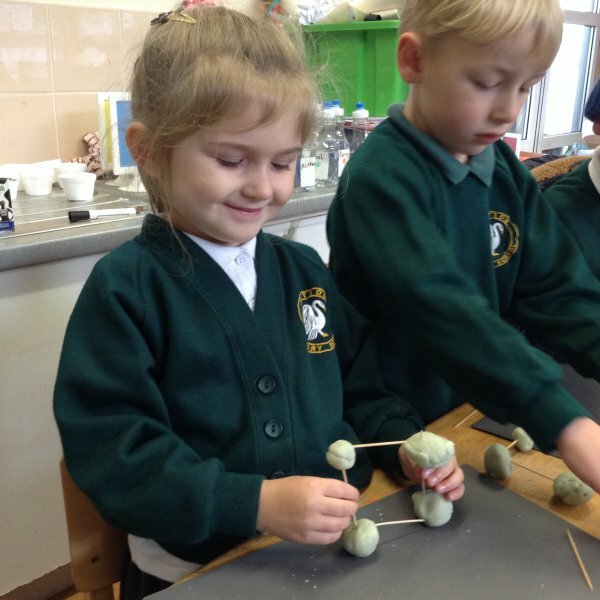 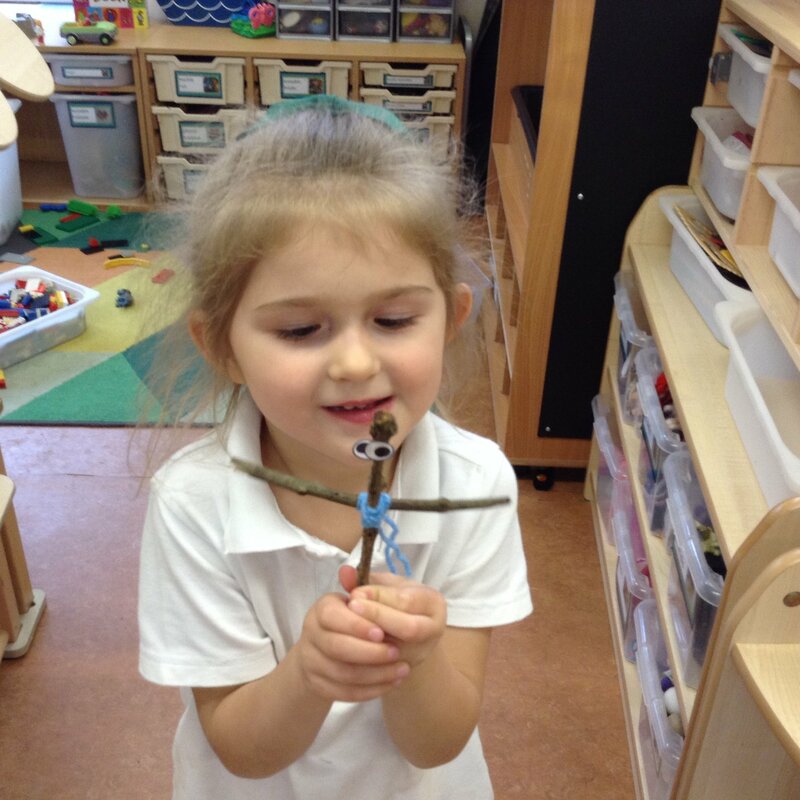 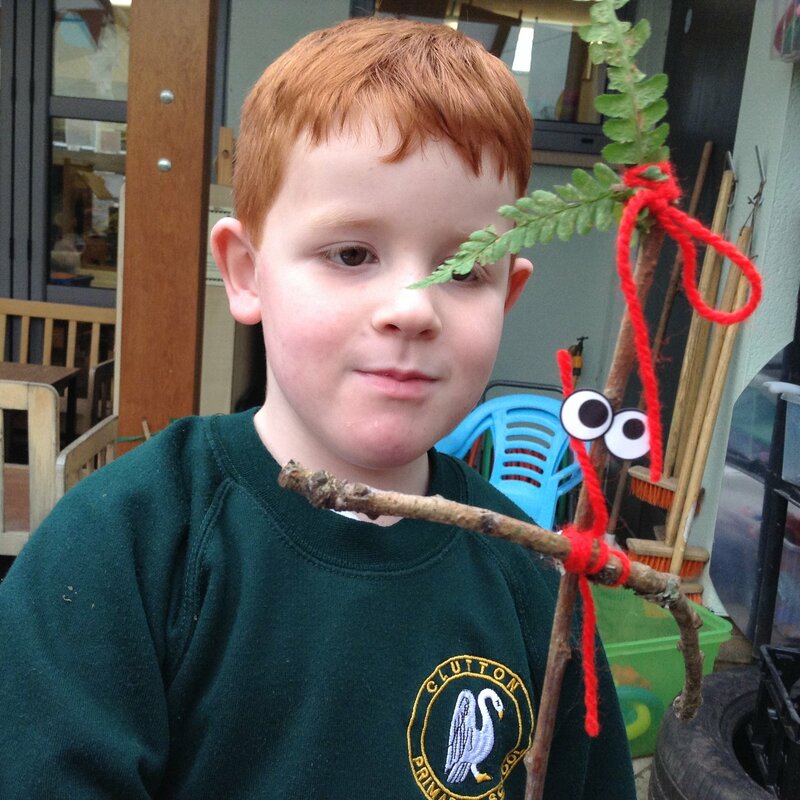 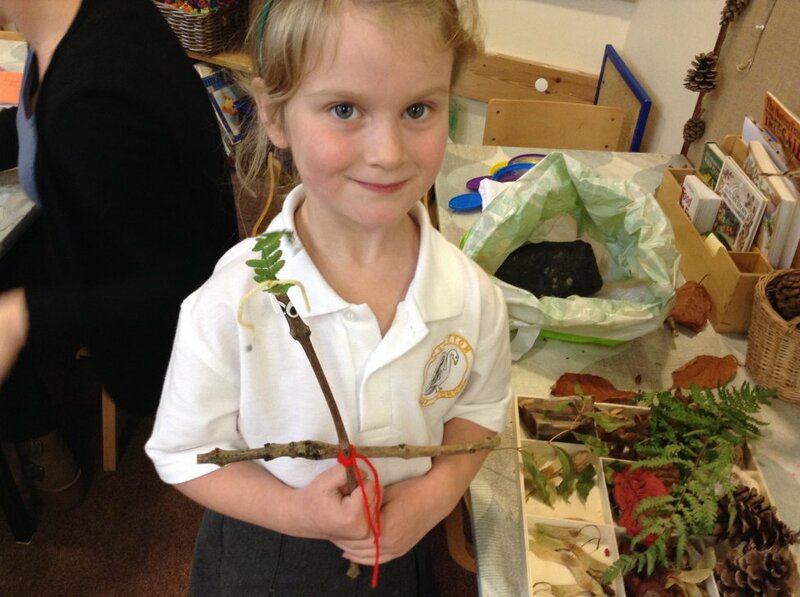 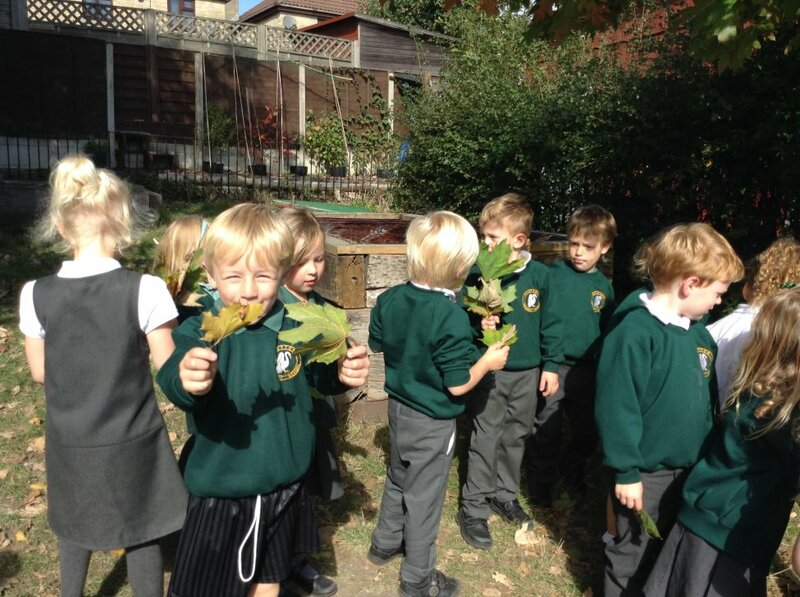 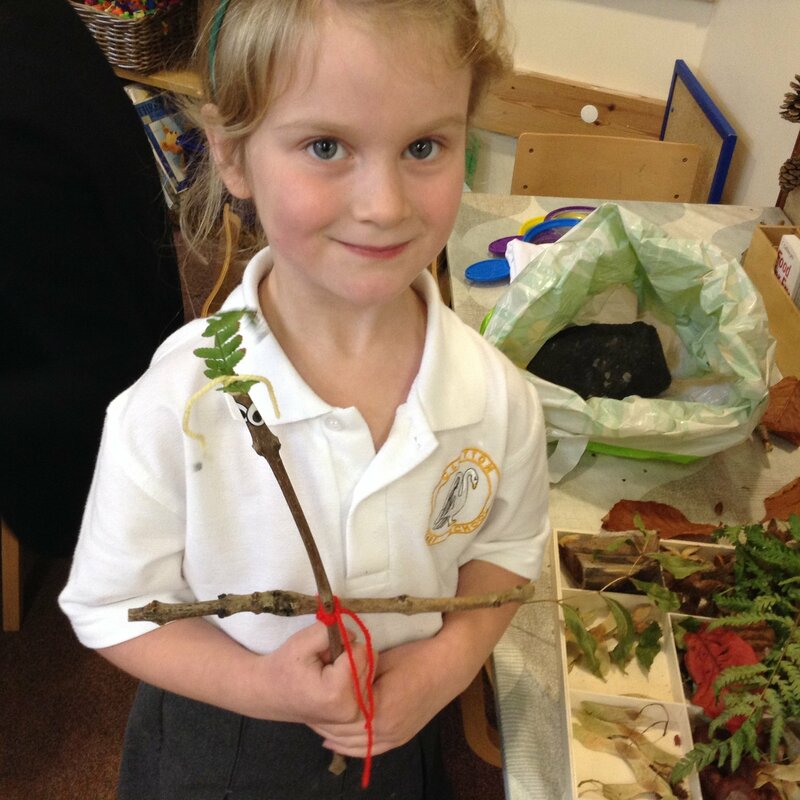 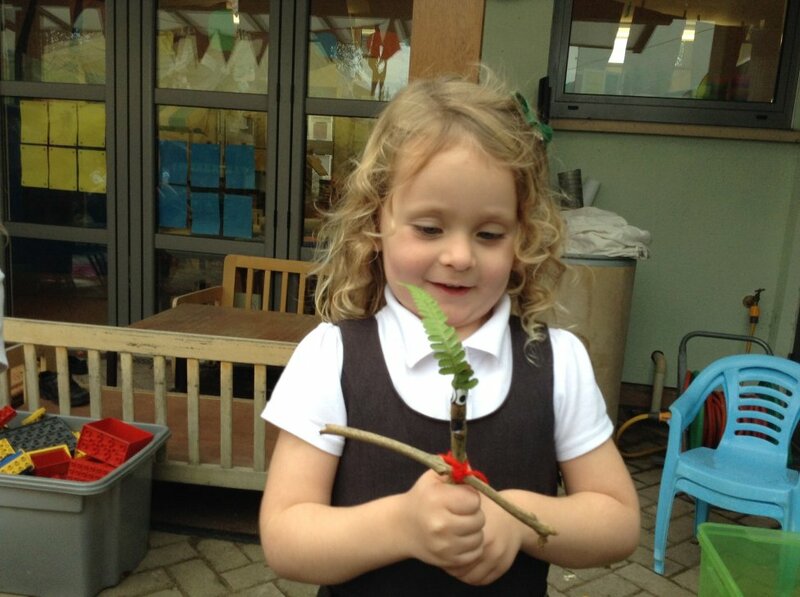 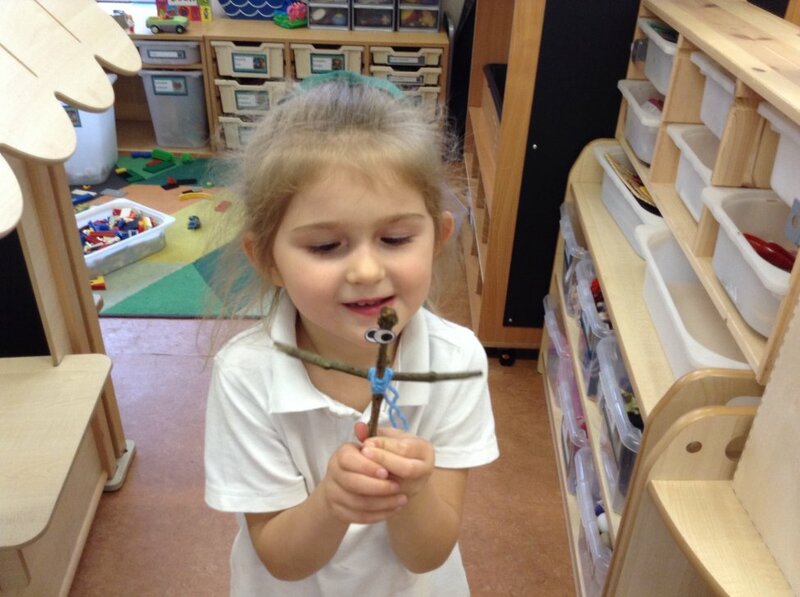 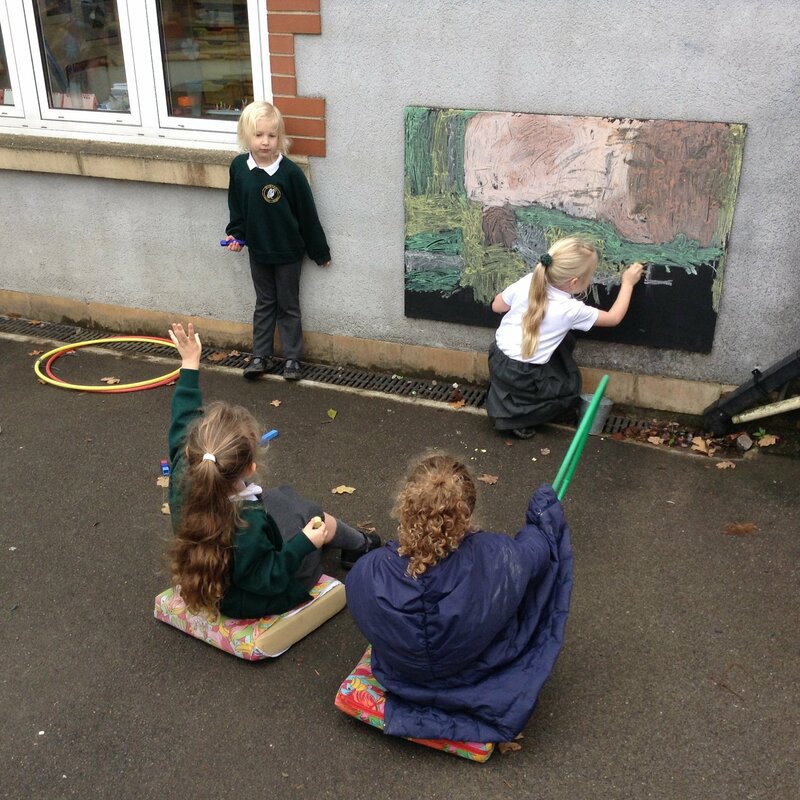 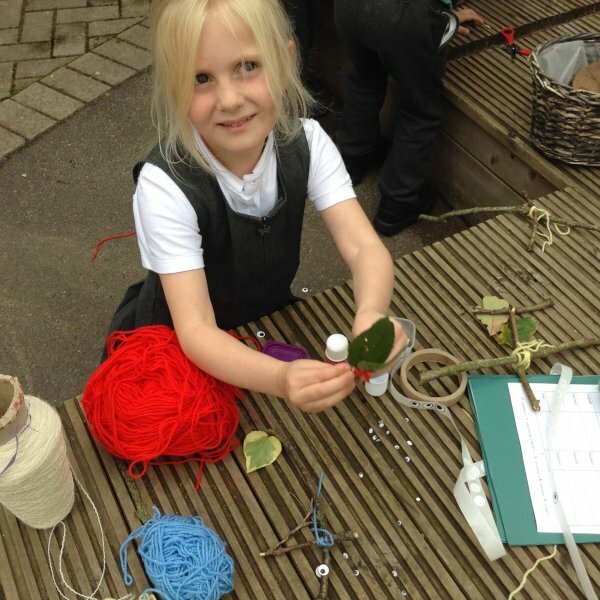 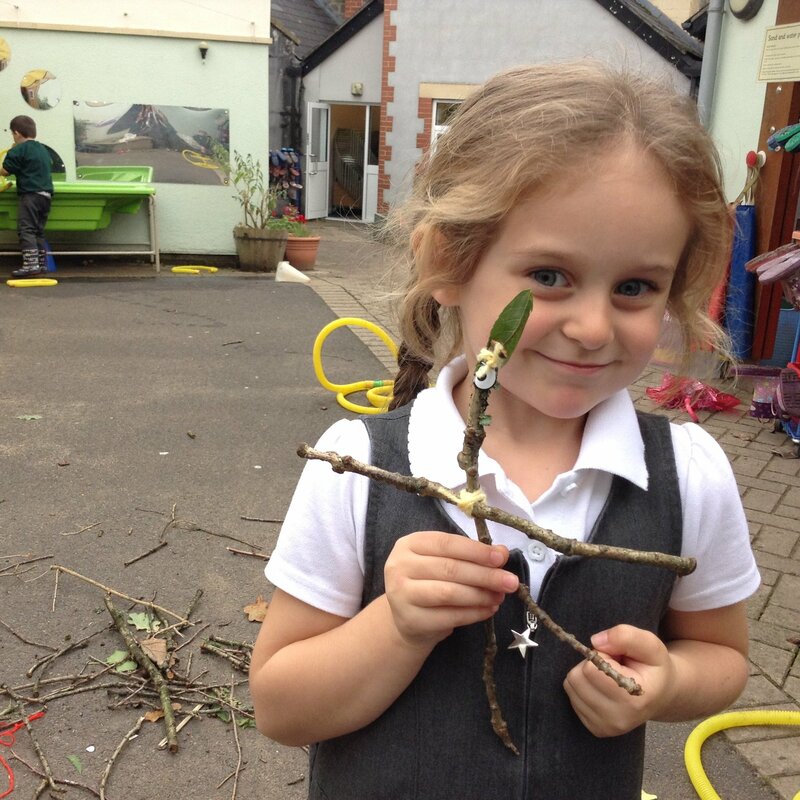 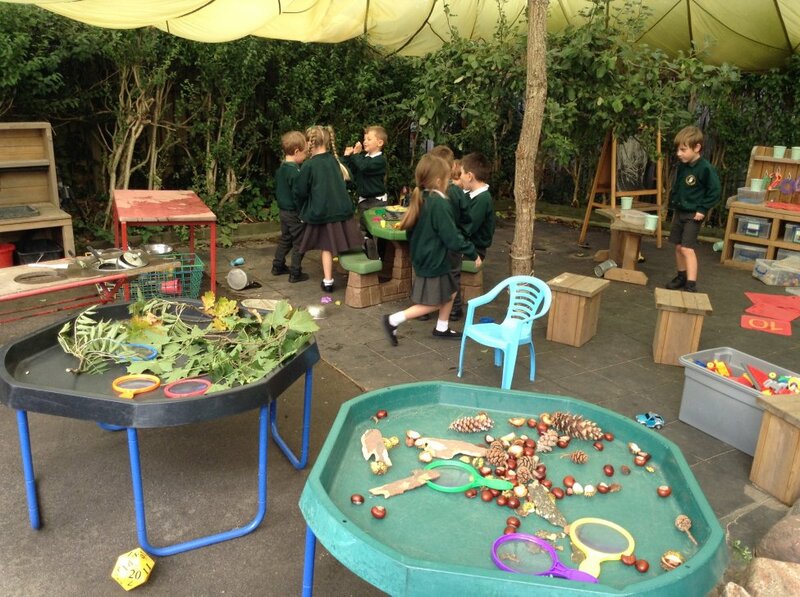 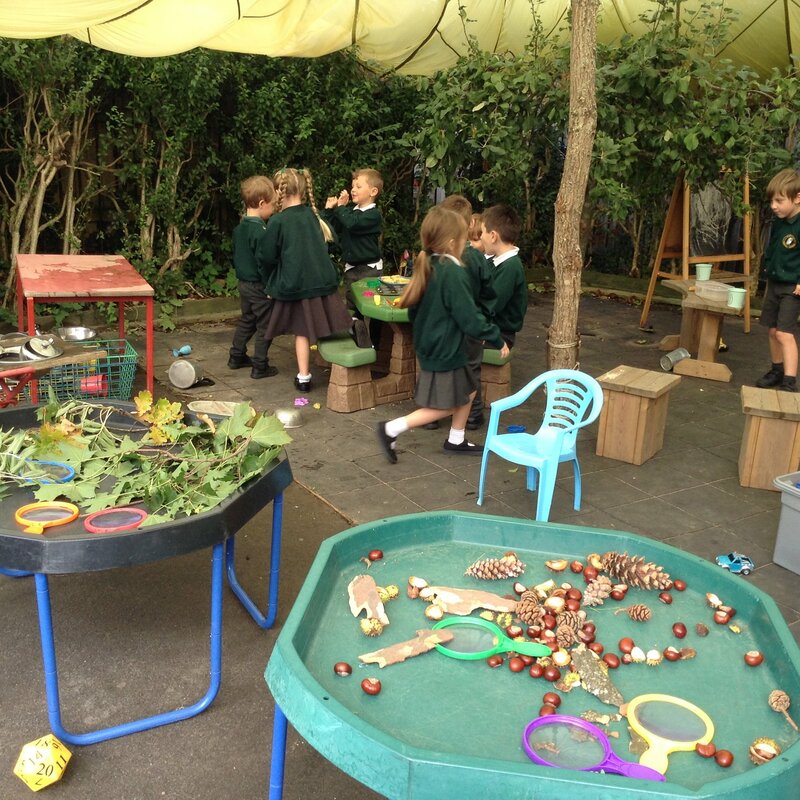 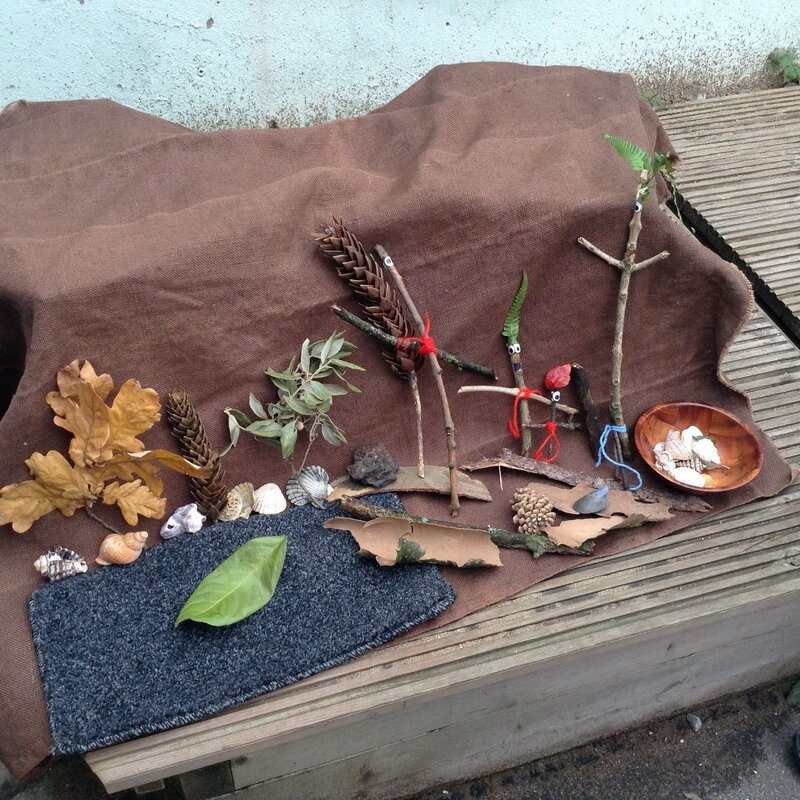 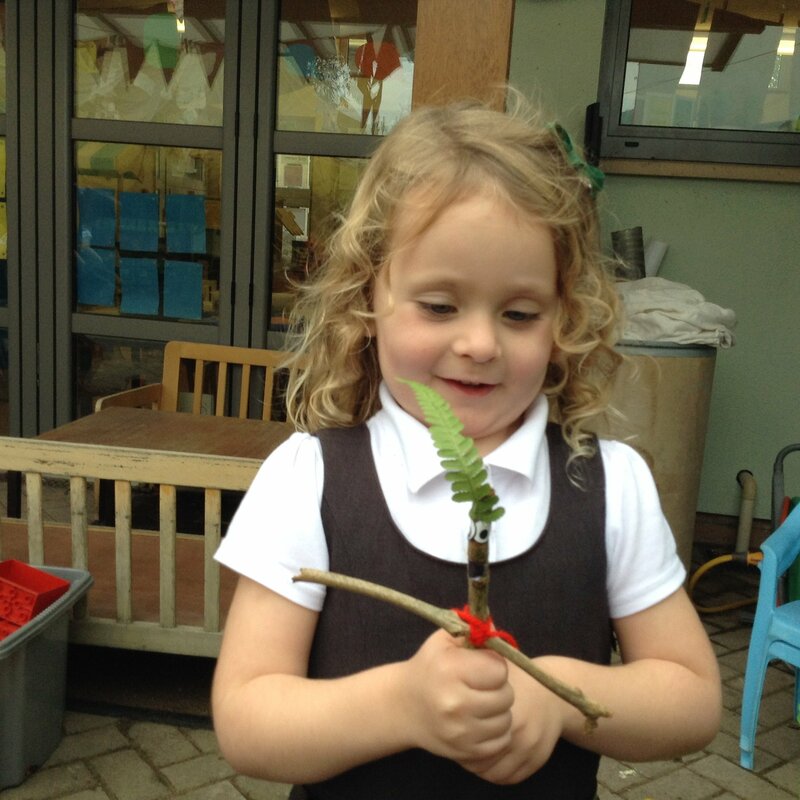 The children came up with the idea of making Stick World outside with things from the nature table. 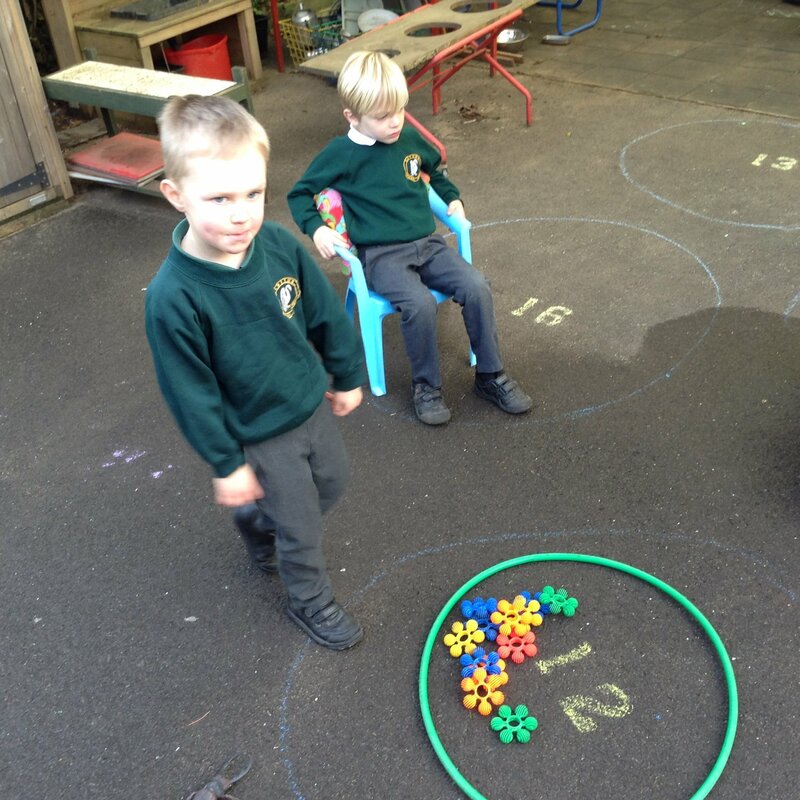 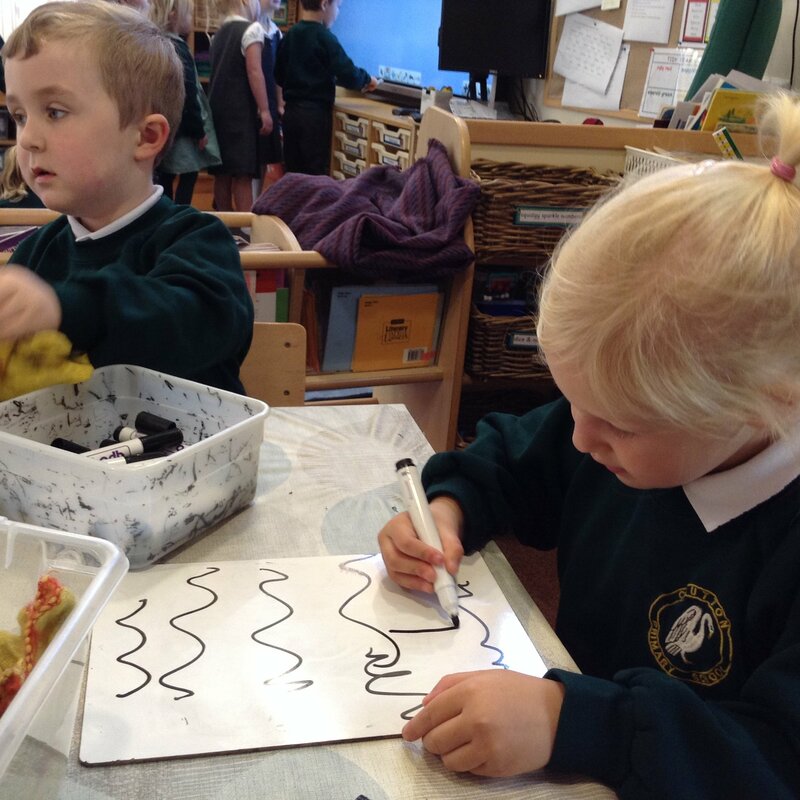 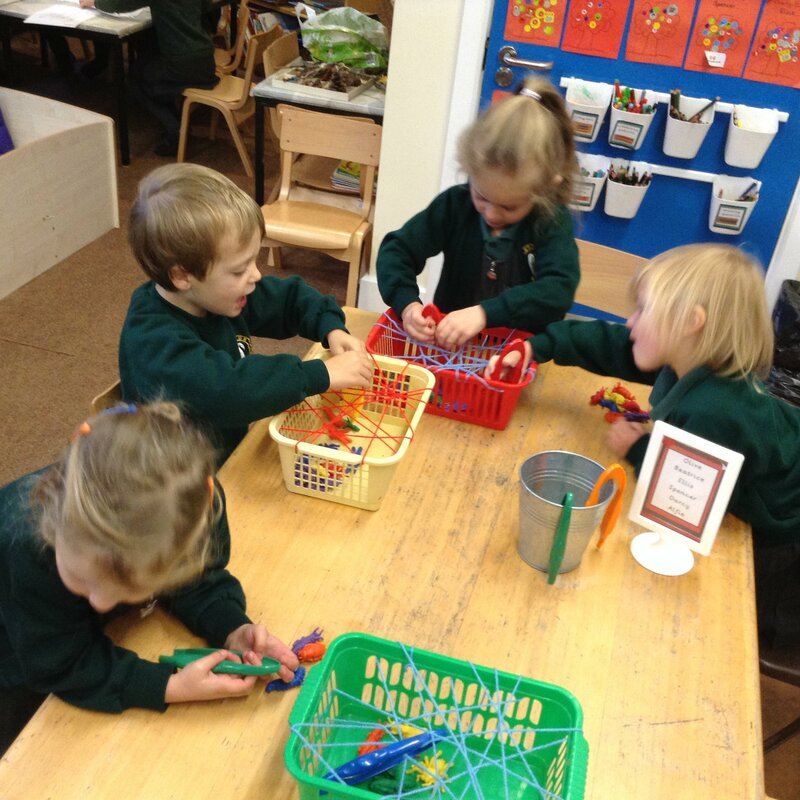 It was lovely to see them playing with their stick creations together. 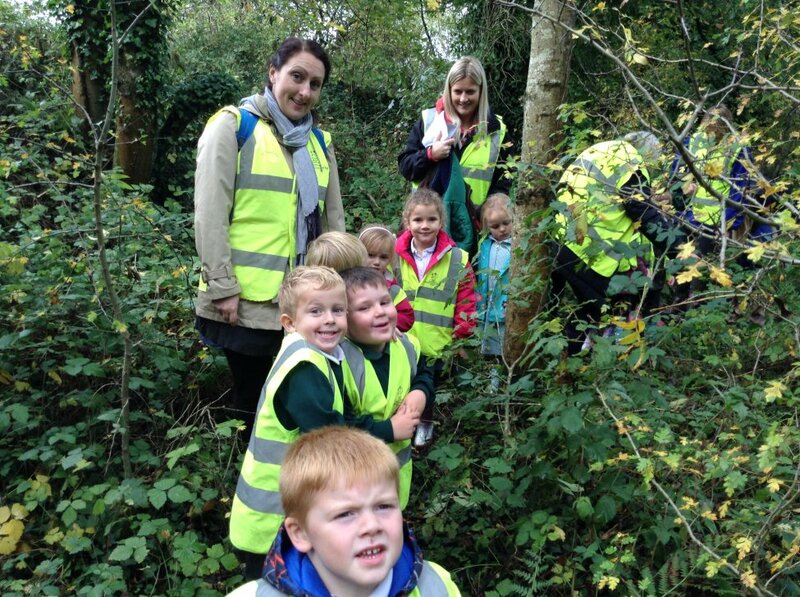 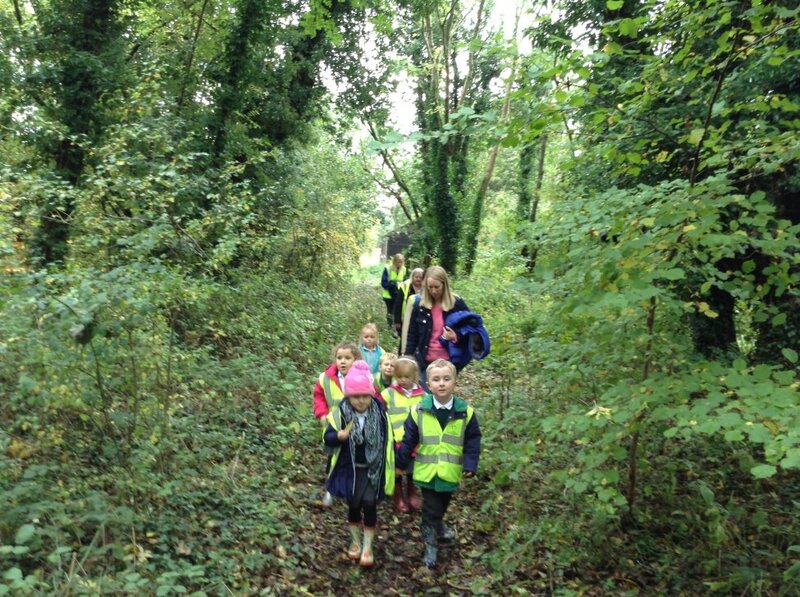 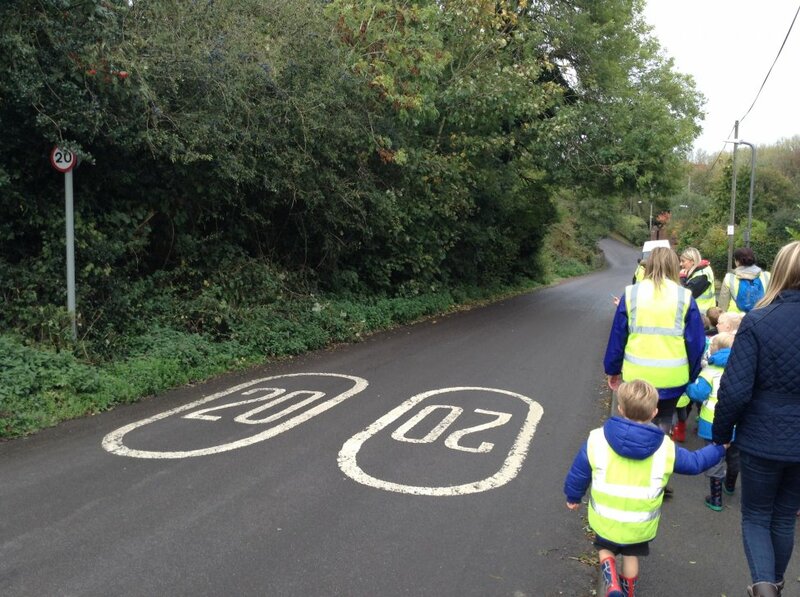 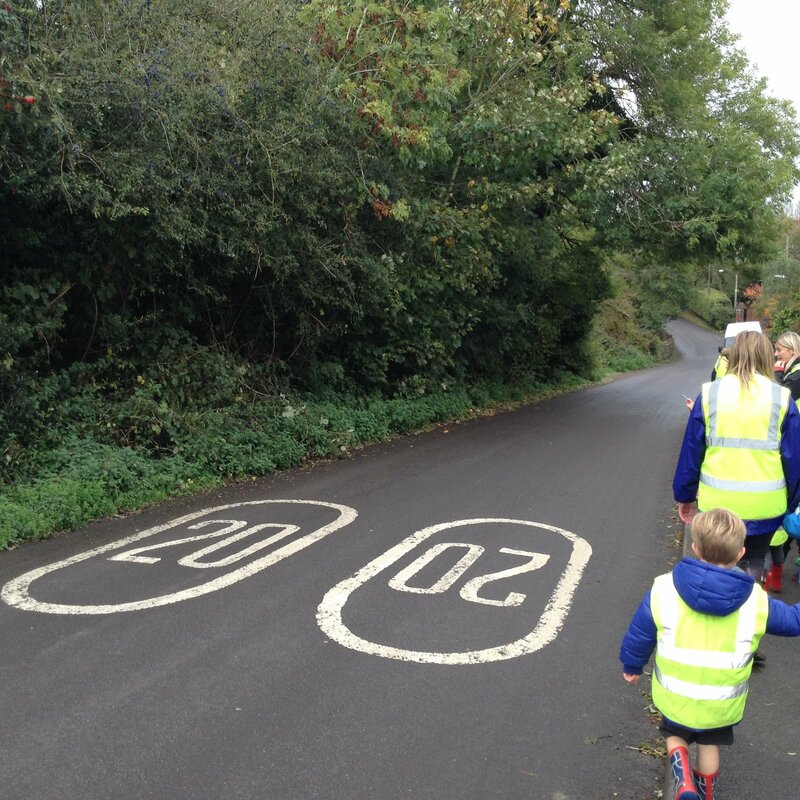 Thank you to all the kind parents who came with us on our walk. 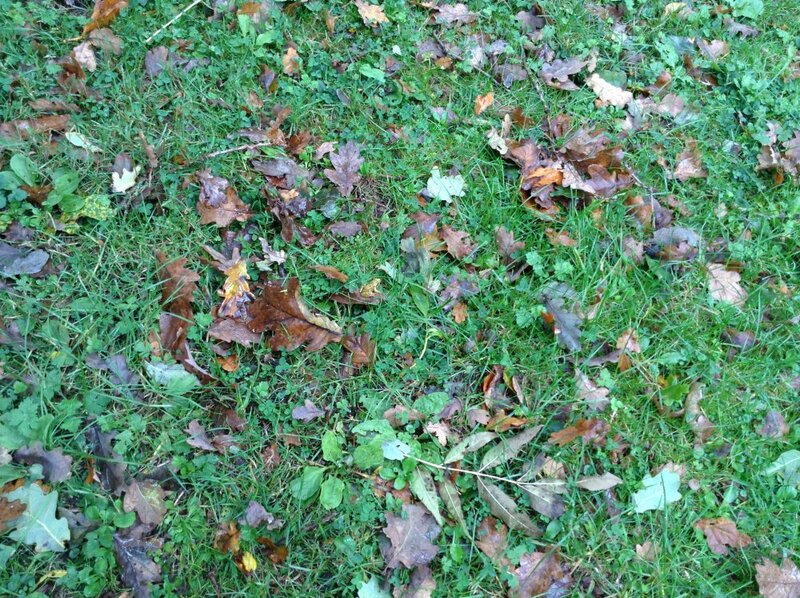 Can you spot the tiny frog in one of the photos? 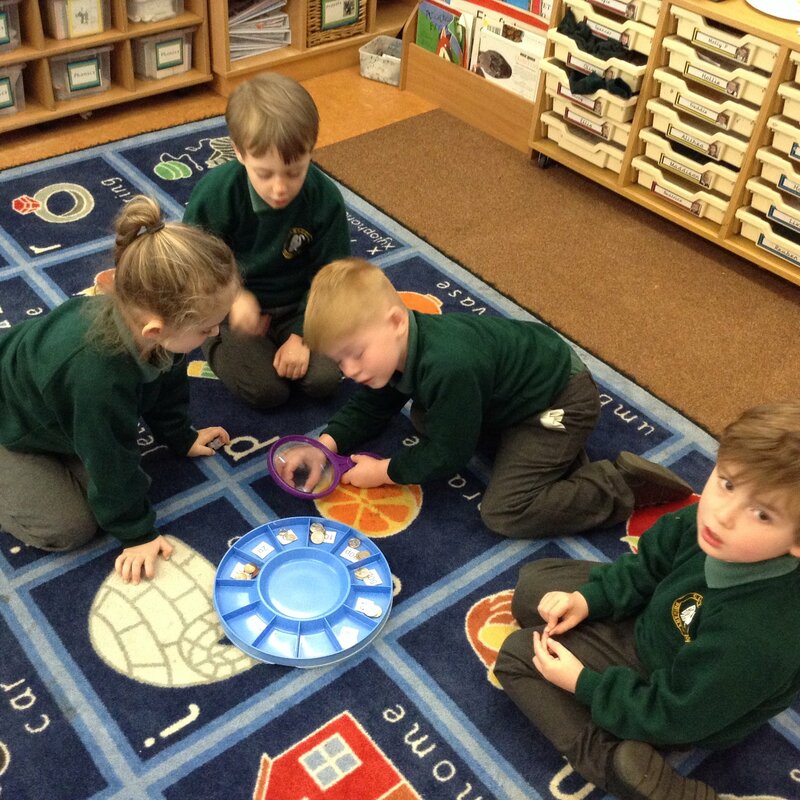 The children are doing so well with their sounds. 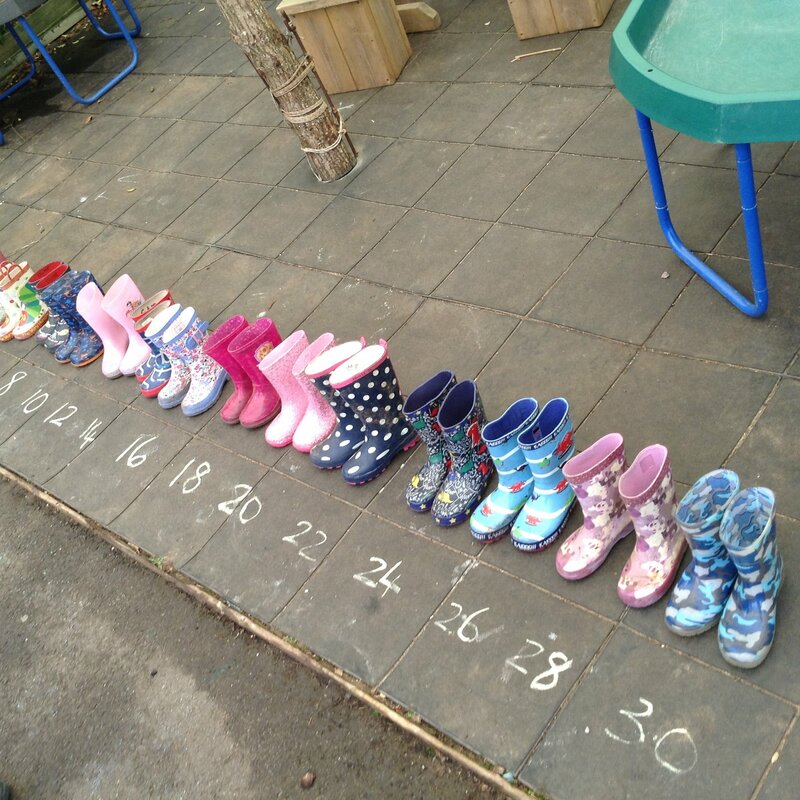 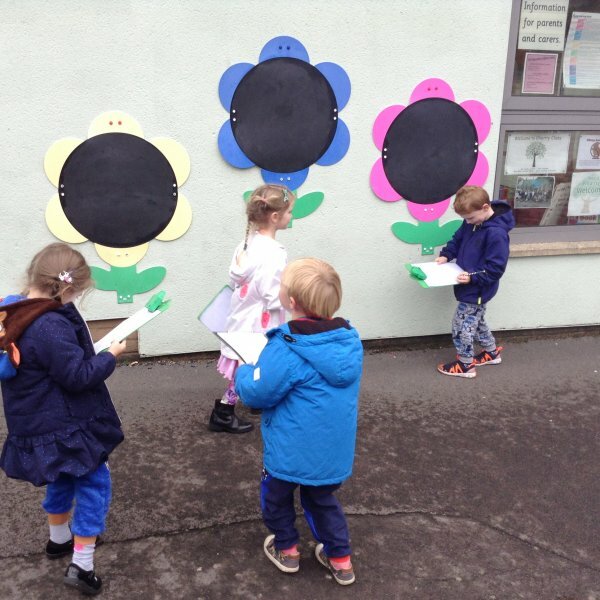 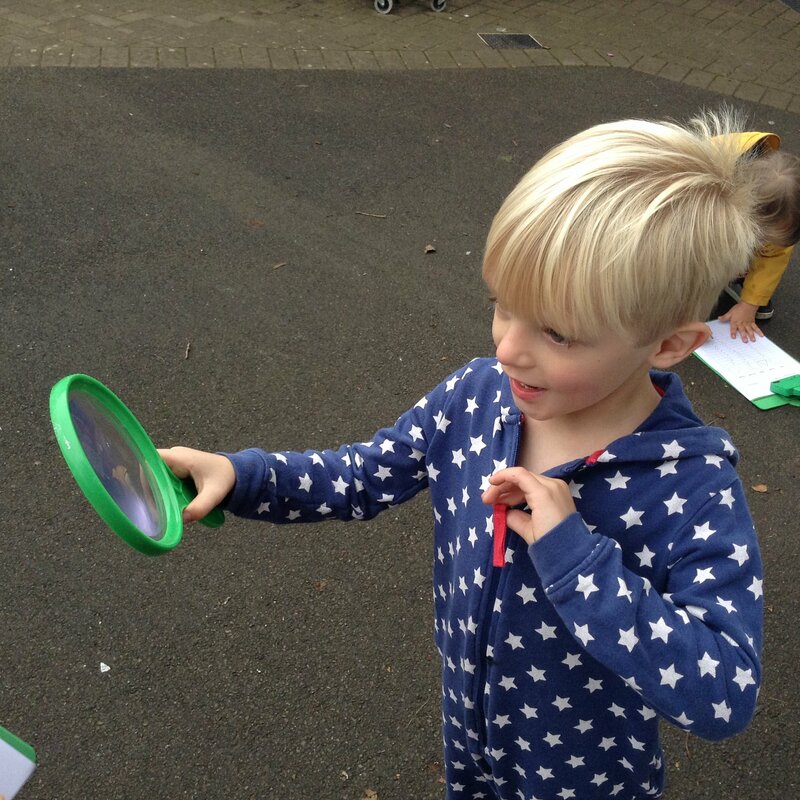 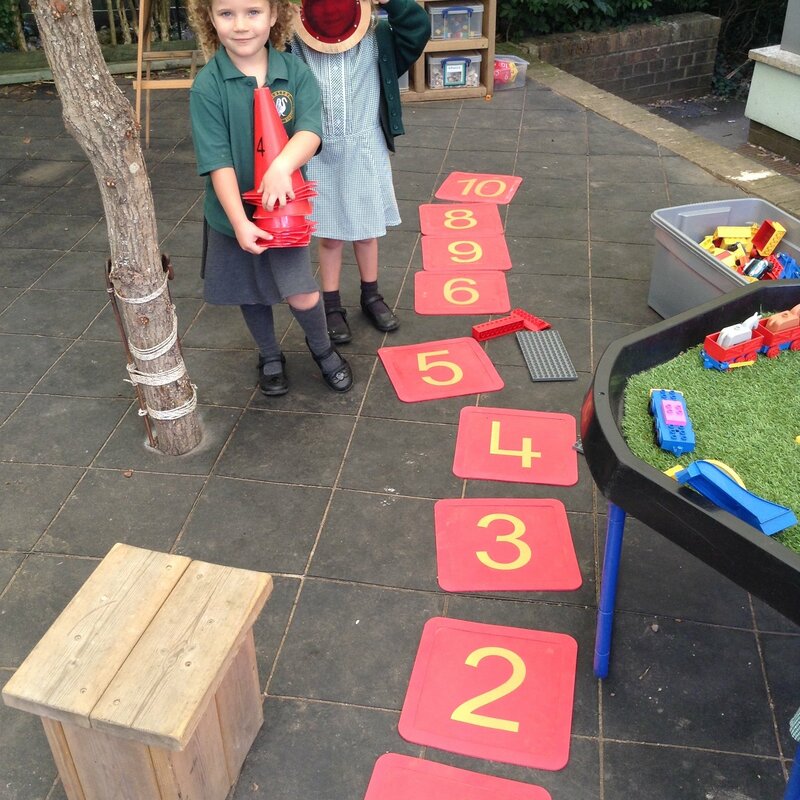 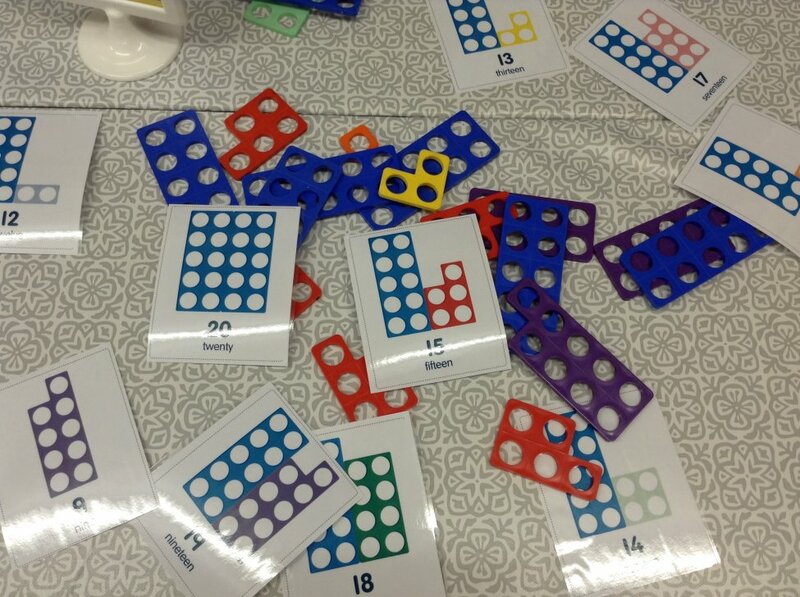 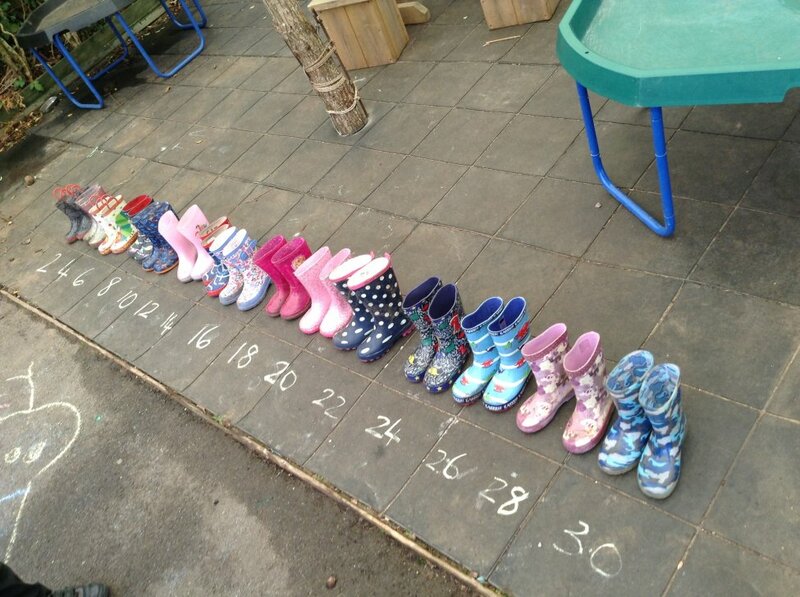 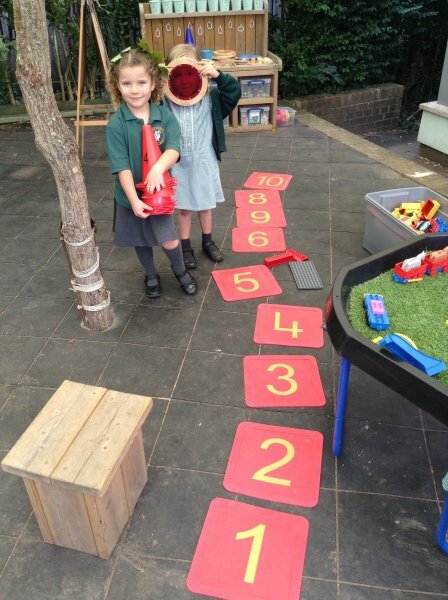 This week we learnt e, u, r and h.
We had fun looking for numbers on our welly walk and the children are enjoying learning number facts with the numberblocks. 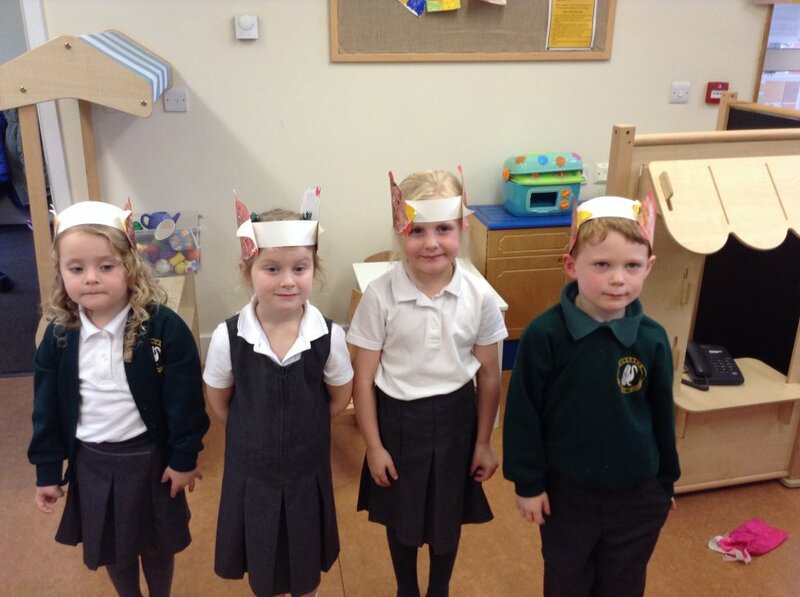 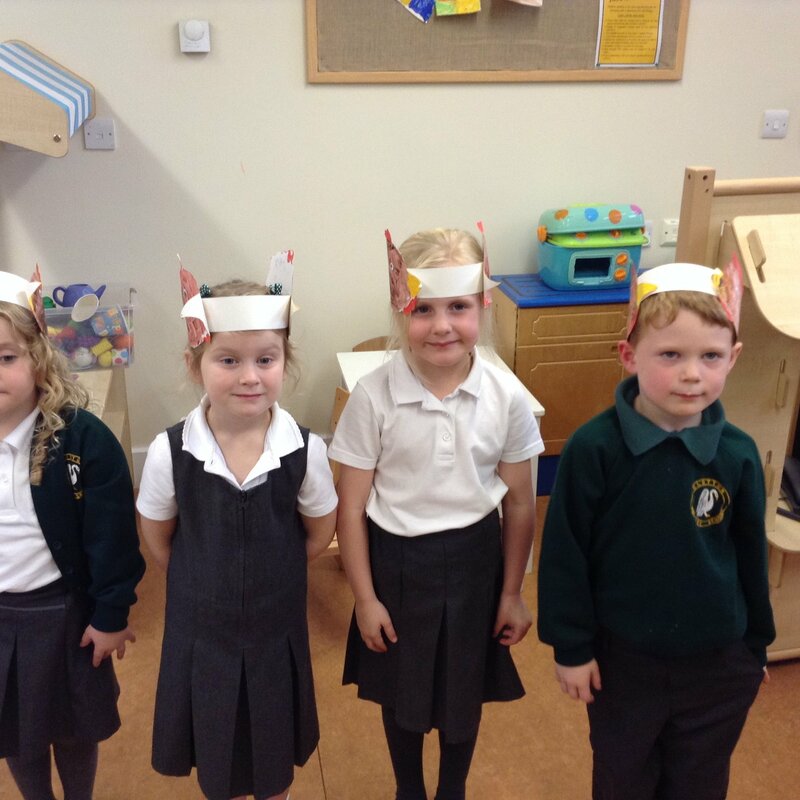 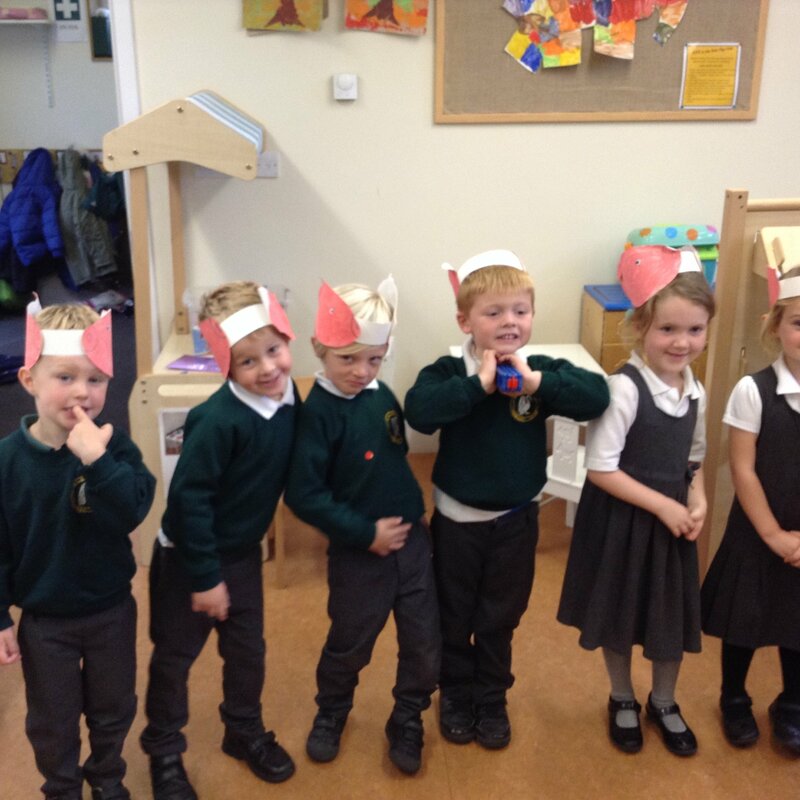 Well done Cherries for your great performance of the Little Red Hen at Harvest Festival in the church - and for bringing in so much food for the Food Bank - thank you. I hope the headbands didn't get too soggy on the way home.. 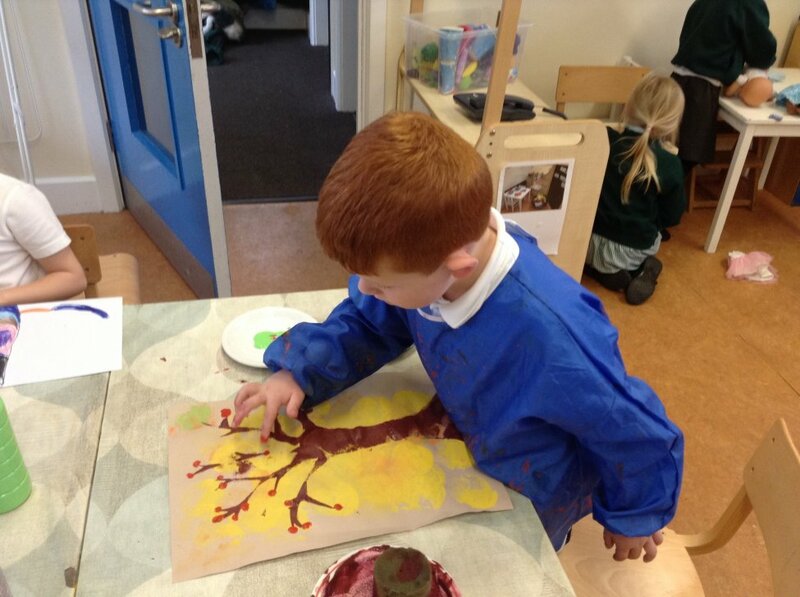 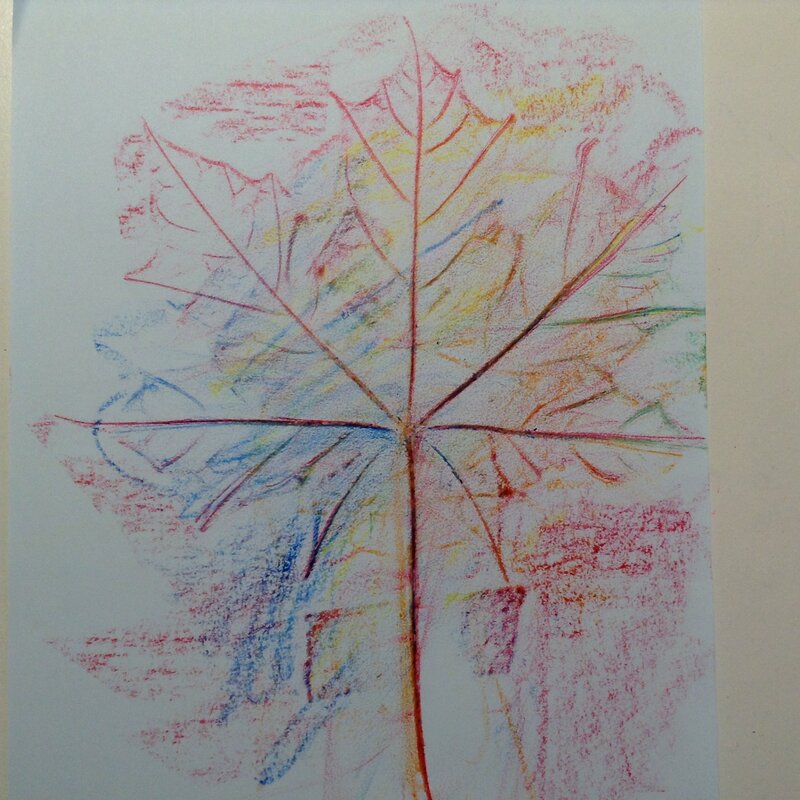 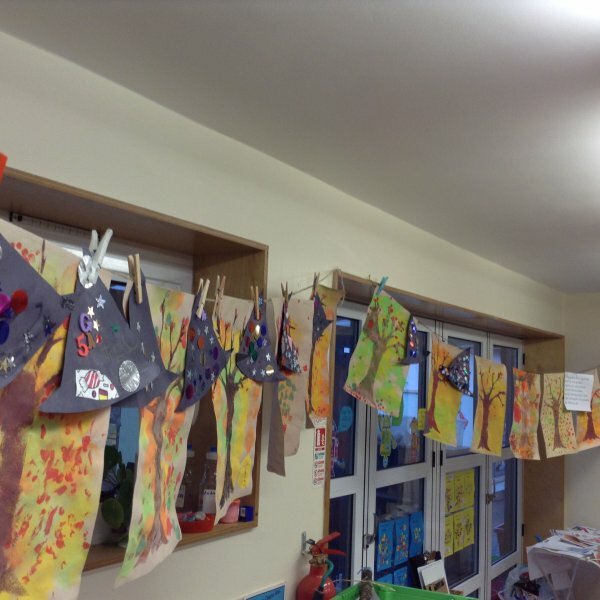 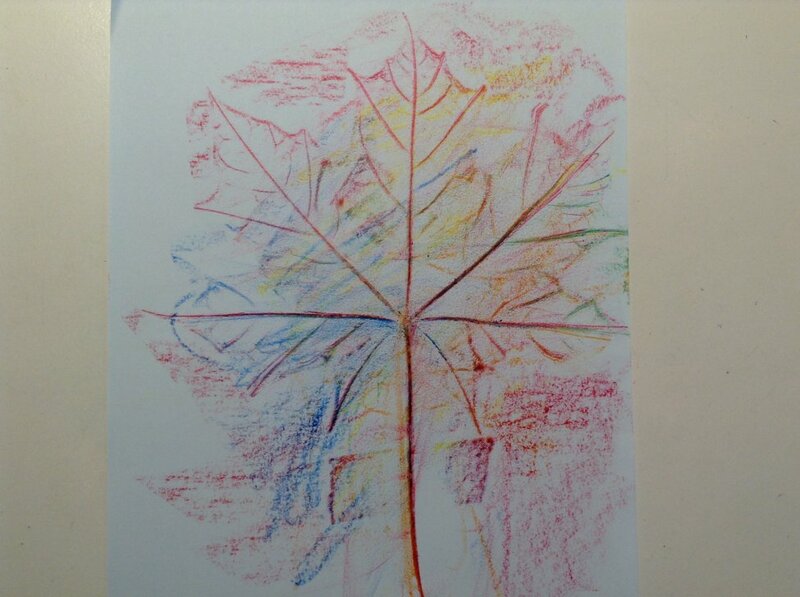 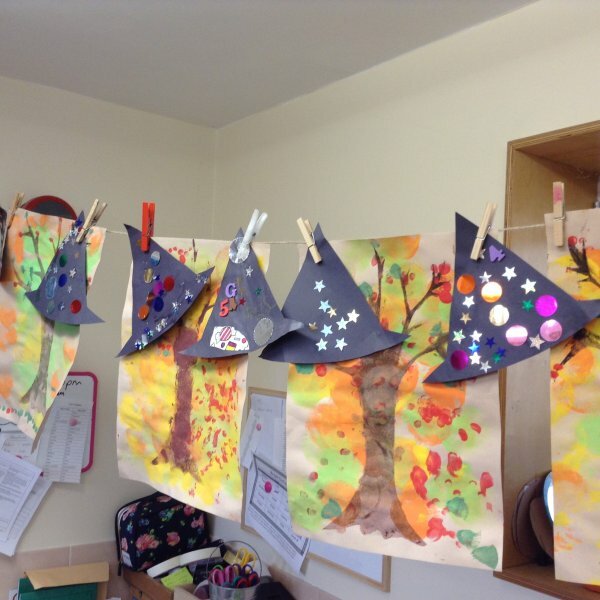 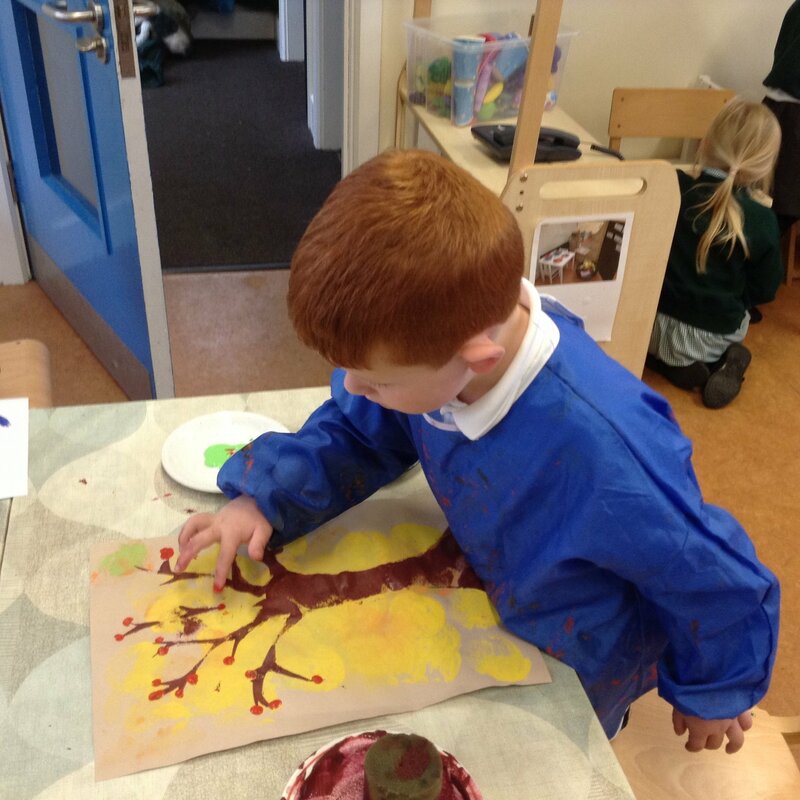 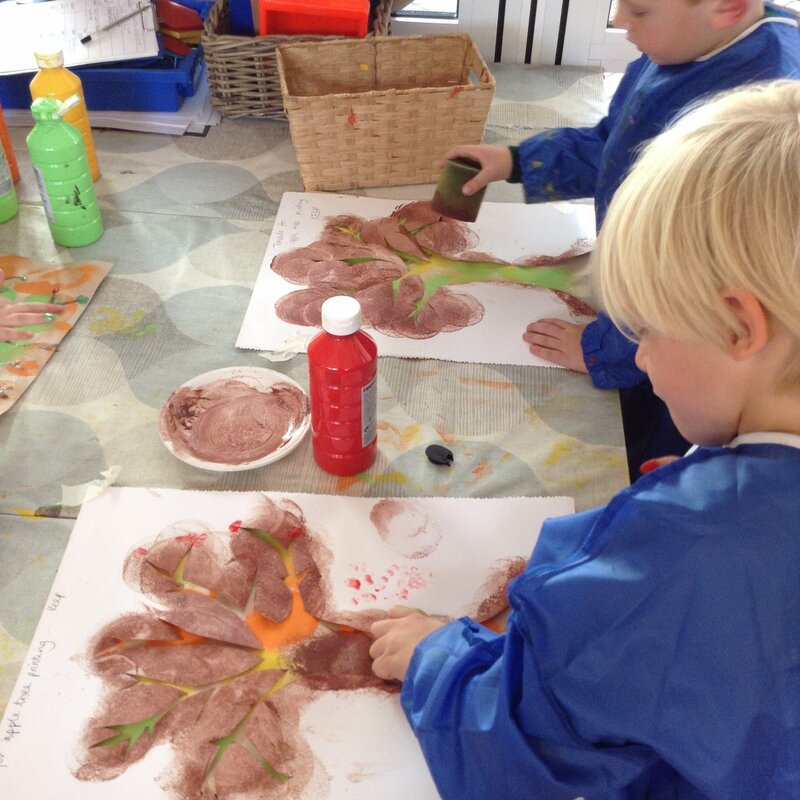 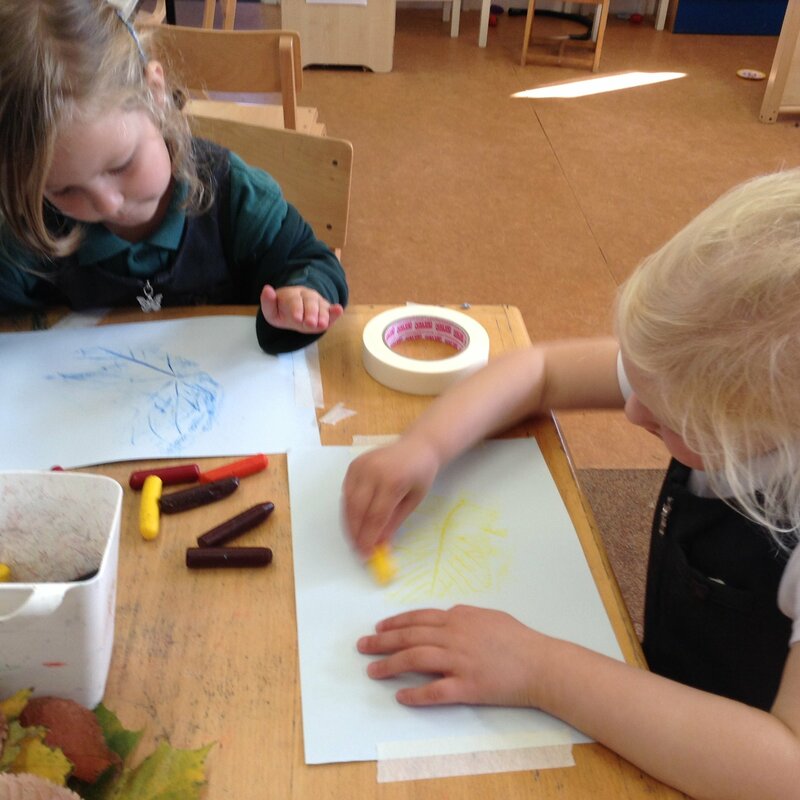 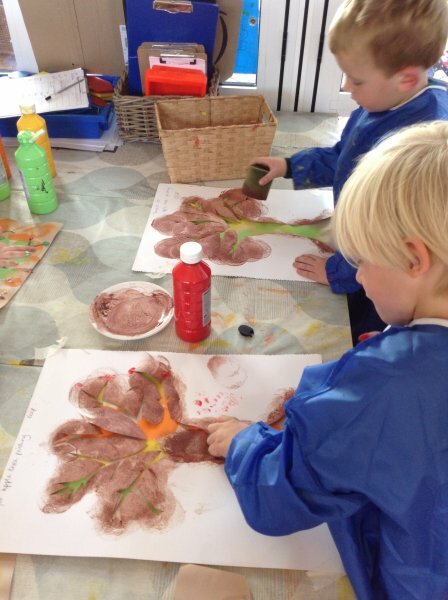 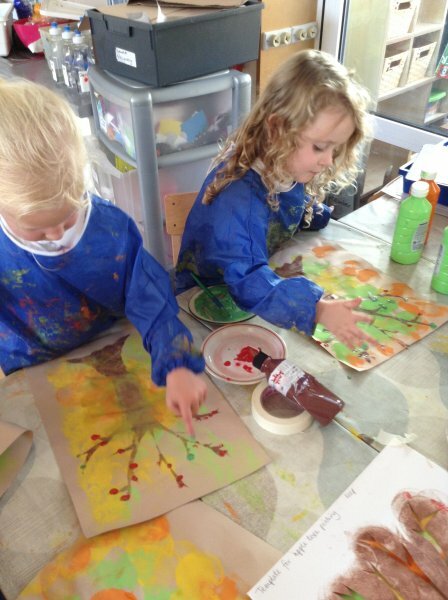 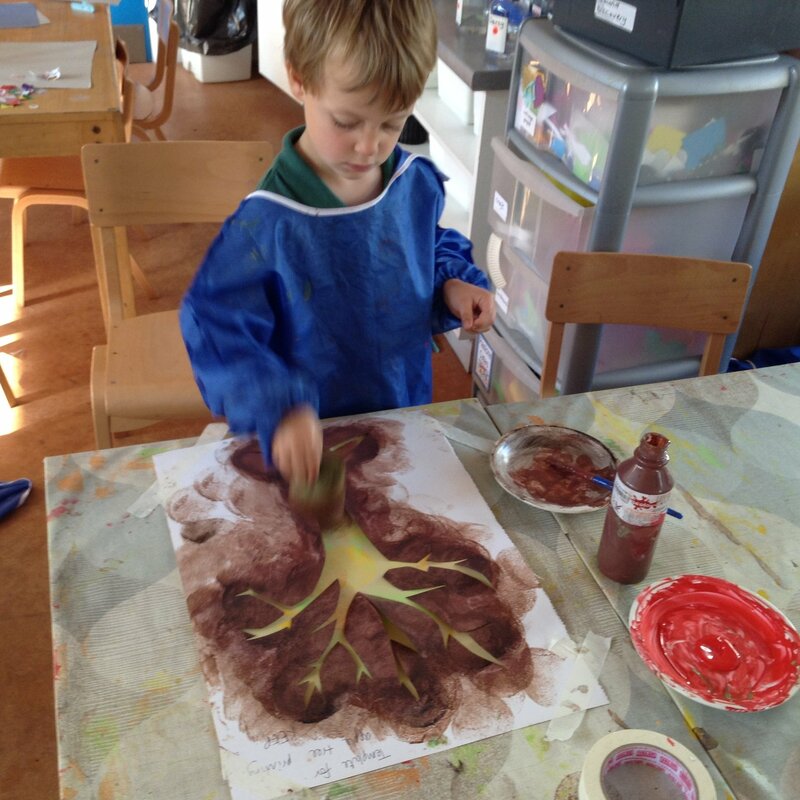 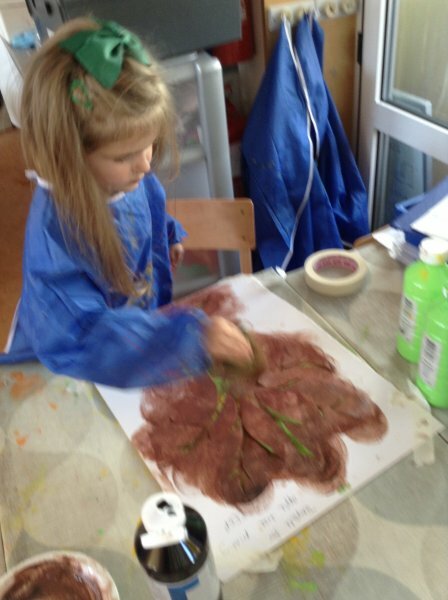 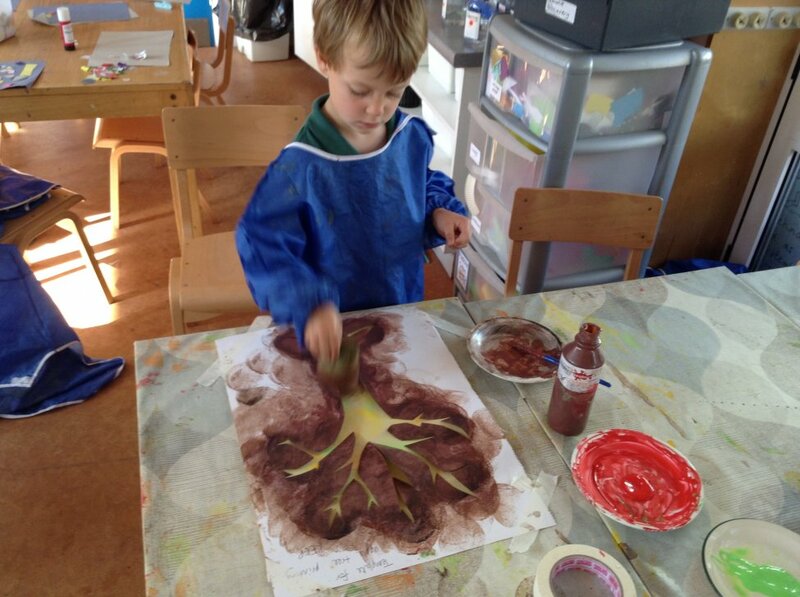 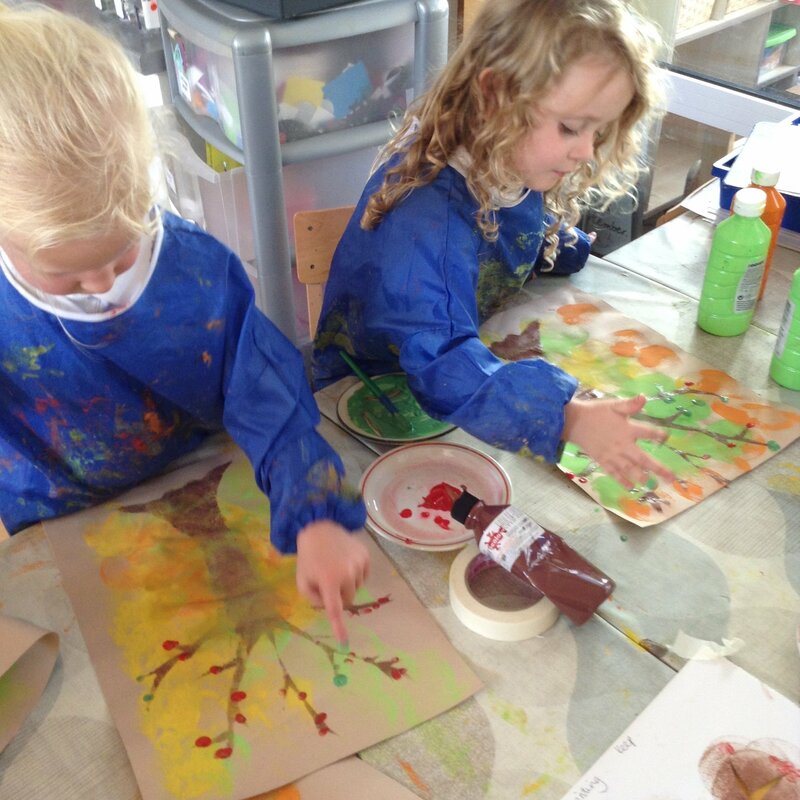 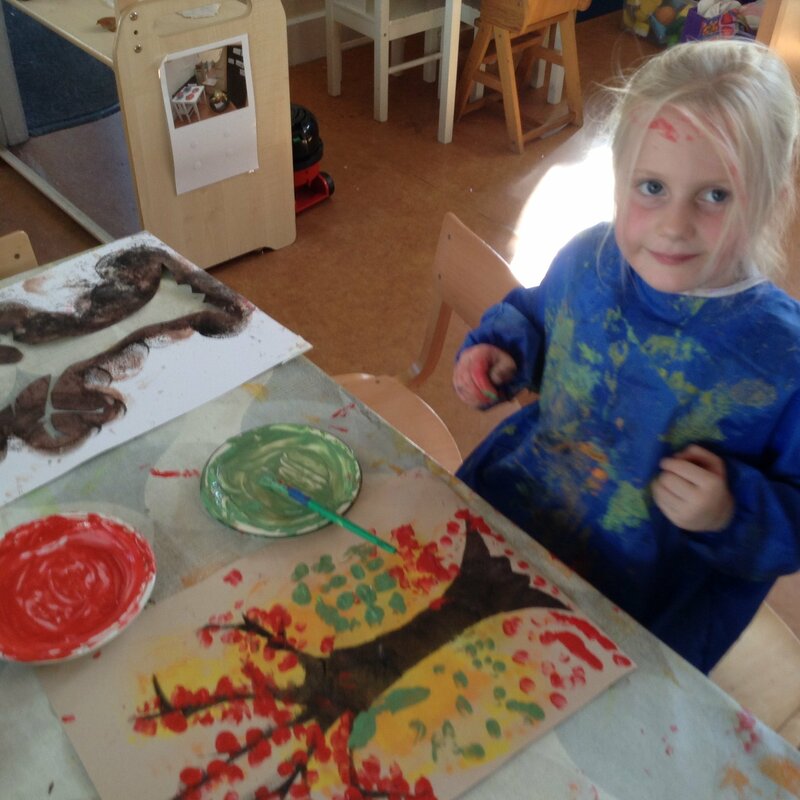 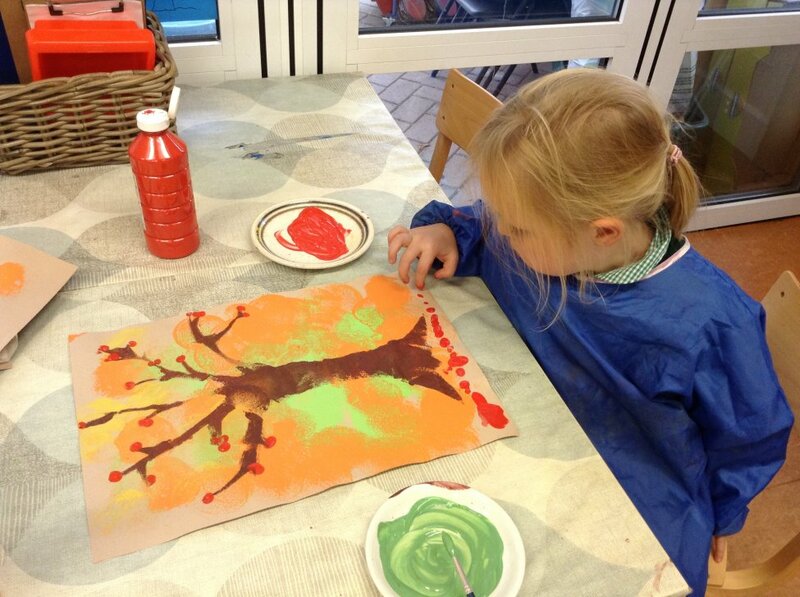 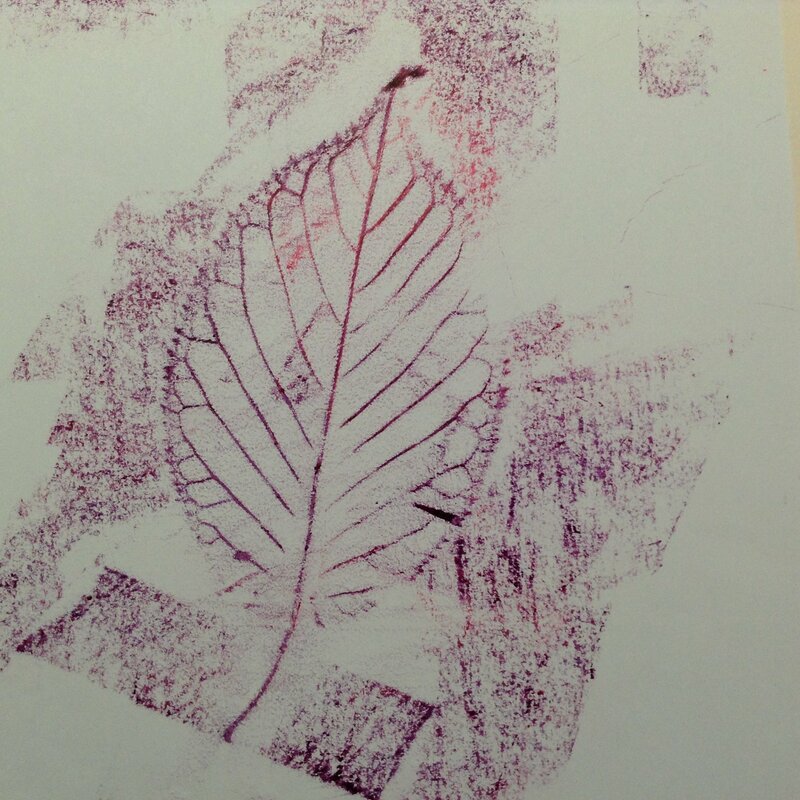 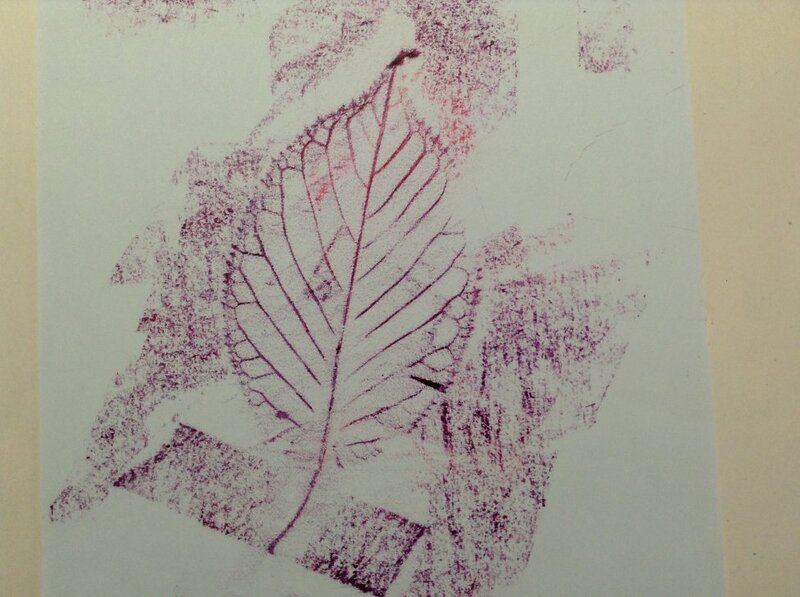 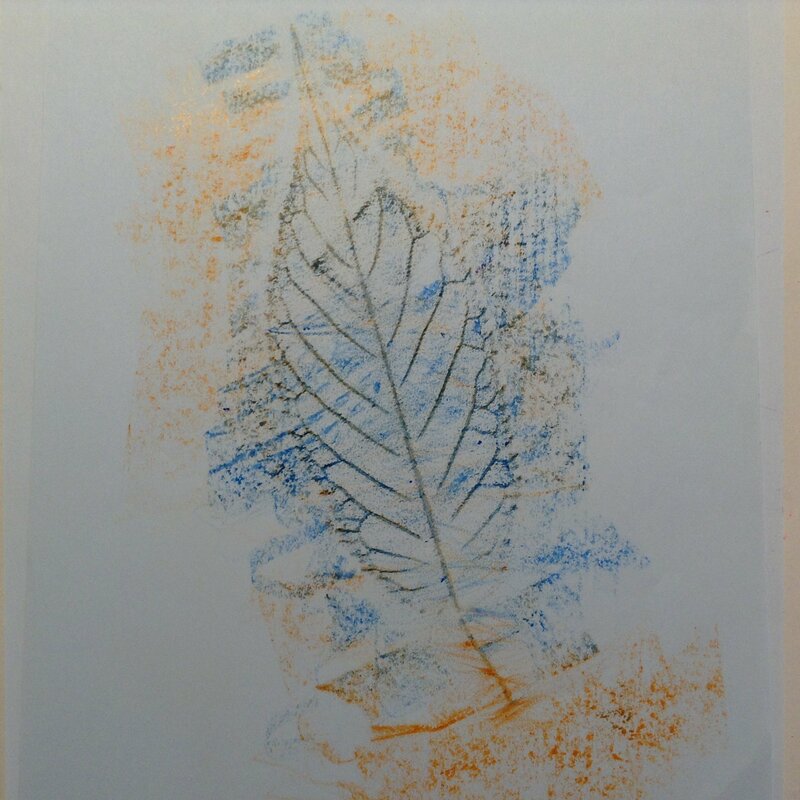 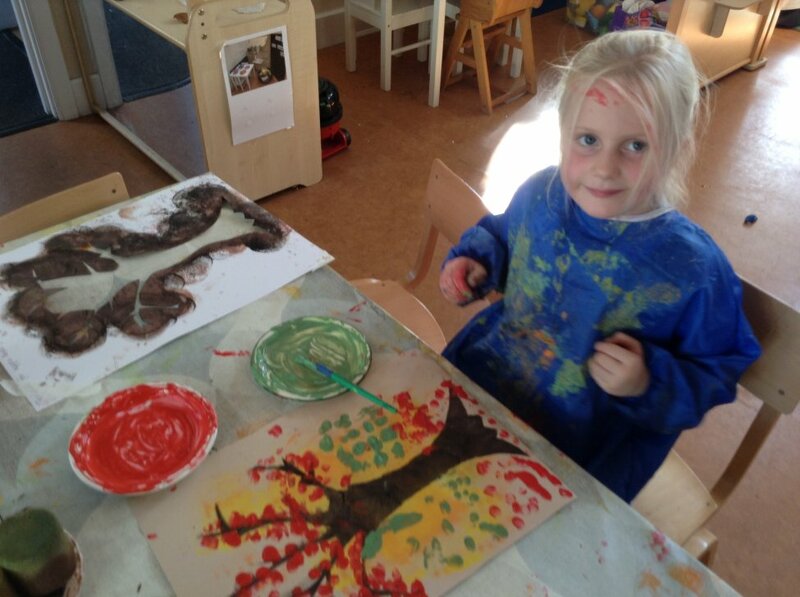 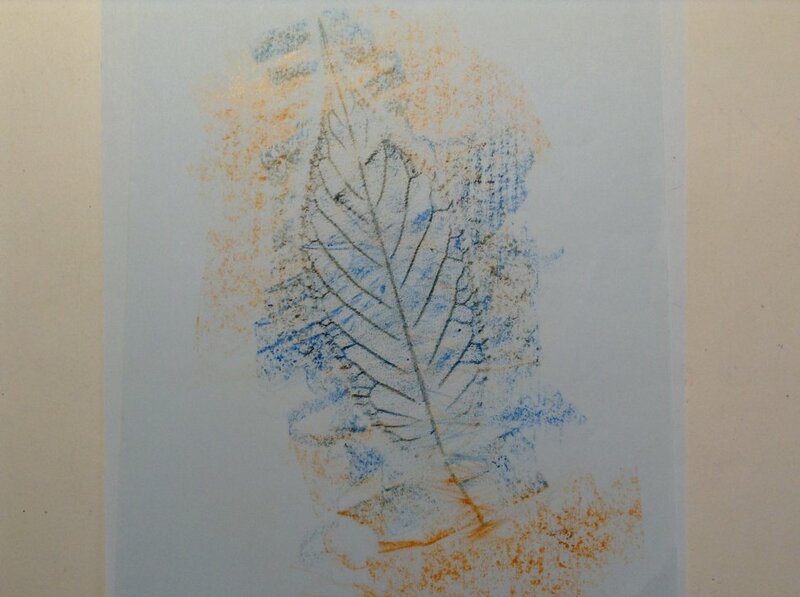 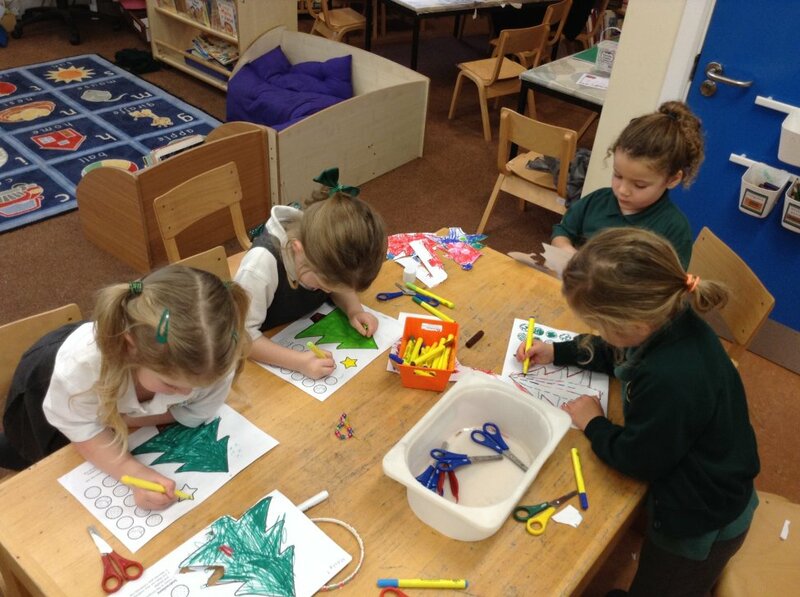 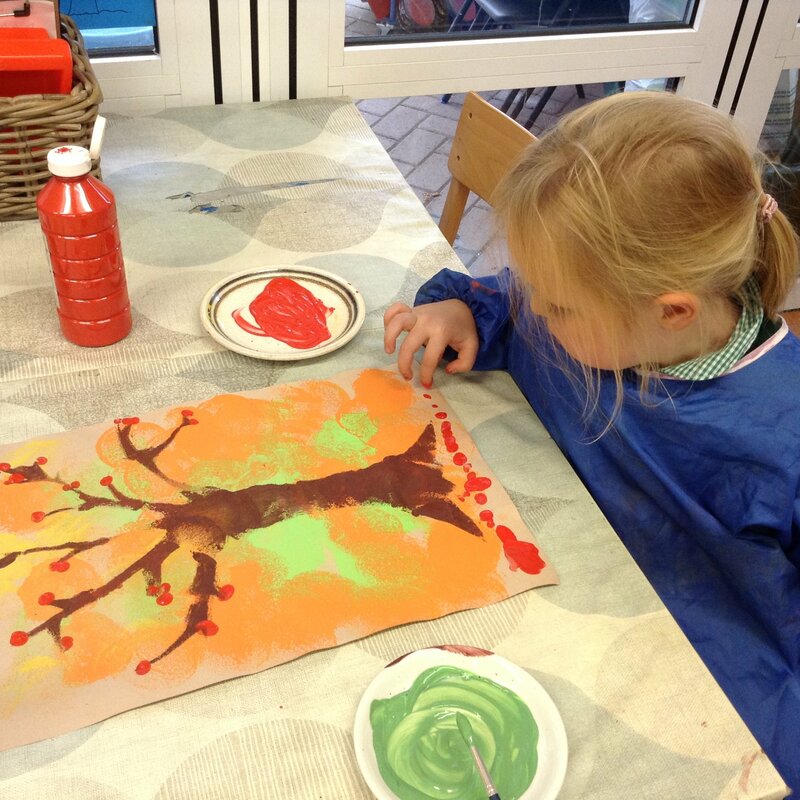 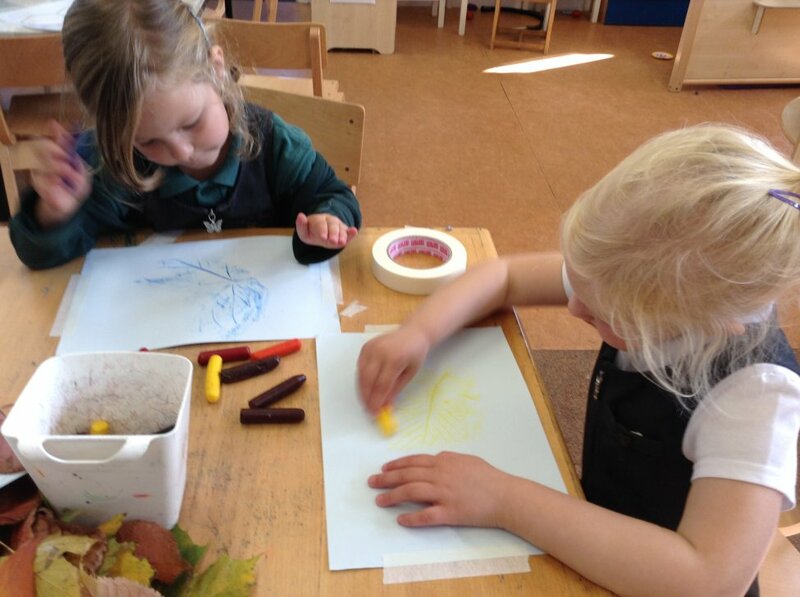 This week's highlight was making beautiful tree pictures with Mrs Morris with sponge printing, stencilling and finger painting. 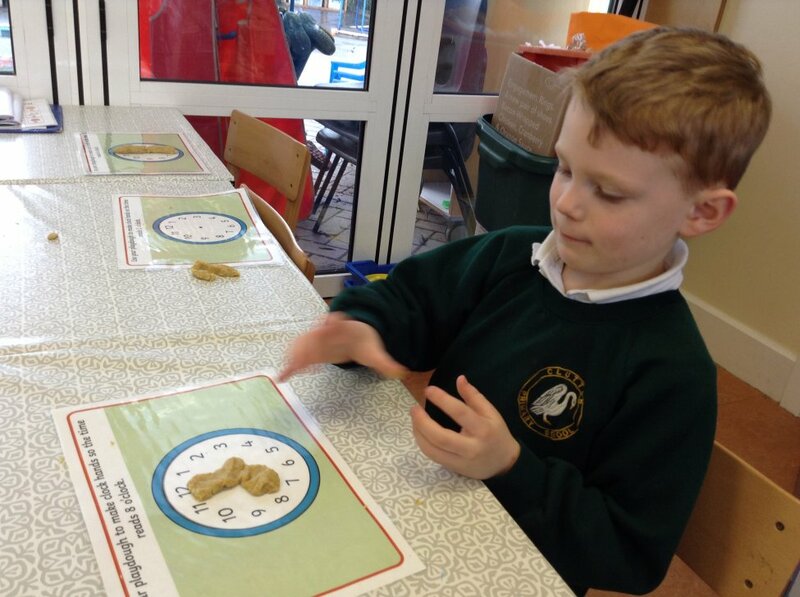 (All these techniques are great for strengthening fingers). 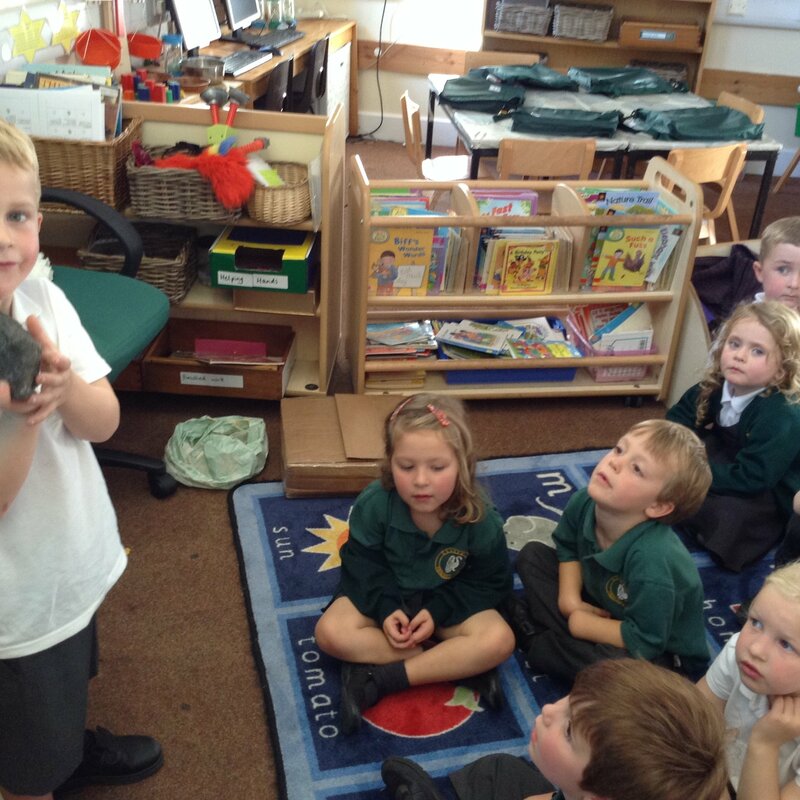 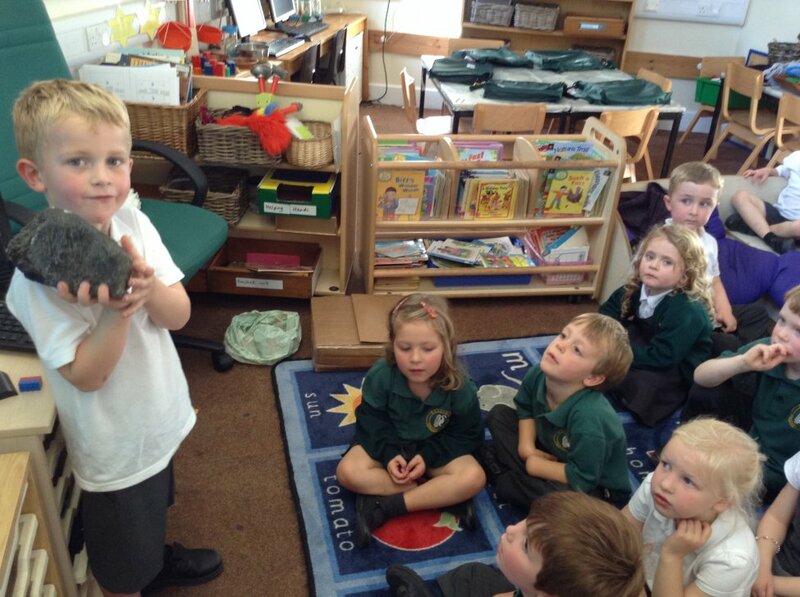 Thank you so much to H for bringing in the lava rock. 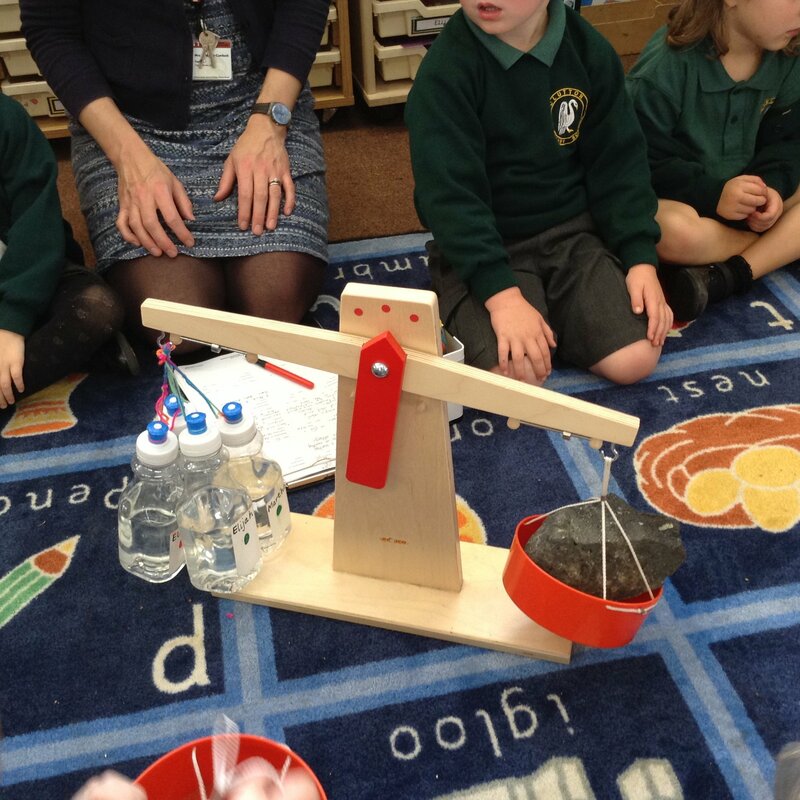 We had a lot of fun doing an experiemnt to see how many water bottles weighed the same and it created a lot of excitement in the classroom. 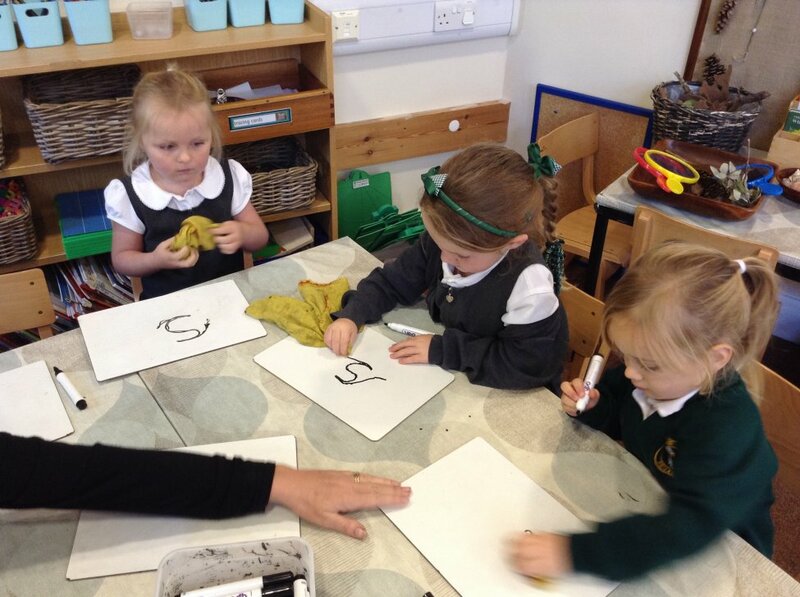 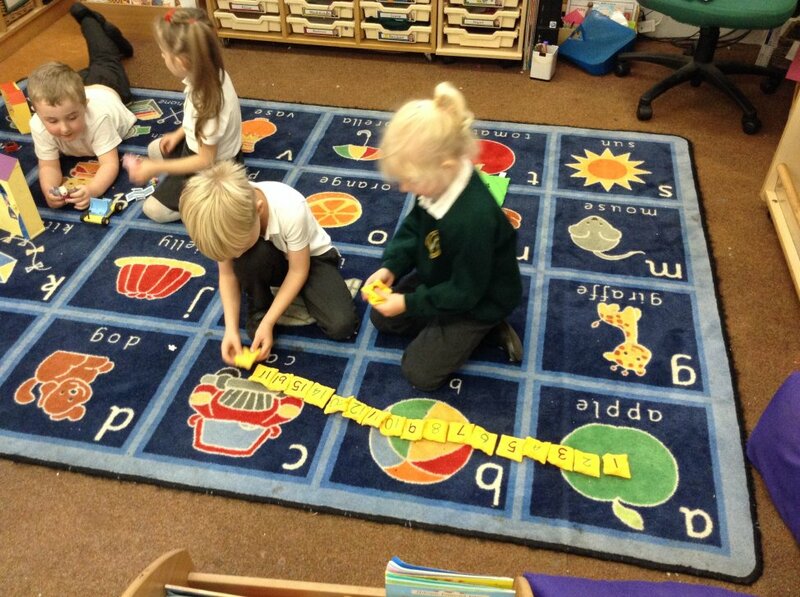 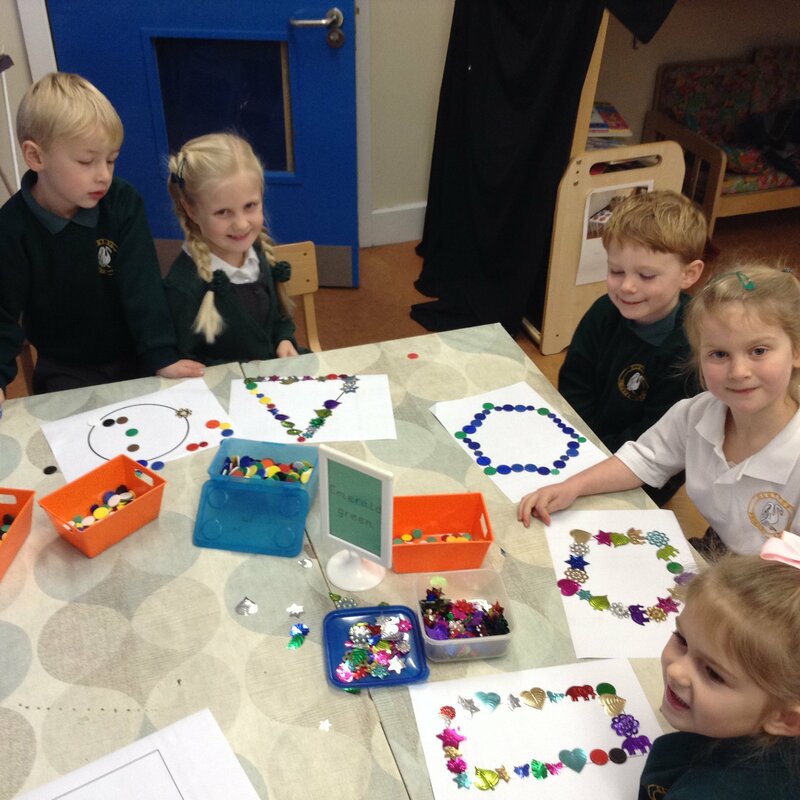 We have been busy making words with our letter sounds and learning new sounds (g, o, c, k and ck). 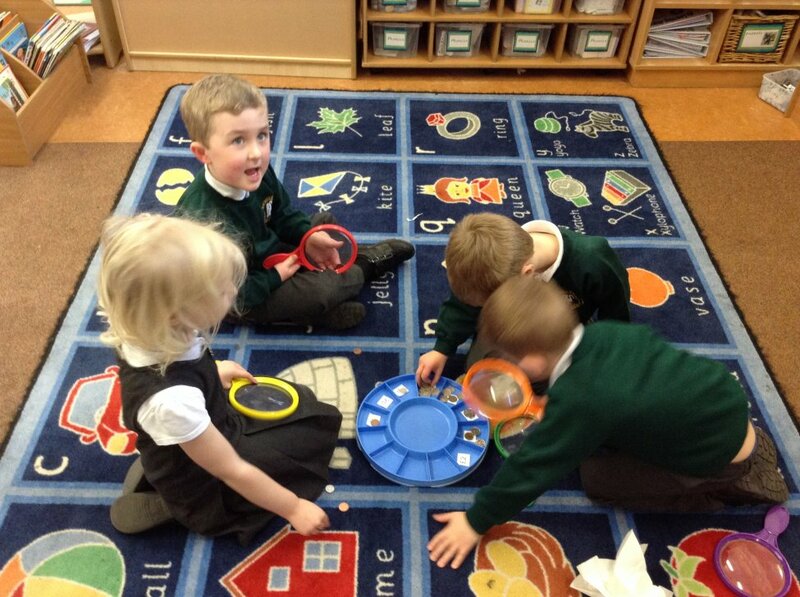 Try making words with the new sounds in your tin! 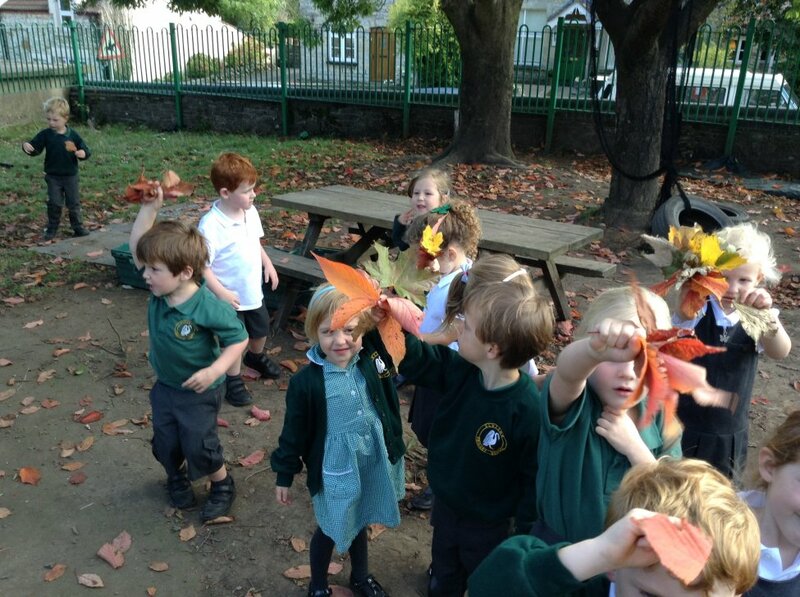 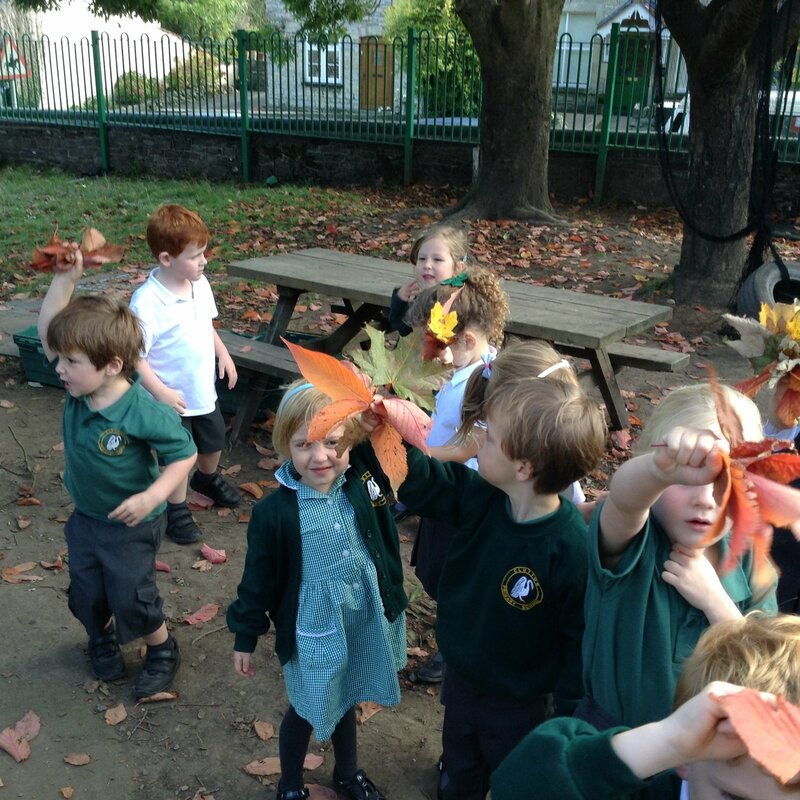 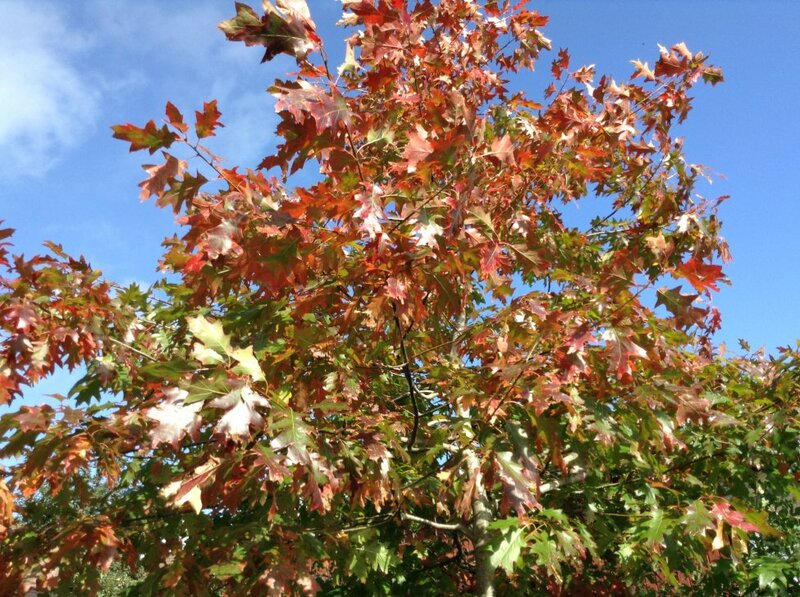 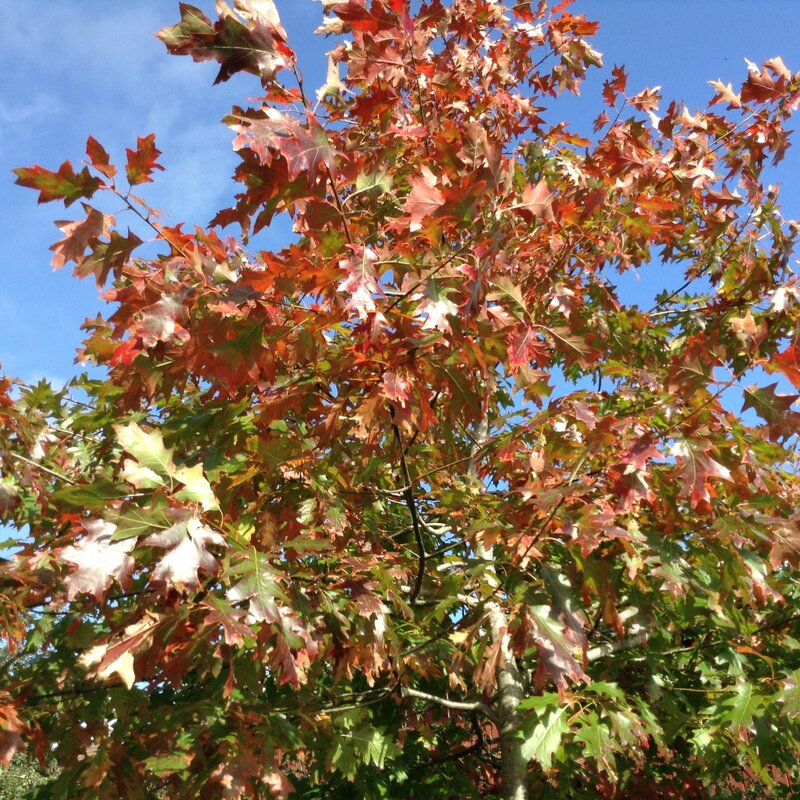 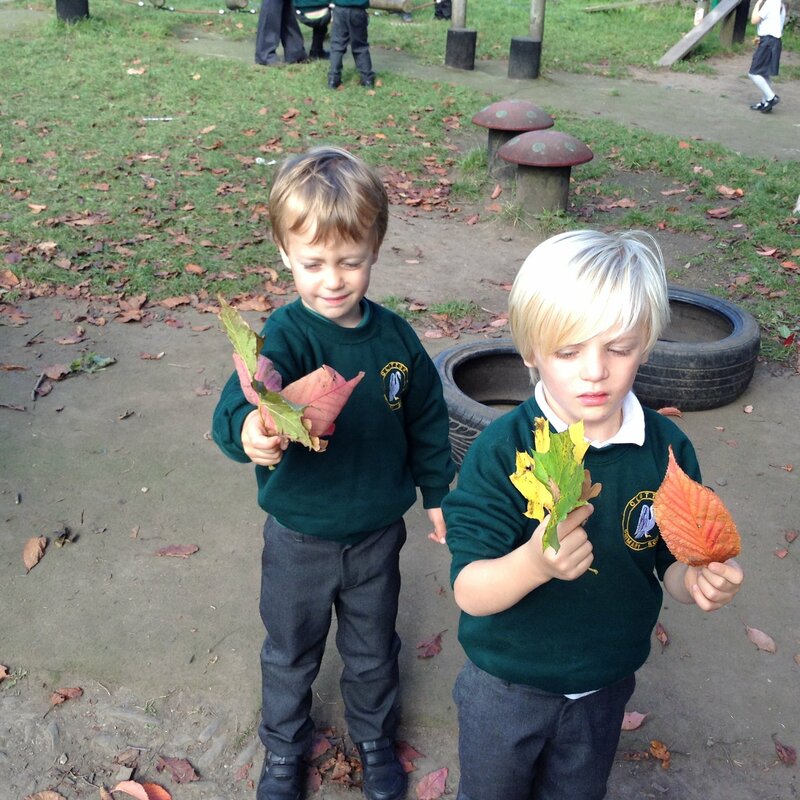 This week we have been enjoying the autumnal weather. 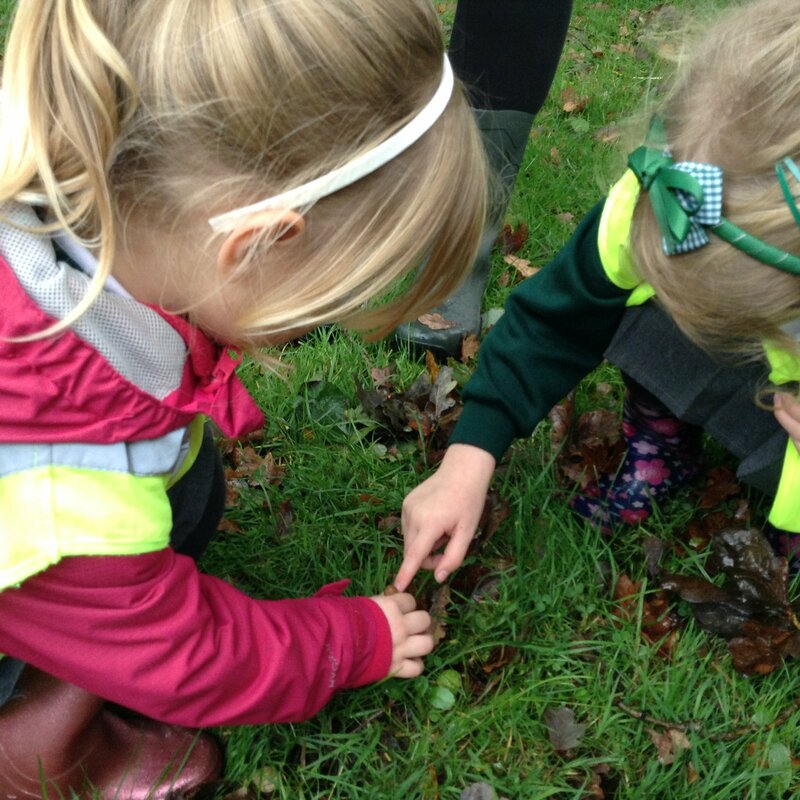 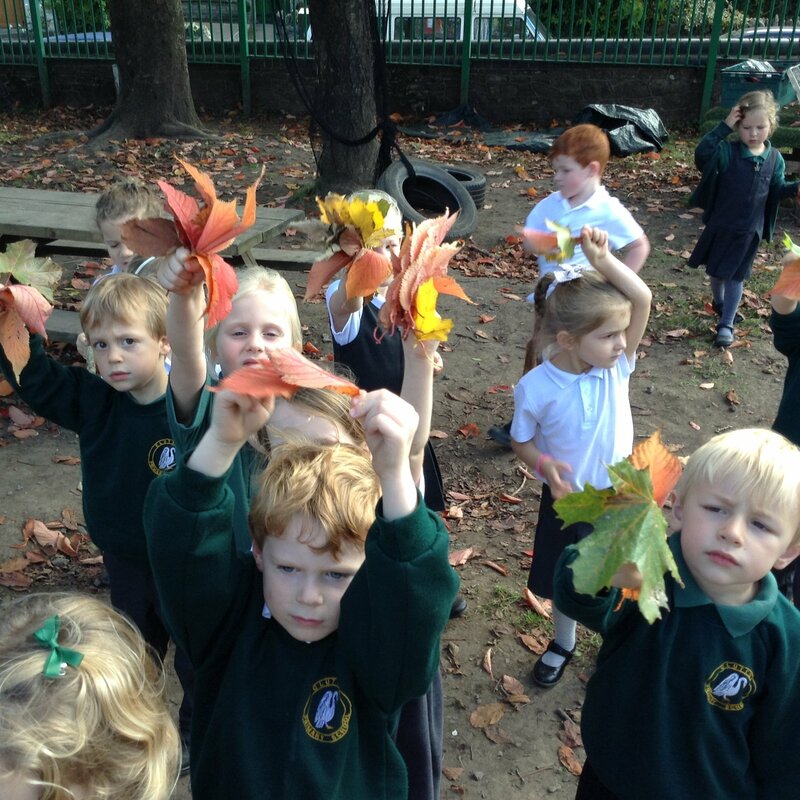 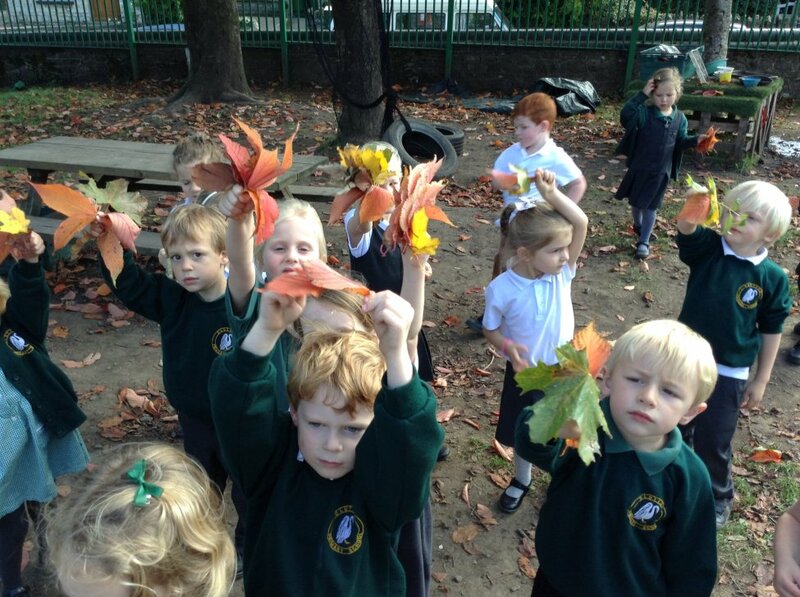 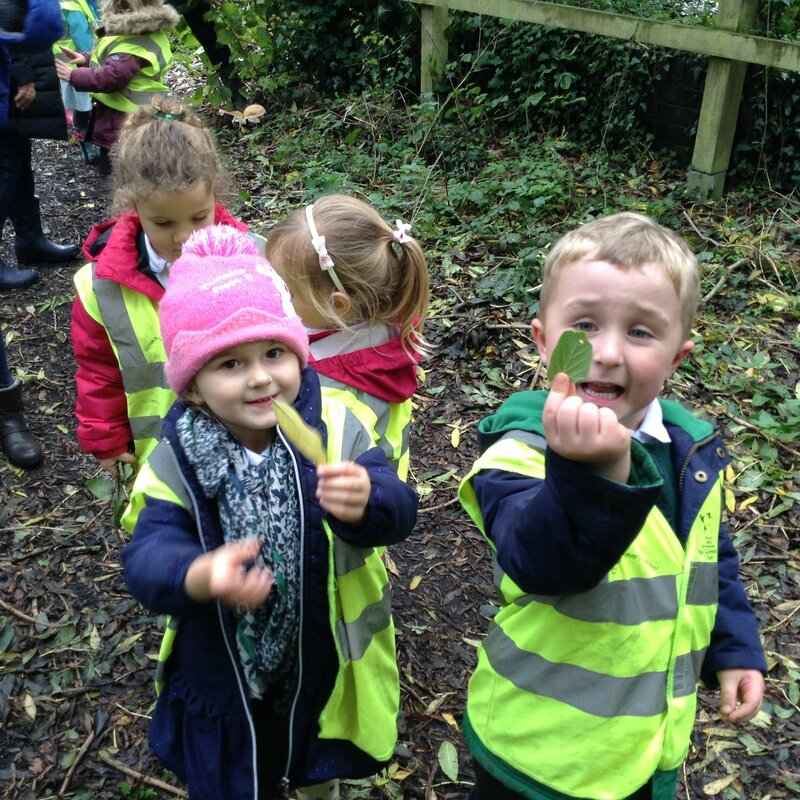 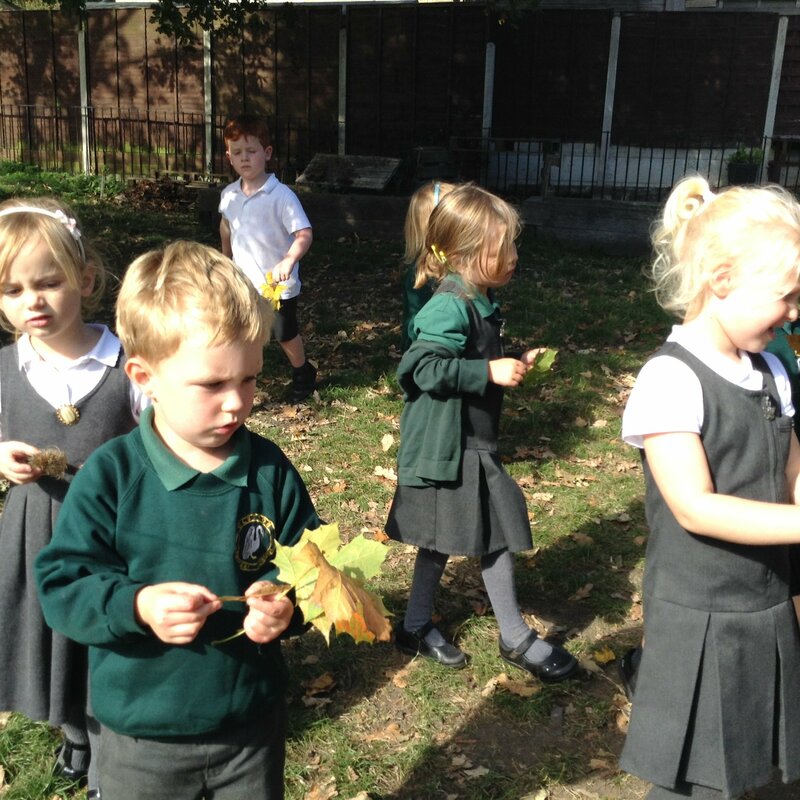 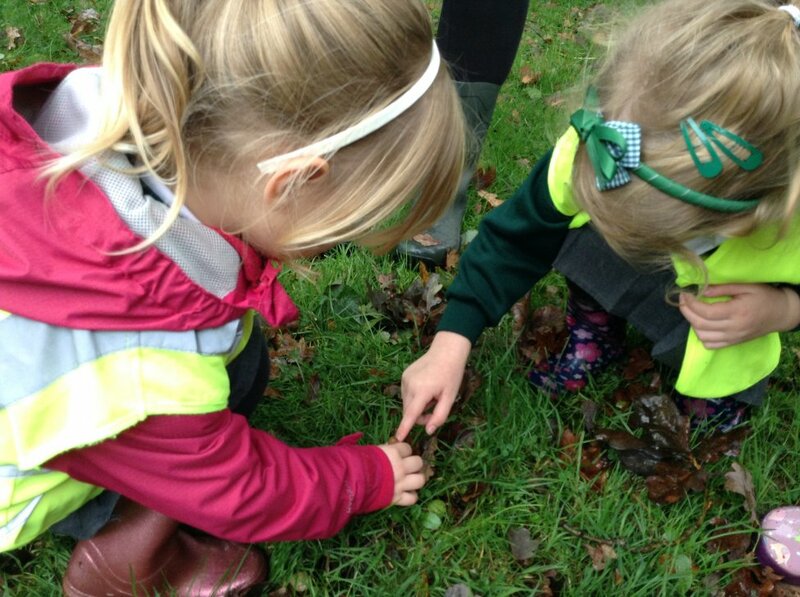 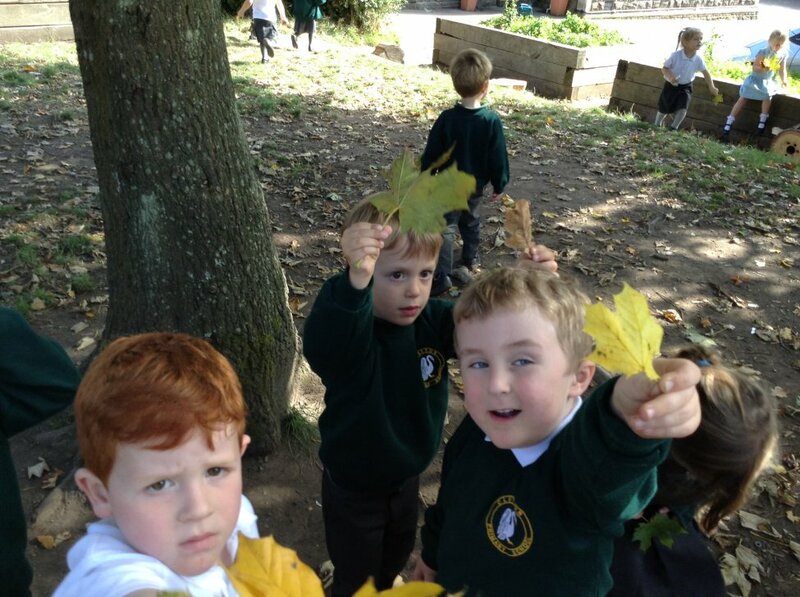 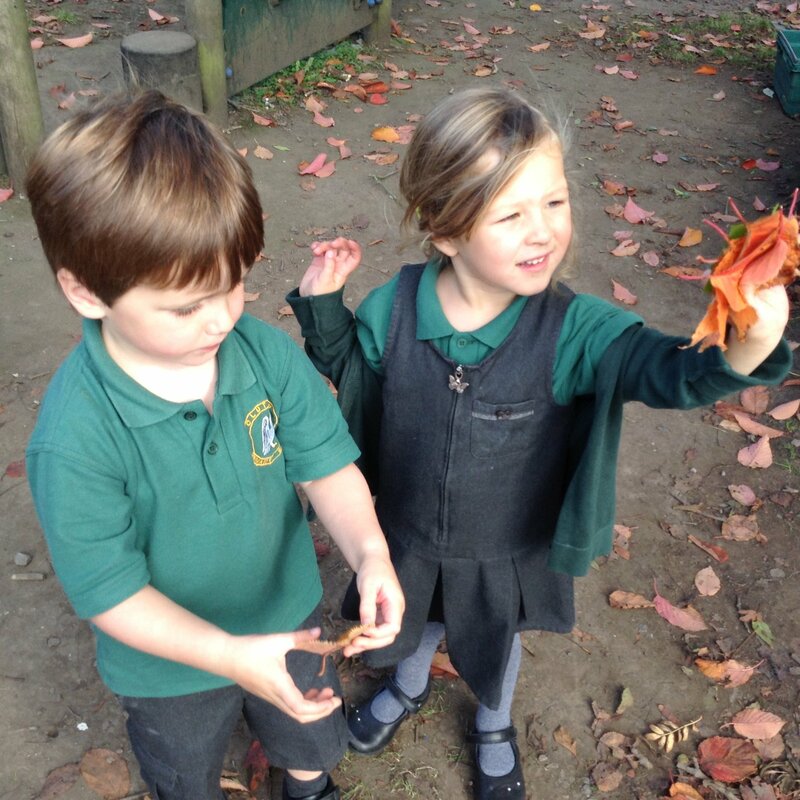 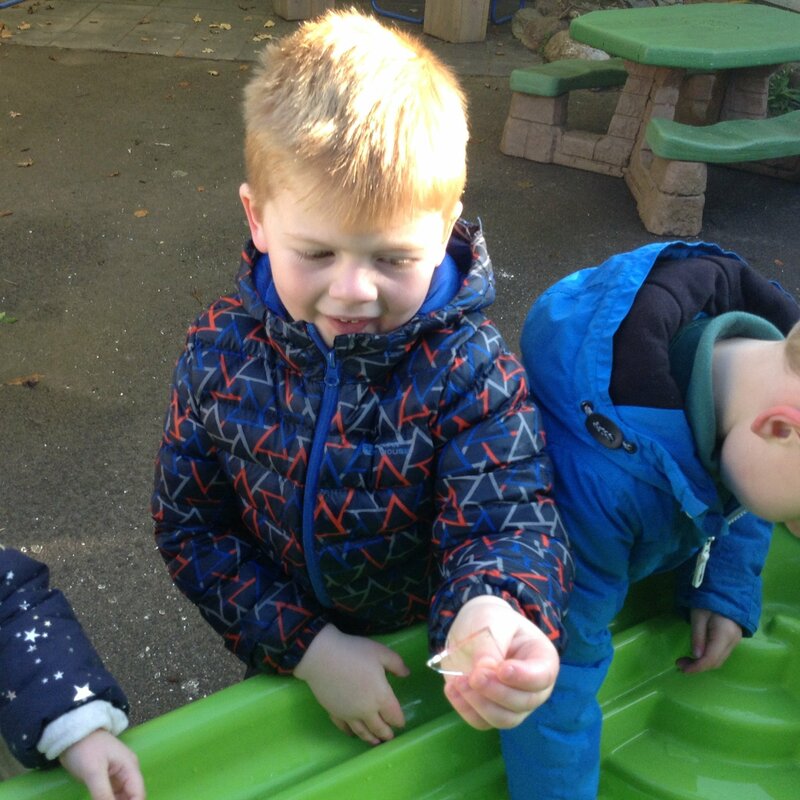 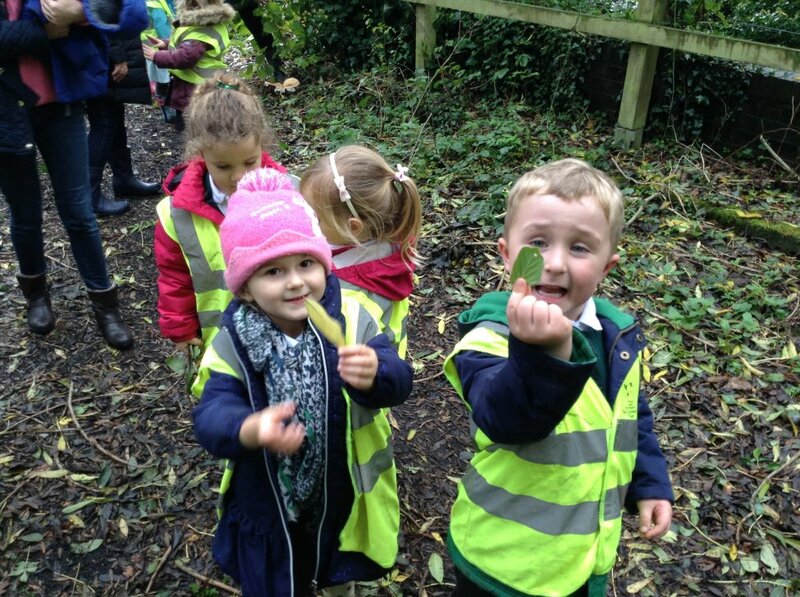 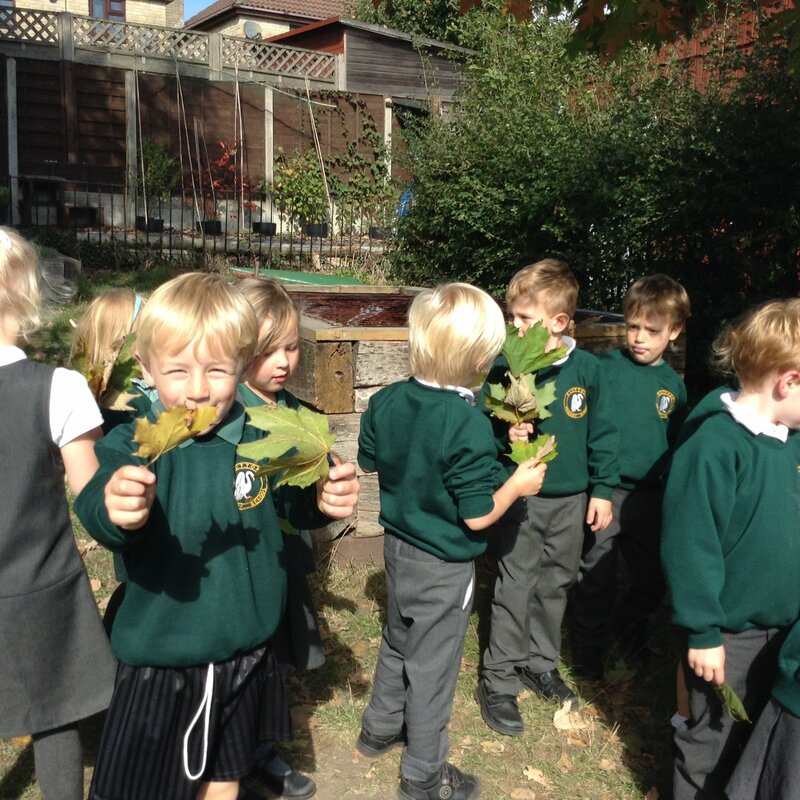 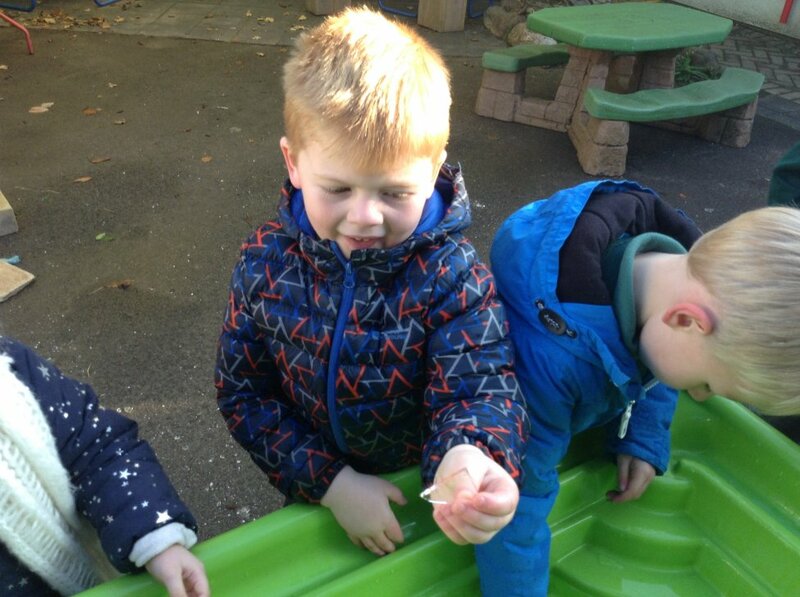 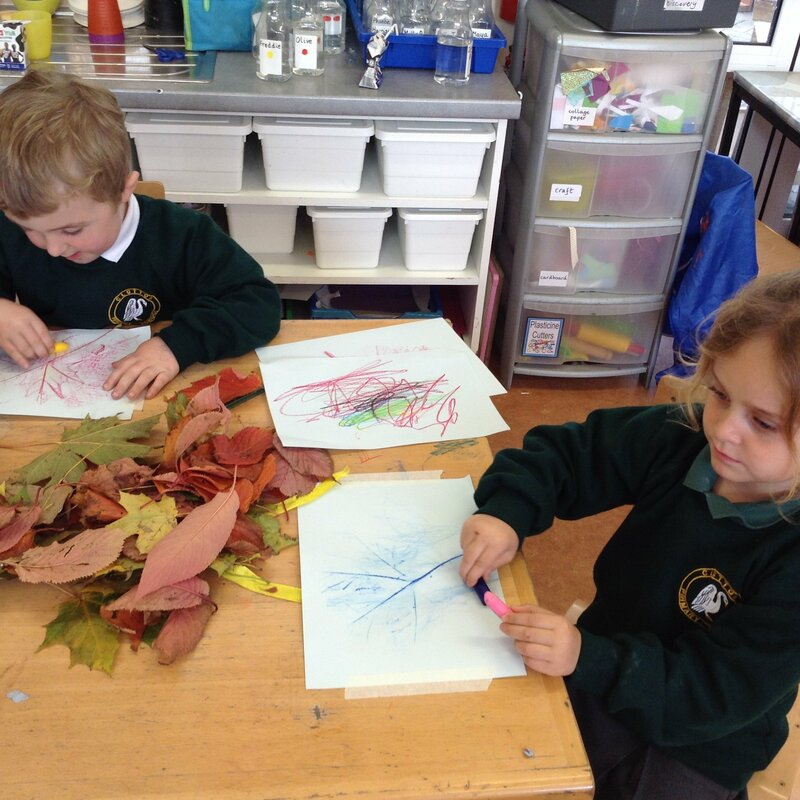 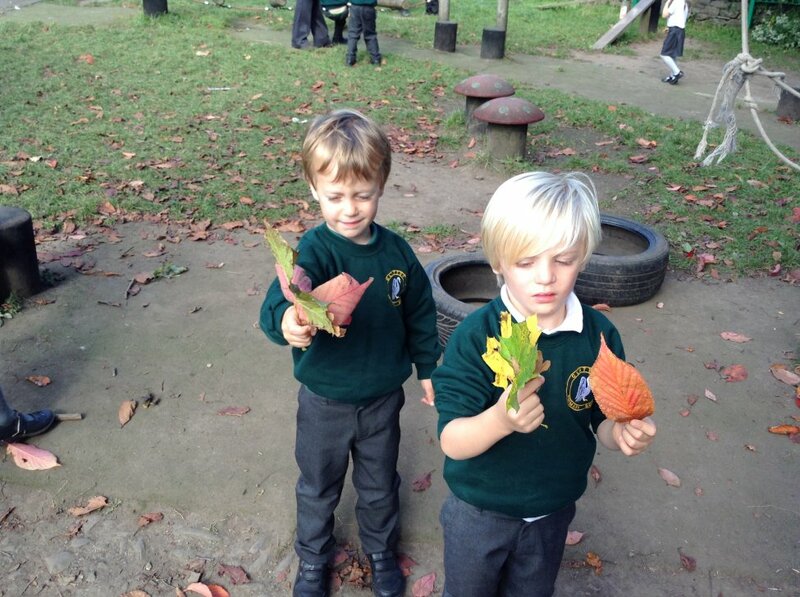 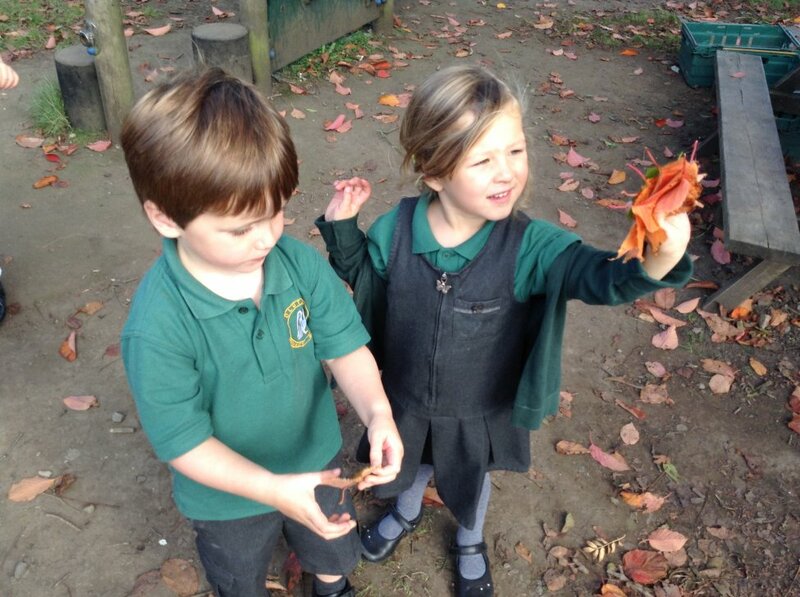 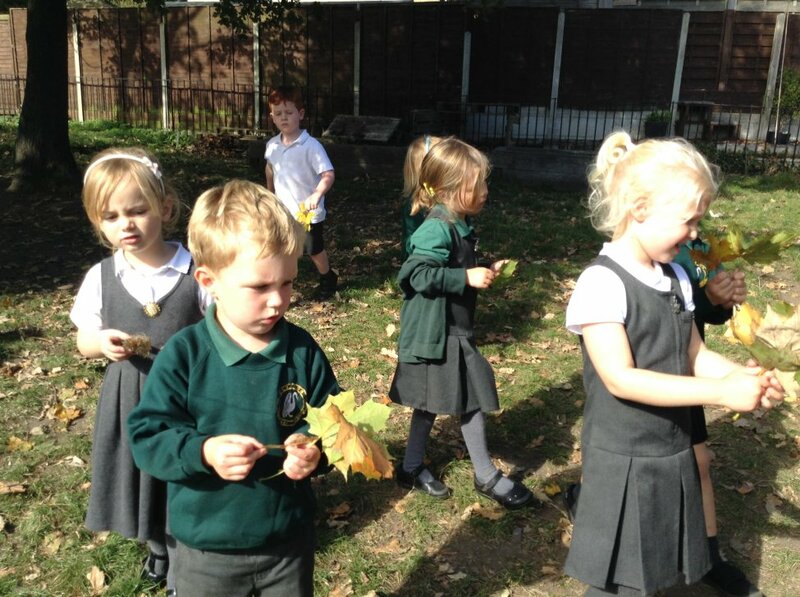 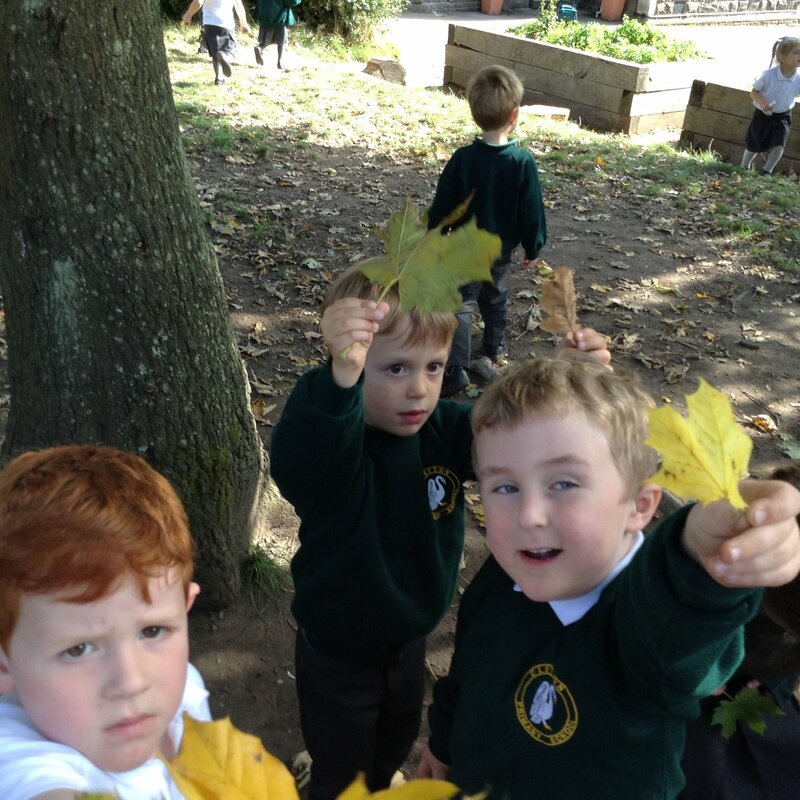 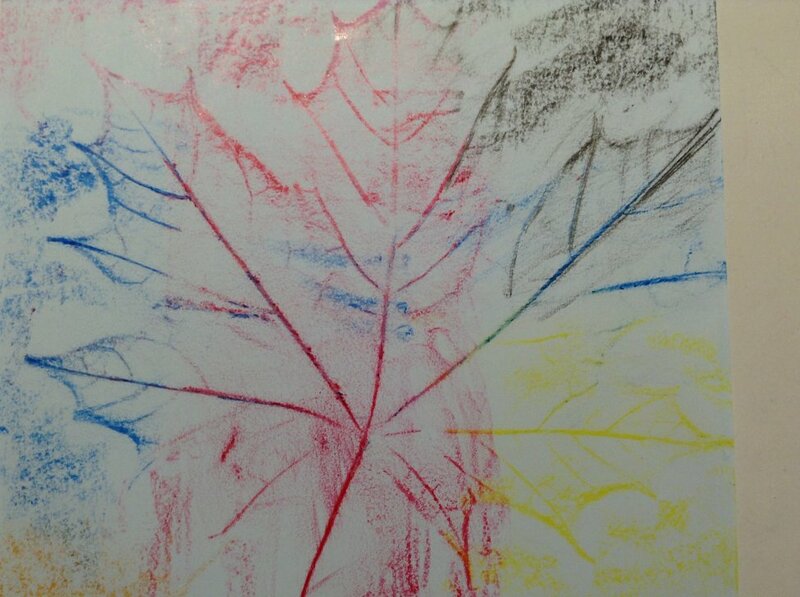 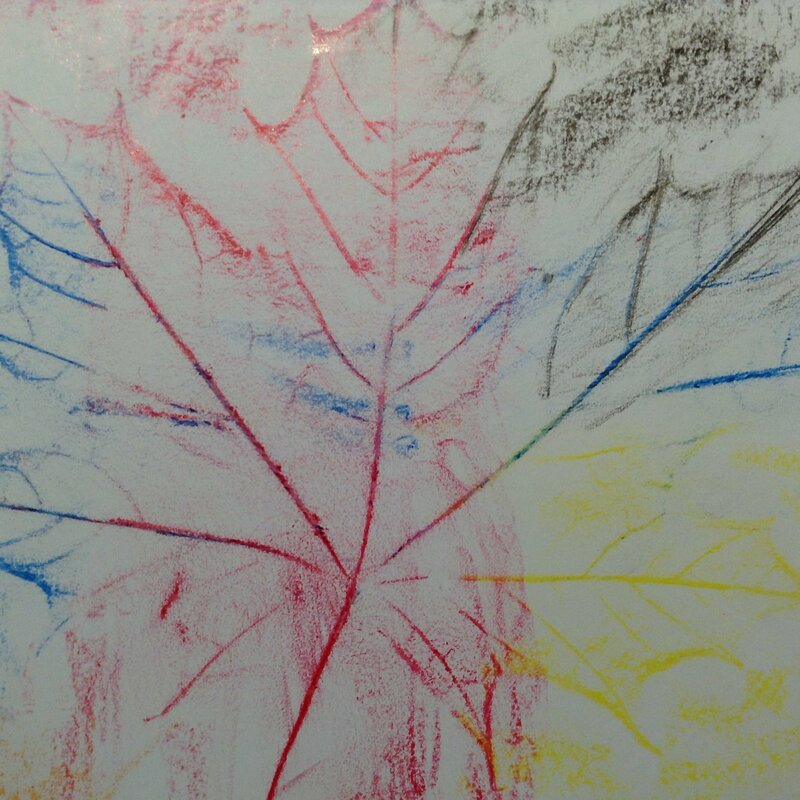 We hunted for leaves in the playground and found some cherry and sycamore leaves which were great for making leaf rubbings. 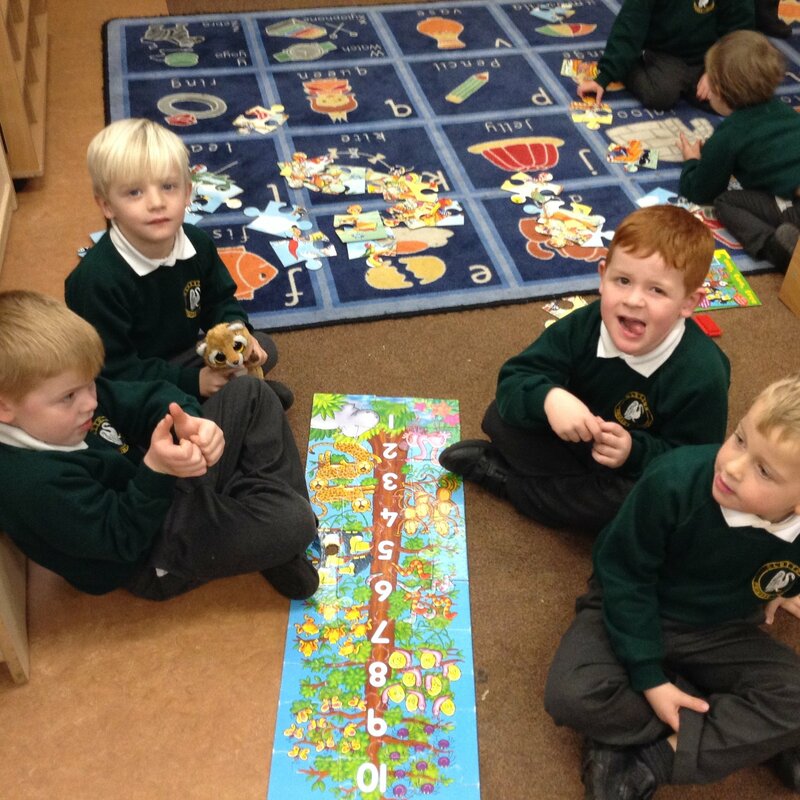 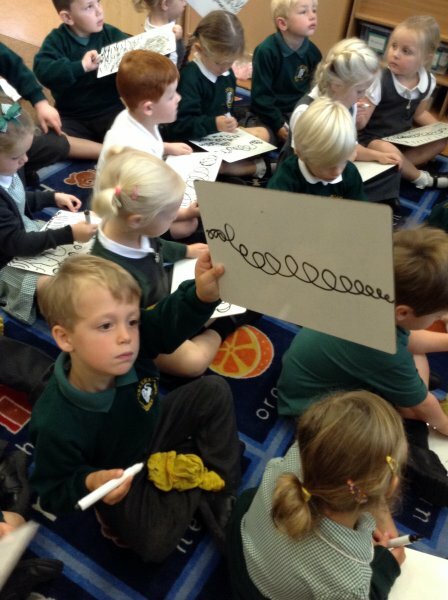 The children are doing so well with their letter sounds. 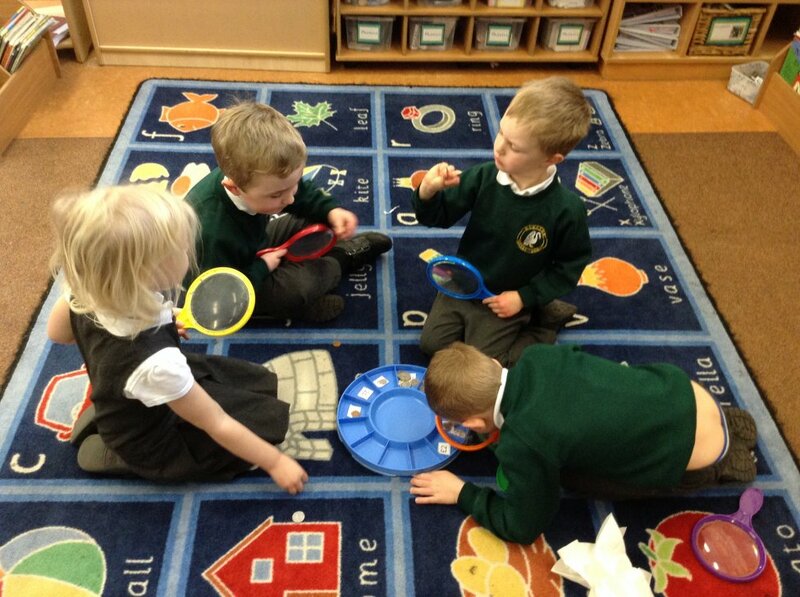 This week we learnt i, n, m and d and have been practising listening out for the first sound in words. 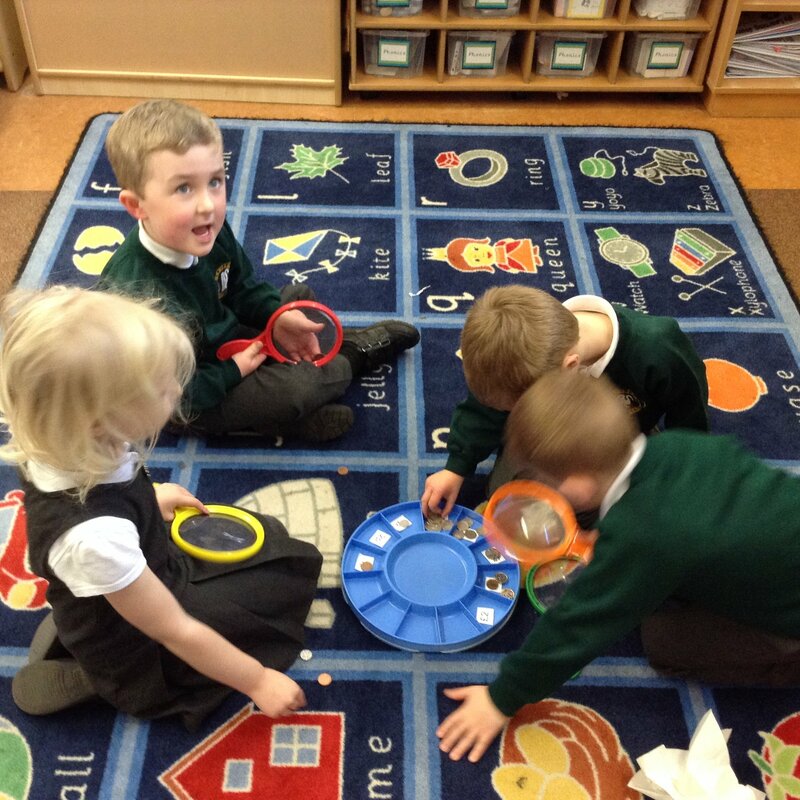 I hope you enjoy practising your sounds in the little tins. 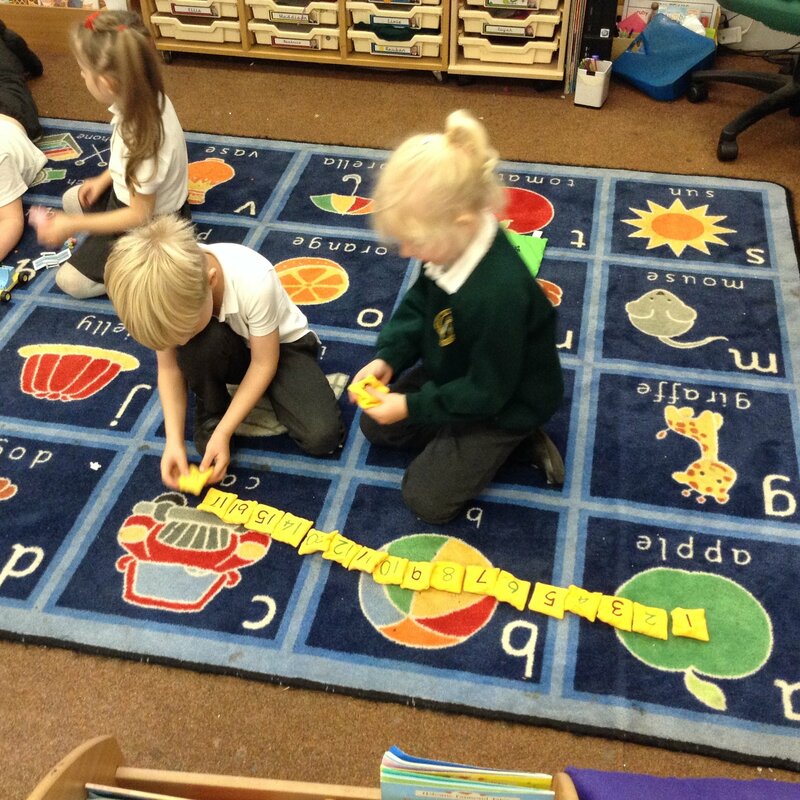 See how many words you can make! 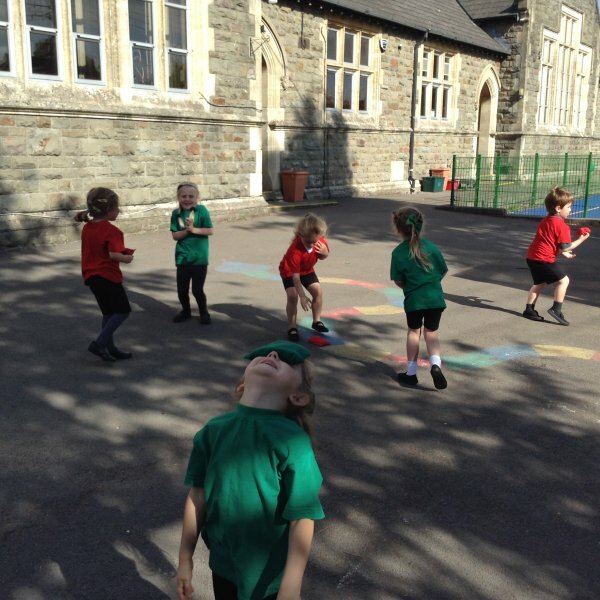 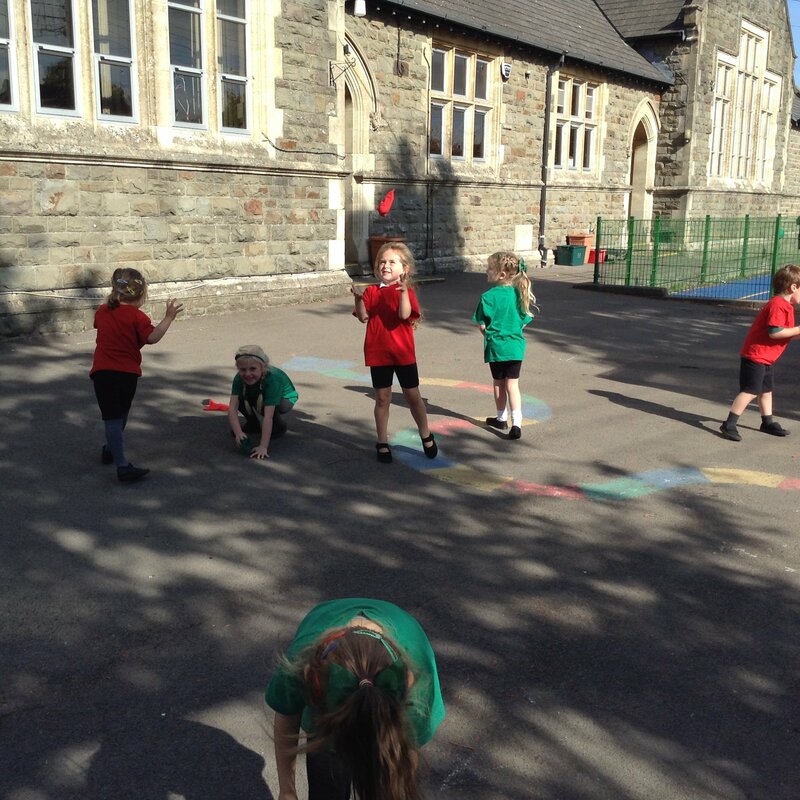 Another successful PE lesson with Mrs Morris - as you can see! 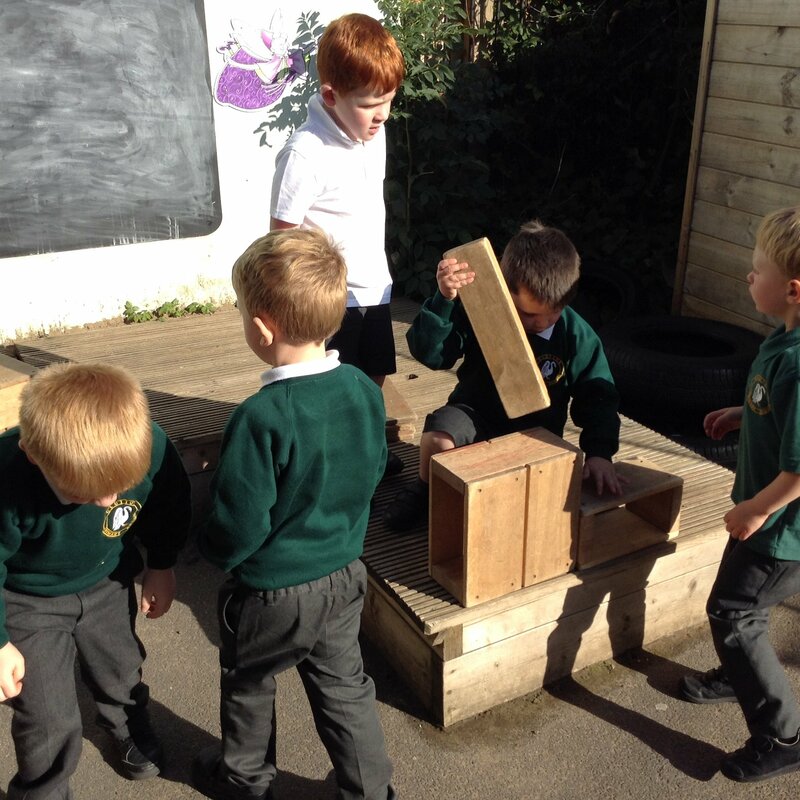 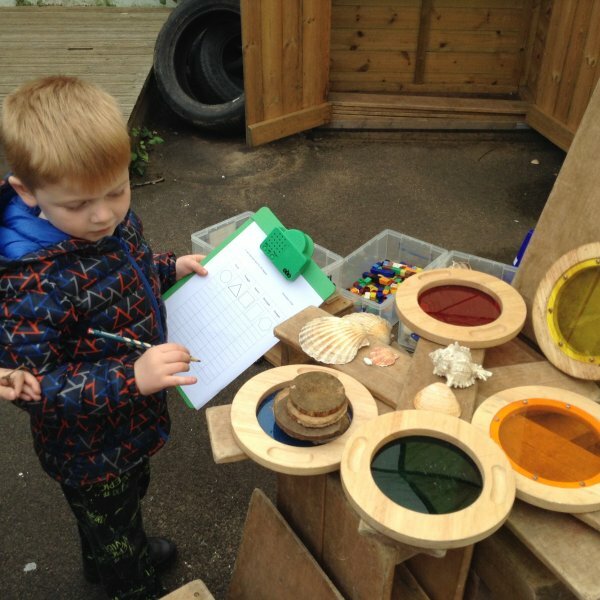 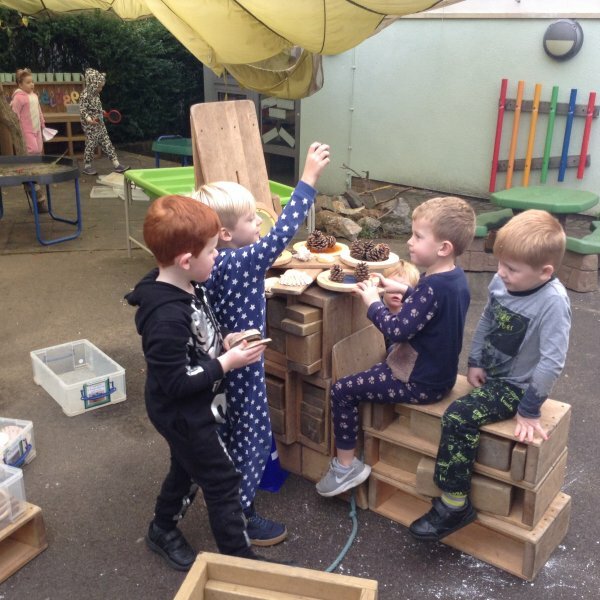 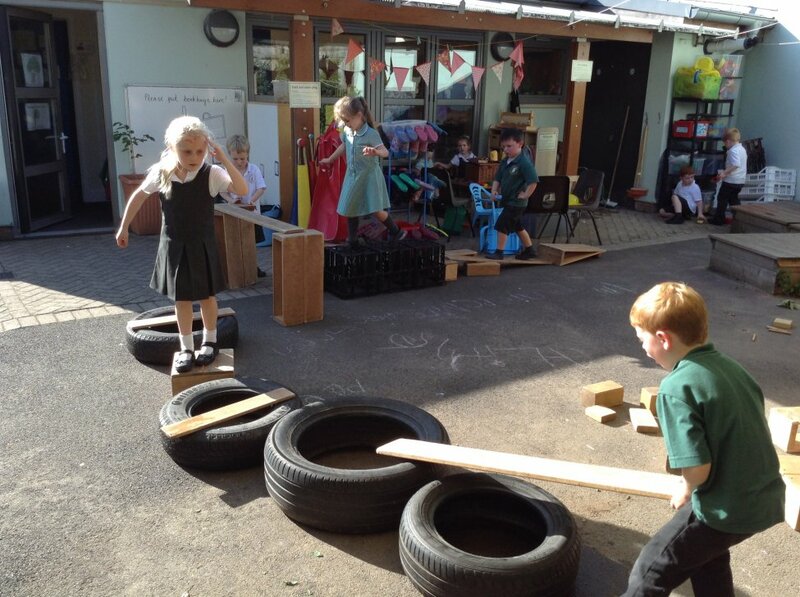 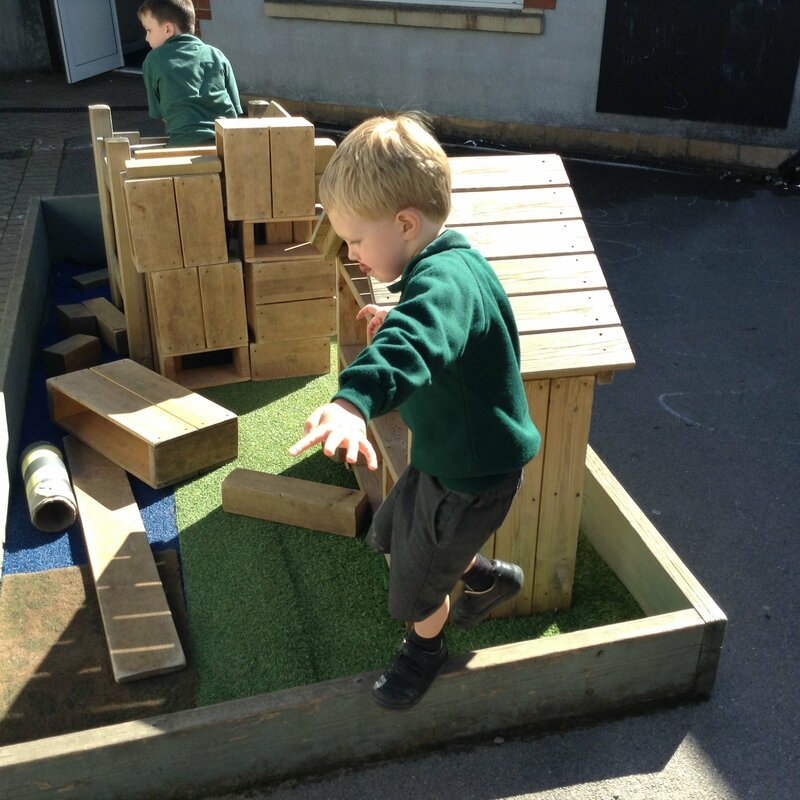 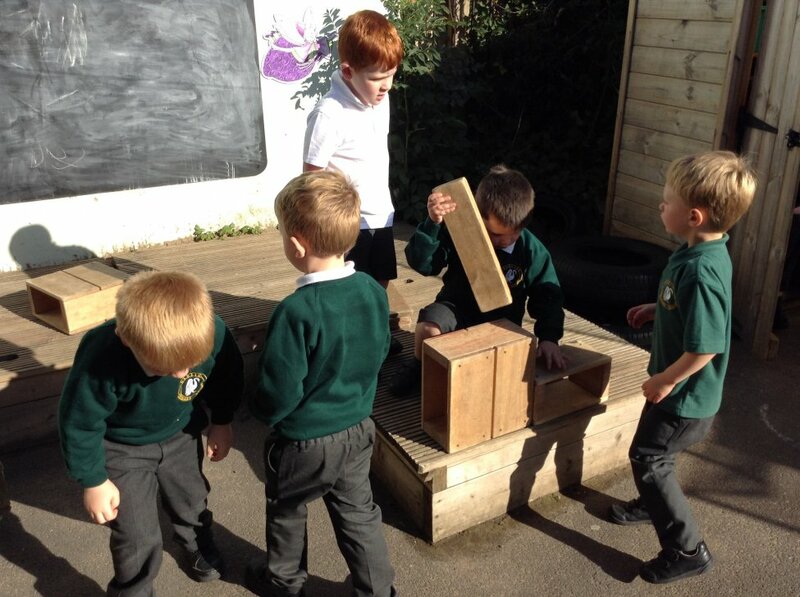 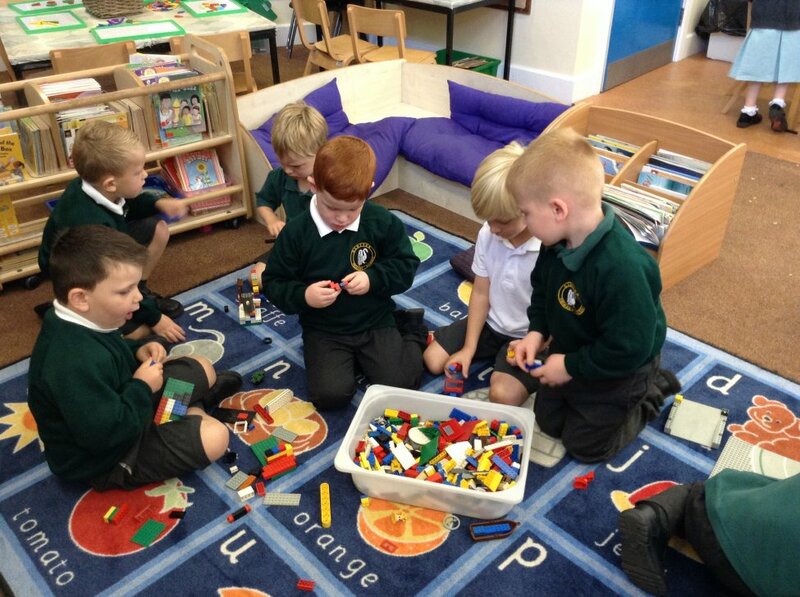 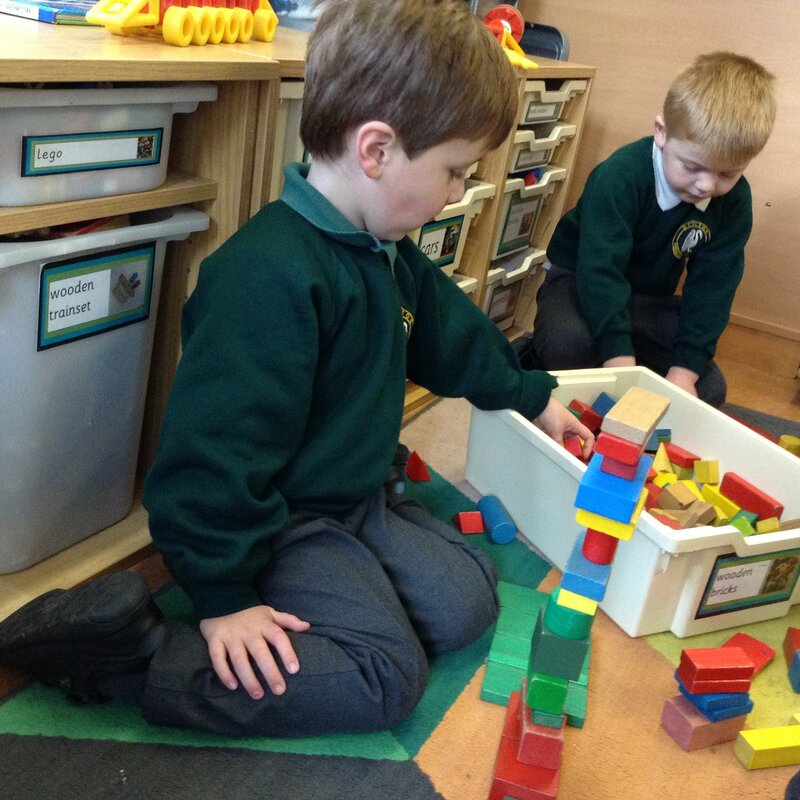 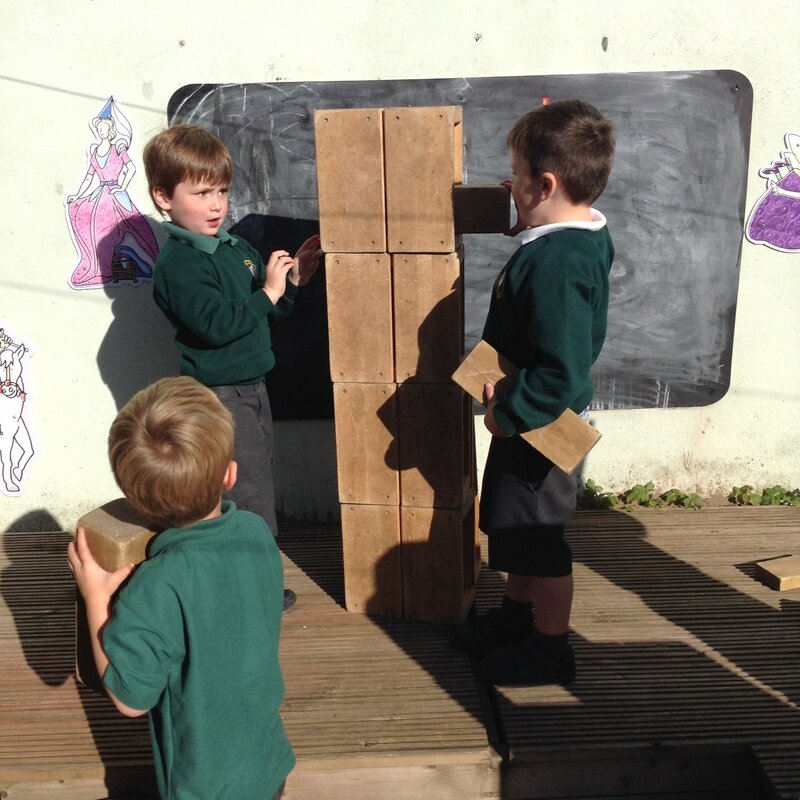 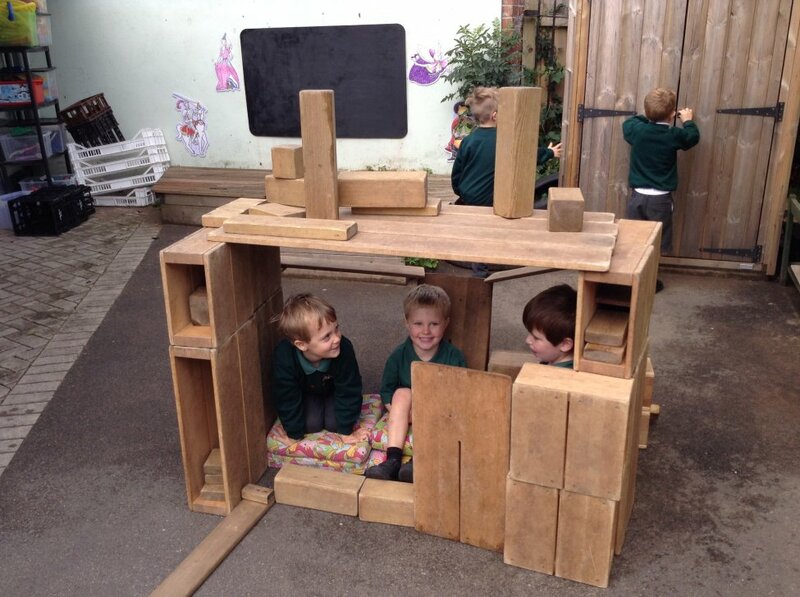 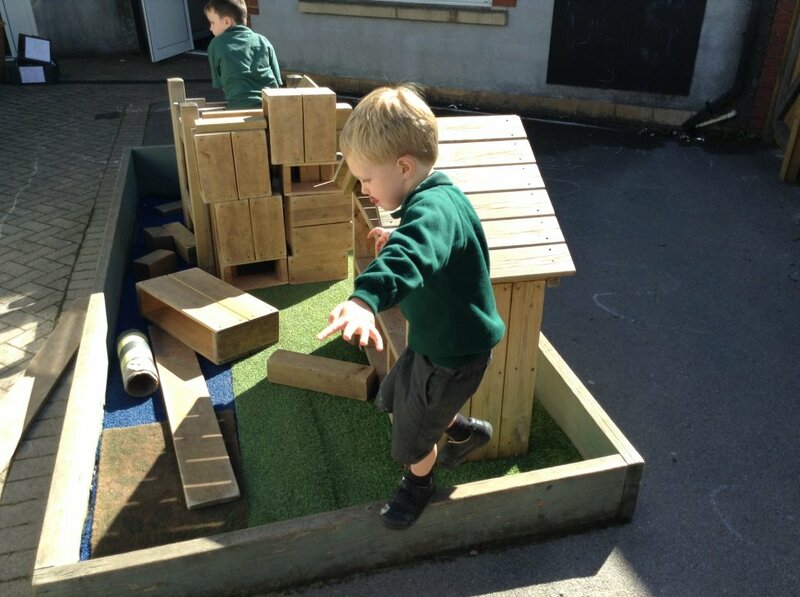 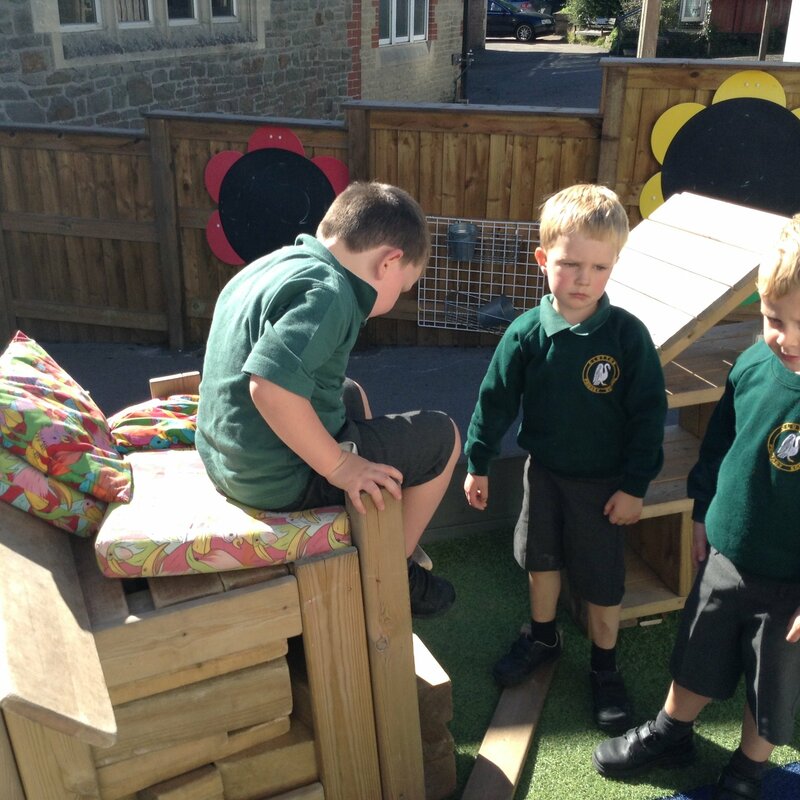 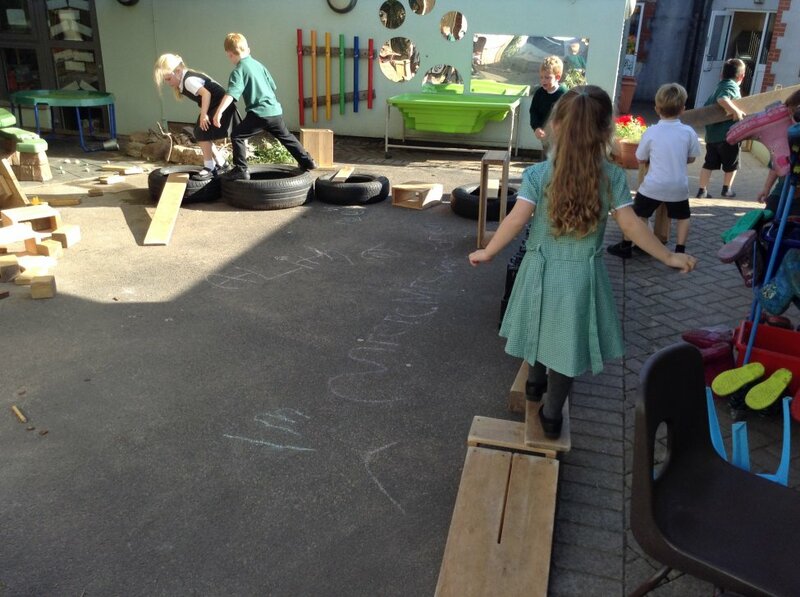 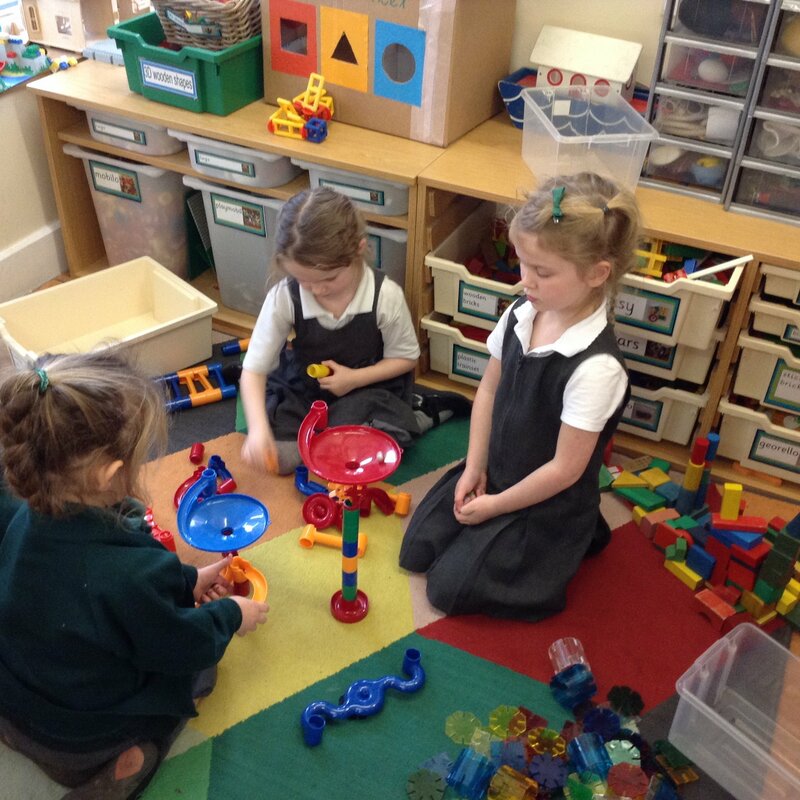 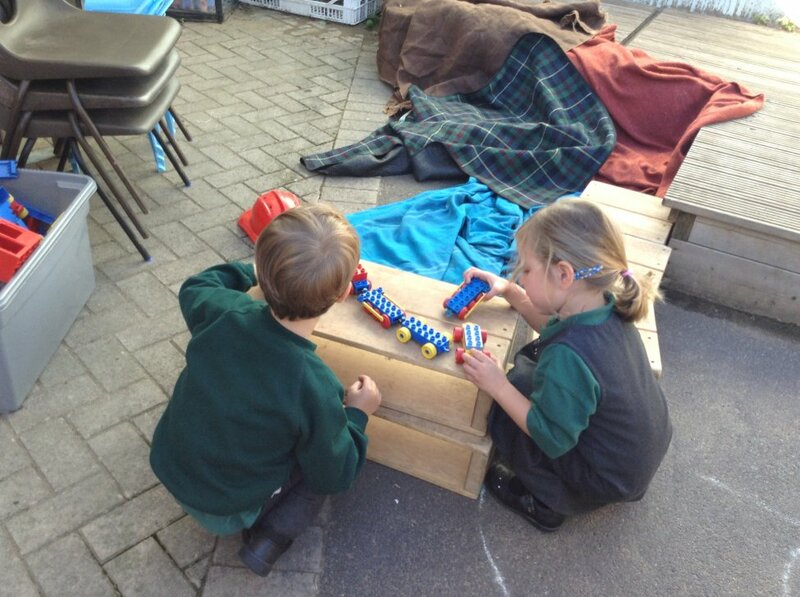 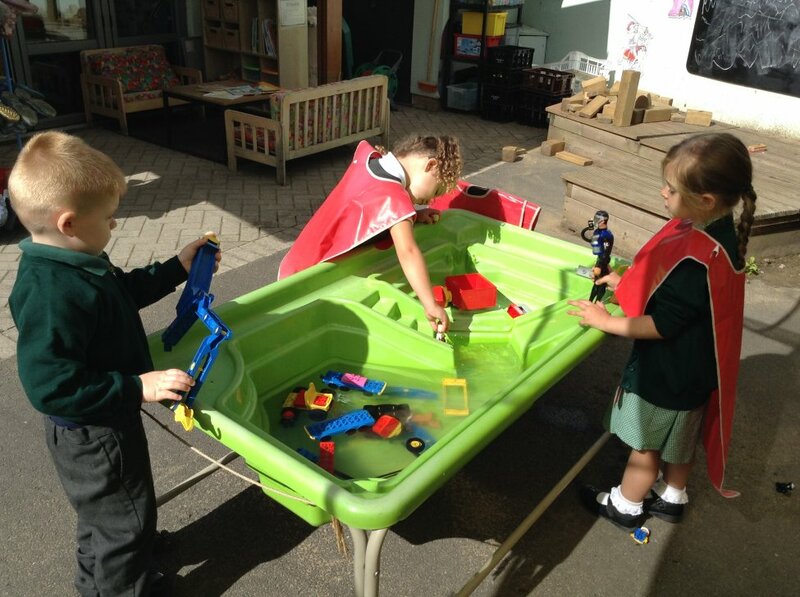 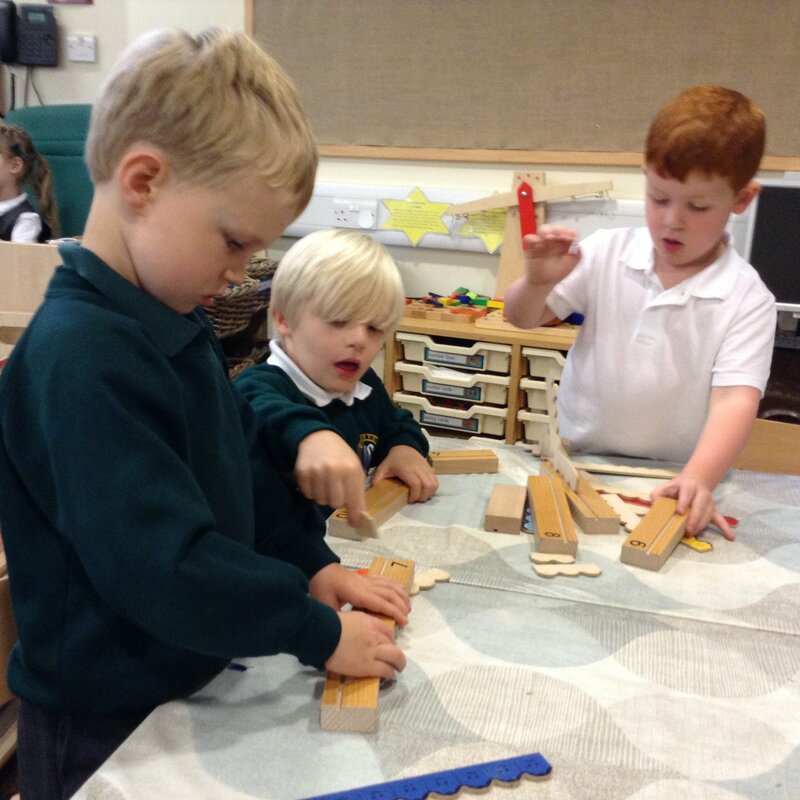 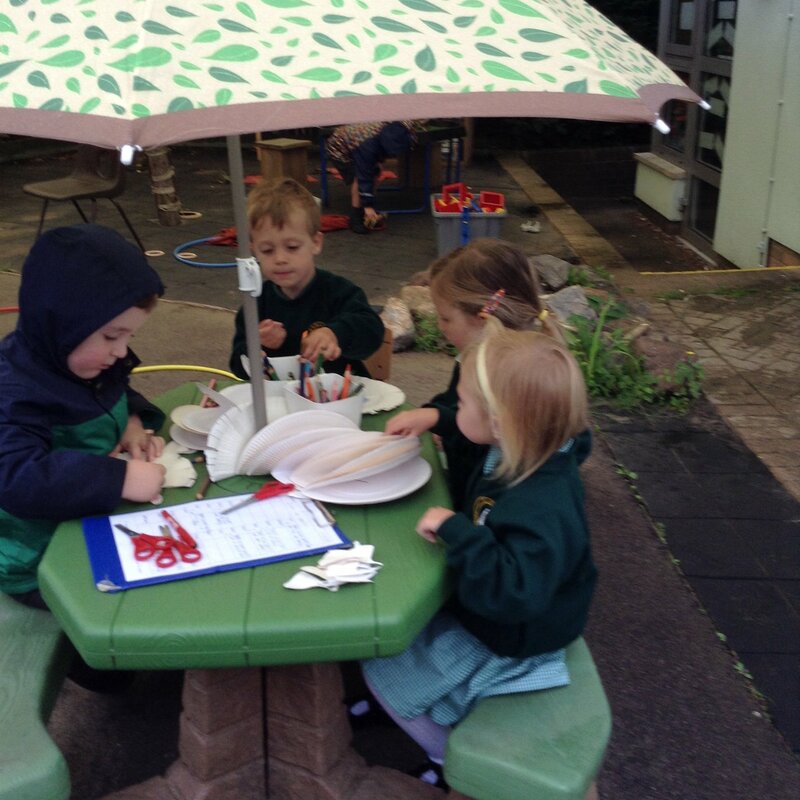 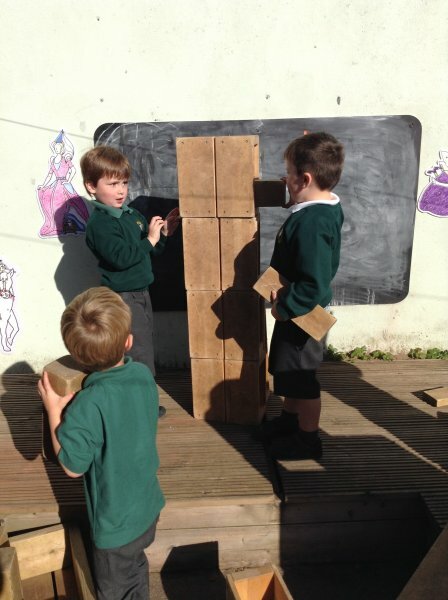 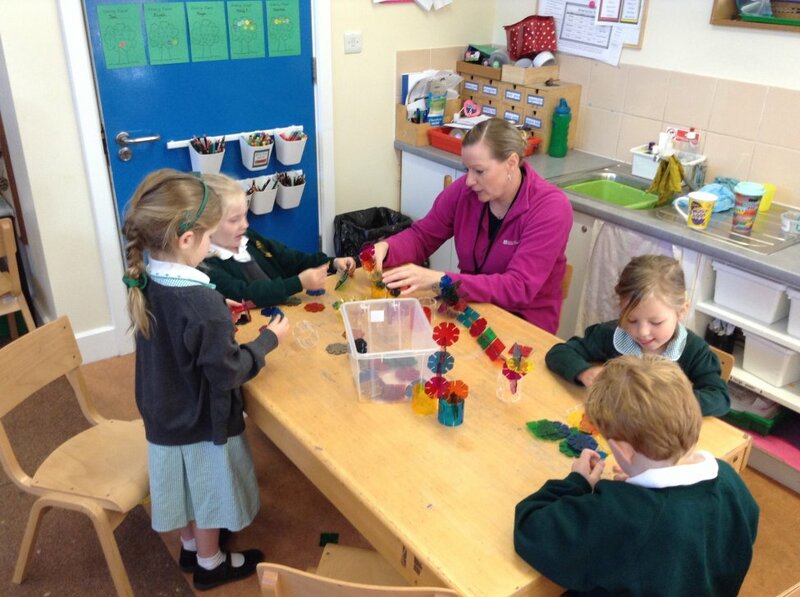 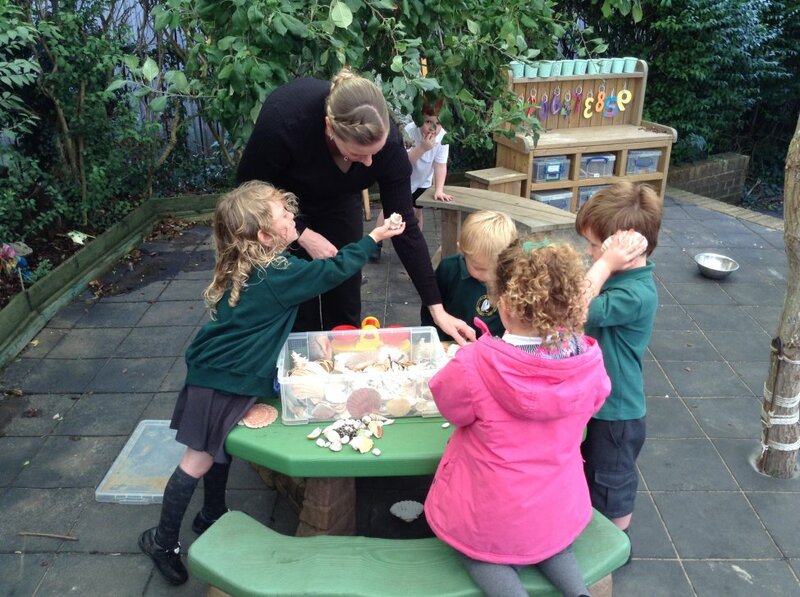 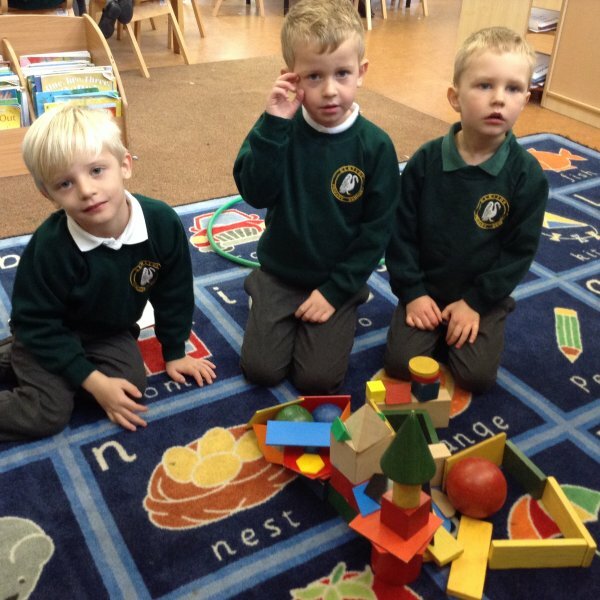 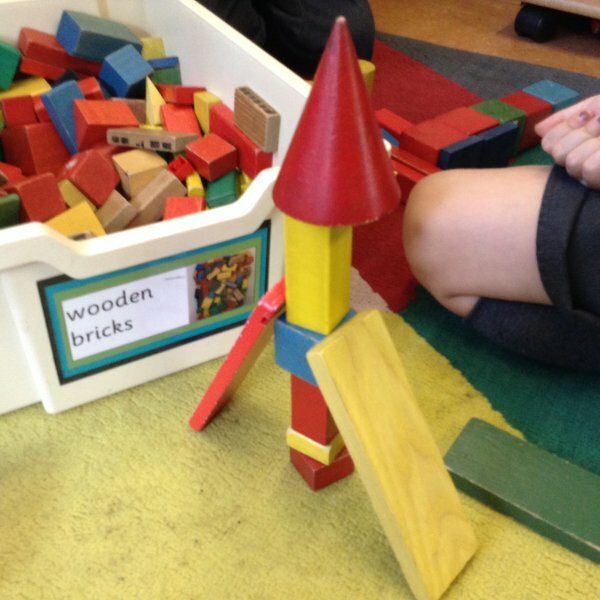 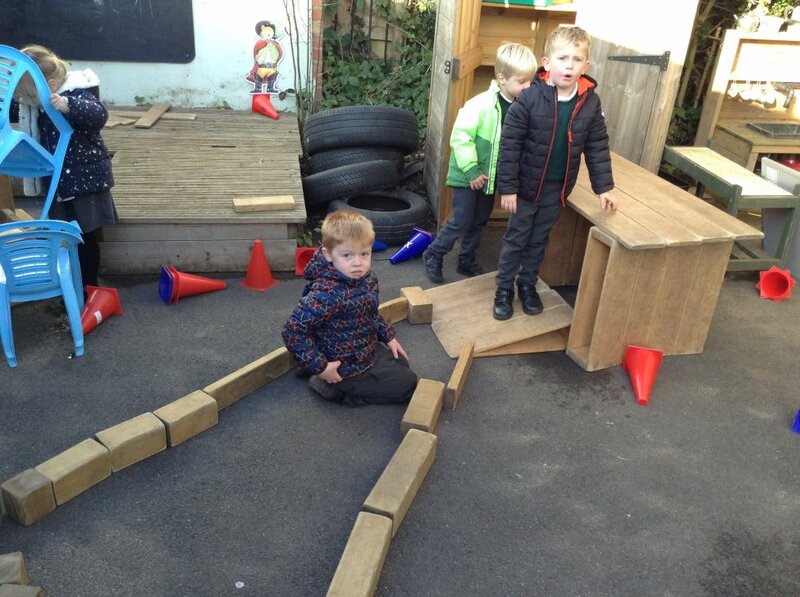 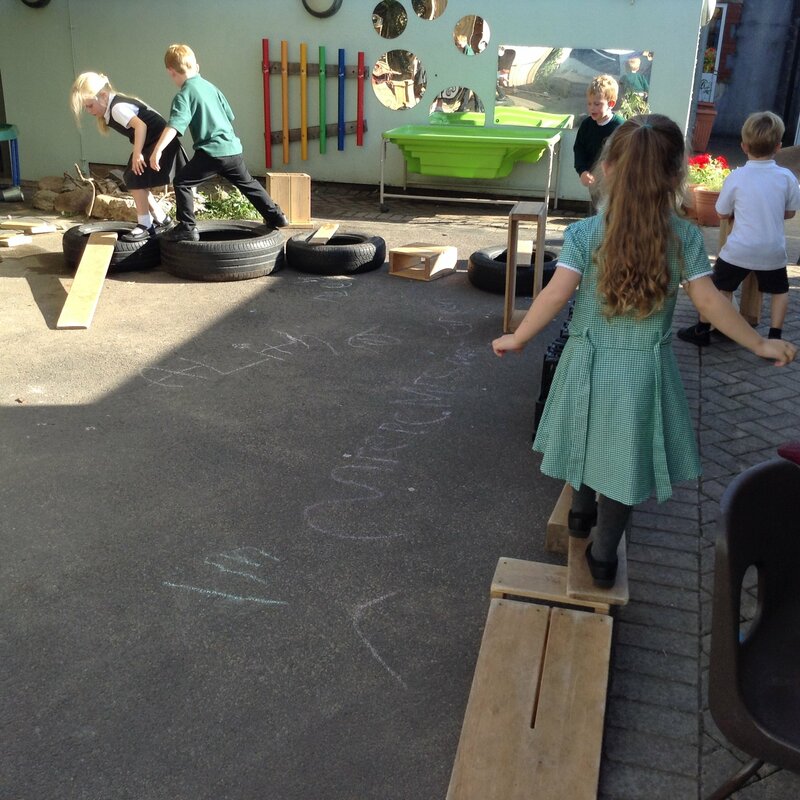 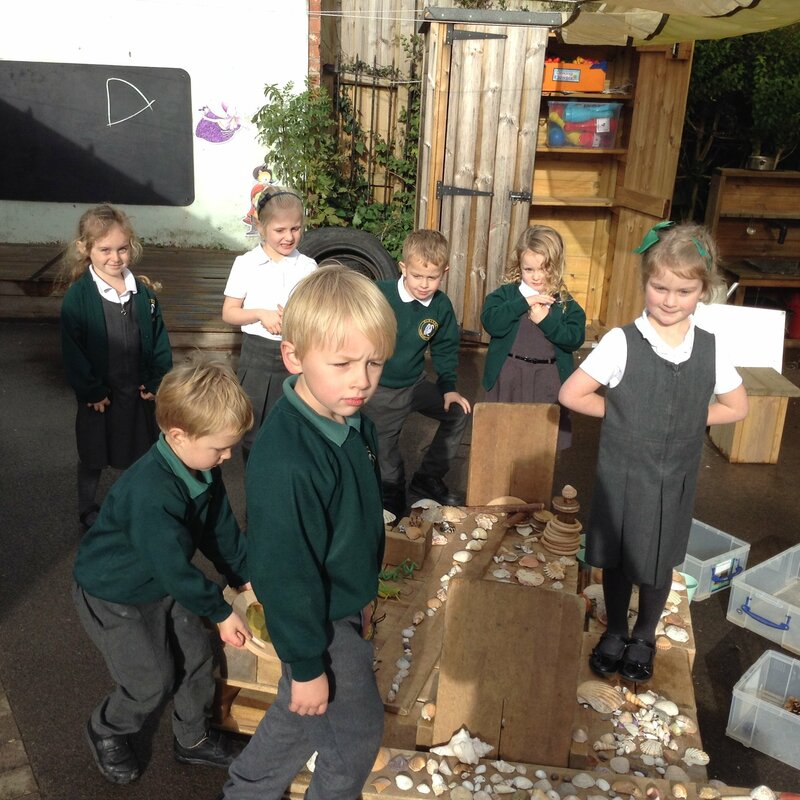 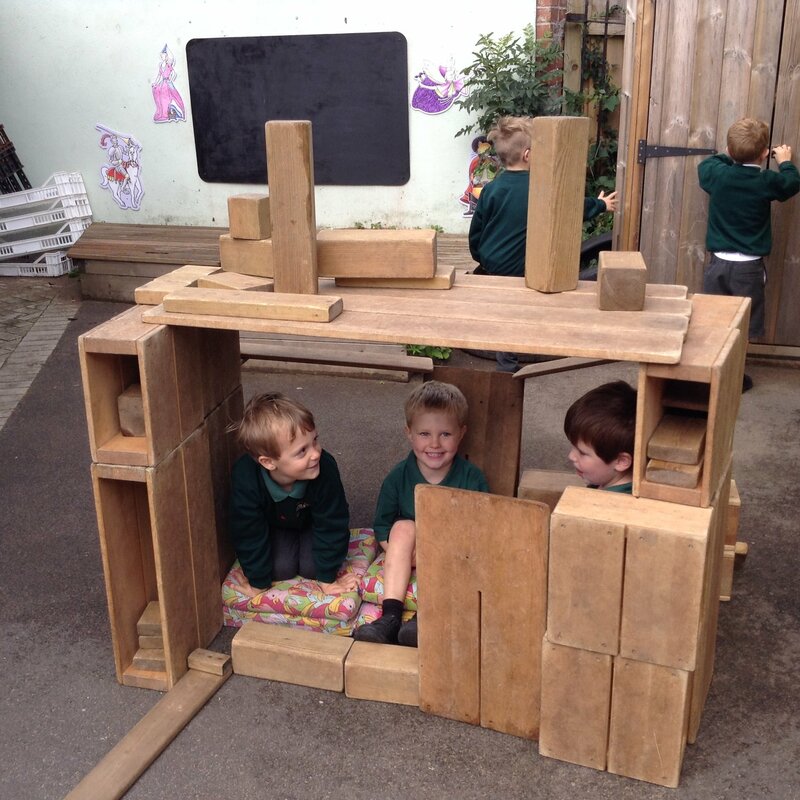 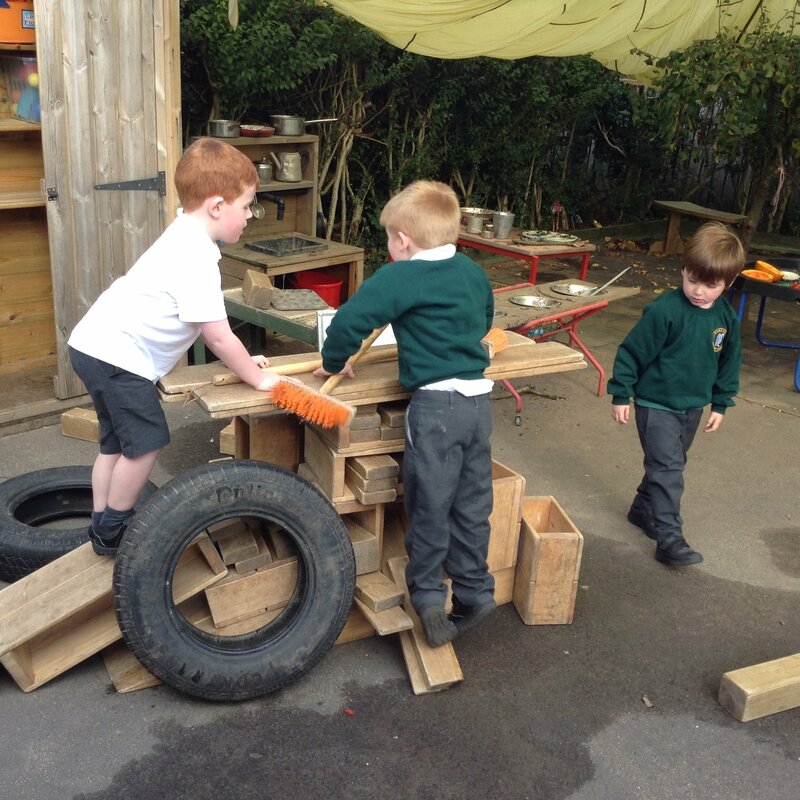 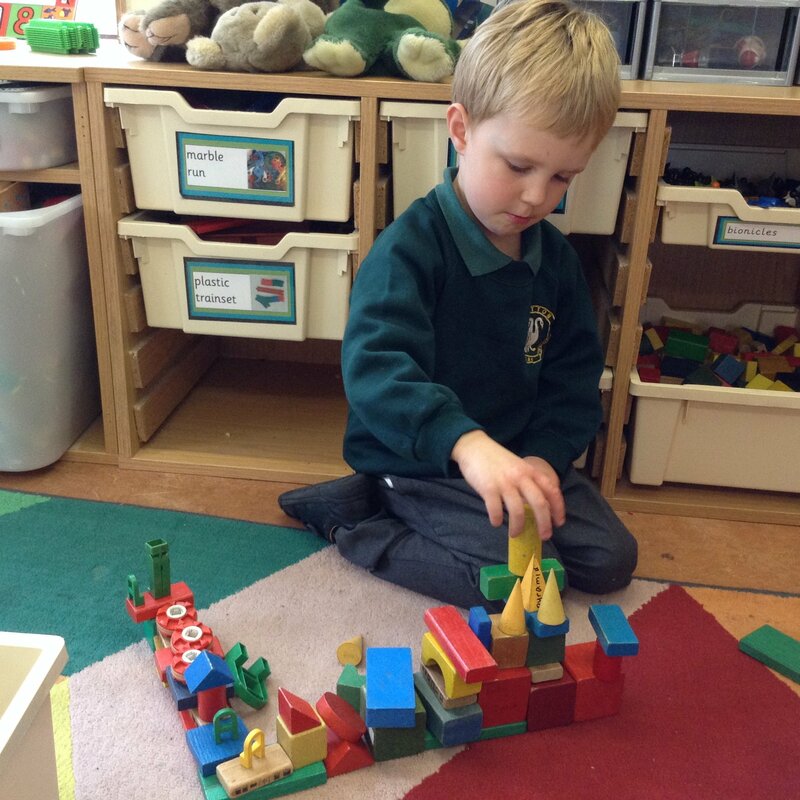 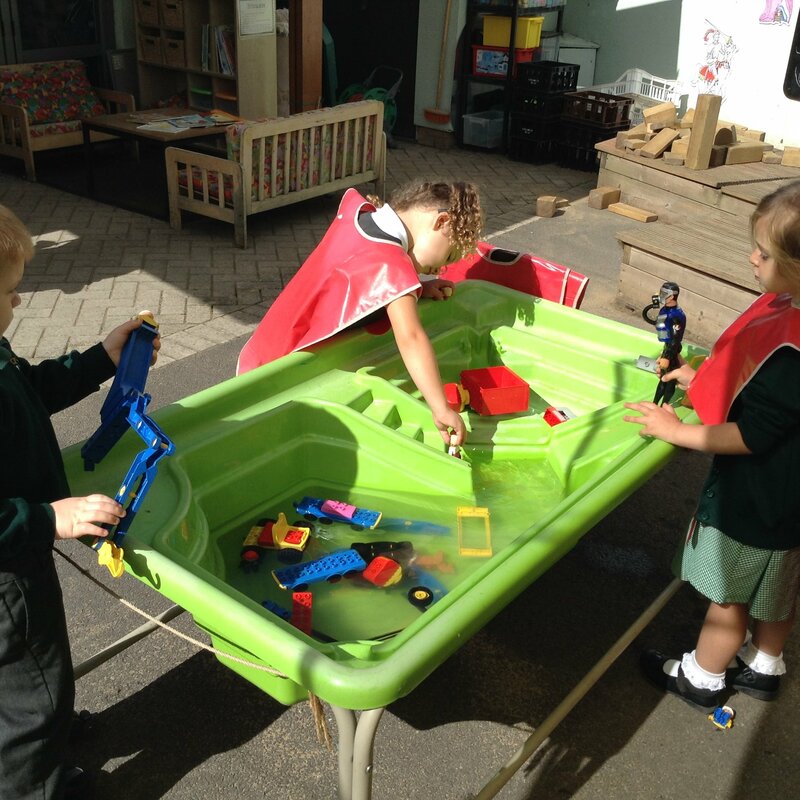 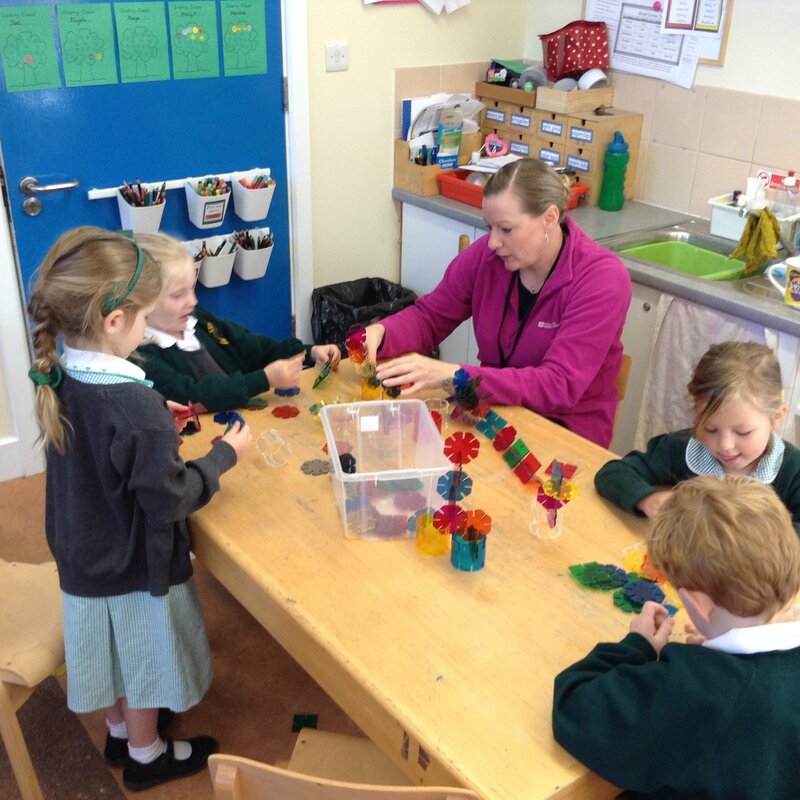 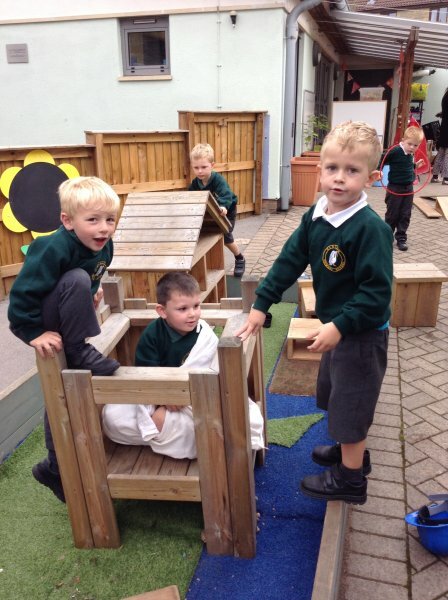 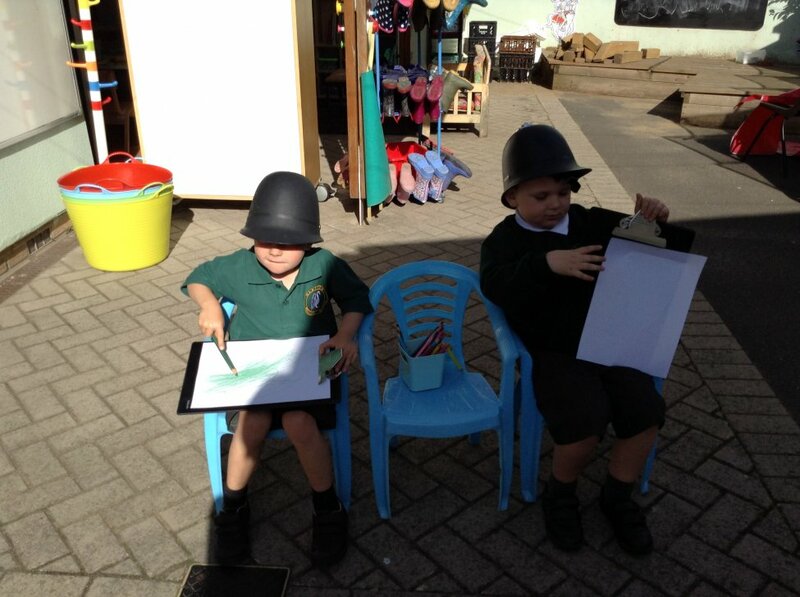 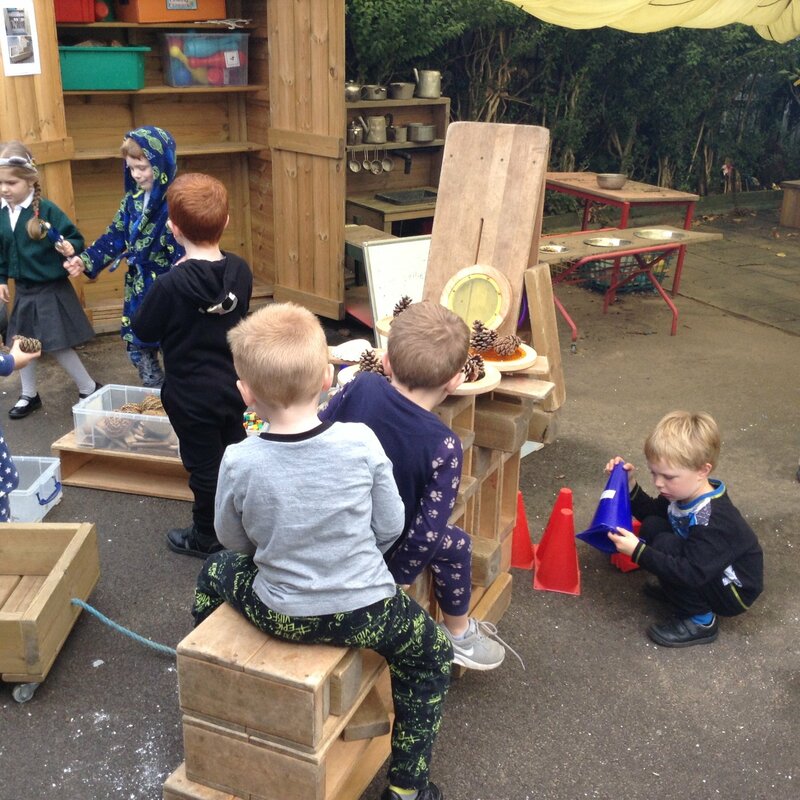 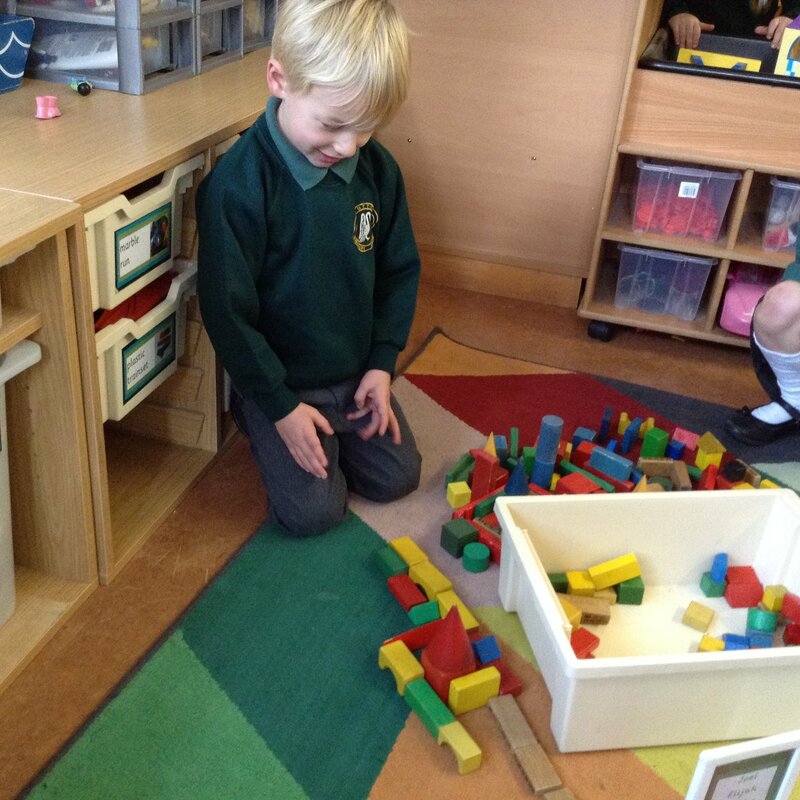 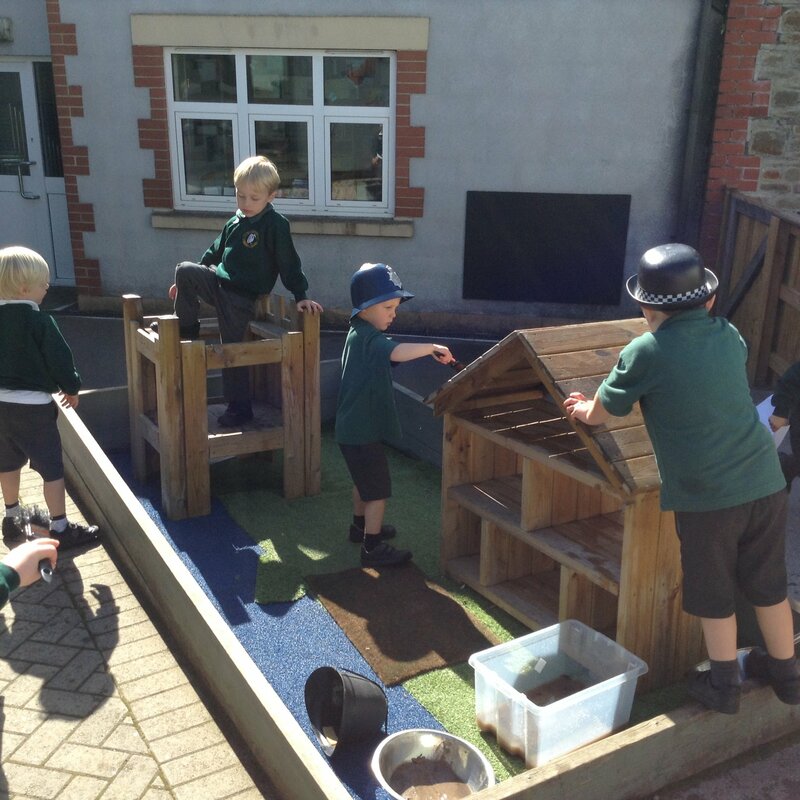 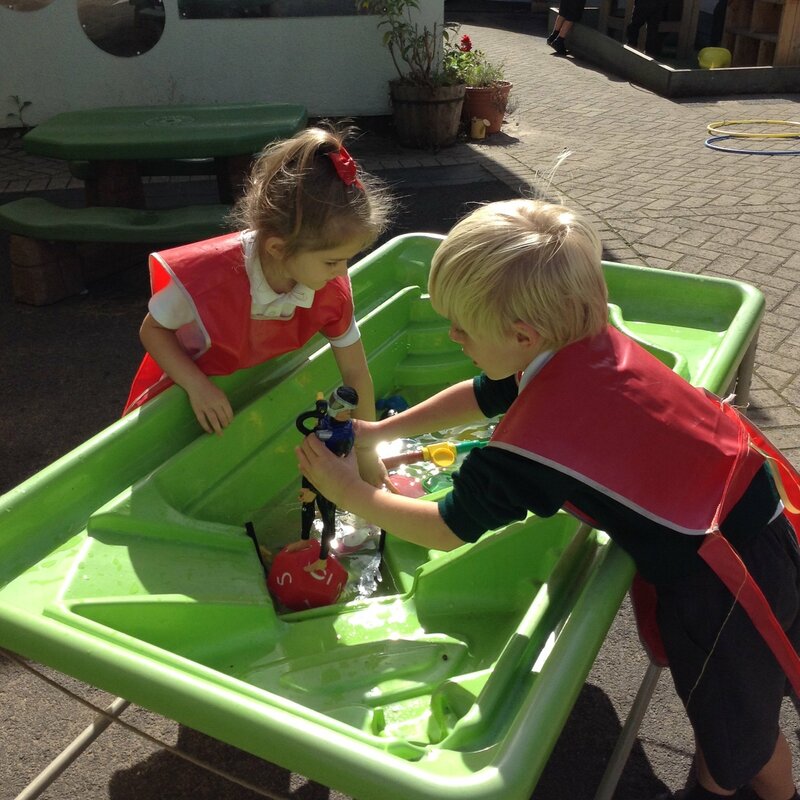 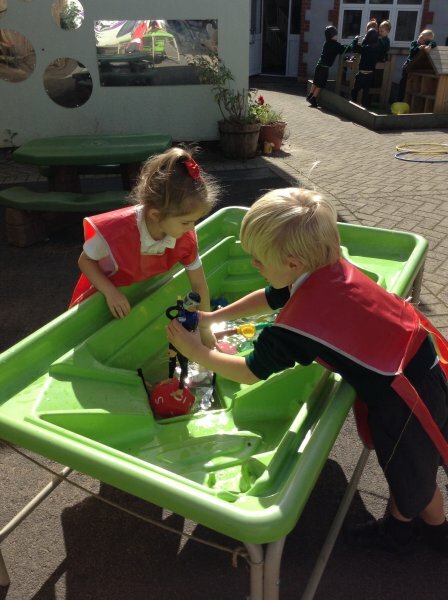 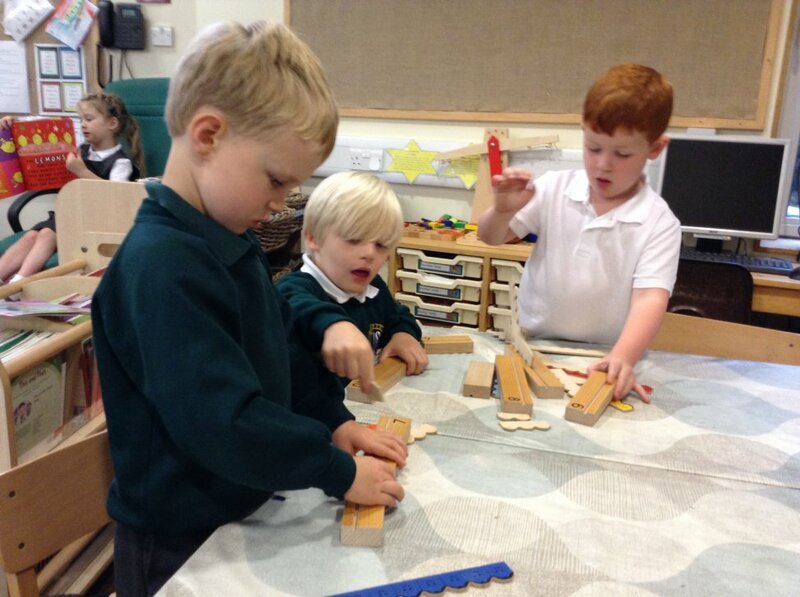 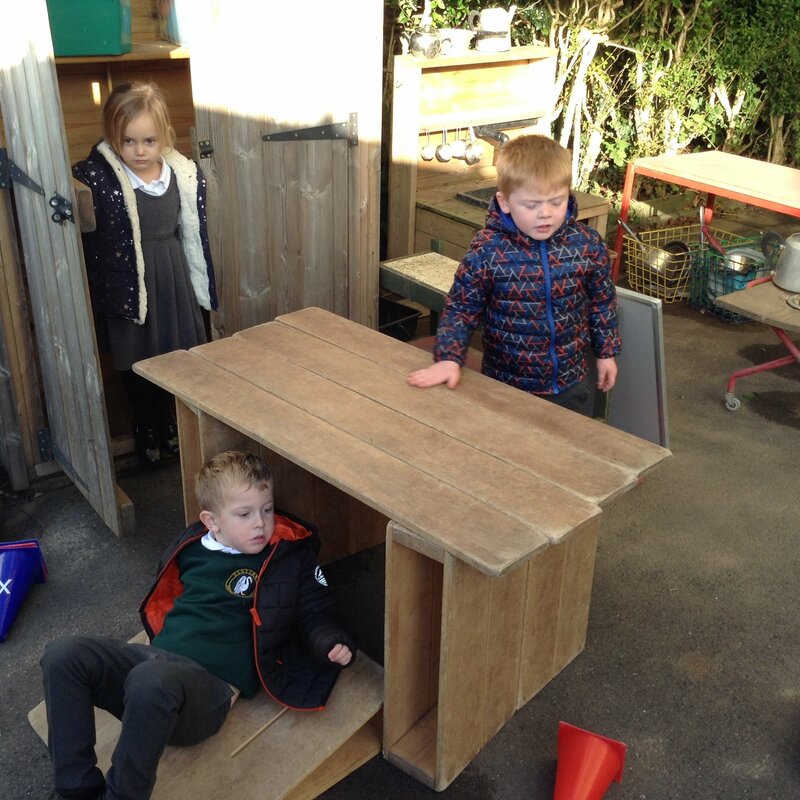 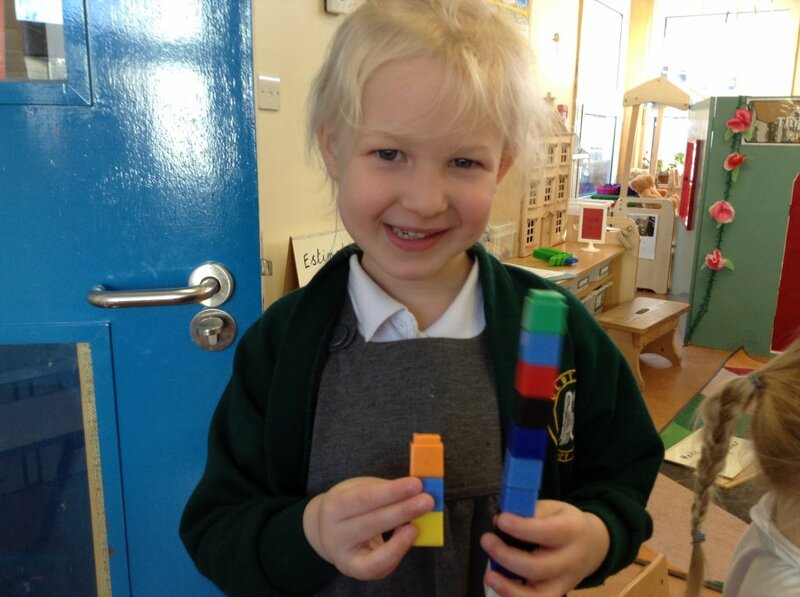 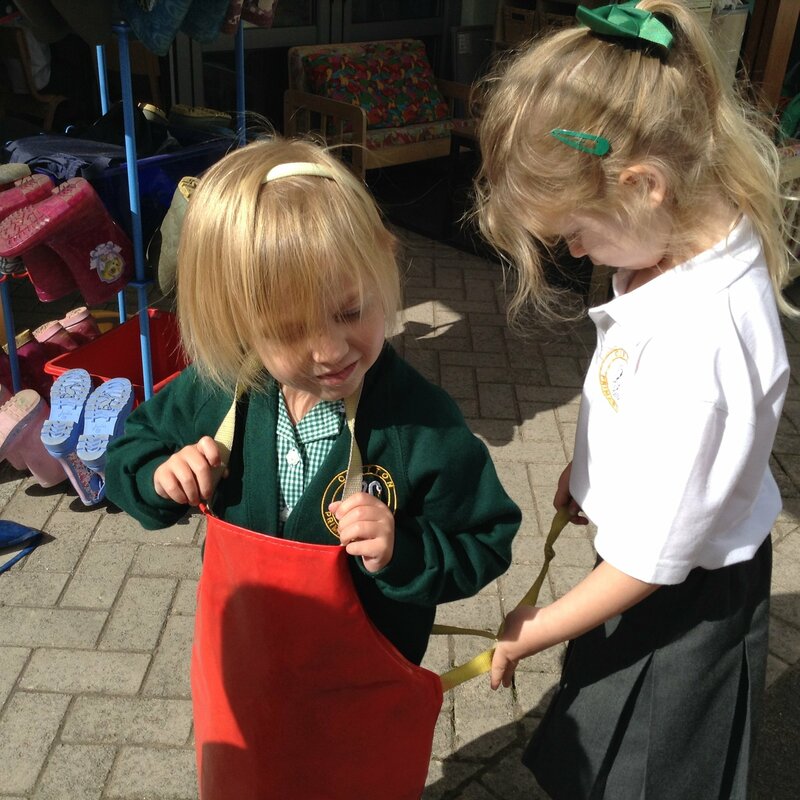 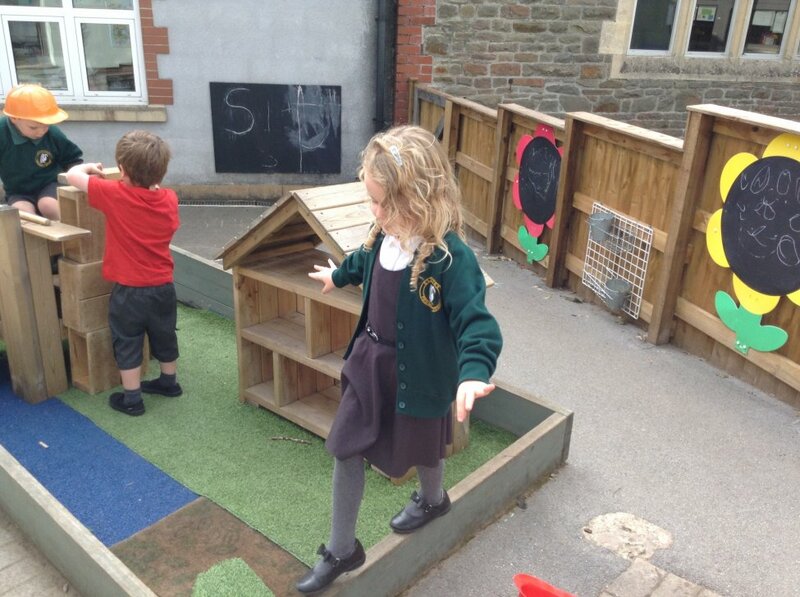 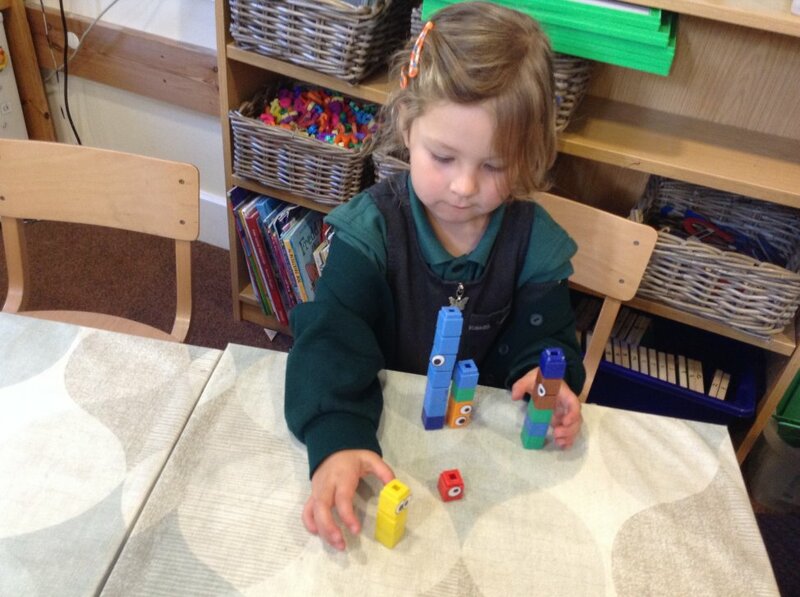 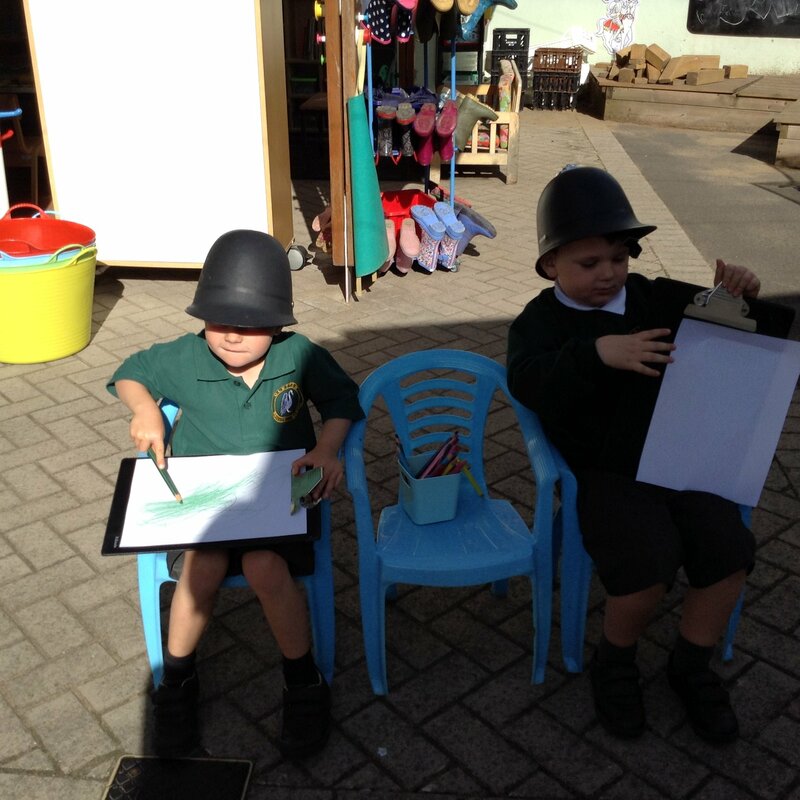 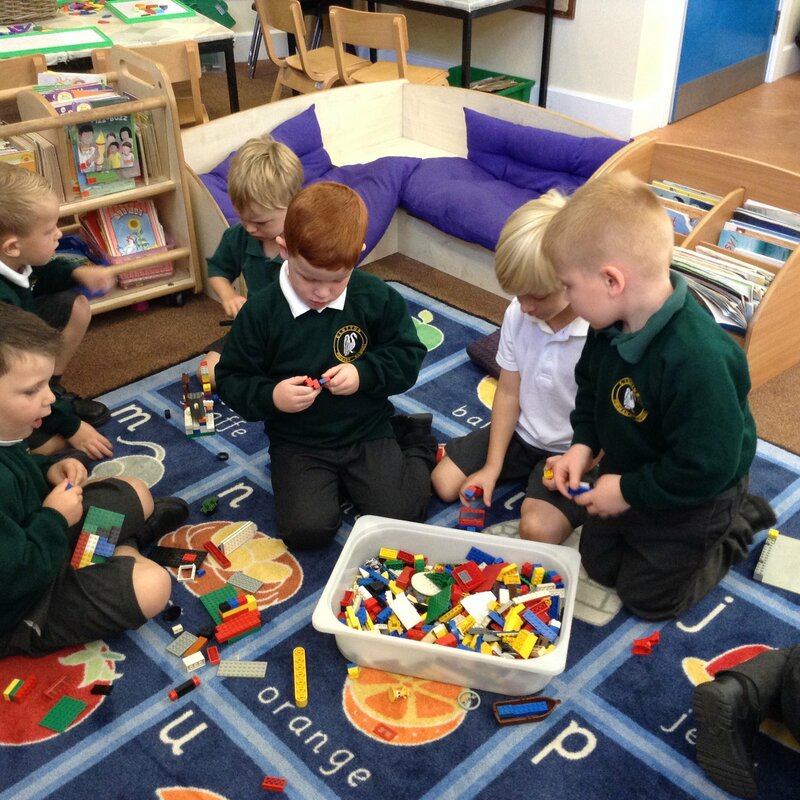 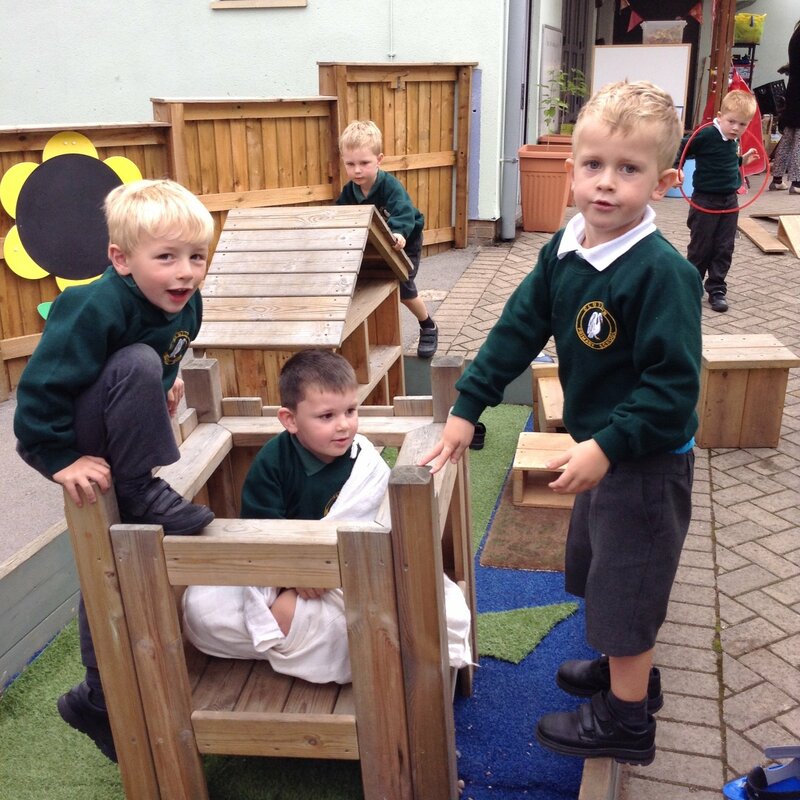 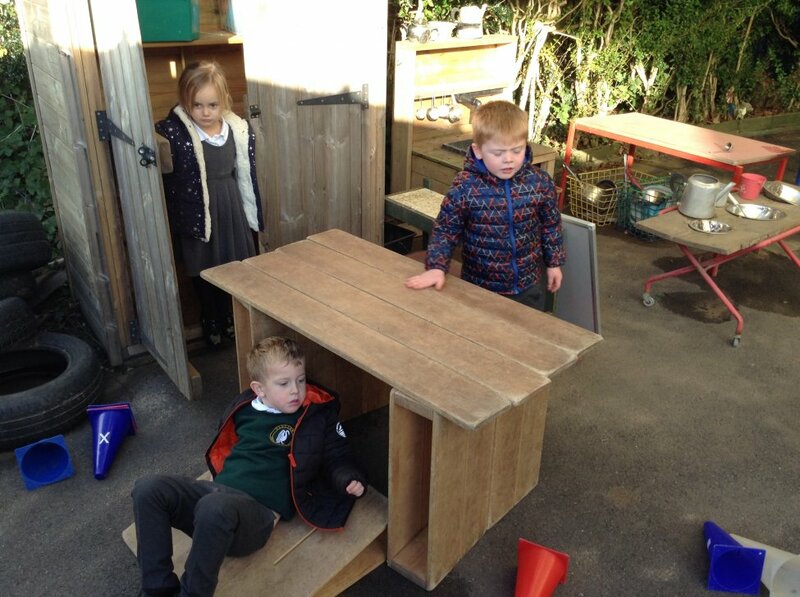 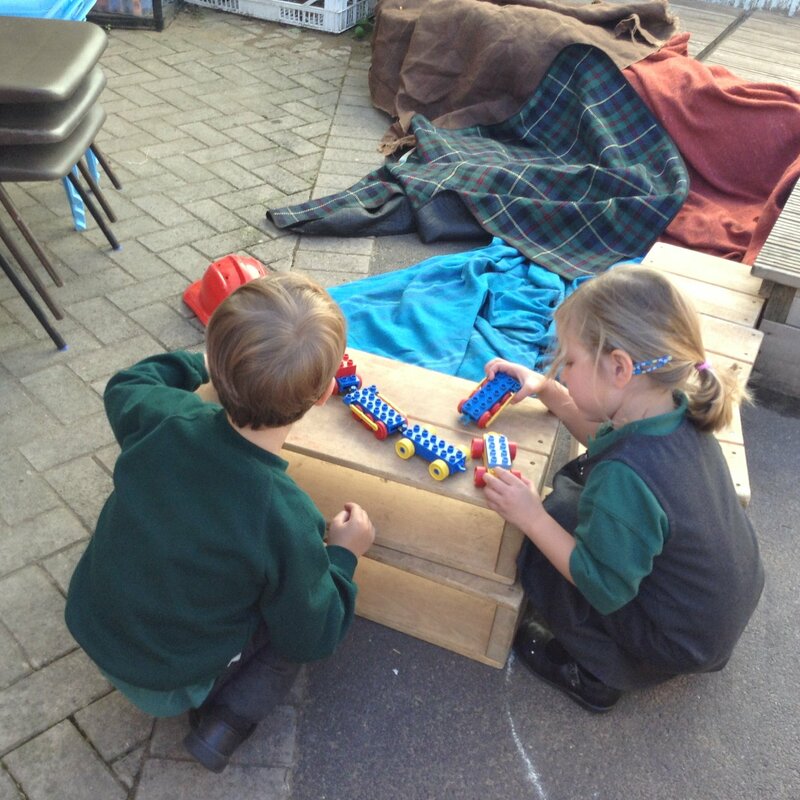 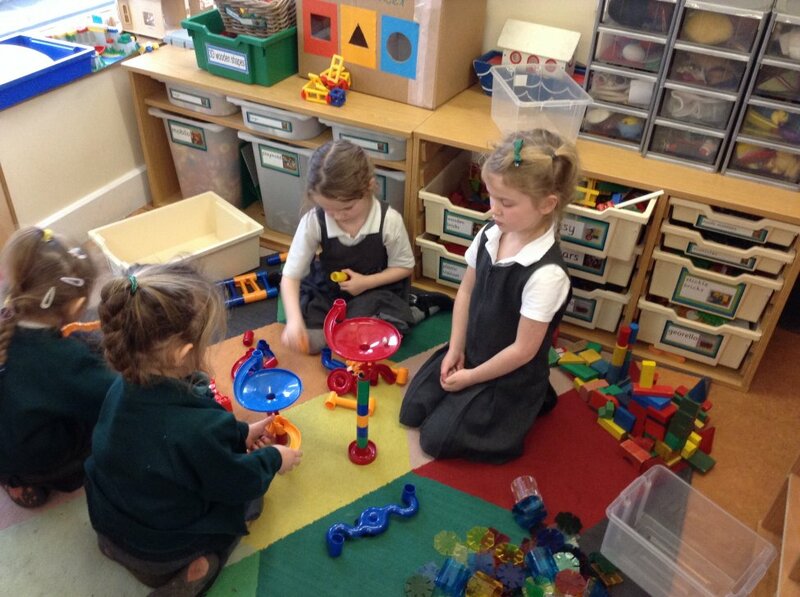 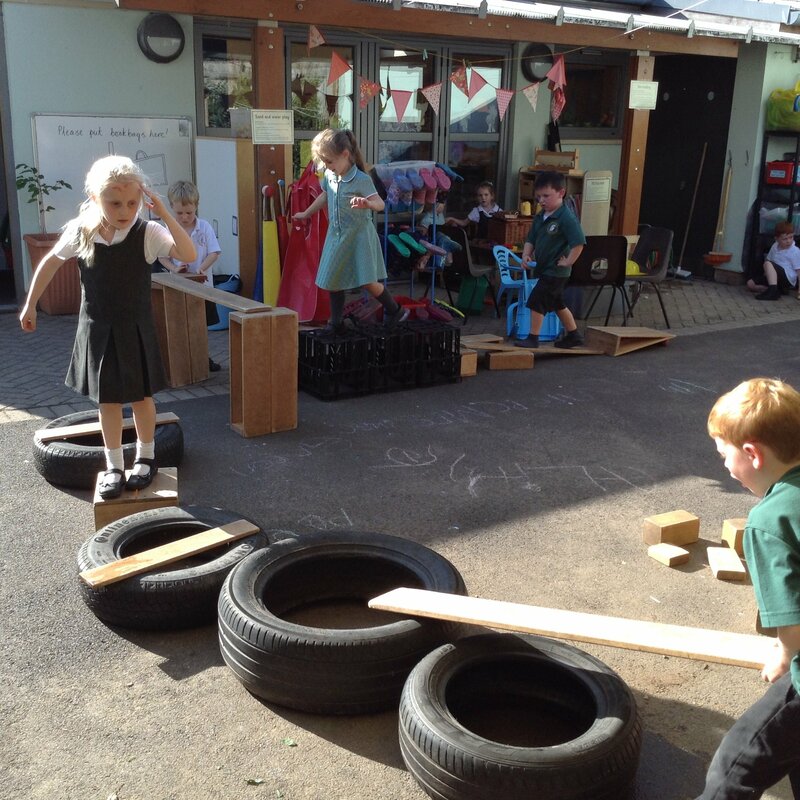 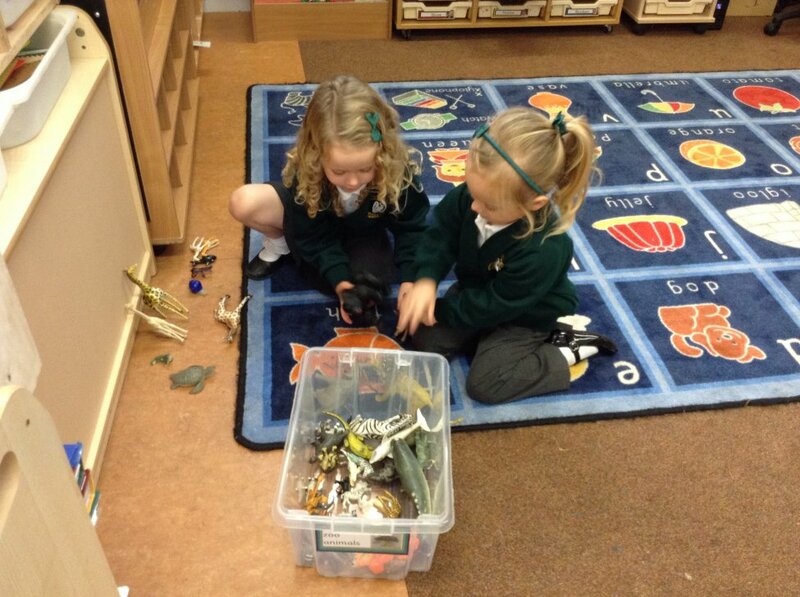 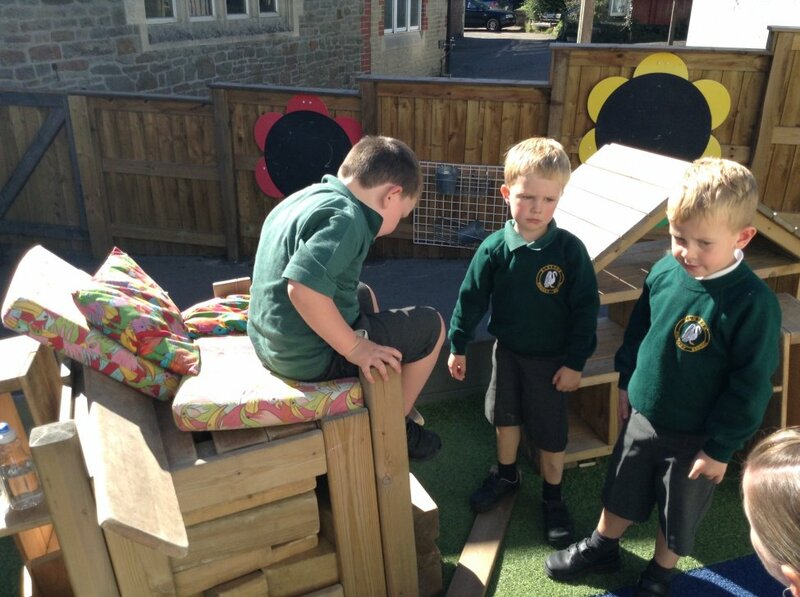 It is lovely to see how creative the children are with the big wooden blocks outside and the construction toys inside. 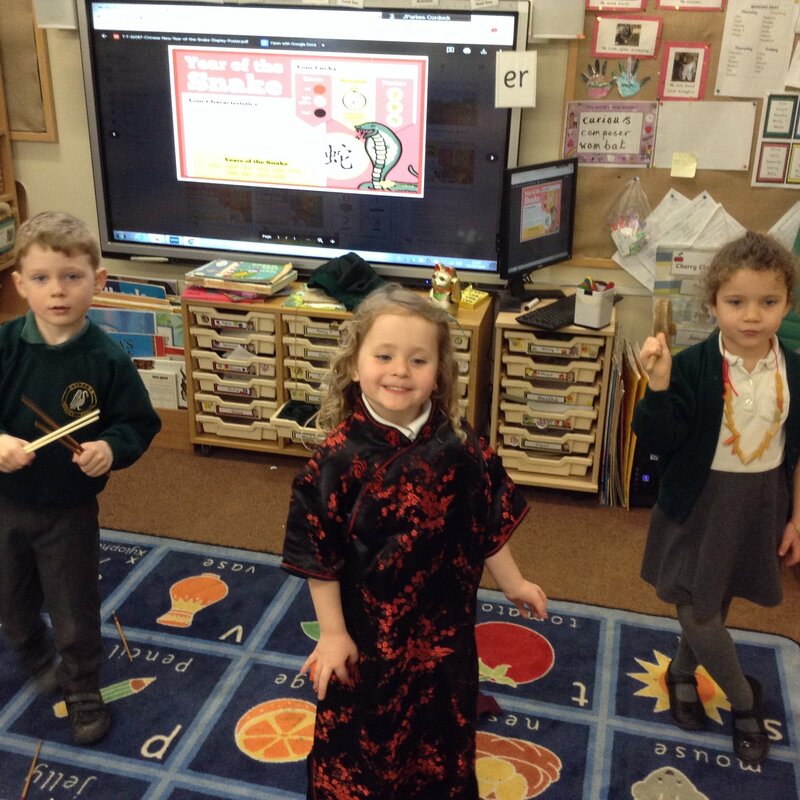 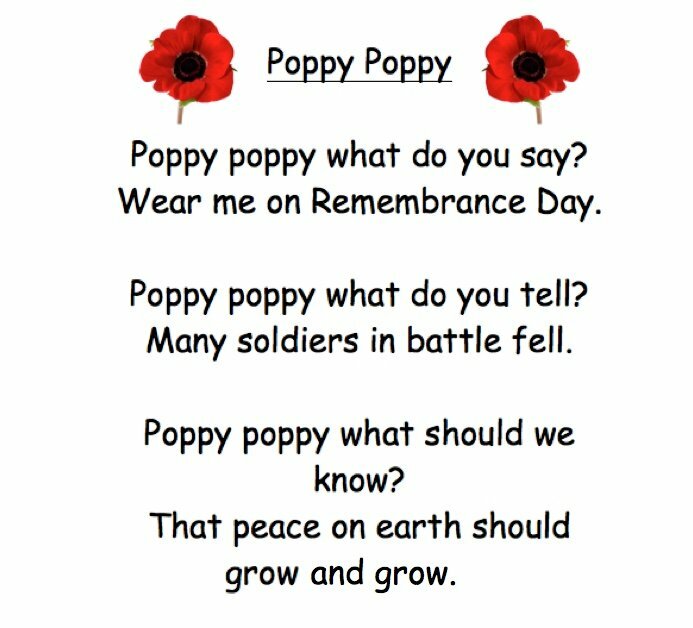 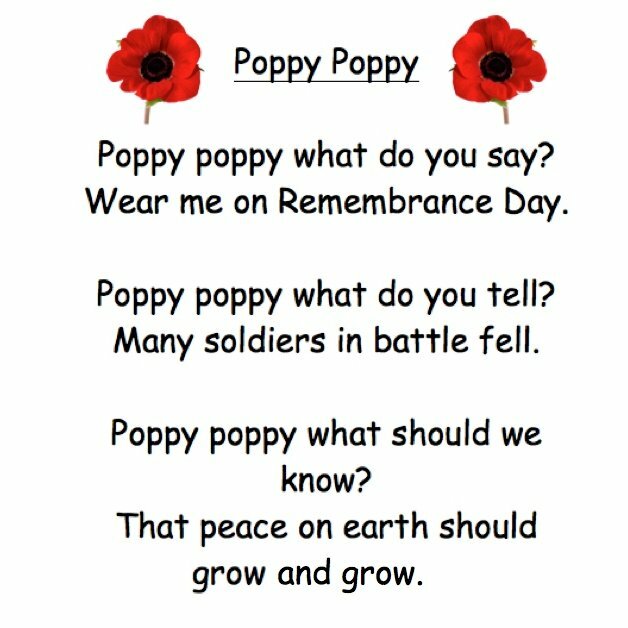 The new experience this week was going to a whole school singing assembly on Wednesday and a poetry celebration assembly on Thursday. 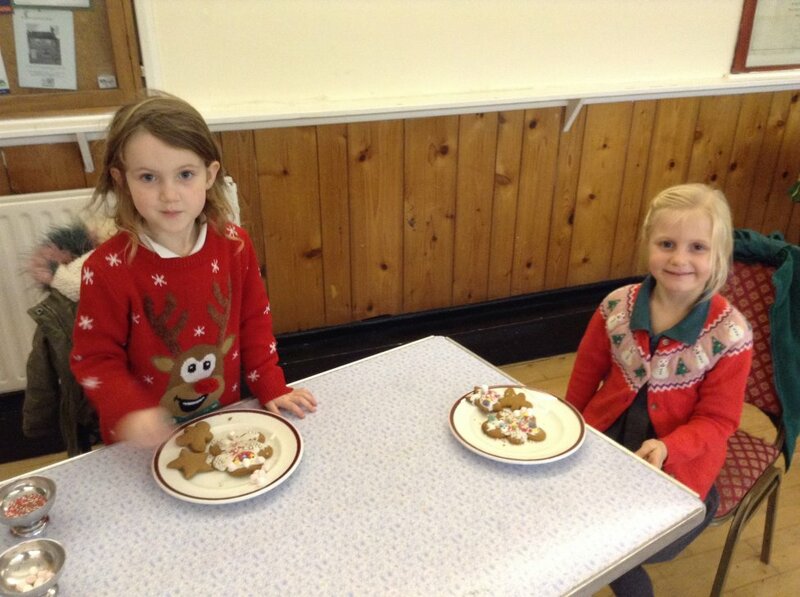 Cherry Class sat beautifully through both. 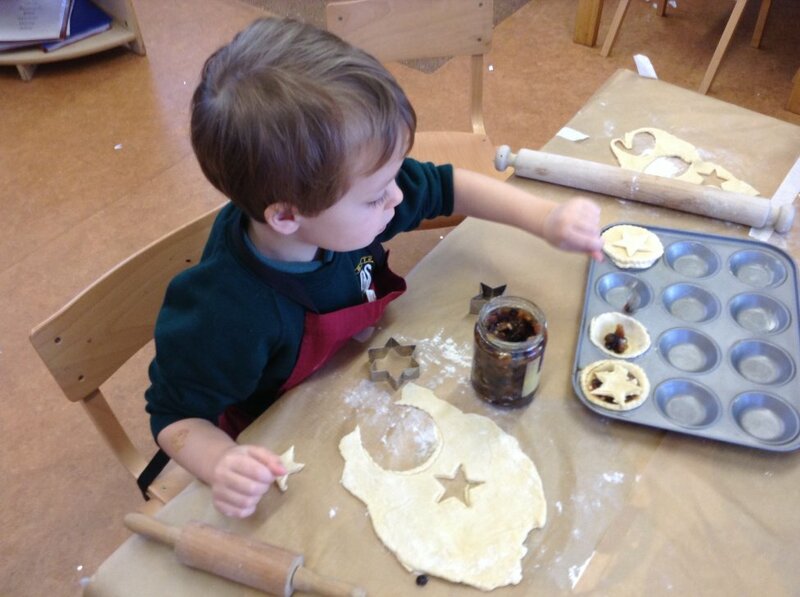 Thank you for all the star moments. 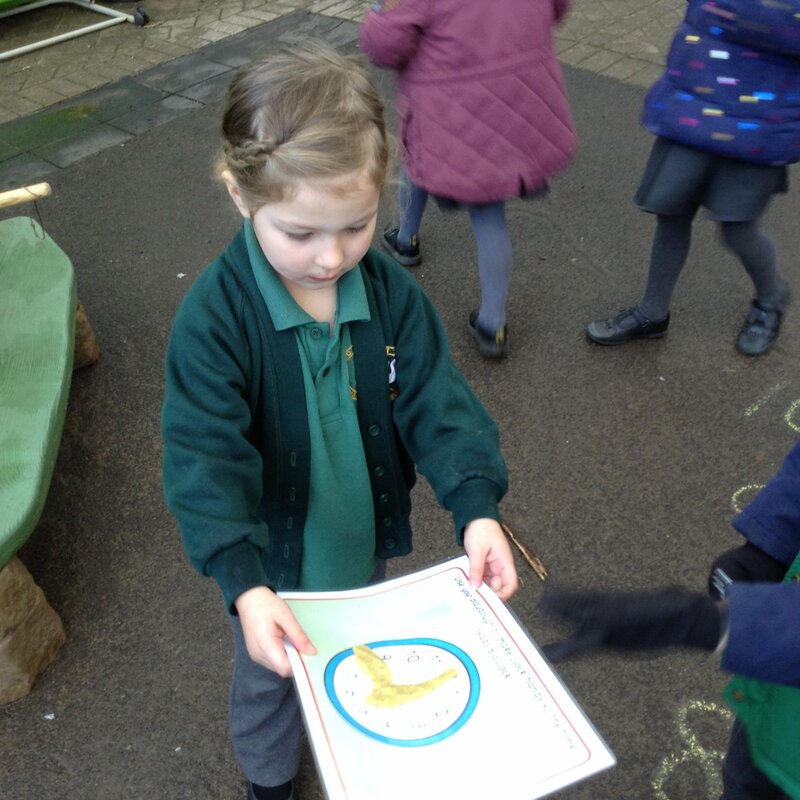 We love sharing them. 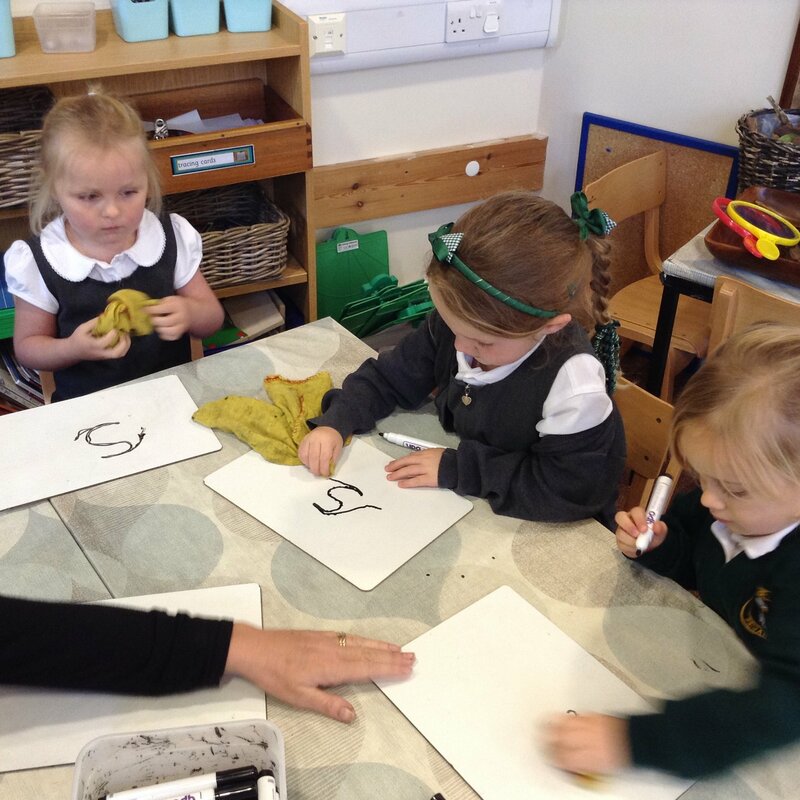 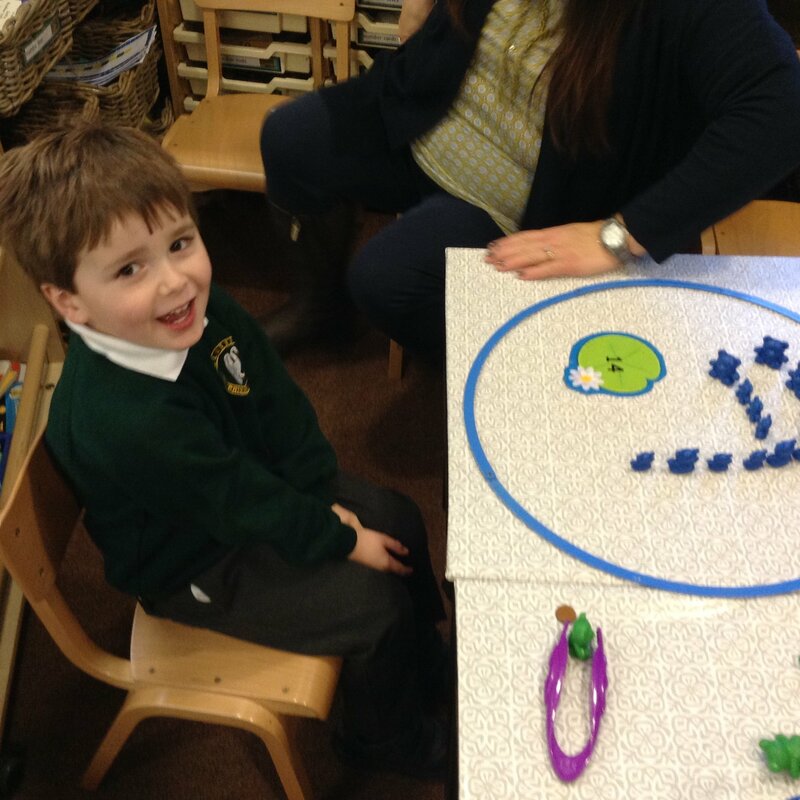 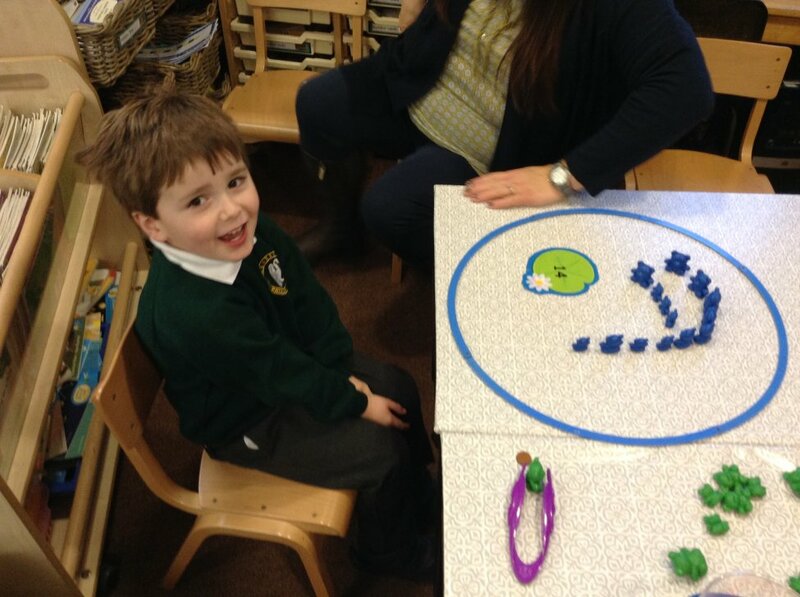 This week we started learning our letter sounds and on Monday we all got quite overexcited about 's' (especially Mrs PC!). 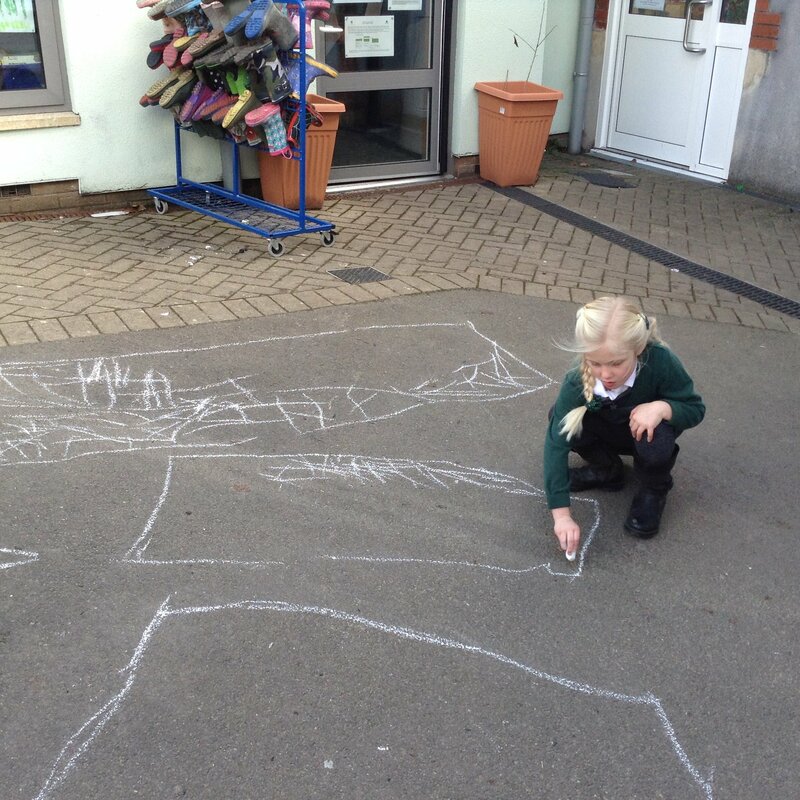 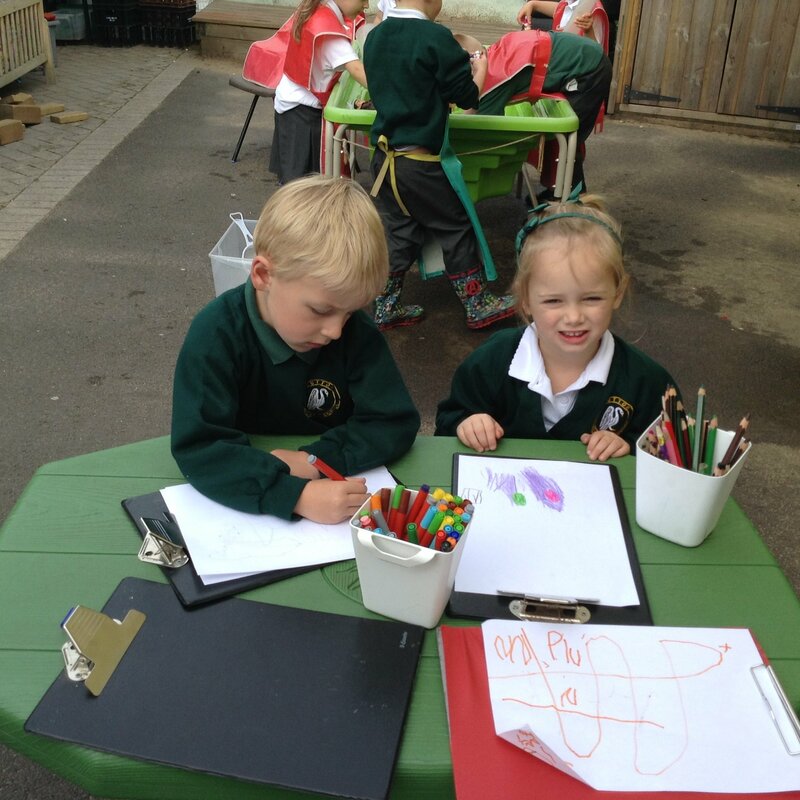 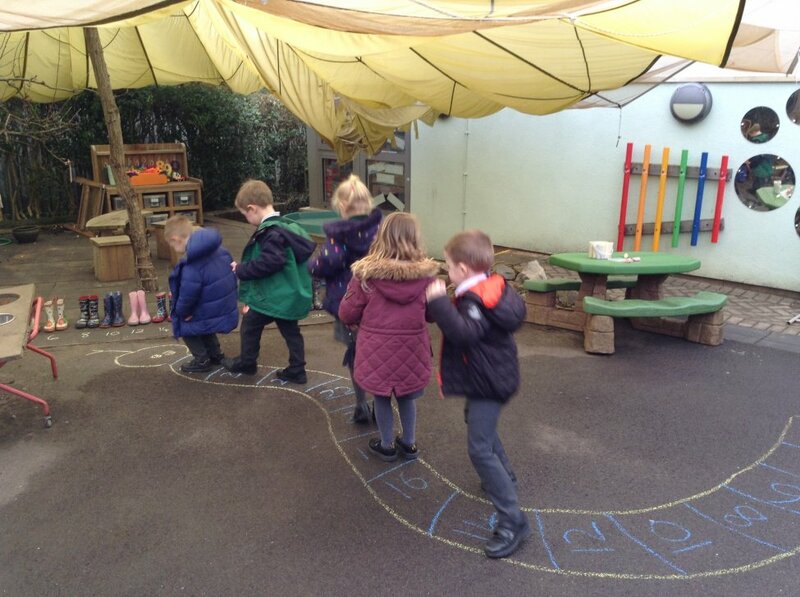 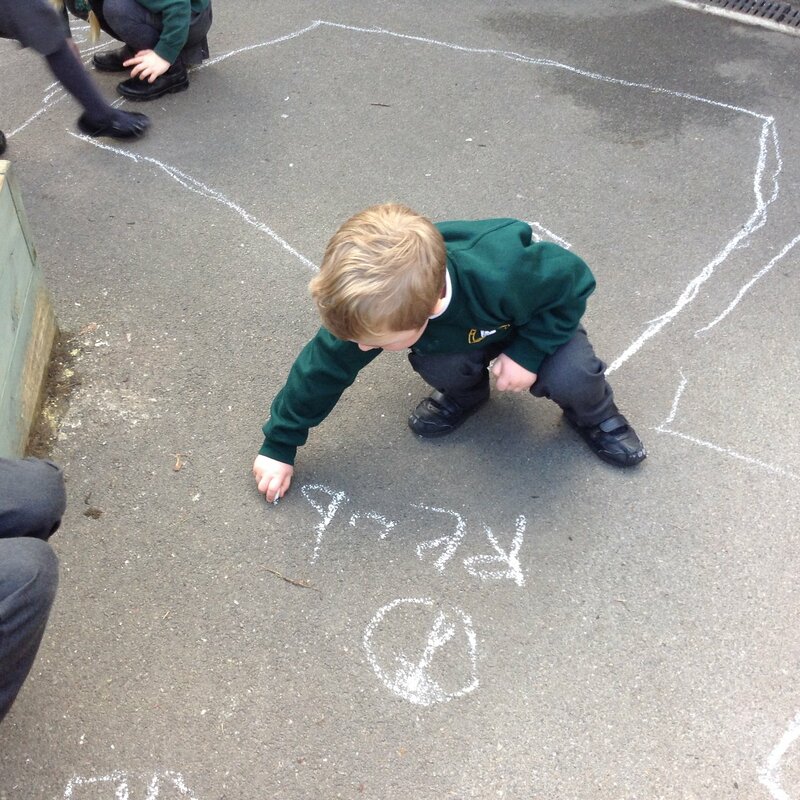 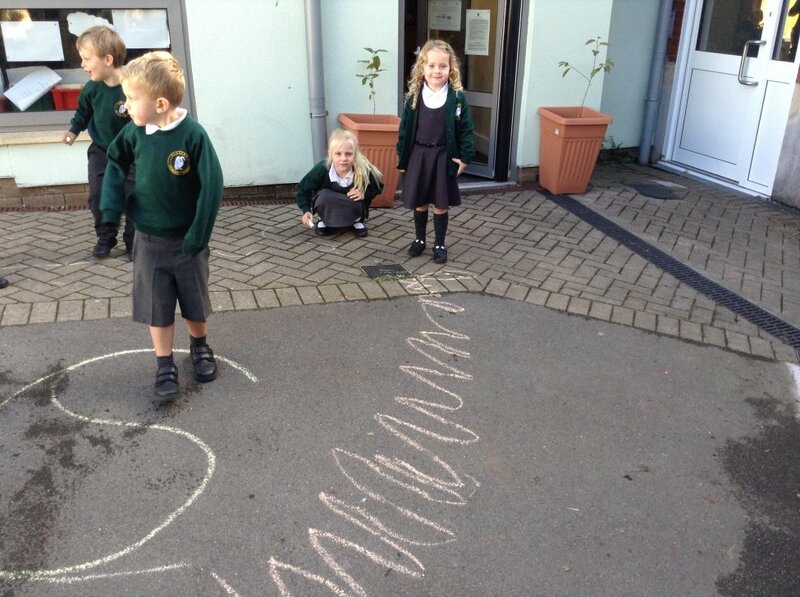 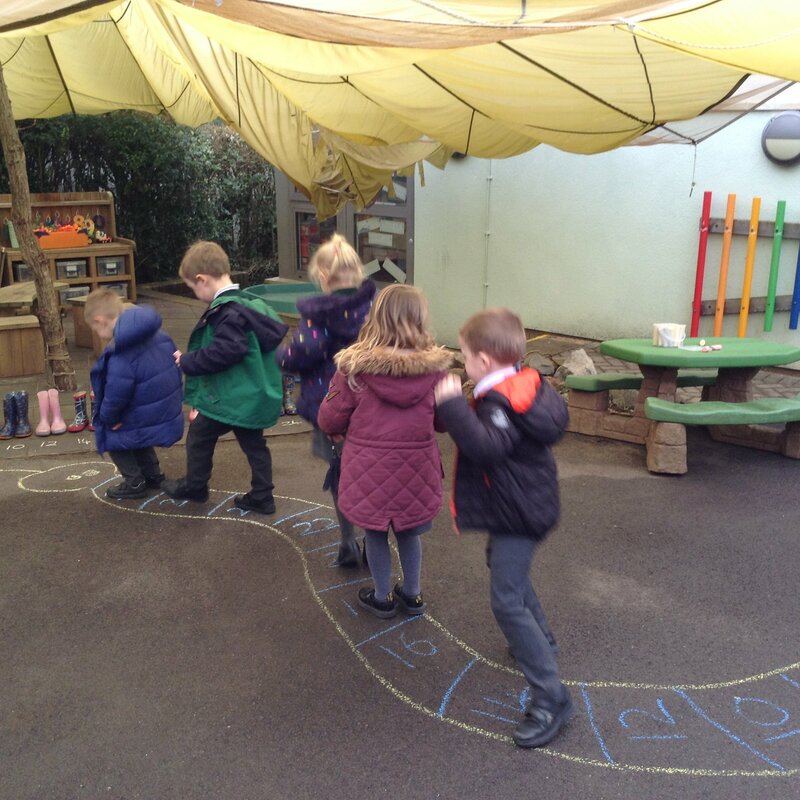 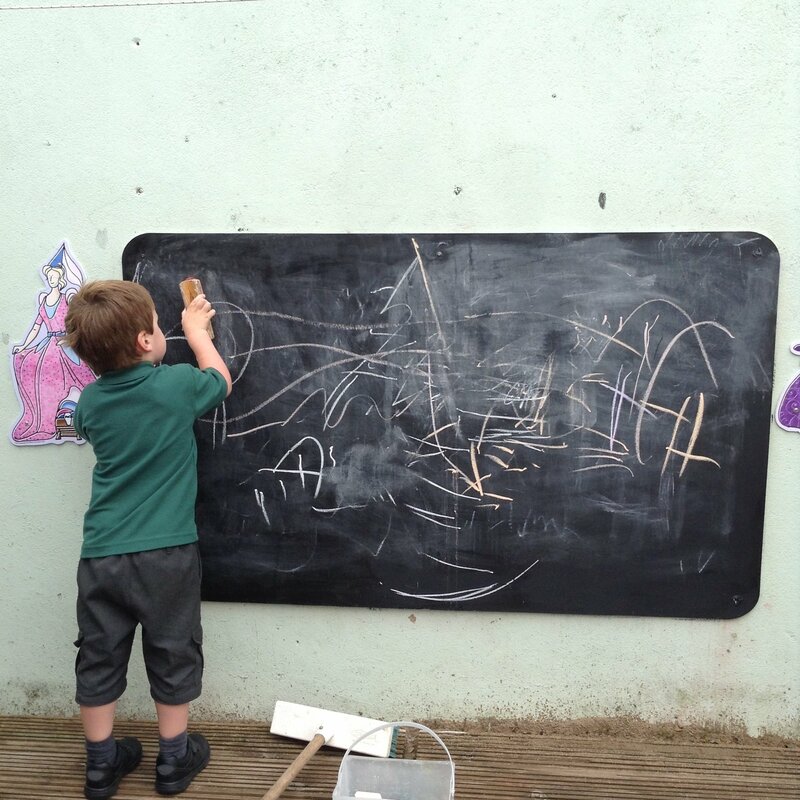 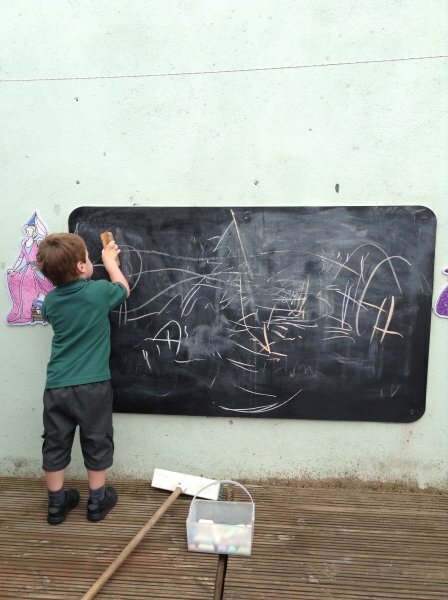 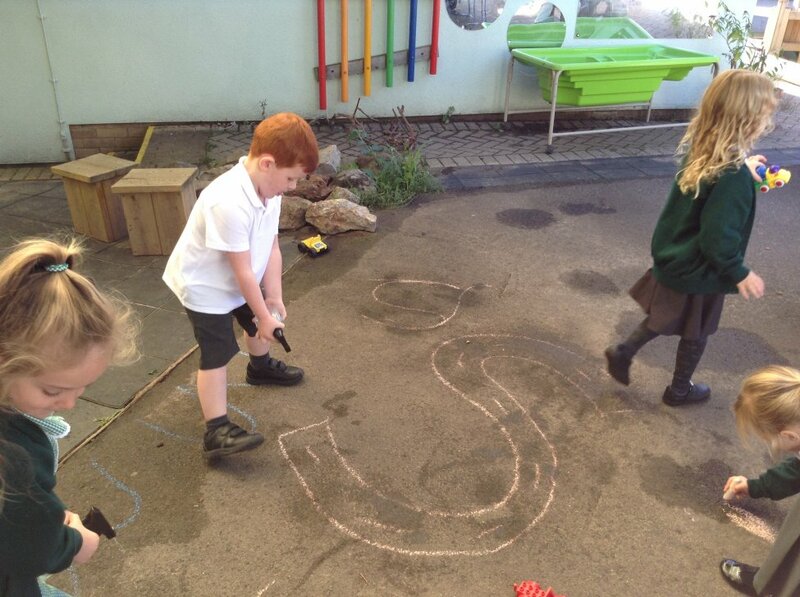 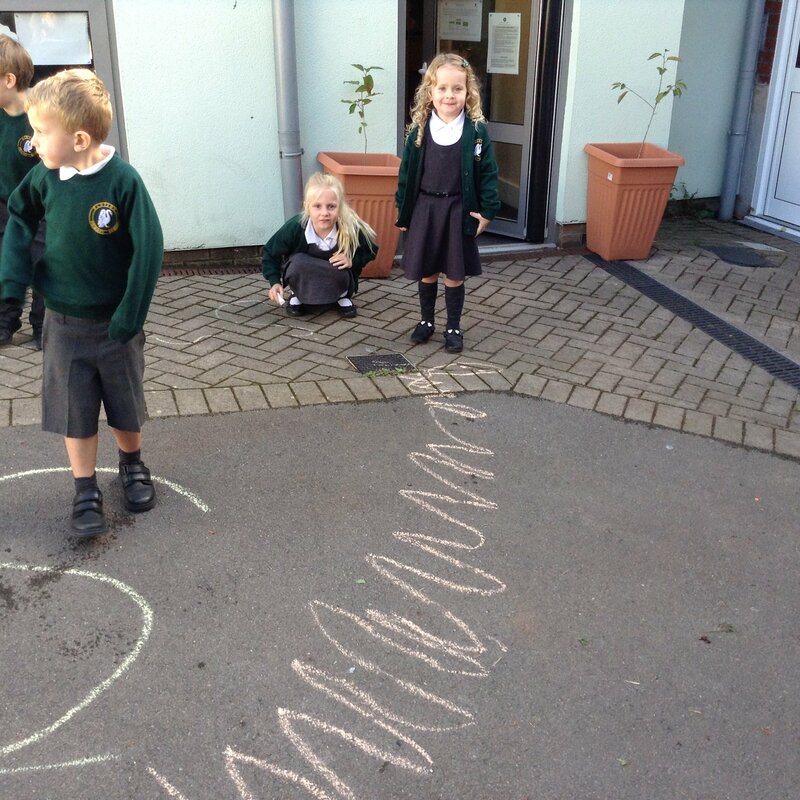 We drew snakes and s's on the playground in chalk - which we washed off with squirty bottles of water, cut out snakes and had a go at writing waving lines. 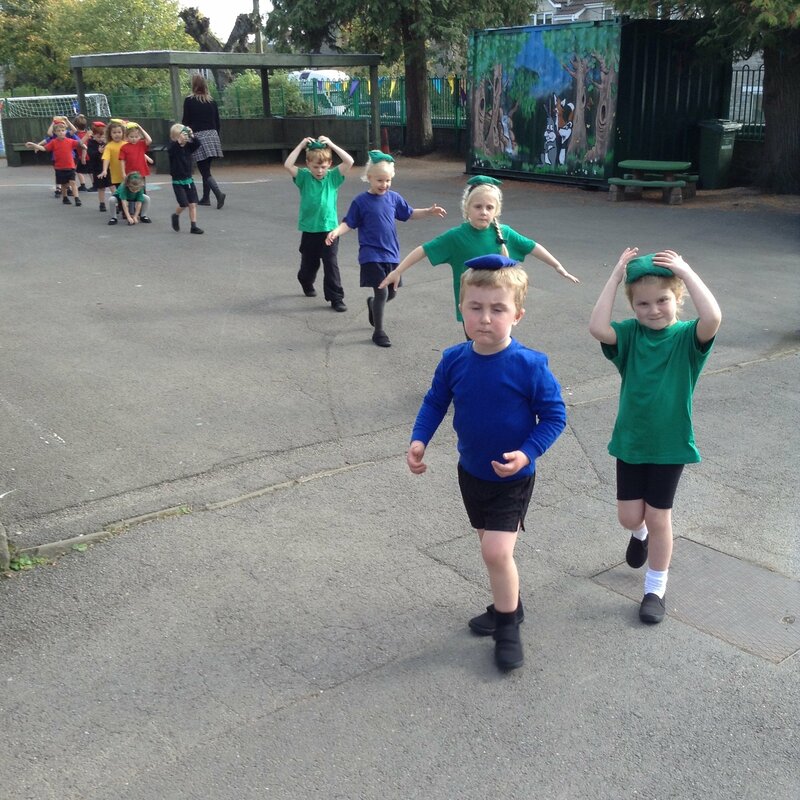 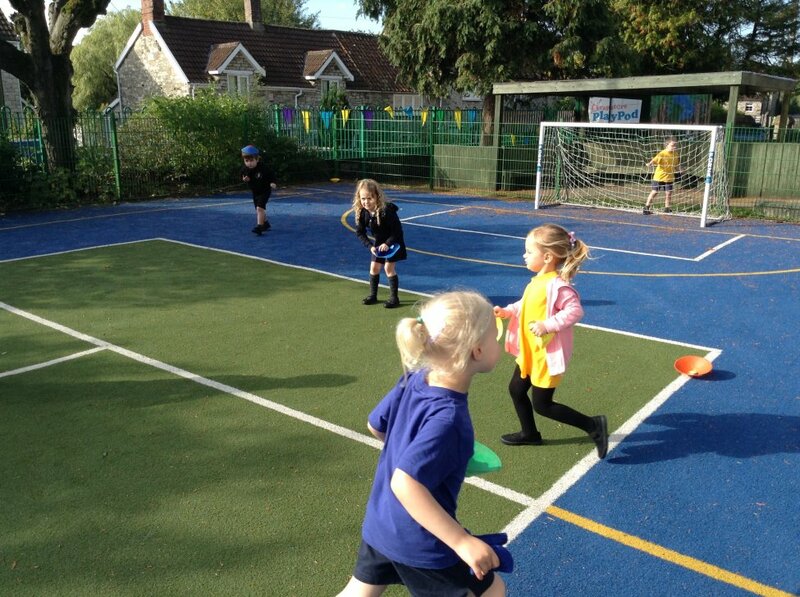 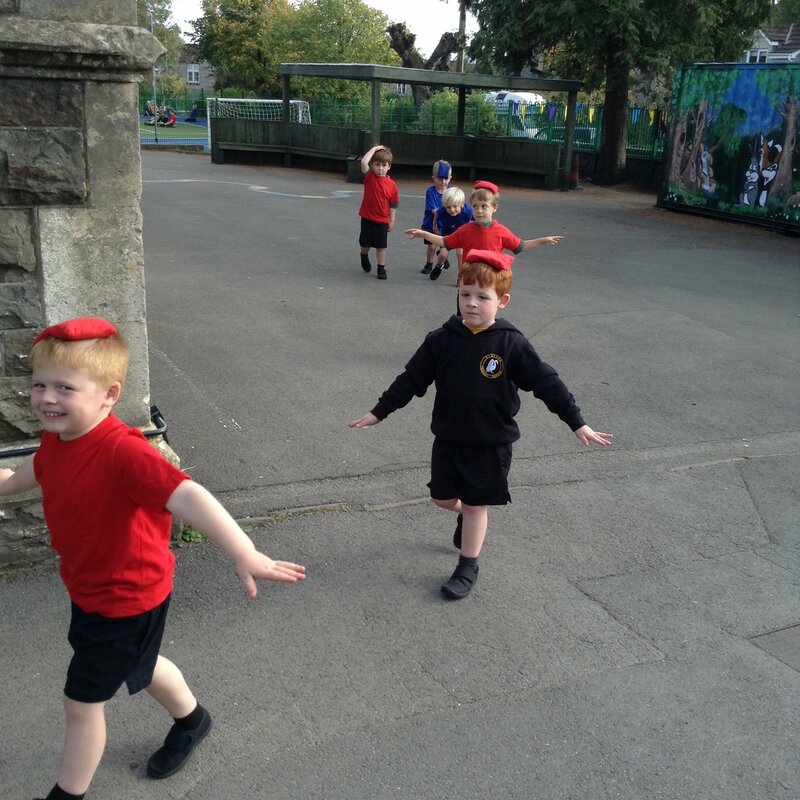 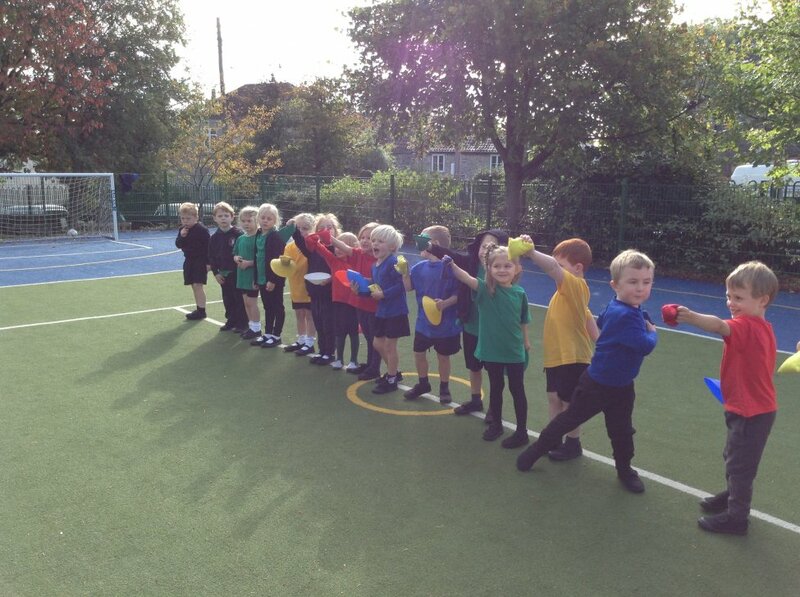 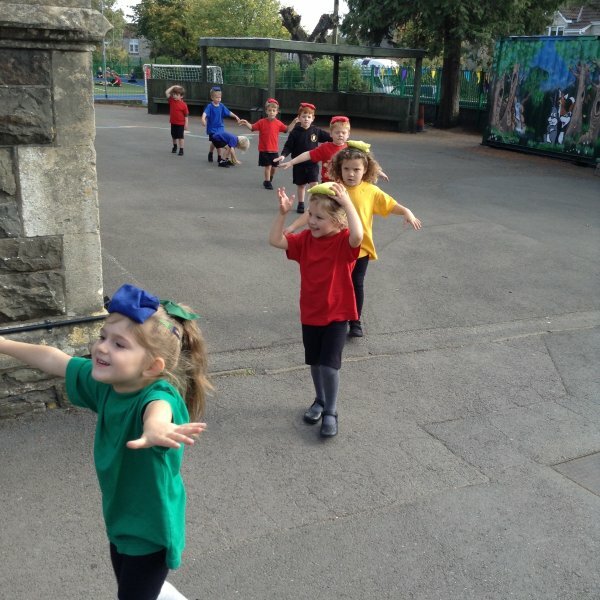 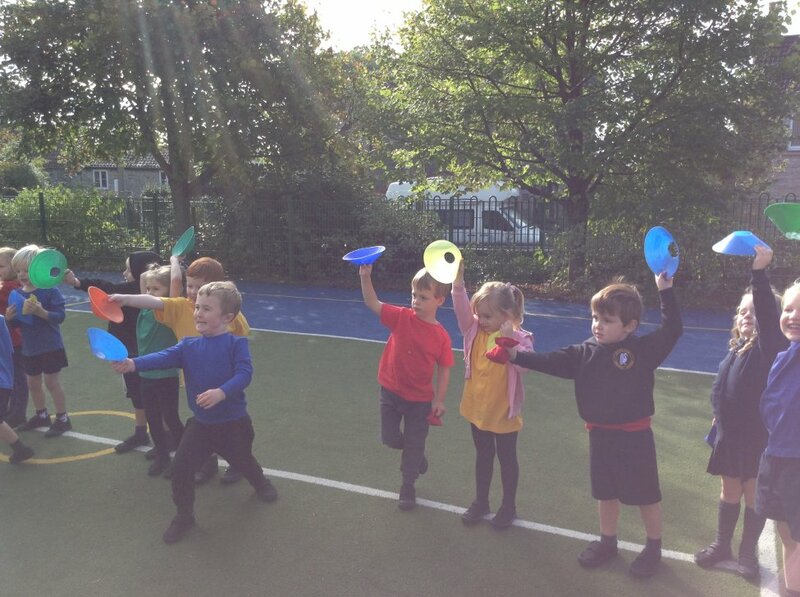 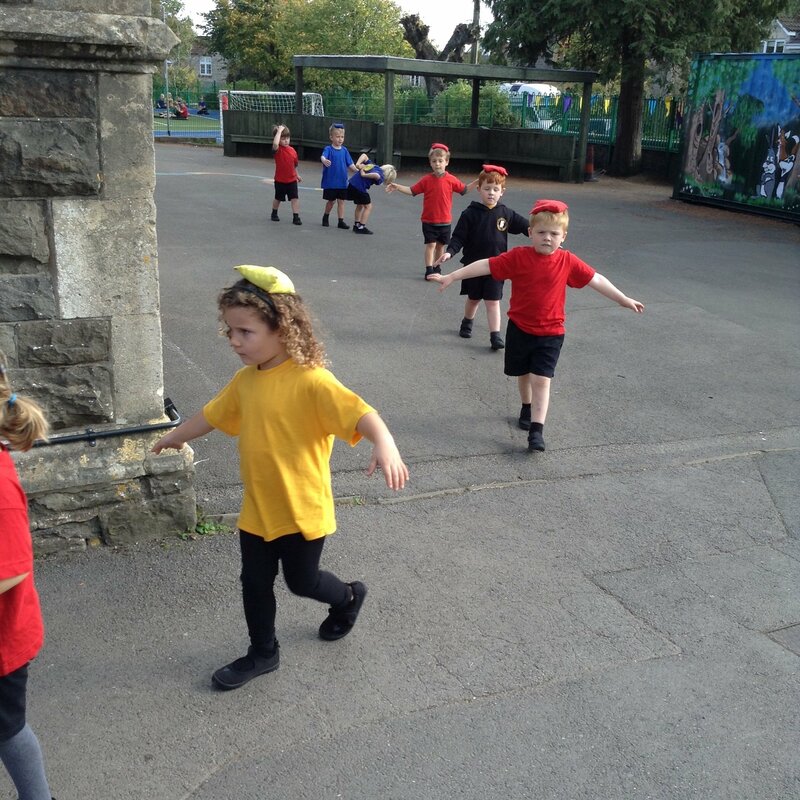 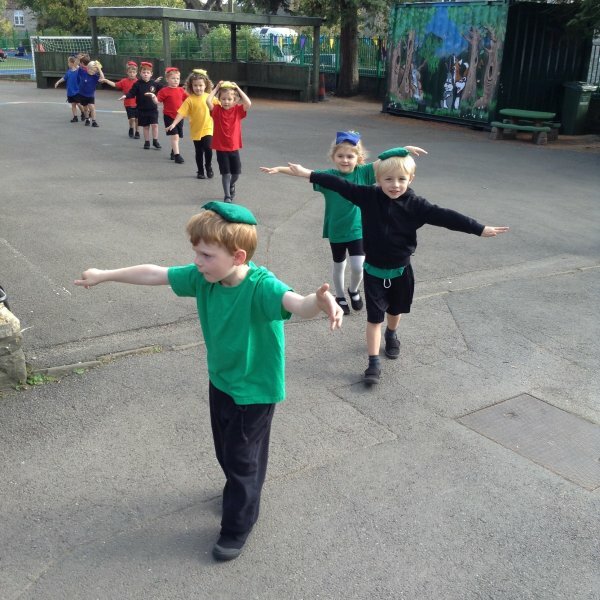 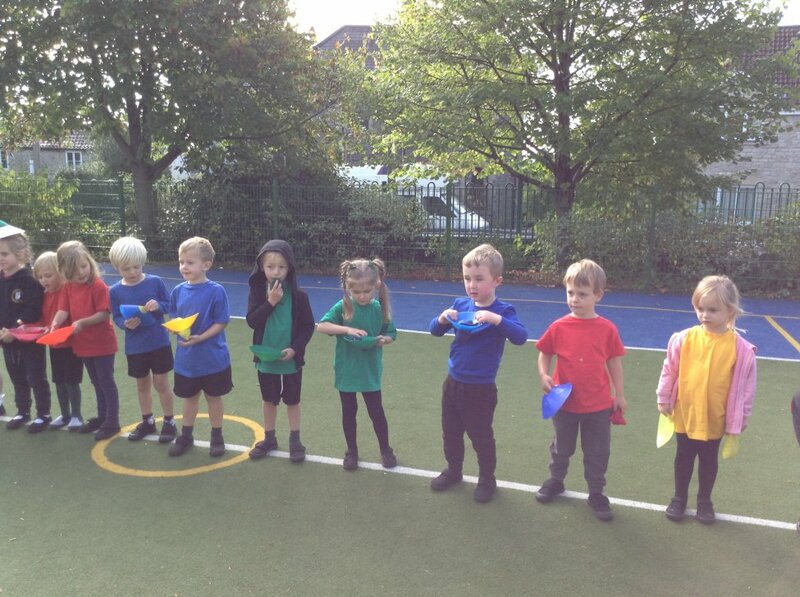 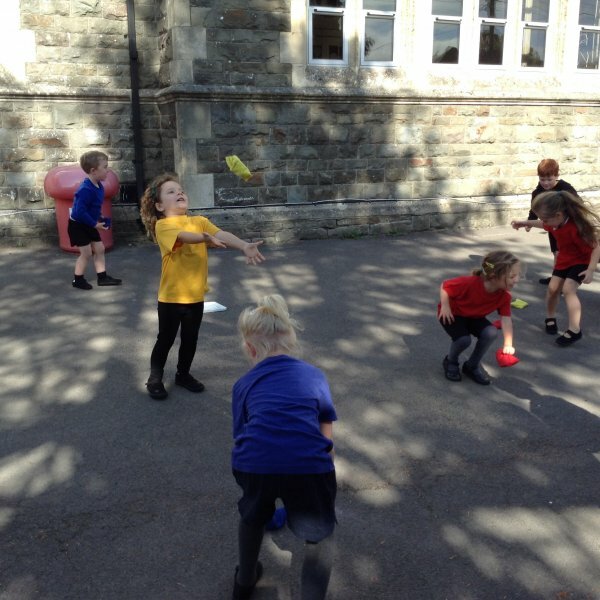 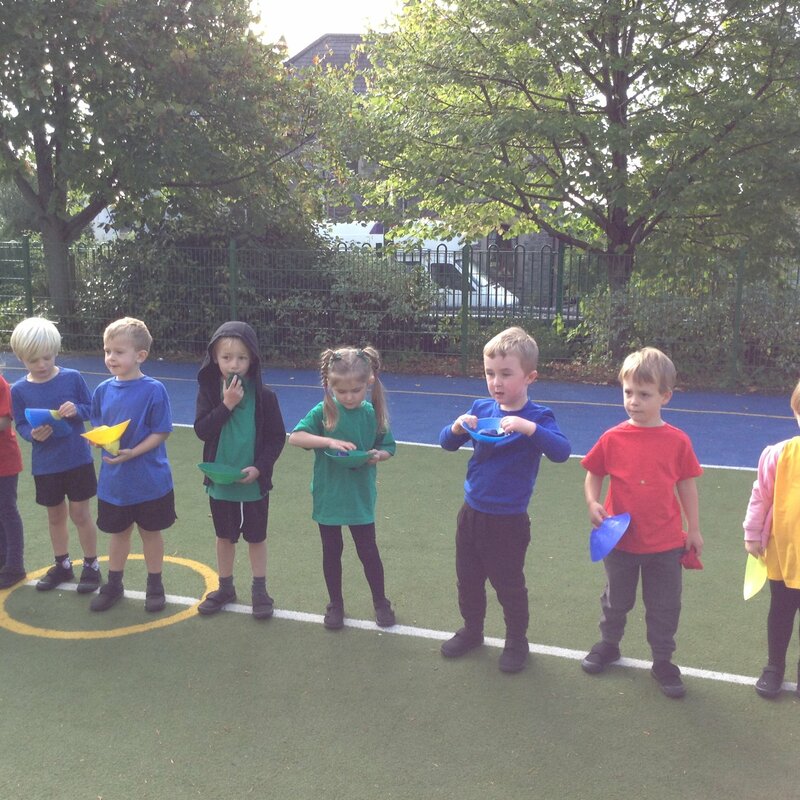 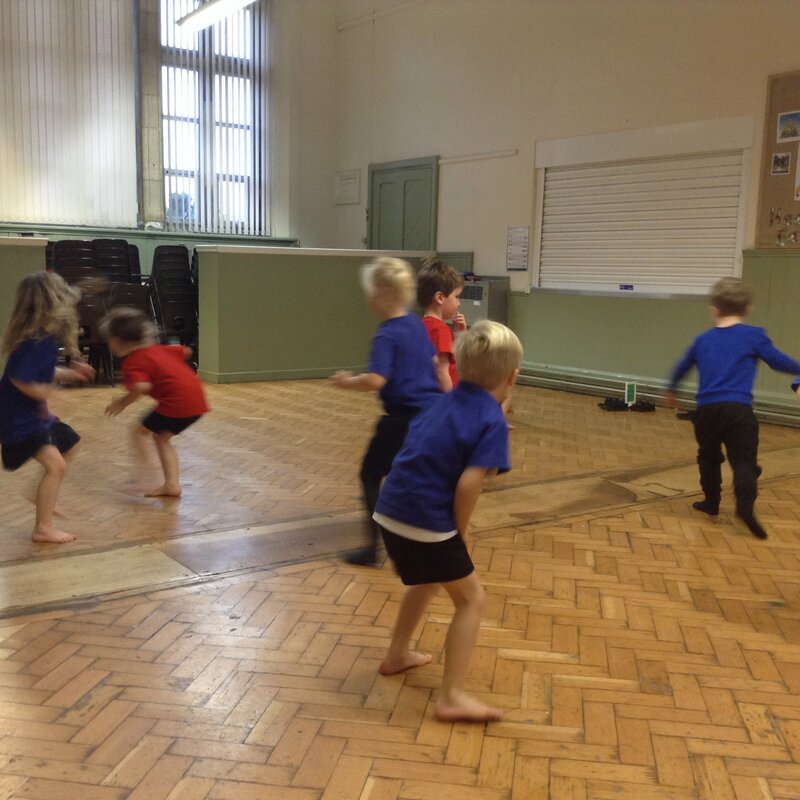 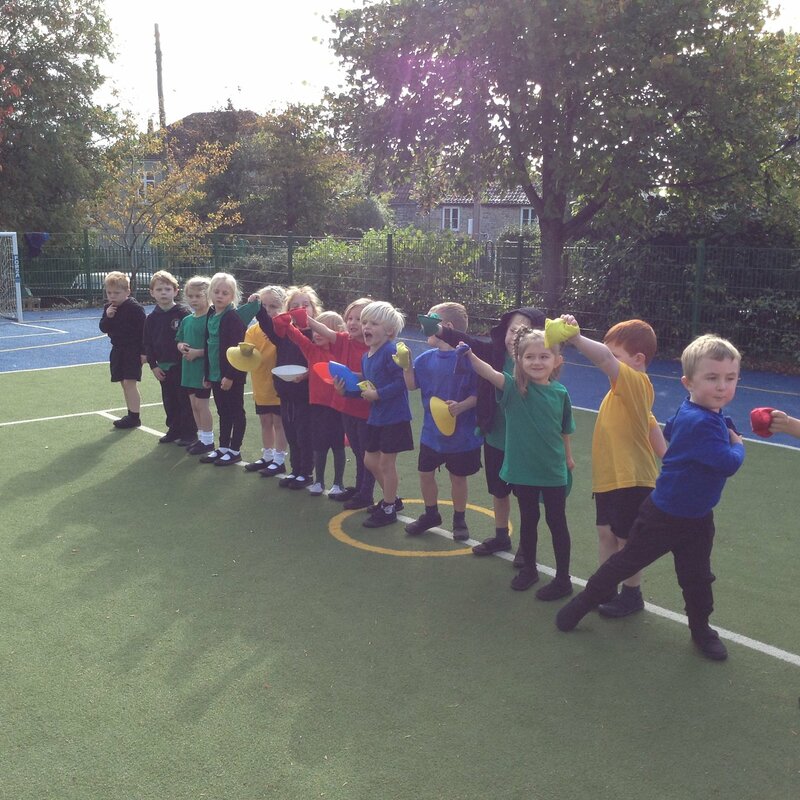 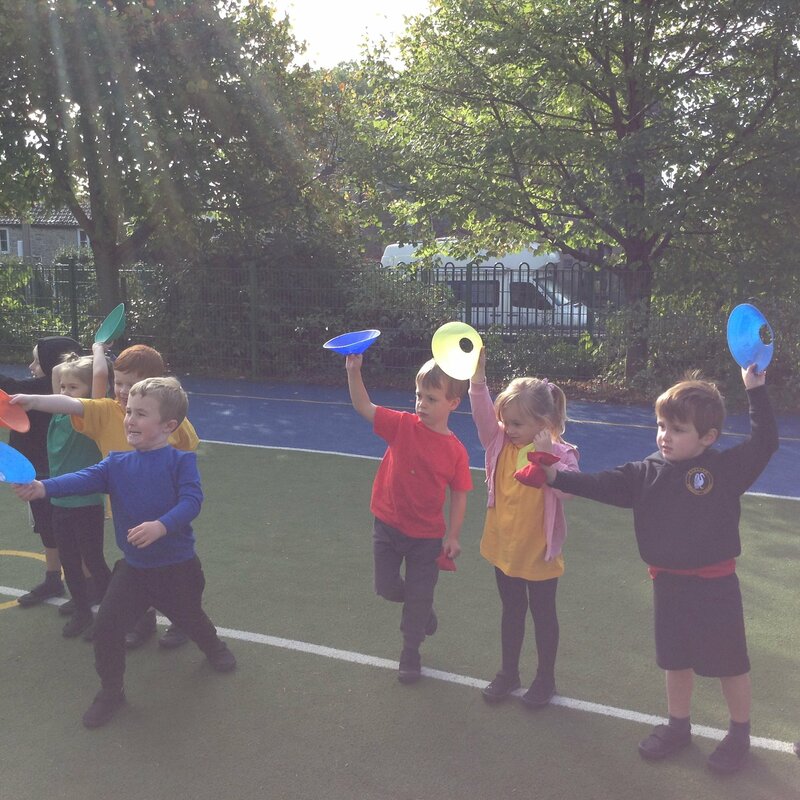 We also learnt the songs and actions for a, t and p. On Tuesday Cherry Class had their first PE lesson with Mrs Morris and she was amazed at how well everyone got changed. 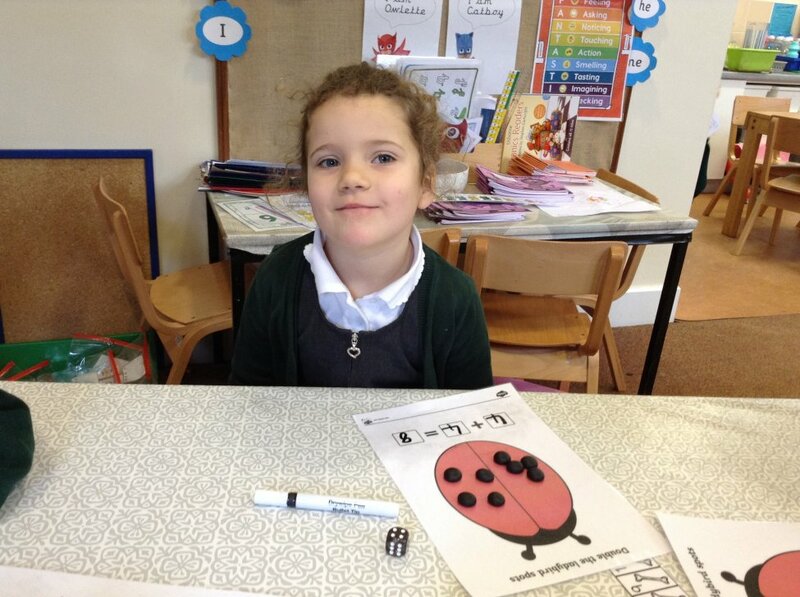 She would like to say a big thank you for excellent labelling of clothes too! 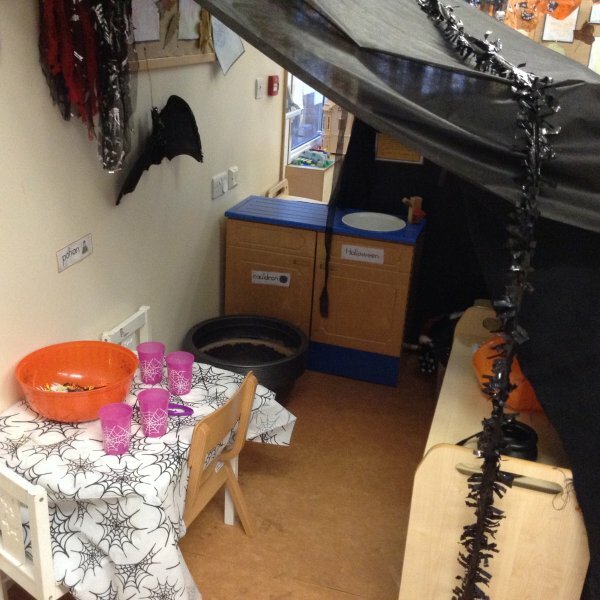 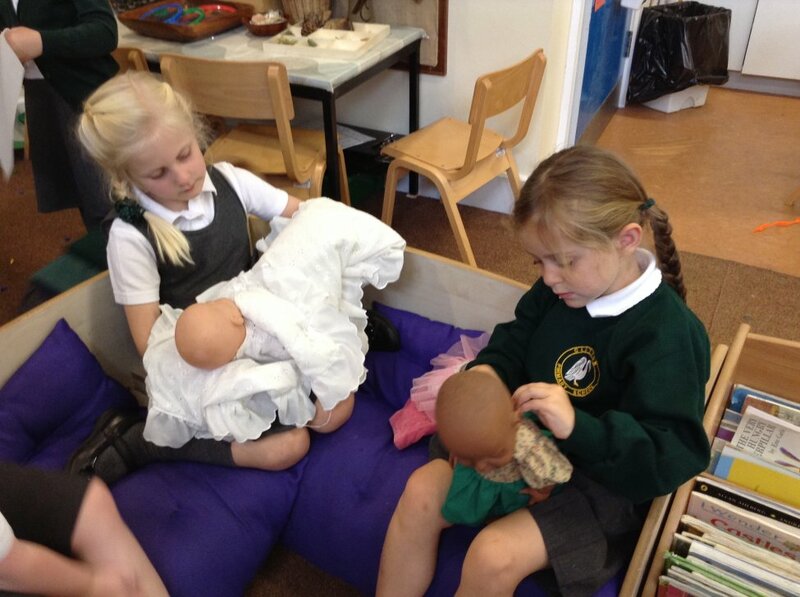 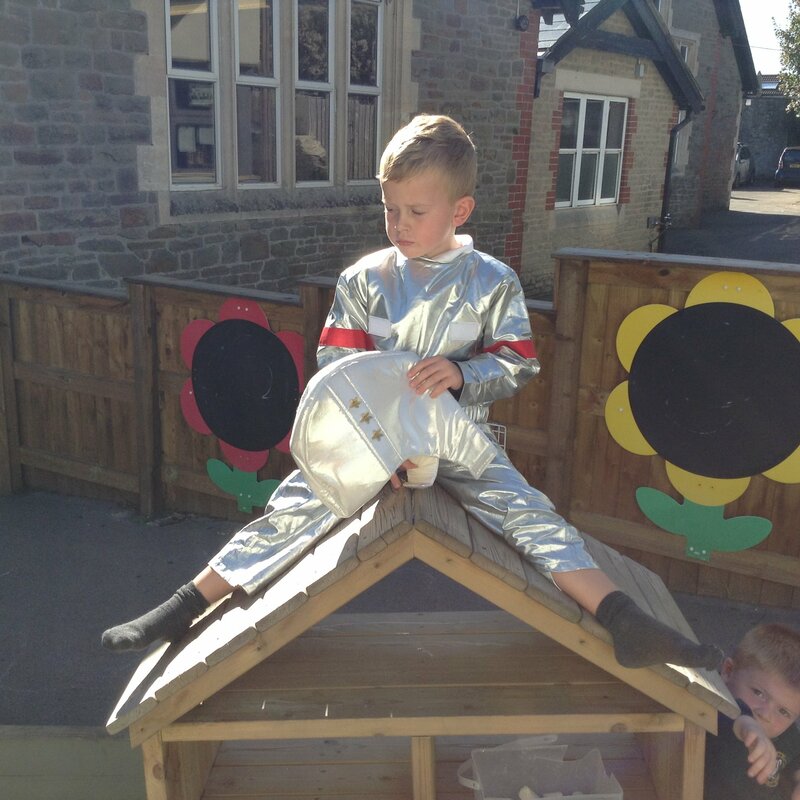 As promised, we got the dressing up box out and it was lovely to see all the conversations that the children had with each other. 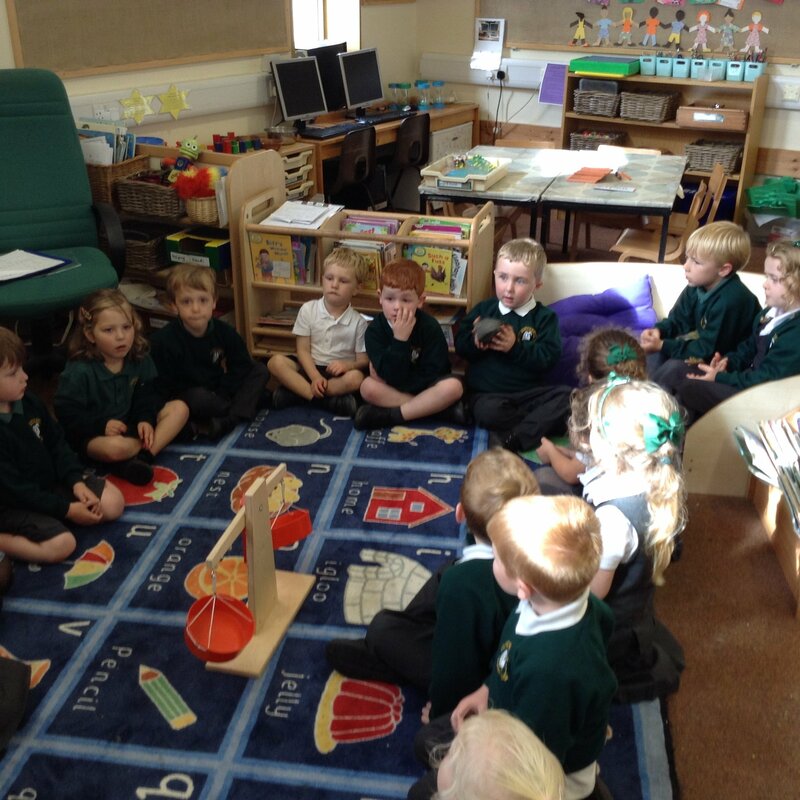 I have seen lots of new friendships being formed this week and everyone seems to be settling in really well. 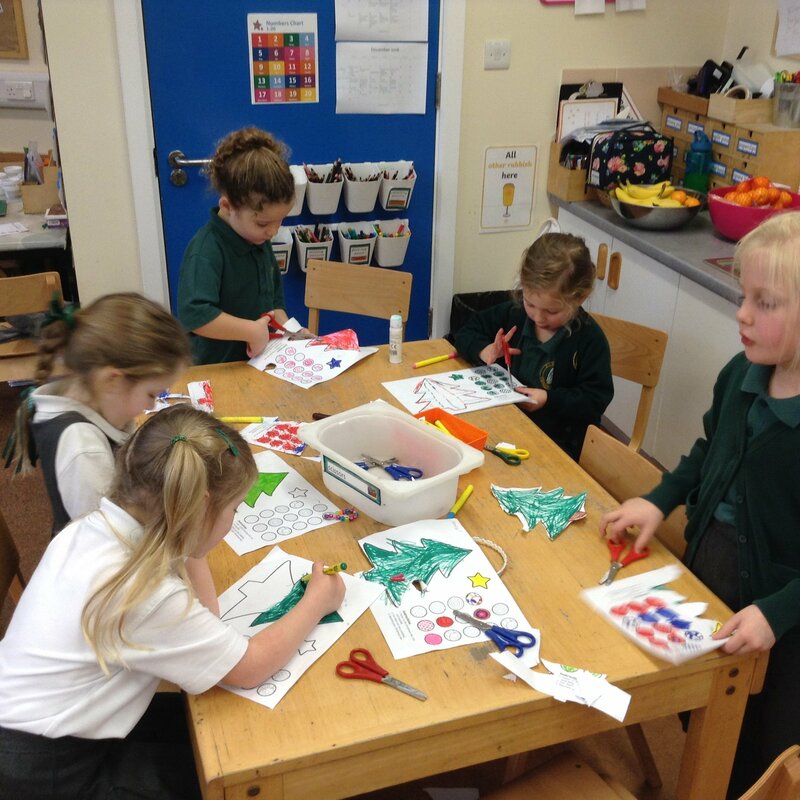 Another happy, busy week in Cherry Class. 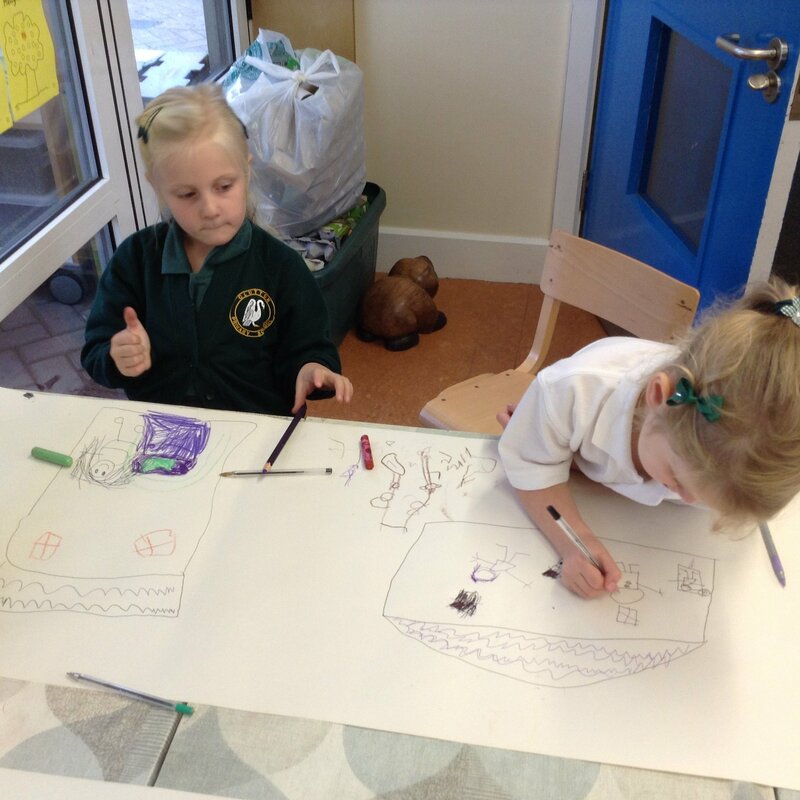 I have really enjoyed listening to the children share their 'All About Me' t-shirts with the class, and they have made a cheerful display in the classroom. 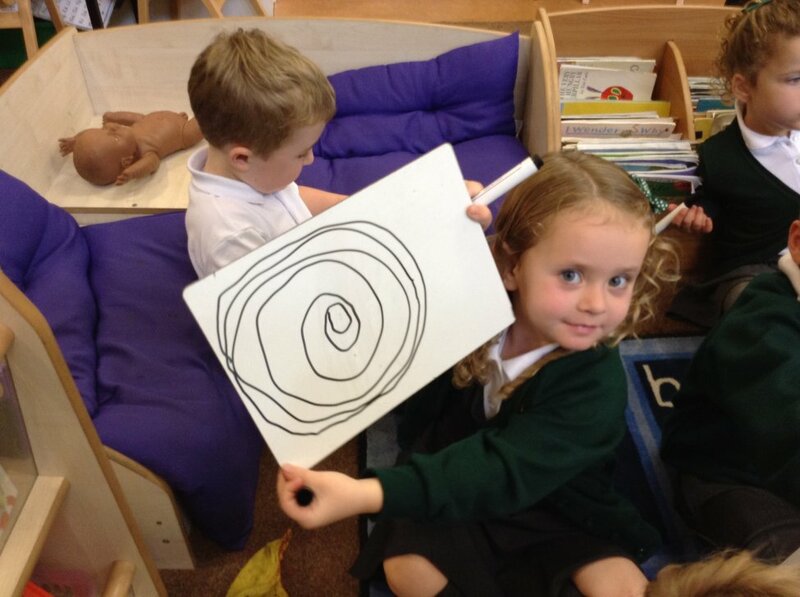 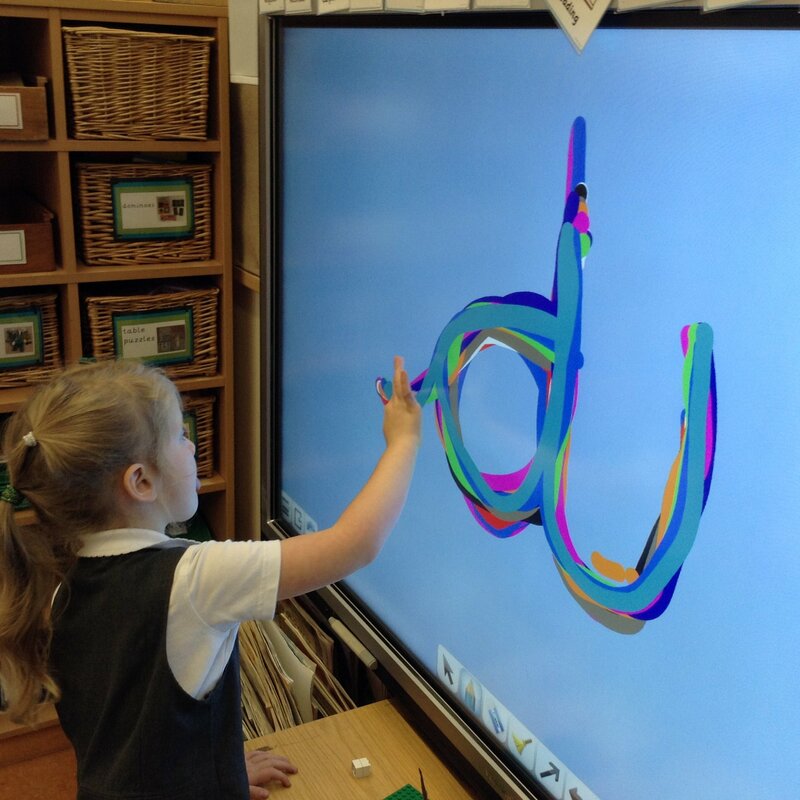 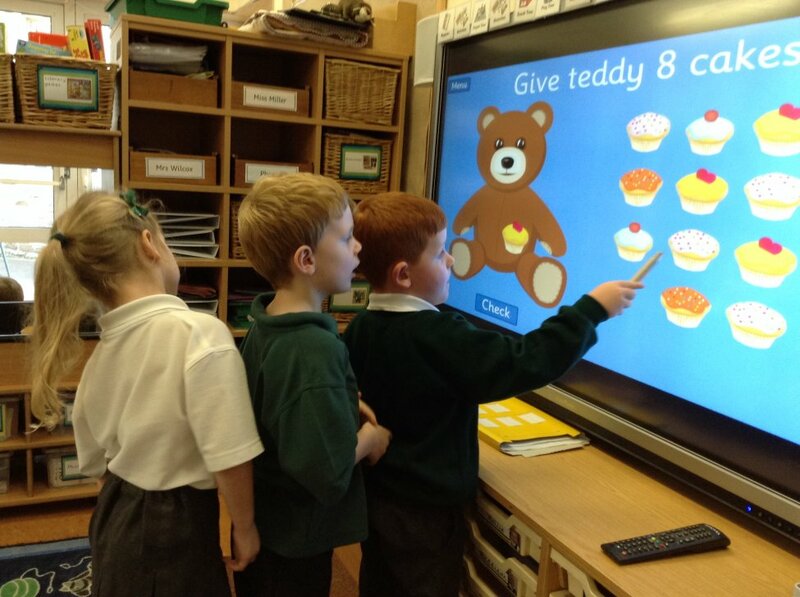 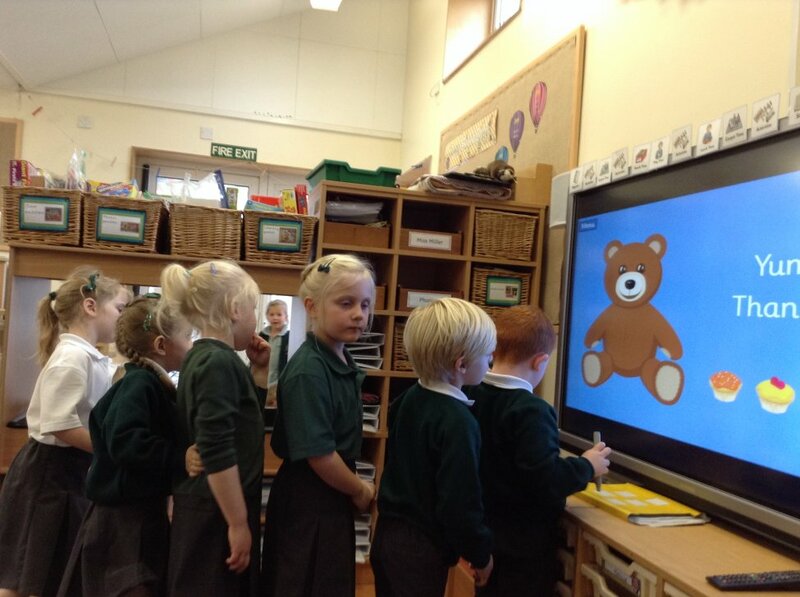 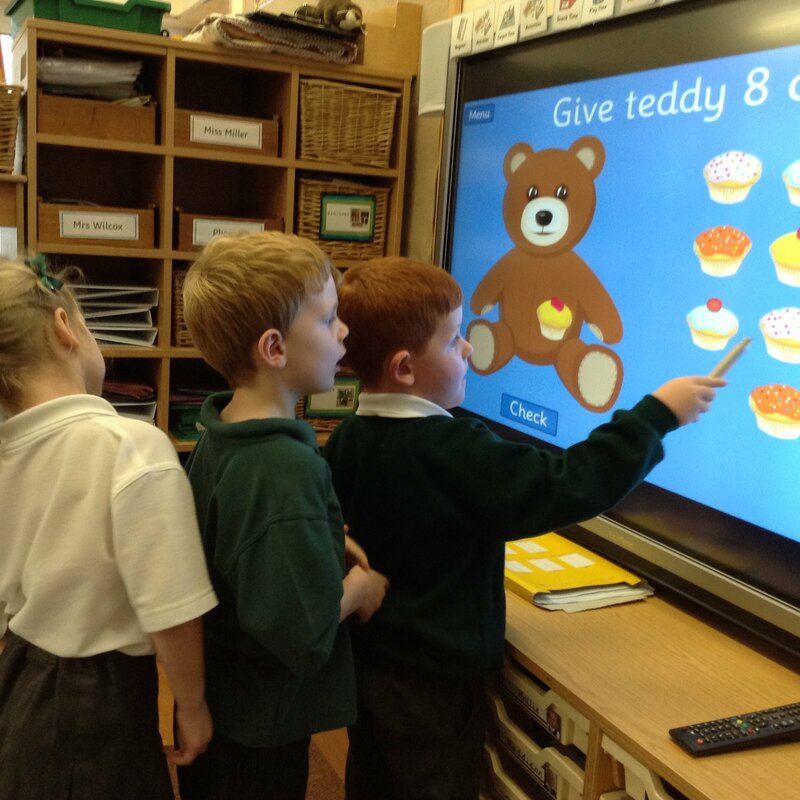 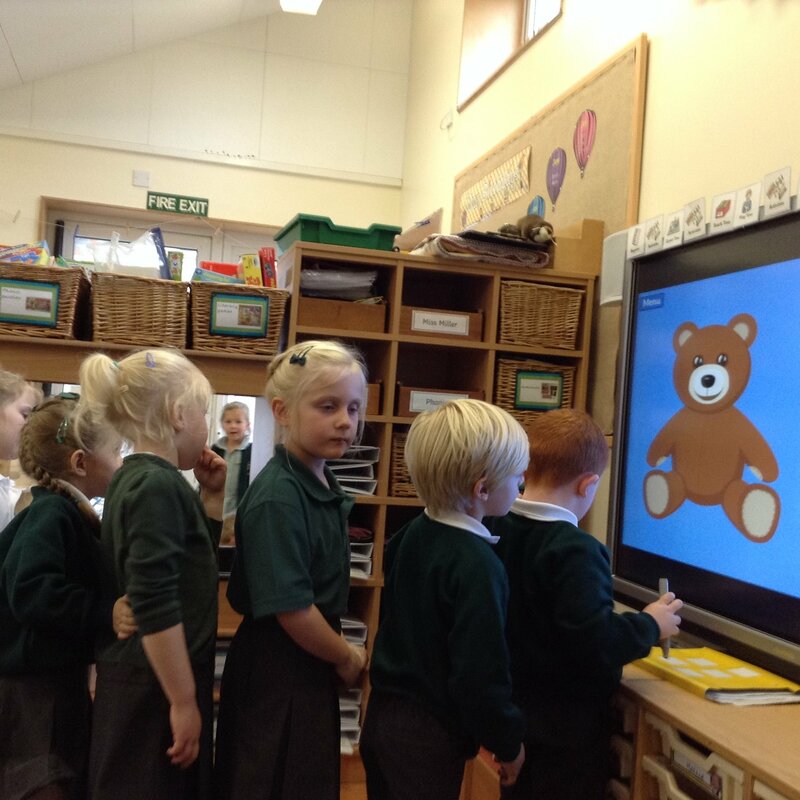 This week our highlights were discovering lots of games on the interactive whiteboard, using the mini whiteboards to make patterns as a whole class, and venturing in to Maple Class on Friday afternoon for our shared Golden Time. 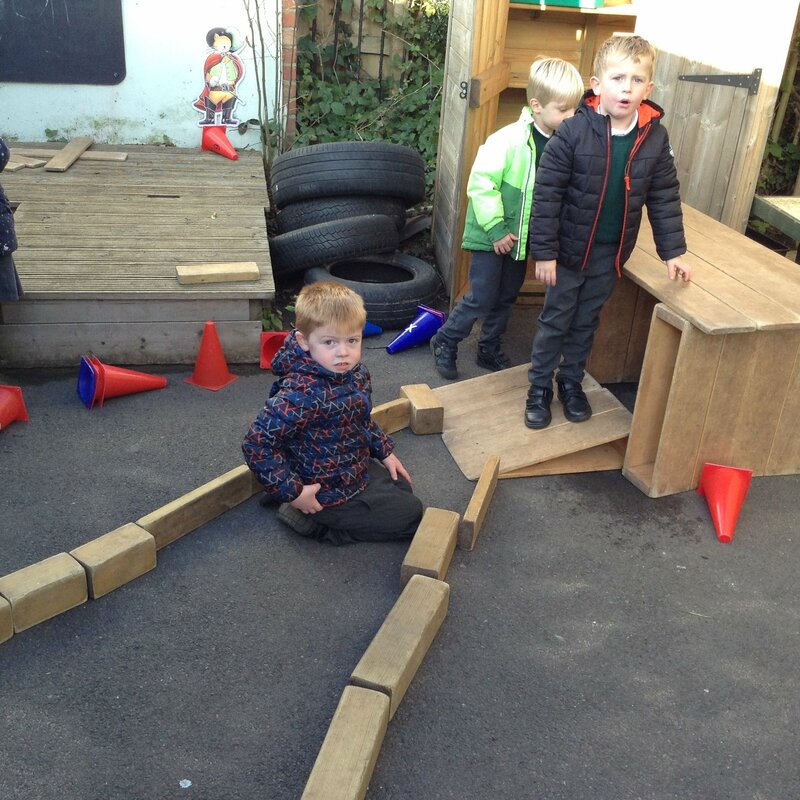 We also braved the wind and the rain under the parachute and made the most of the sunny spots to make dens using the large wooden blocks. 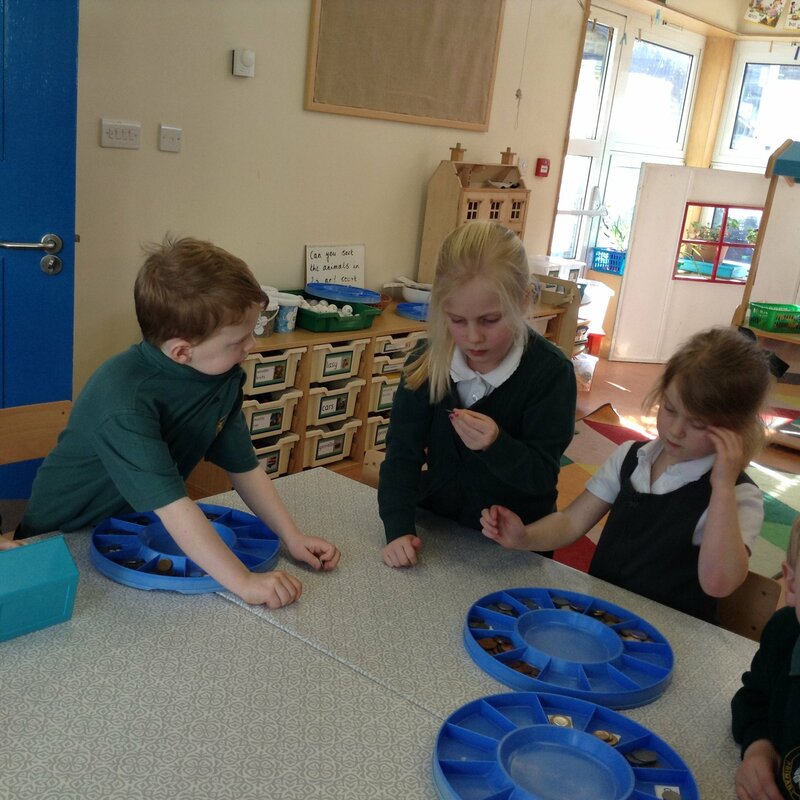 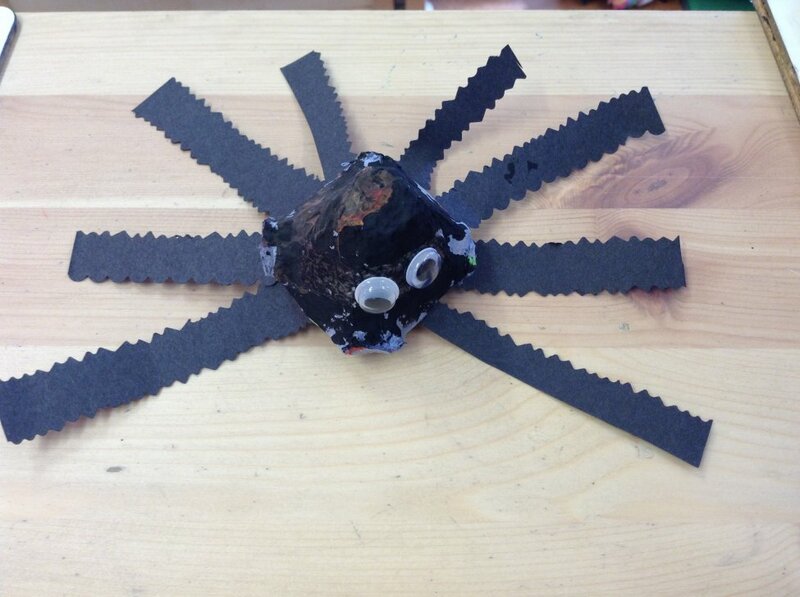 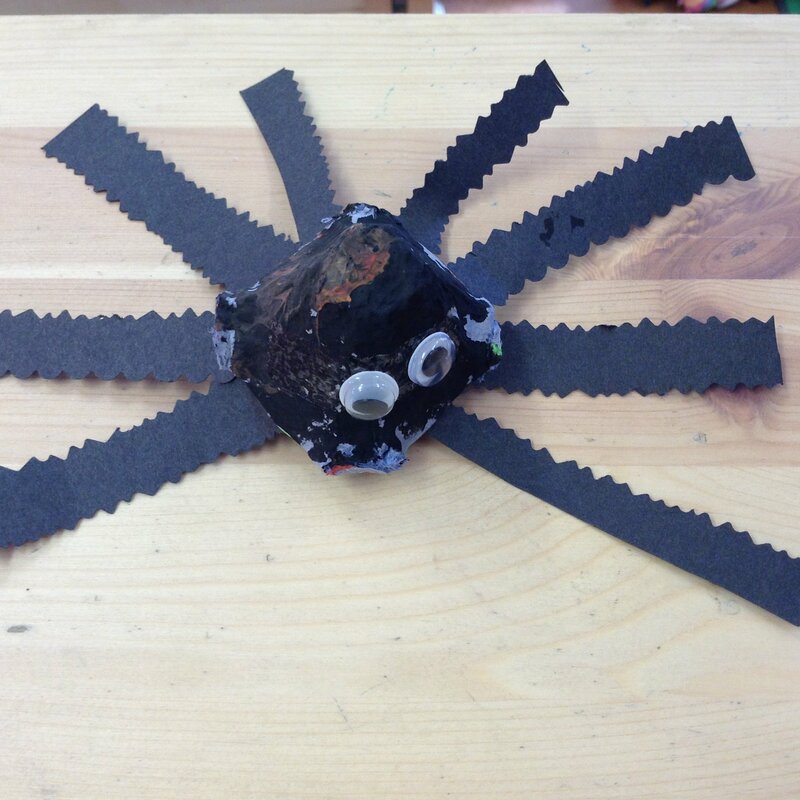 Mrs Morris has taught the children some songs about spiders and bees so all the children have made little egg-box spiders as props. 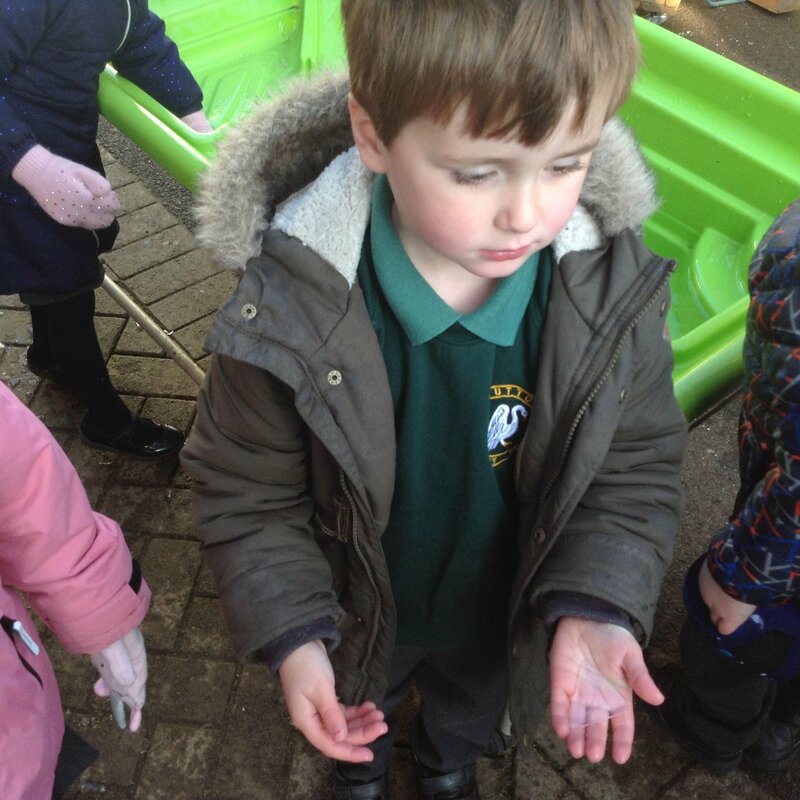 Bees will be next! 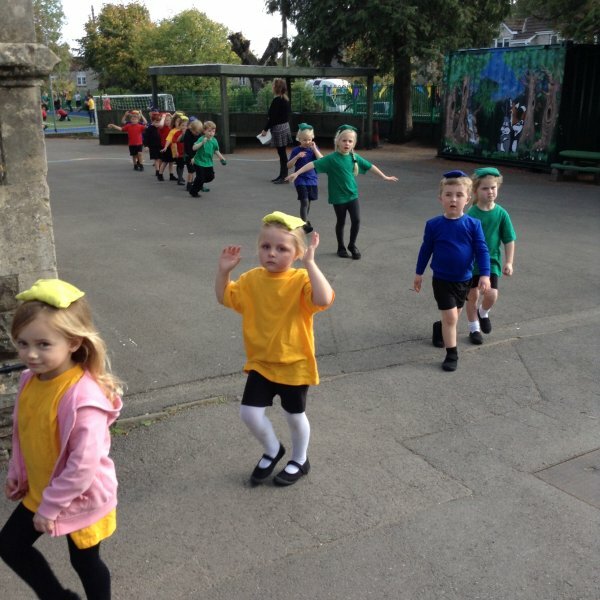 You might have also heard about the excitement of the fire alarm practise! 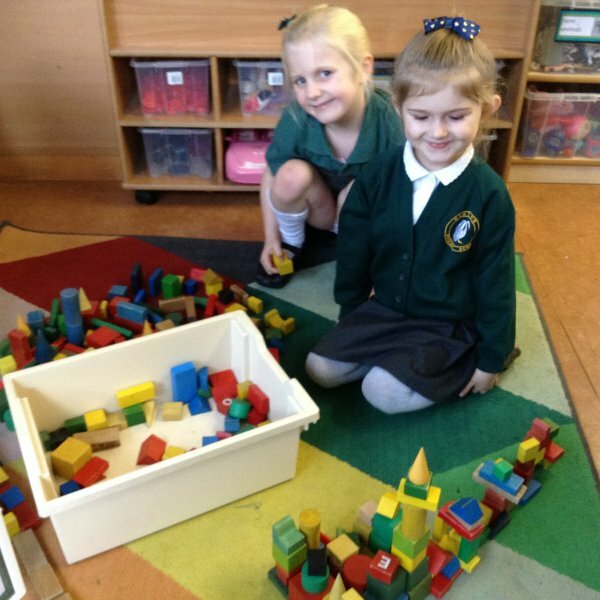 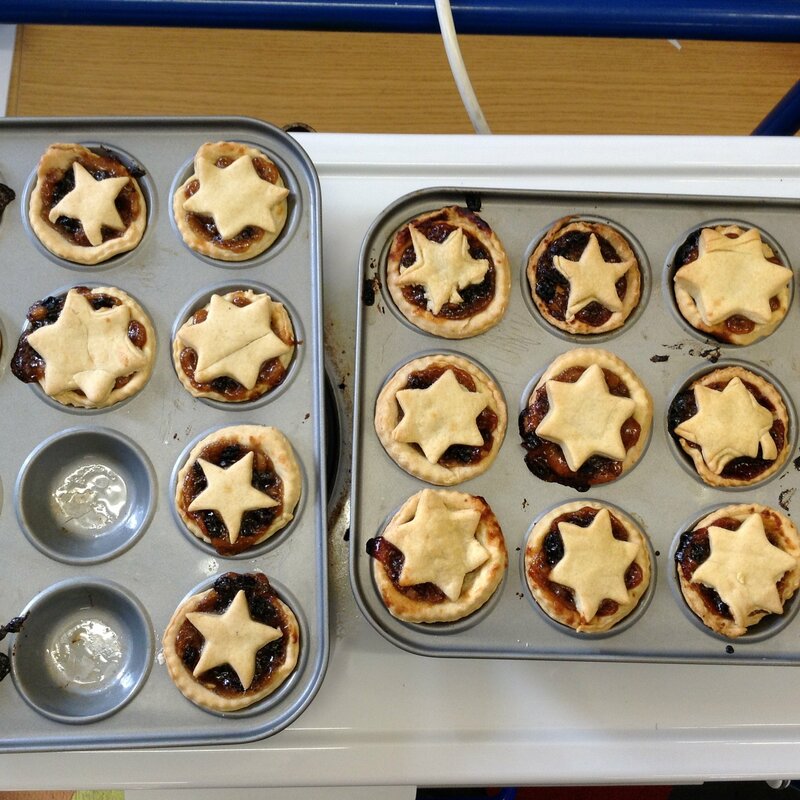 The children have done so well in Cherry Class this week. 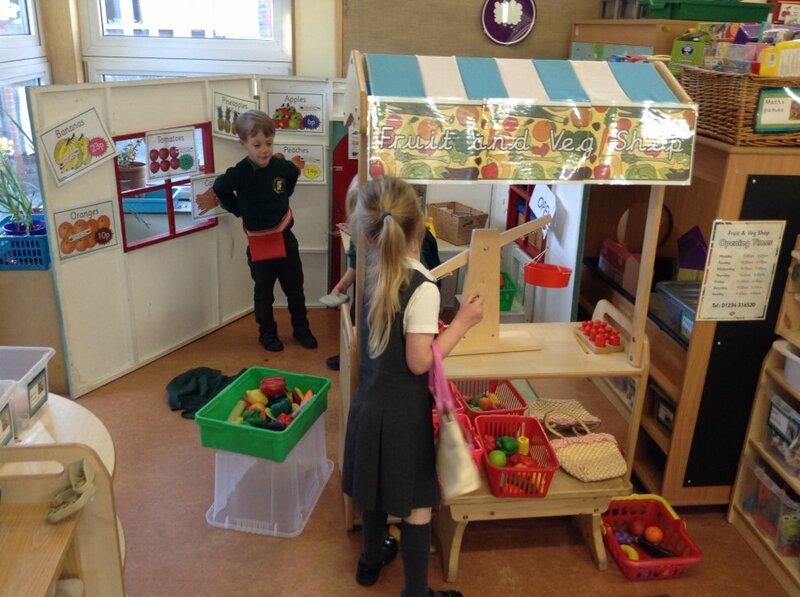 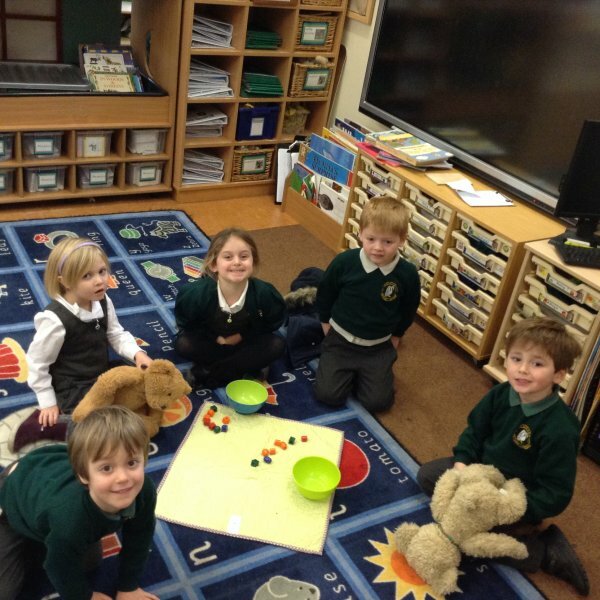 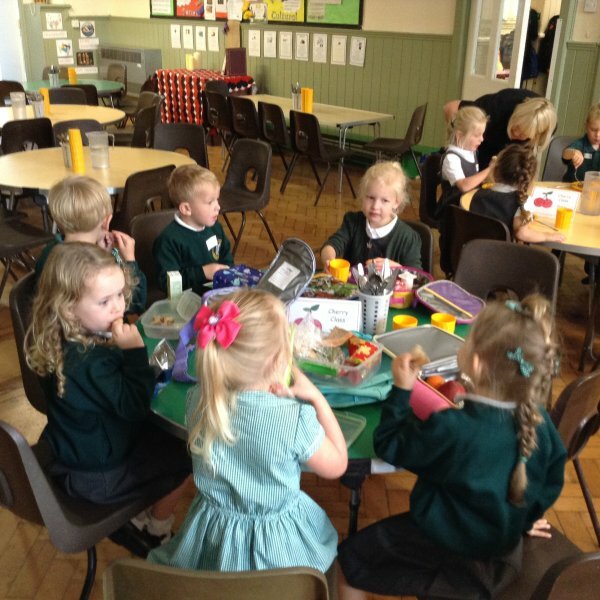 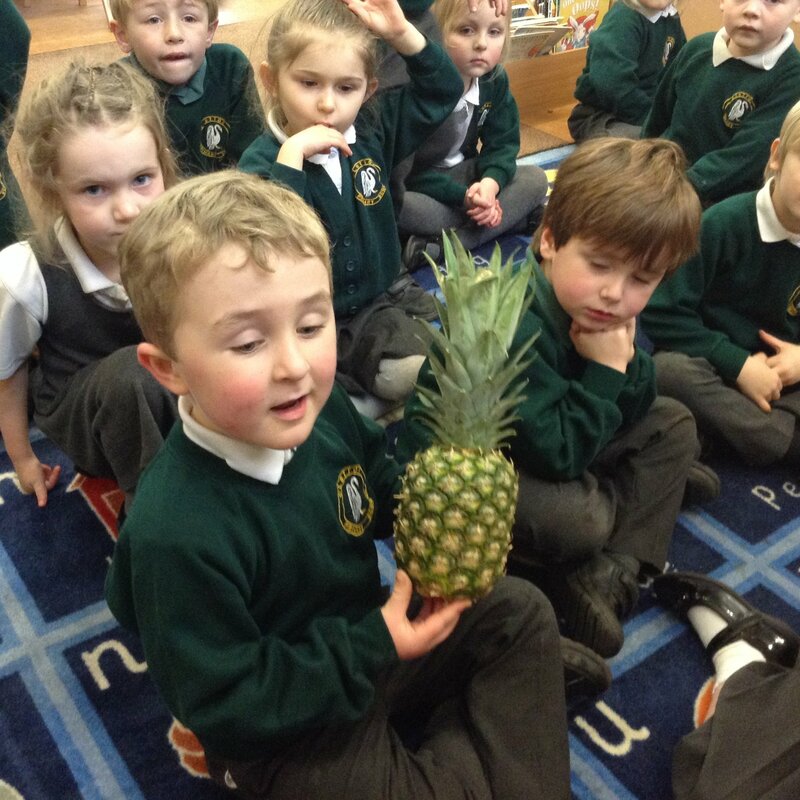 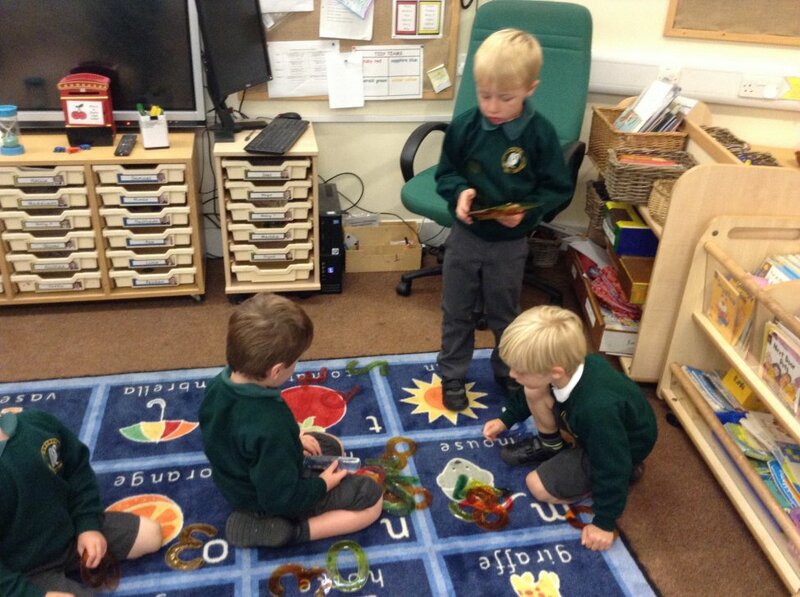 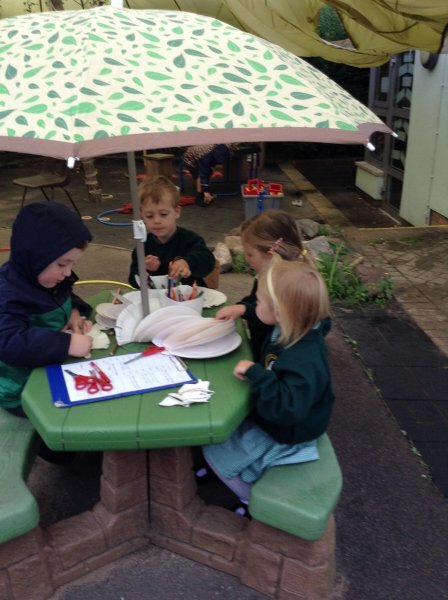 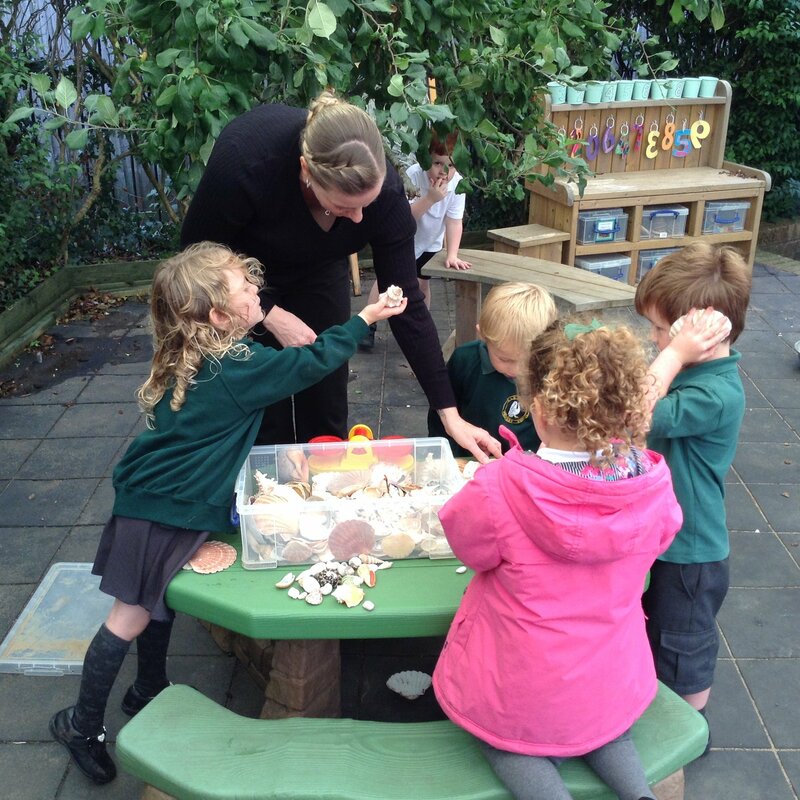 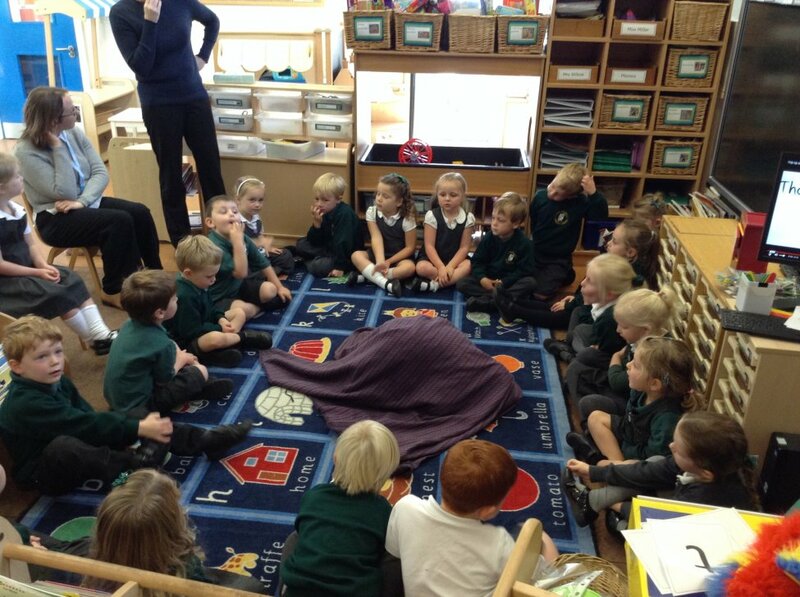 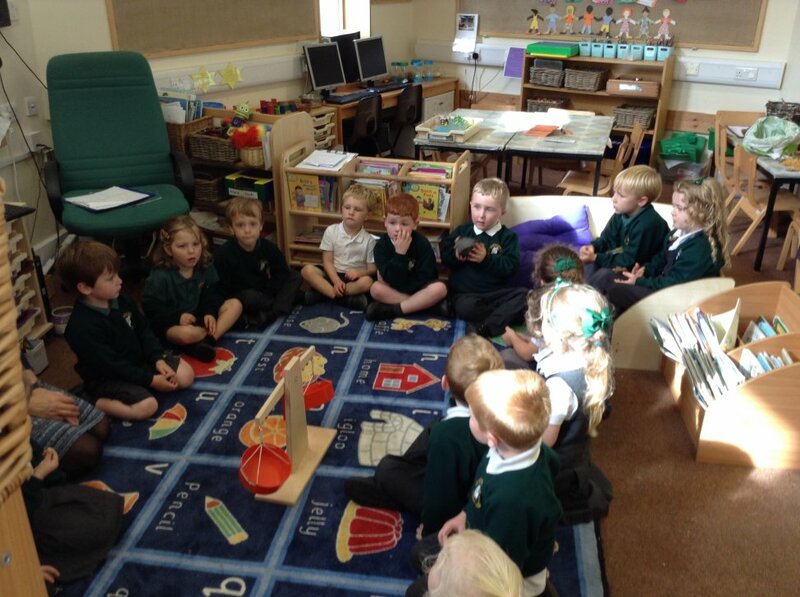 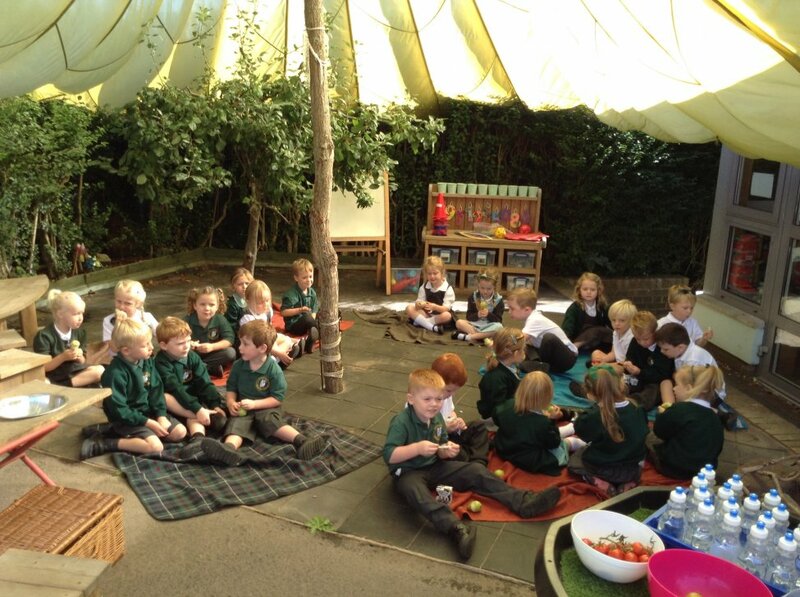 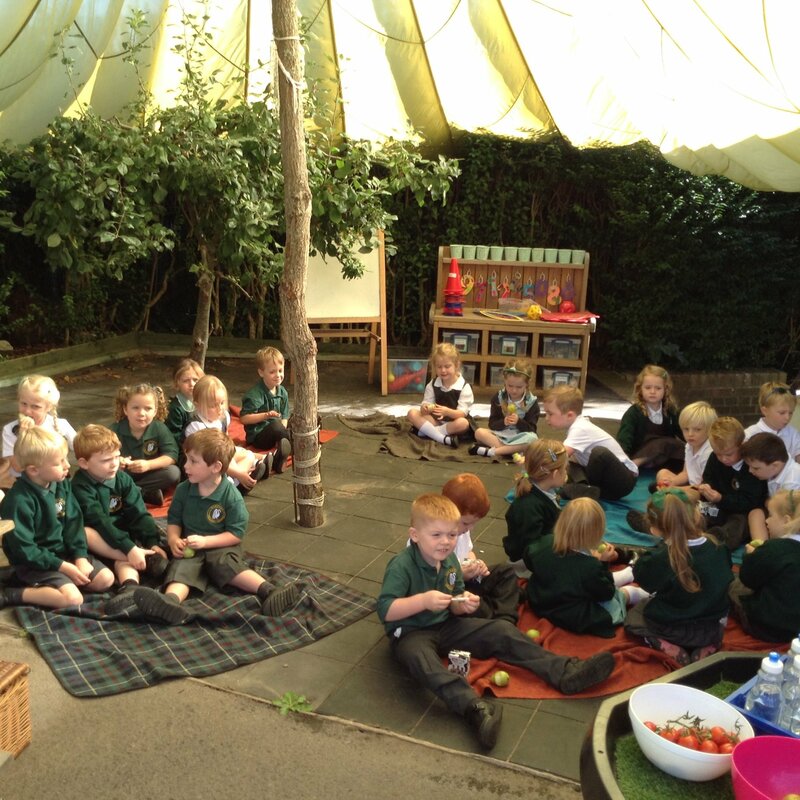 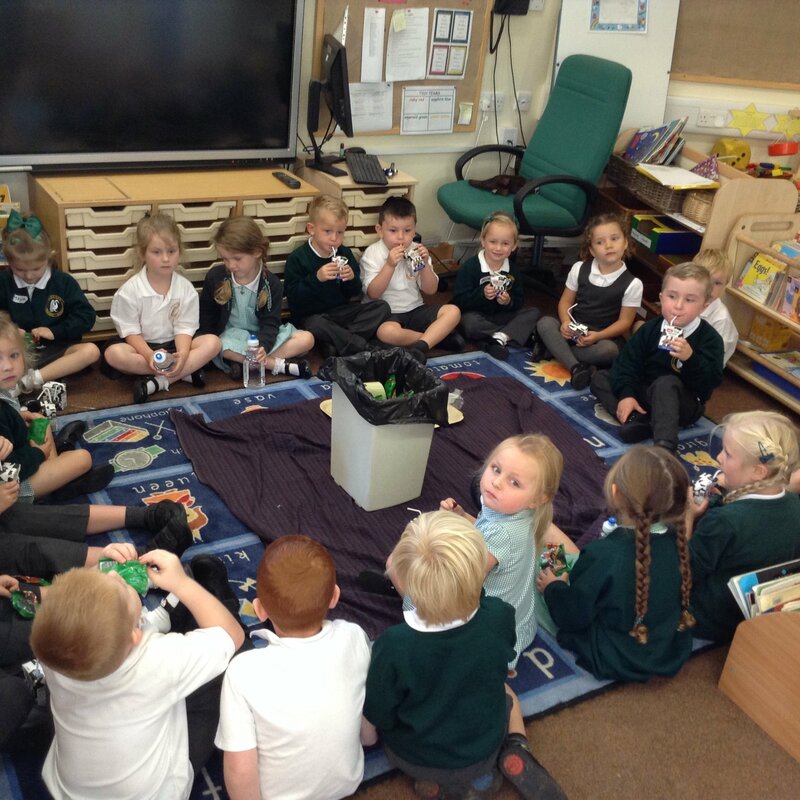 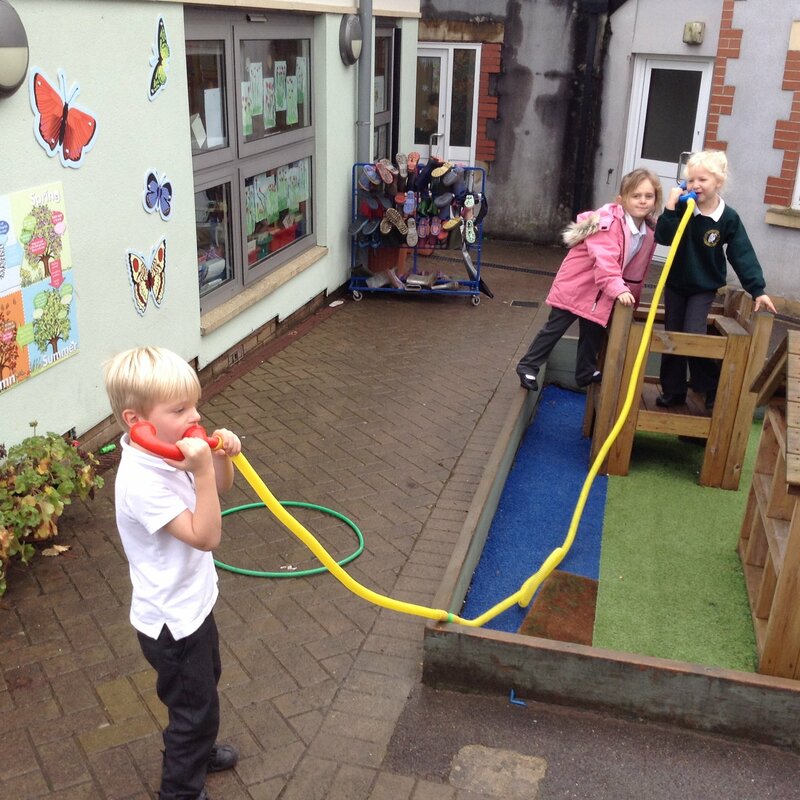 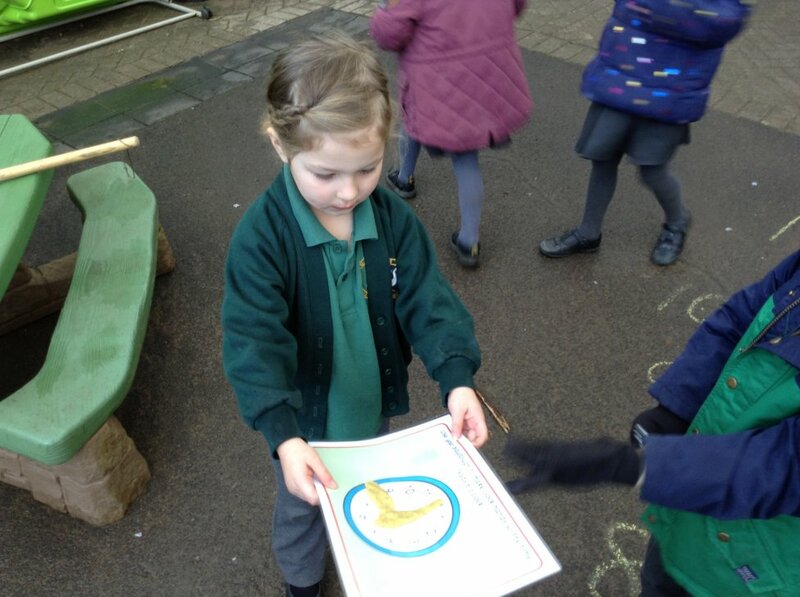 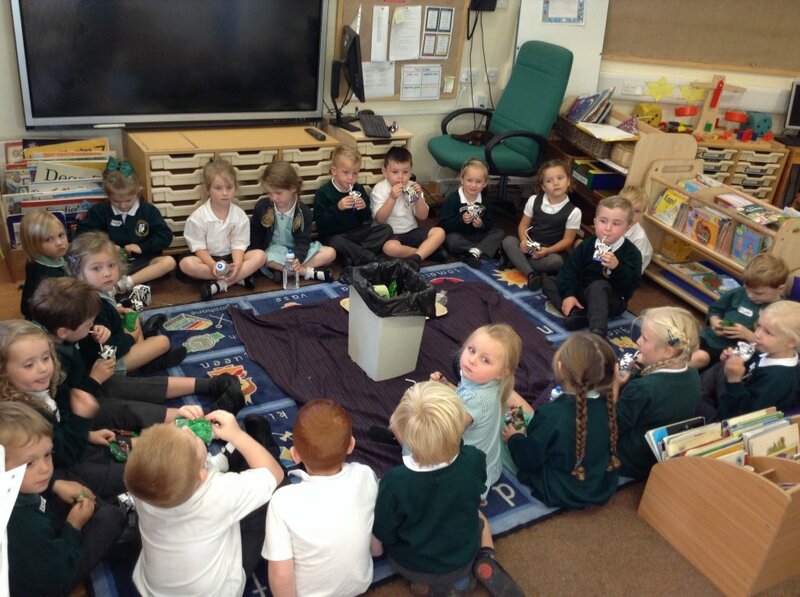 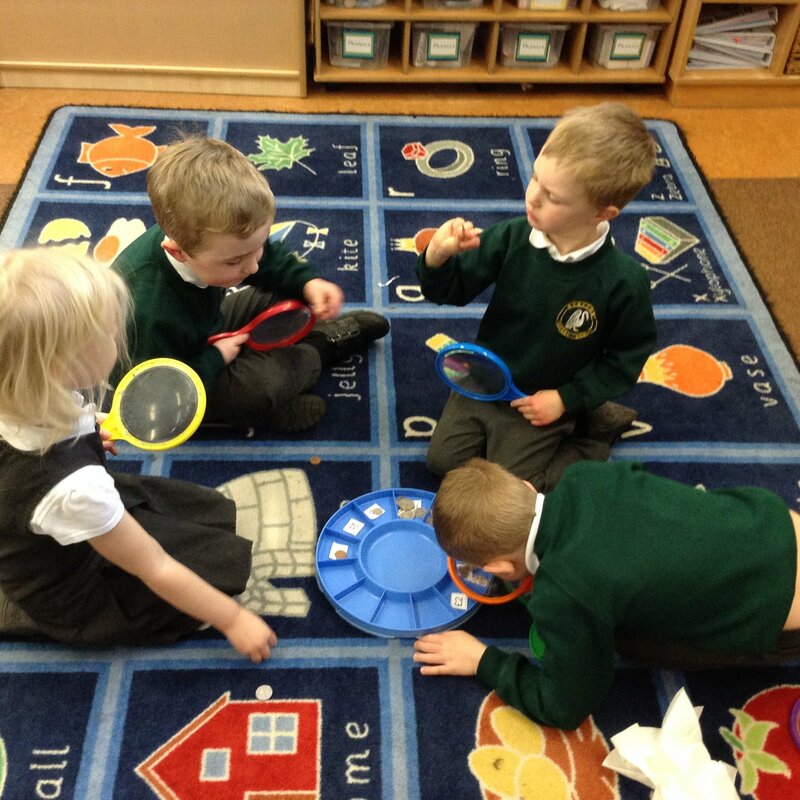 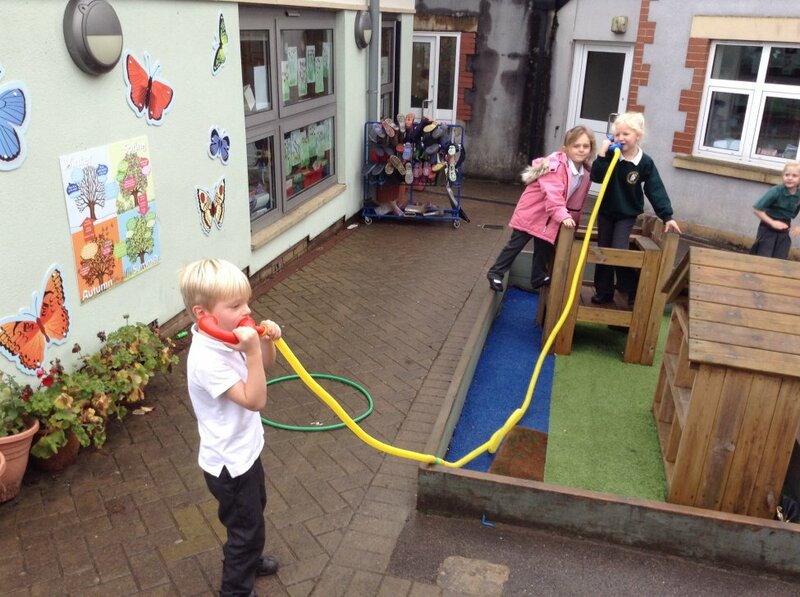 They have all got into the swing of having a school lunch and finding out what's in the Playpod at playtime. 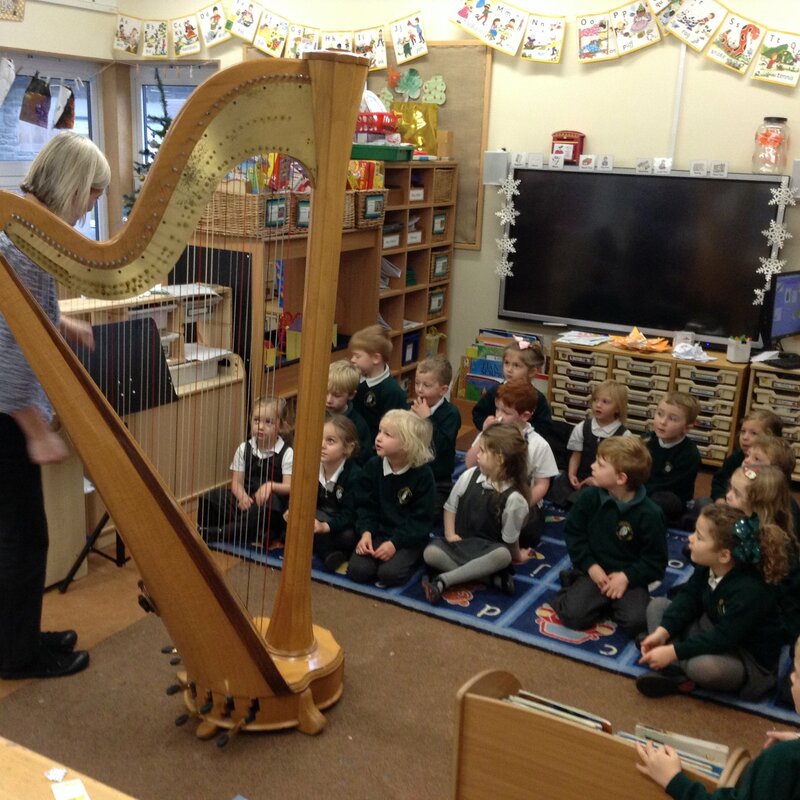 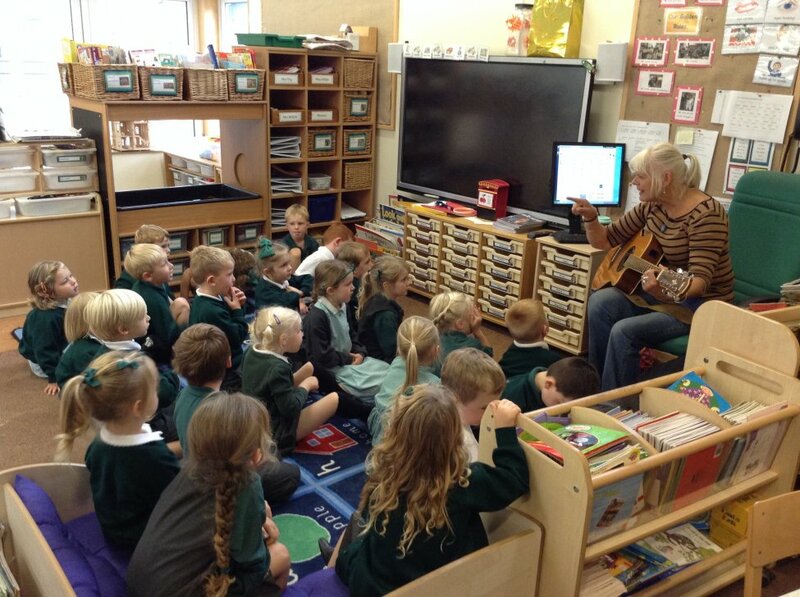 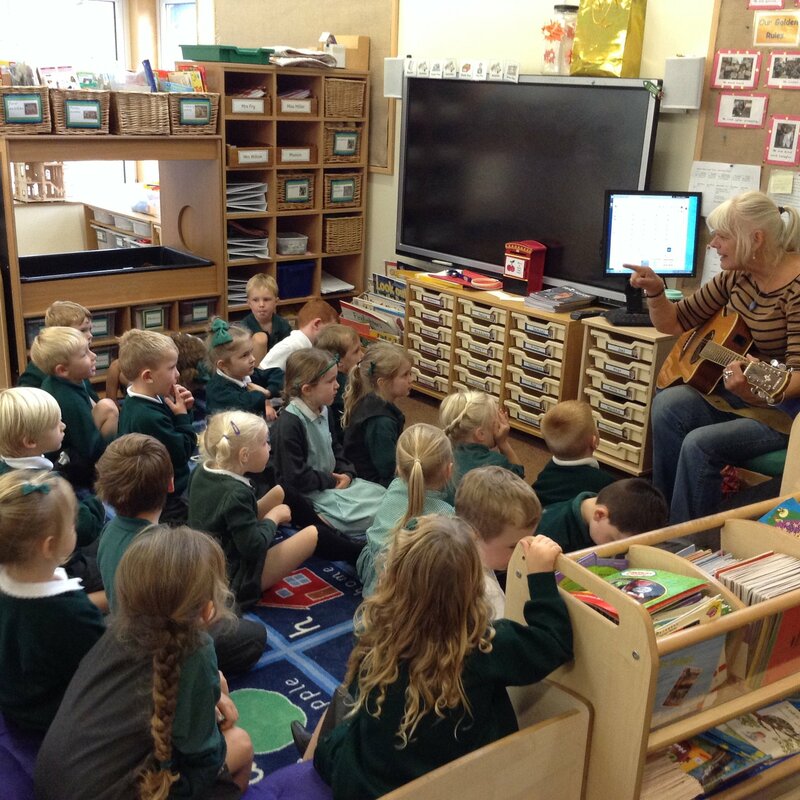 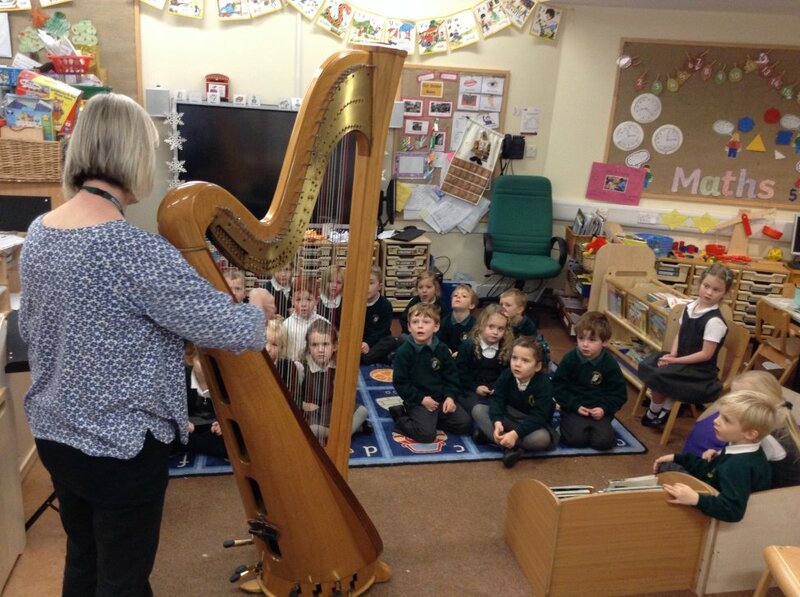 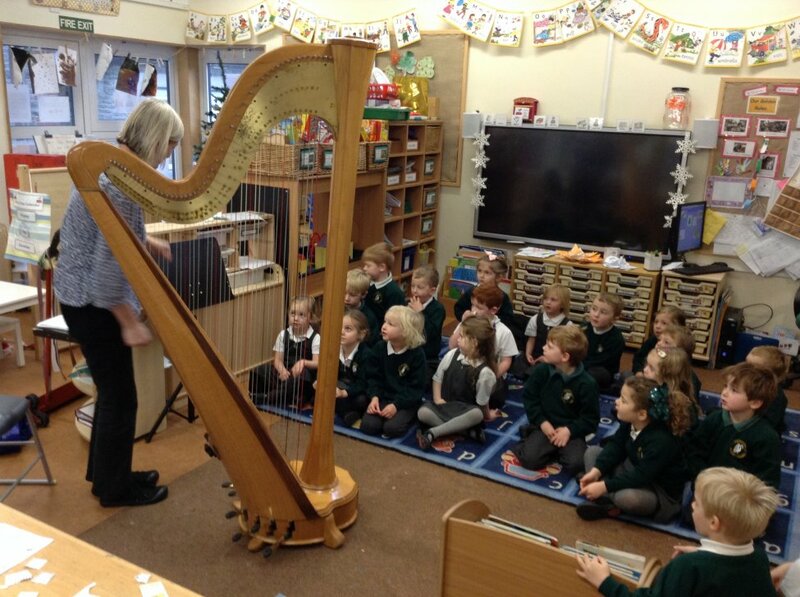 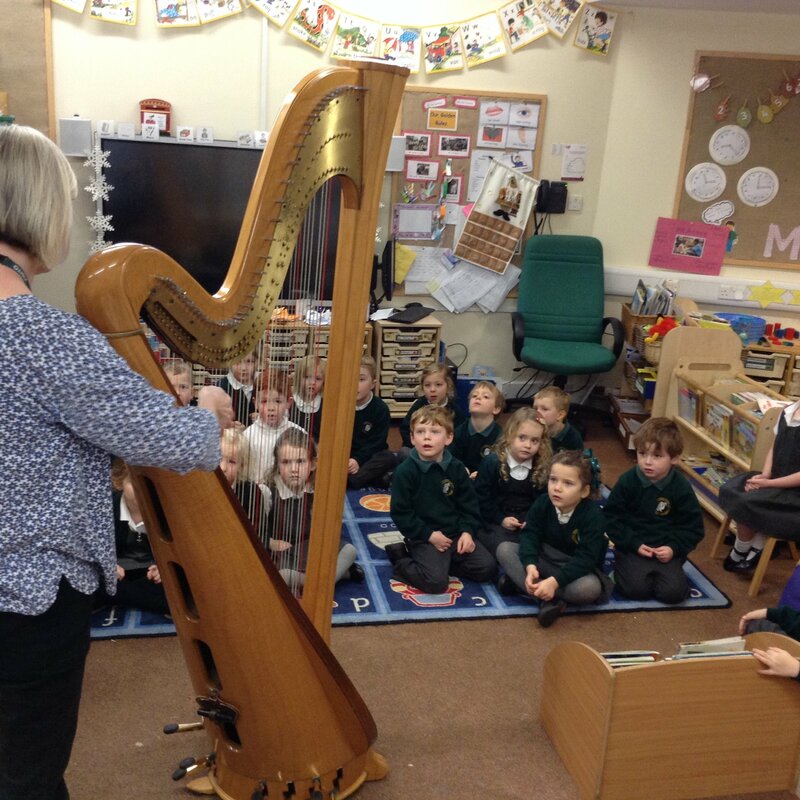 We have had a musical week this week: we had our first visit from Melanie and her guitar, a lovely singsong with Mrs Morris, and also had a go at playing the instruments in our class music box. 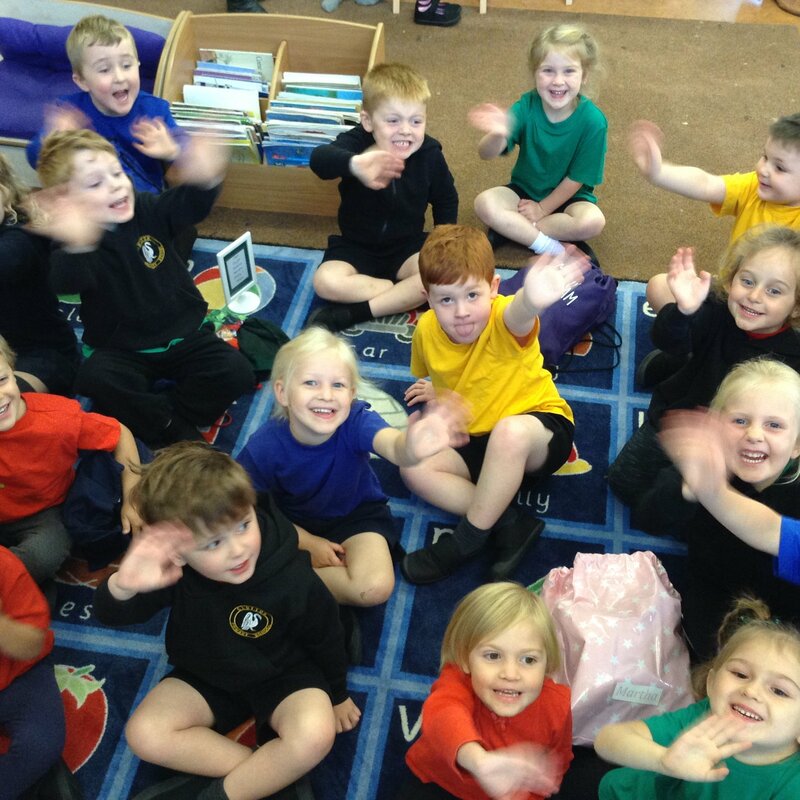 We have started to share our 'All About Me' t-shirts with the class and it has been lovely finding out about each other. 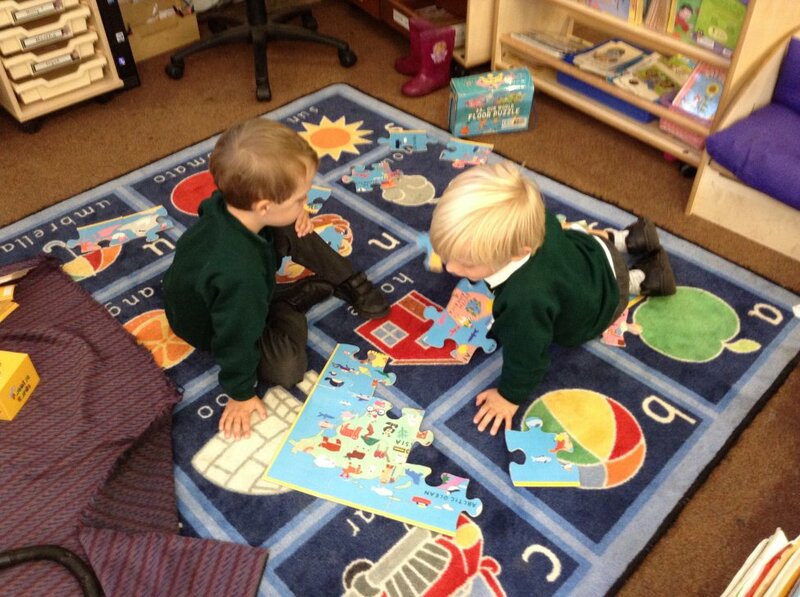 All the Cherries have a special place on the alphabet rug whenever we have 'Carpet Time'. 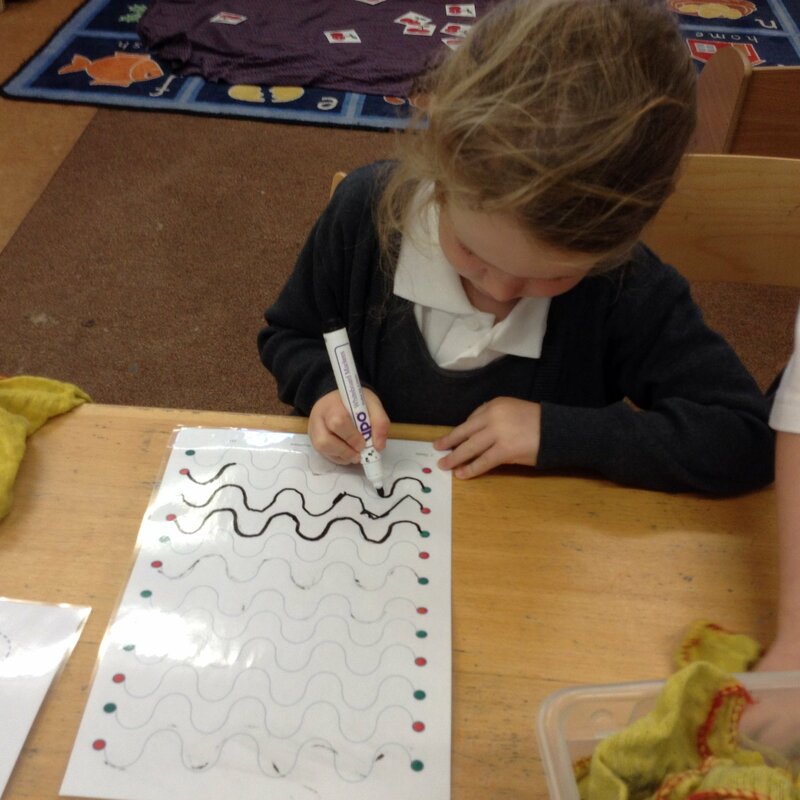 Ask your Cherry who they sit next to on the carpet and which letter they sit on! 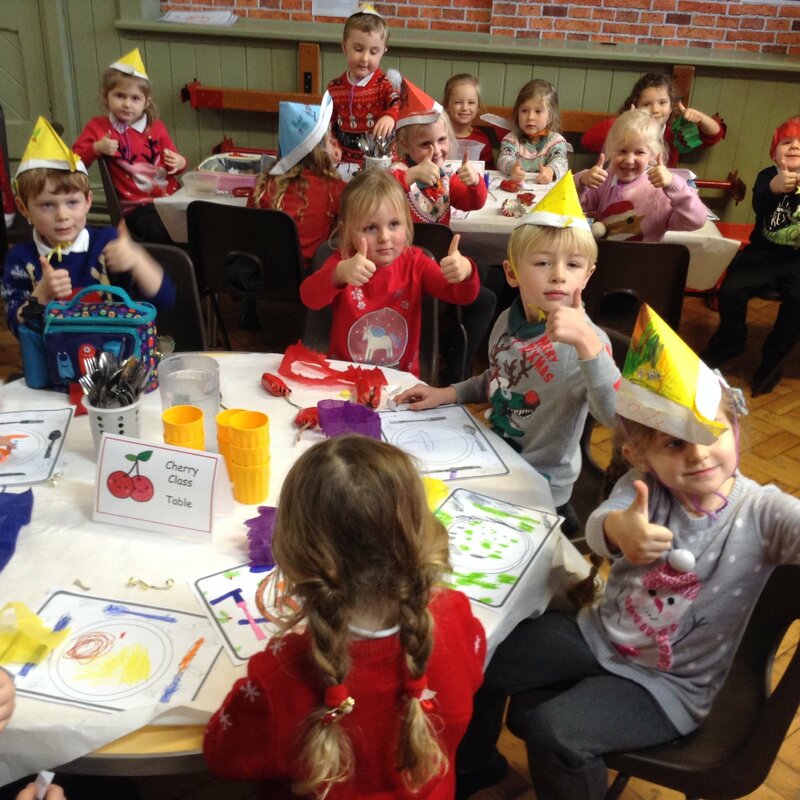 Welcome to Cherry Class! 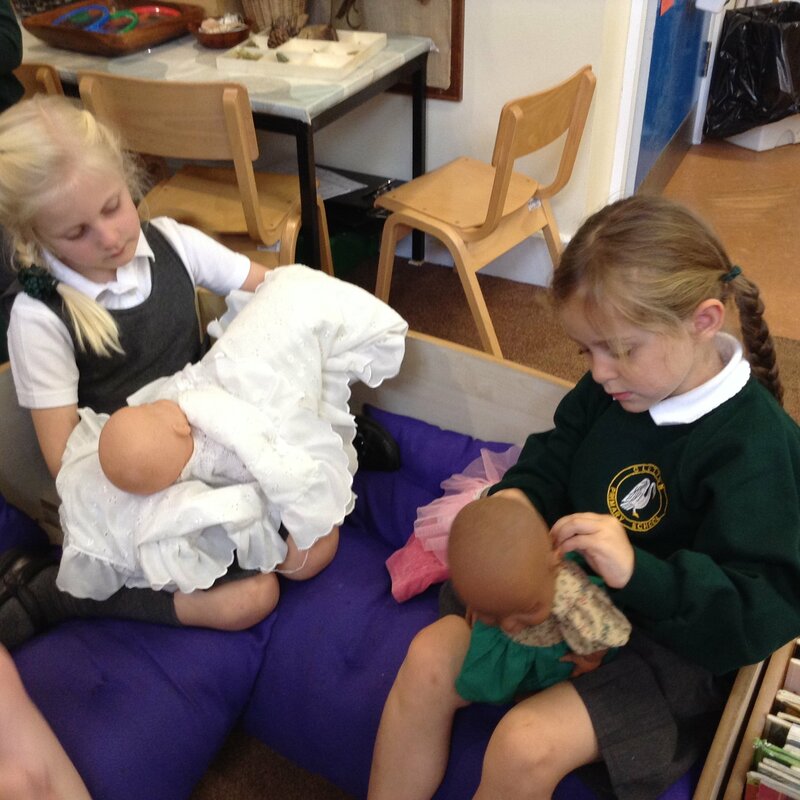 It has been lovely getting to know your children this week and to see how well they have settled in just three mornings! 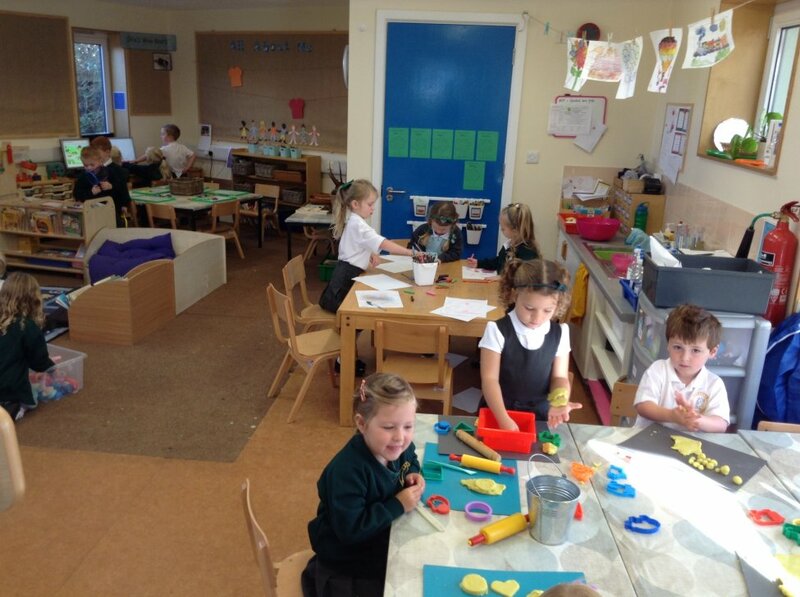 We have already had a tour of the school, been out at playtime (and learnt how to line up), met our Year 6 buddies and have enjoyed making new friends and exploring the classroom inside and out.